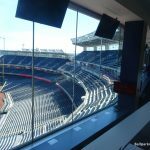 Written in 2018, ratings updated yearly when necessary. 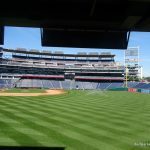 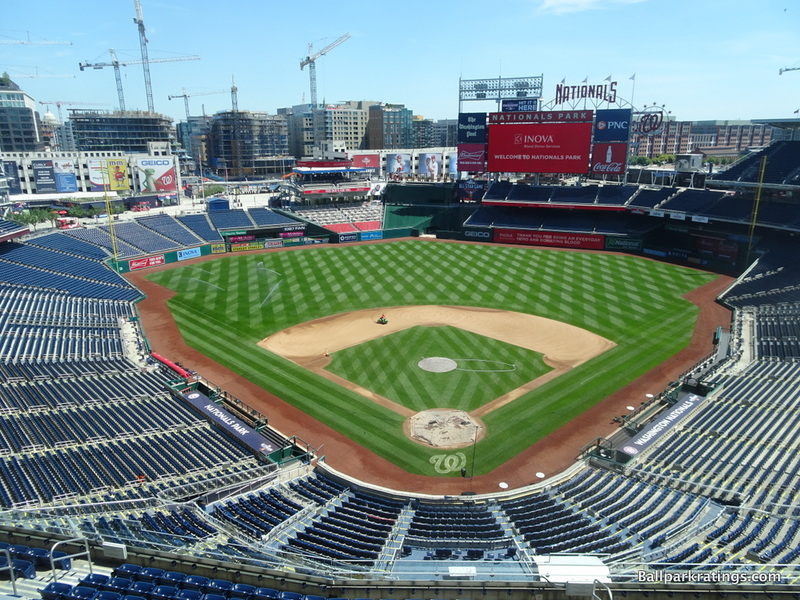 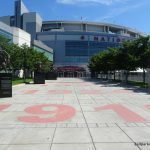 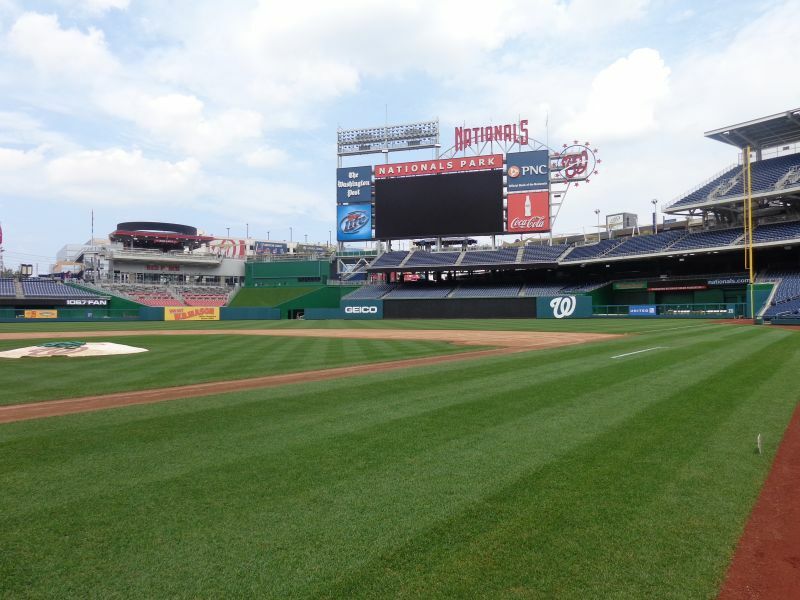 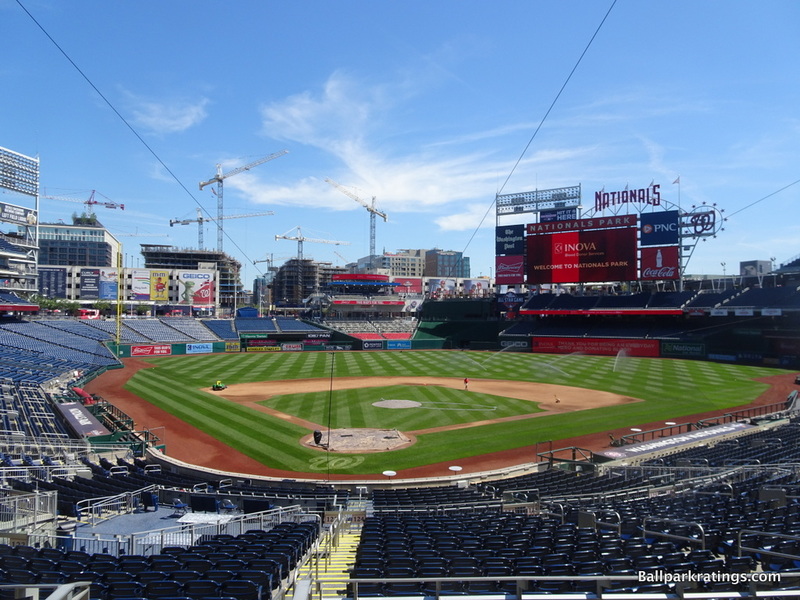 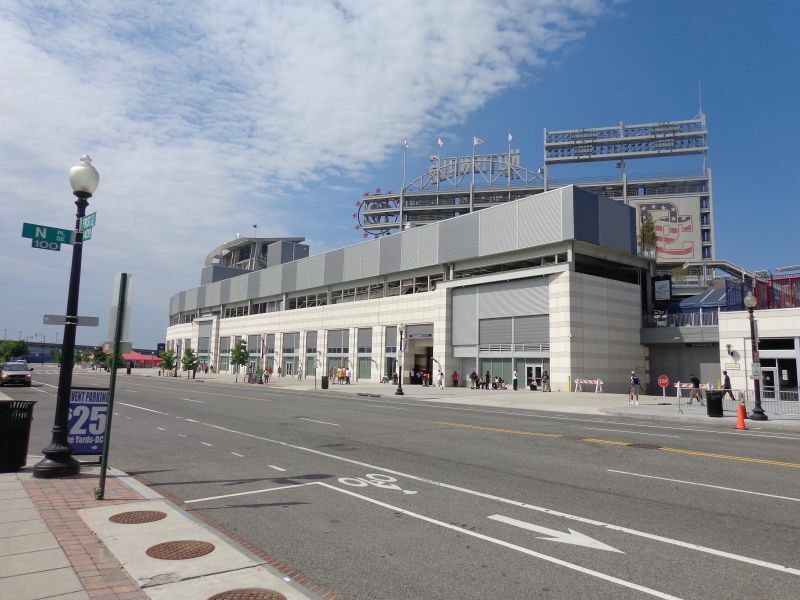 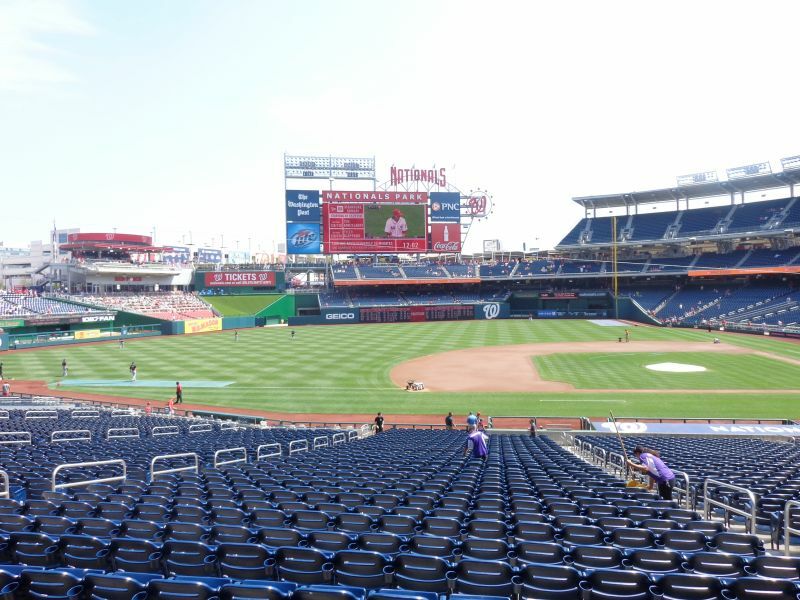 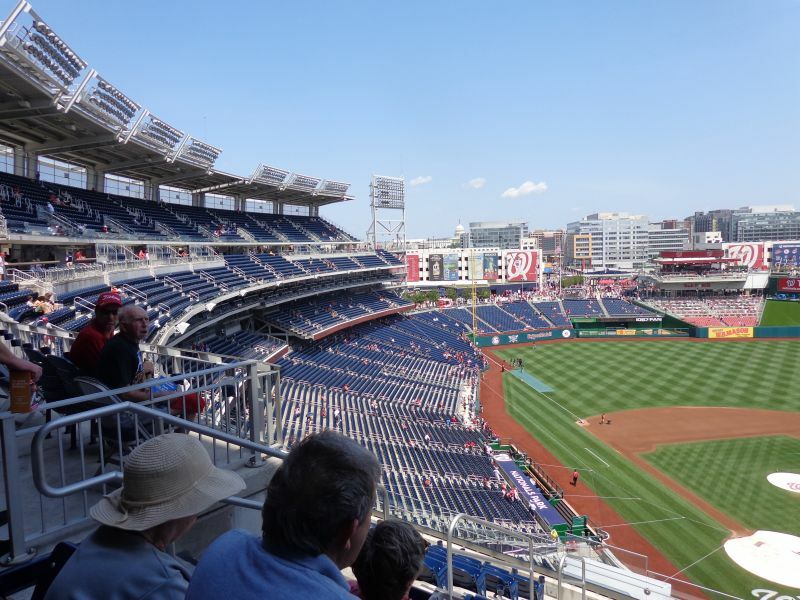 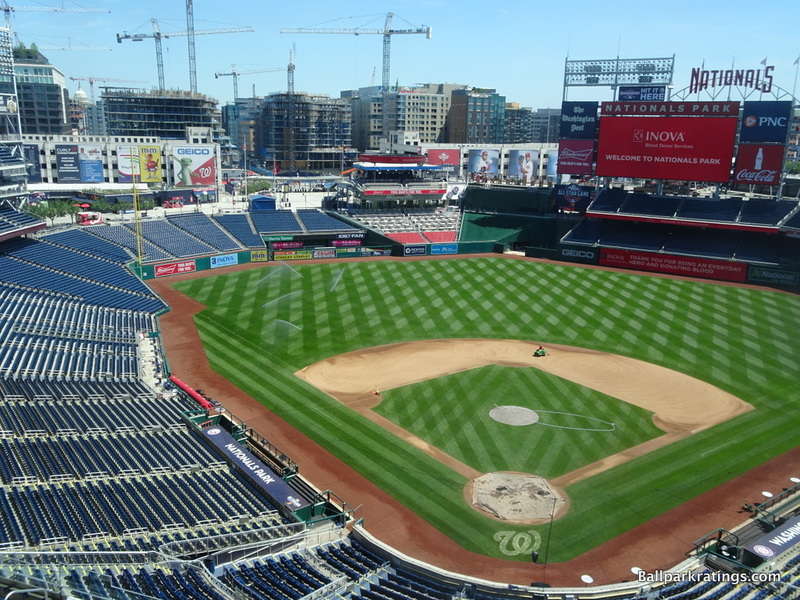 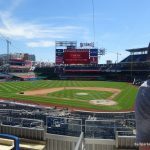 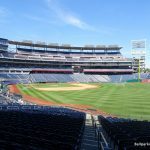 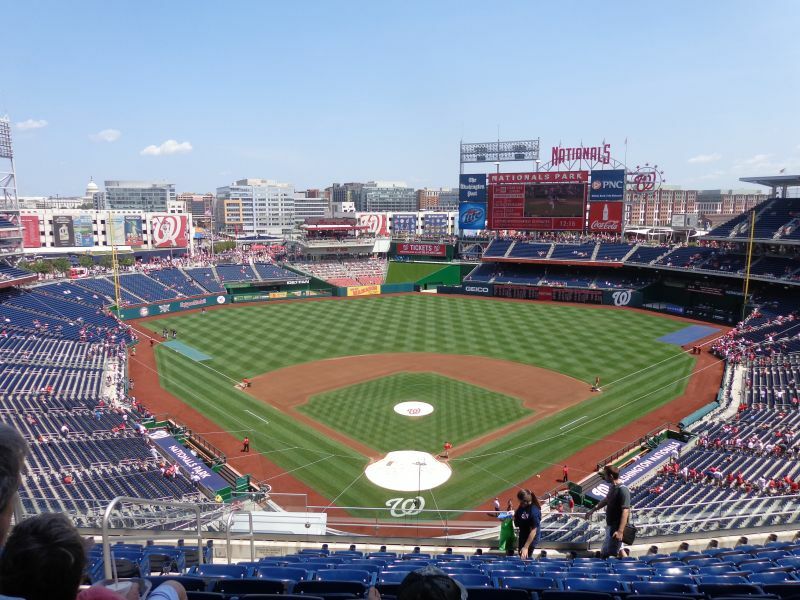 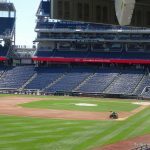 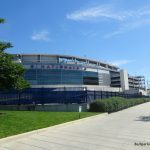 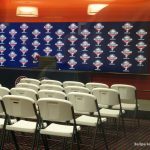 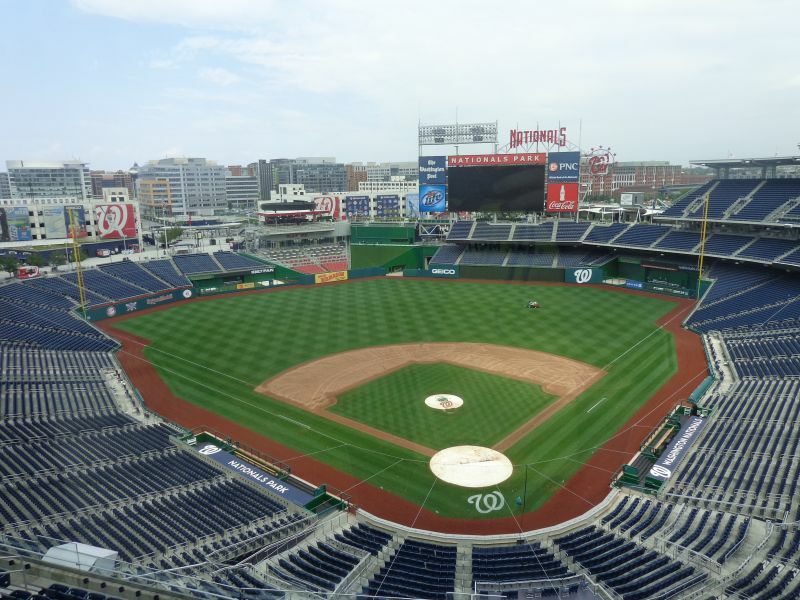 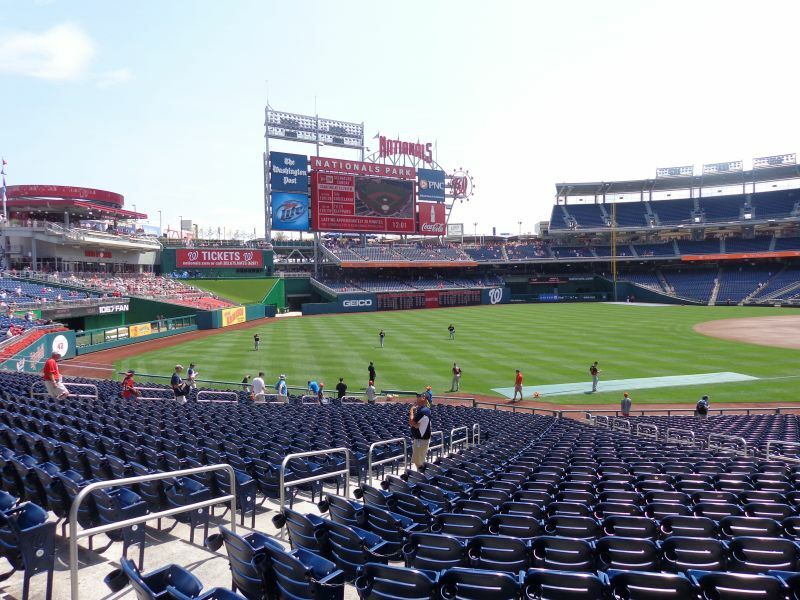 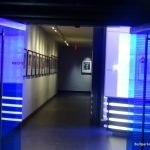 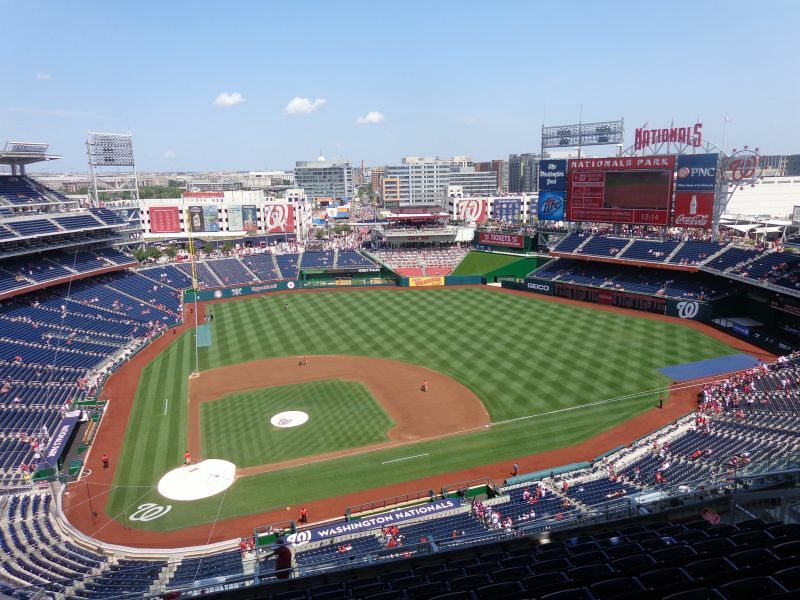 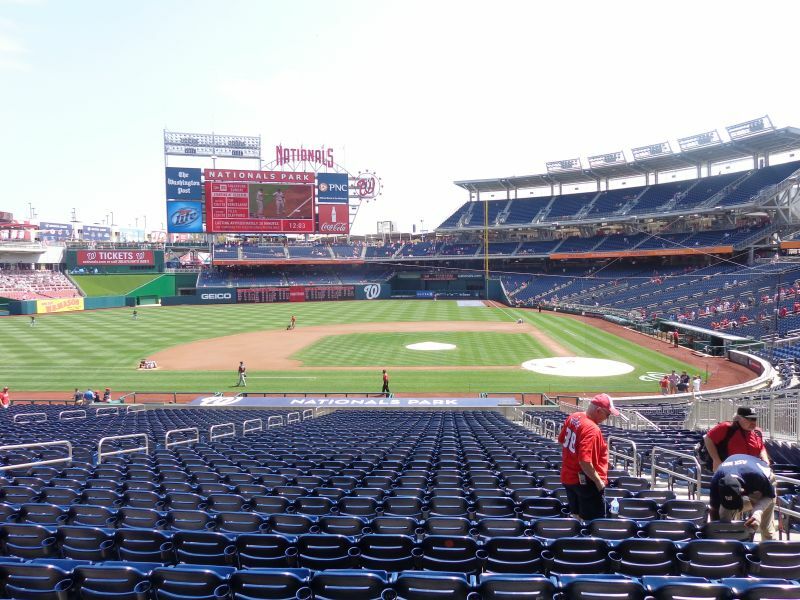 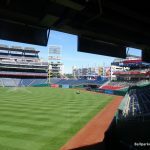 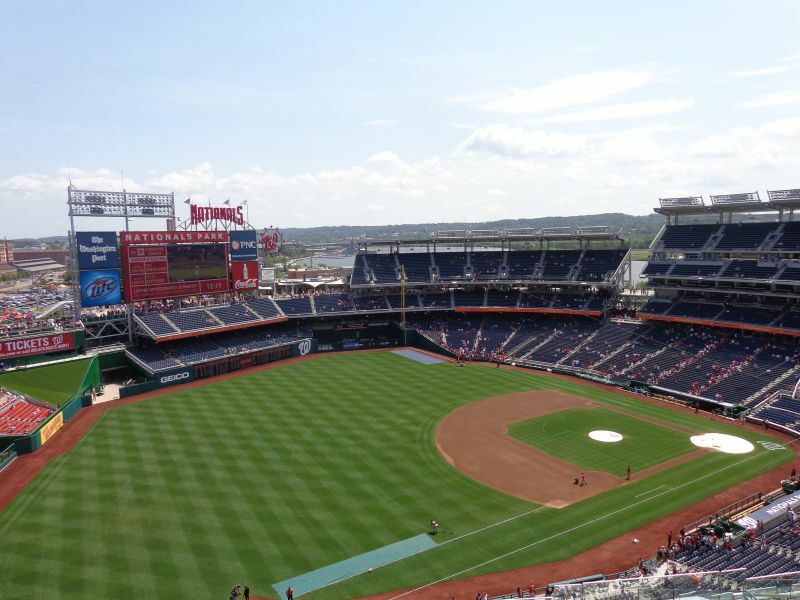 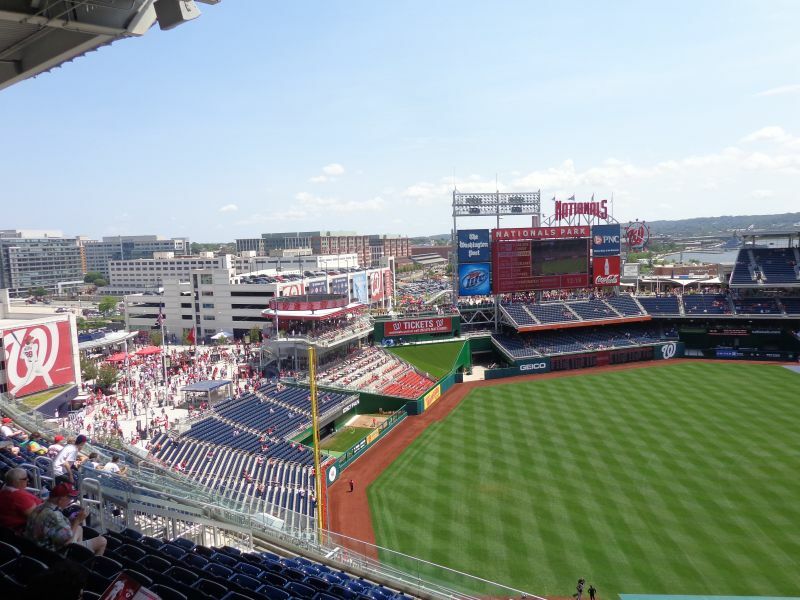 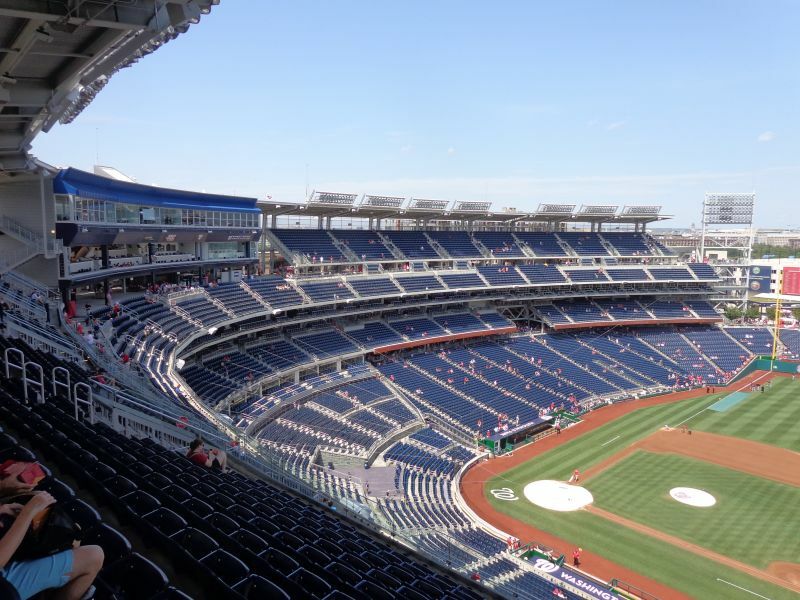 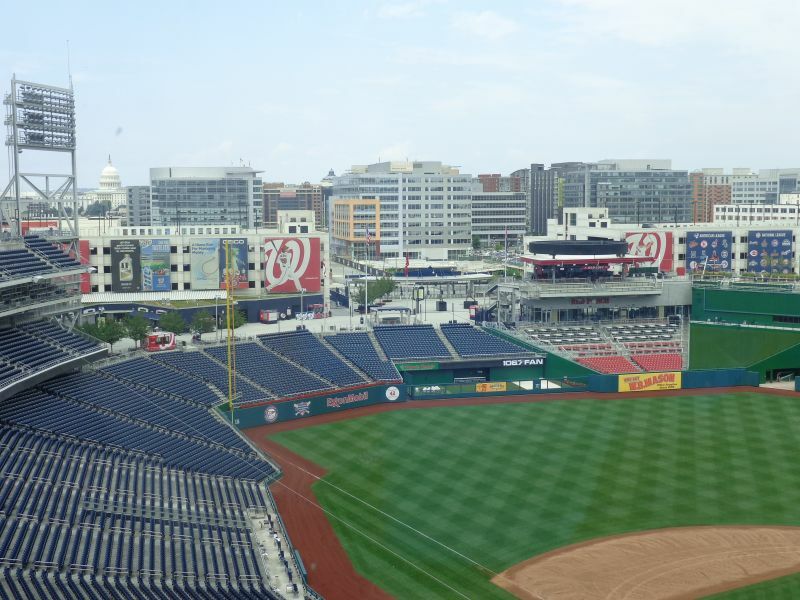 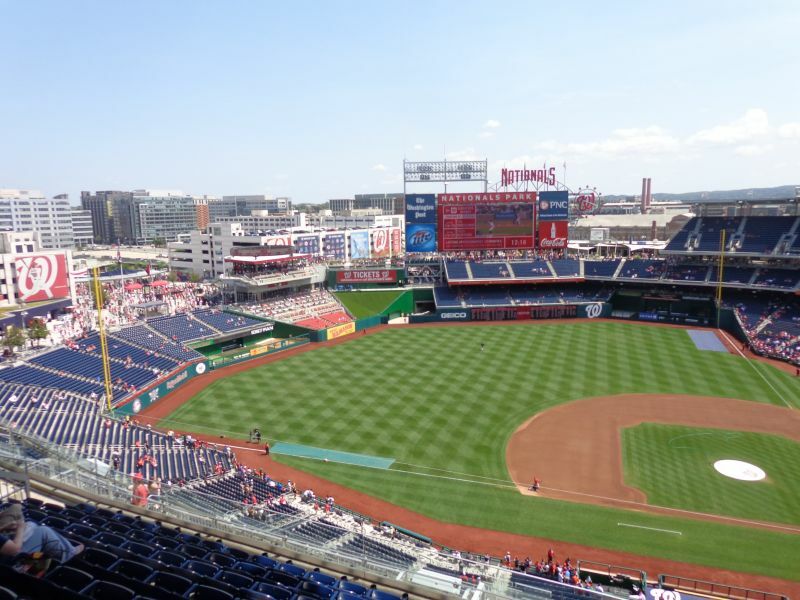 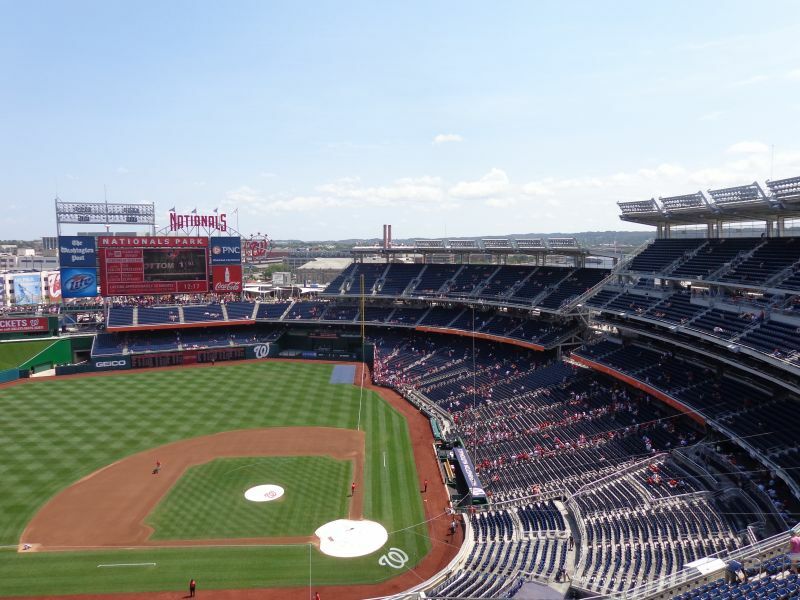 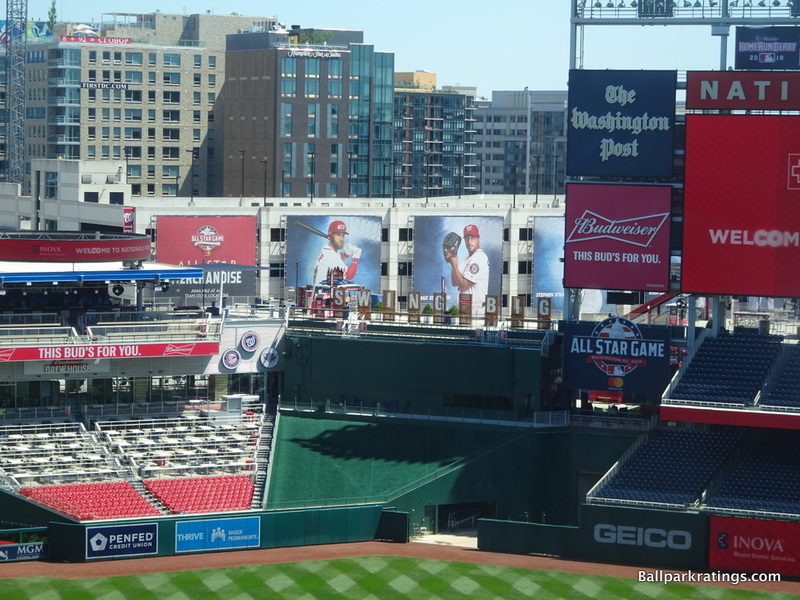 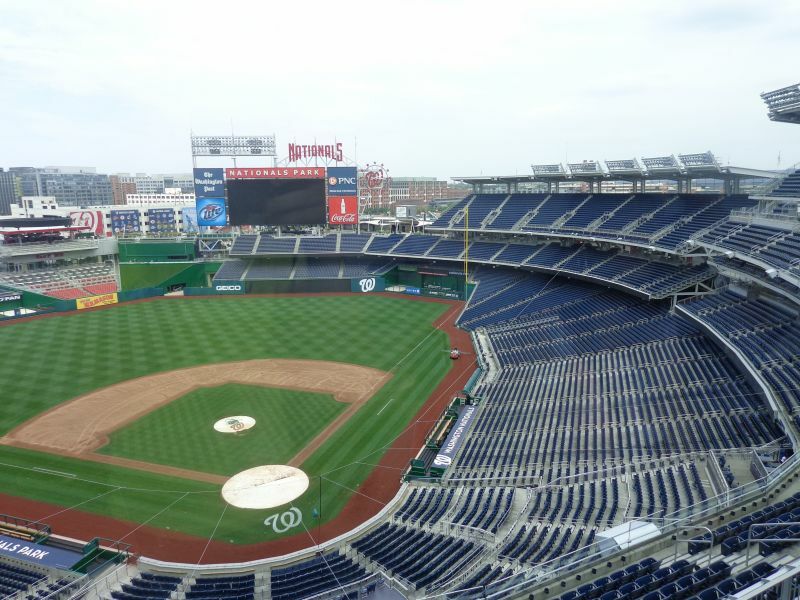 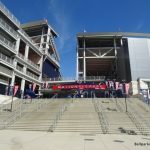 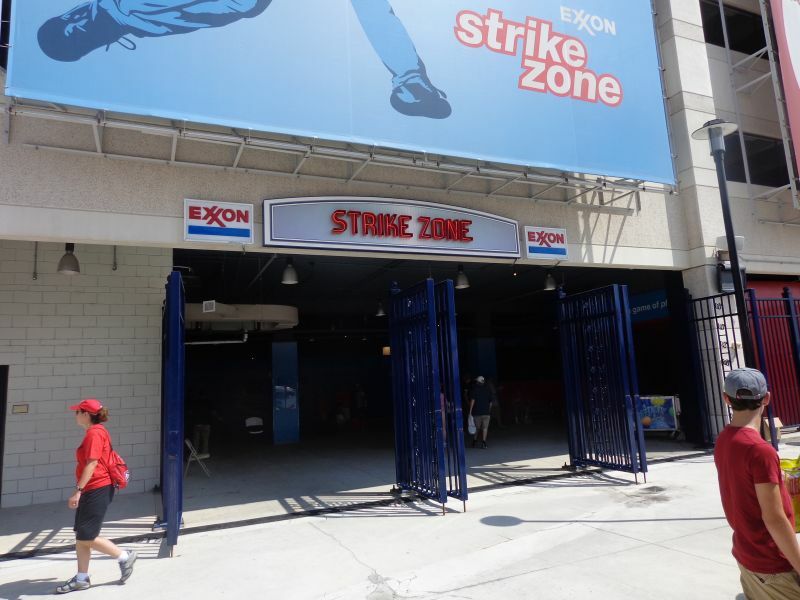 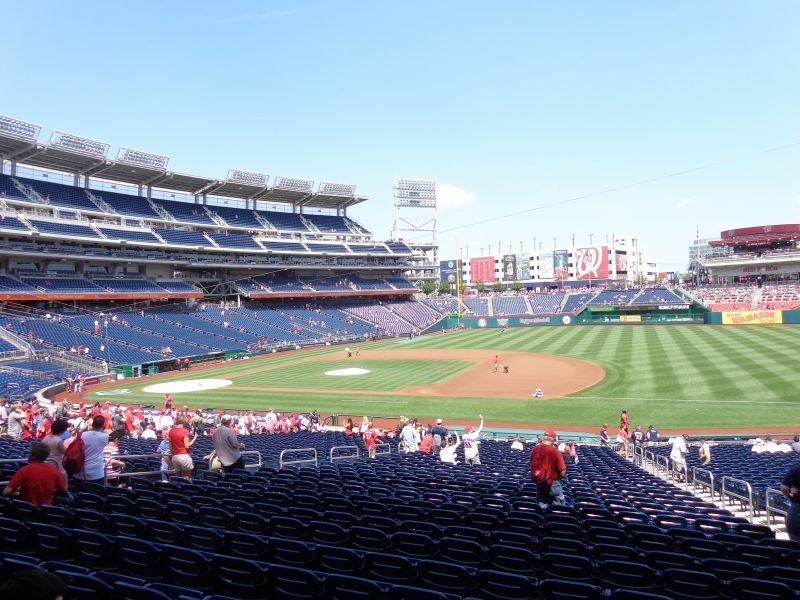 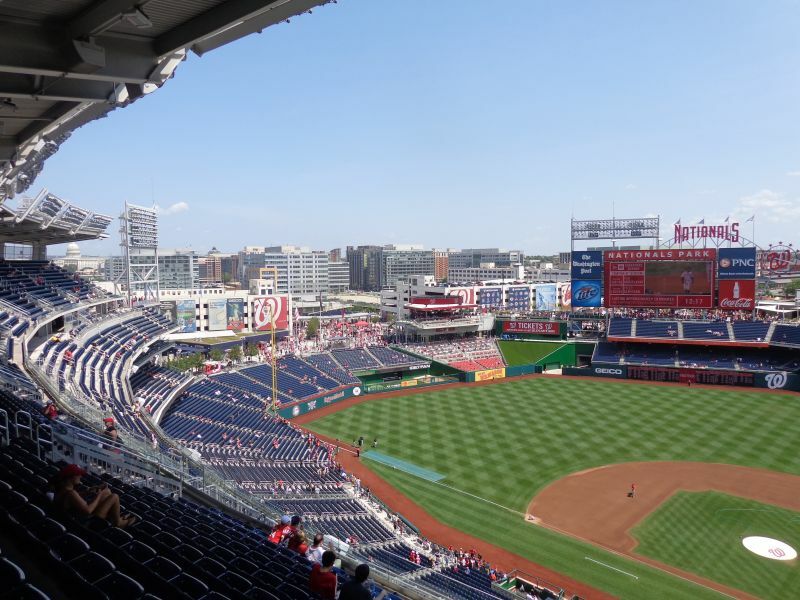 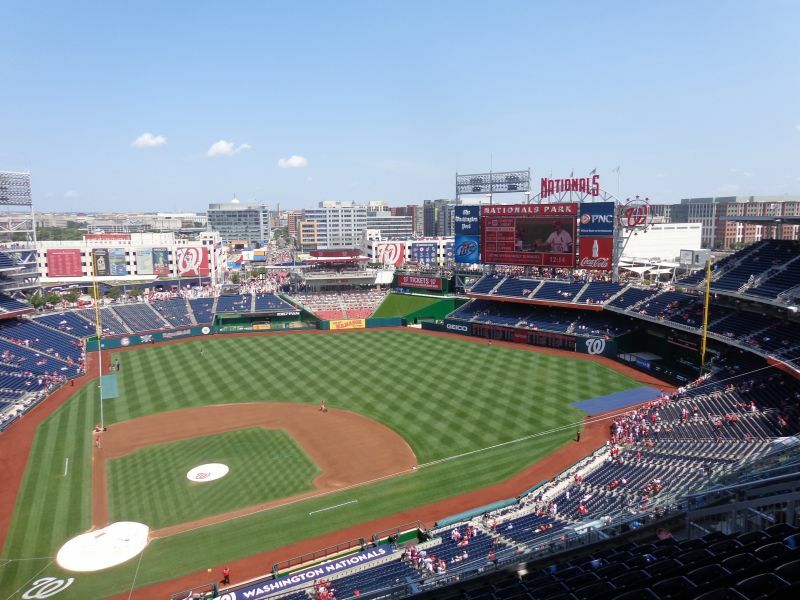 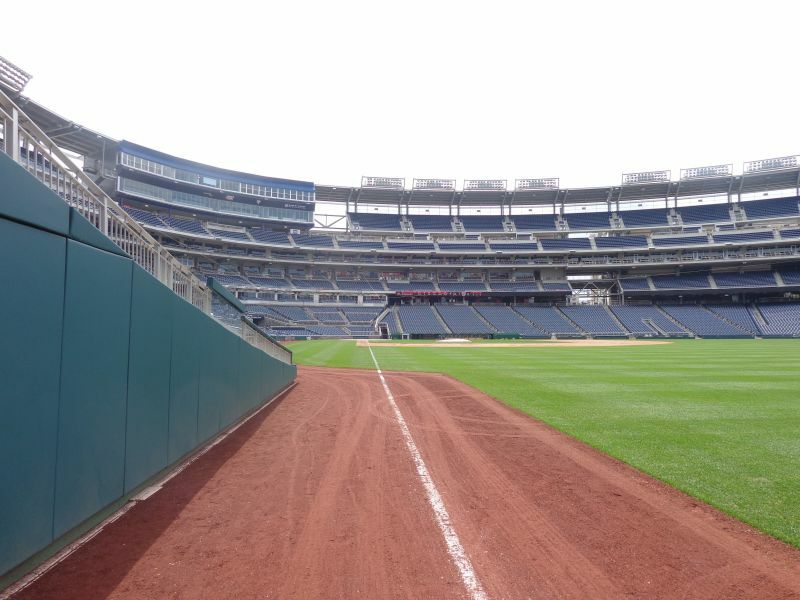 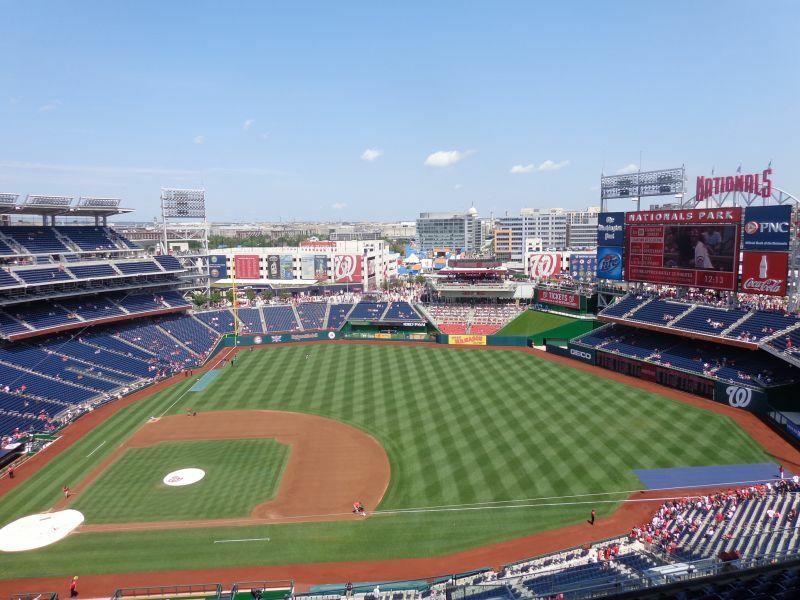 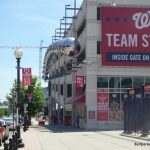 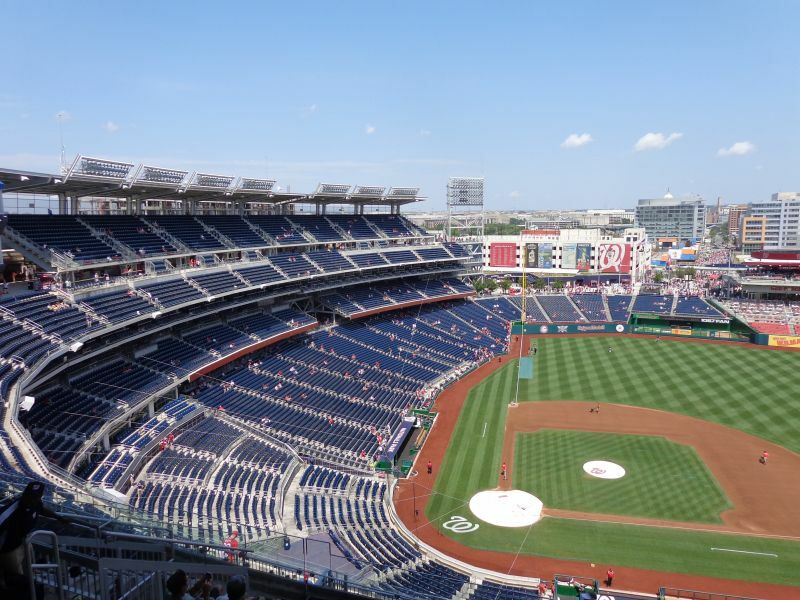 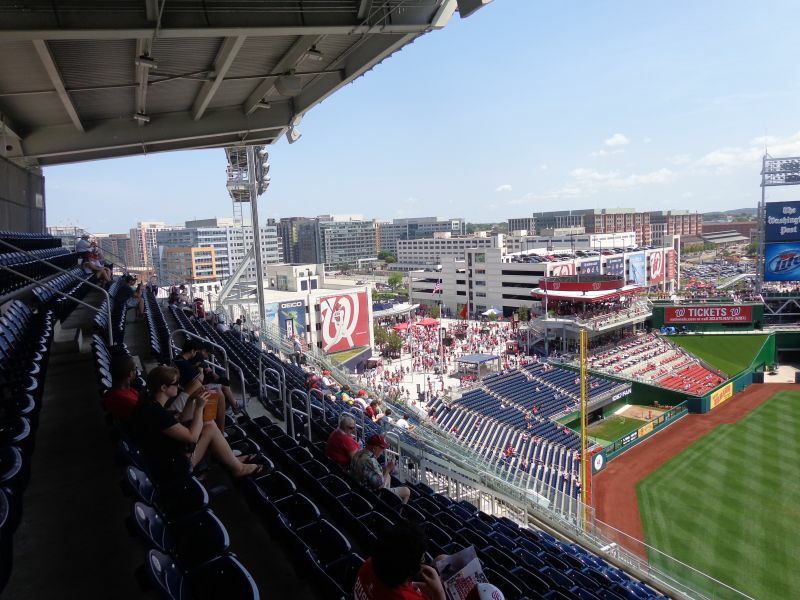 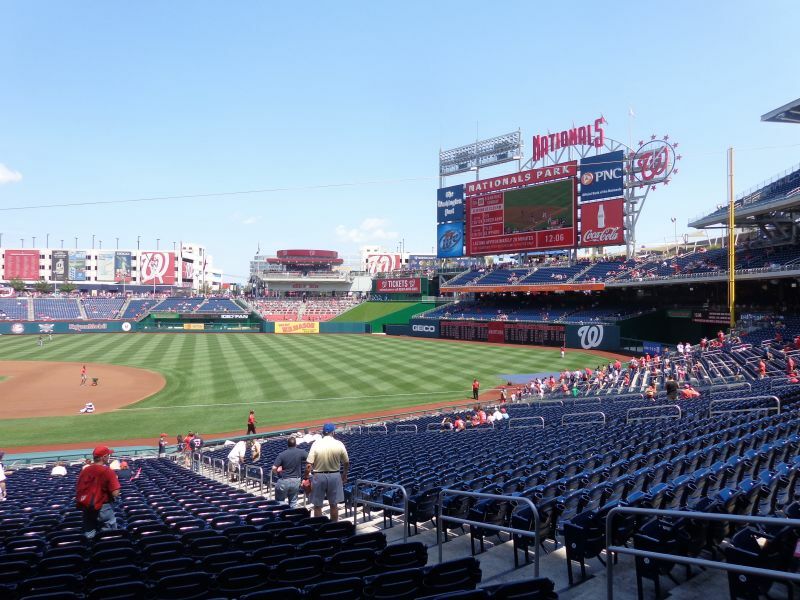 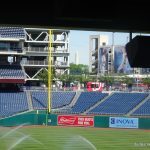 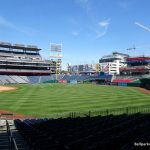 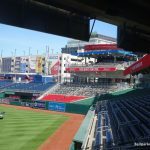 I have always felt that Nationals Park underwent an inordinate amount of scrutiny from the national press and baseball community leading up to its opening in 2008, and it has been viewed against that backdrop ever since. 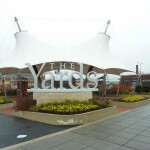 The majority of my in-depth reviews require a large amount of original research, either because some information is inaccessible online for the 90s to early 2000s parks, or people just got so cynical about the so-called “mallparks” by 2017 that there just wasn’t anyone writing about them in the first place (see, Atlanta’s SunTrust Park). 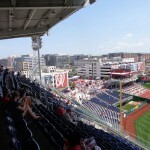 But a simple Google search will render so much material on Nationals Park. 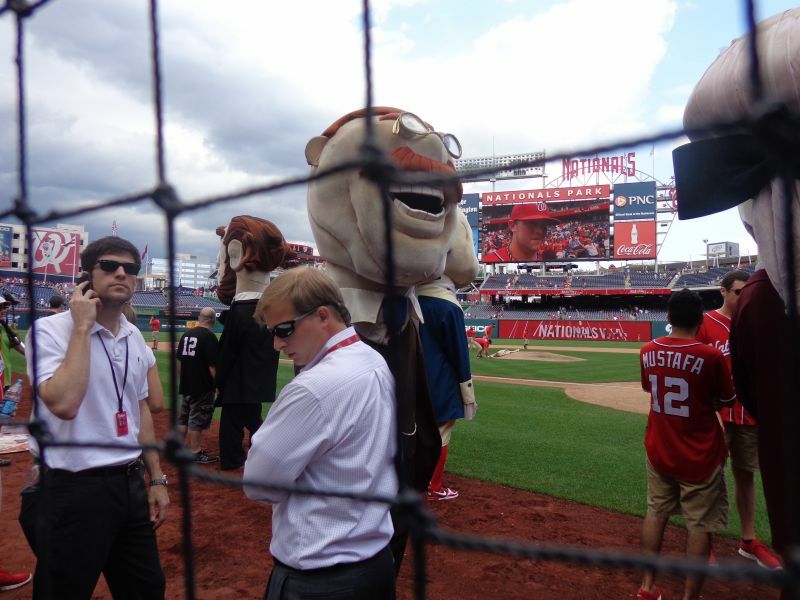 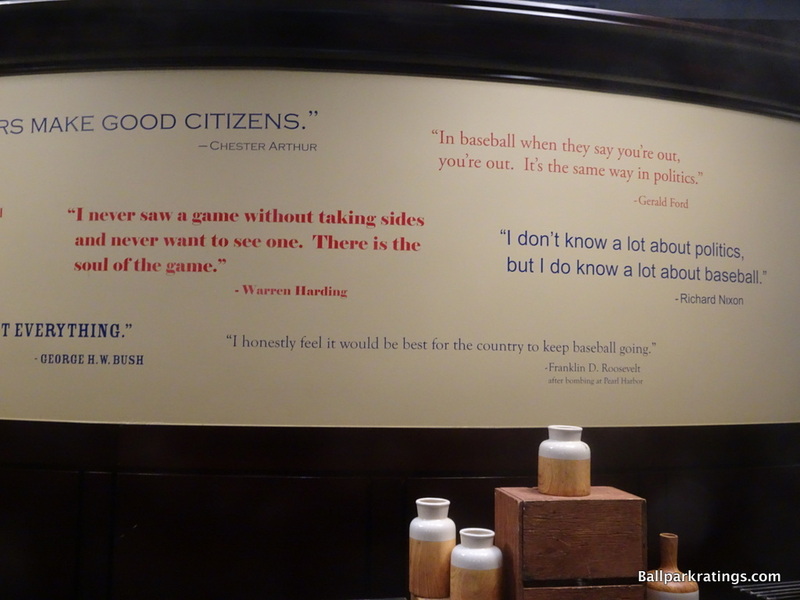 In the mid-2000s, everybody had an opinion on Washington D.C.’s new baseball experiment. 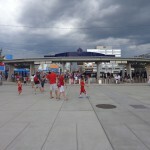 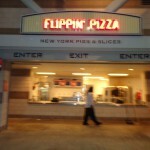 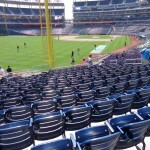 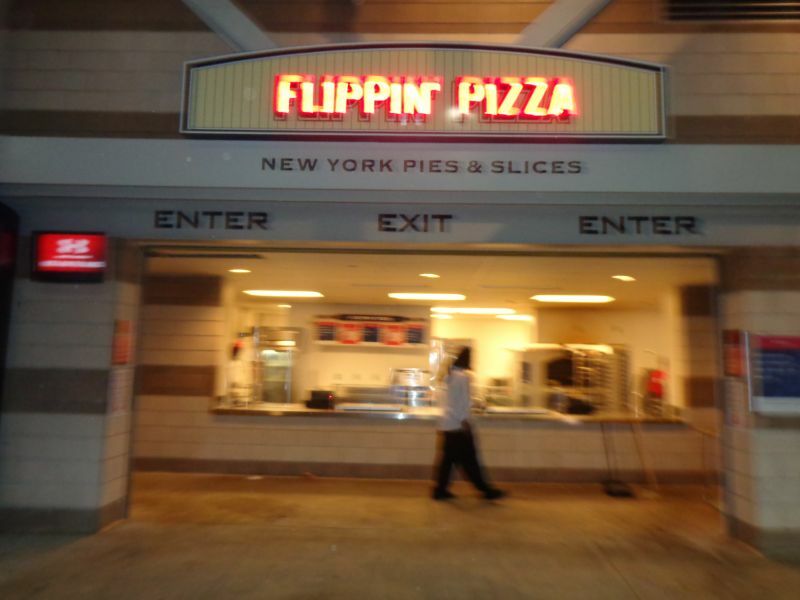 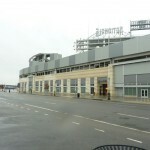 The same went for New York’s Yankee Stadium and Citi Field, both of which opened a year later in 2009. 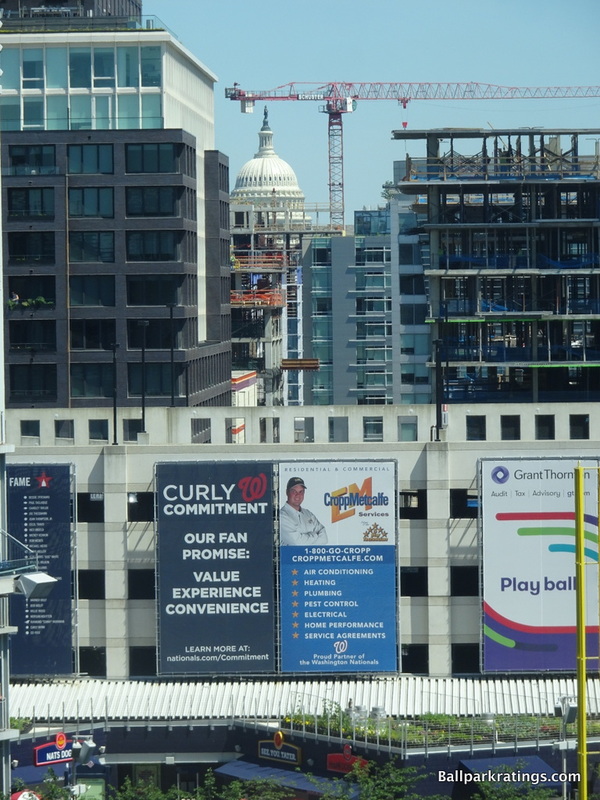 It took a confluence of other factors, but the first reason for this is rather obvious. 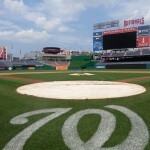 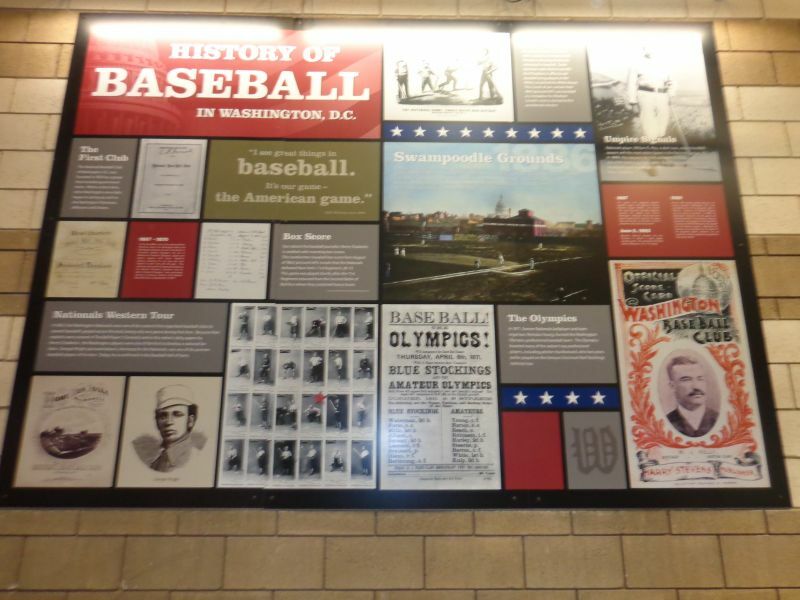 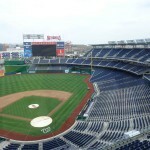 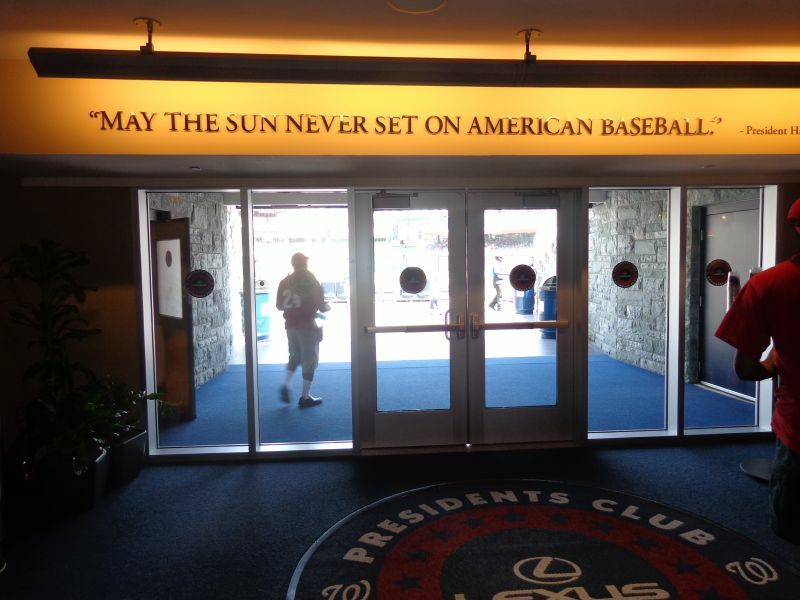 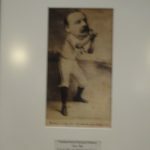 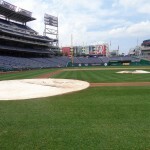 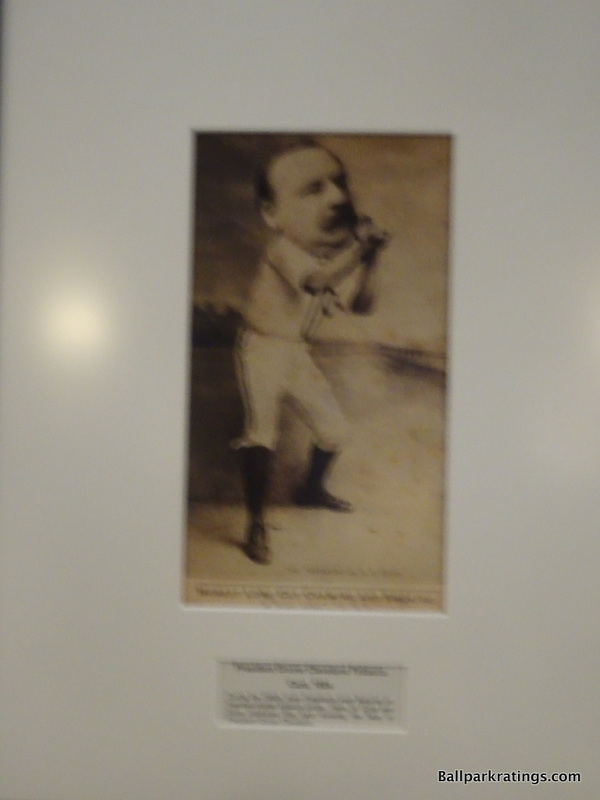 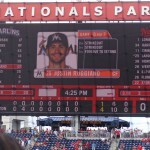 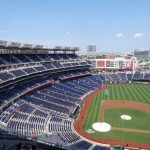 Not only were the Nationals playing in a large market, but baseball returning to the nation’s capital was a big story. 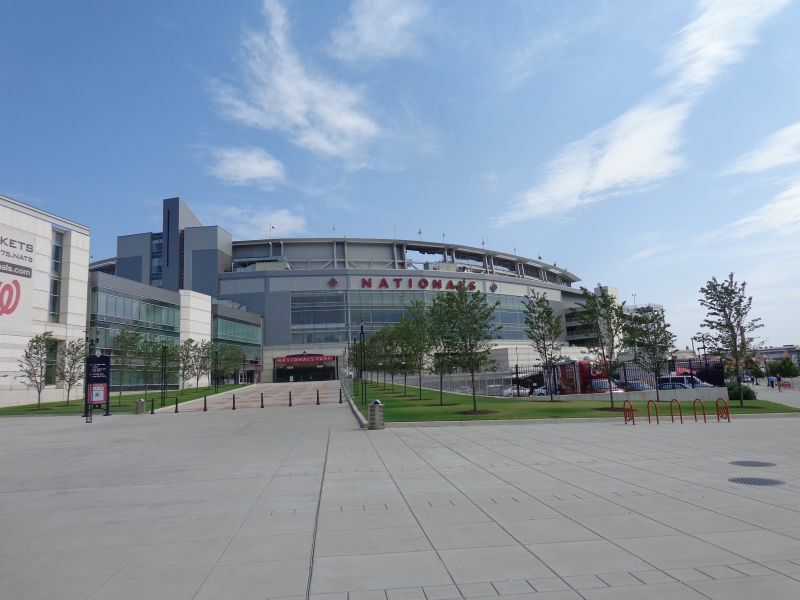 The Nats were an exciting team in their first year, and the common refrain was that they better deliver a ballpark worthy of America’s capital. 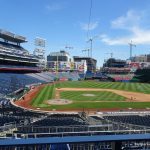 D.C. is the country’s statement to the world, and baseball is its game, so the park better reflect the capital inside and out. 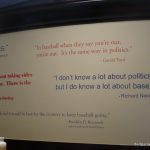 This also came during a time period when the online blogosphere really went into full-swing. 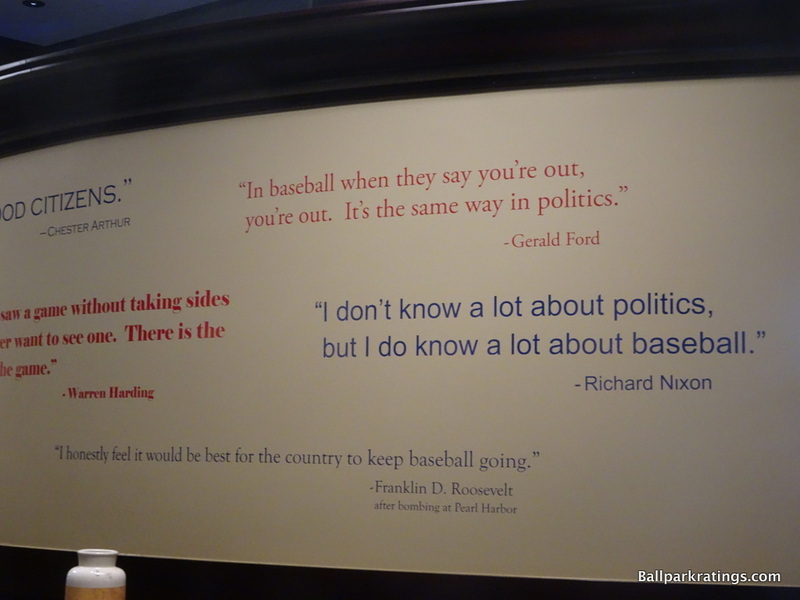 It’s easy to forget, but before ’05 or so, the internet was young enough. 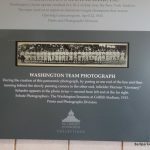 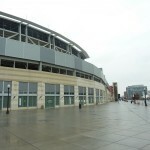 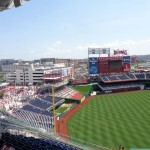 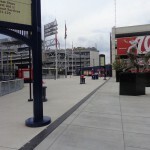 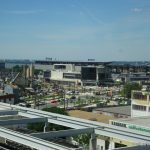 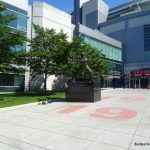 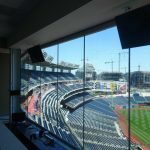 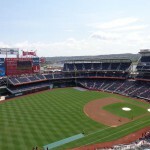 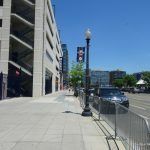 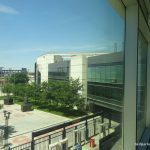 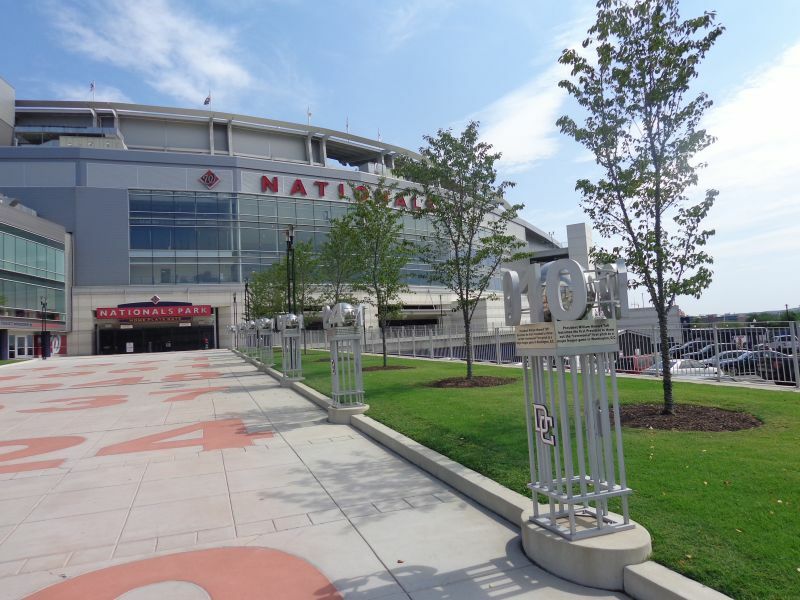 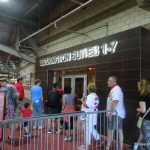 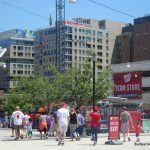 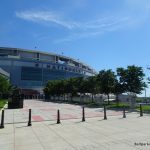 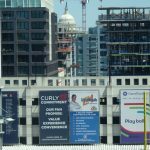 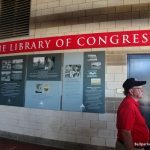 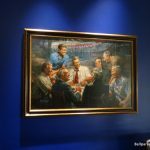 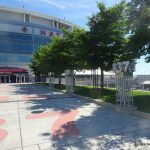 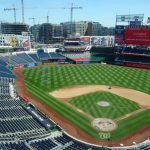 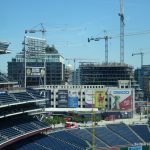 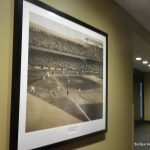 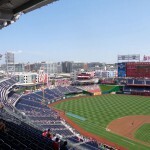 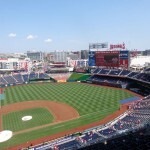 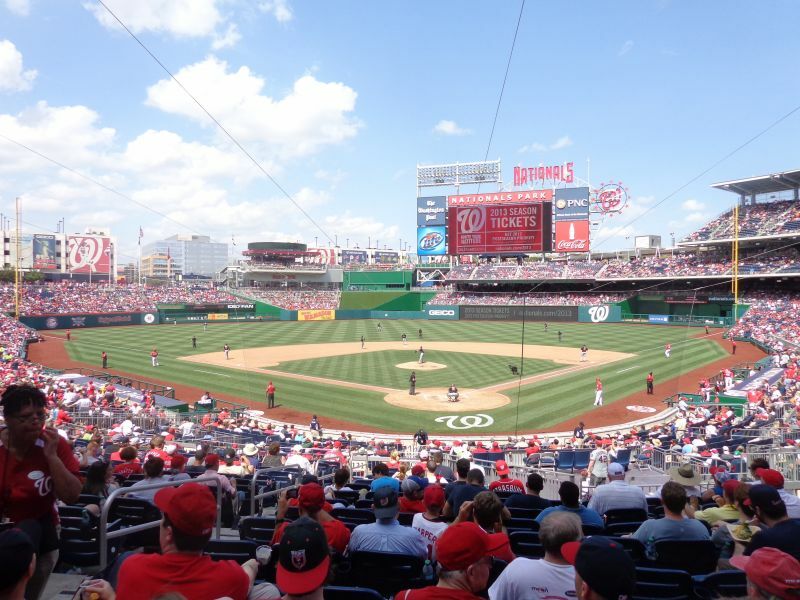 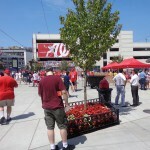 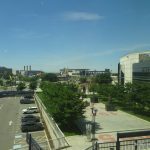 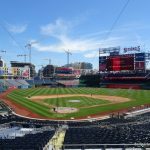 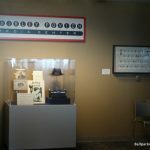 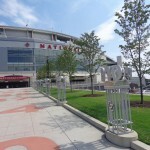 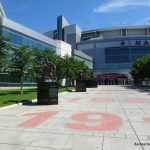 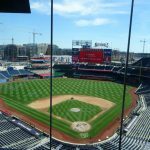 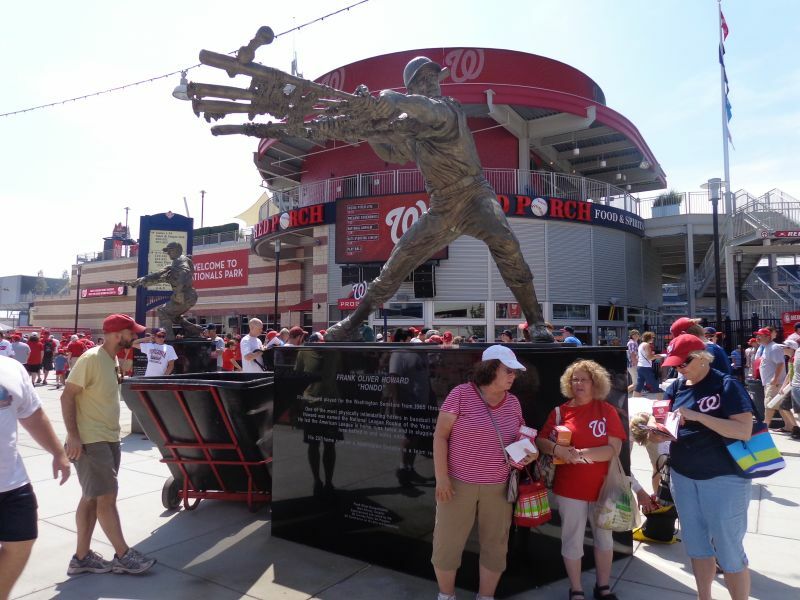 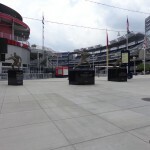 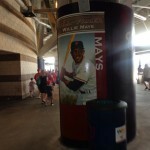 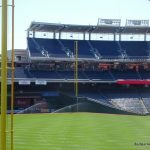 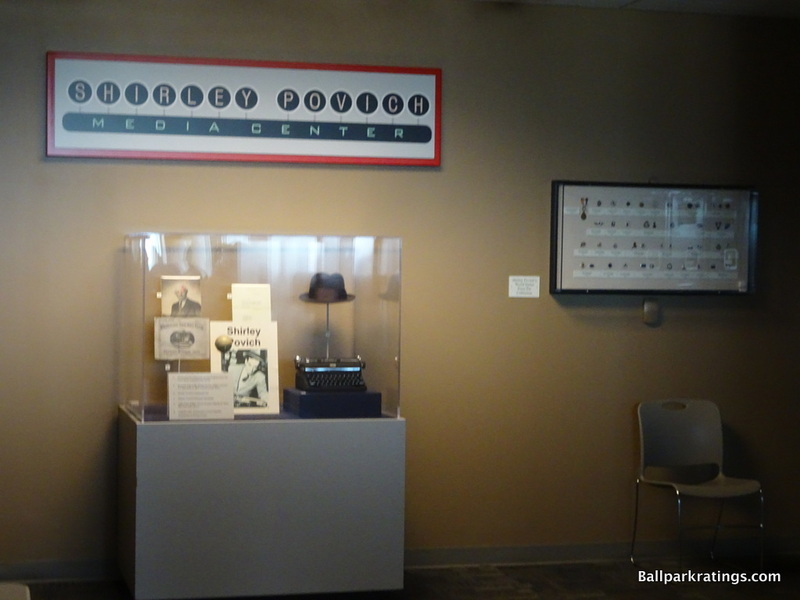 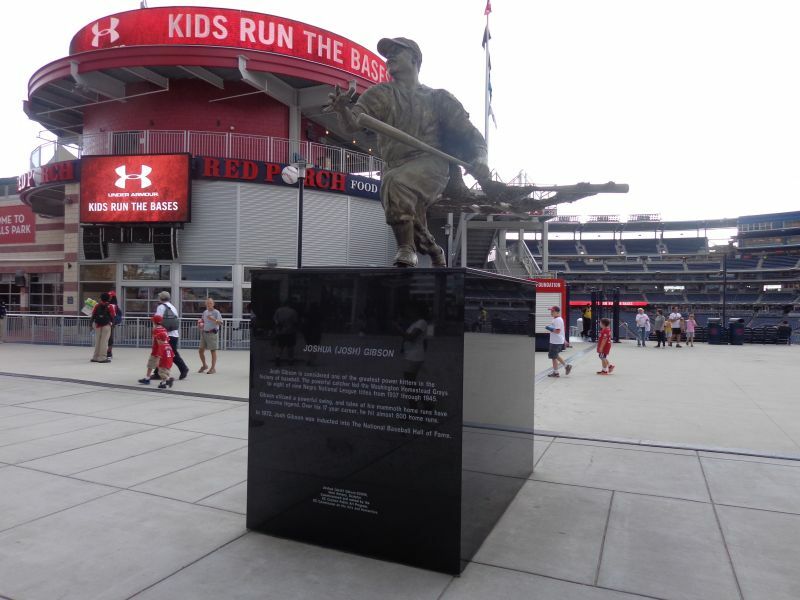 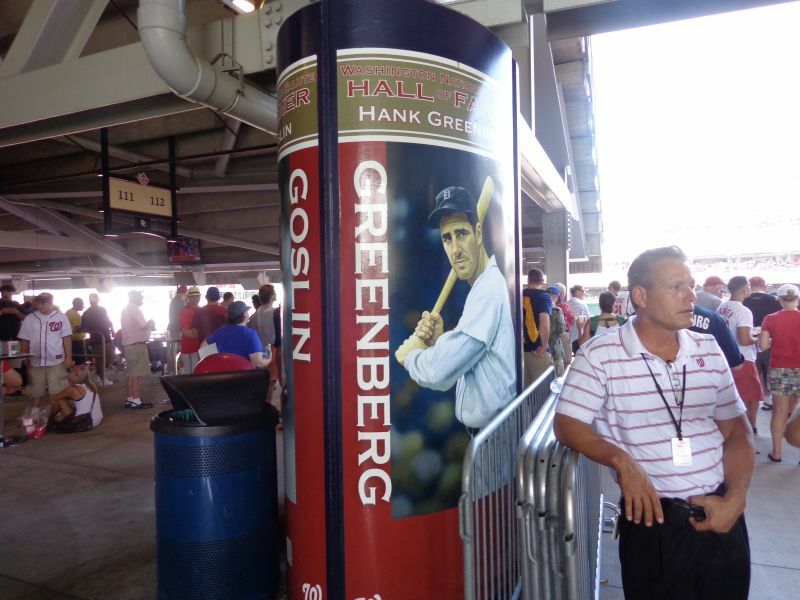 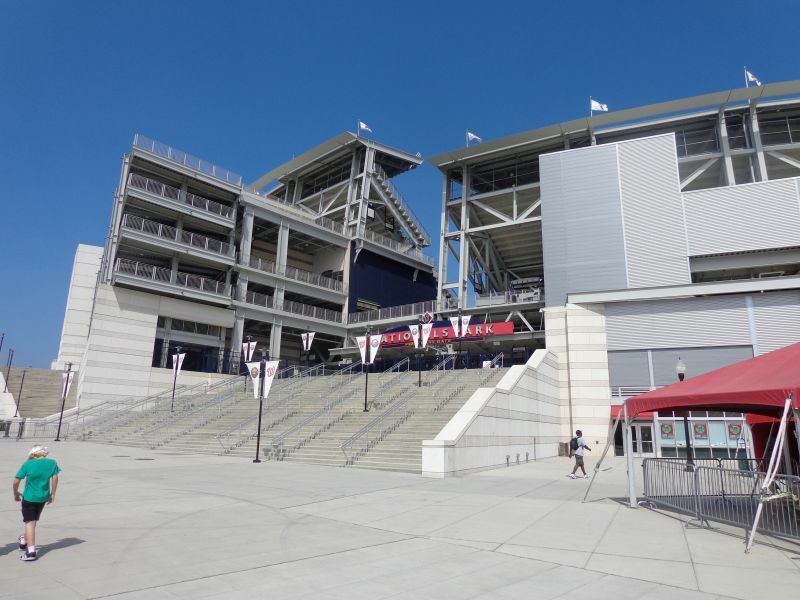 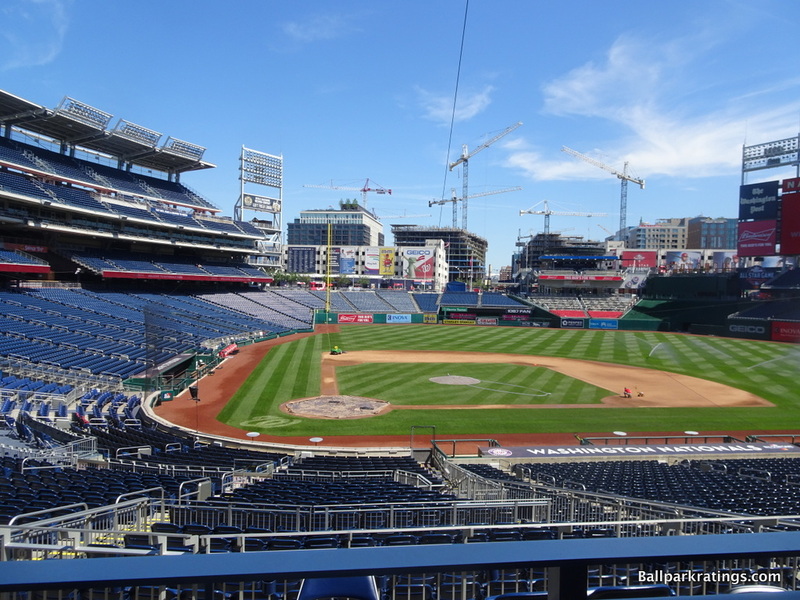 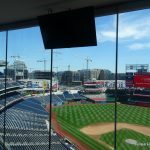 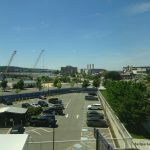 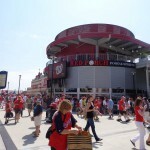 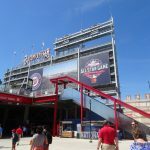 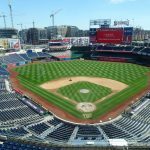 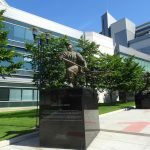 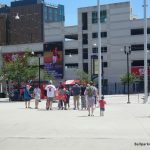 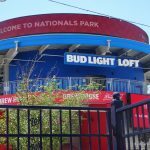 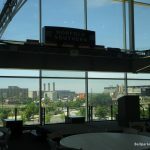 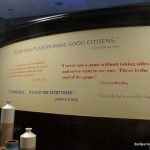 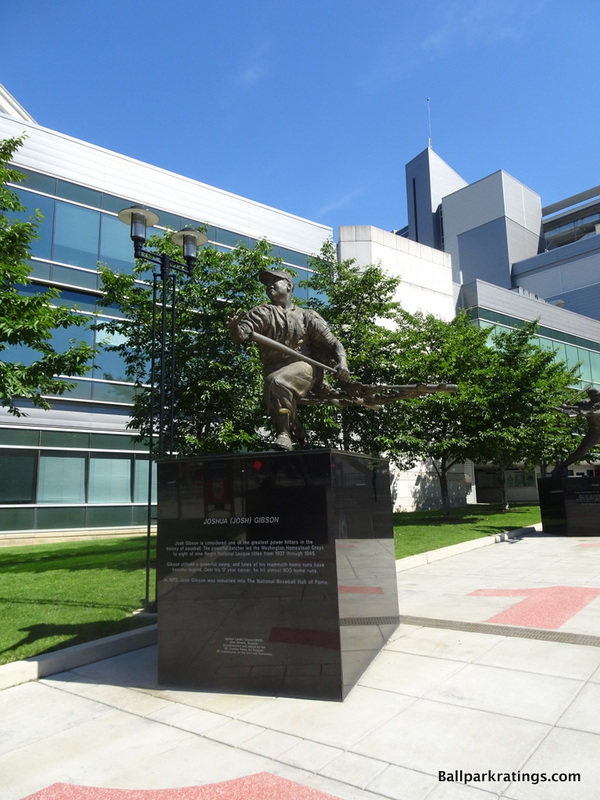 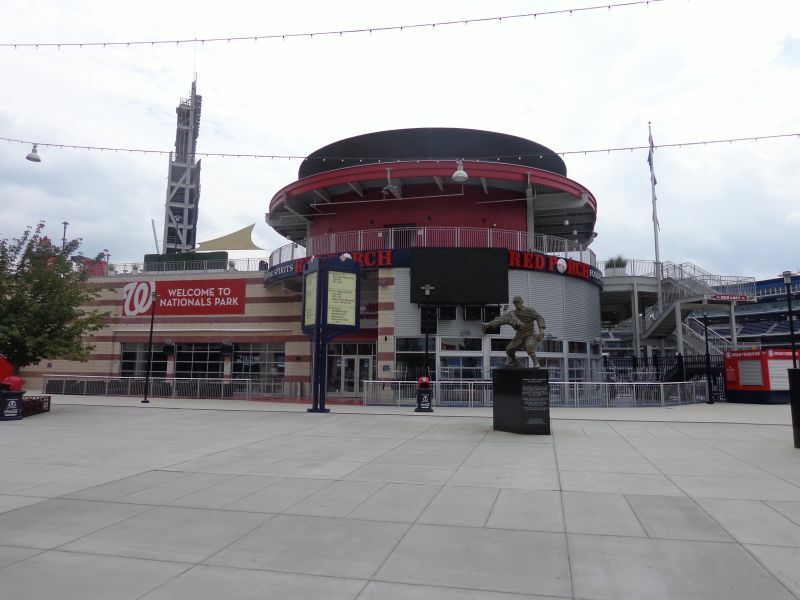 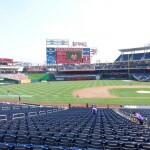 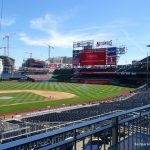 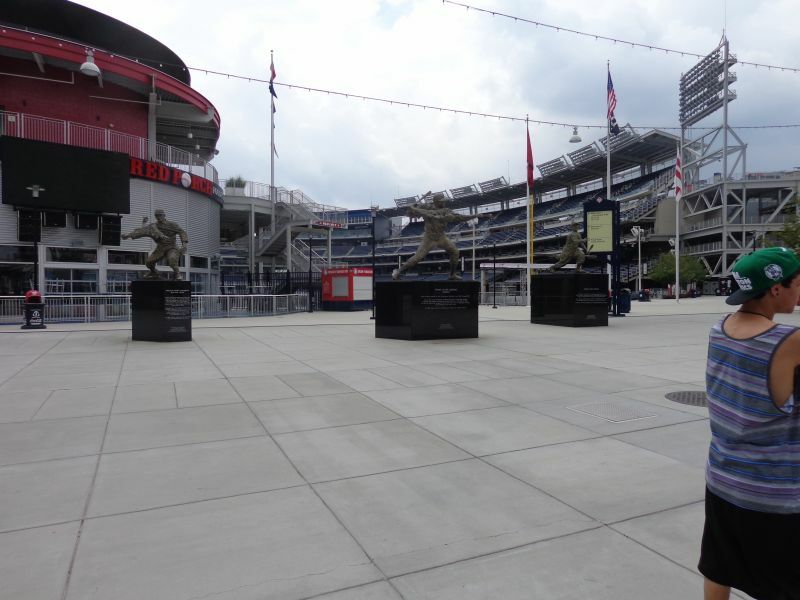 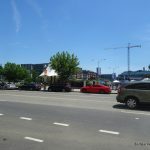 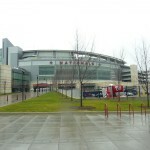 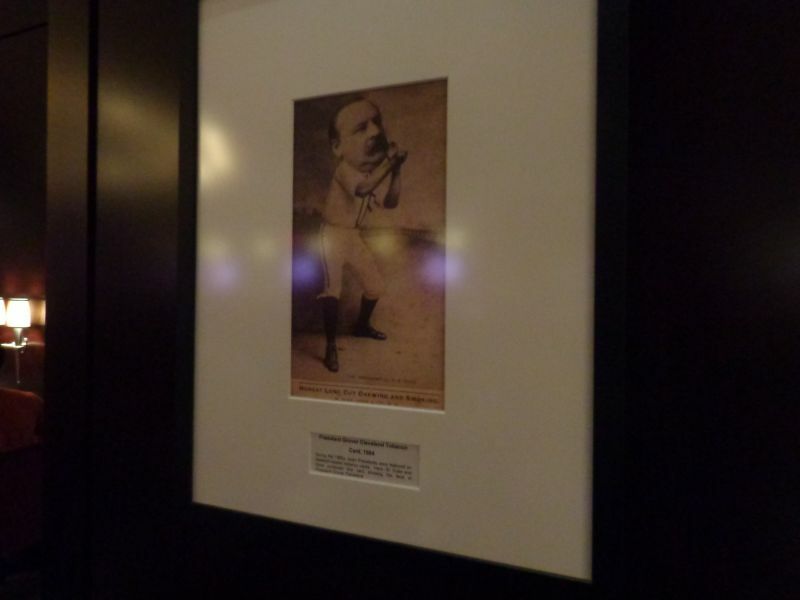 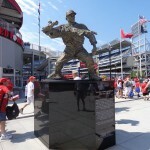 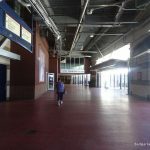 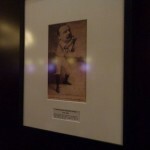 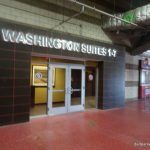 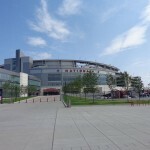 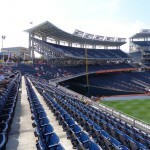 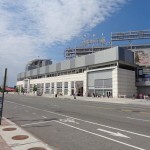 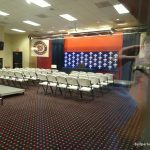 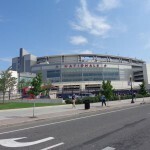 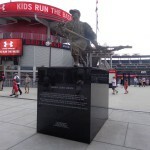 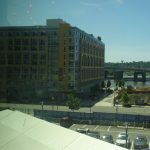 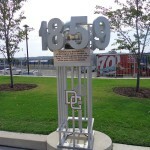 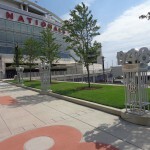 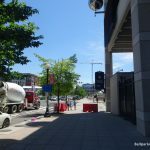 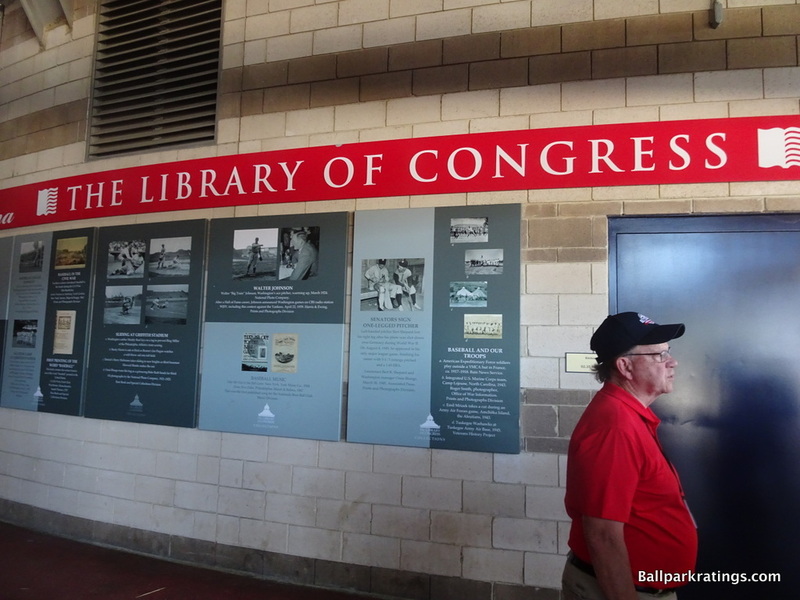 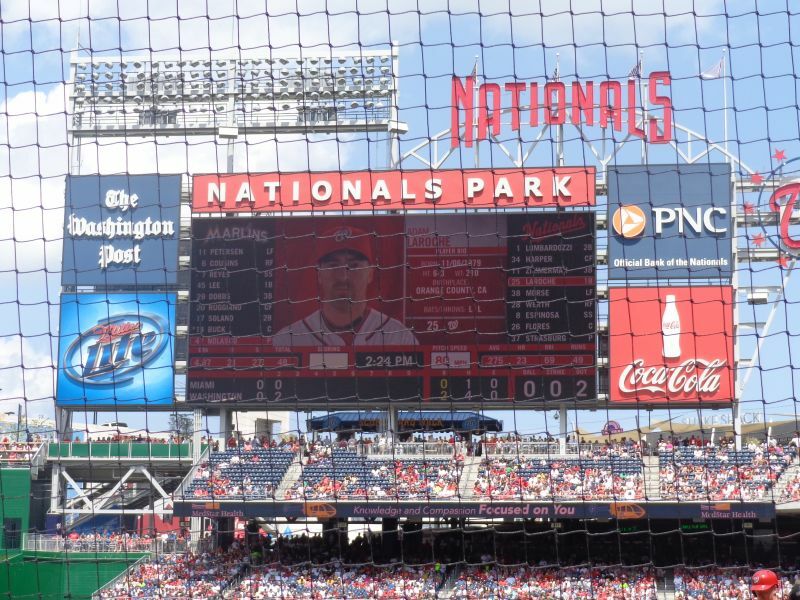 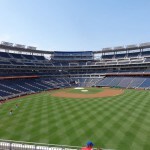 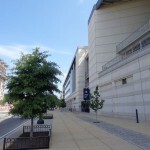 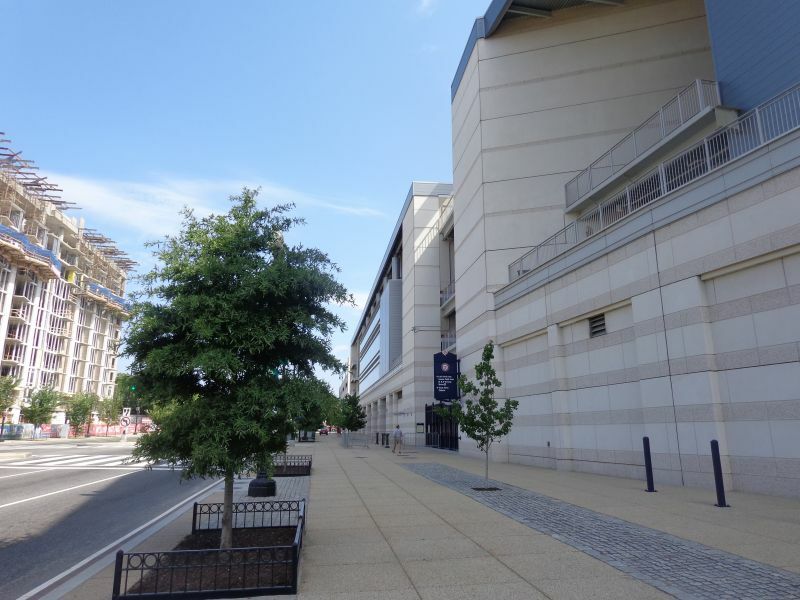 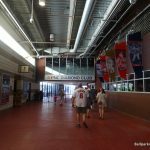 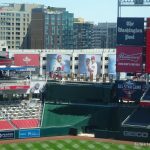 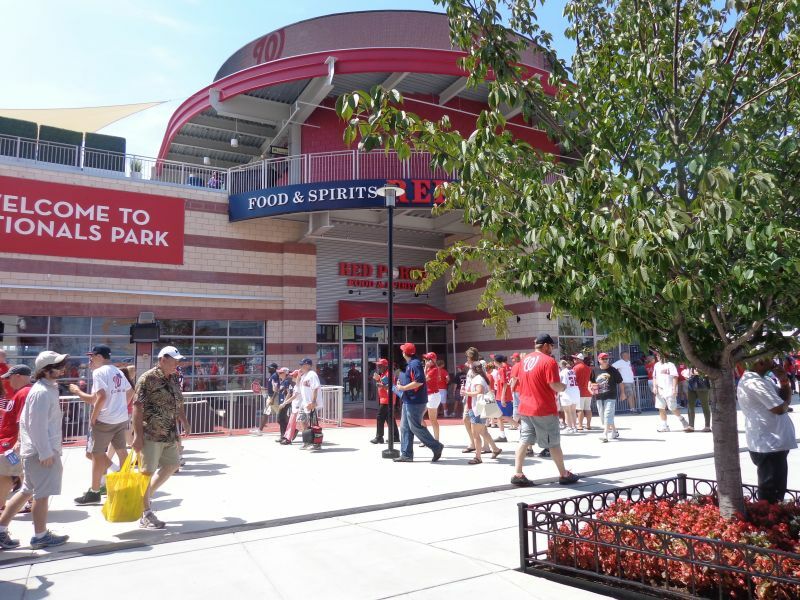 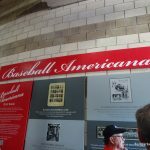 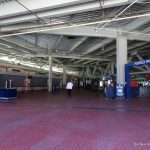 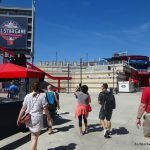 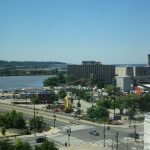 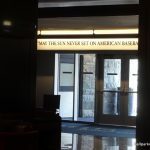 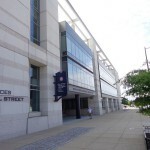 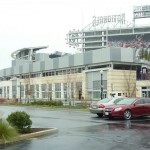 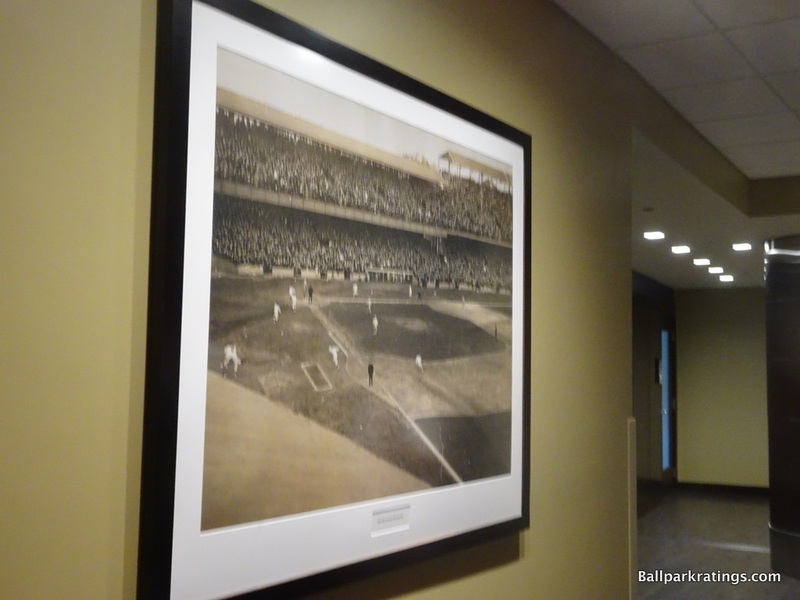 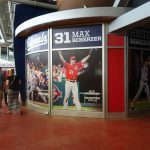 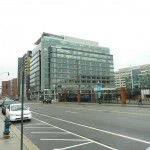 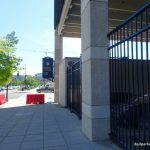 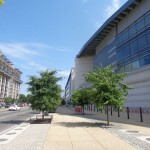 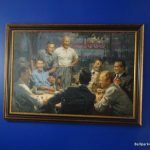 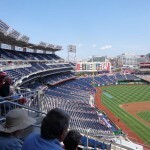 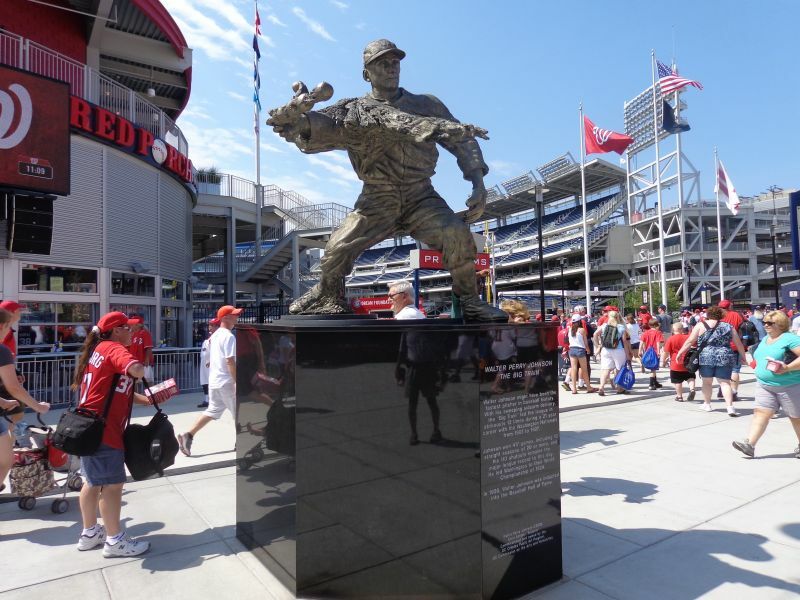 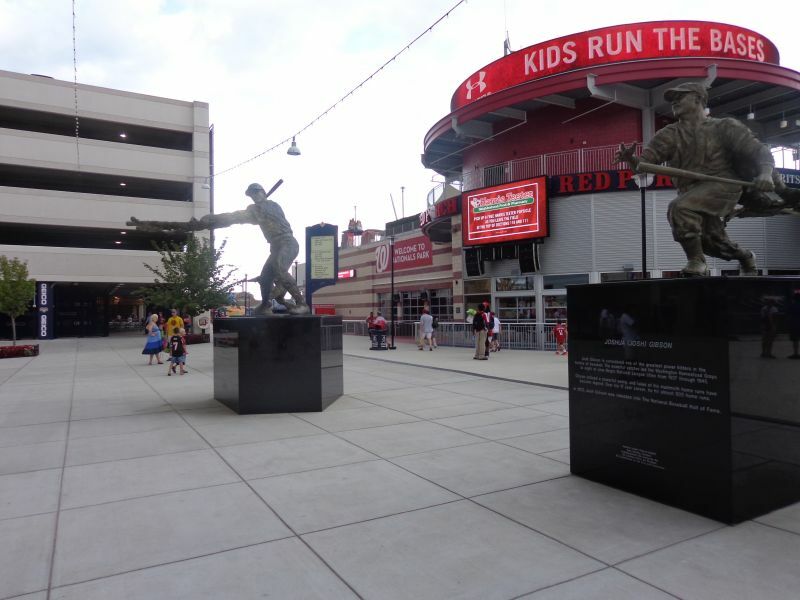 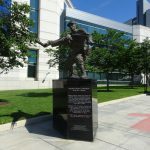 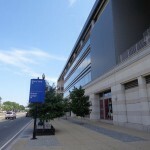 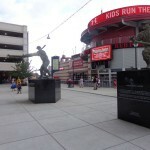 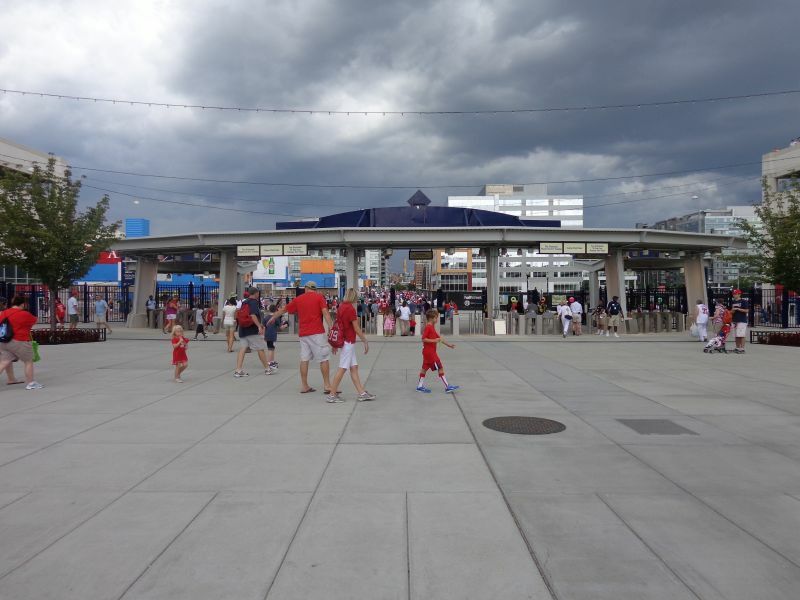 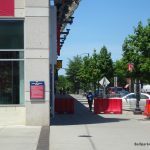 For the first time by Nationals Park’s planning and construction, major publications and national newspapers had blogs and special sections where they could devote more space for opinions about something as trivial as a team’s baseball stadium. 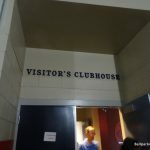 Major ballpark websites such as Baseballpilgrimages.com, Baseballparks.com, Ballpark Digest, and Ballparkreviews.com were beginning to receive a lot of traffic. 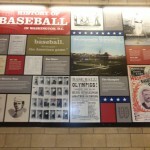 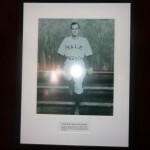 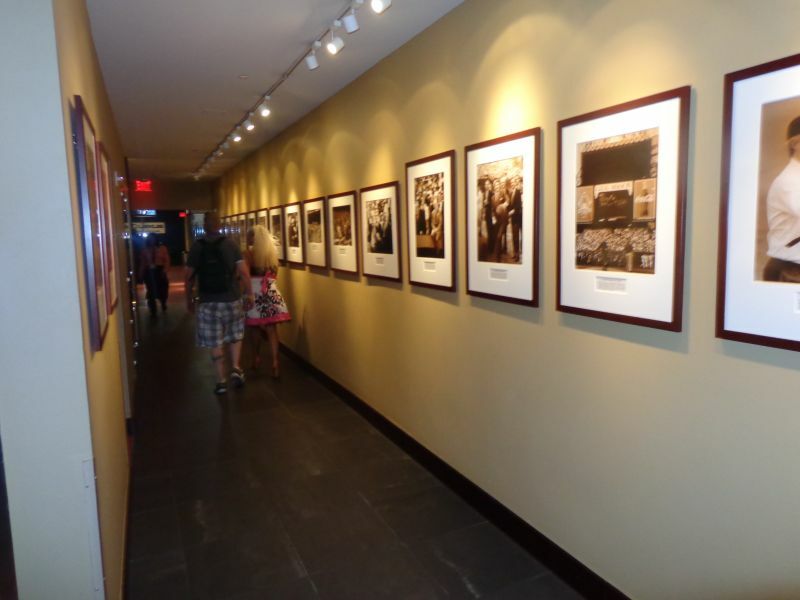 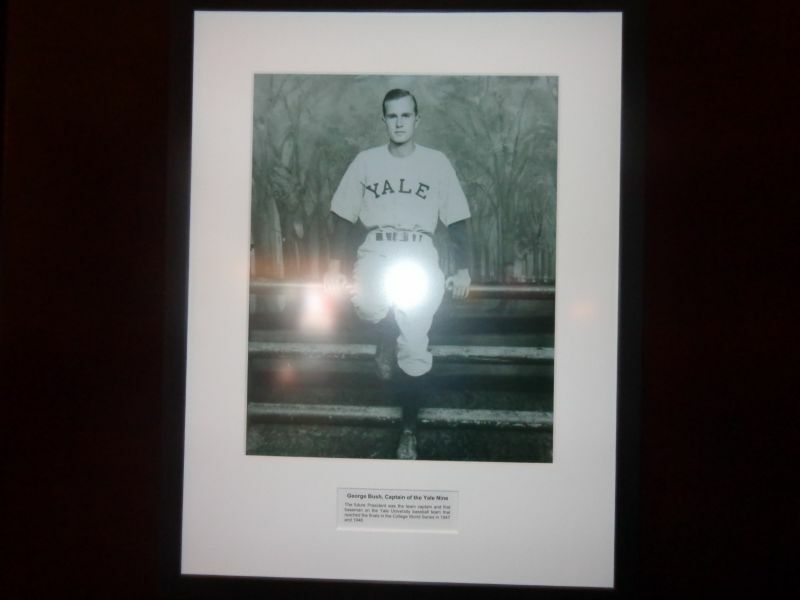 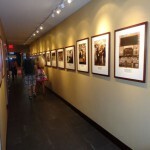 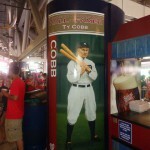 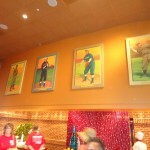 Prominent message boards such as Baseball Fever’s “Ballparks, Stadiums & Green Diamonds” were exploding. 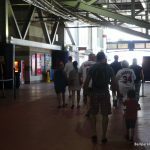 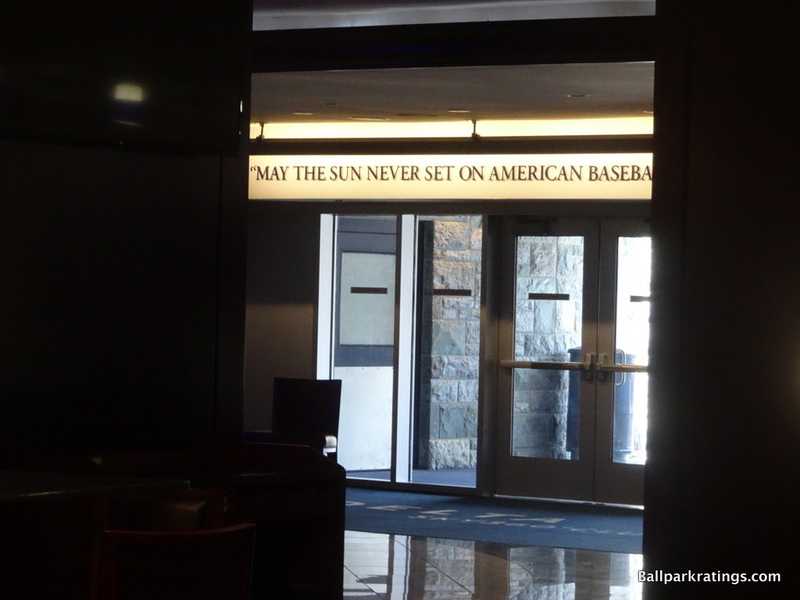 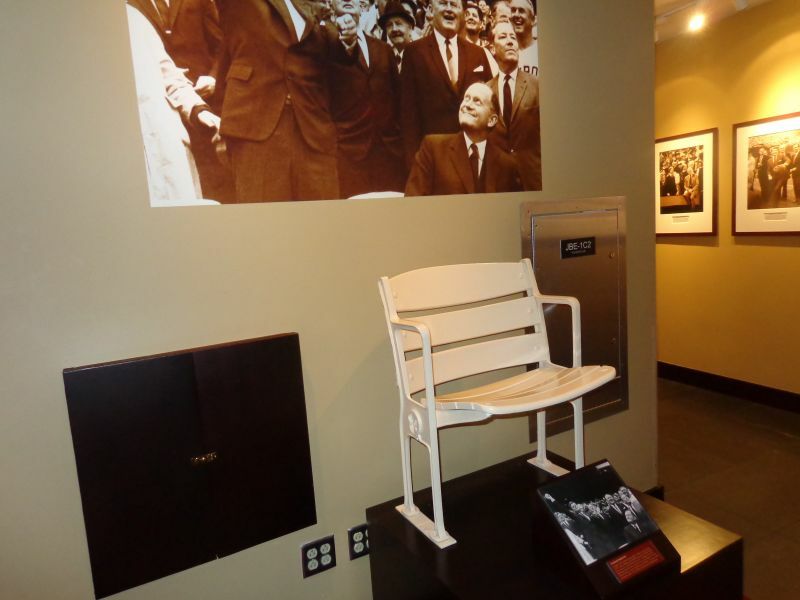 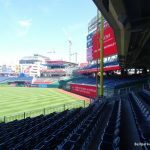 Finally, at a time when new ballparks were being built in our biggest markets and almost everybody was equipped to express their opinions on that, there was still a lingering sense of optimism about our nation’s new cathedrals that you don’t see today. 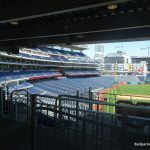 Camden Yards (1992), Coors Field (1995), Safeco Field (1999), AT&T Park (2000), PNC Park (2001), and Petco Park (2004) were all highly acclaimed, and they all brought something new to the table that we loved. 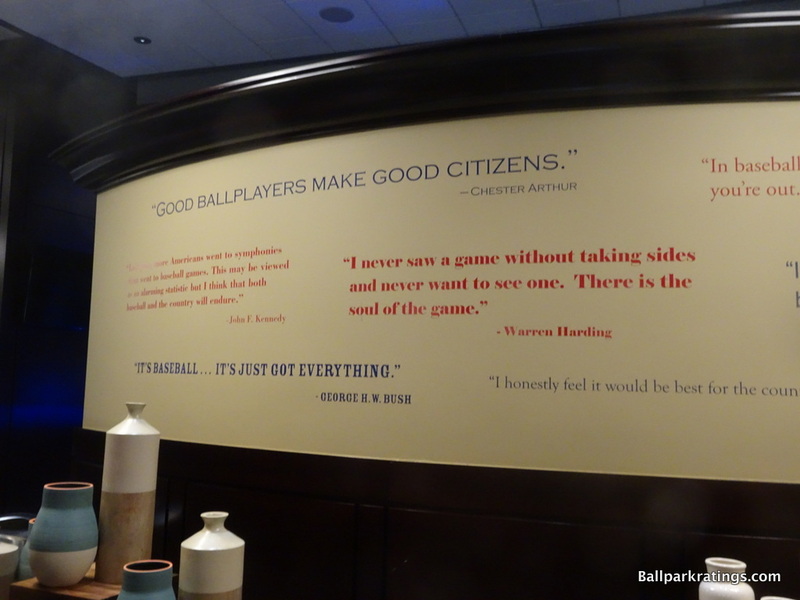 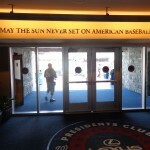 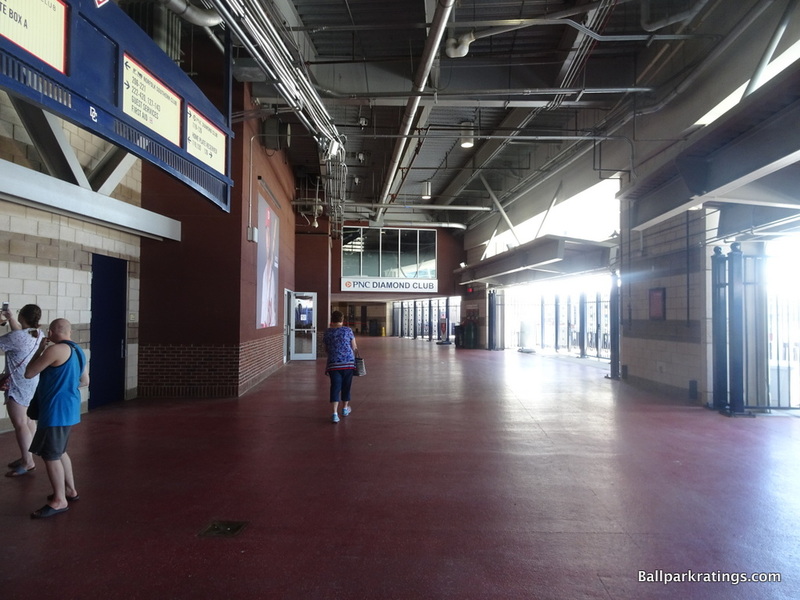 There was a general sense that ballparks could and would continue to get better. 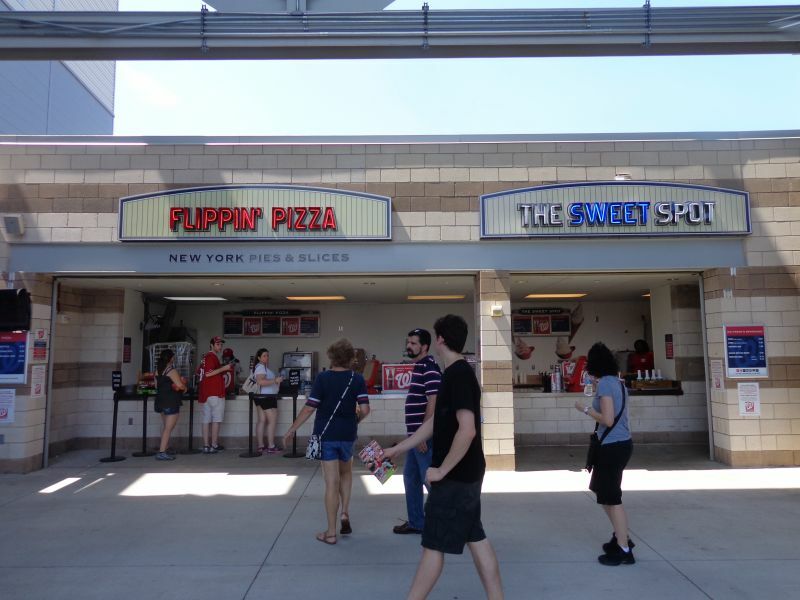 Even less well-received concepts in Houston and Cincinnati were trying to push the envelope. 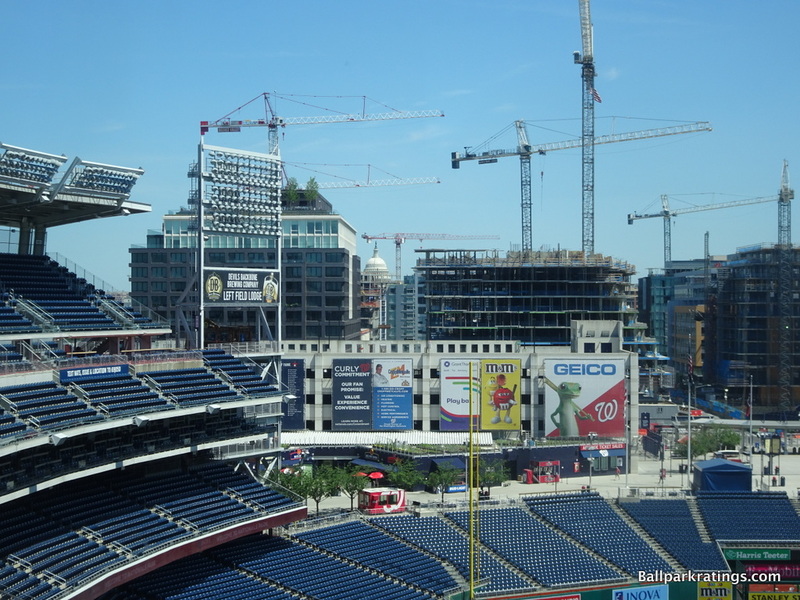 You could tell they were all setting out to build the best ballpark in baseball. 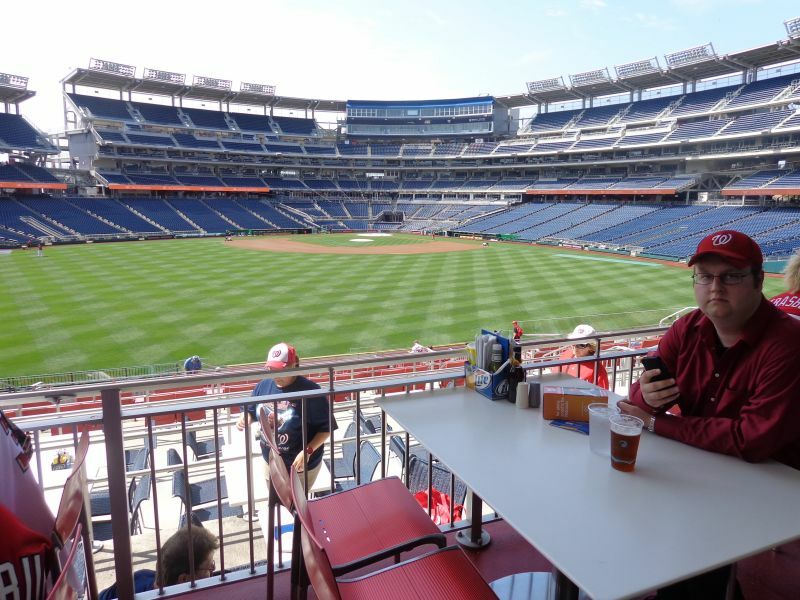 In the face of high expectations, Nationals Park seems to have received disproportionately mixed reviews for a venue of this caliber. 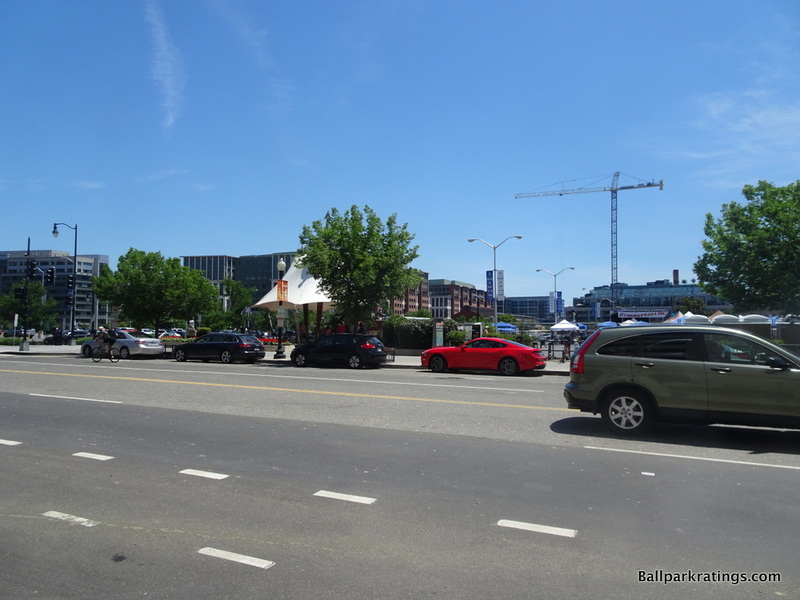 It doesn’t break any new ground (this is a comparative exercise, how many parks are truly original? 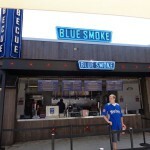 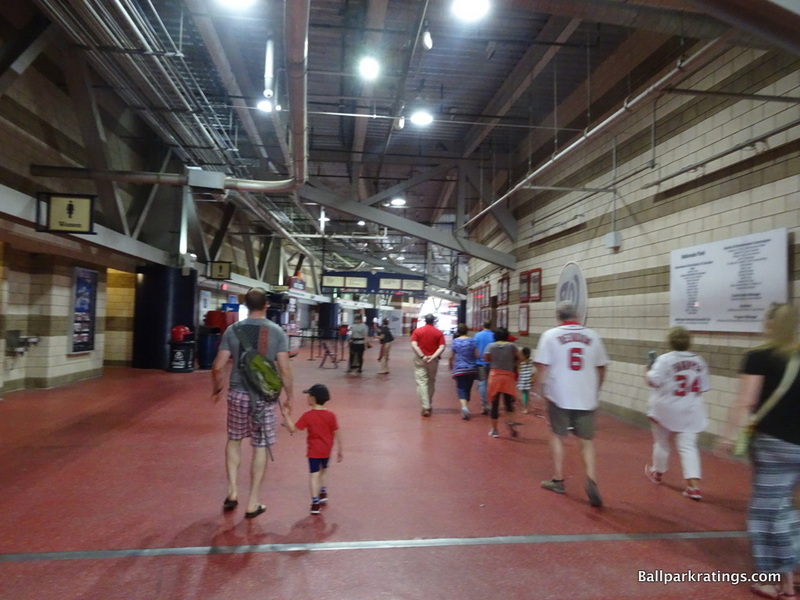 ), but it’s an all-around good ballpark experience. 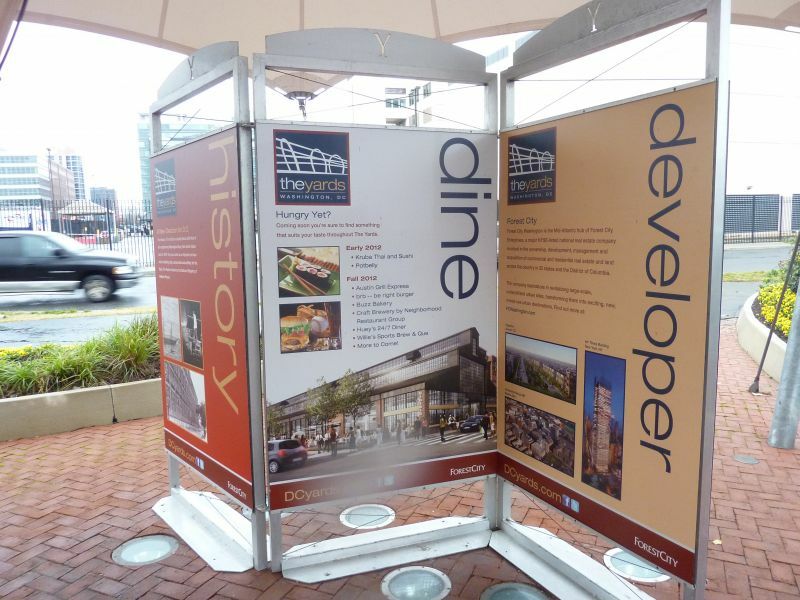 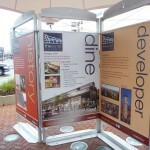 Throughout the design process and upon opening in 2008, you never got that sense in Washington. 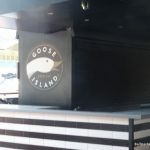 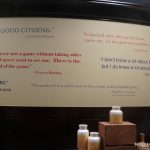 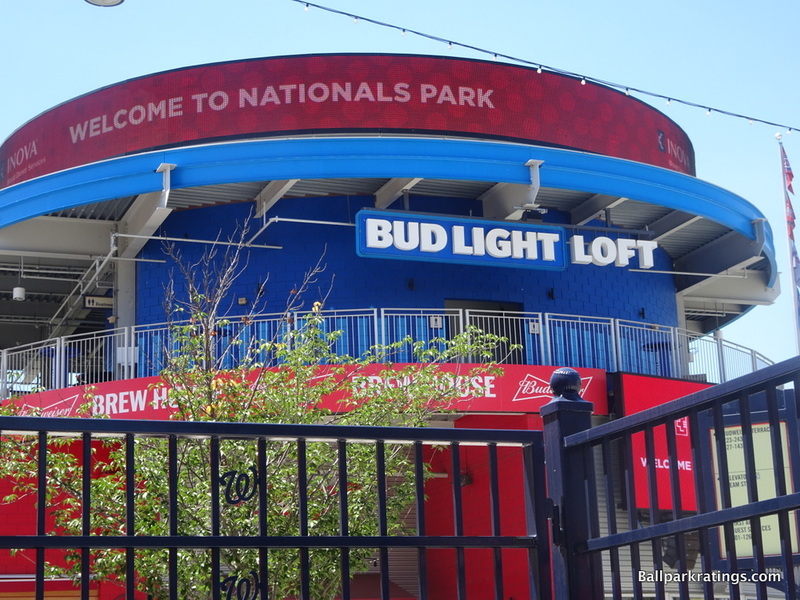 People were expecting something bold and fresh for this place in the mid-2000s, worthy of the forward-looking spirit of the nation’s capital, and they got something rather prosaic. 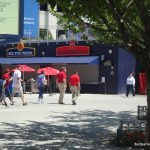 Contrasting that to 2014-2017, I don’t think anyone expected anything new in Atlanta. 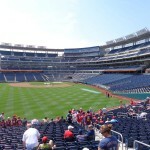 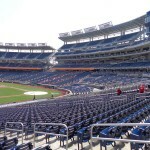 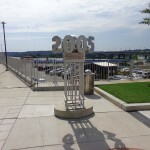 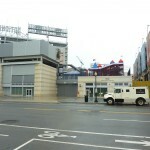 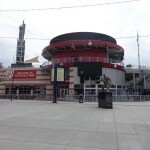 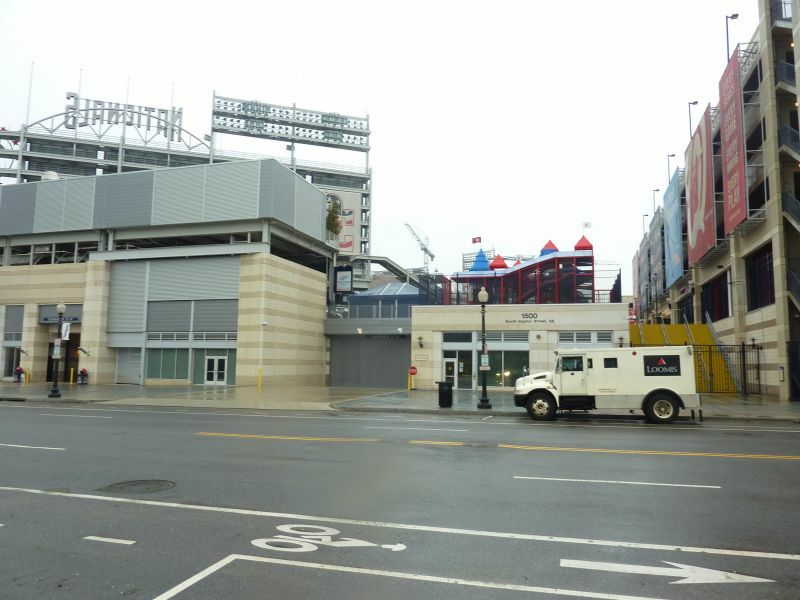 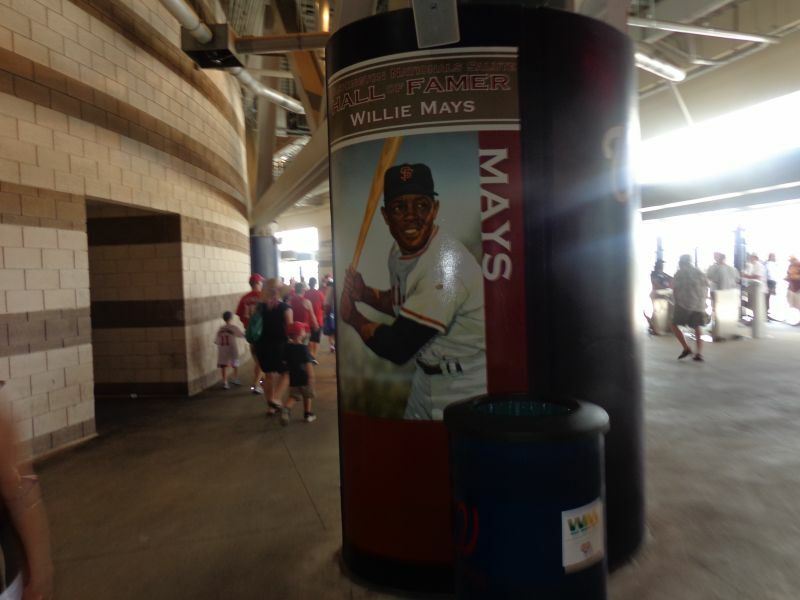 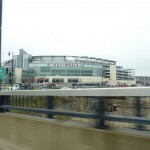 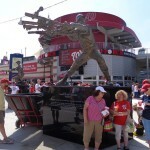 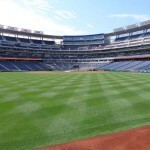 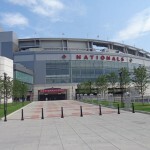 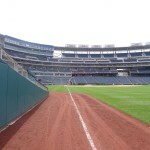 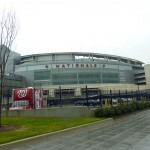 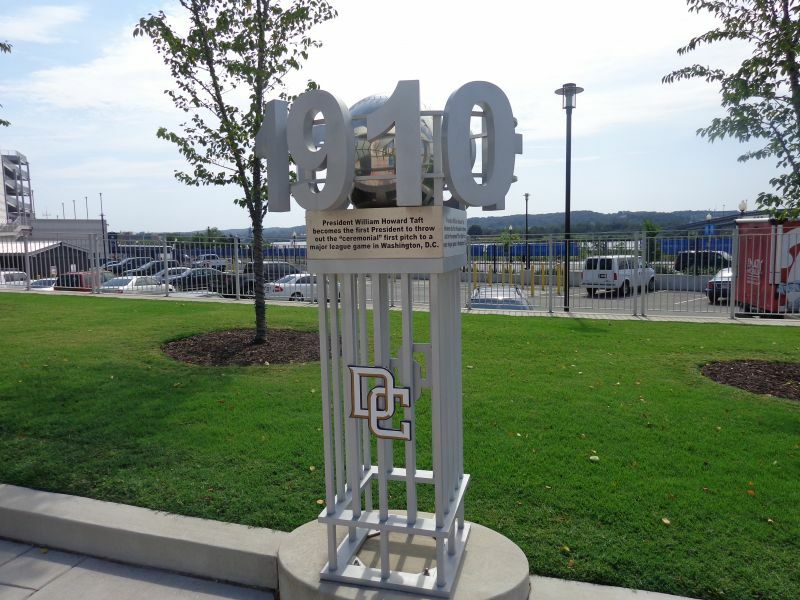 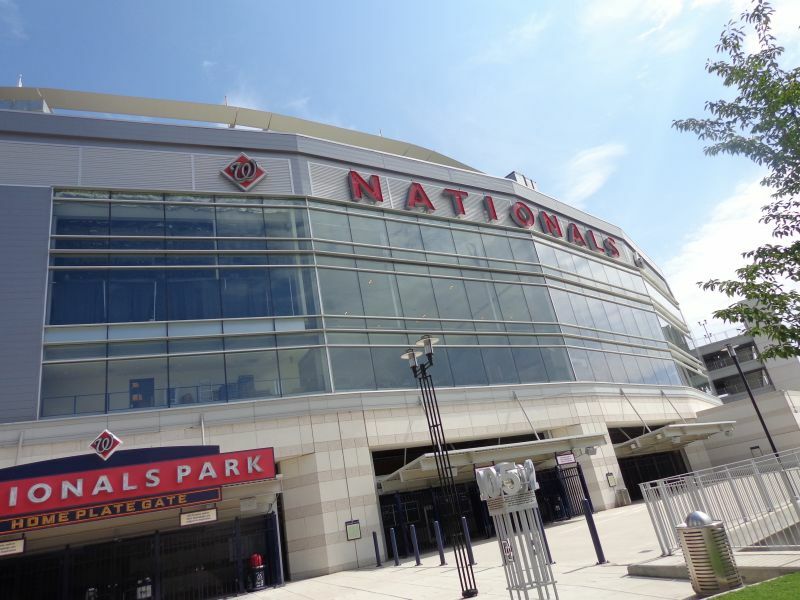 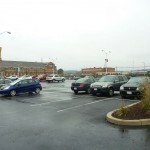 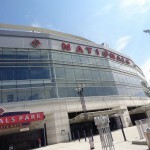 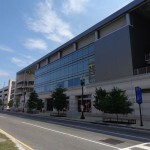 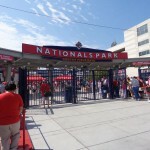 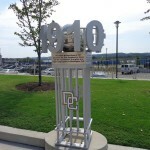 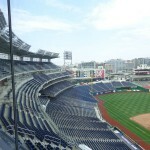 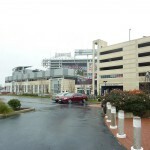 Nationals Park was perceived as the first of the so-called “mallpark era”, where baseball stadiums are primarily machines for separating people from their money. 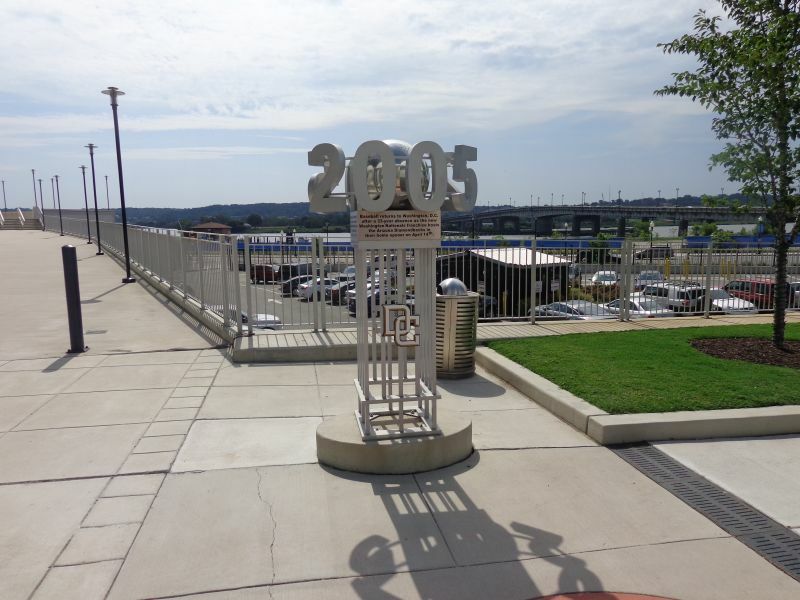 “Mallpark” is a fuzzy term, and I don’t think we fully got there until 2017, because parks from 2008-2012 still had some aesthetic purpose. 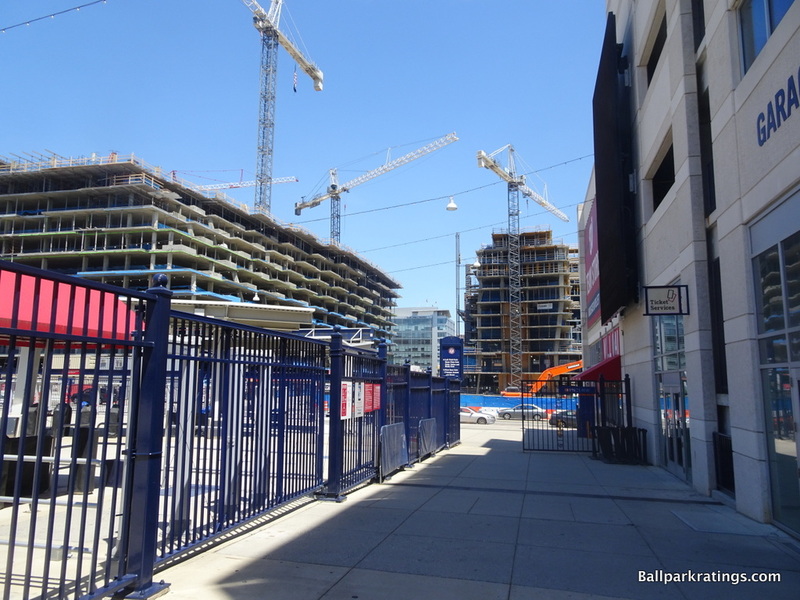 But I will concede Nationals Park was probably the beginning of it, the first park where more time was spent on economic considerations compared to architecture, aesthetics, and watching baseball (2017’s SunTrust Park was almost 100% economically driven with no aesthetic vision–the first true mallpark in my book). 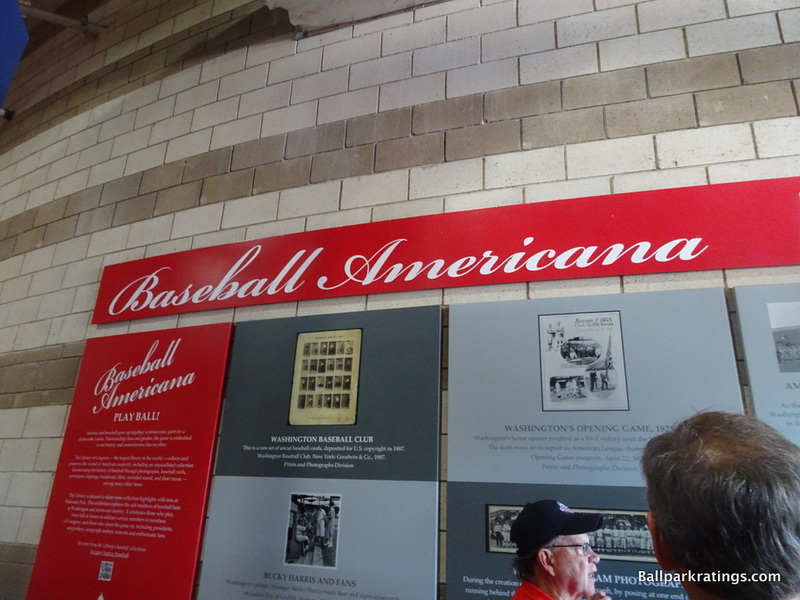 Anyway, this was the beginning of ballparks unapologetically focusing on the commercial aspects of architecture. 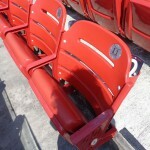 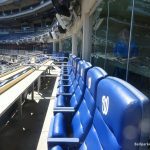 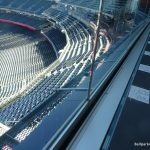 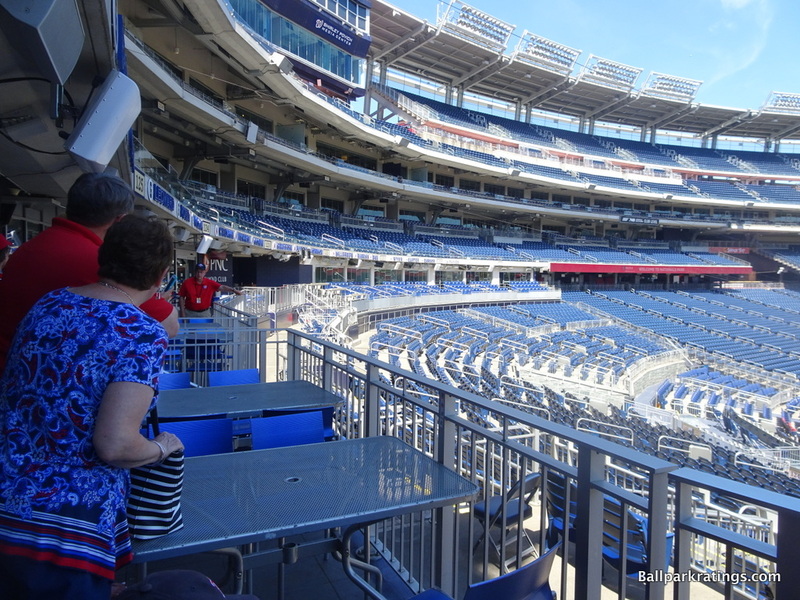 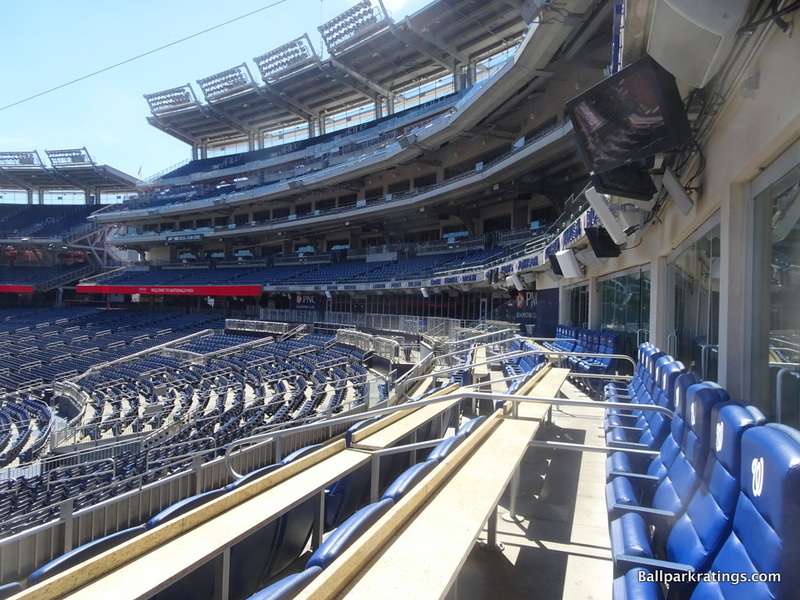 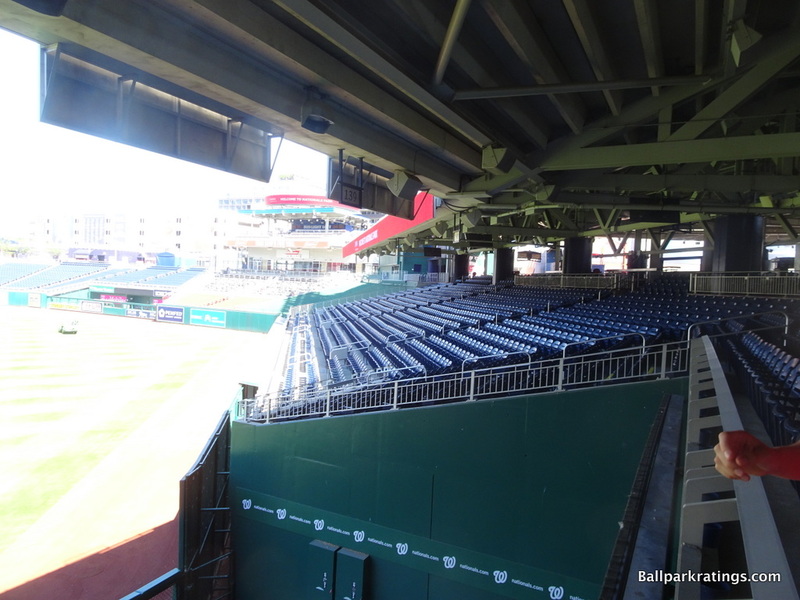 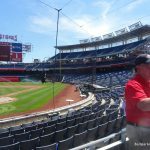 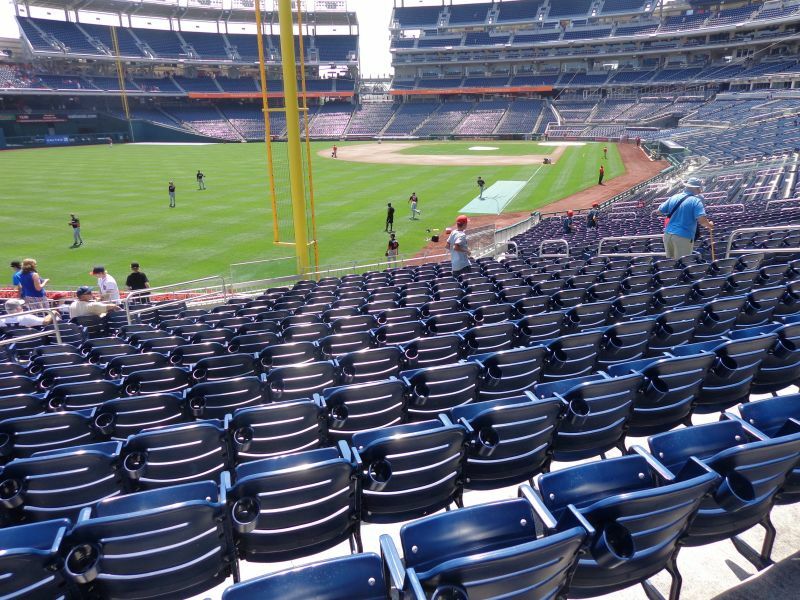 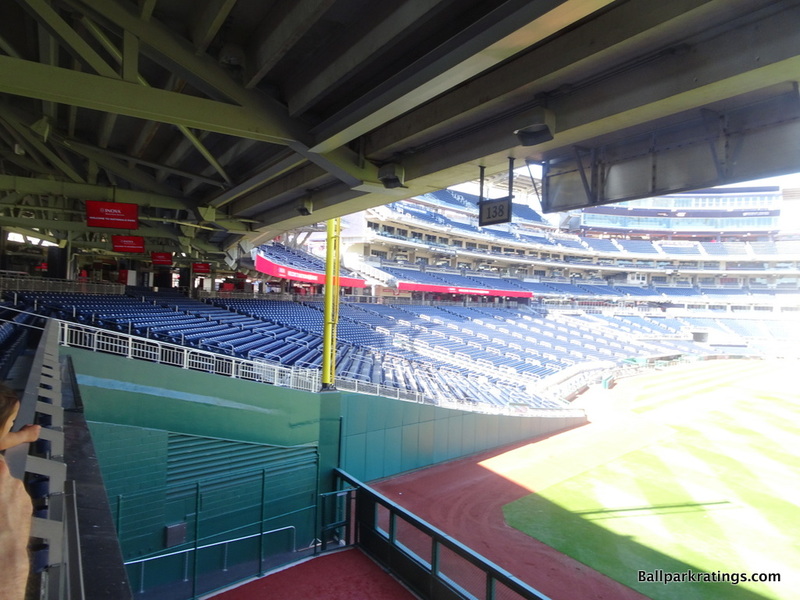 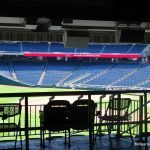 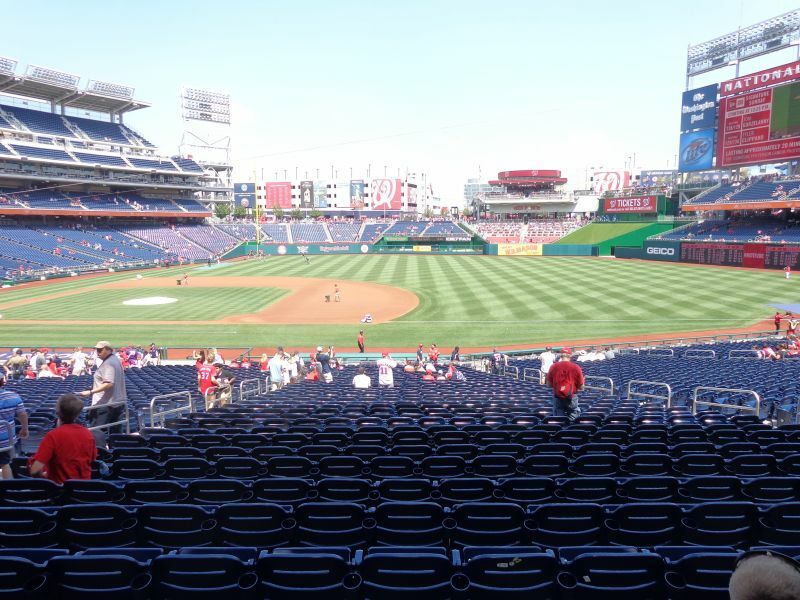 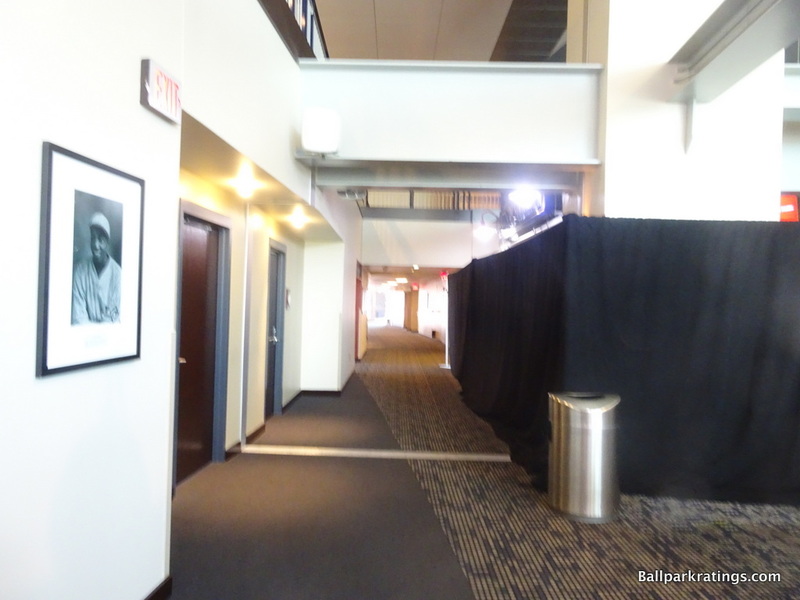 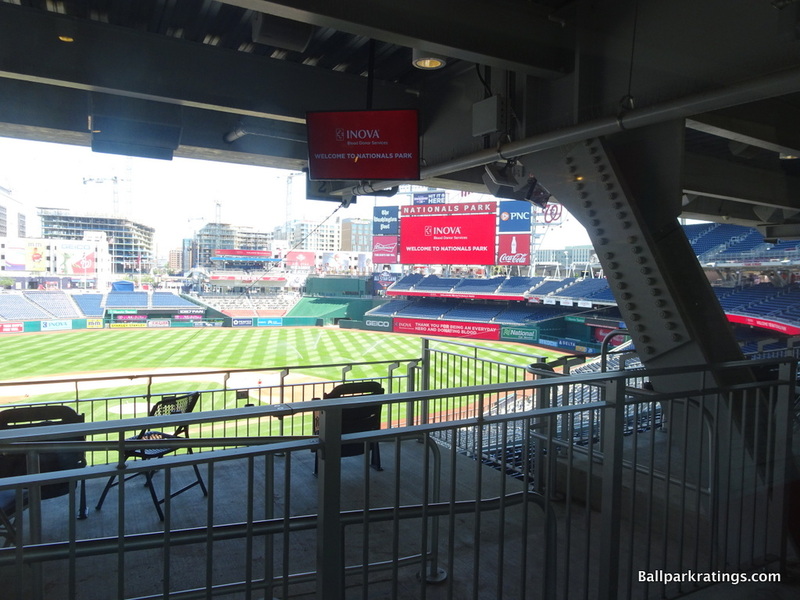 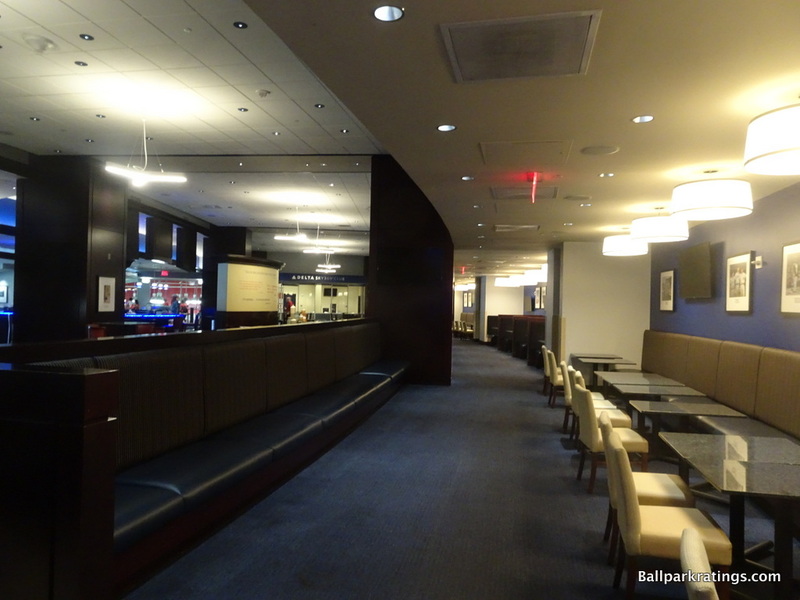 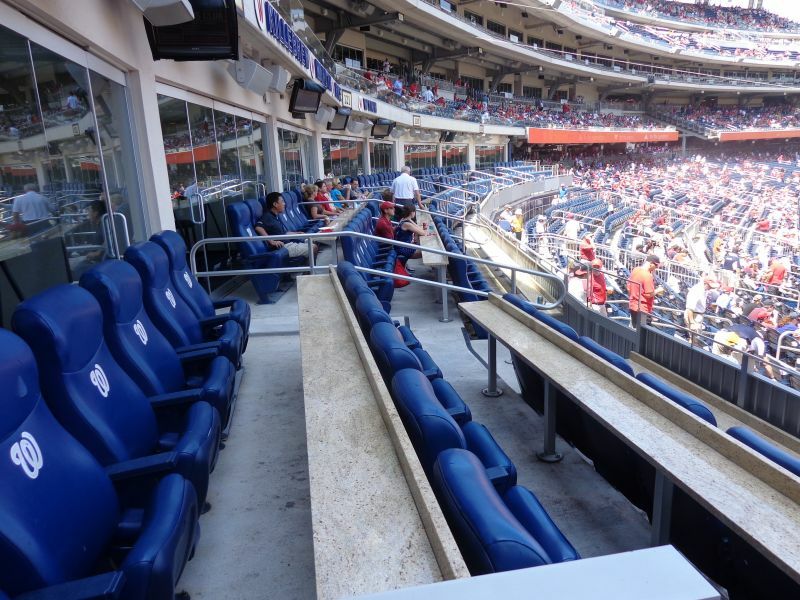 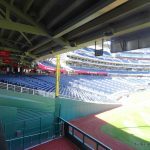 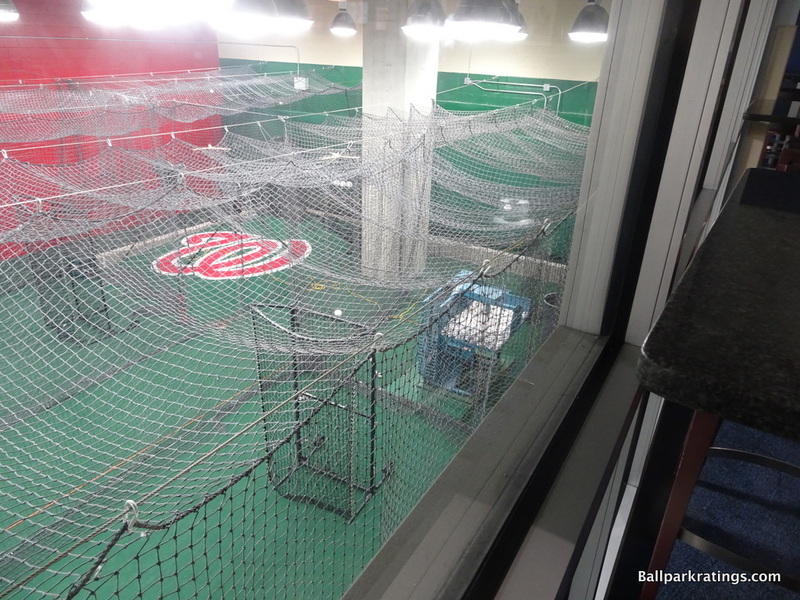 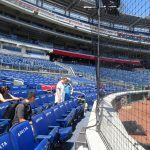 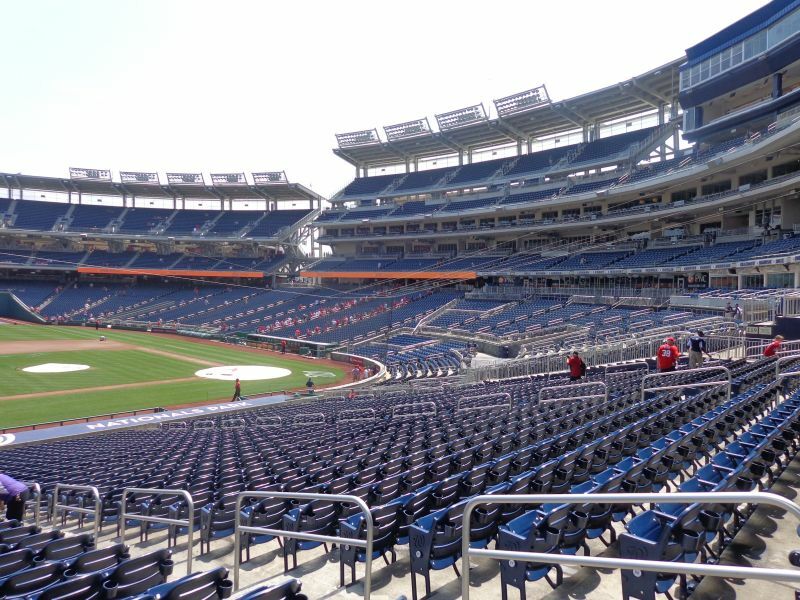 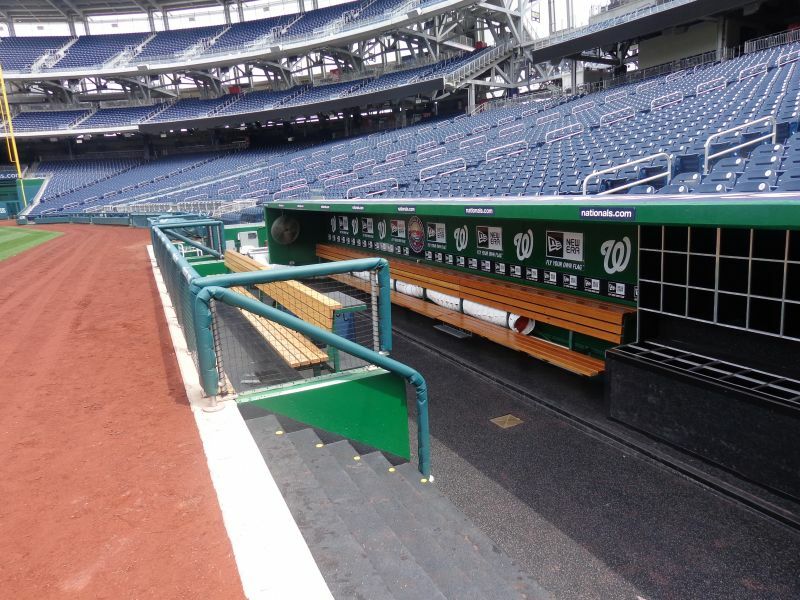 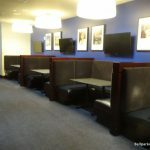 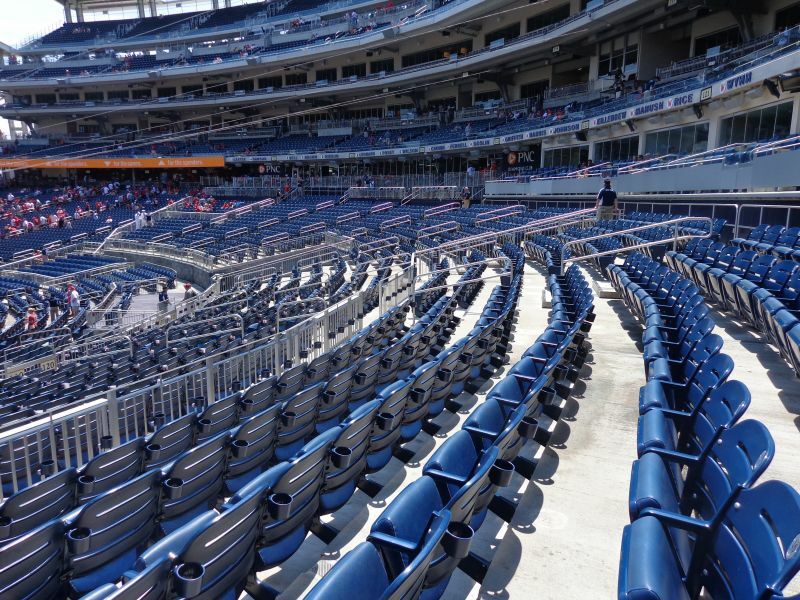 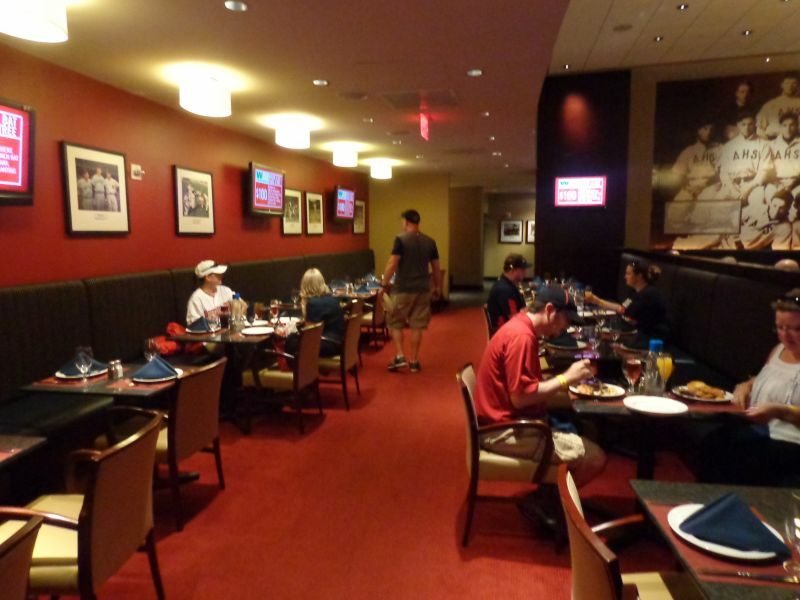 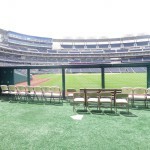 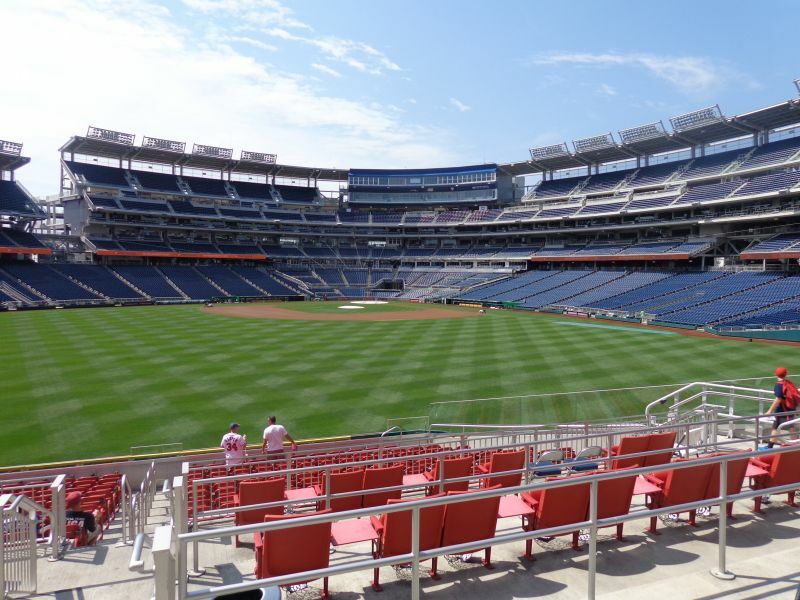 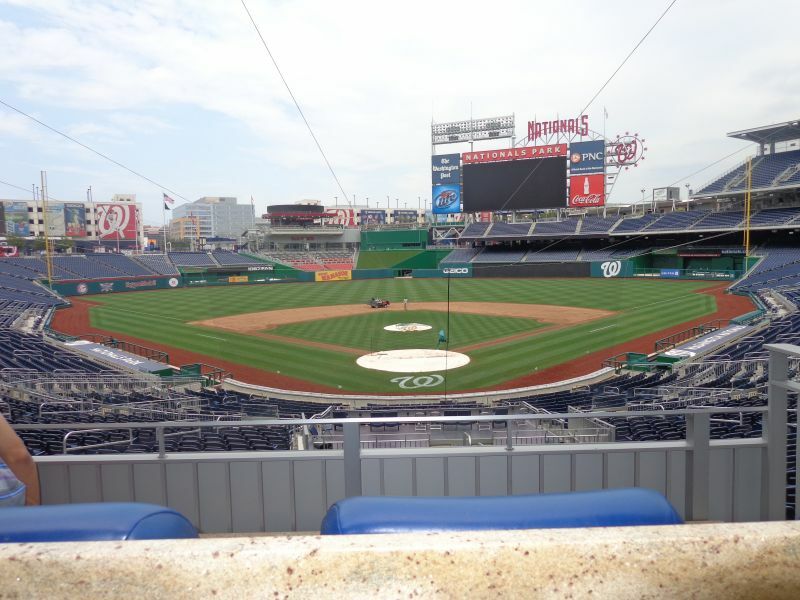 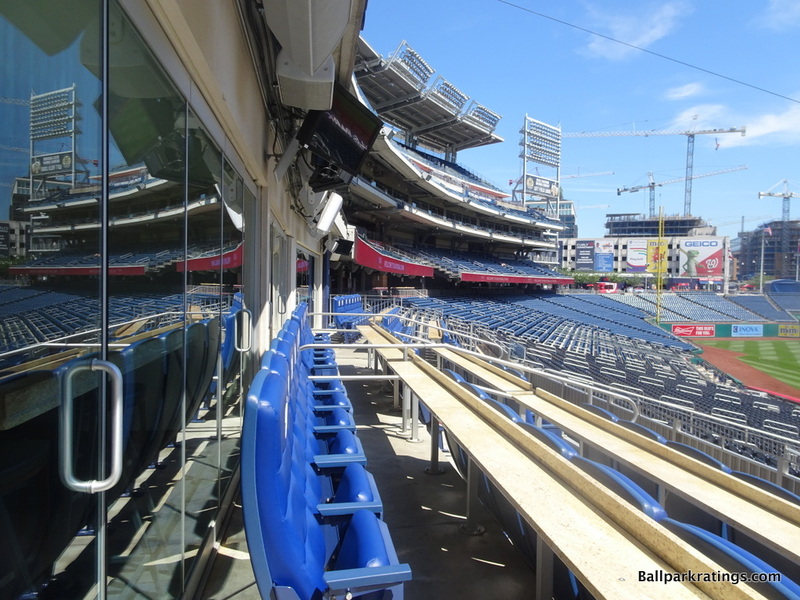 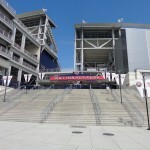 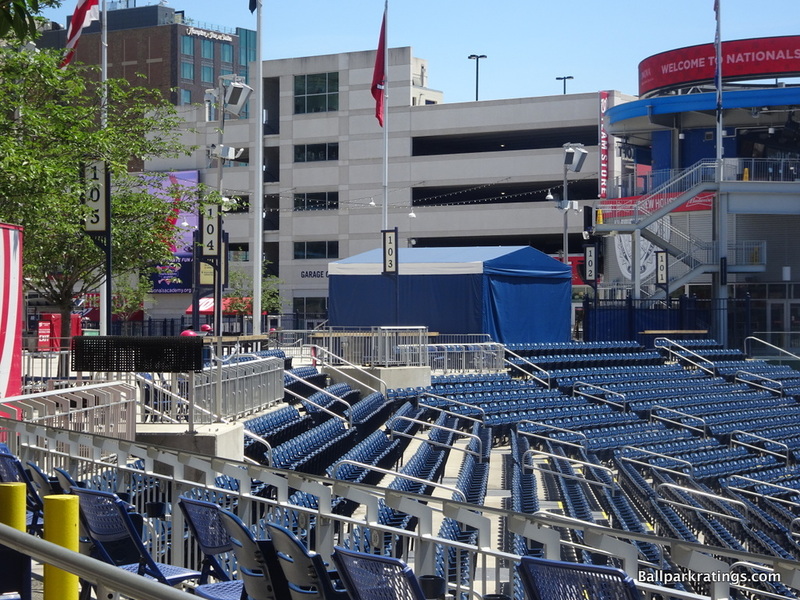 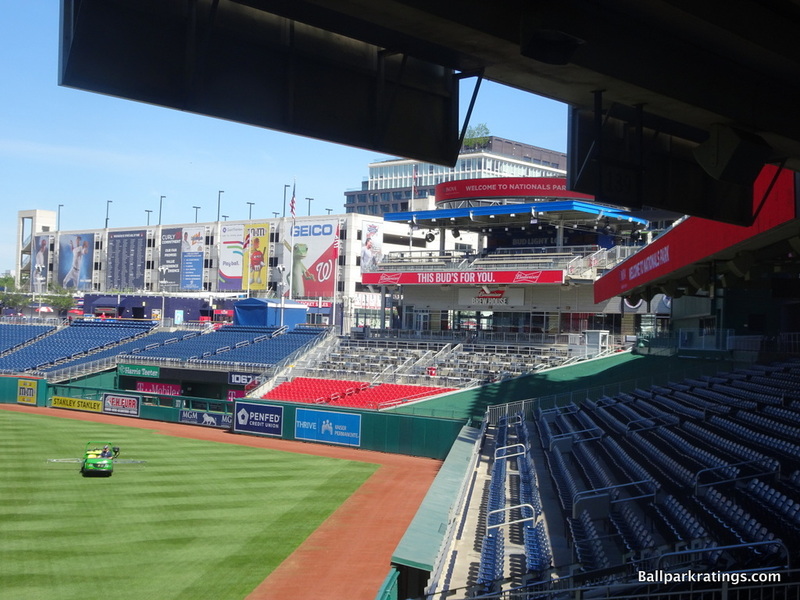 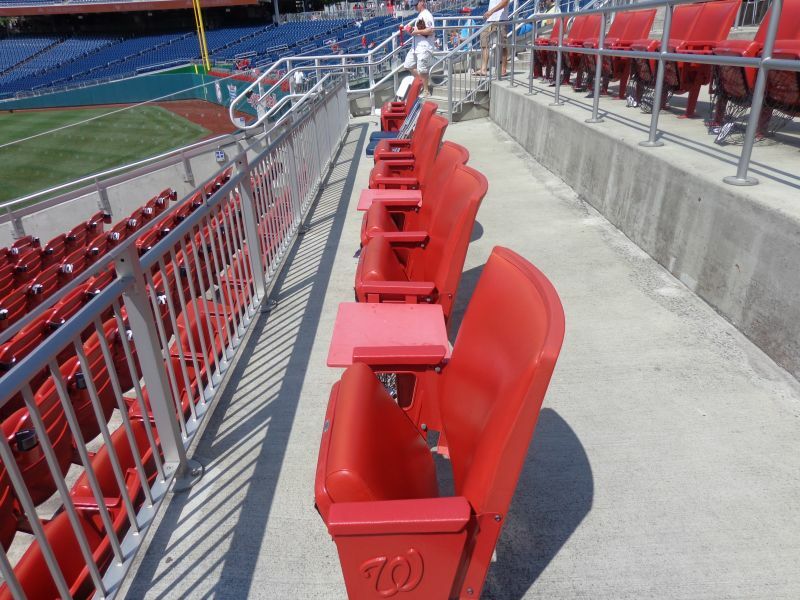 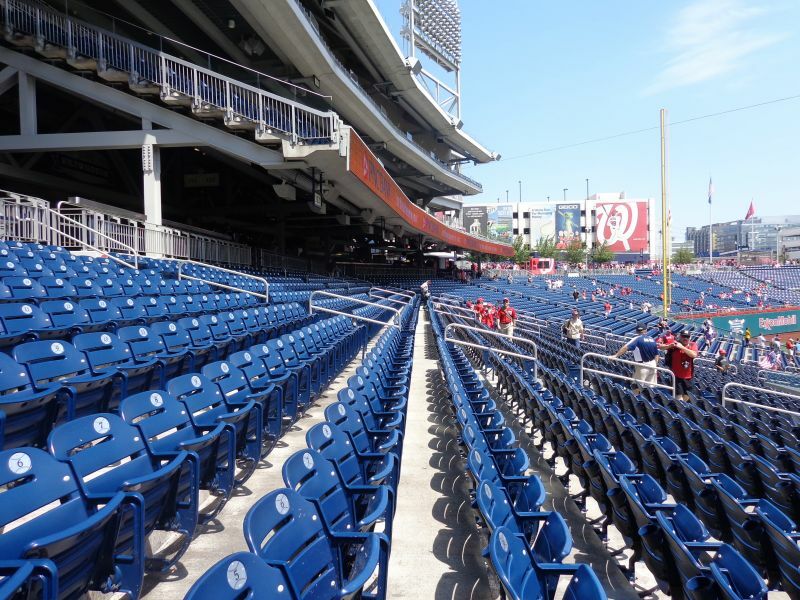 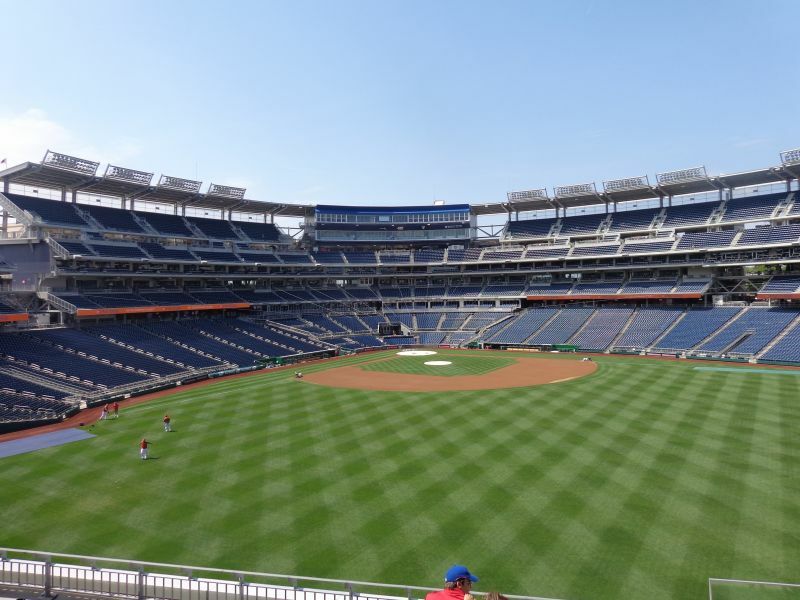 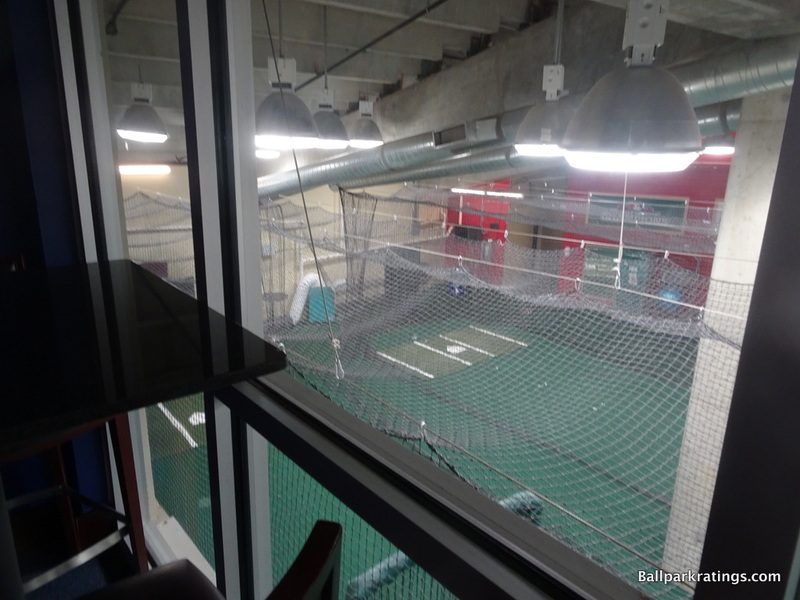 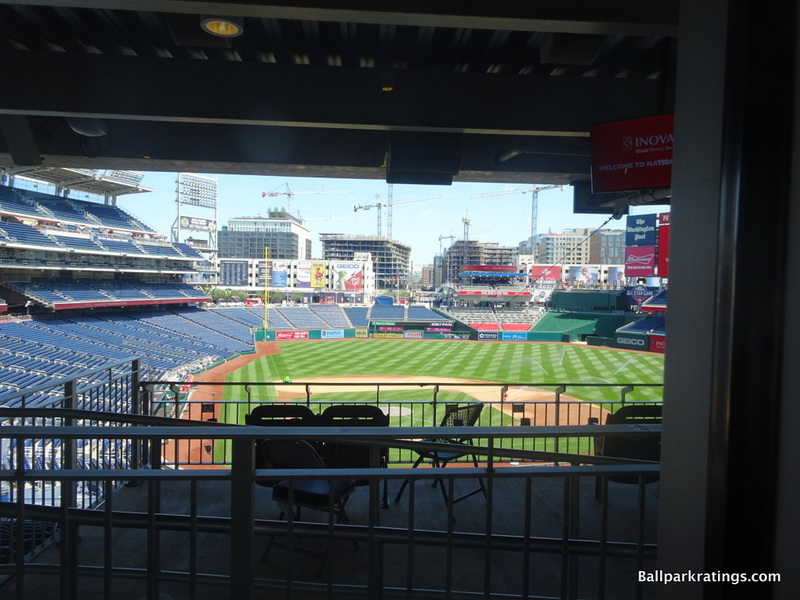 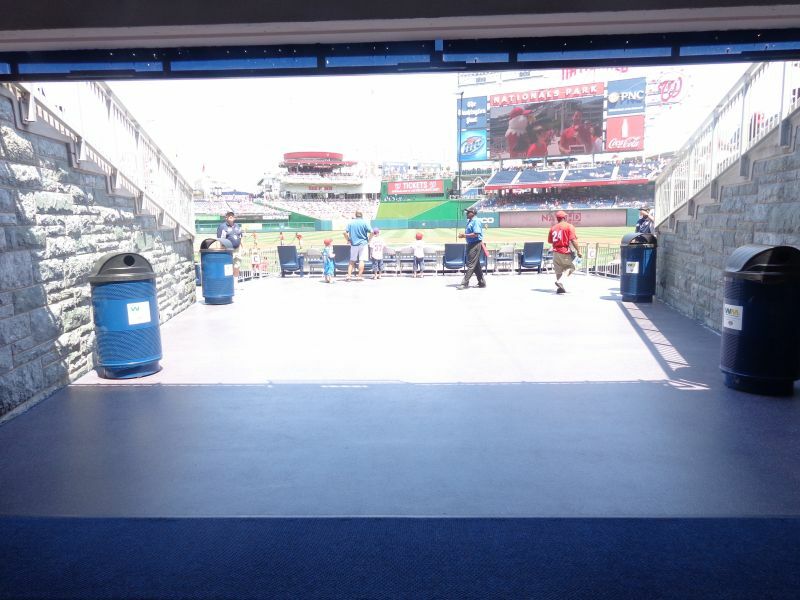 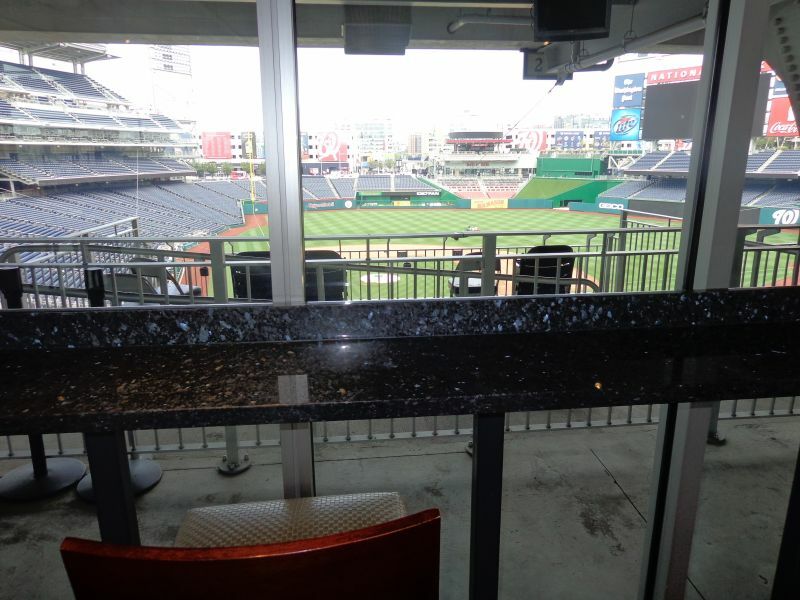 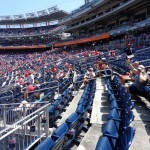 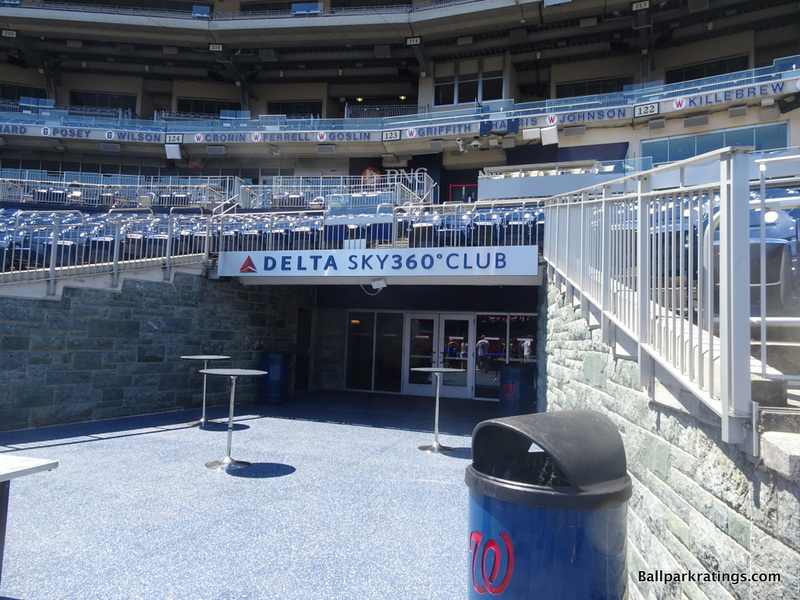 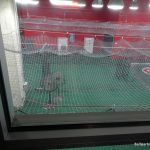 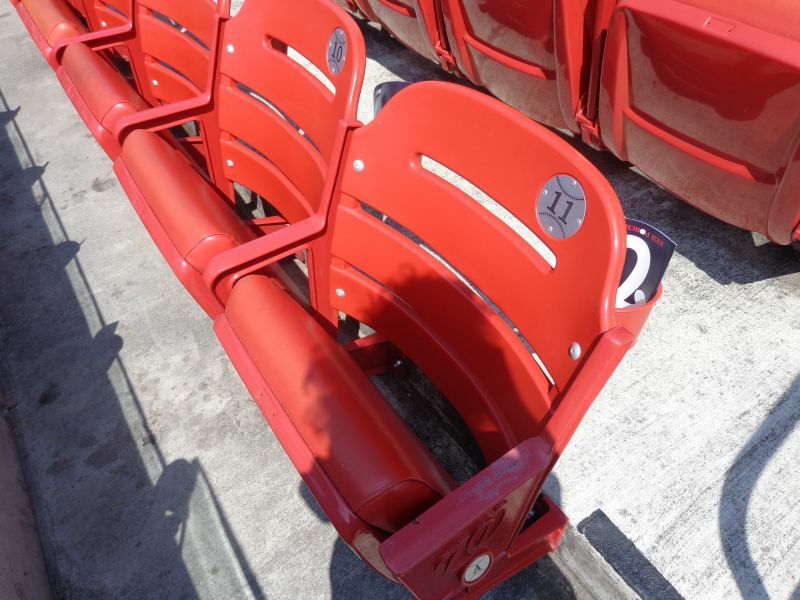 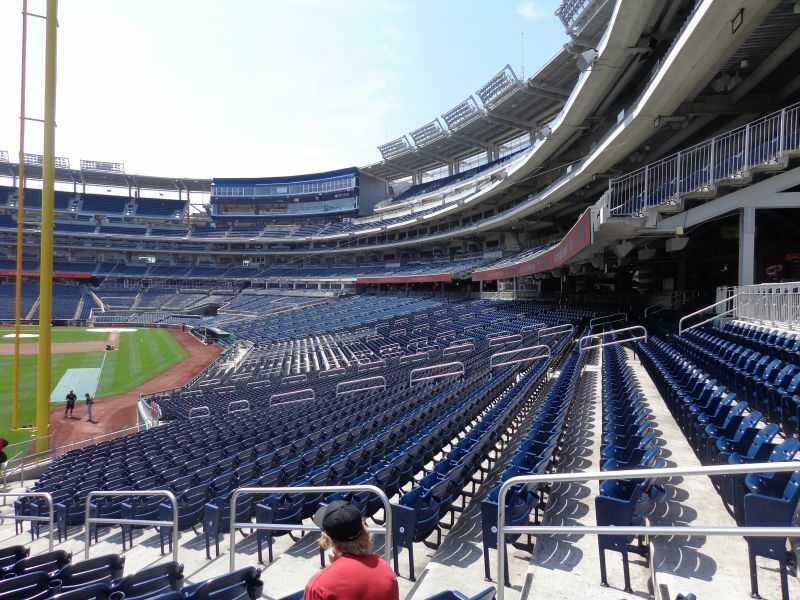 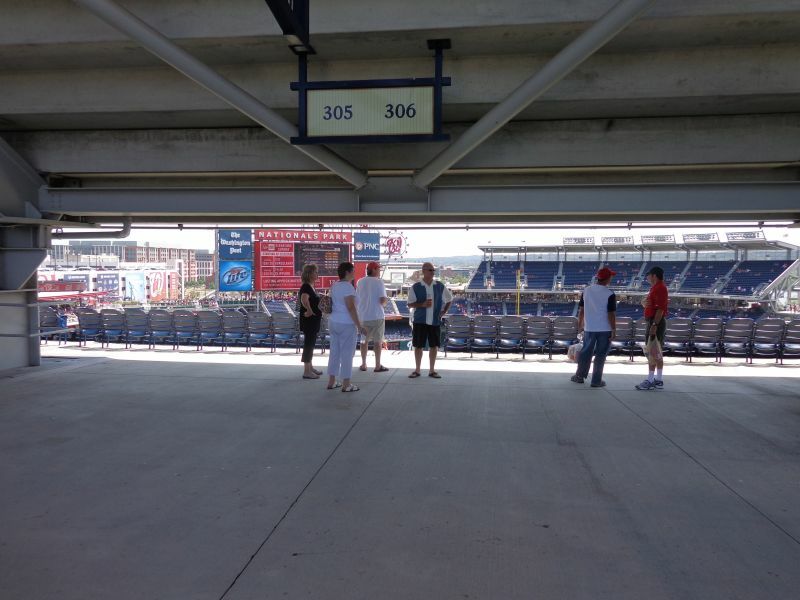 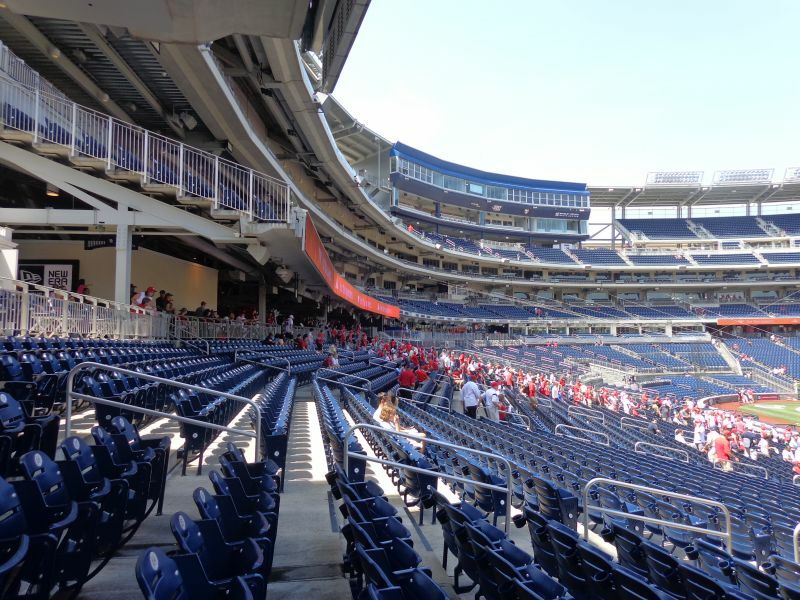 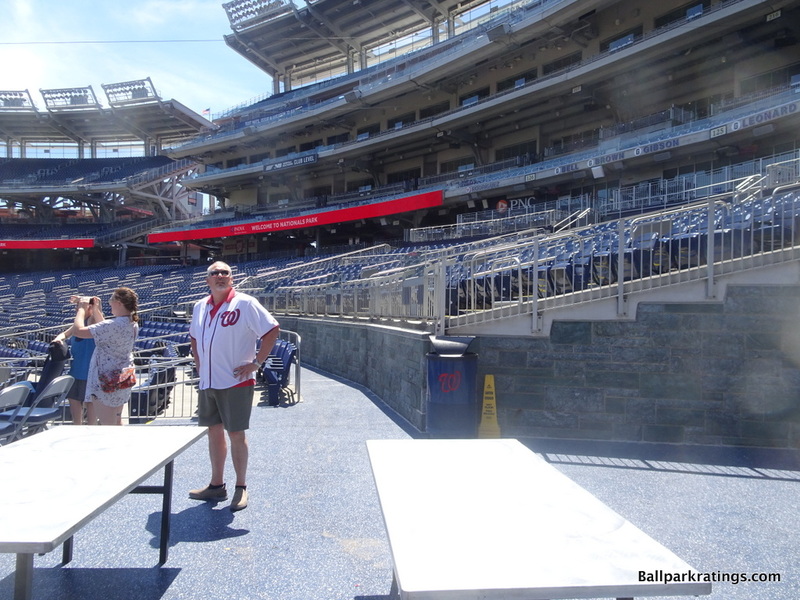 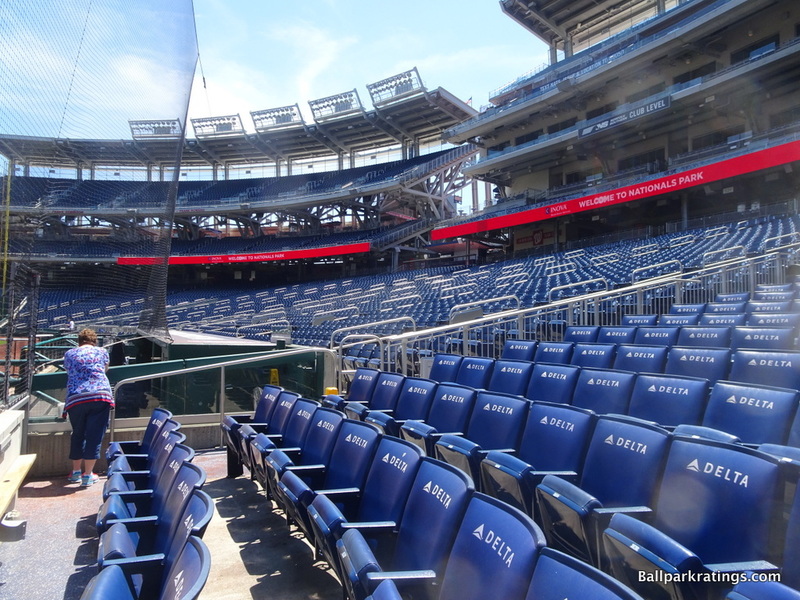 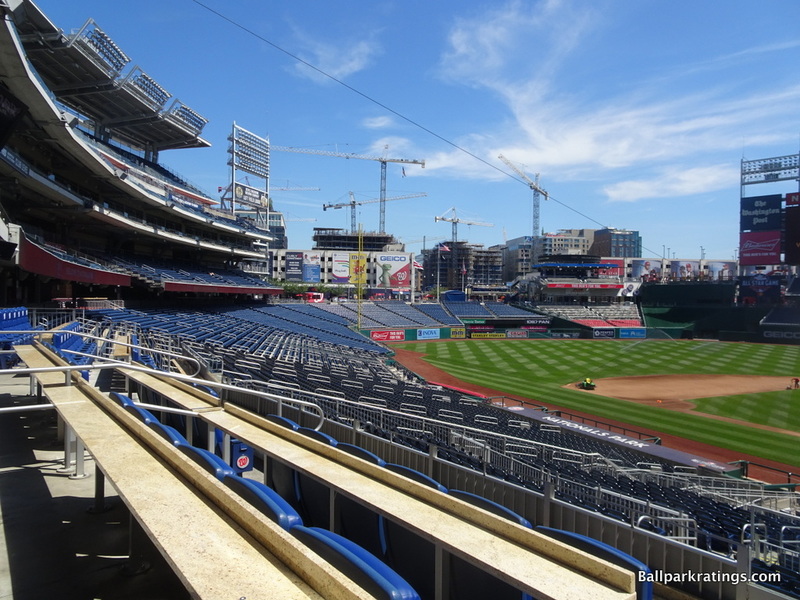 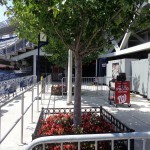 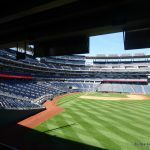 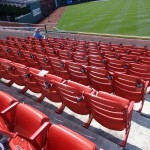 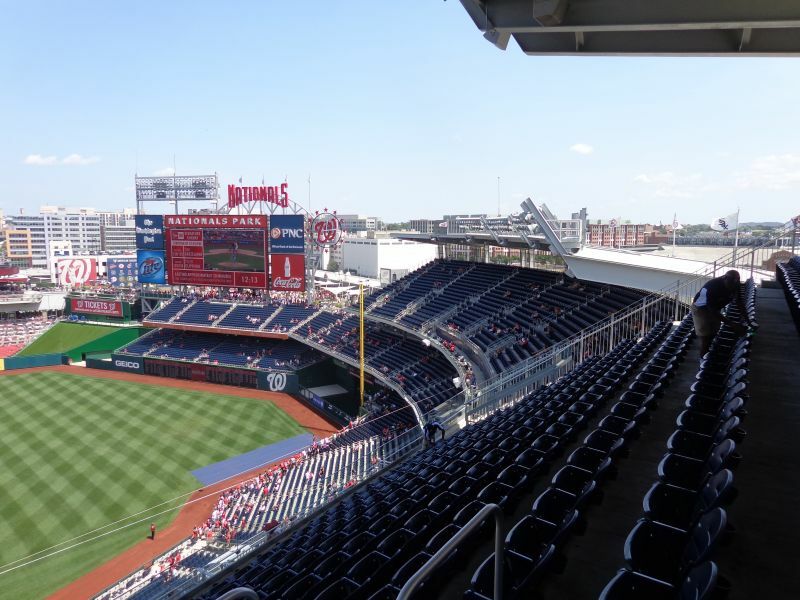 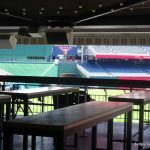 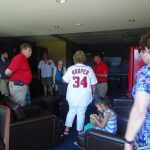 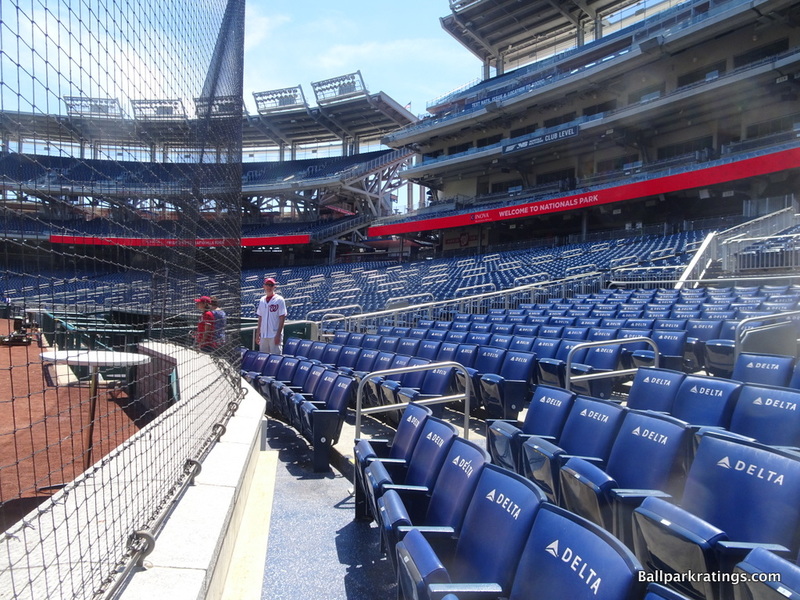 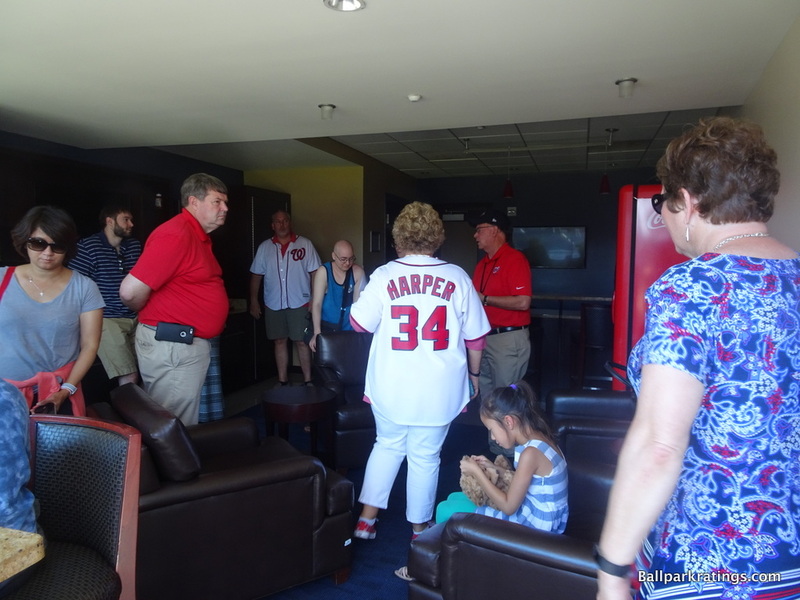 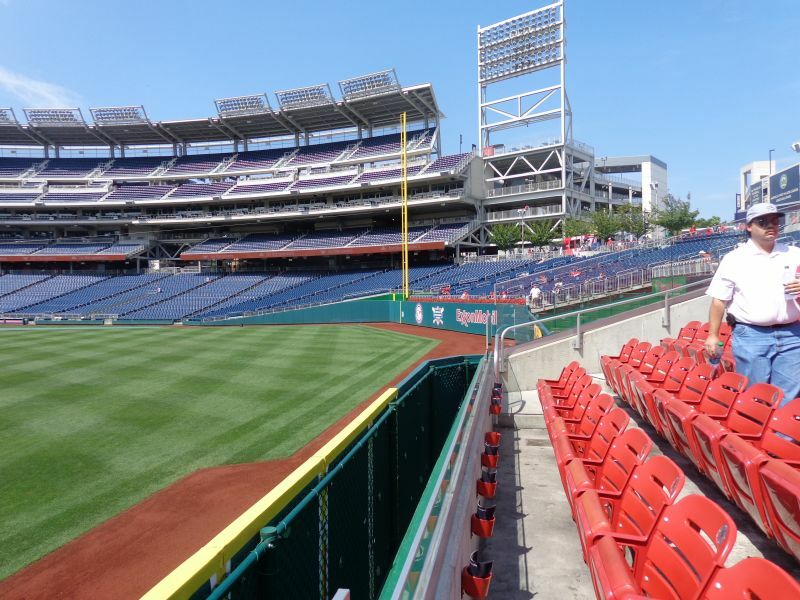 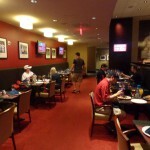 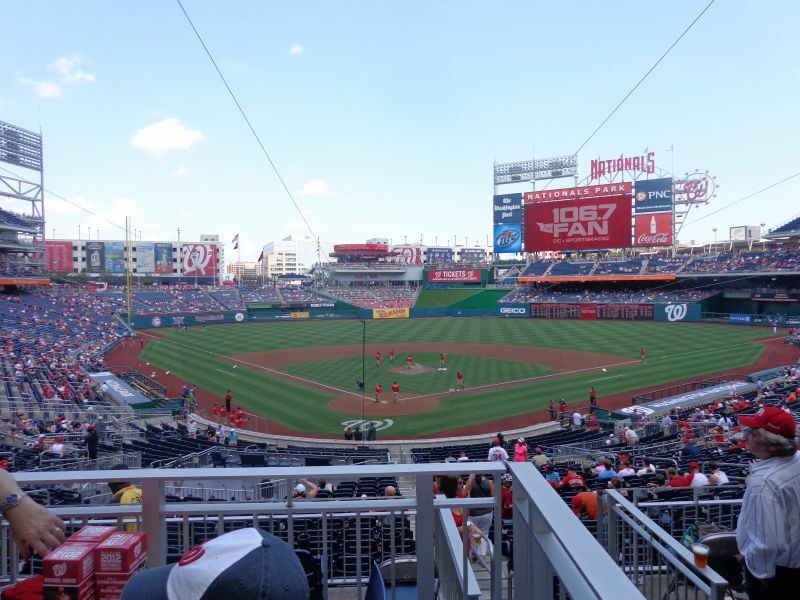 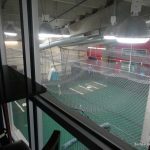 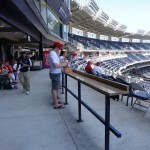 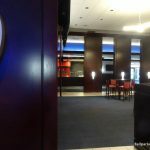 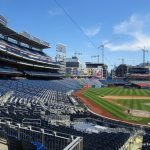 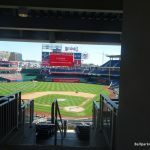 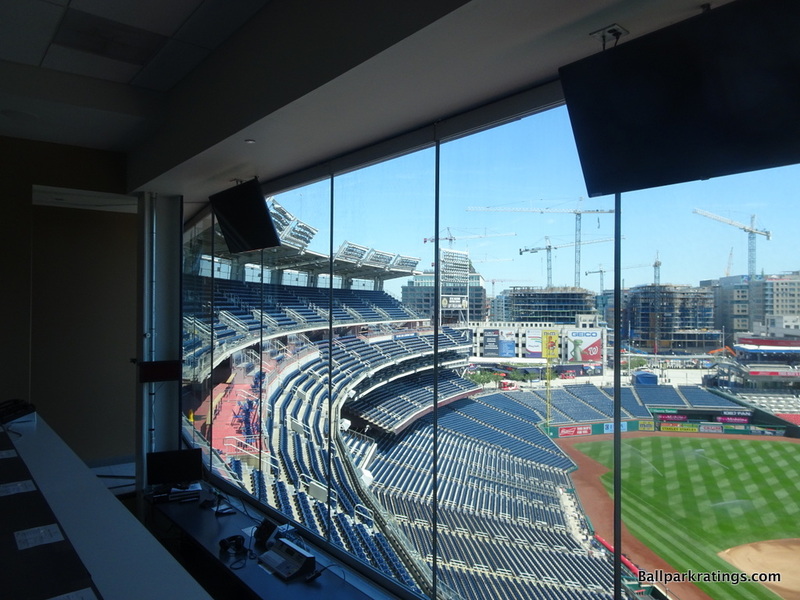 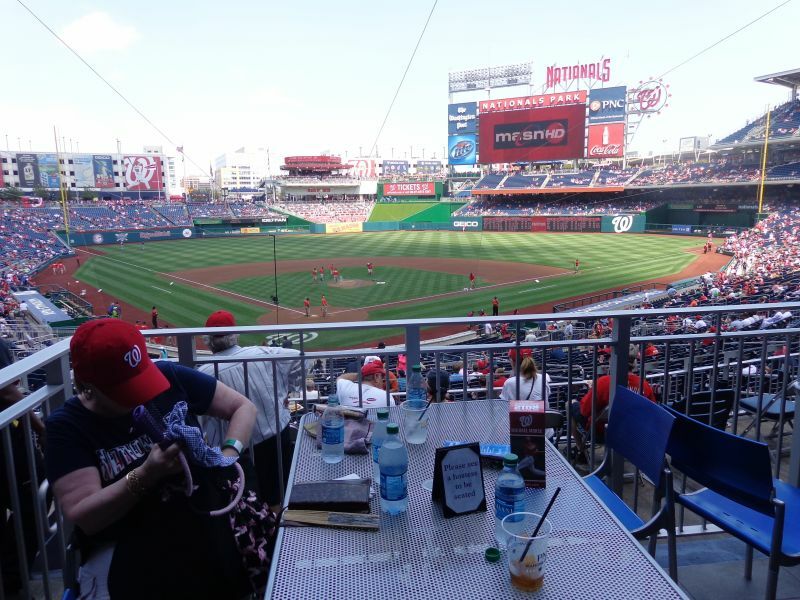 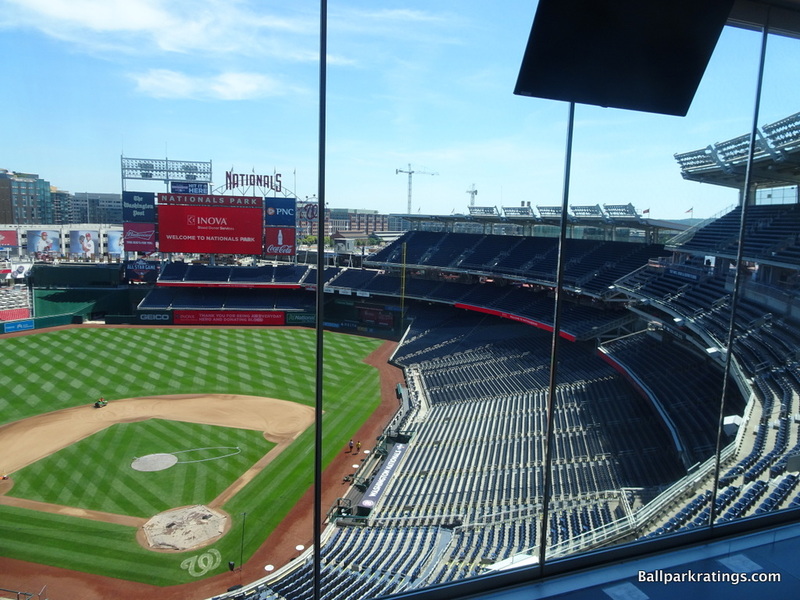 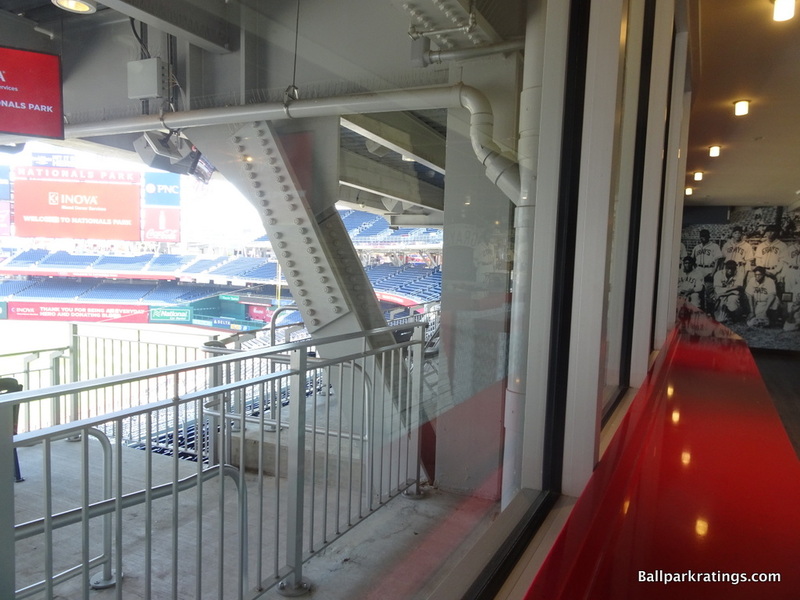 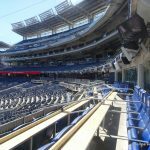 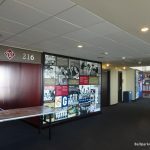 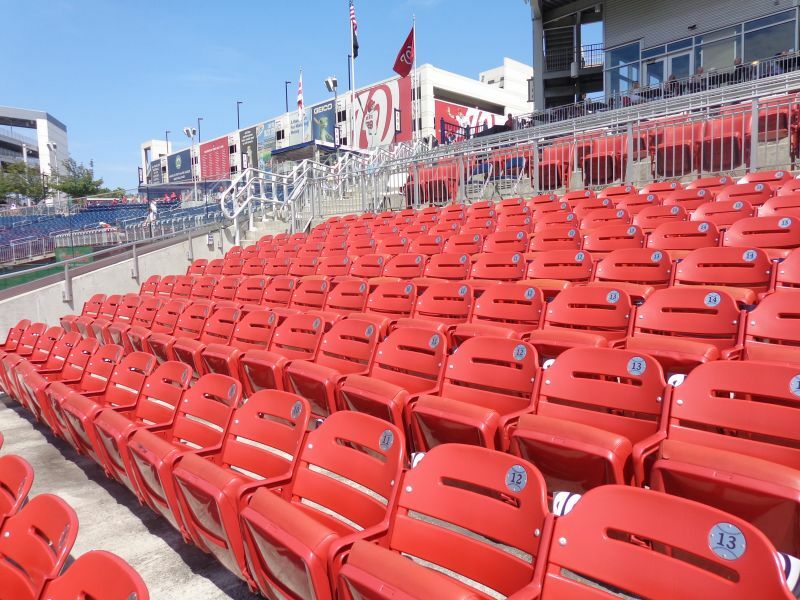 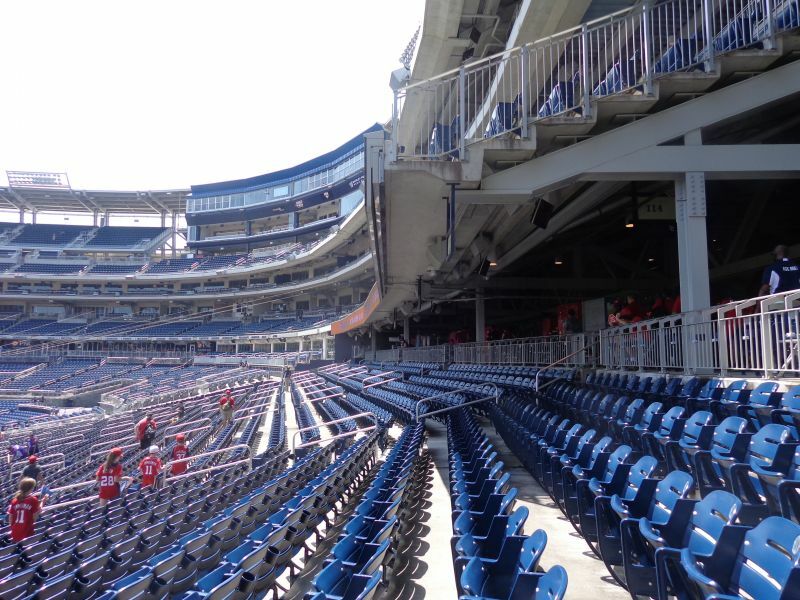 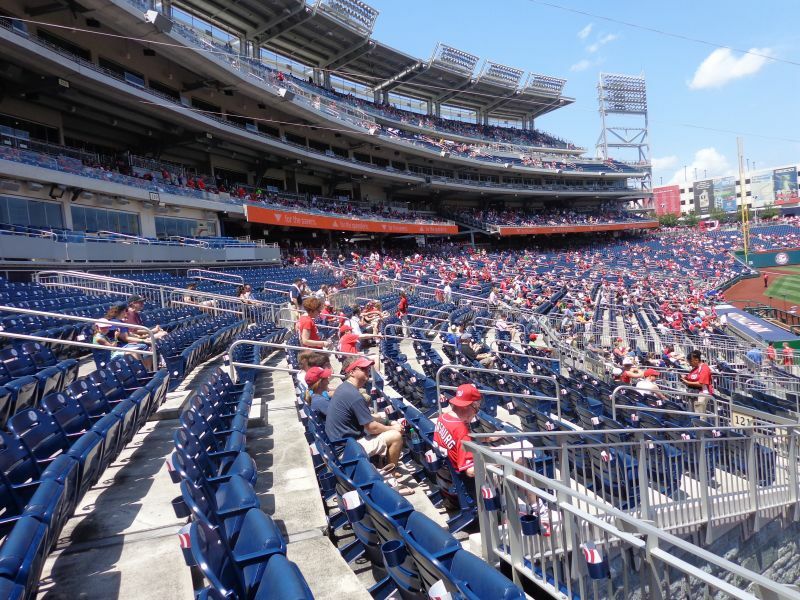 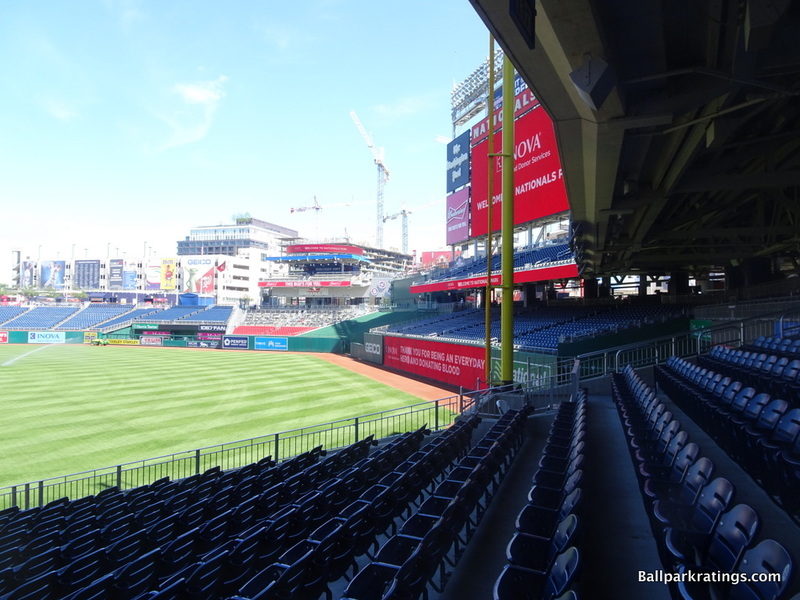 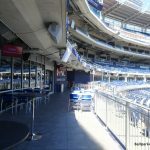 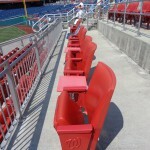 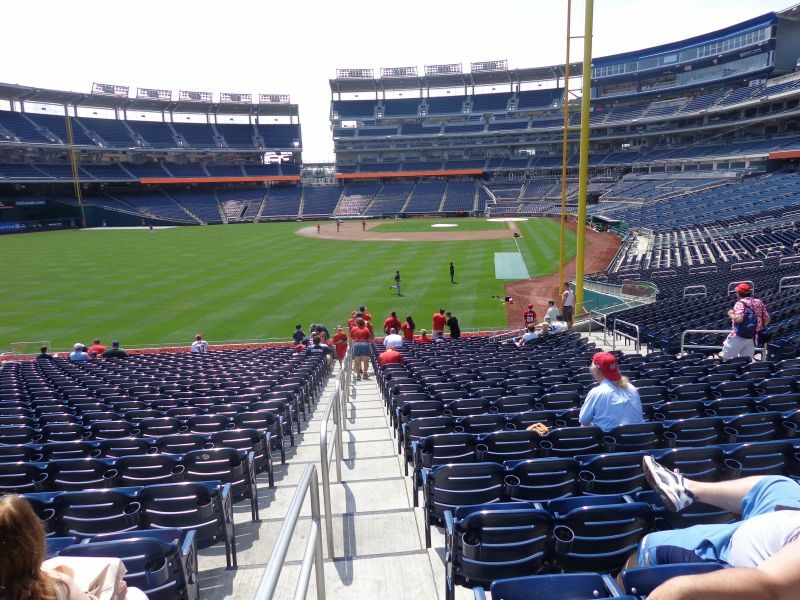 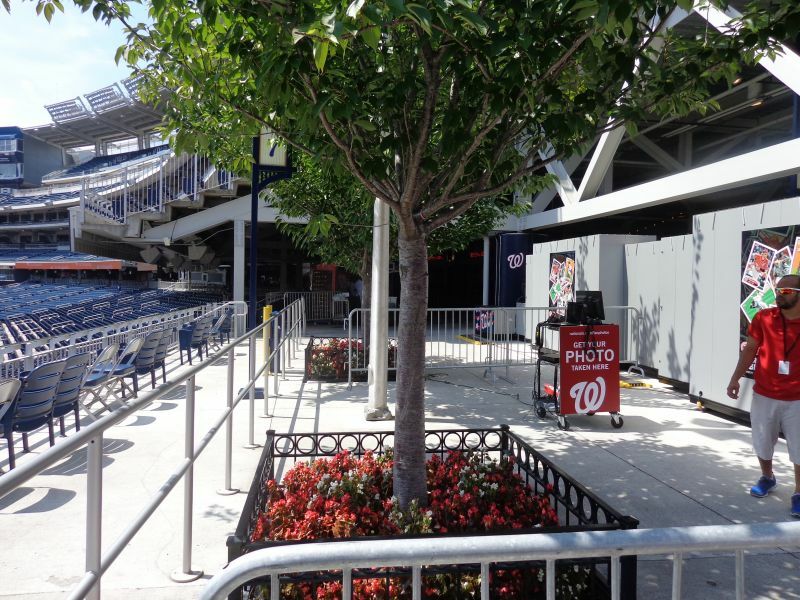 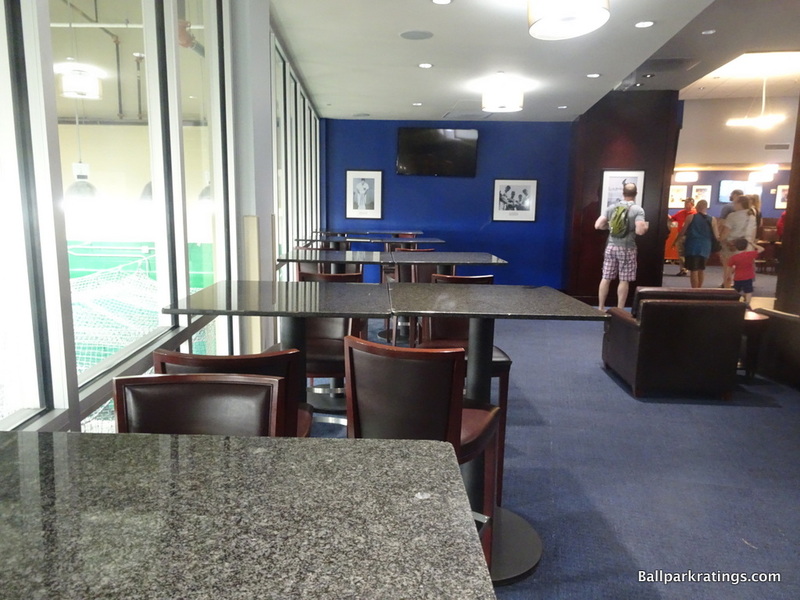 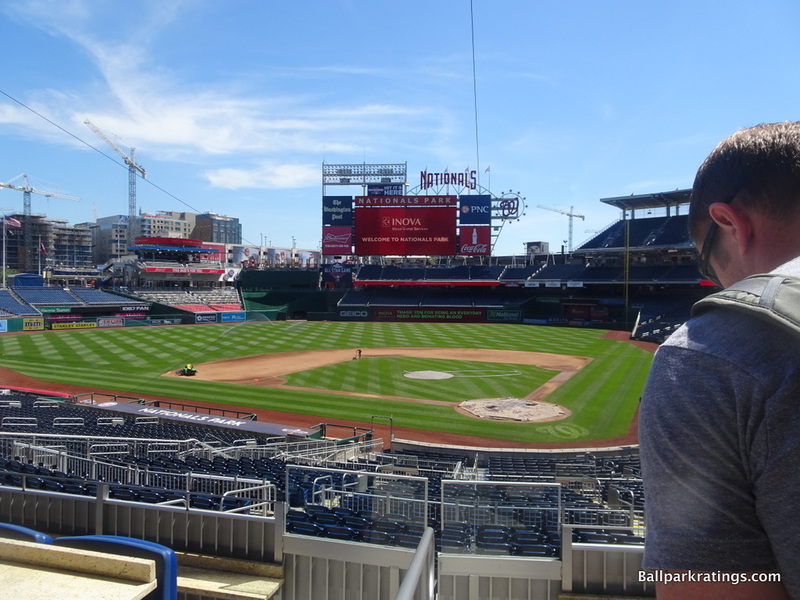 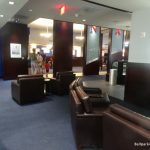 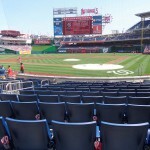 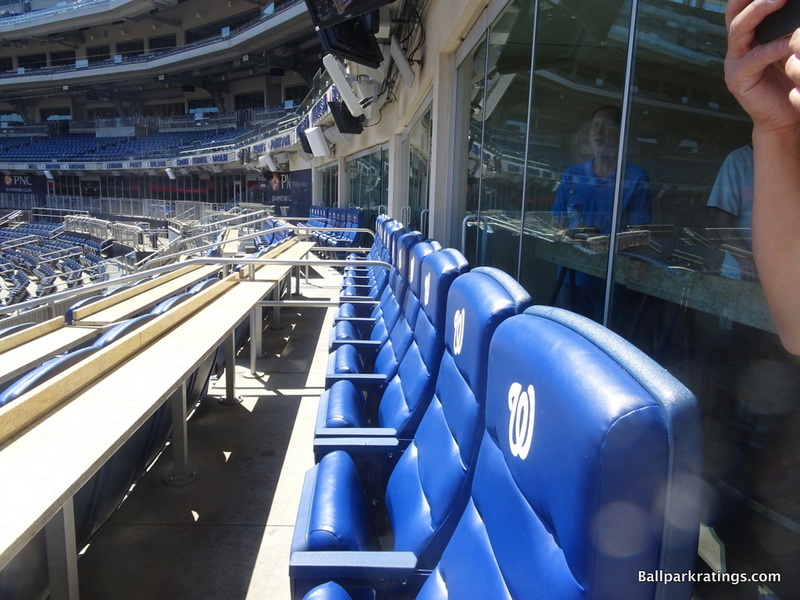 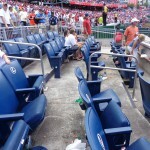 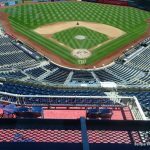 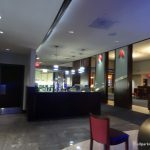 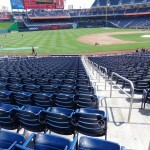 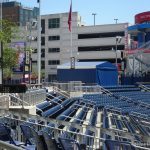 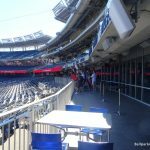 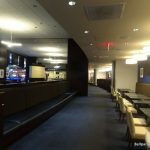 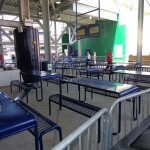 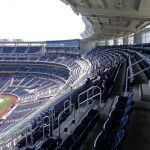 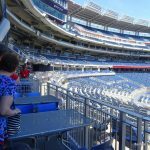 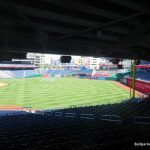 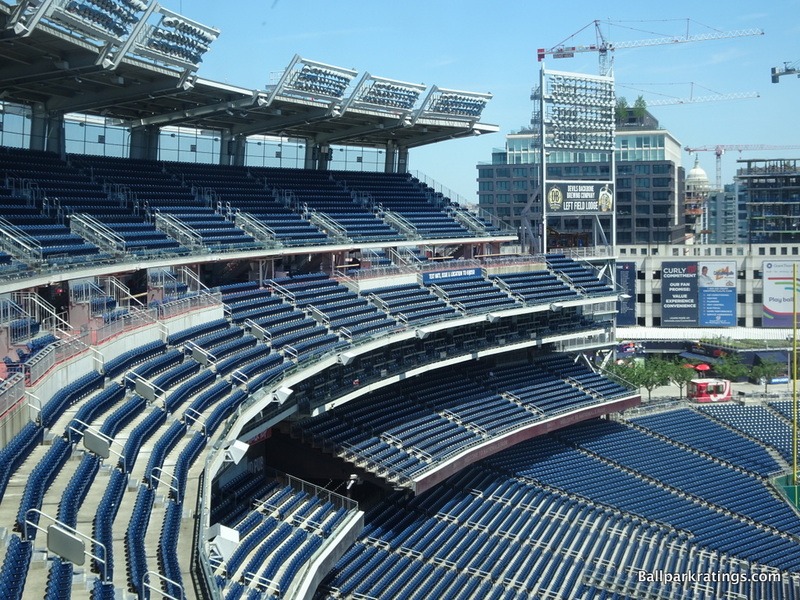 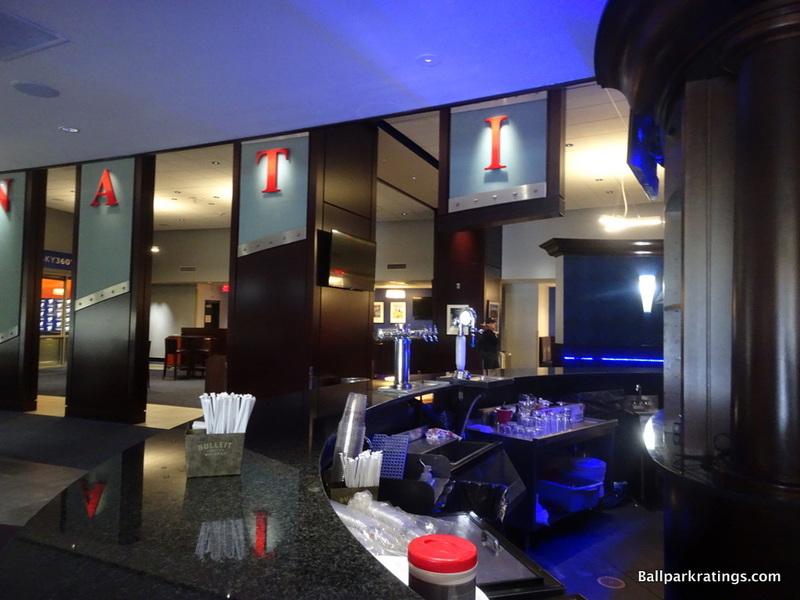 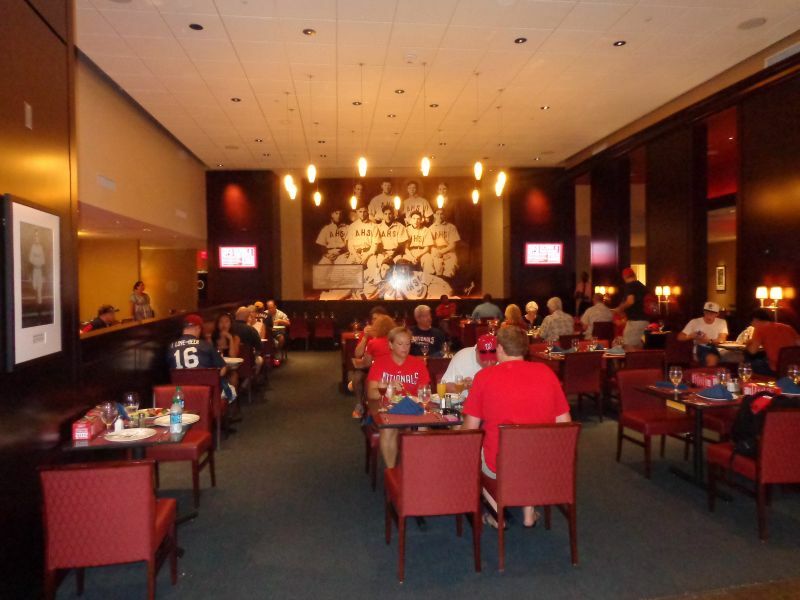 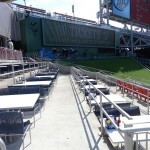 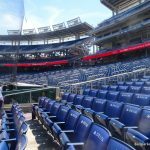 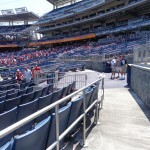 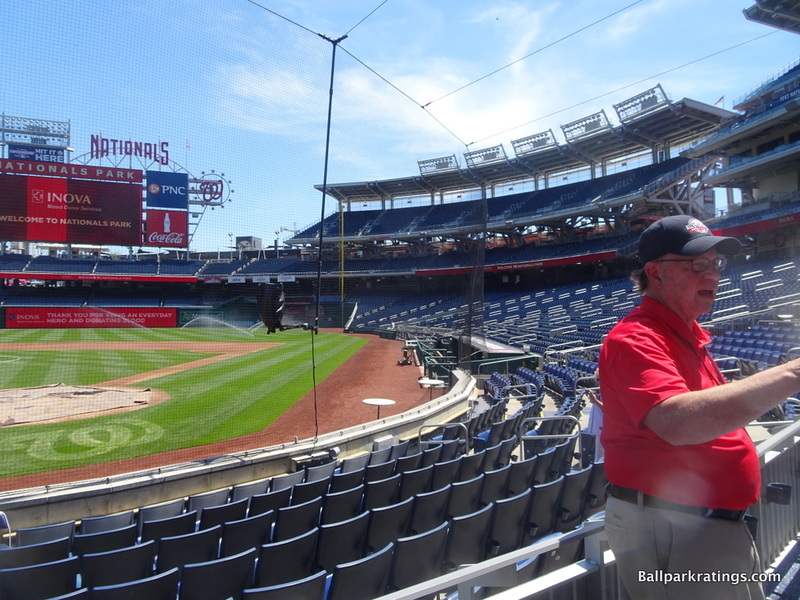 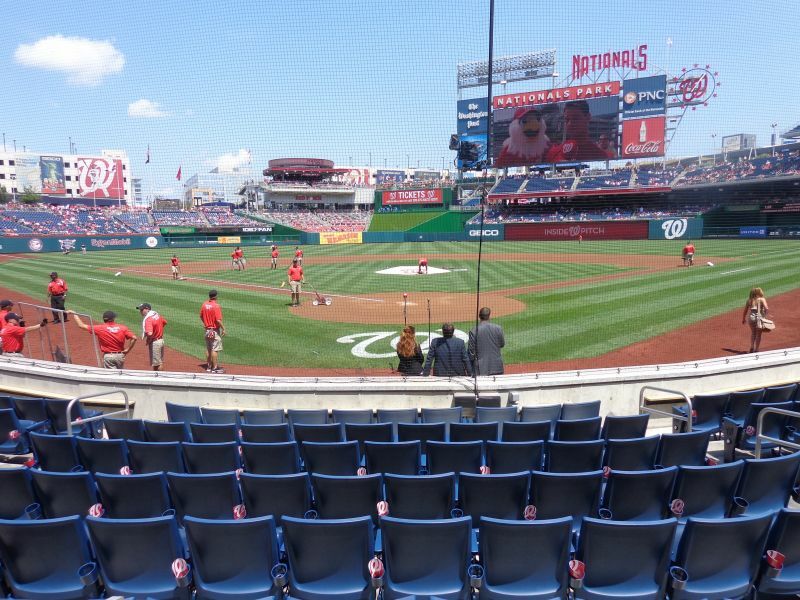 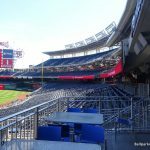 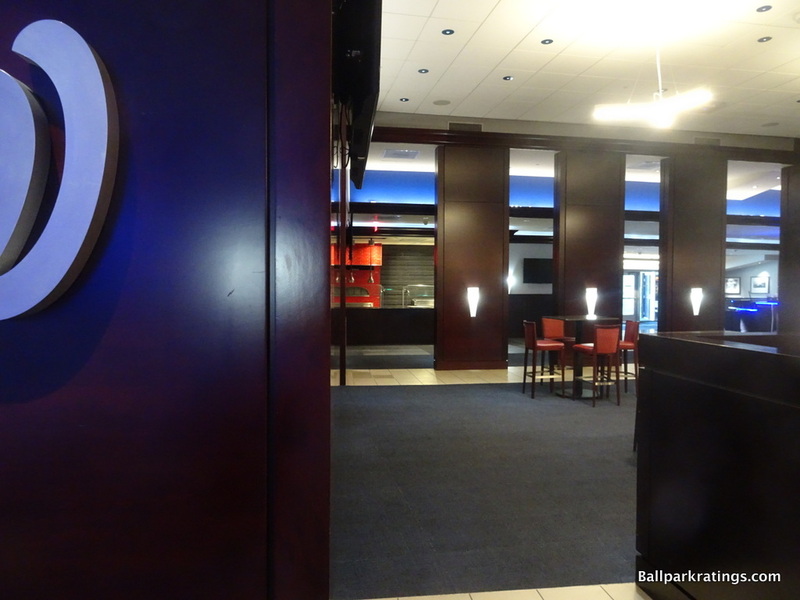 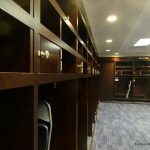 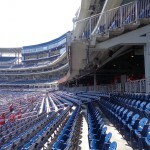 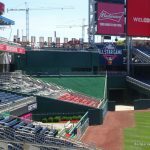 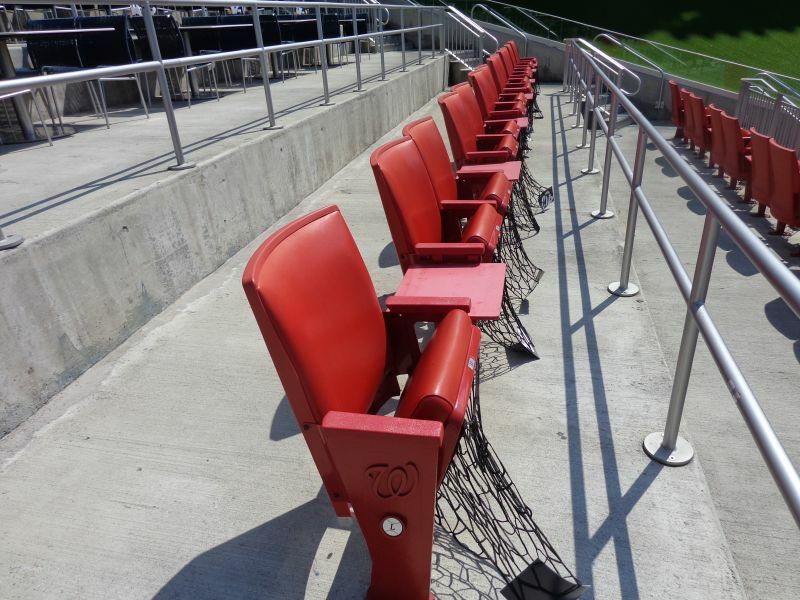 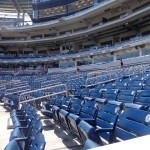 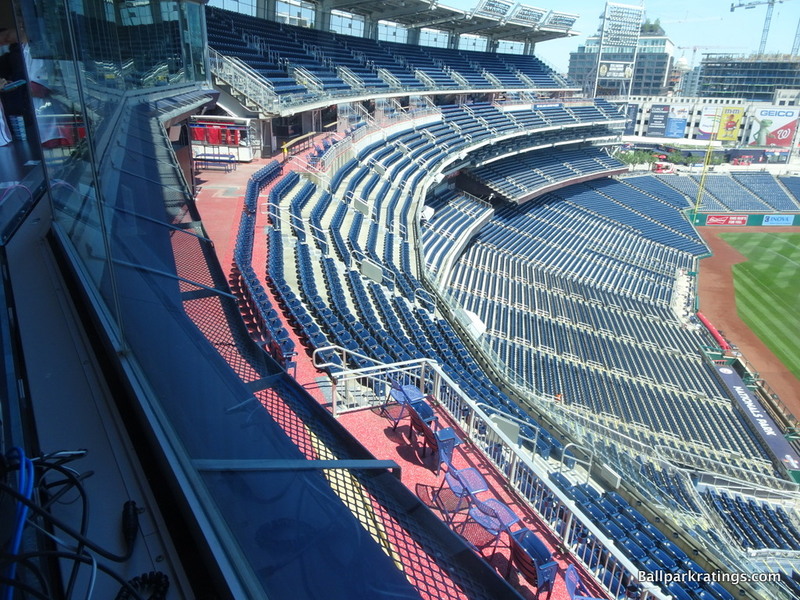 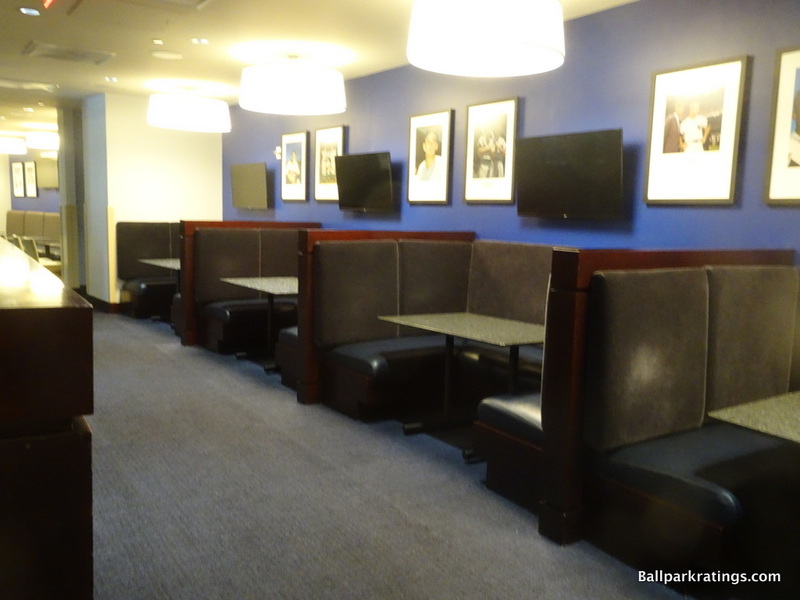 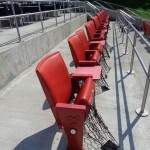 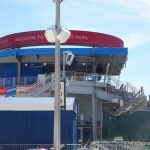 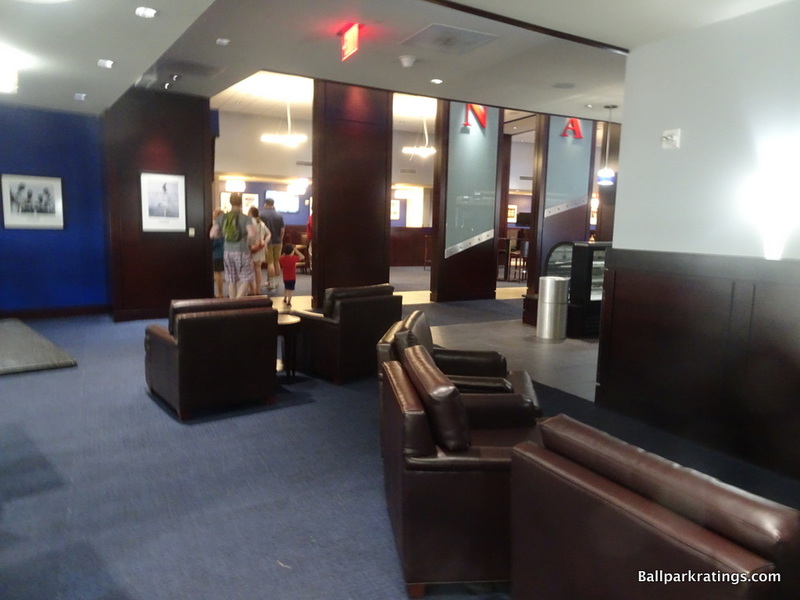 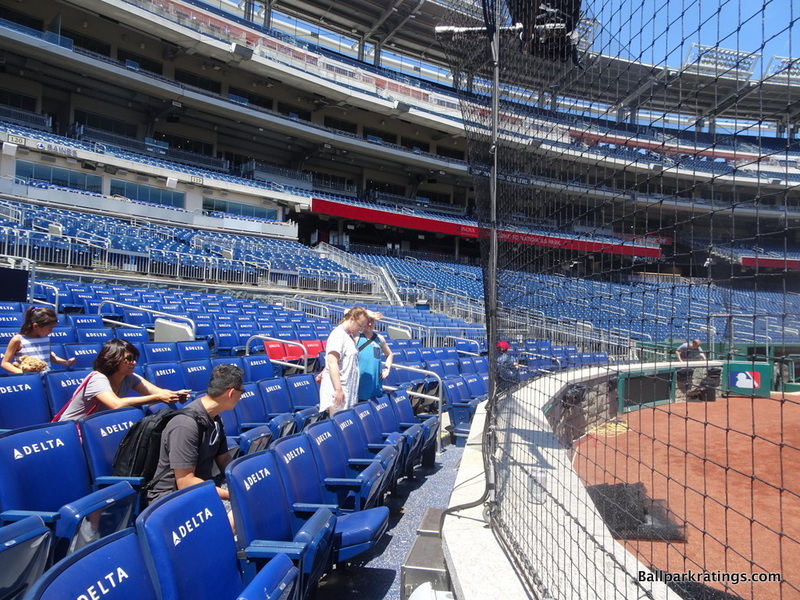 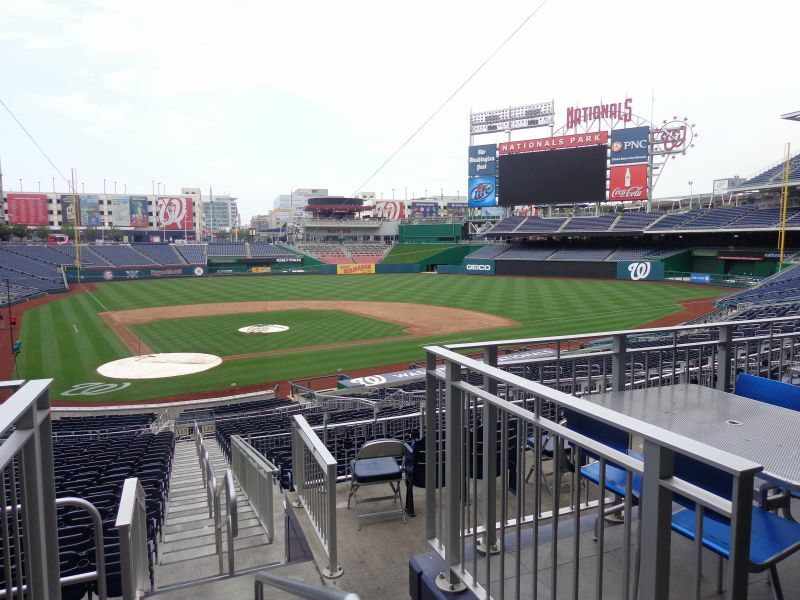 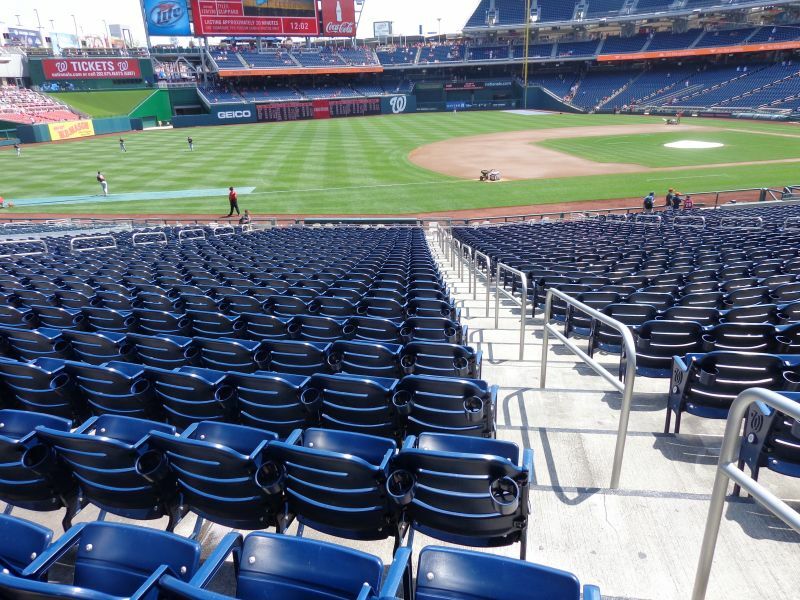 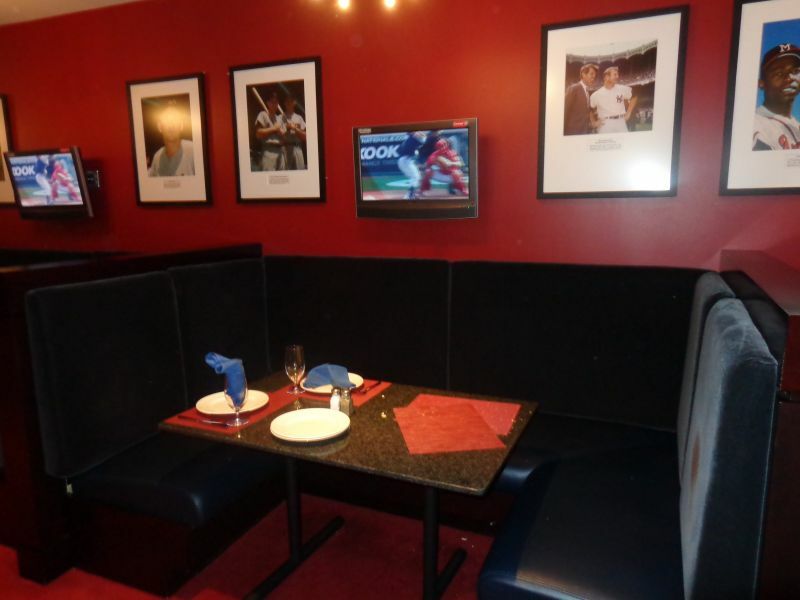 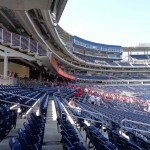 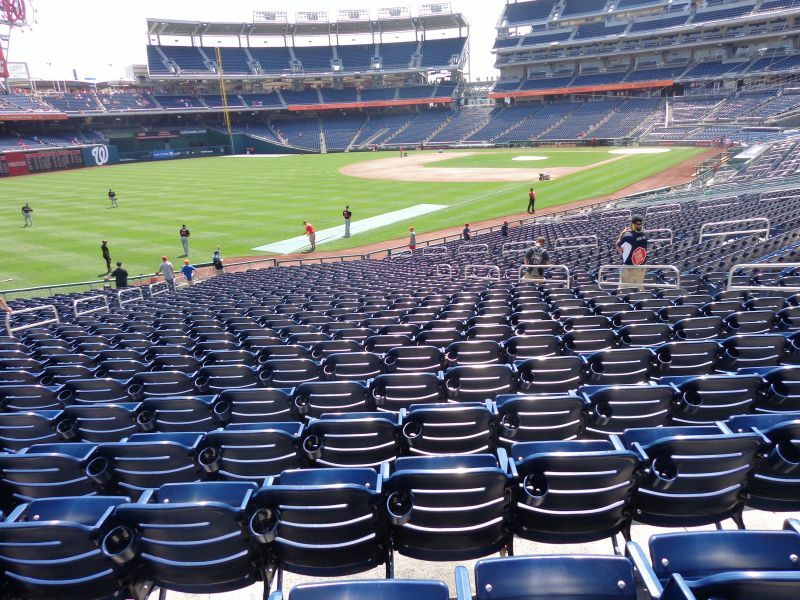 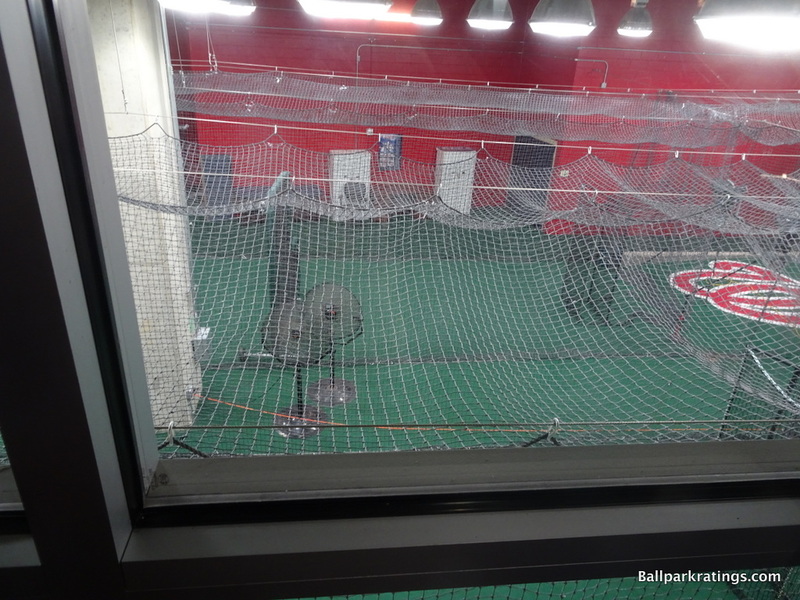 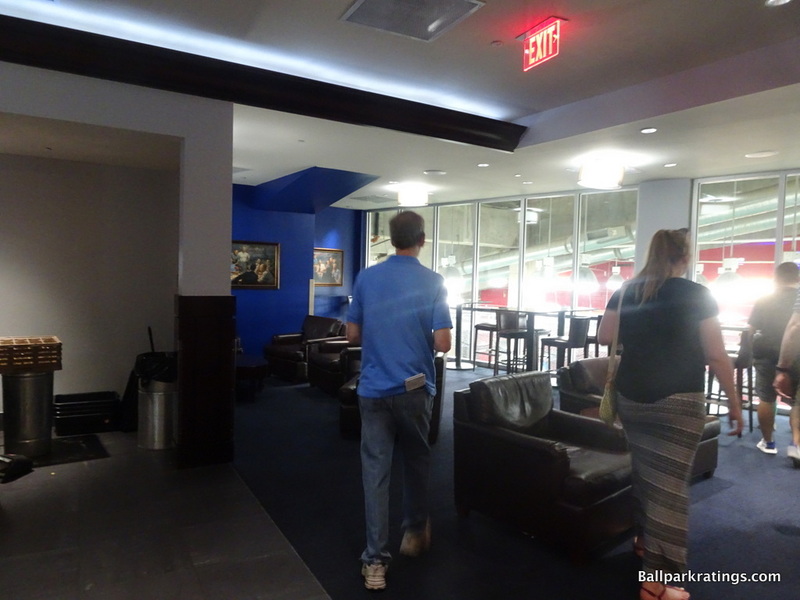 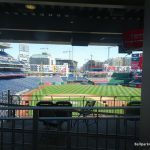 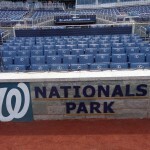 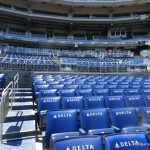 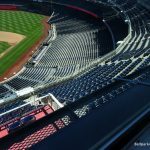 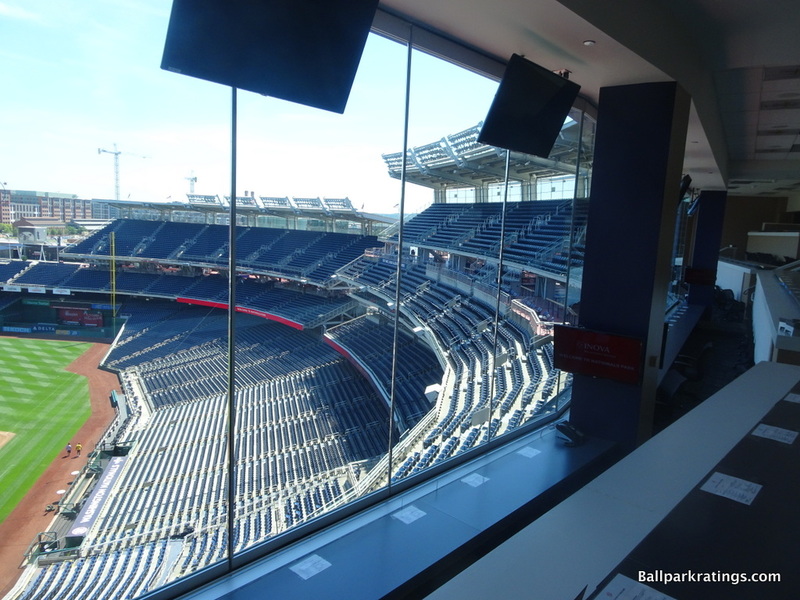 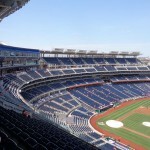 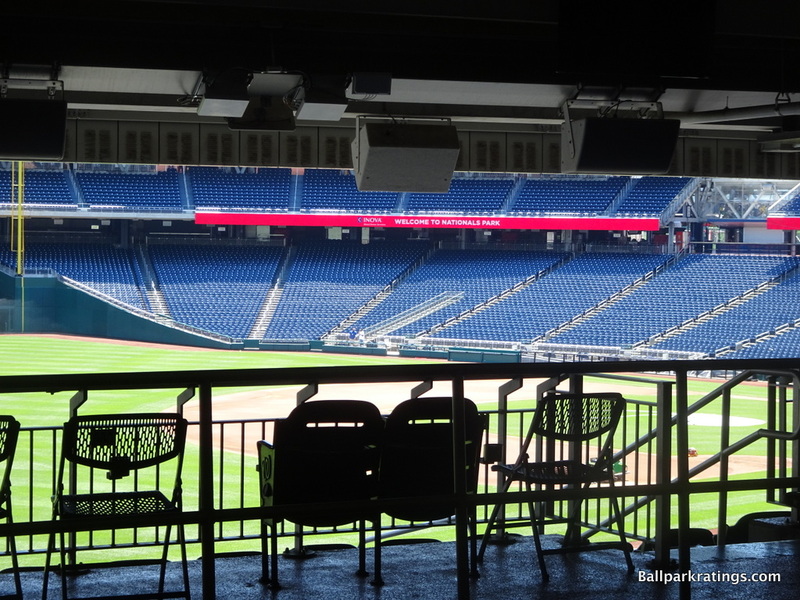 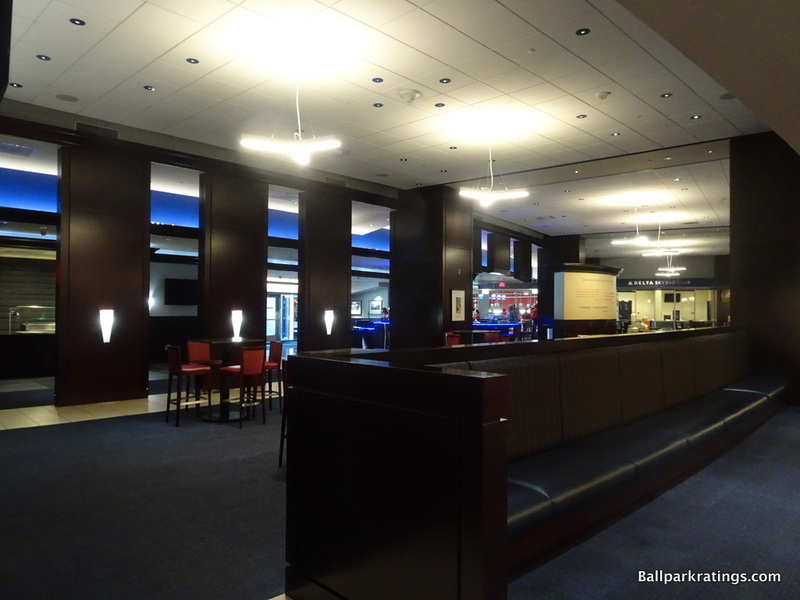 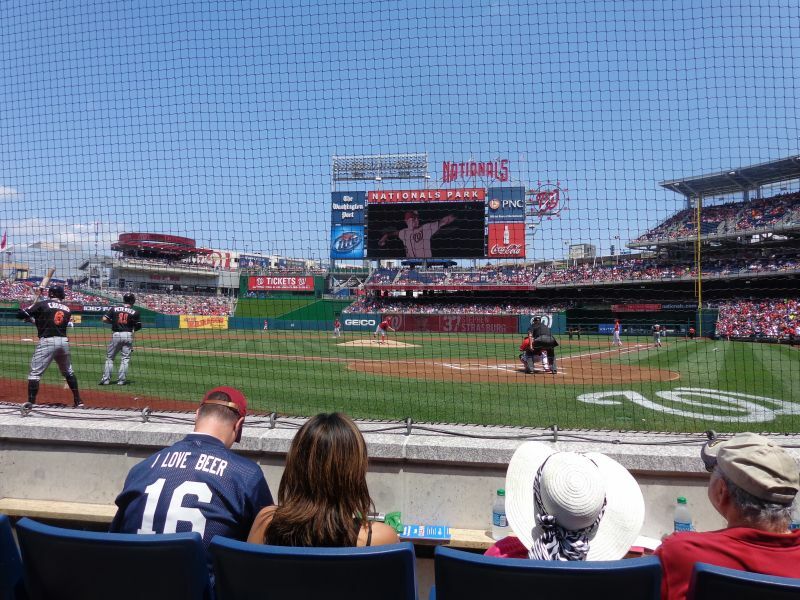 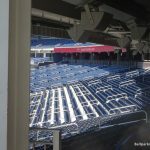 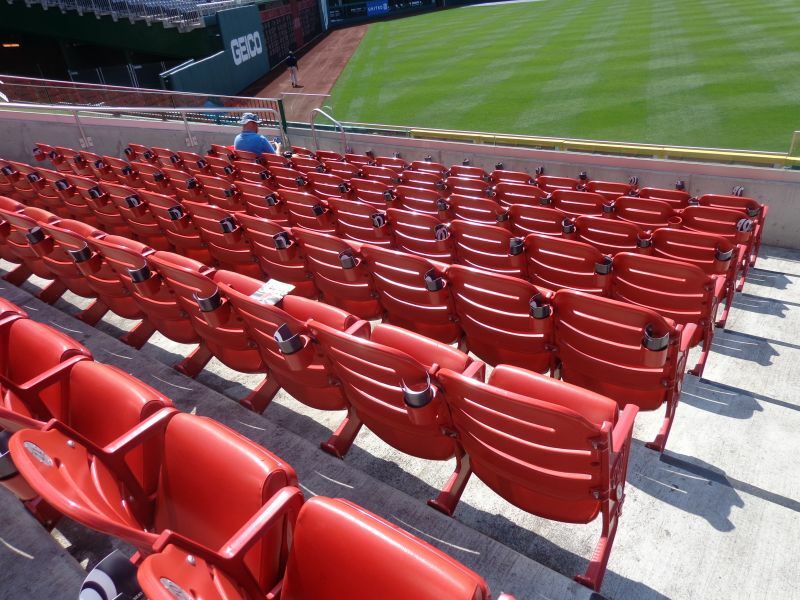 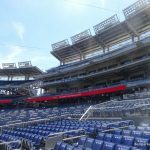 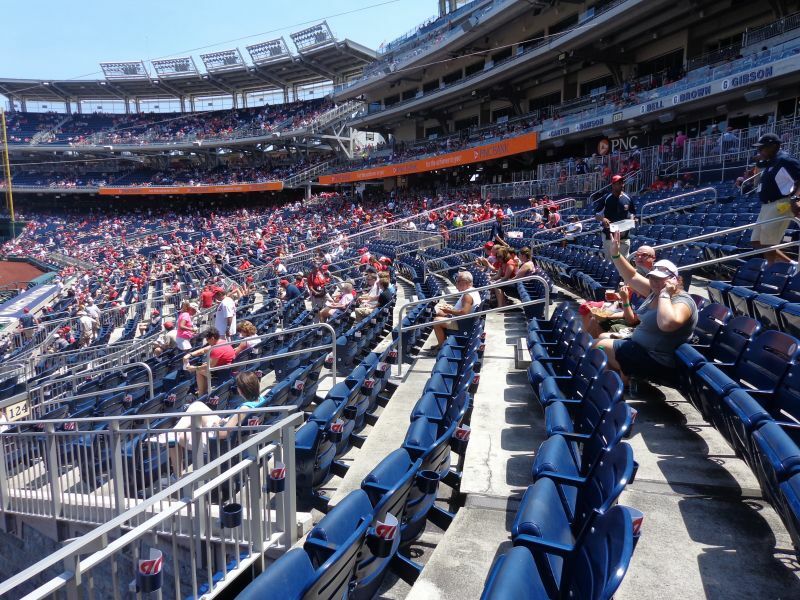 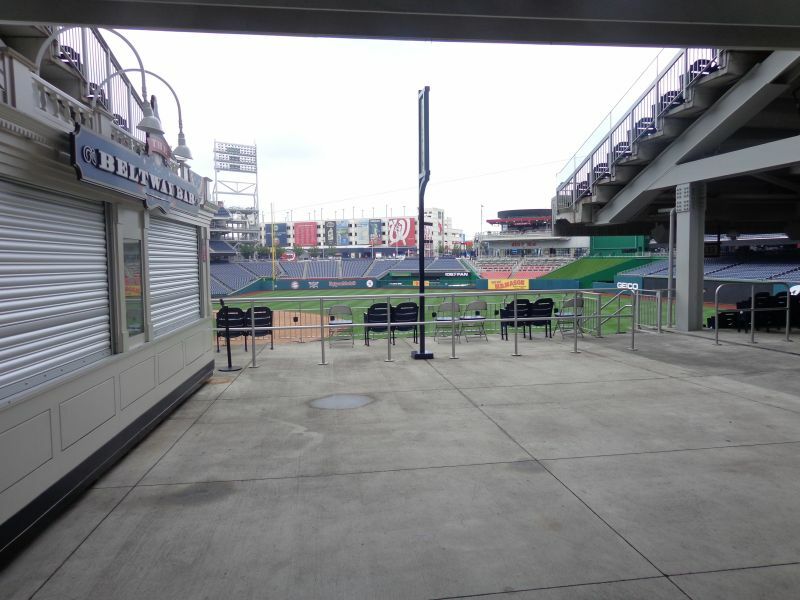 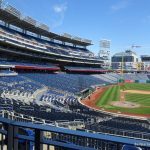 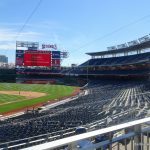 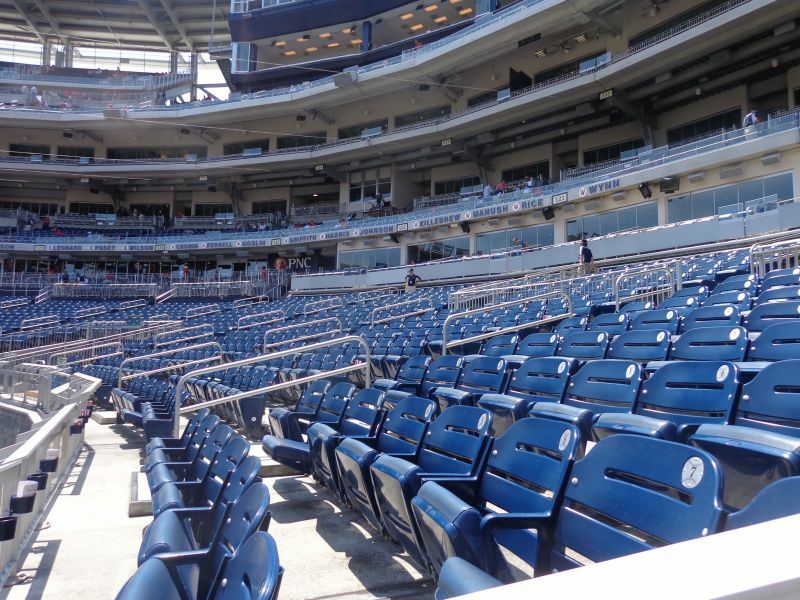 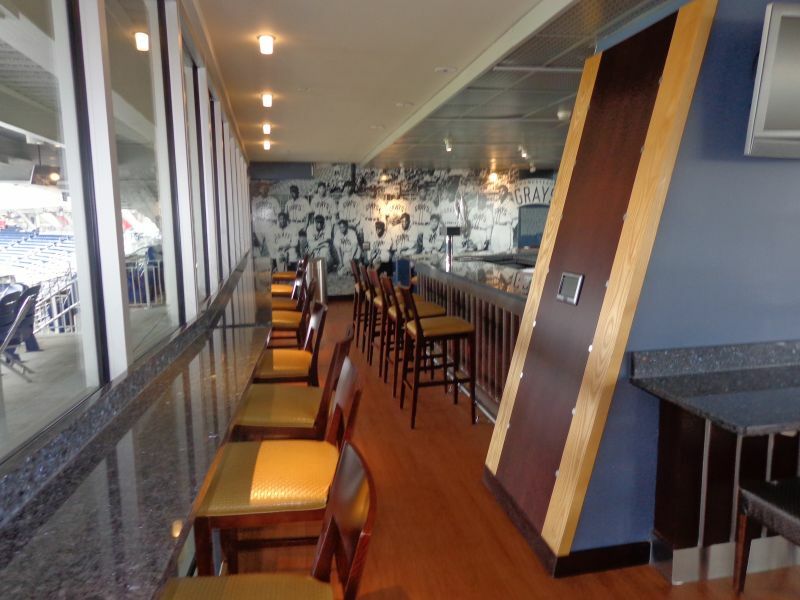 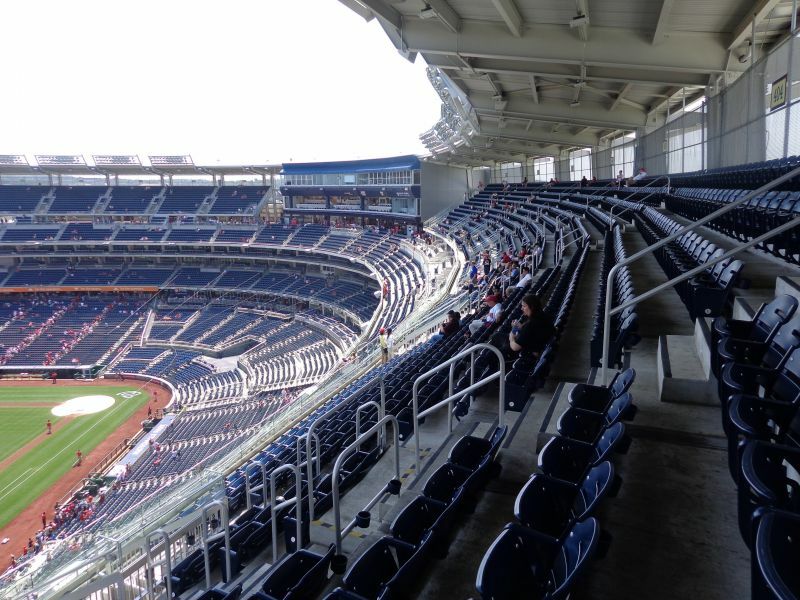 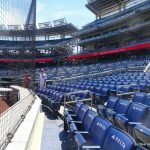 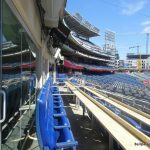 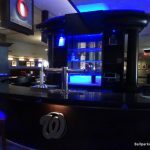 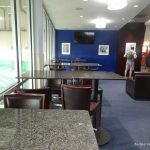 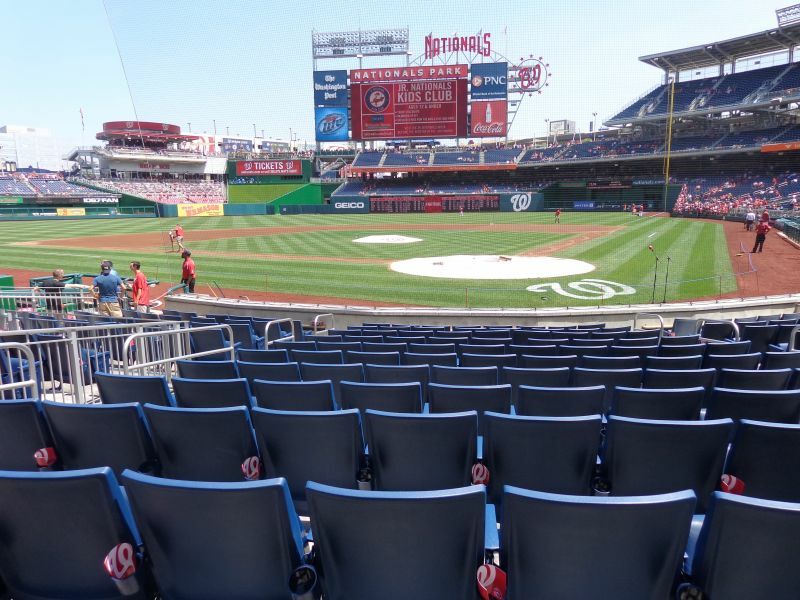 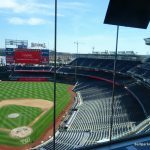 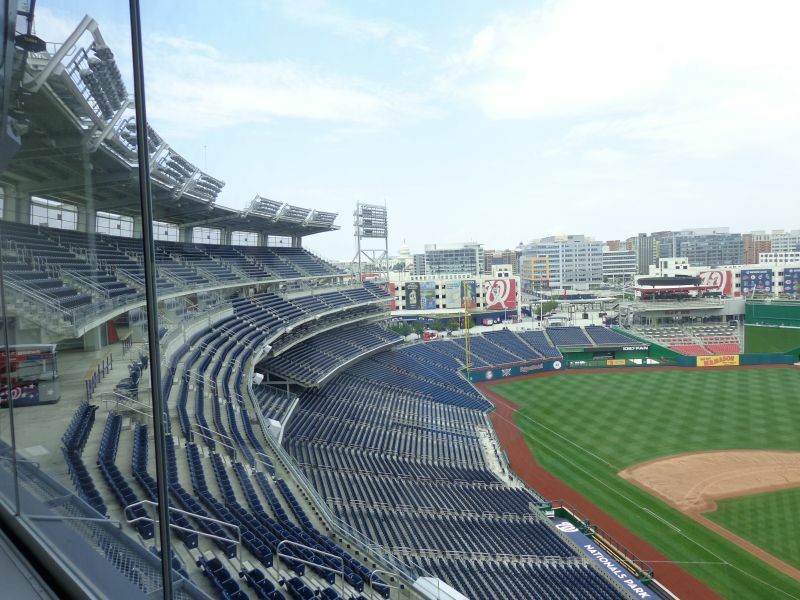 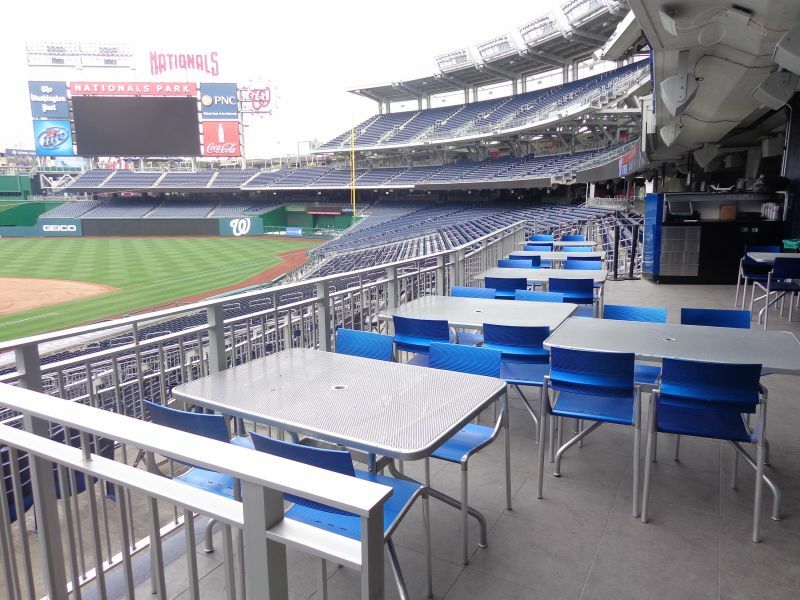 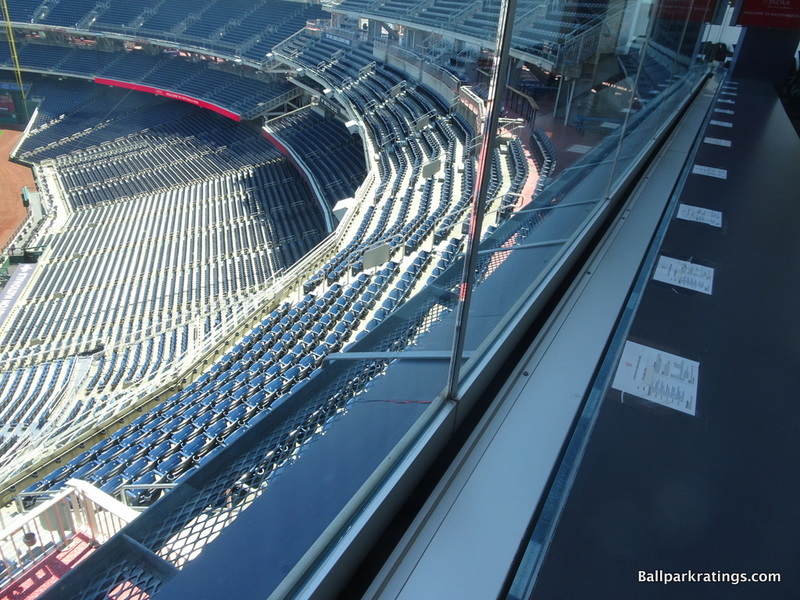 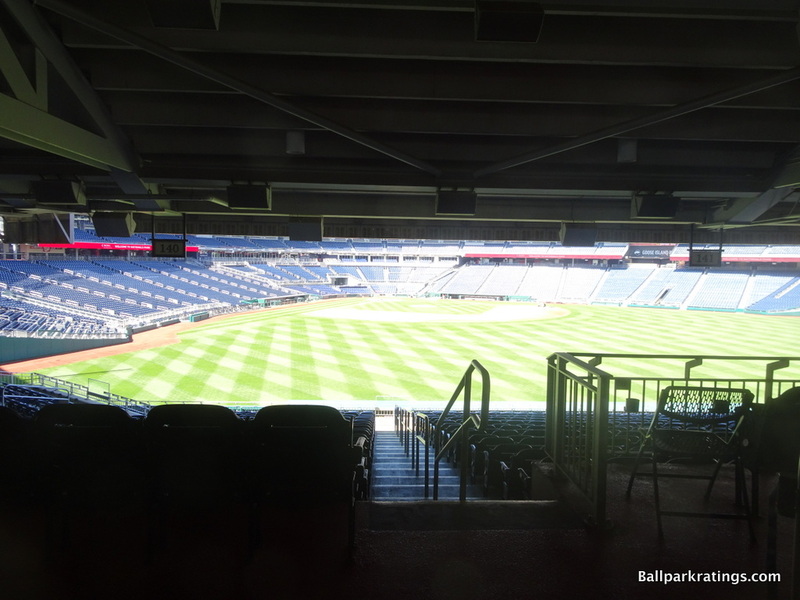 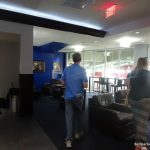 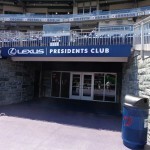 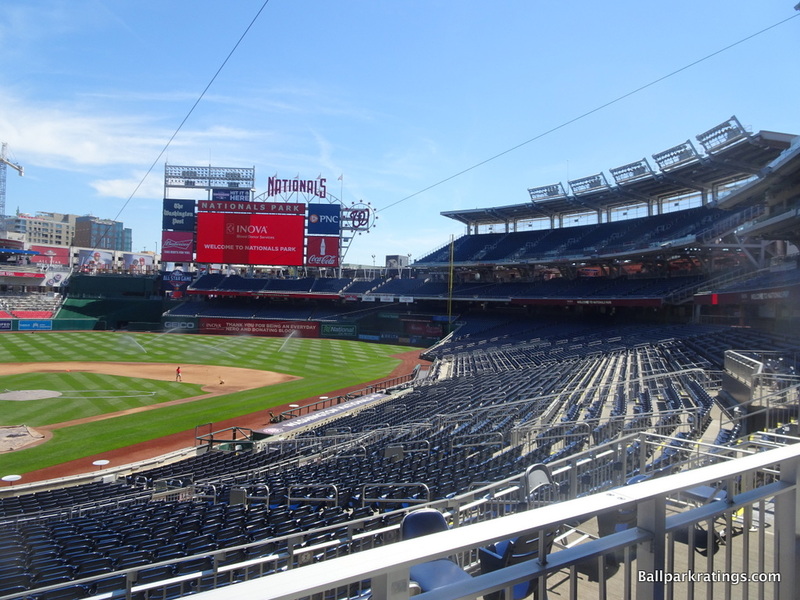 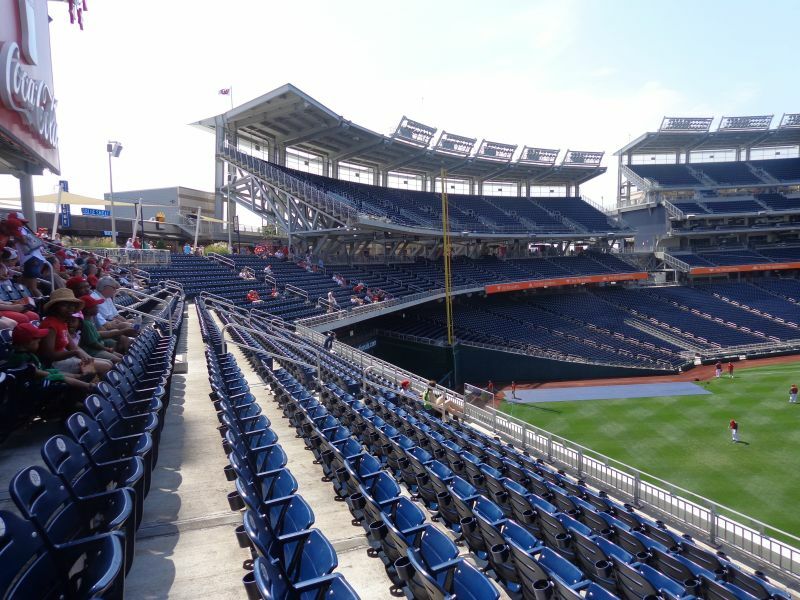 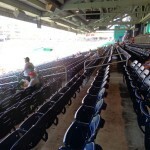 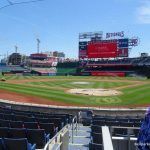 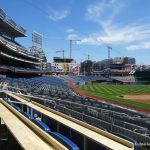 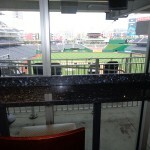 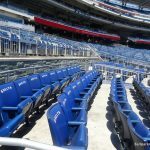 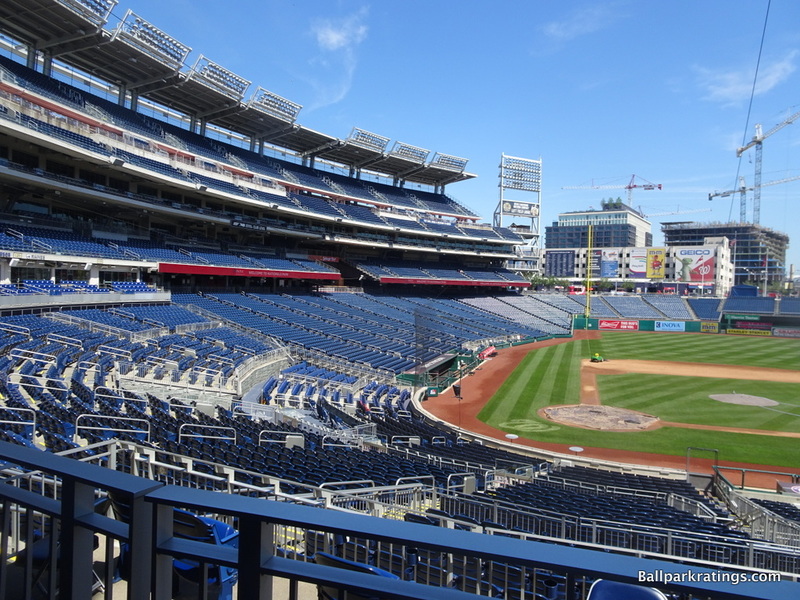 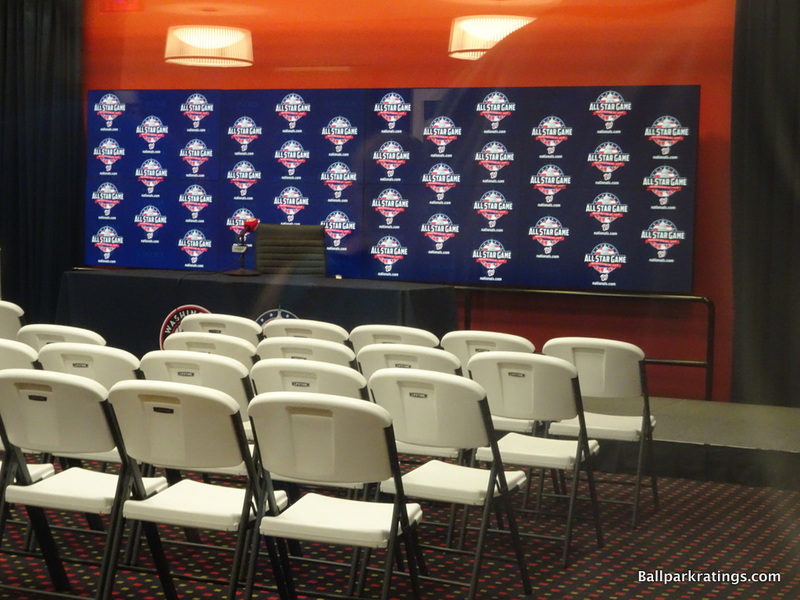 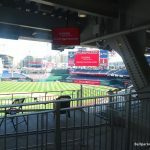 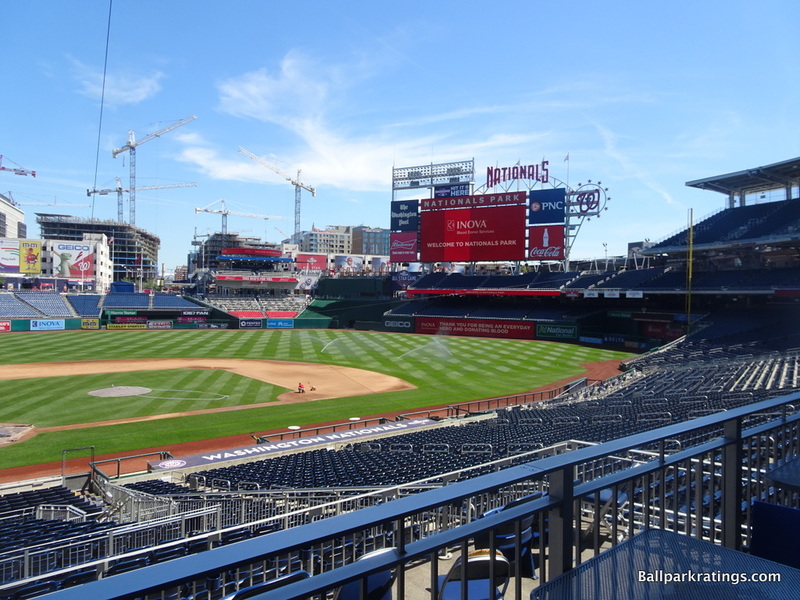 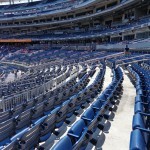 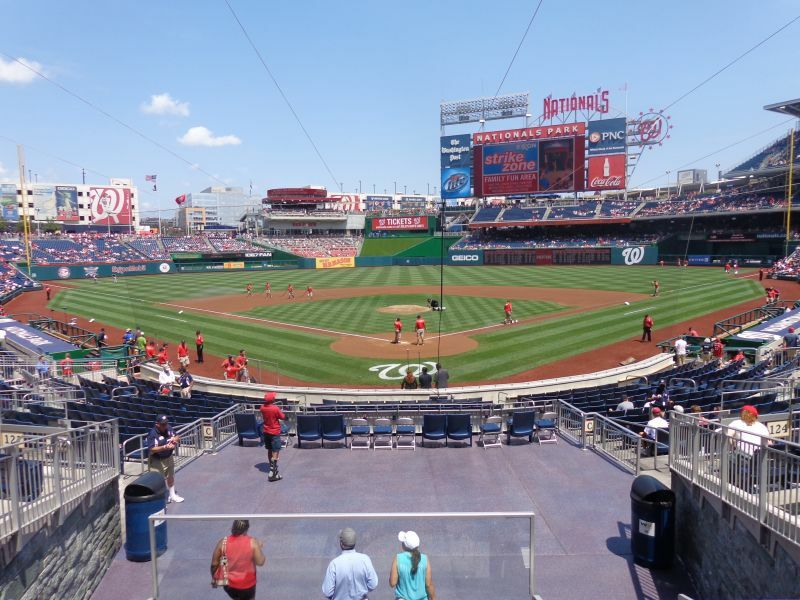 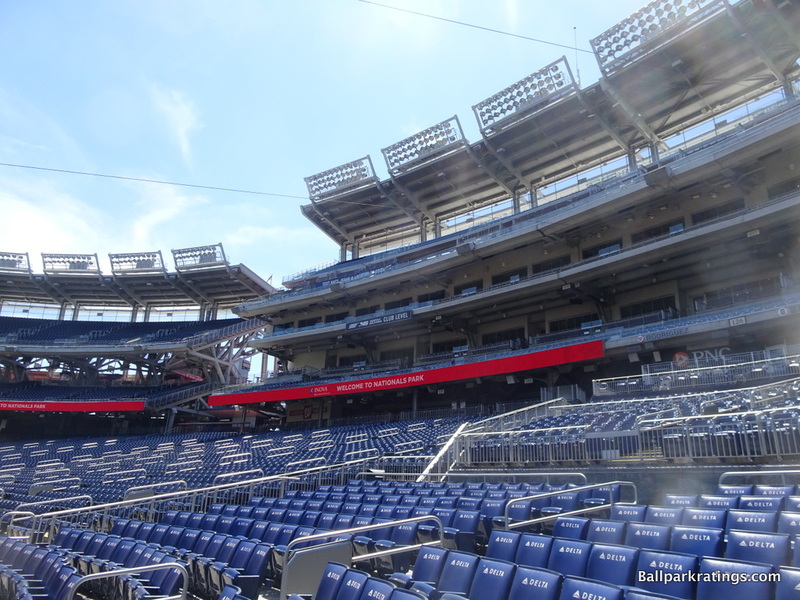 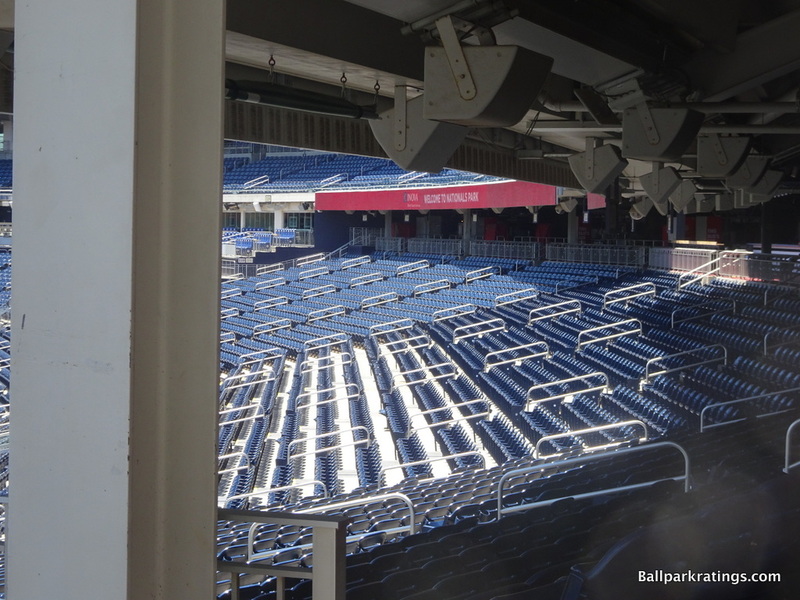 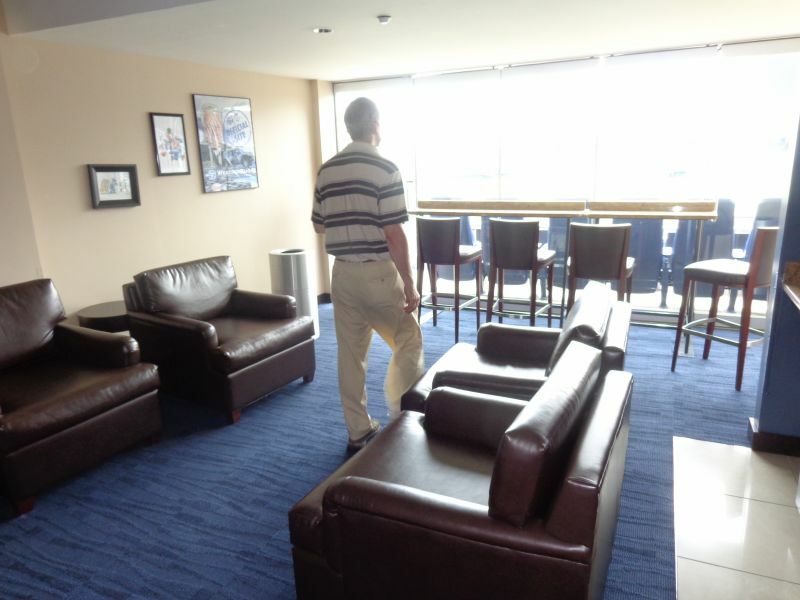 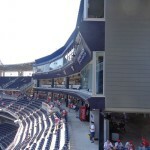 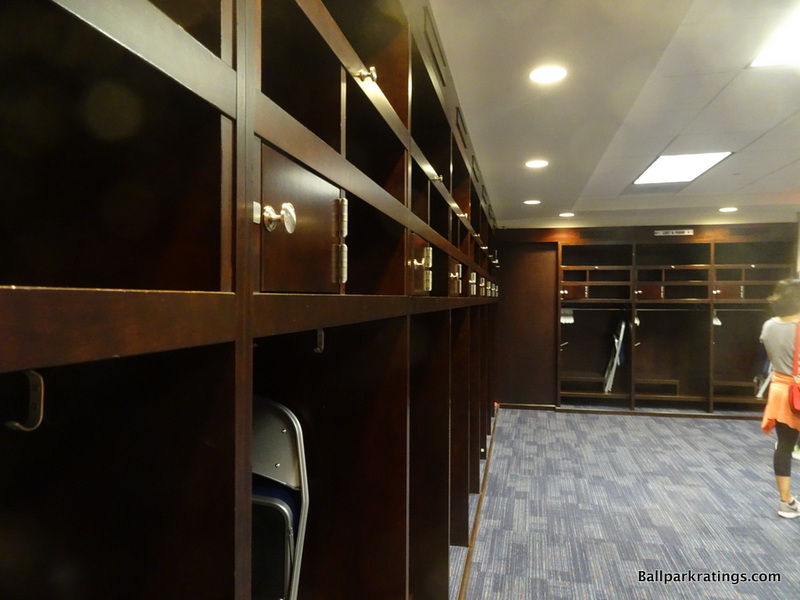 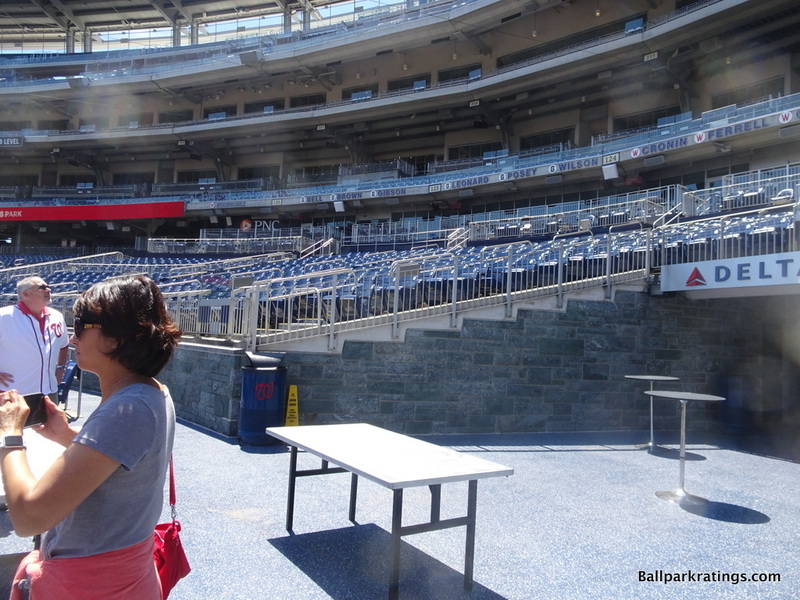 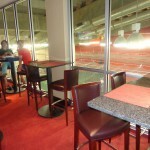 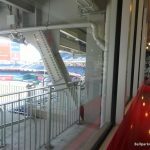 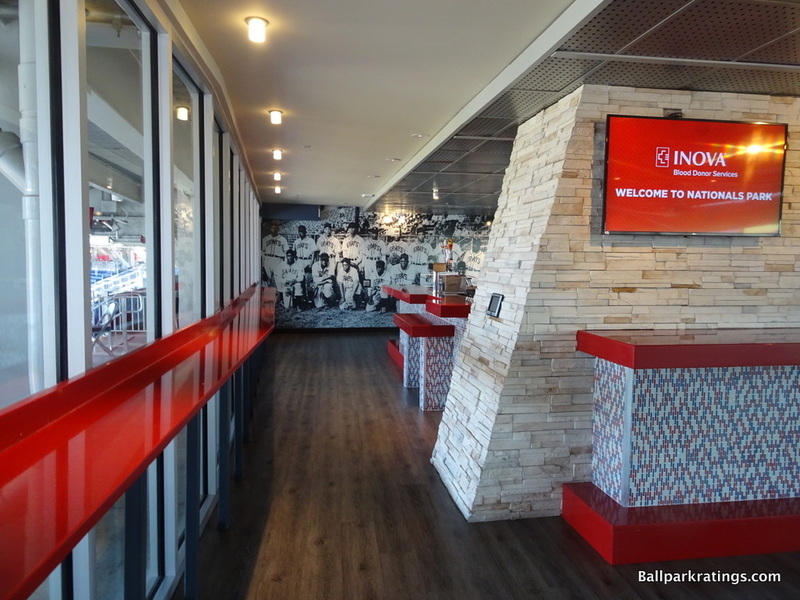 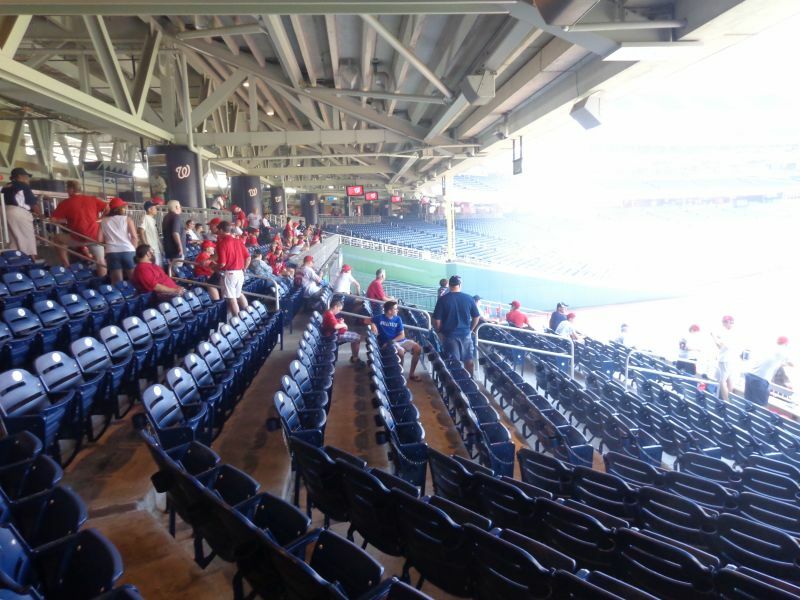 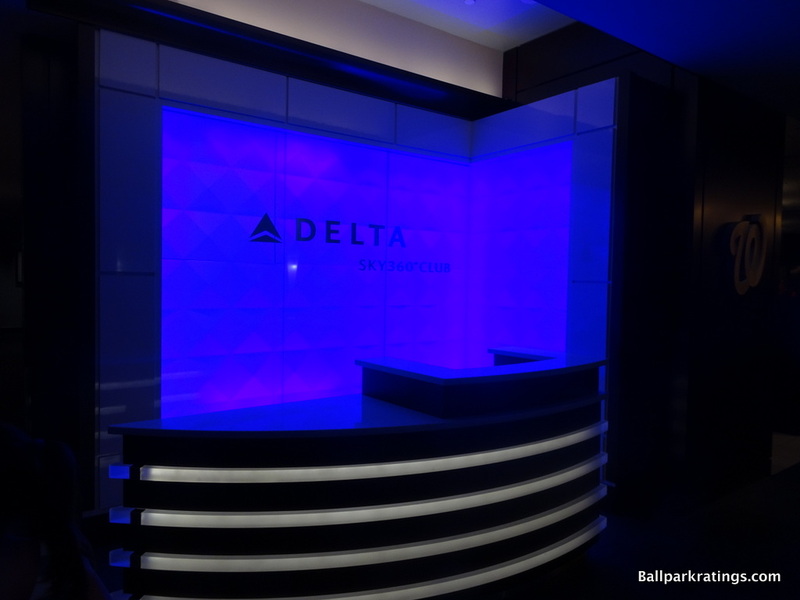 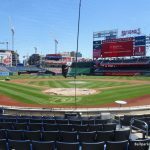 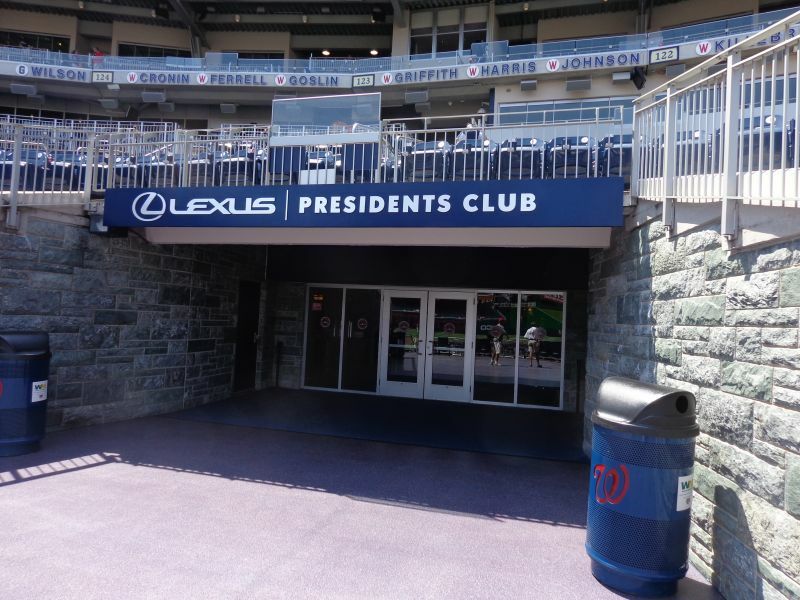 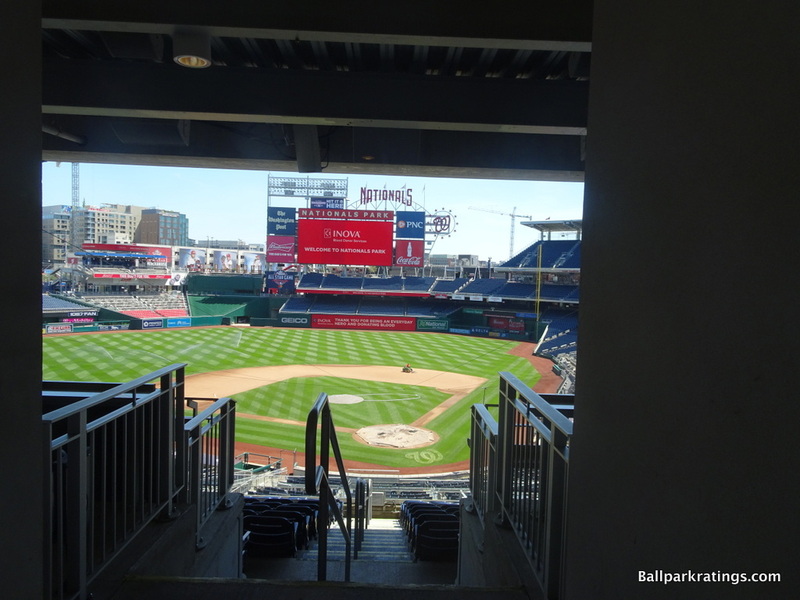 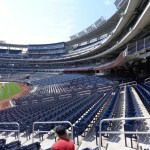 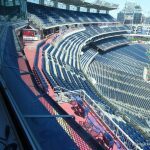 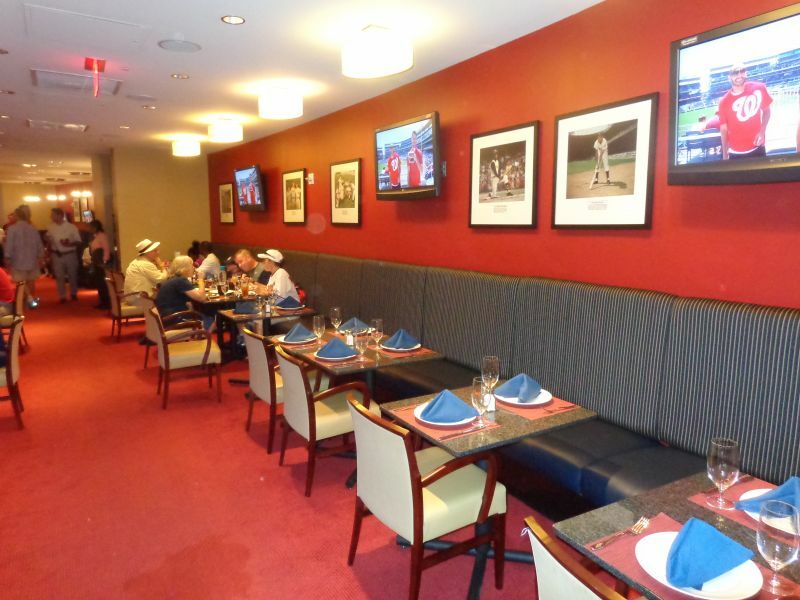 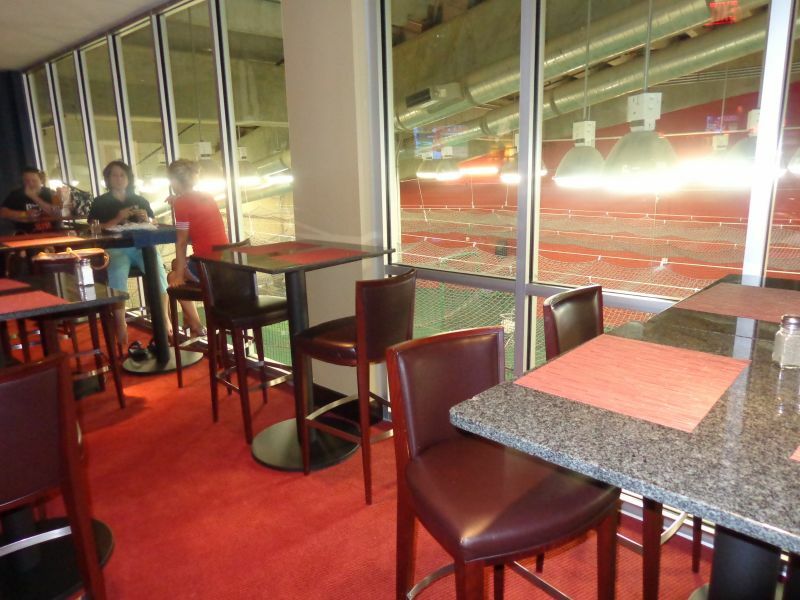 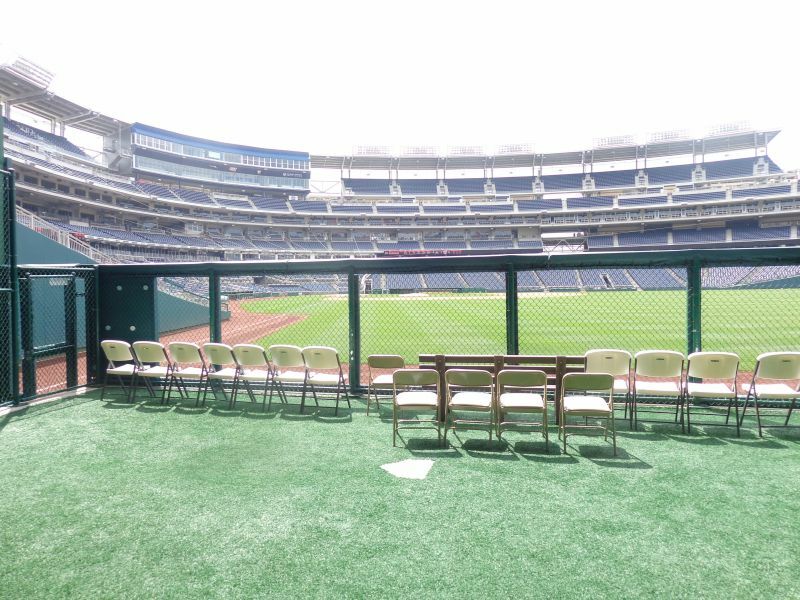 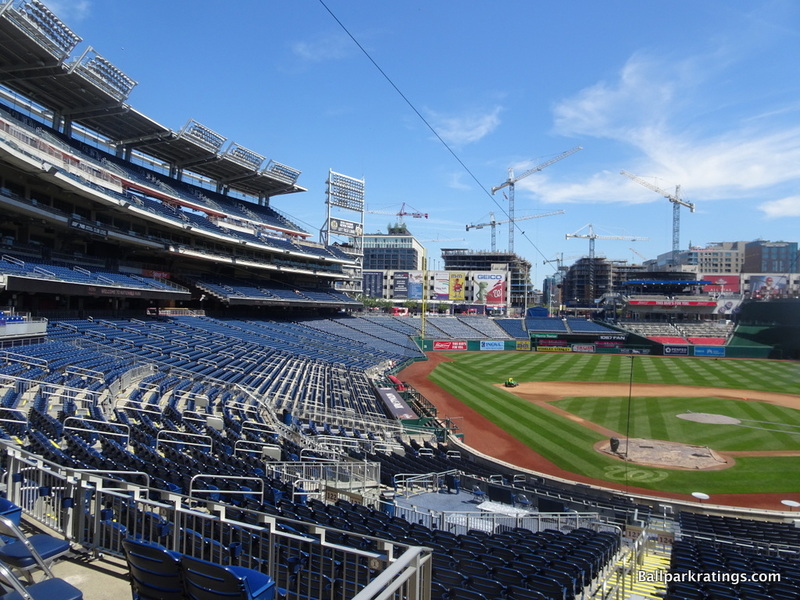 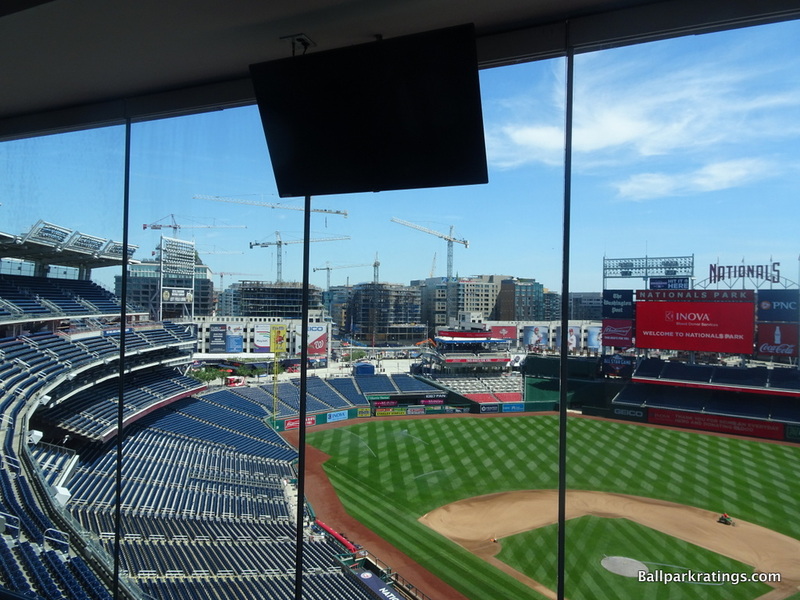 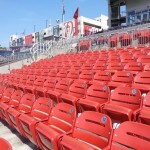 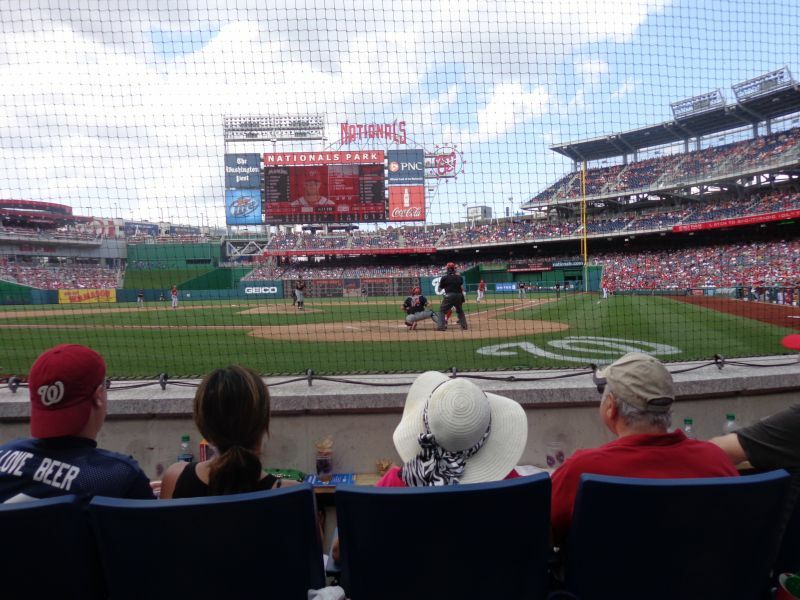 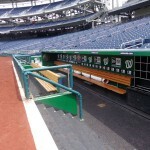 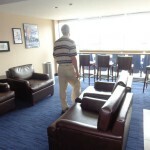 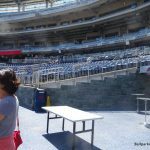 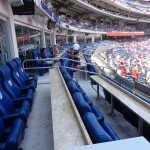 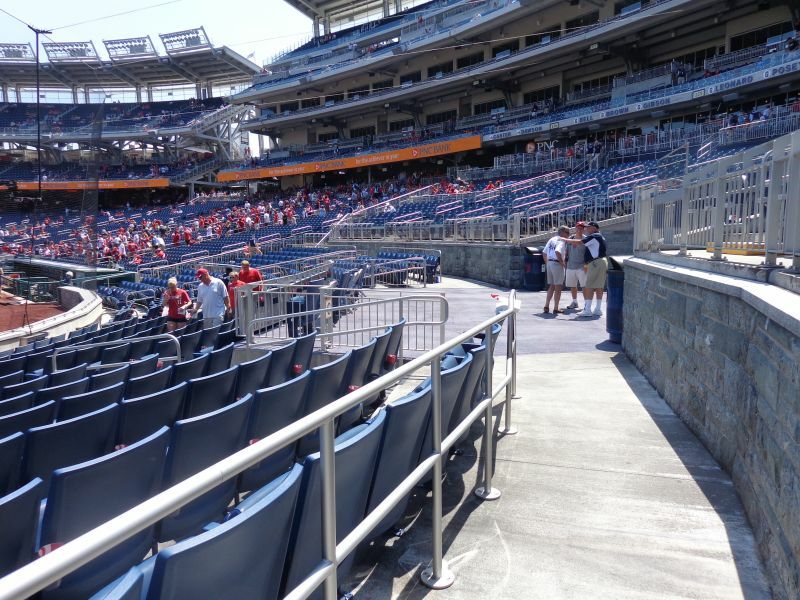 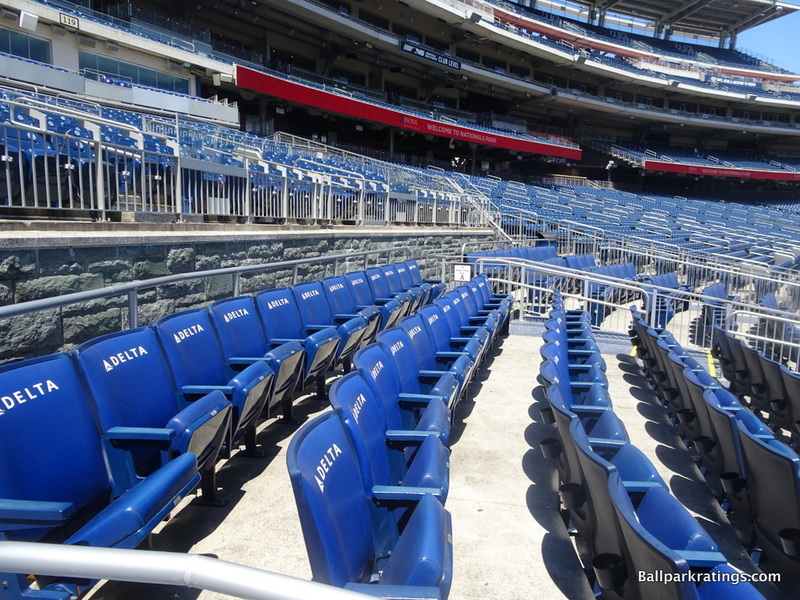 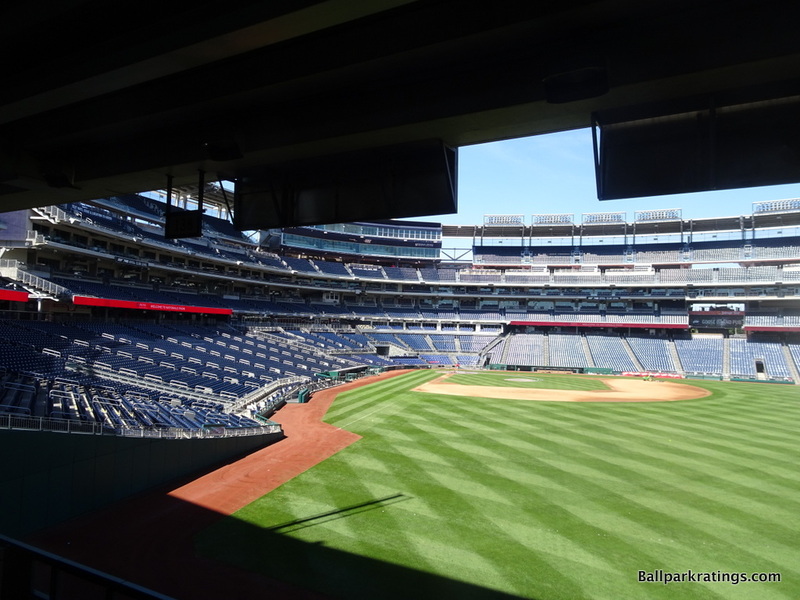 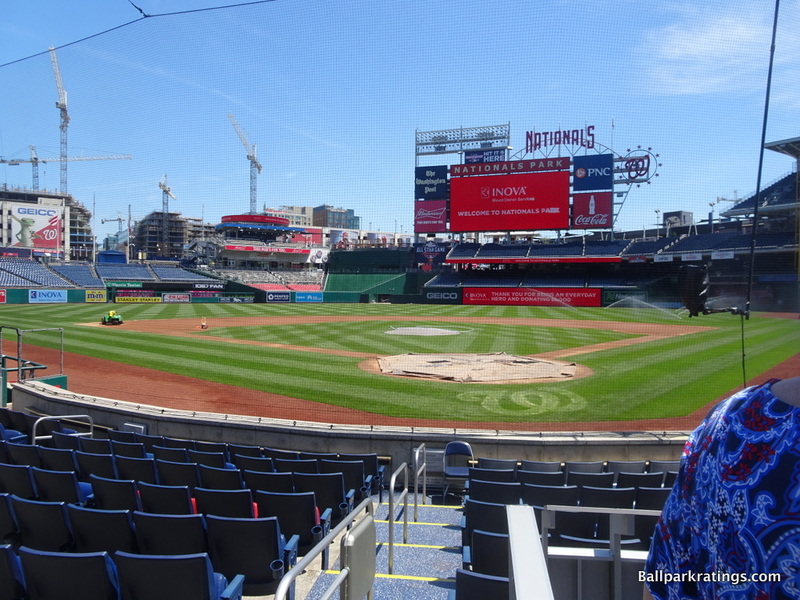 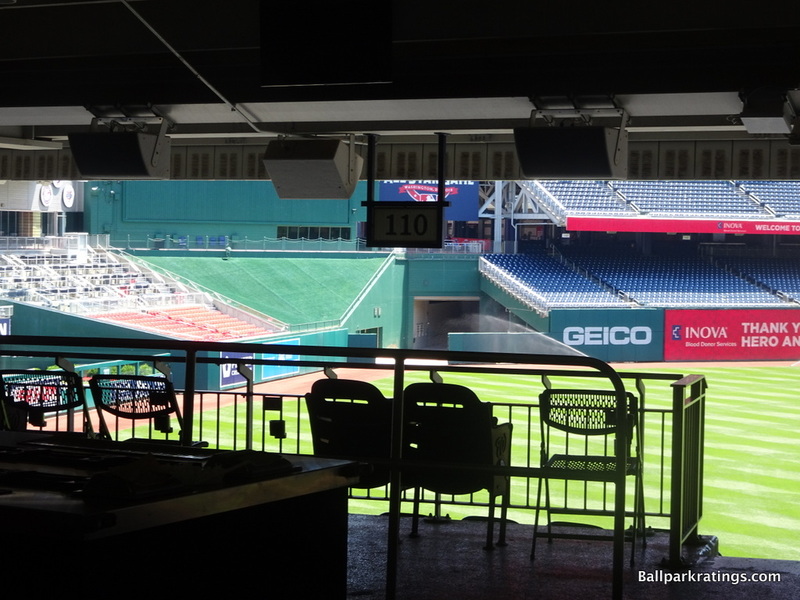 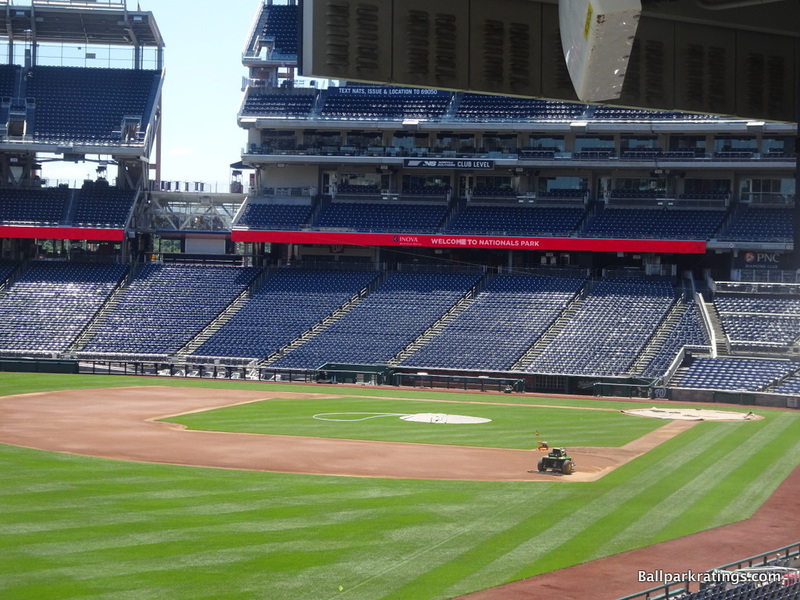 Premium seating took a major step forward at Nationals Park, with not one but two exclusive clubs behind home plate in addition to the obligatory glut of club level seating and suites. 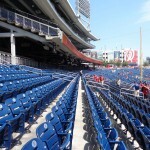 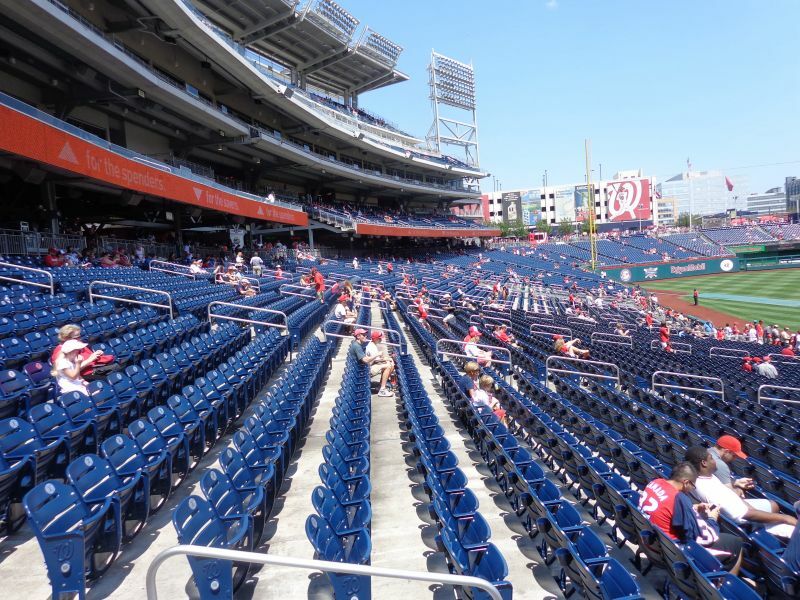 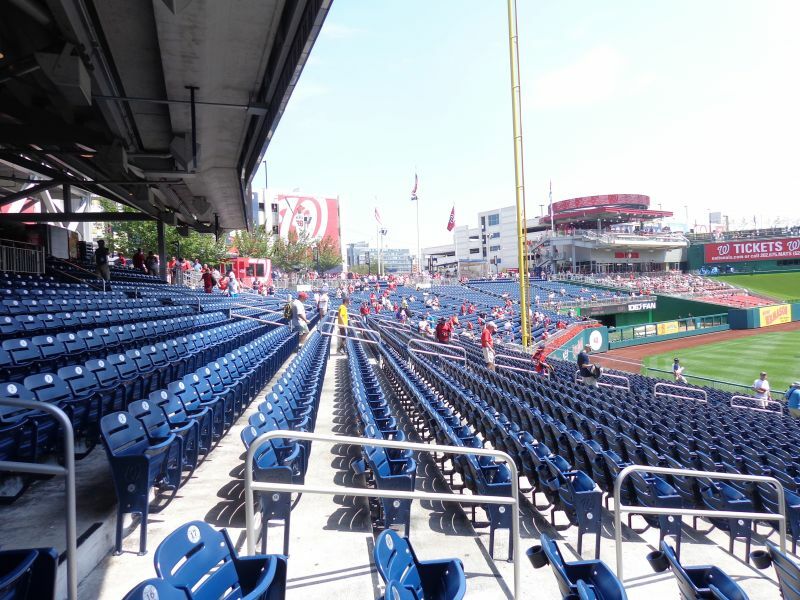 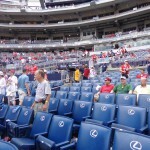 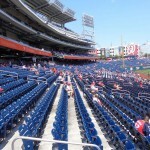 This is really apparent in the Nationals Park 2007 promo video sent to all fans, where the team made the mistake of talking about premium seating 2/3rds of the time. 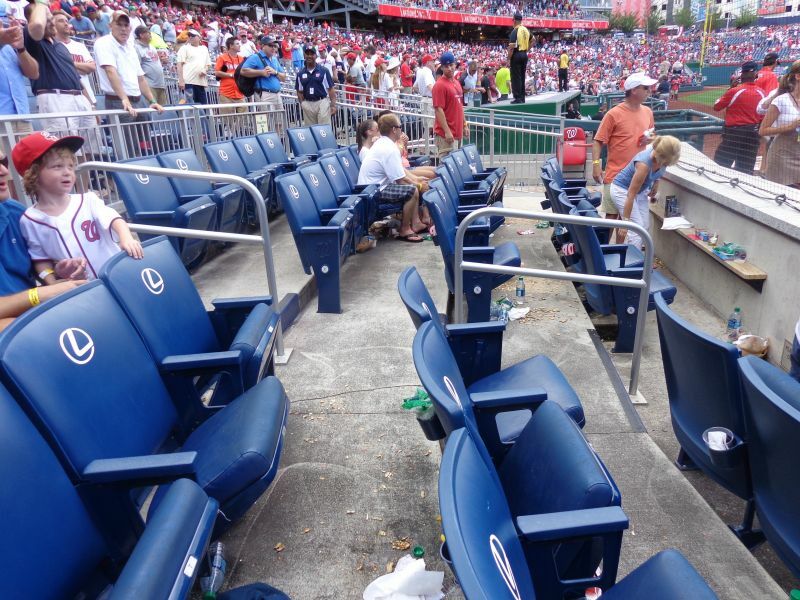 The negative reaction was swift and harsh. 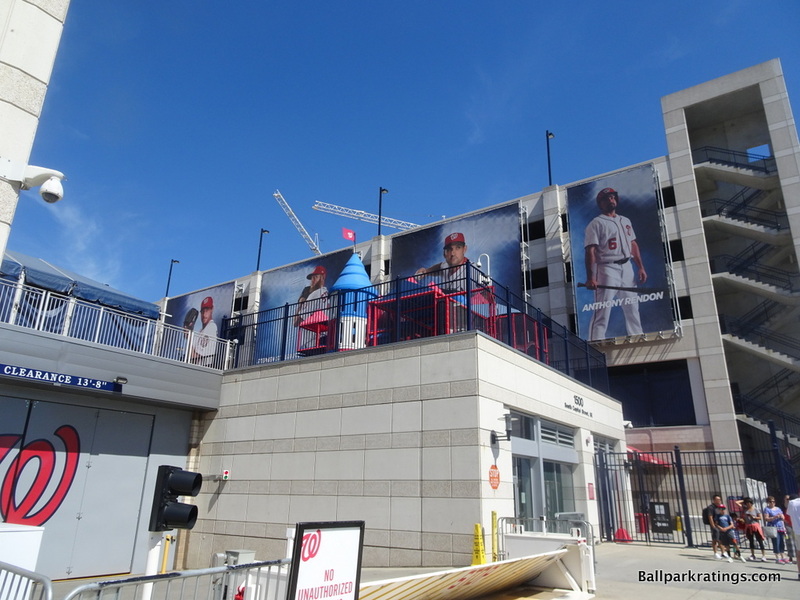 Critics quickly noted Nationals Park’s lack of distinguishing features with no defining characteristics. 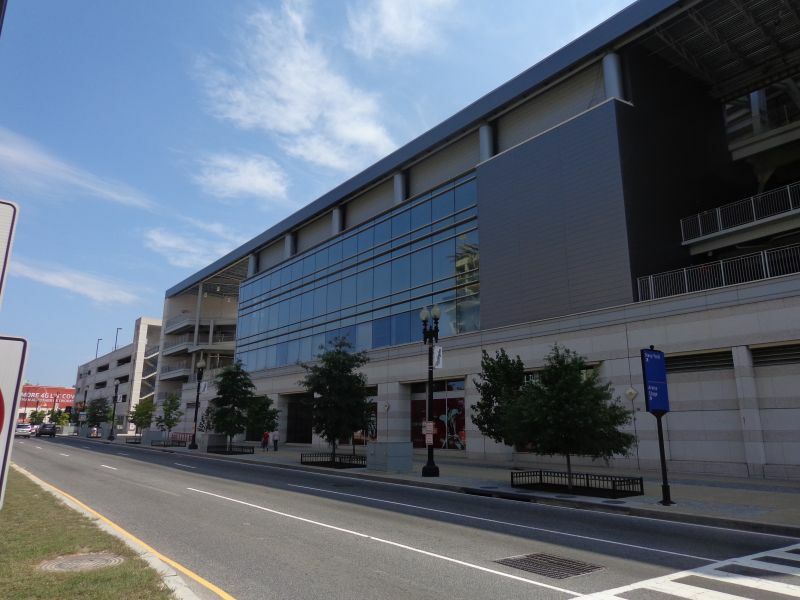 People called the “modern” architecture bland and uninspired, without the warmth of the retro facades or the vision of the original modern ones. 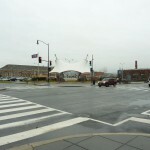 They said it resembled a mall more than the National Mall. 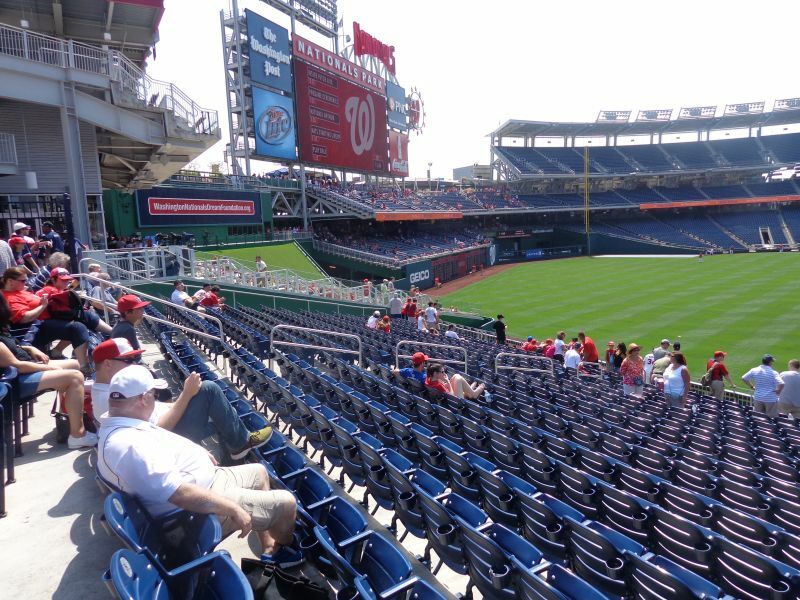 Josh Levin’s epic, “Rich Fan, Poor Fan,” is perhaps the zenith of sophisticated ballpark criticism. 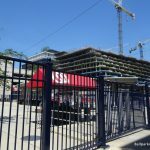 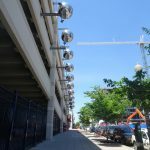 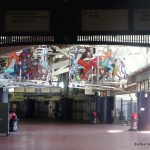 “If the stadium sparks economic development in the newly revitalized South Capitol neighborhood, perhaps the fact that the city got hosed will be forgotten. 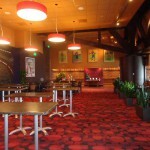 But the architecture will remain, and it will remain mediocre. 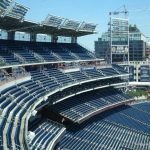 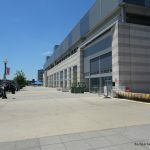 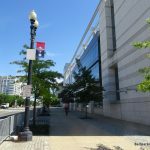 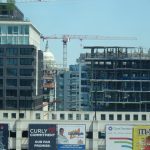 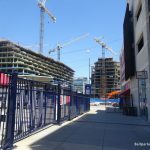 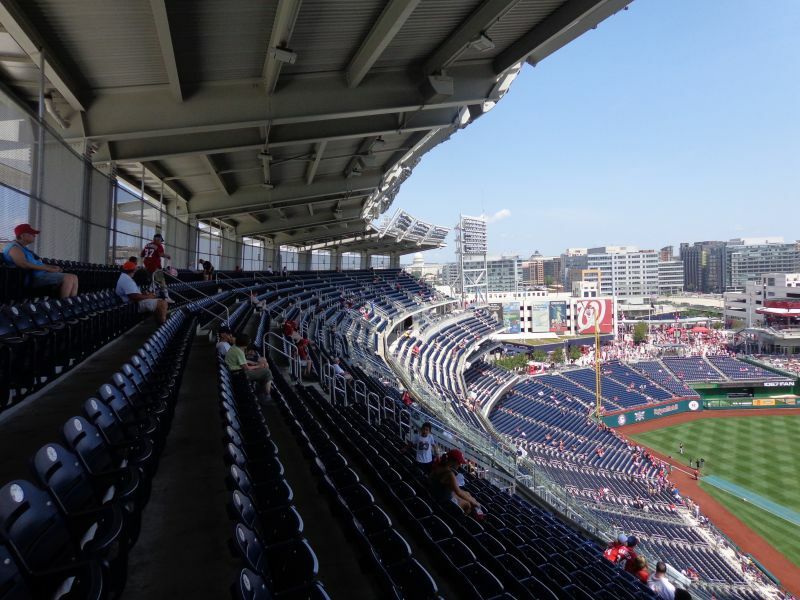 That failure isn’t just a matter of bad negotiating on the city’s part, or bland aesthetics on the part of HOK Sport [Populous], the architecture giant that designed the rush-job Nationals Park. 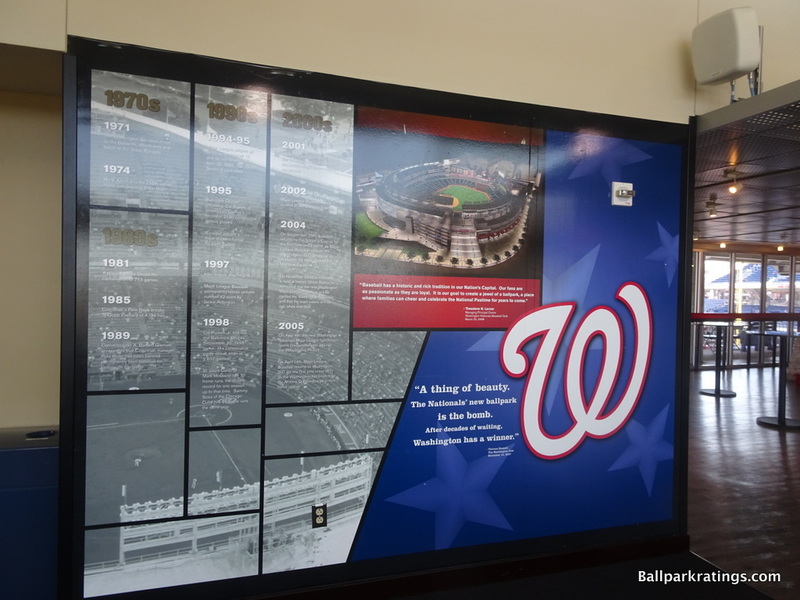 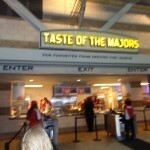 c) the height of national expectations (pre-‘08) for Major League ballparks after a line of truly outstanding ballparks. 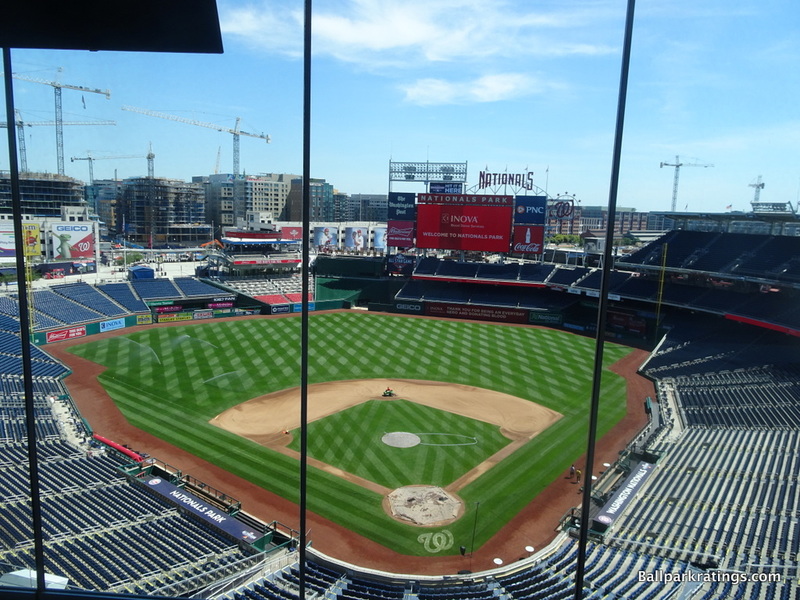 Today, with the benefit of viewing Nationals Park in the context of the 24 new or renovated ballparks from 1991-2017, all of the negativity surrounding this place seems way too strong. 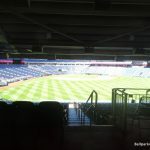 And that also goes for Citi Field (which I happen to view more negatively, with the differentiator from here being baseball’s worst local scene and the hermetic interior aesthetic setup) and Yankee Stadium (which I tend to view more positively, for a variety of reasons, if not because it’s so outstanding in some objective categories). 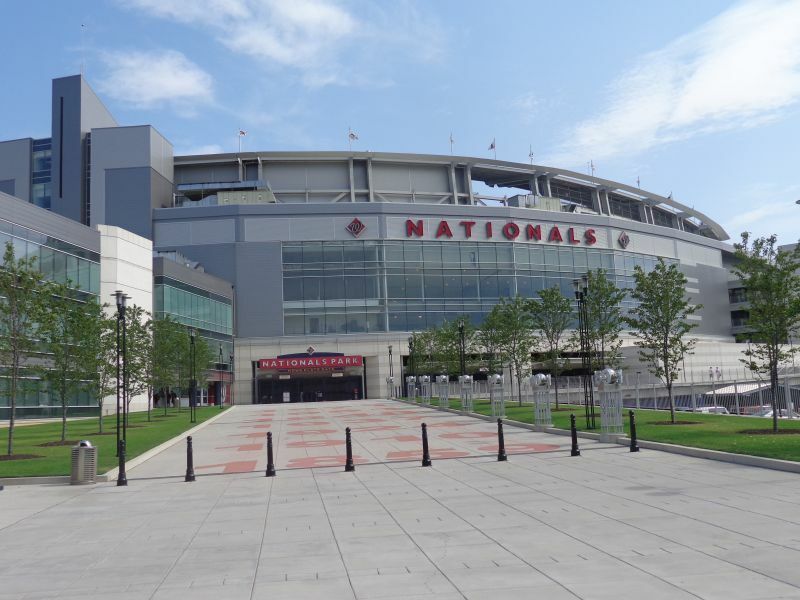 After all of the scotching hot takes, Nationals Park is inoffensive, but somehow not insultingly inoffensive like the derivative and formulaic Busch Stadium, SunTrust Park, and Citi Field, which have always seemed like actual red brick retro-cookie cutters. 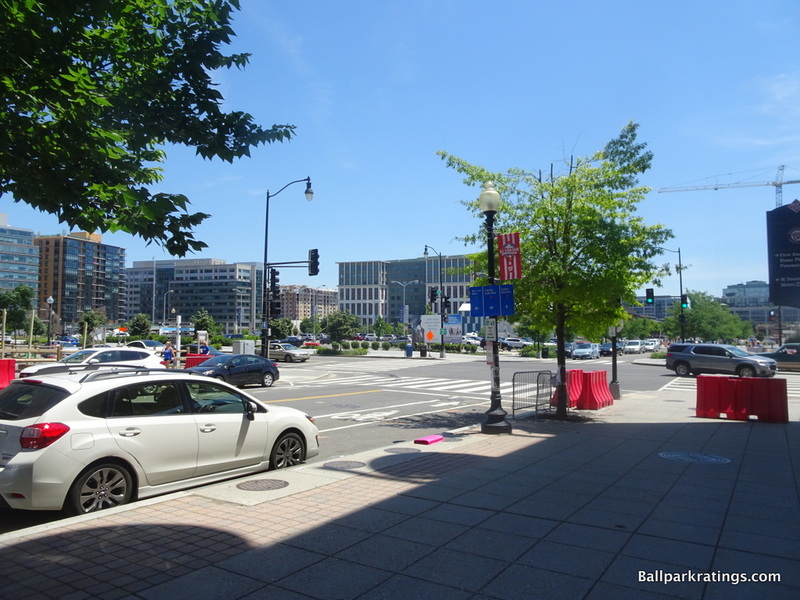 Washington’s park is a safe effort, but at least it’s not as derivative. 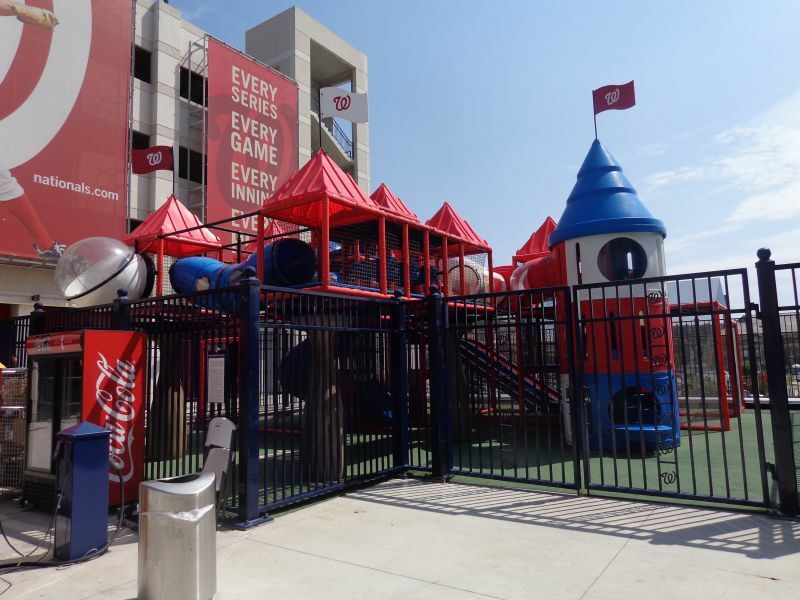 Nationals Park is often criticized for its cold exterior architecture, and while it’s not ideal, I’d take this over some of the more derivative and formulaic “retro” parks. 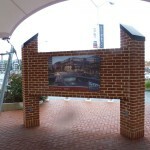 Most importantly, it fits in well with the local landscape. 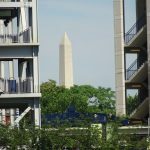 It’s no architectural monument, but as I briefly outline below, perhaps it wasn’t meant to be one in the traditional sense. 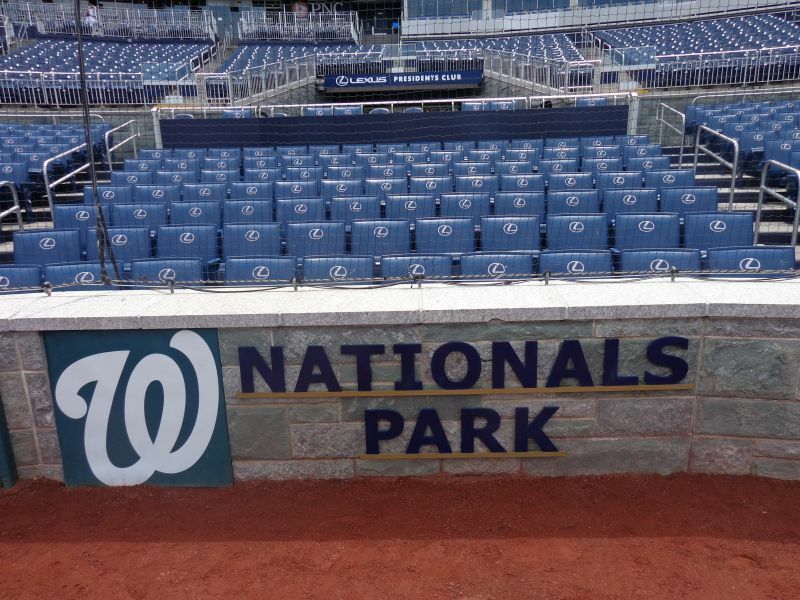 I’ll discuss this more in the architecture and aesthetics section. 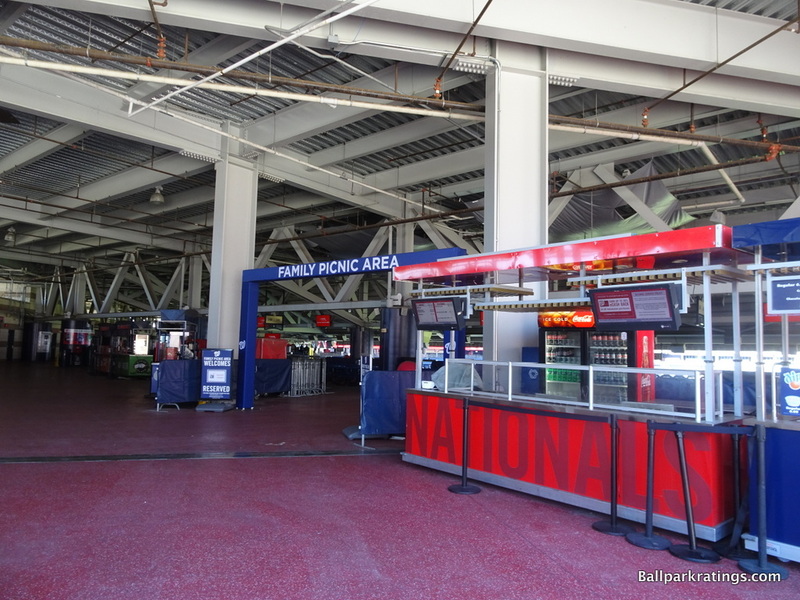 For me, Nationals Park is just broadly pleasant, and consistently above-average in most areas. 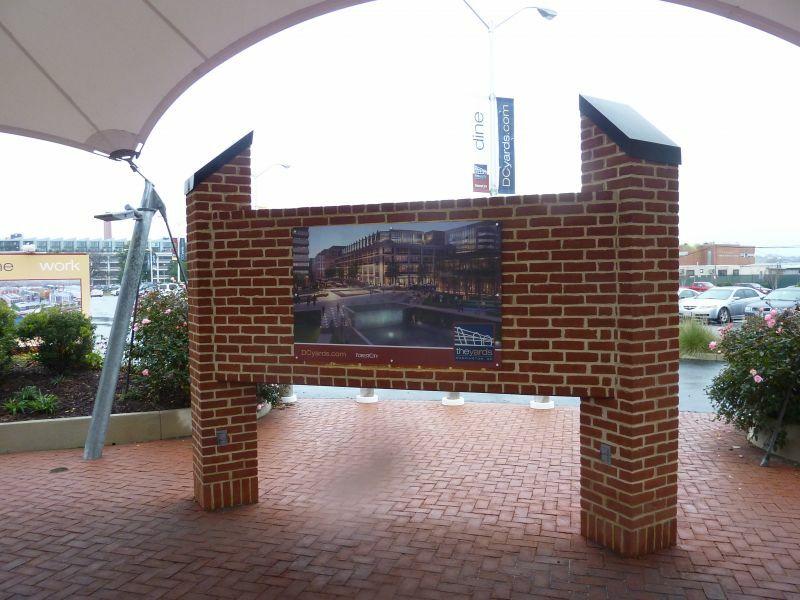 And for all the critiques about the design, at least it fits in with its context, however underwhelming the actual design may be. 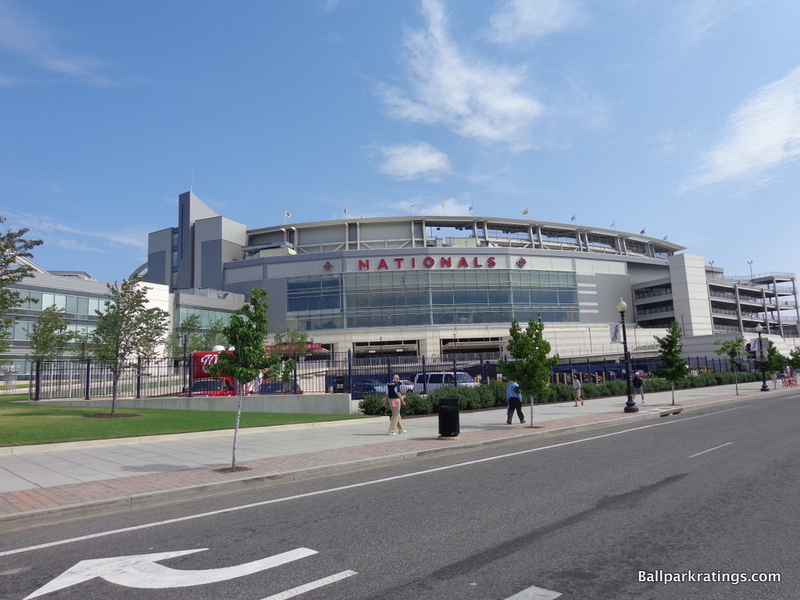 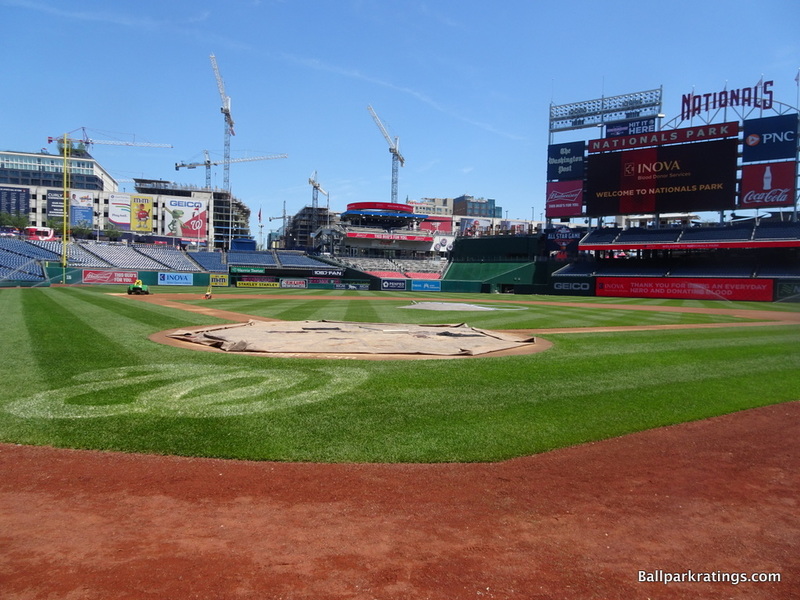 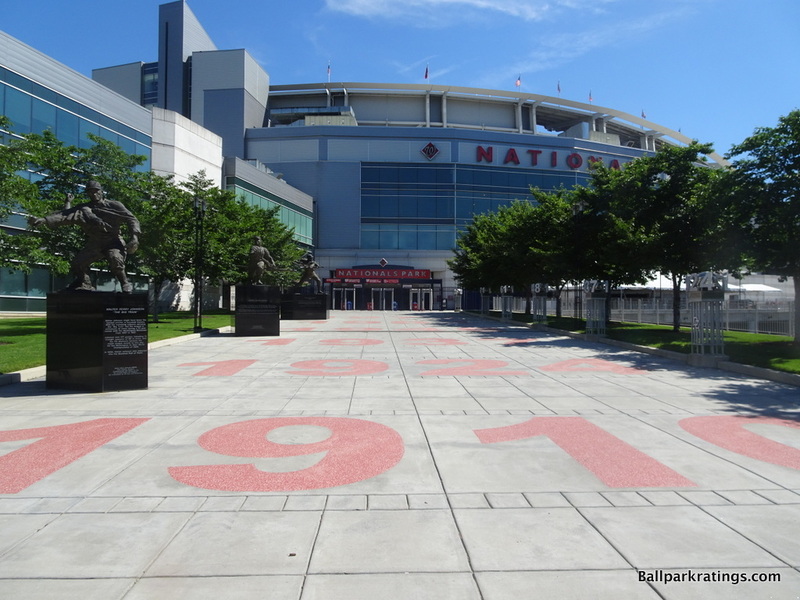 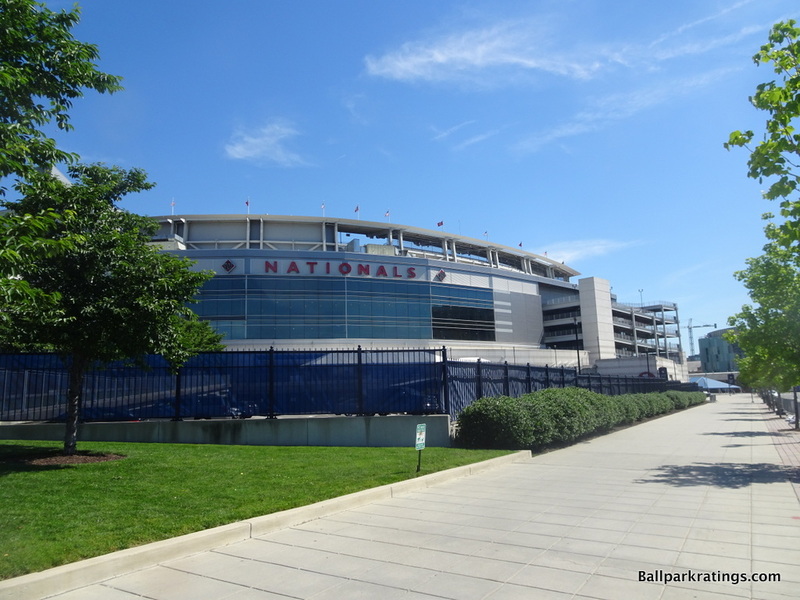 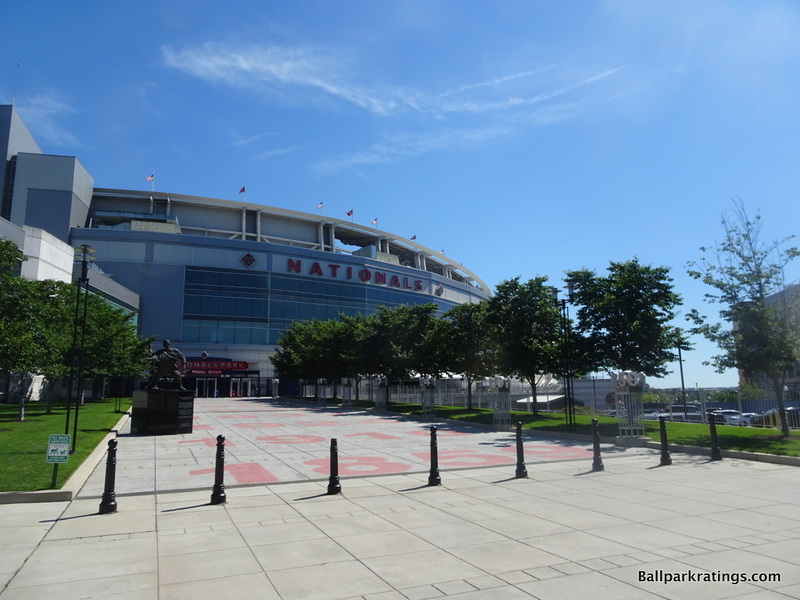 Ironically, after all of the media coverage, I have found Nationals Park to be one of the most difficult parks to write about. 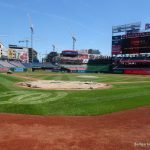 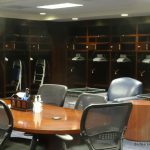 The website devoted to giving that very inordinate amount of scrutiny to baseball stadiums hasn’t been able to do it yet! 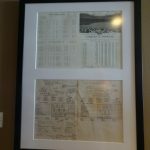 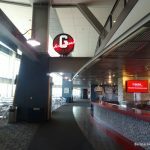 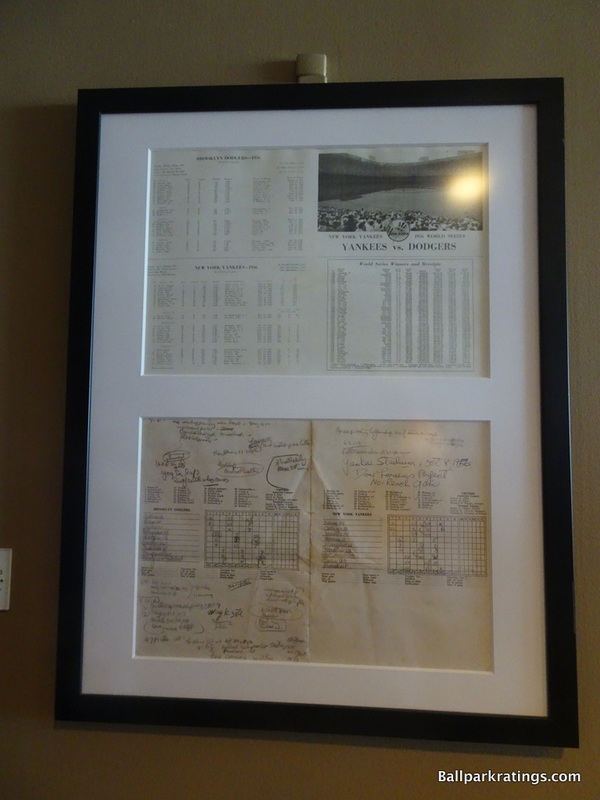 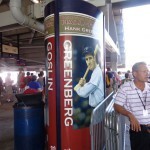 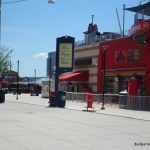 I like to begin my long-form ballpark reviews with an overarching narrative rooted in a premise that ties the genesis of the ballpark concept to its current state, whether it be glossing through news archives, looking at a ballpark’s inaugural program (something I’ve collected via e-bay over the years), reading current day blogs, or just looking at how the theme/design vision evolved. 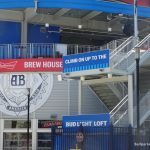 That’s hard to do here. 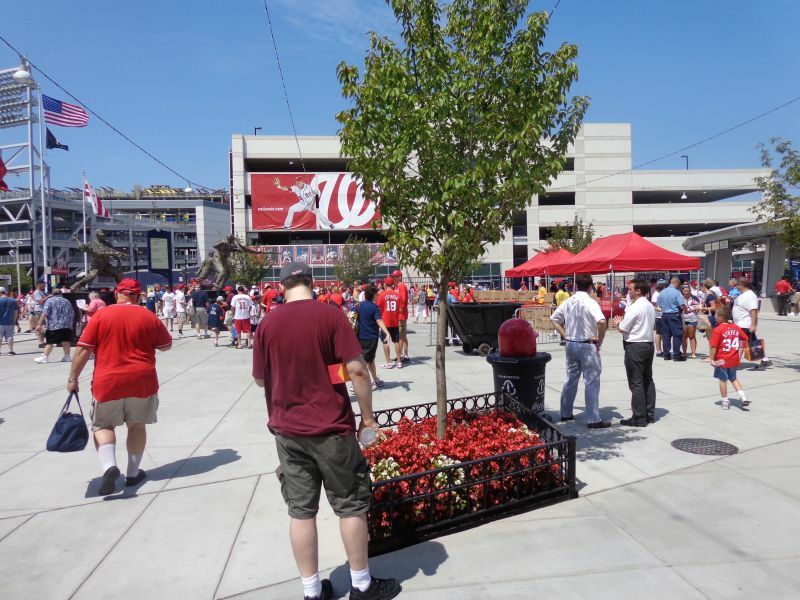 There’s no flowery romantic baseball narrative to Nationals Park. 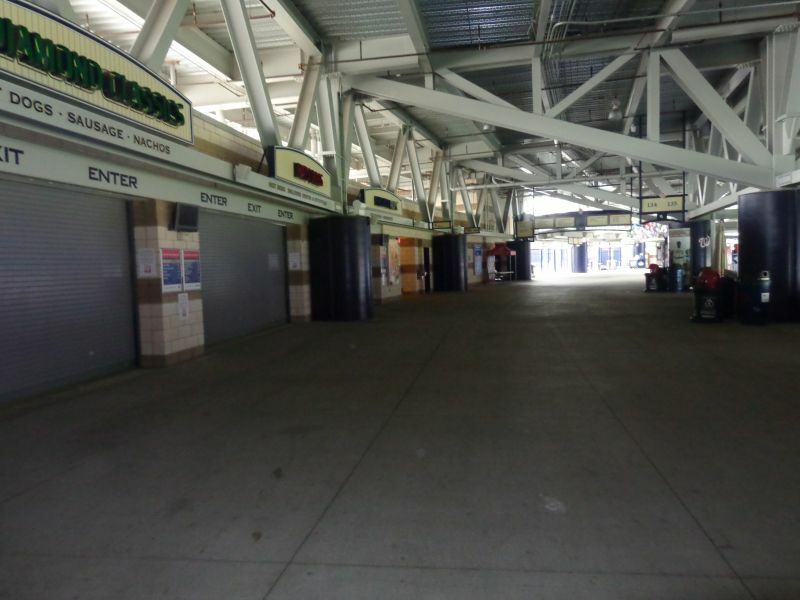 There’s no hindsight regret narrative like new Comiskey. 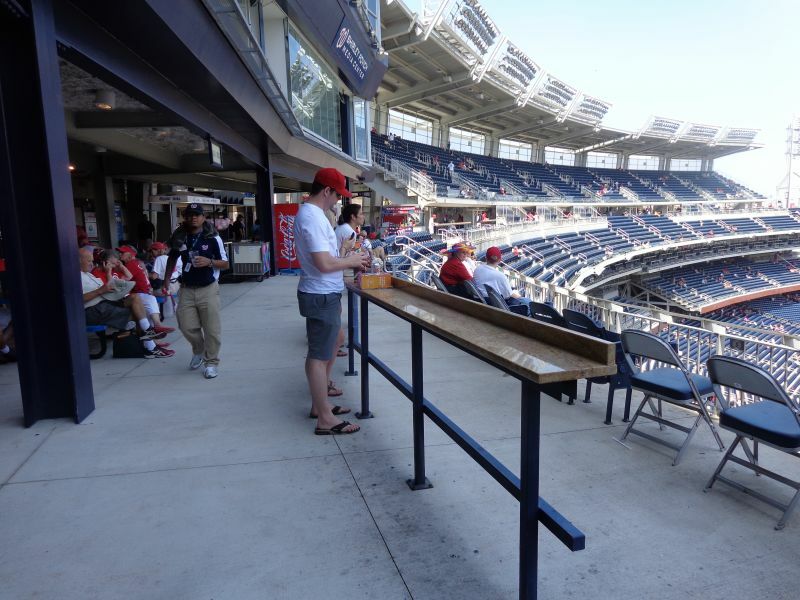 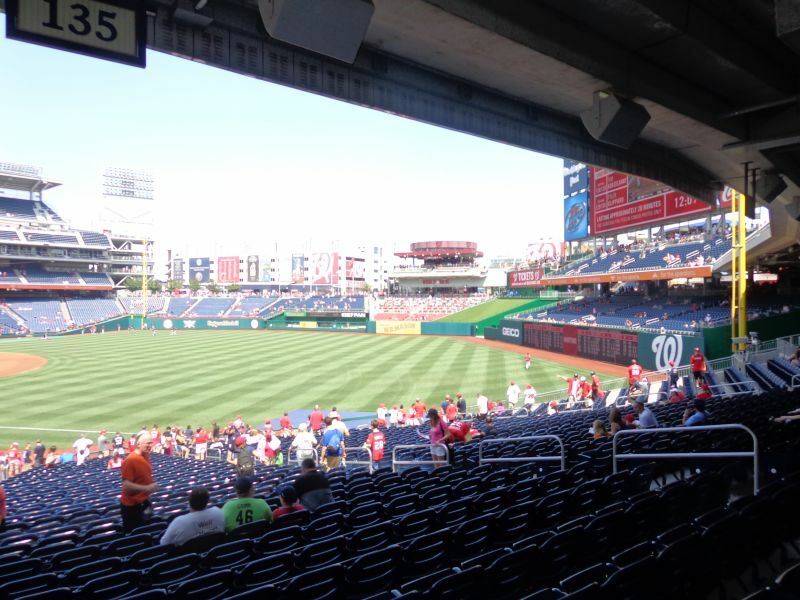 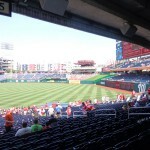 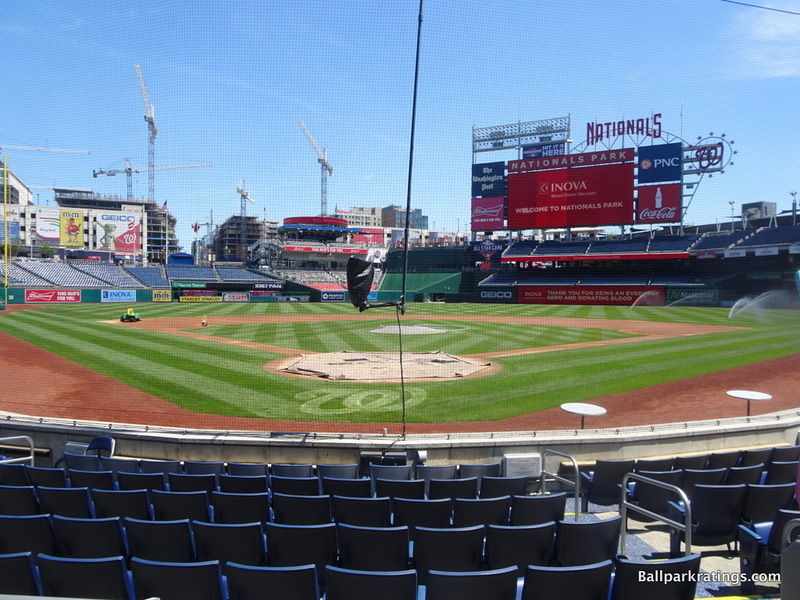 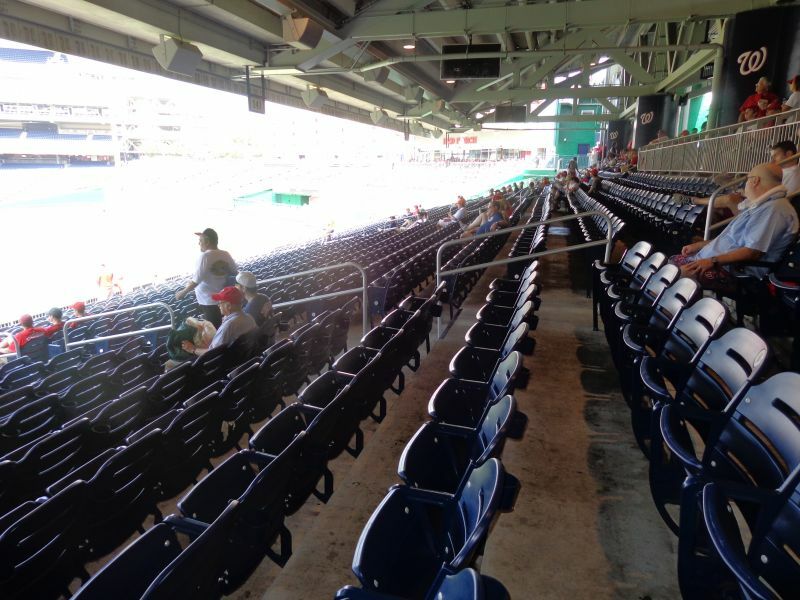 Nationals Park is kind of blandly above-average across the board, almost without exception. 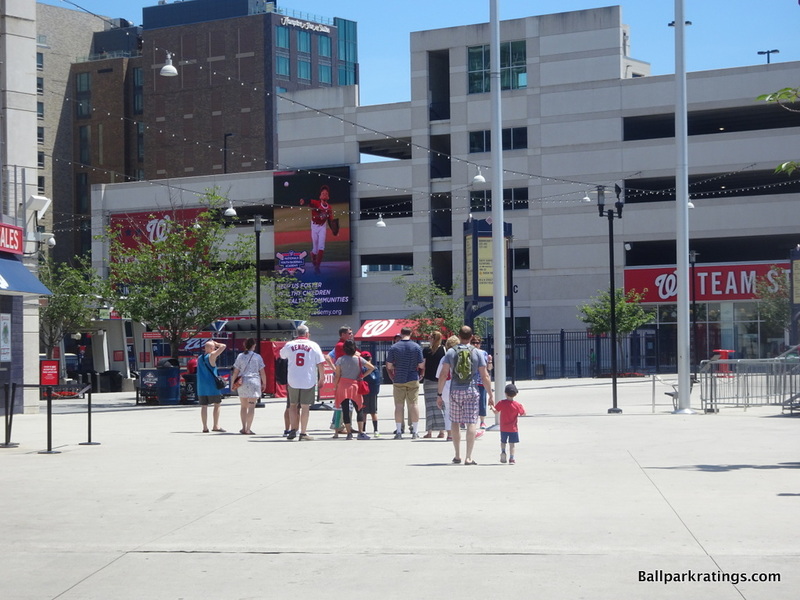 It’s hard to give bonus points, because this park is mostly devoid of superlatives. 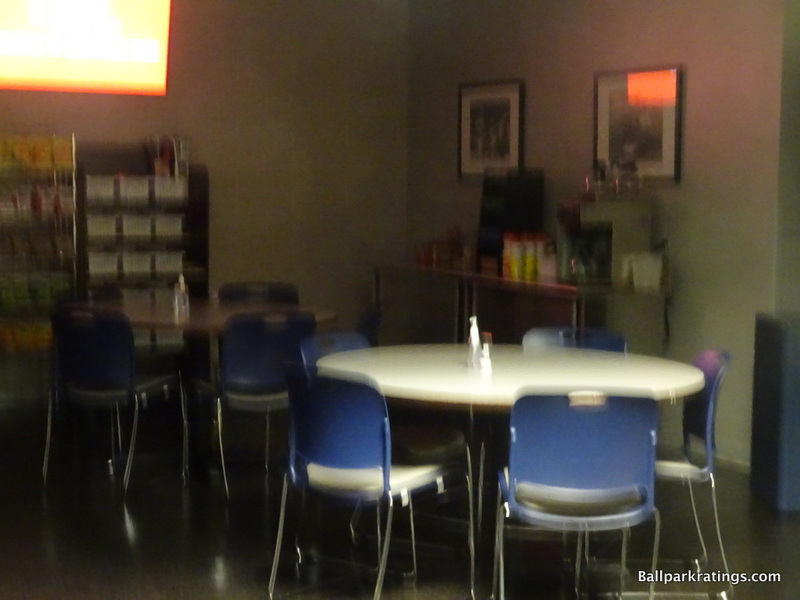 Hardly anything spectacular, but hardly anything subpar, either. 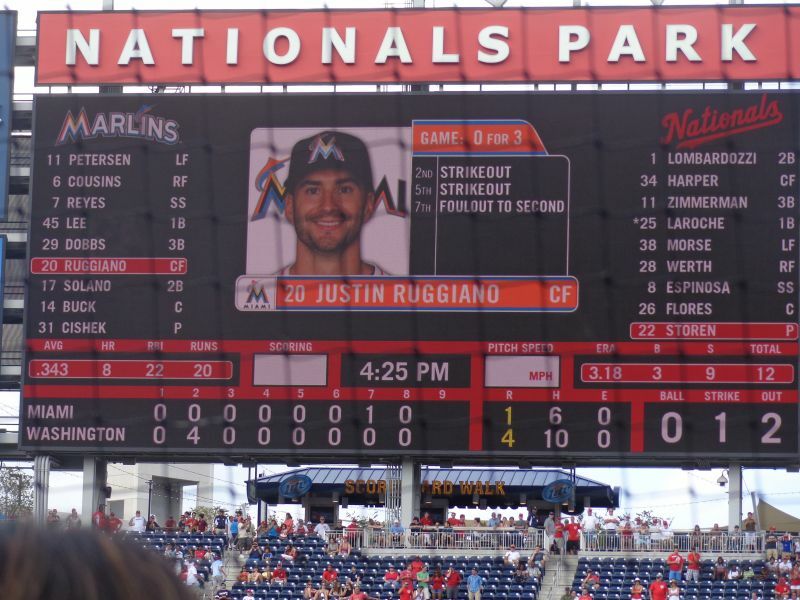 As you can see by the score, that doesn’t have to be a bad thing. 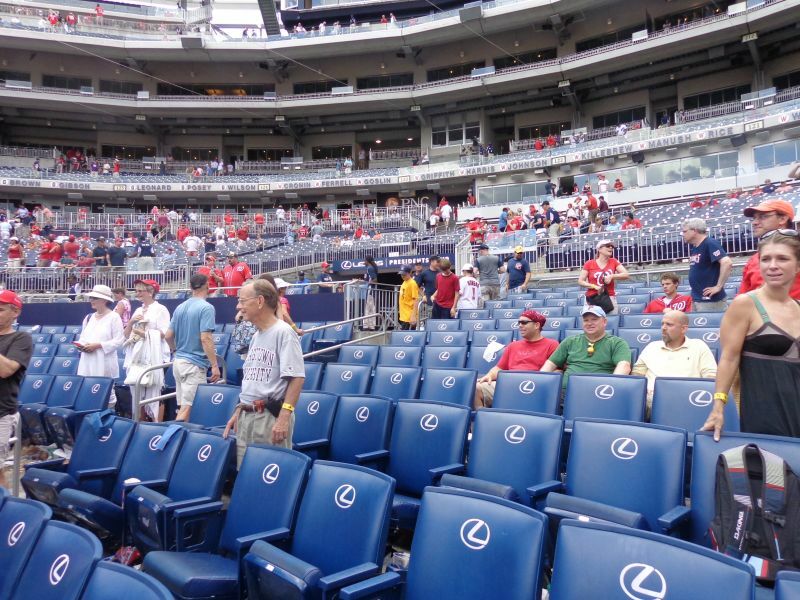 There’s something to be said for well-roundedness. 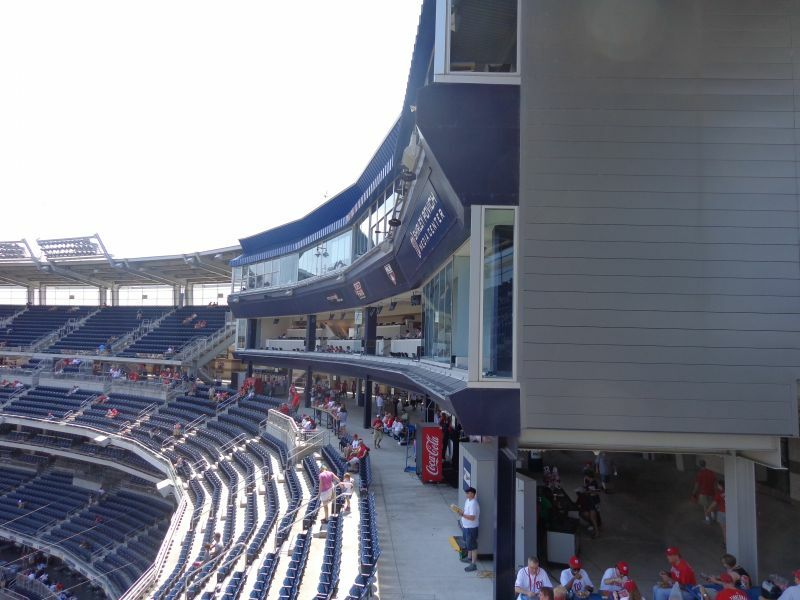 From the outset, I do think it’s important to address the critique that Populous “played it safe” with Nationals Park’s architecture and aesthetics. 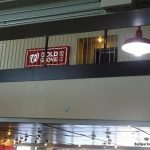 While undoubtedly true, where Nationals Park lacks boldness and ingenuity, I believe the local constraints had a lot to do with it. 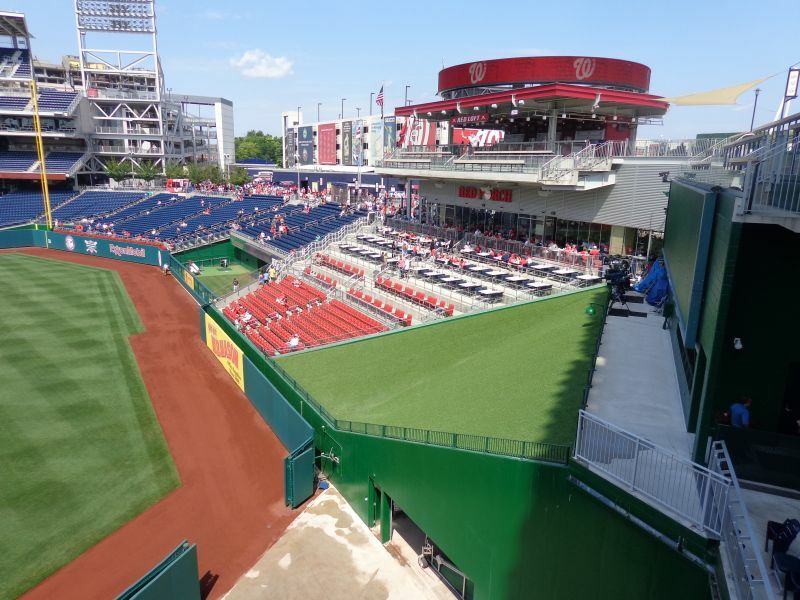 You don’t see this explicitly acknowledged in the myriad of “sophisticated” reviews regarding D.C.’s should-have-been baseball cathedral, but Nationals Park wasn’t really supposed to have a striking “presence” in Washington’s landscape. 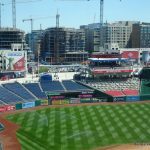 If you look at the language from the sports and entertainment commission, the park was intended to understatedly “fit-in” with the conceptual scheme of national monuments. 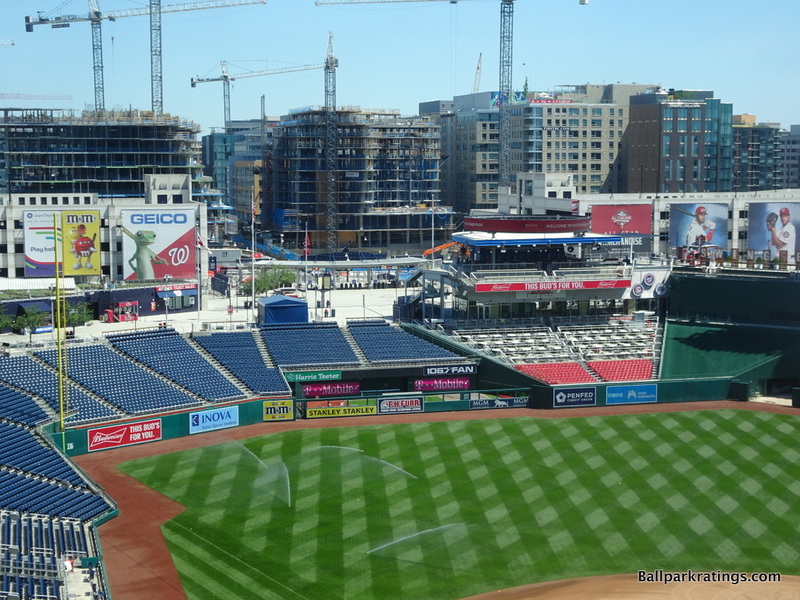 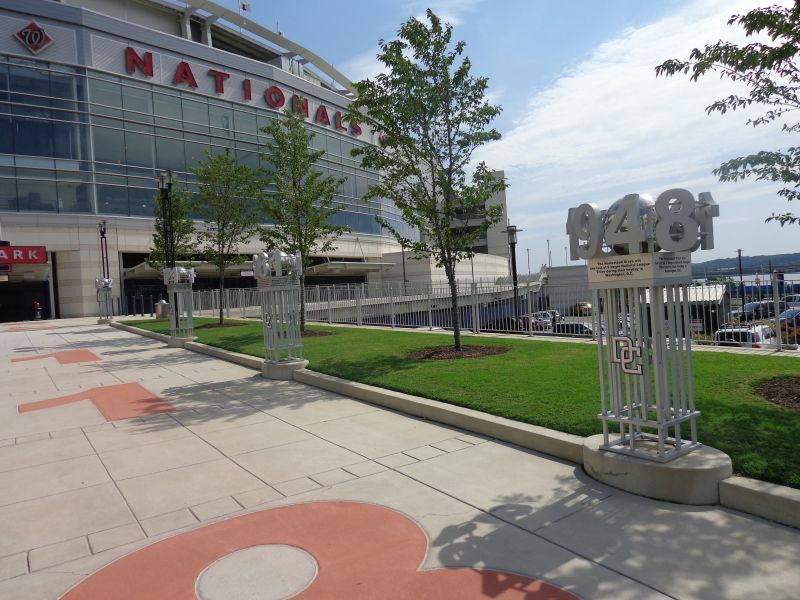 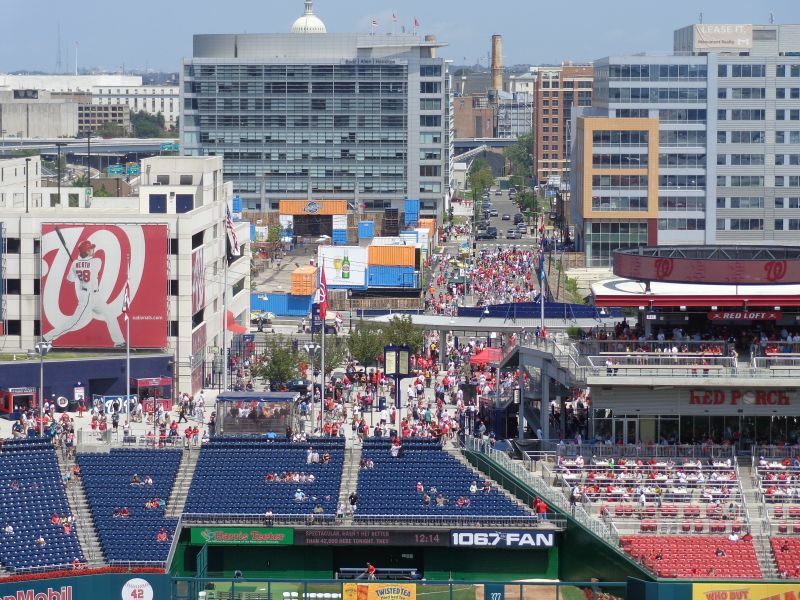 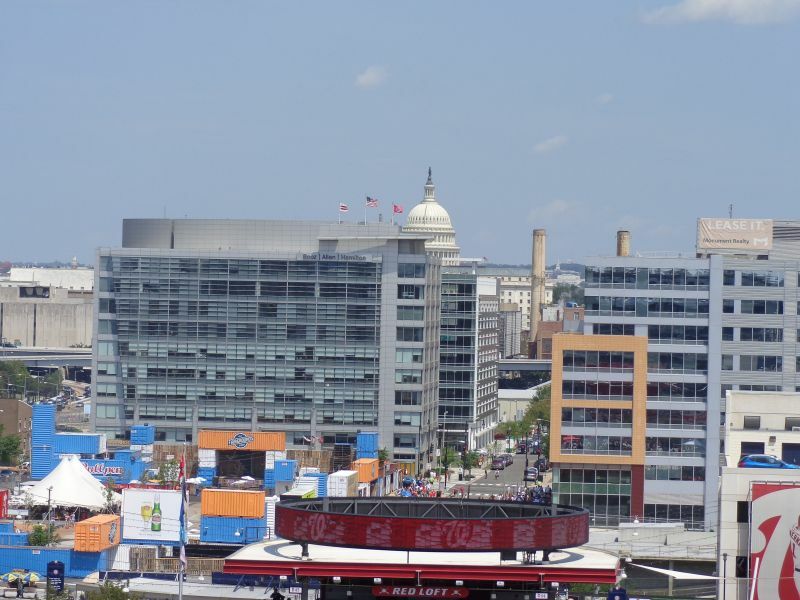 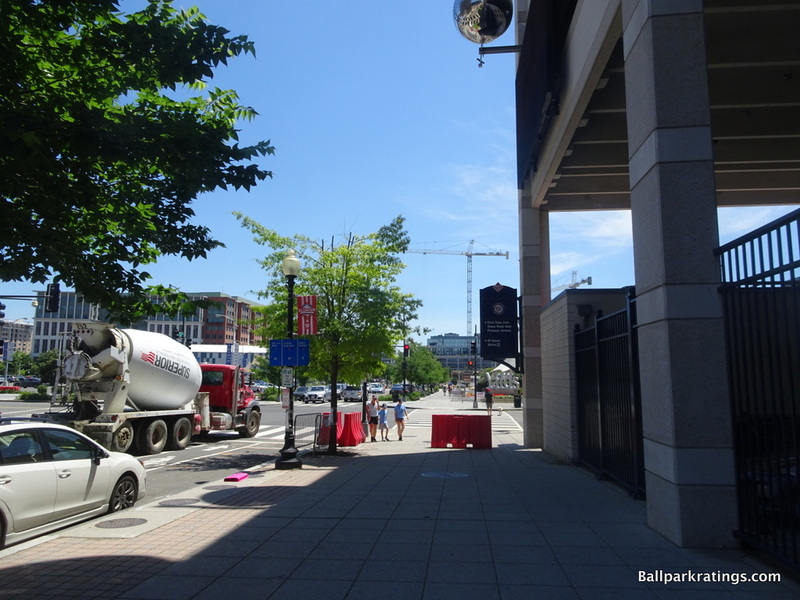 There’s a lot of conflicting information on this, like Populous said it would anchor the “monumental core,” but I don’t think the city planners wanted Nationals Park to “anchor” the scene in a physical sense, even if it was going to anchor the new development. 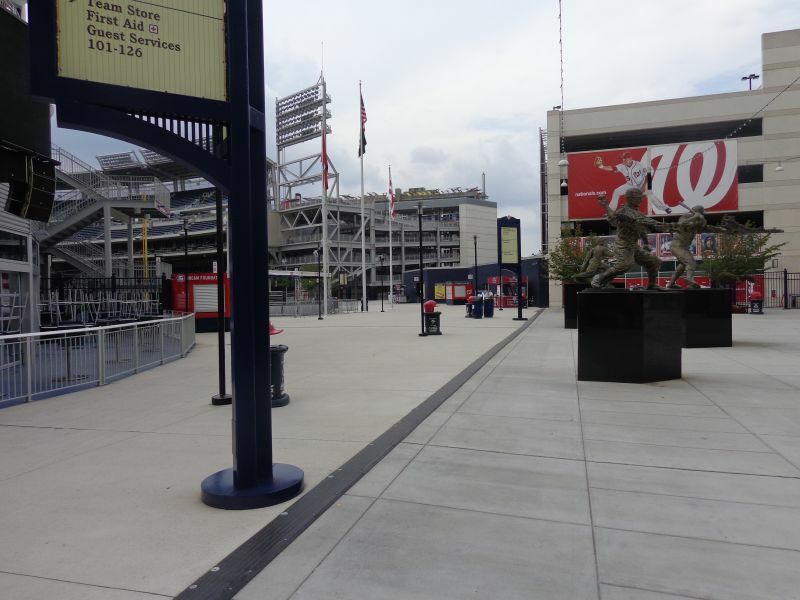 In other words, the fact that Nationals Park “fades into the landscape” could be construed as intentional. 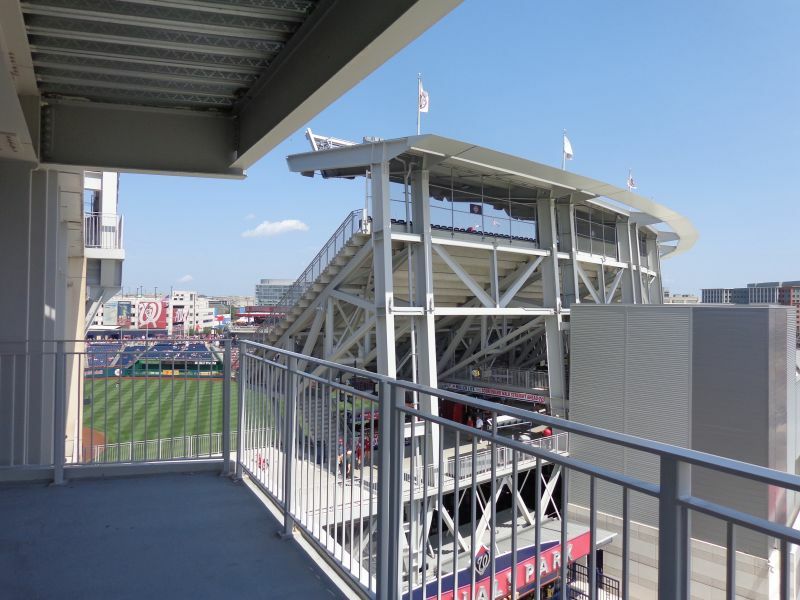 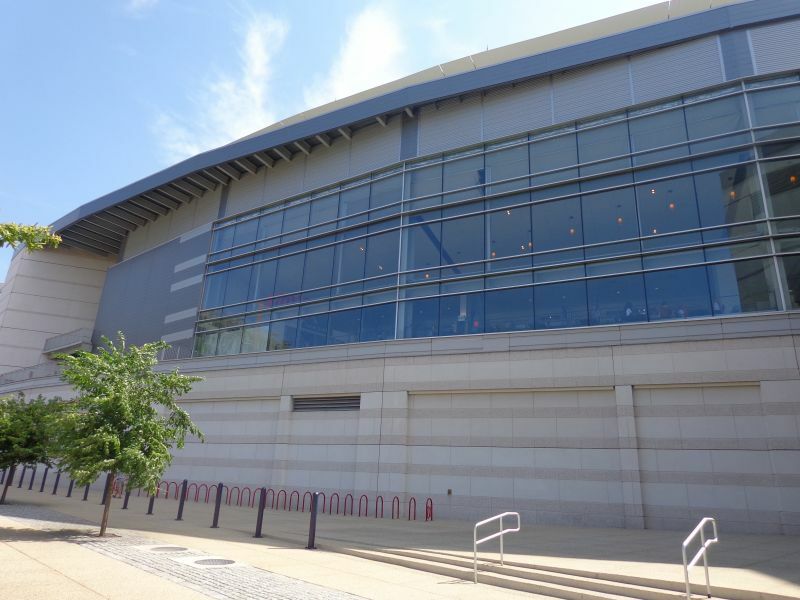 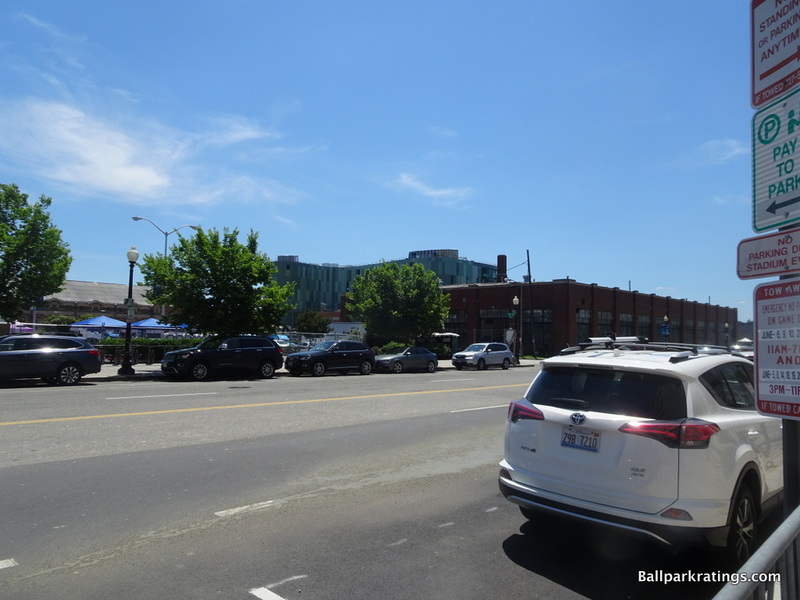 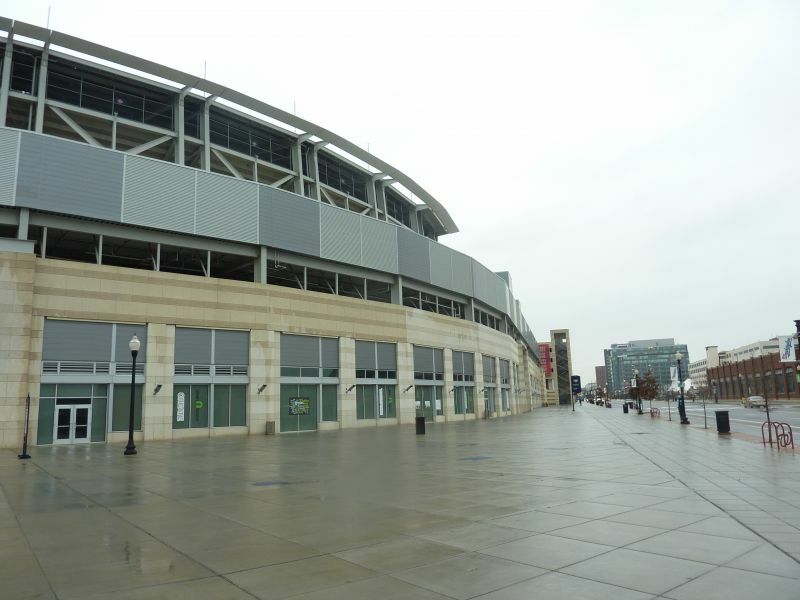 Yes, they went cheap with some of the materials, and this is by no means a top ballpark exterior design, but I don’t think it’s an unmitigated disaster. 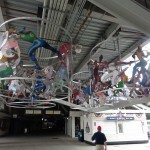 And I appreciate that the design at least has a modern conceptual focus. 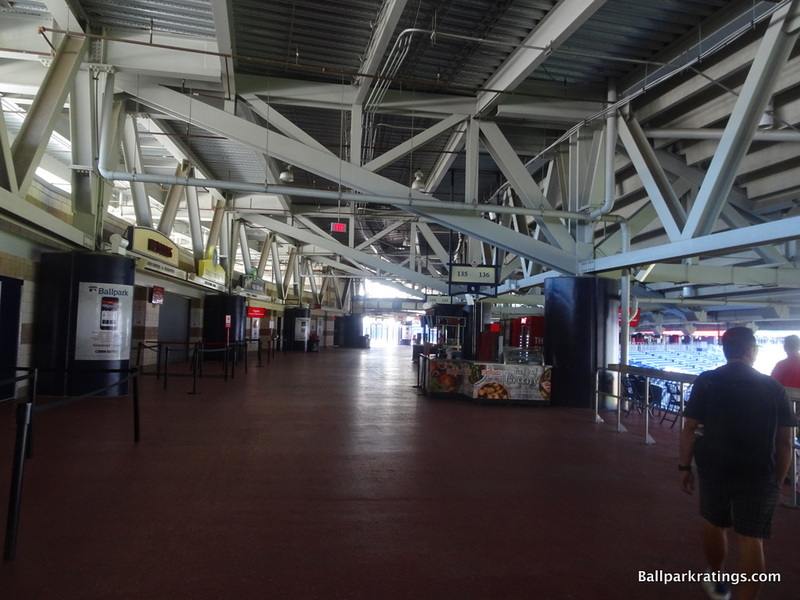 The interior aesthetics are similarly understated but certainly stronger, functioning as any good ballpark interior design should, open to any surrounding contextual development. 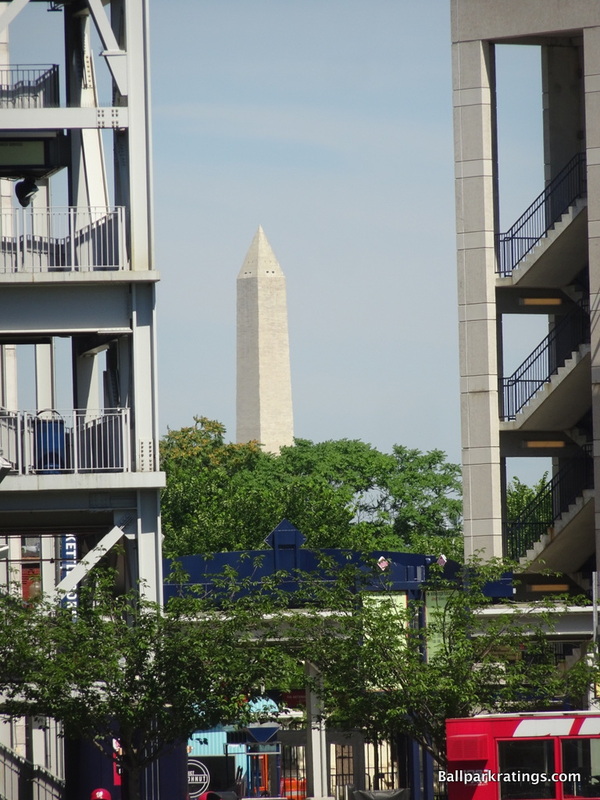 National landmarks can only be viewed from a few spots under the right conditions, probably the difference between a good interior and a great one. 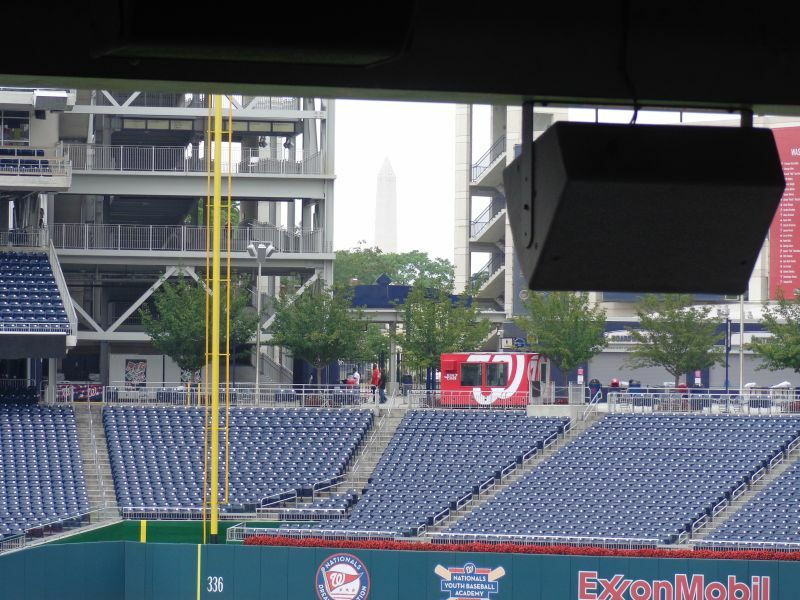 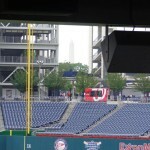 While the Capitol Building can only be viewed from parts of the upper deck, I do like the clever integration of the Washington Monument into the ballpark. 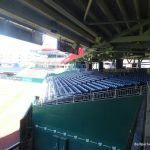 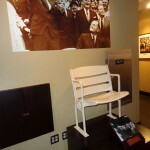 It’s arguably even more limited, but took some sharp dexterity: it can be viewed exactly from where the gap in the seating splits down the right field line on the main concourse, precisely centered in between the end of the left field grandstand ramps and the beginning of the outfield parking lot façade. 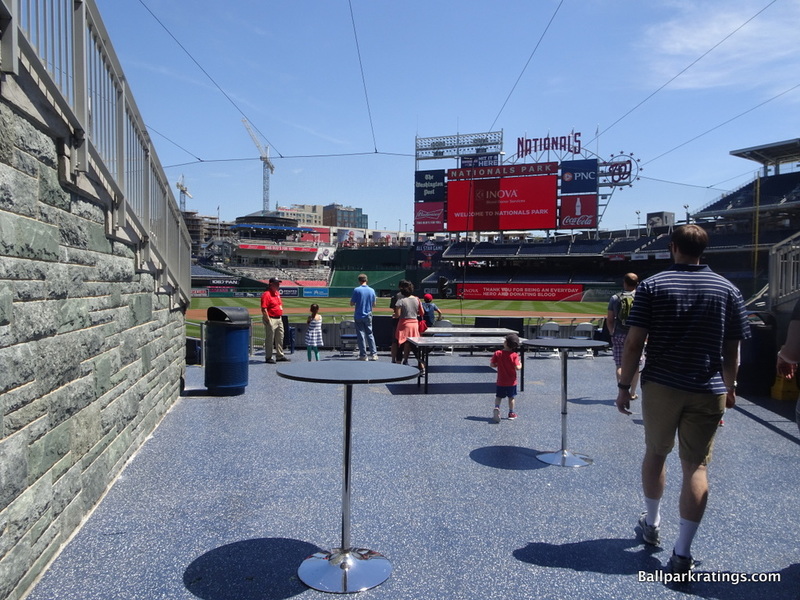 While I wouldn’t characterize any aspect as particularly outstanding, Nationals Park features great amenities across the board. 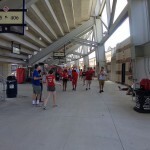 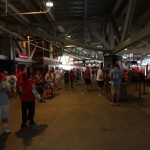 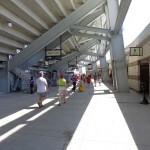 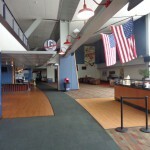 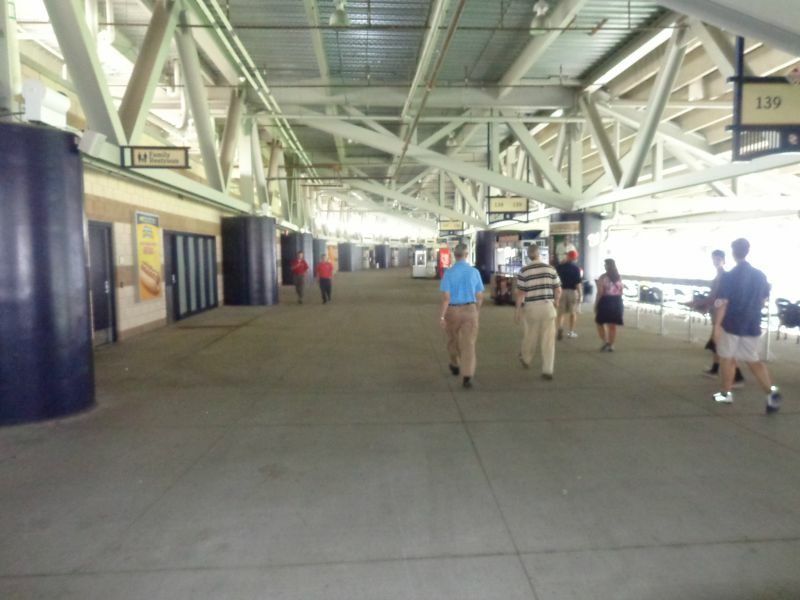 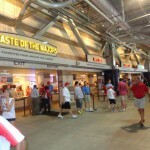 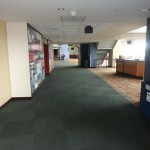 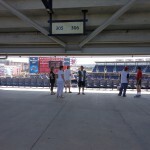 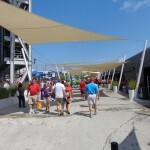 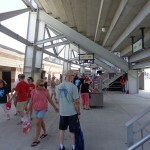 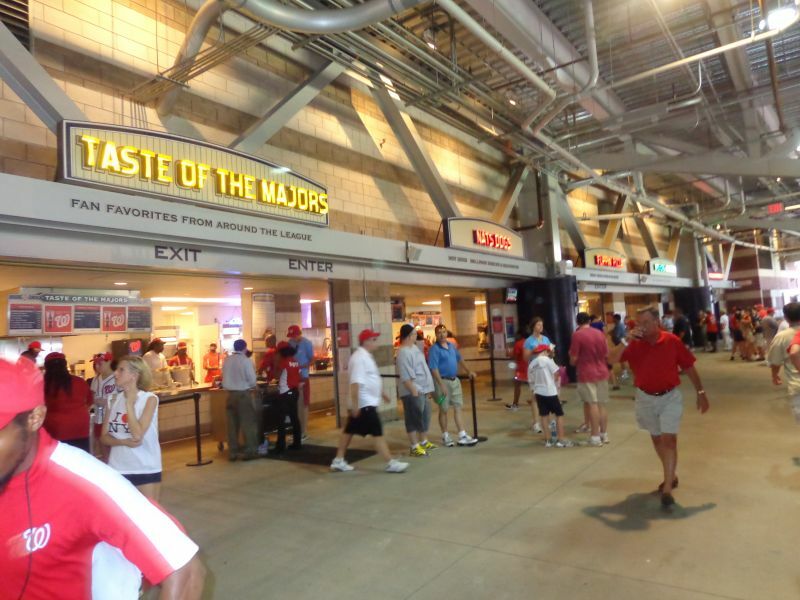 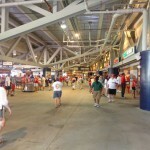 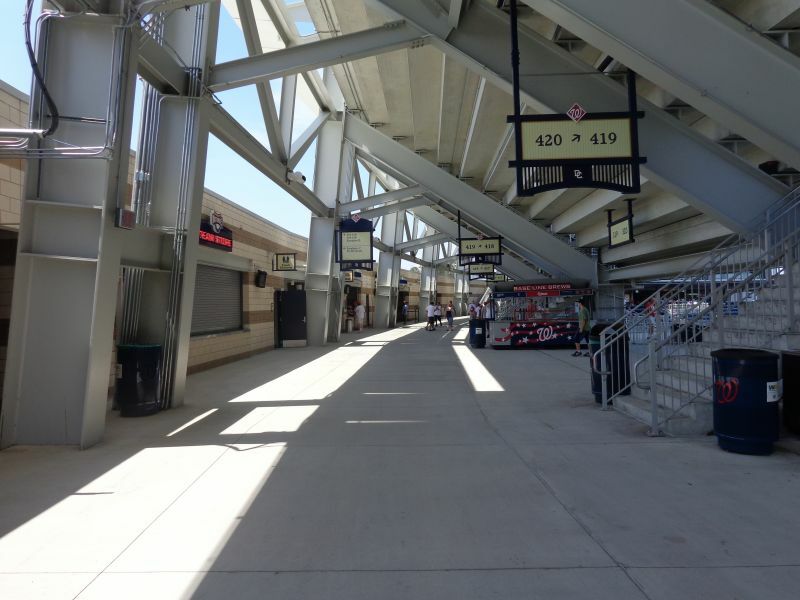 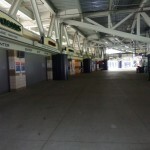 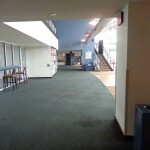 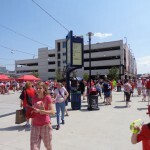 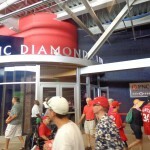 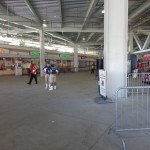 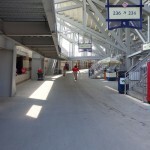 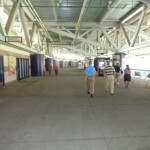 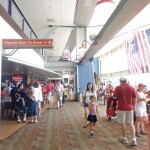 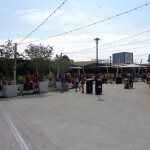 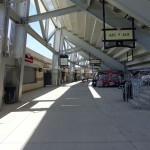 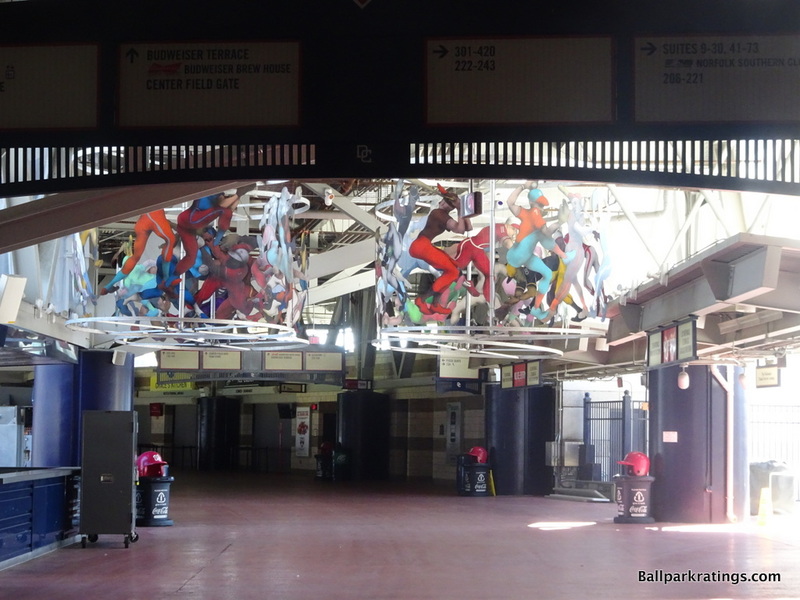 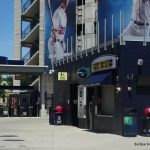 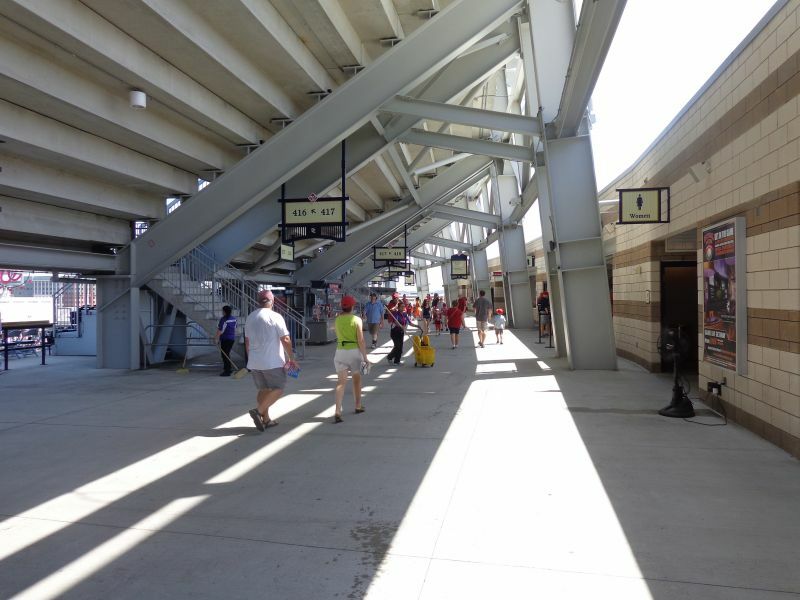 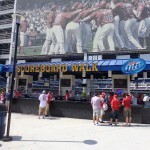 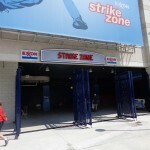 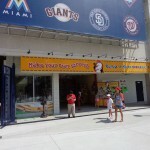 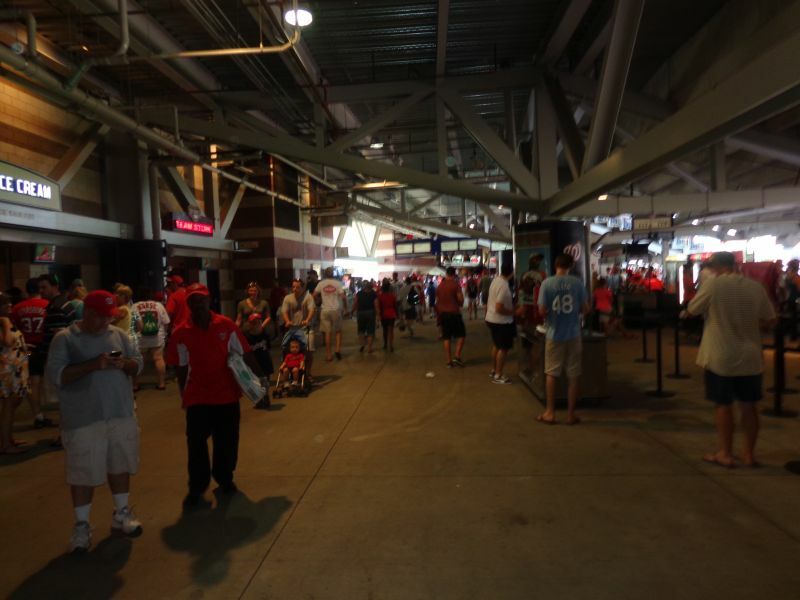 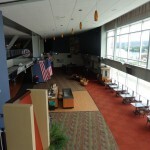 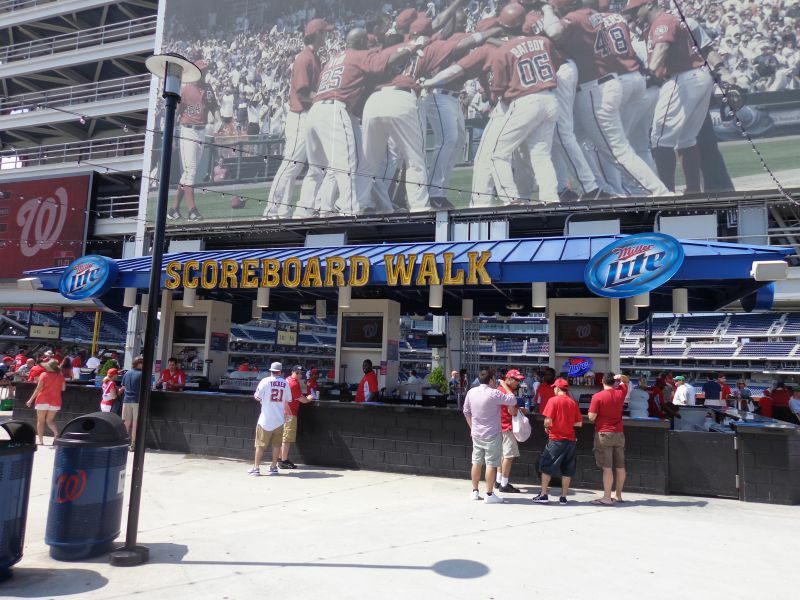 The Scoreboard Walk (now called the Budweiser Terrace) is shown here. 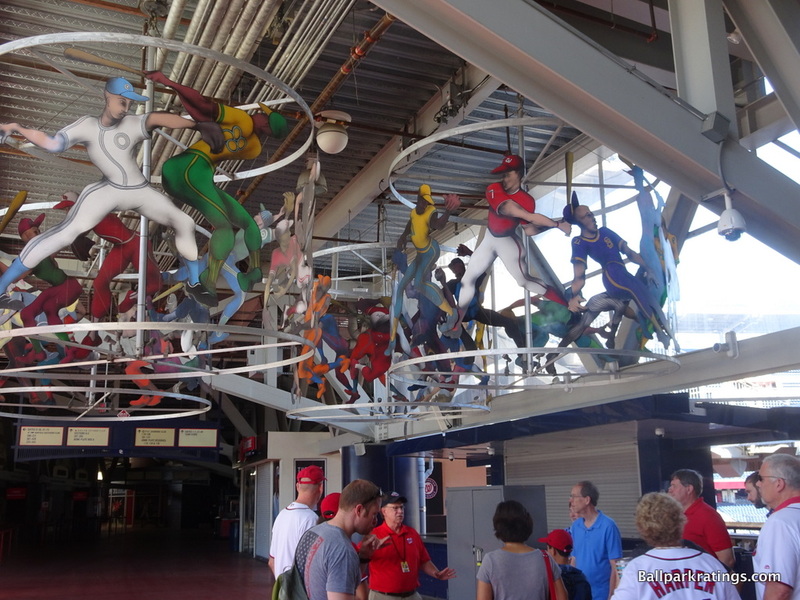 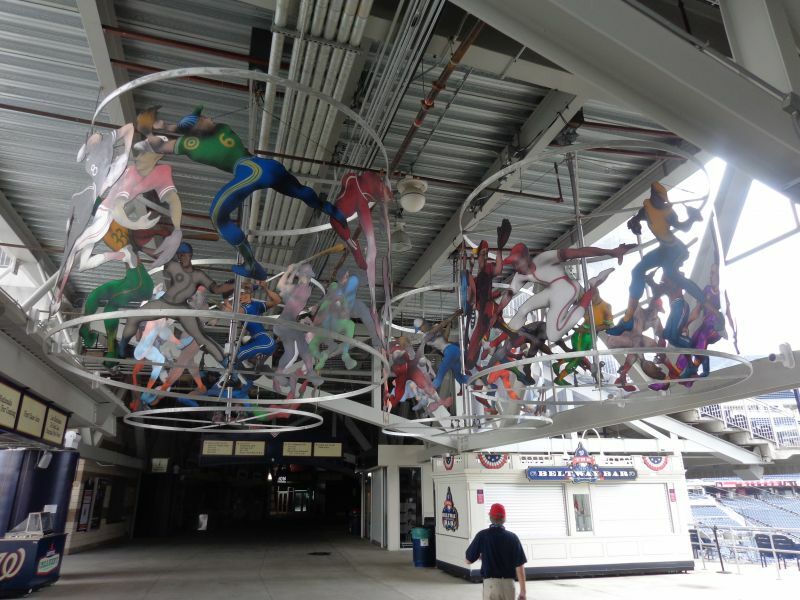 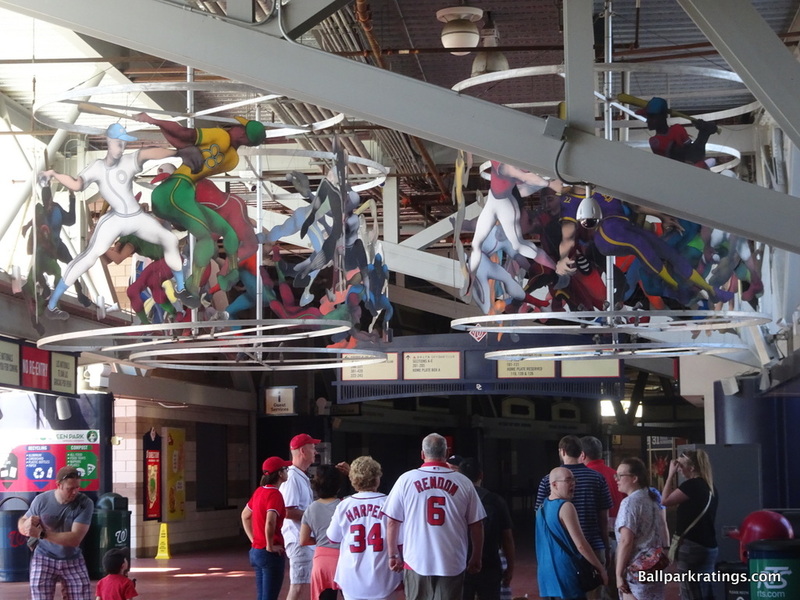 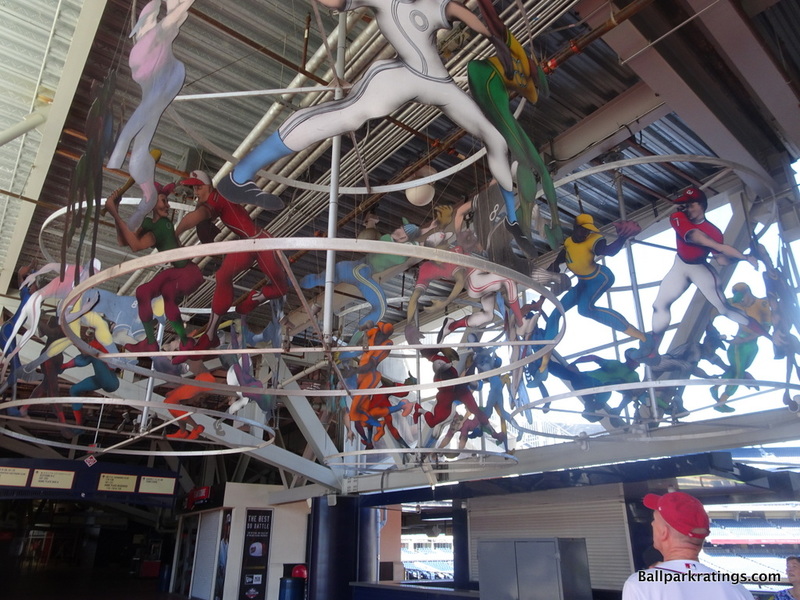 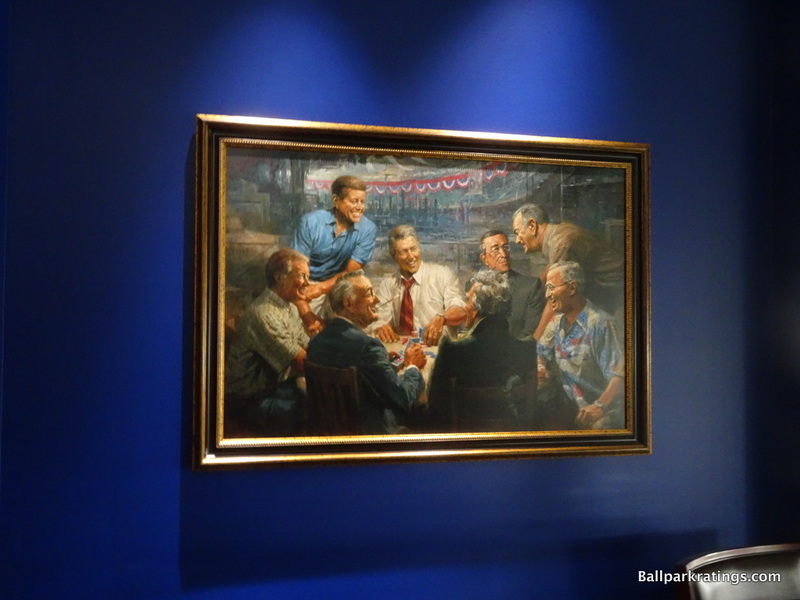 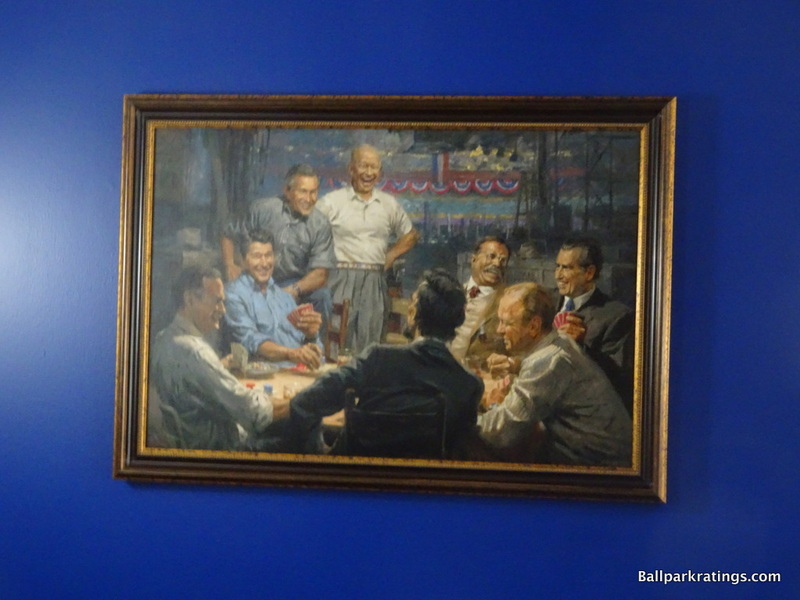 Nationals Park’s general well-roundedness as a ballpark experience becomes particularly apparent at this point, as one might marvel at the general openness of the concourse system and glance at some thoughtful artwork above. 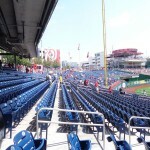 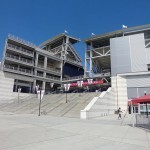 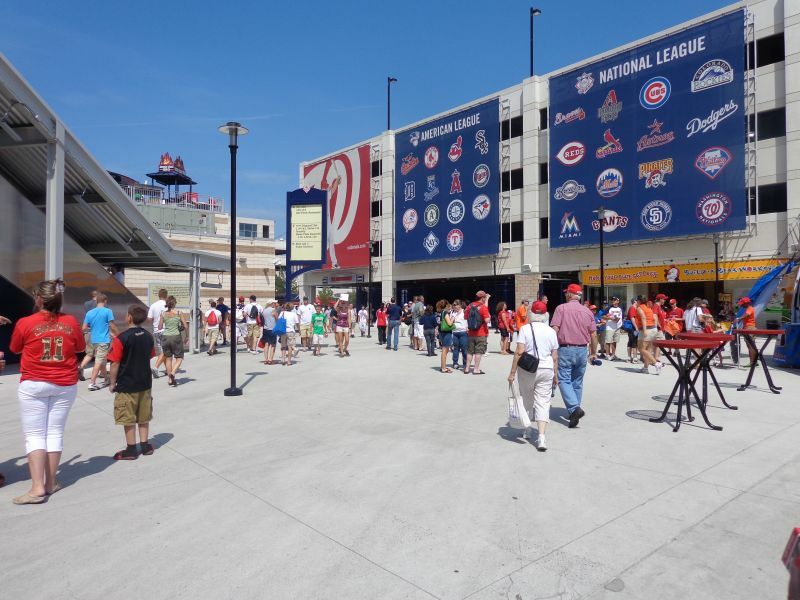 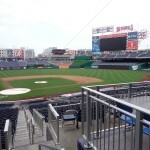 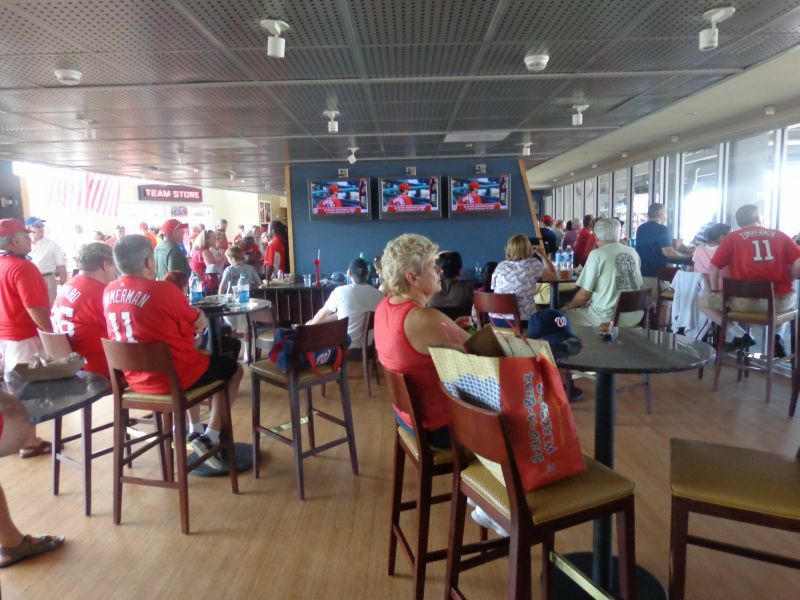 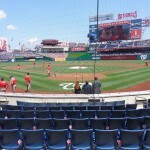 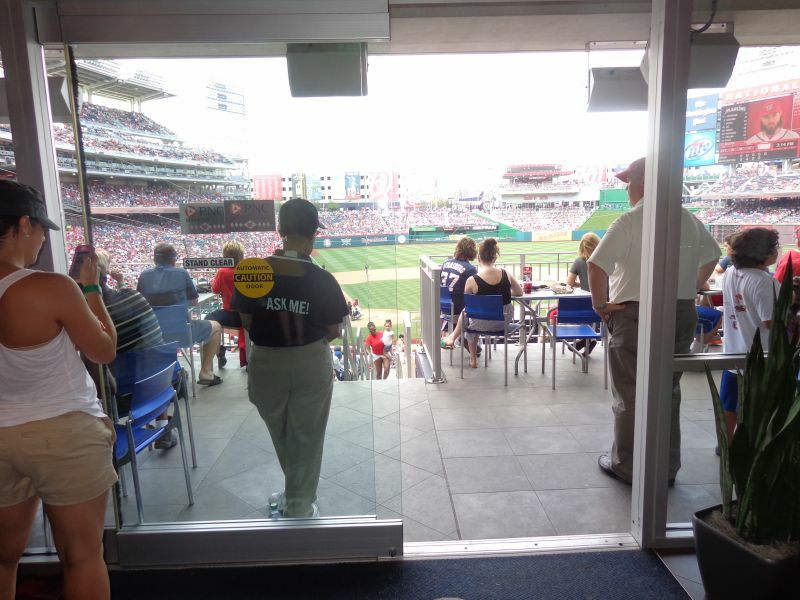 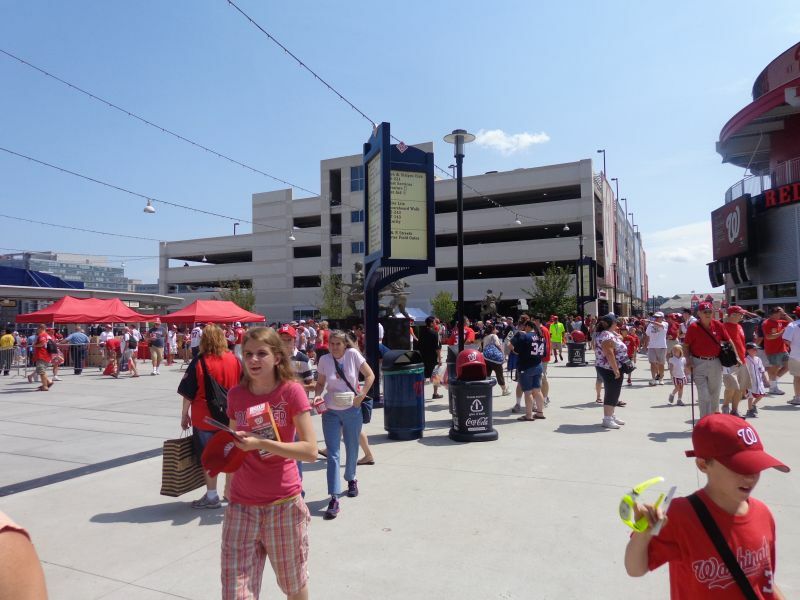 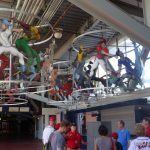 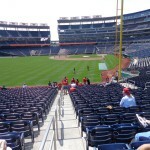 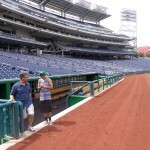 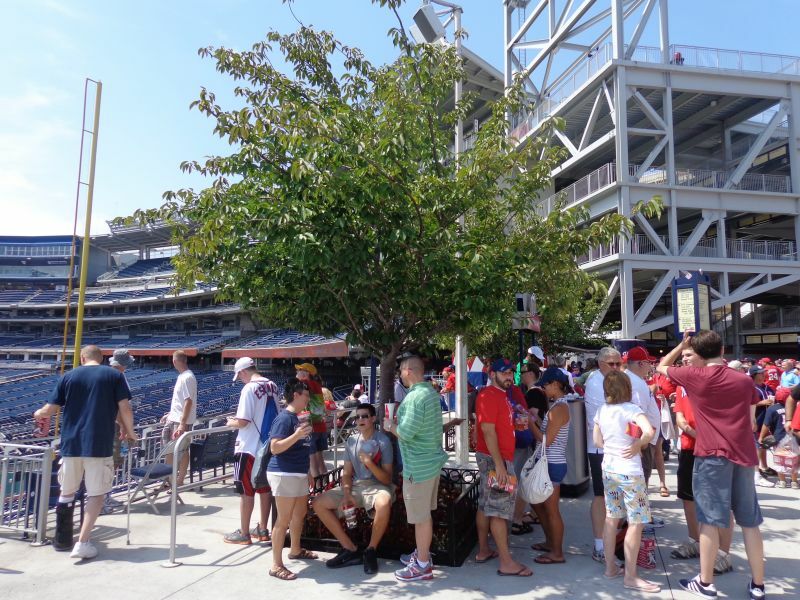 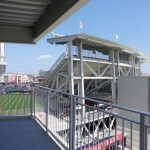 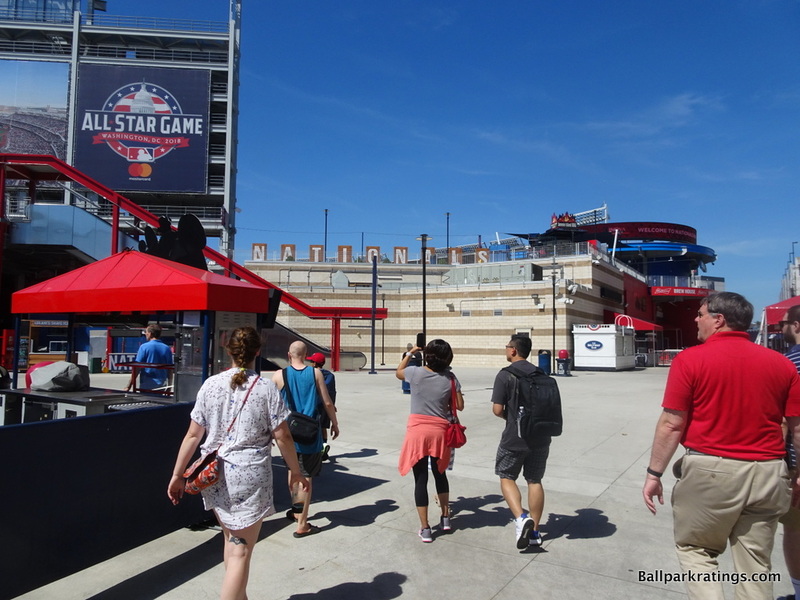 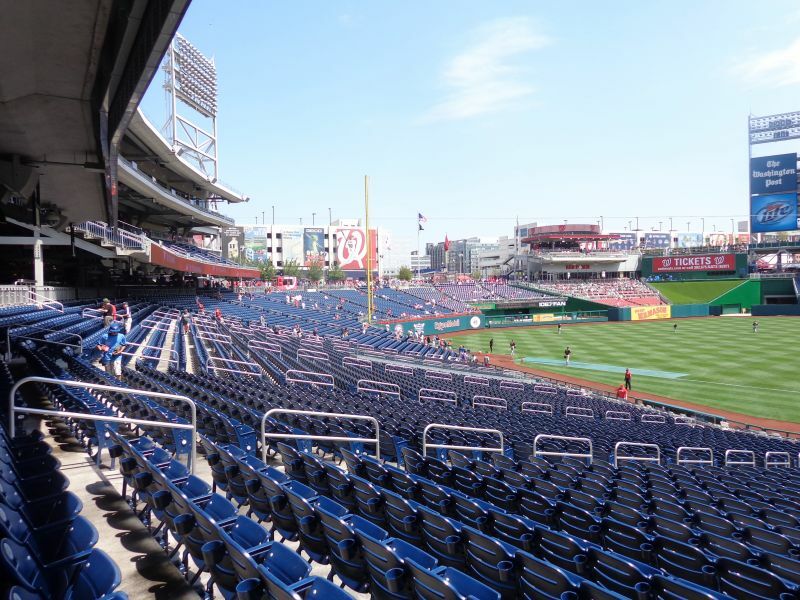 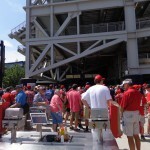 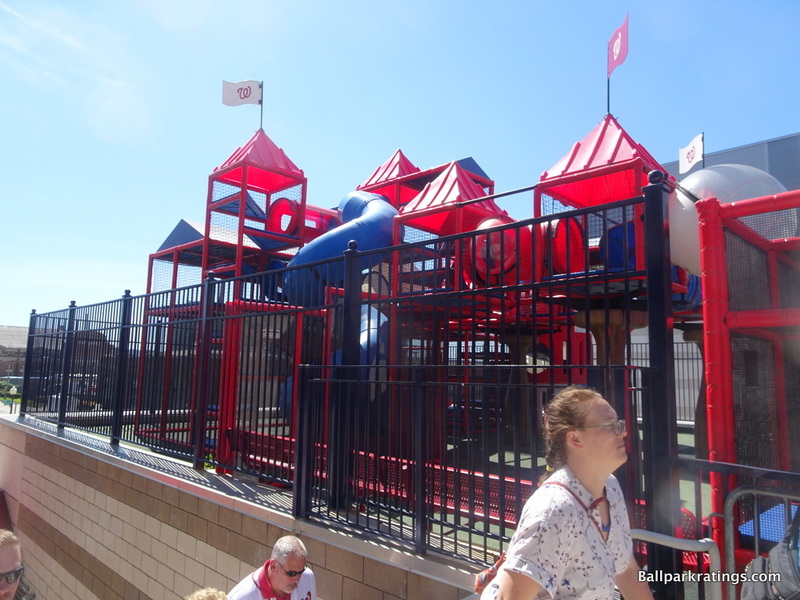 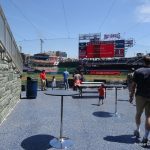 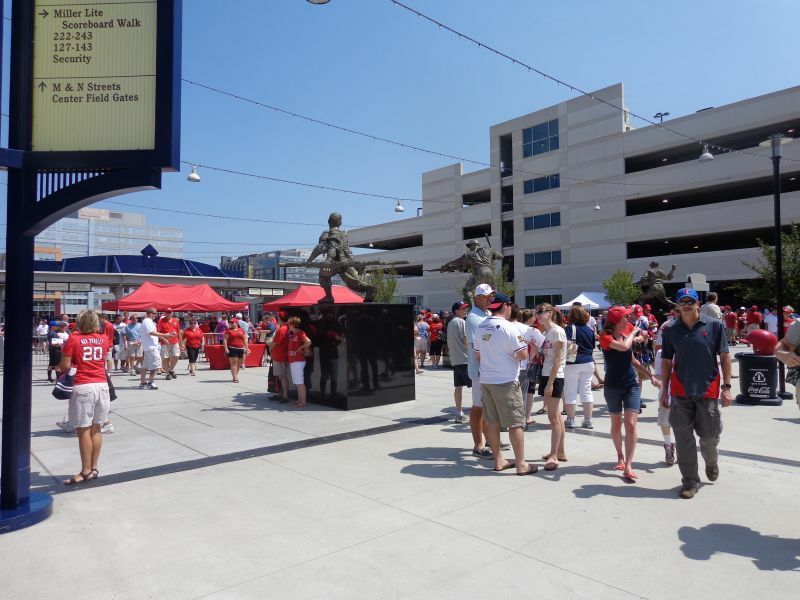 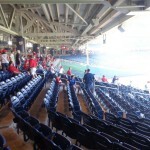 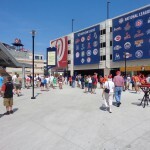 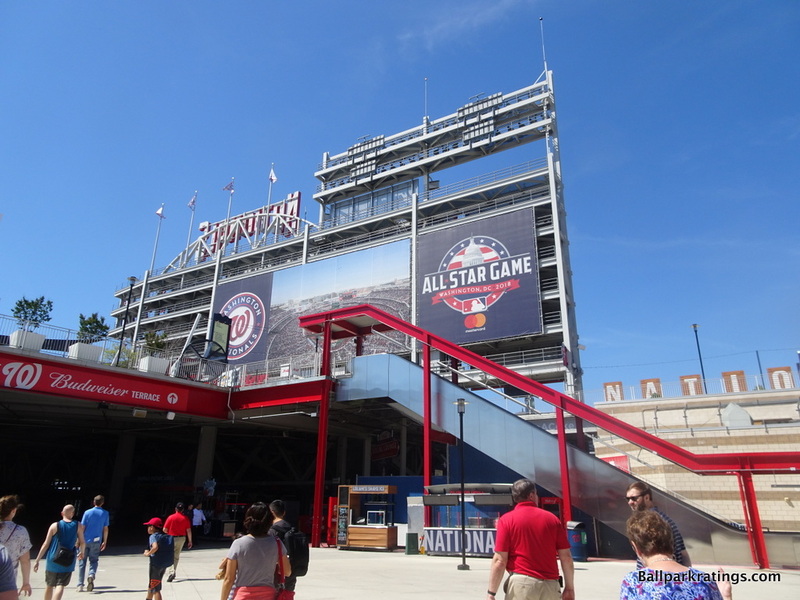 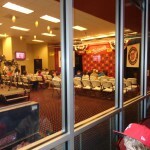 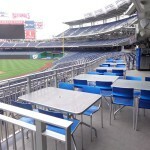 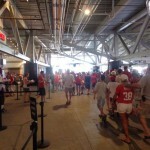 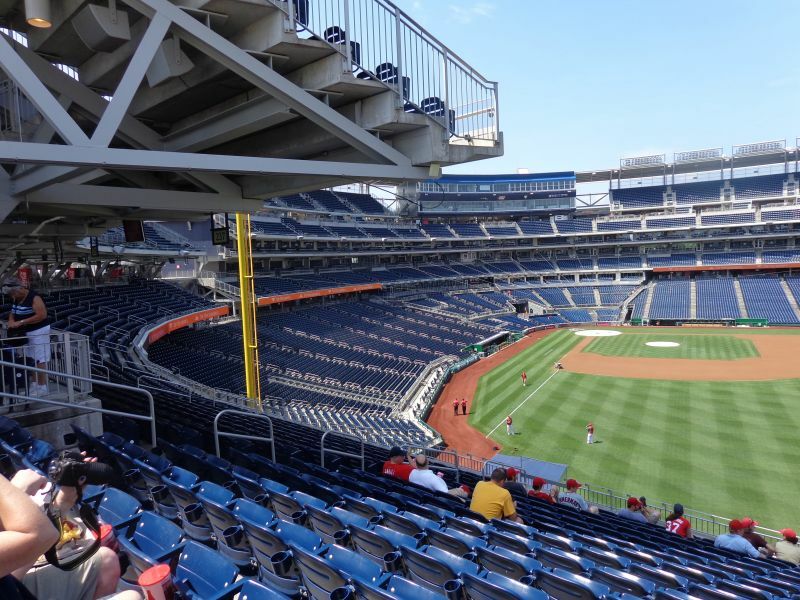 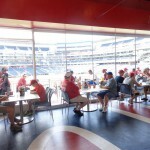 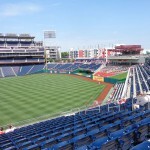 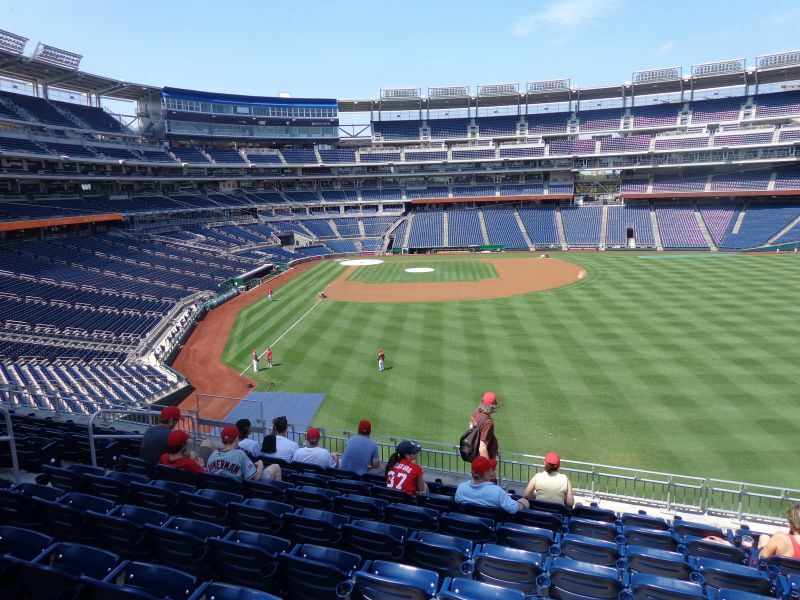 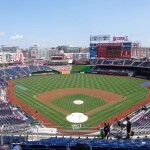 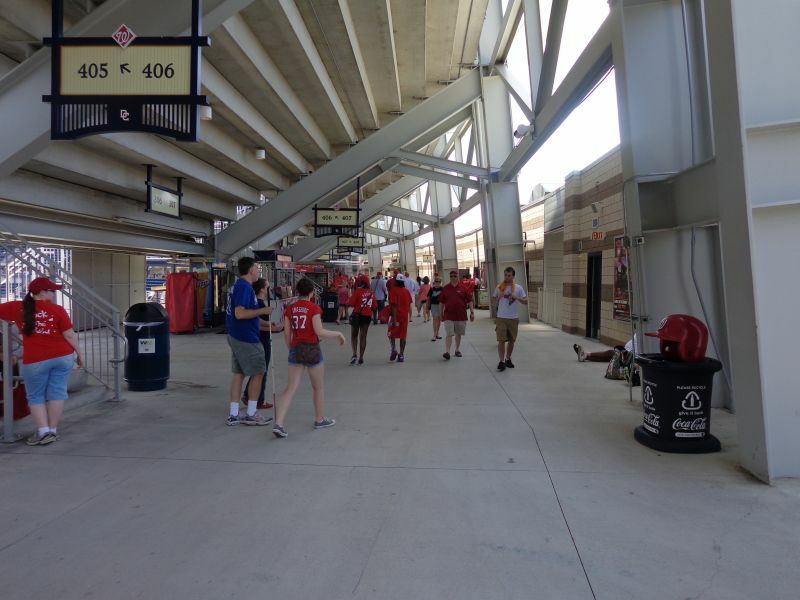 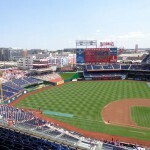 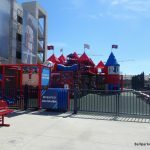 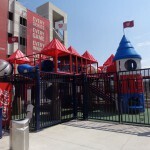 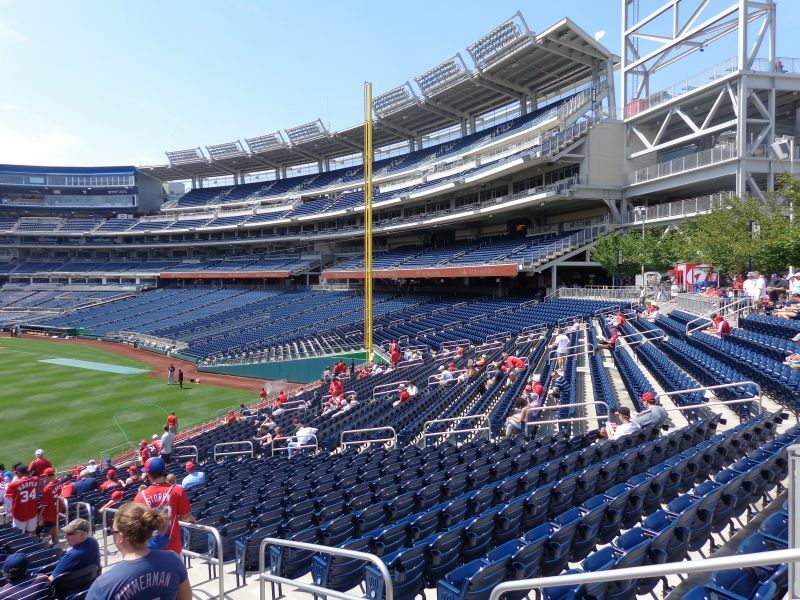 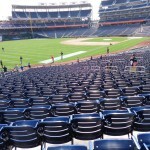 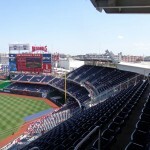 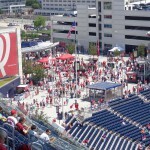 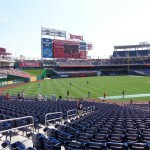 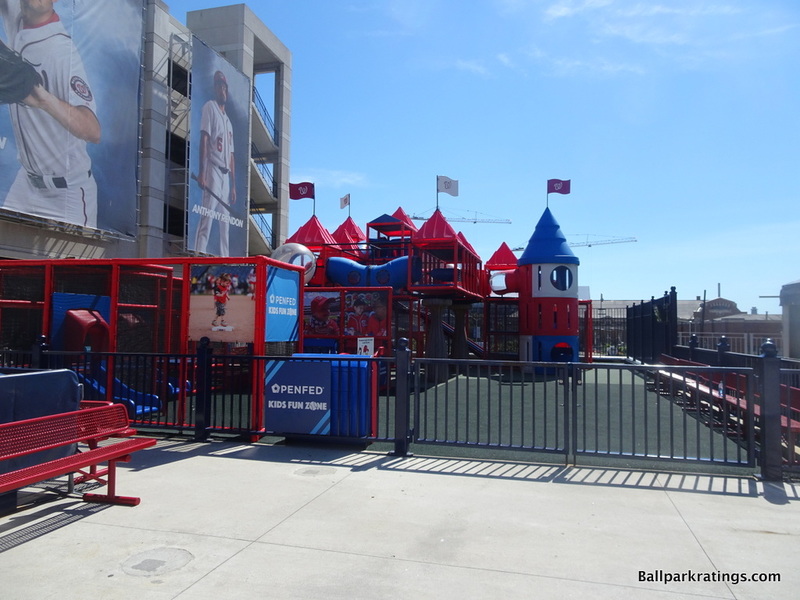 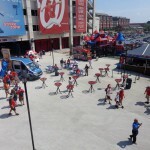 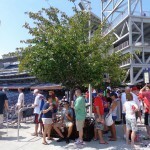 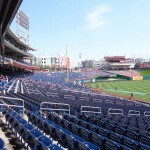 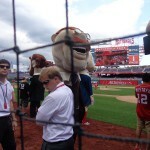 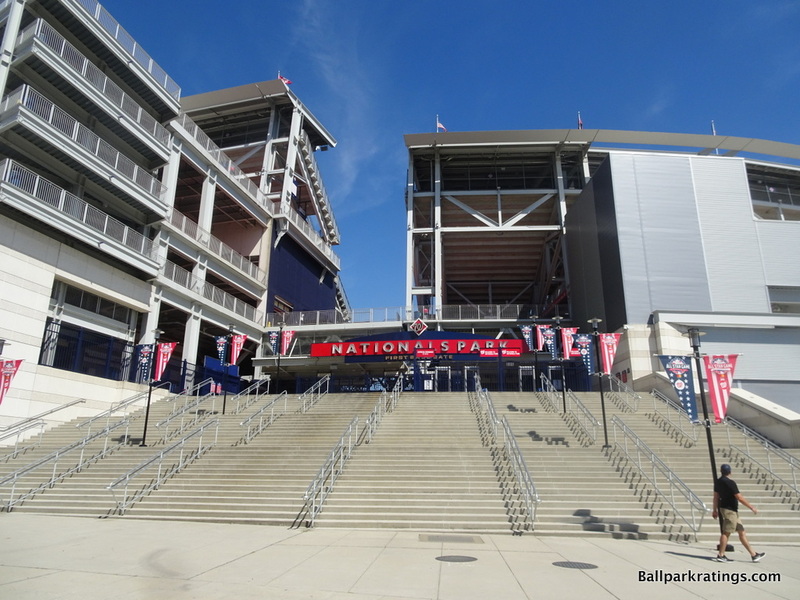 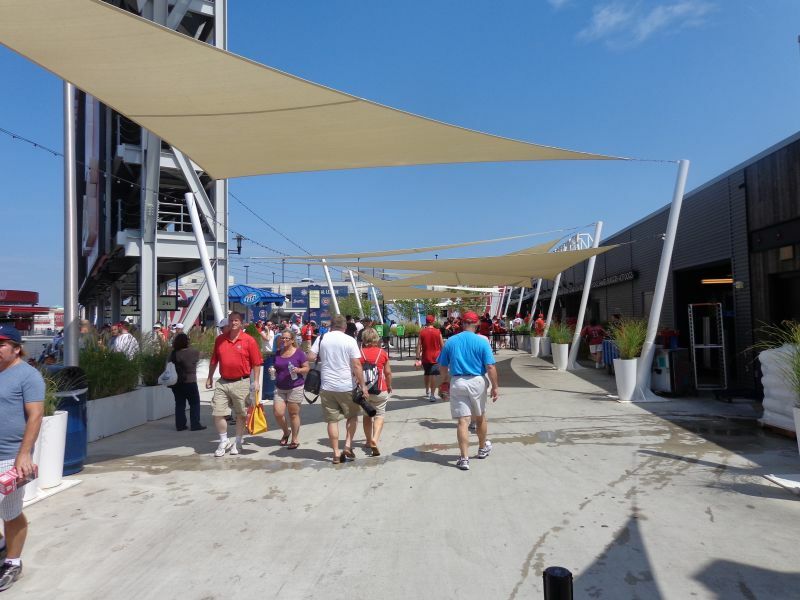 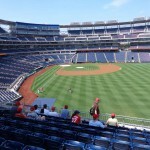 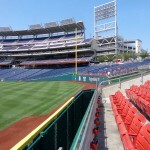 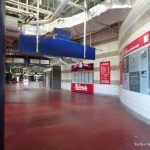 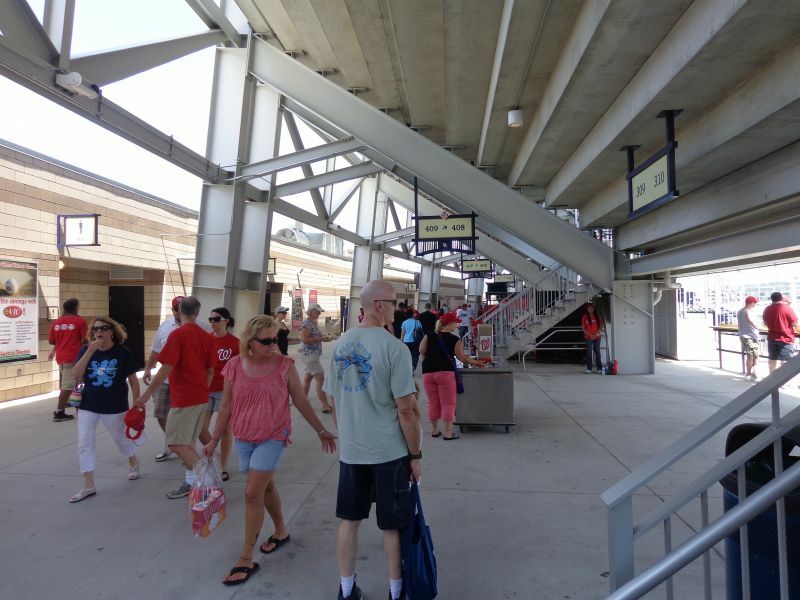 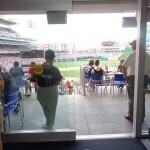 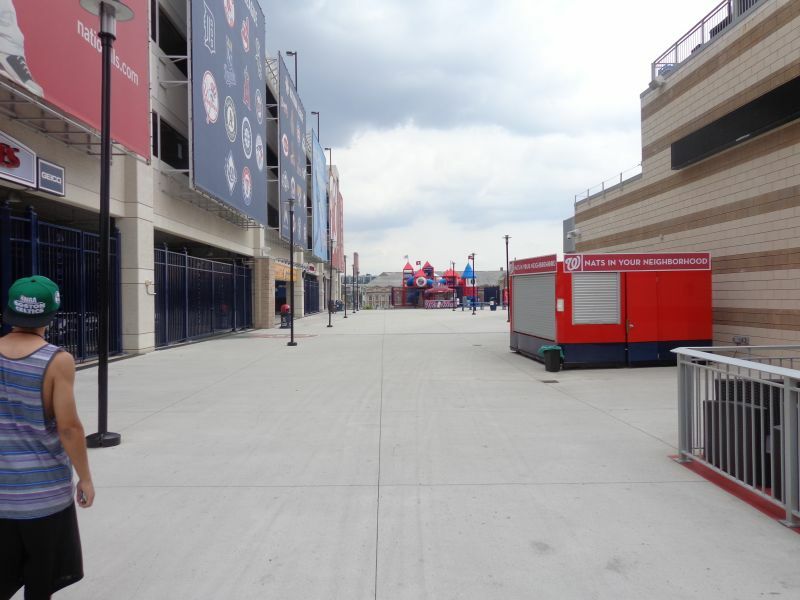 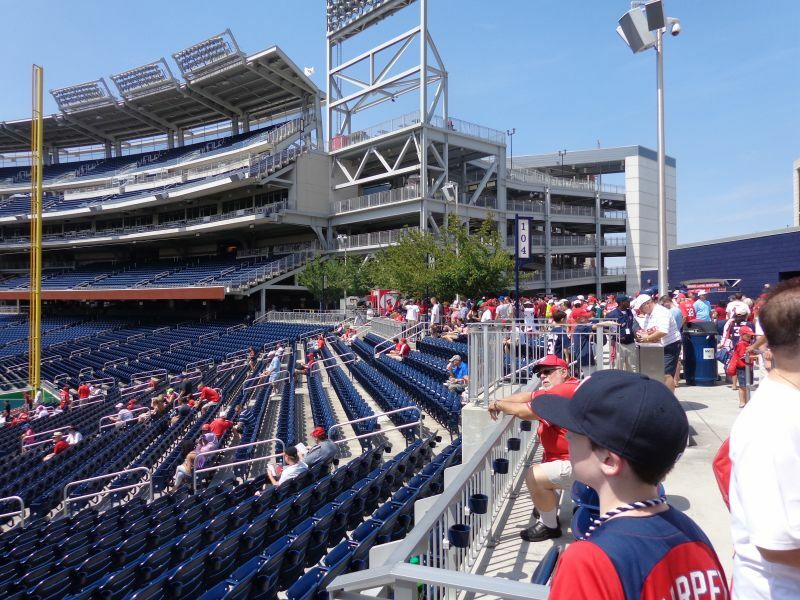 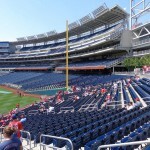 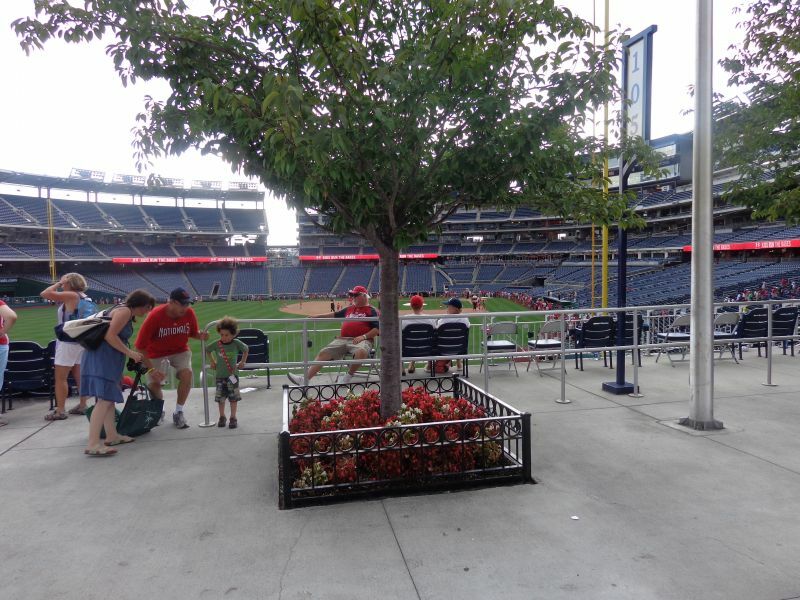 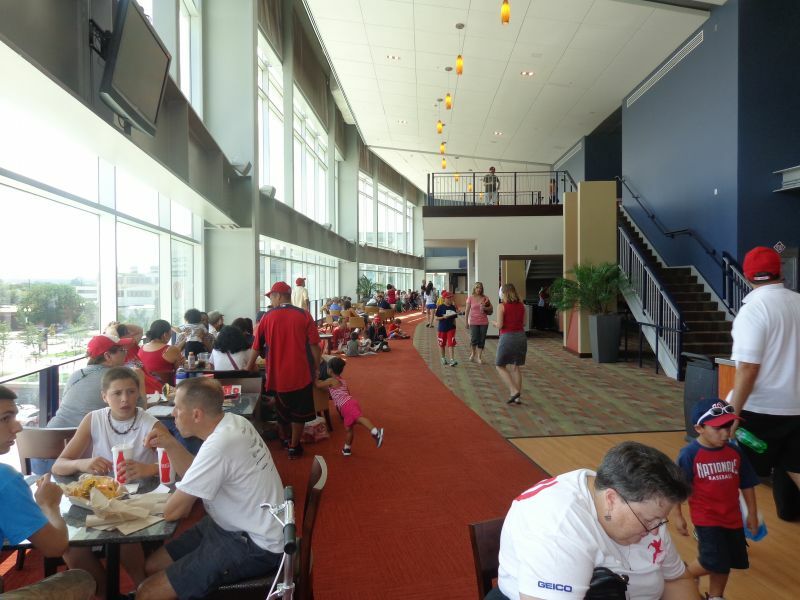 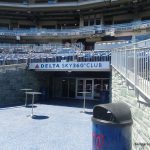 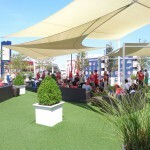 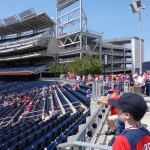 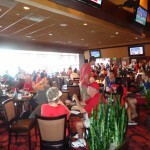 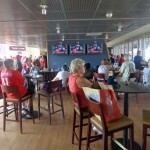 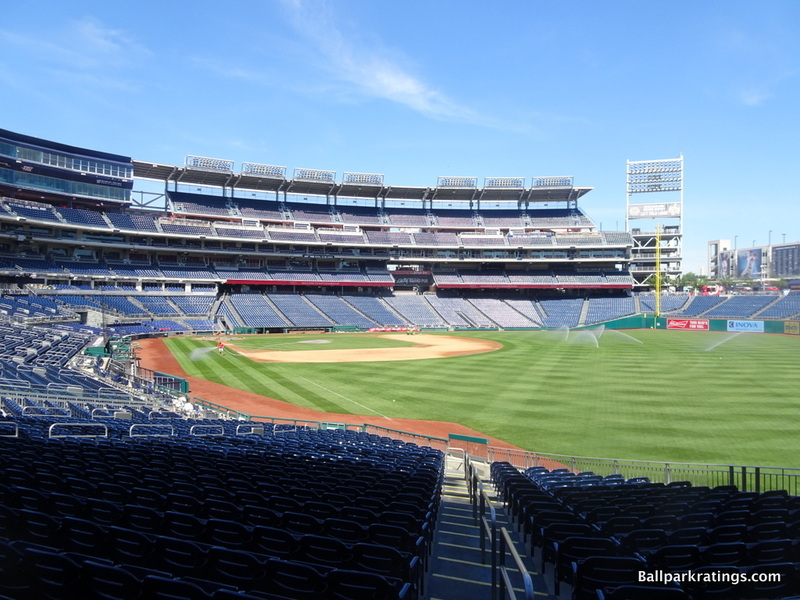 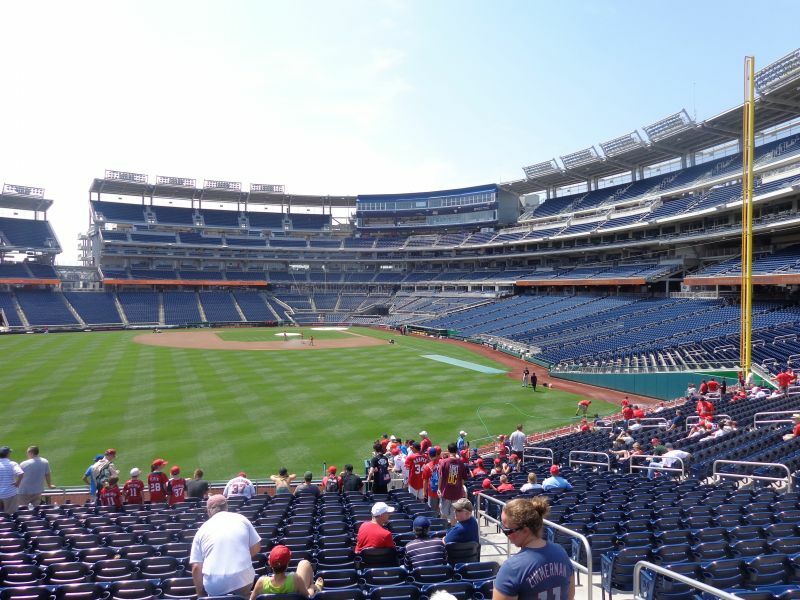 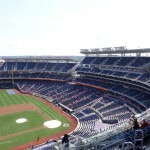 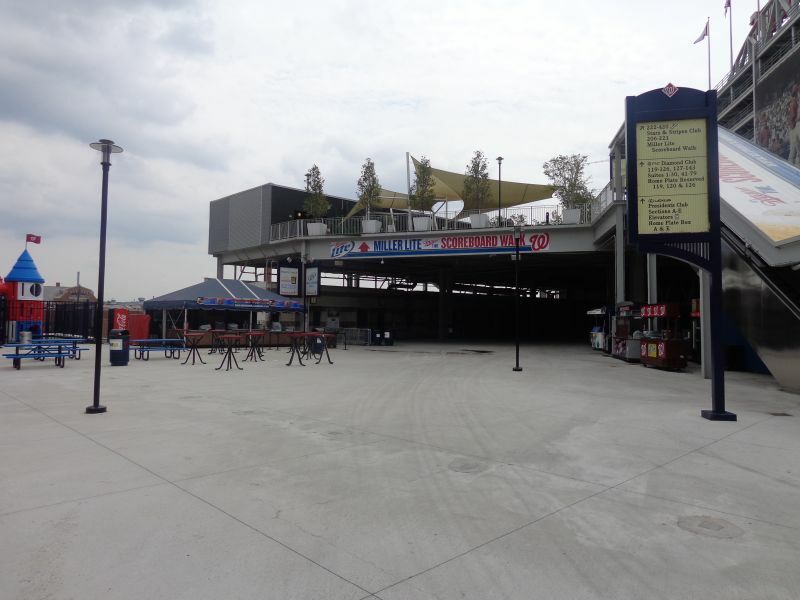 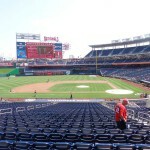 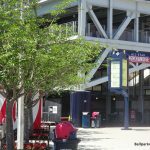 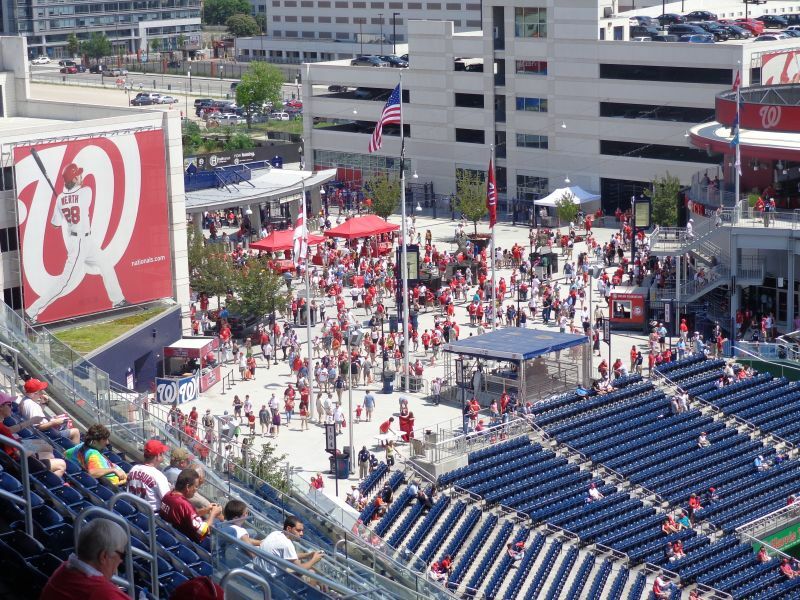 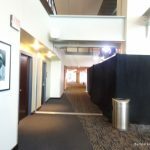 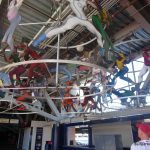 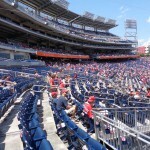 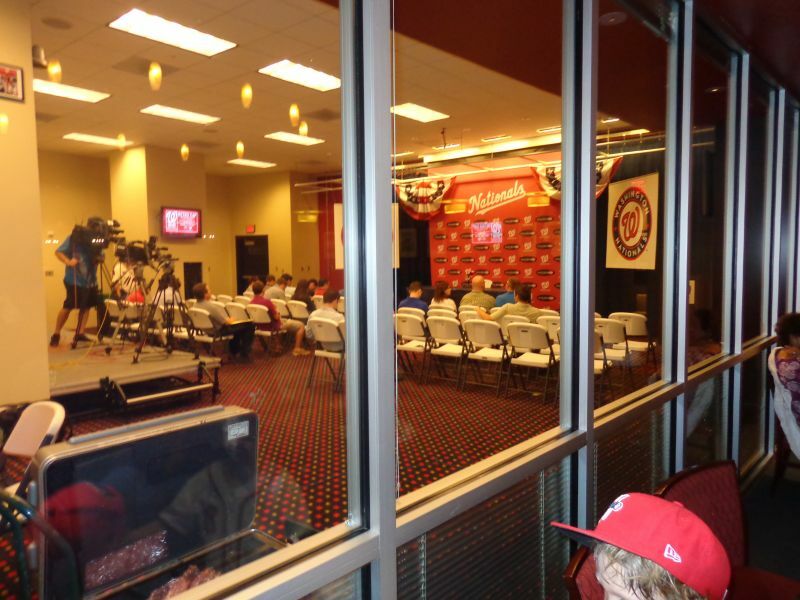 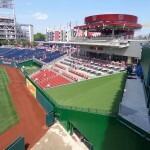 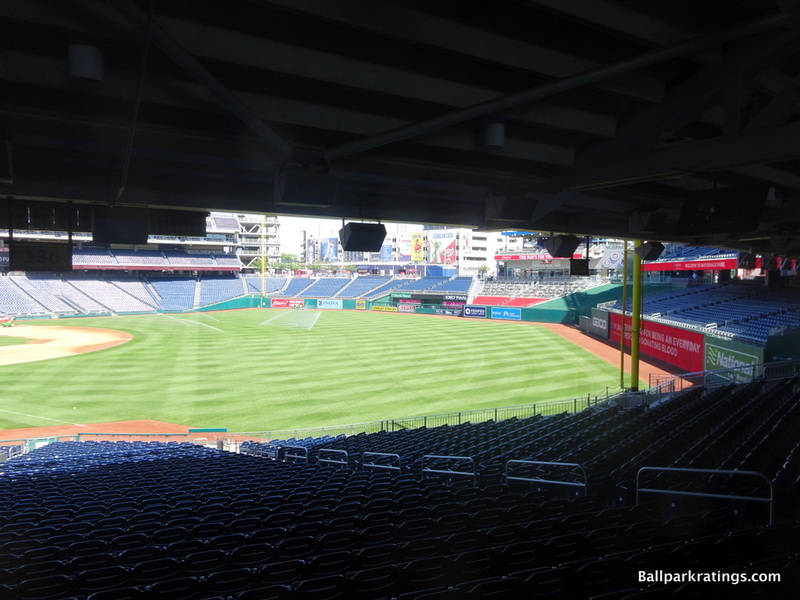 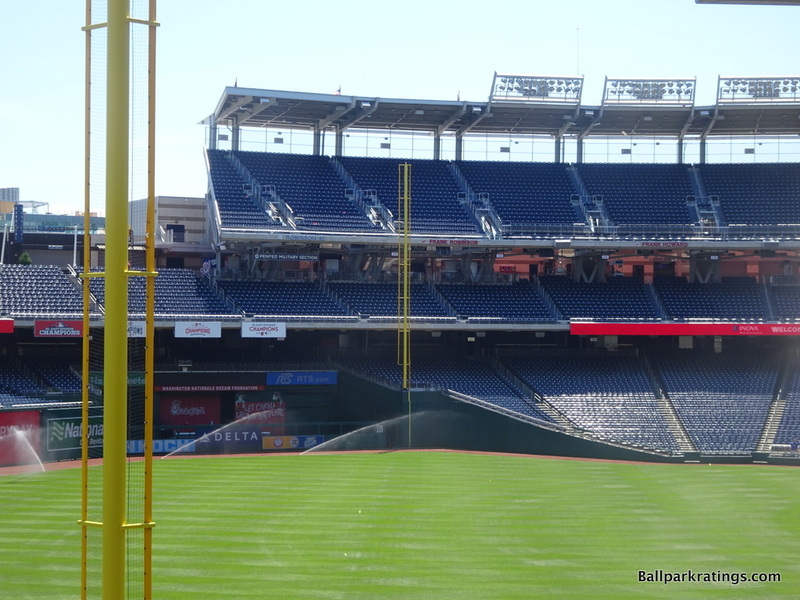 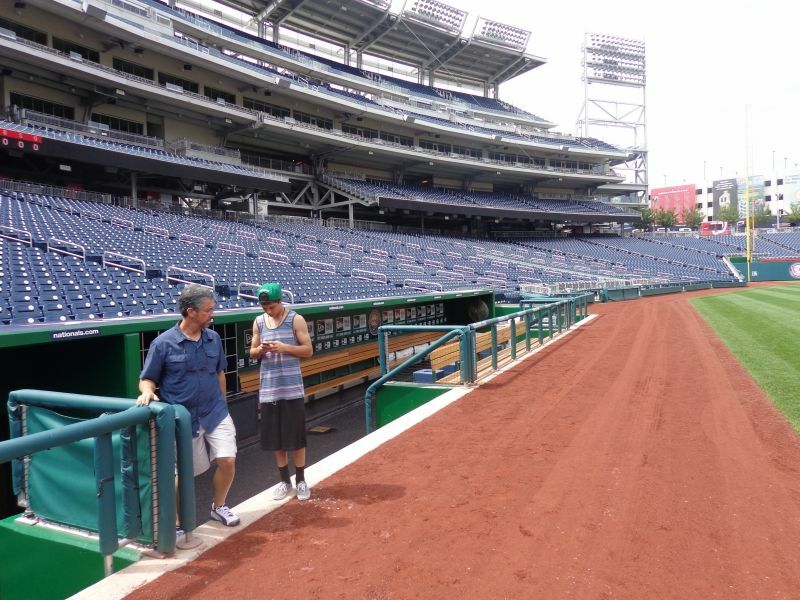 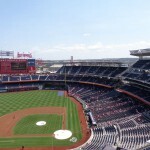 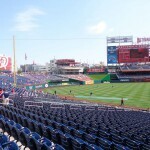 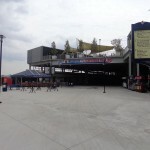 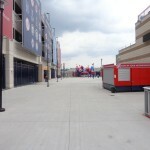 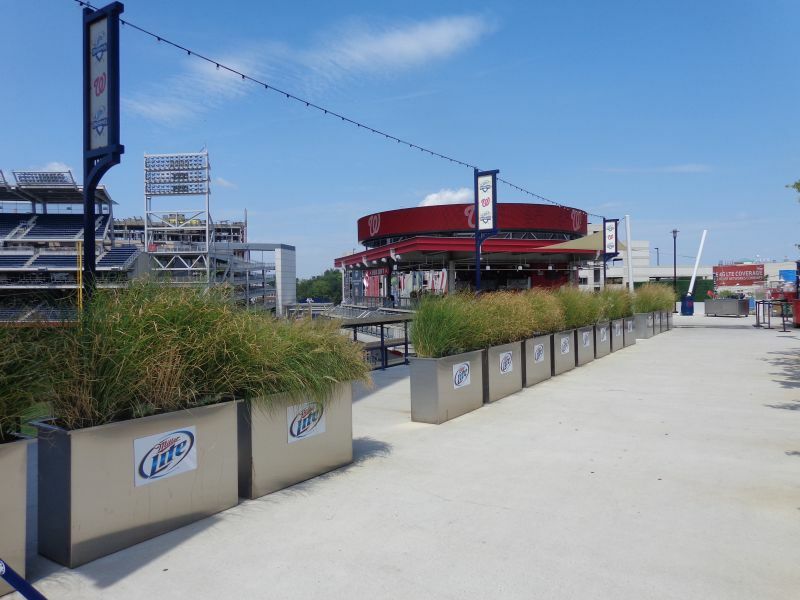 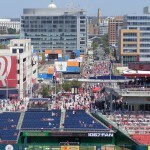 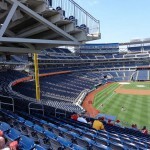 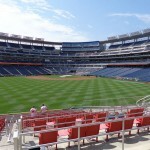 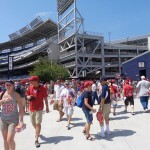 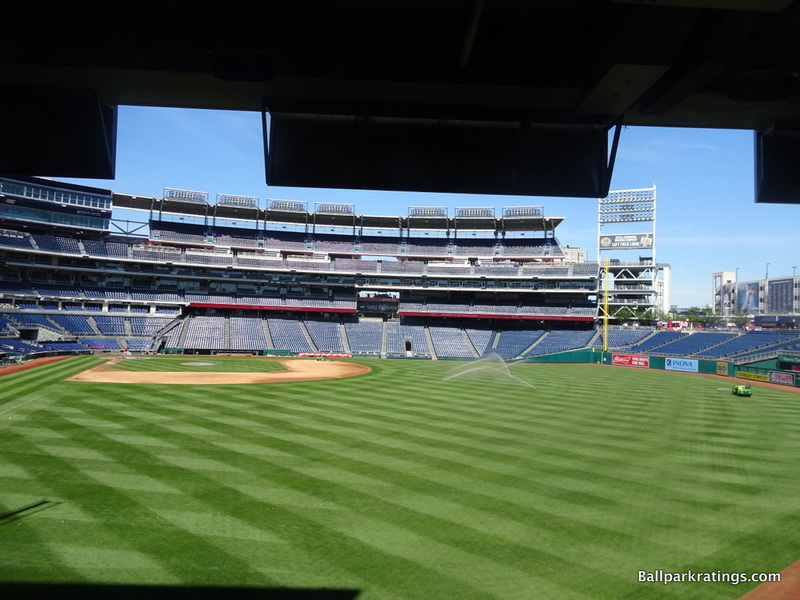 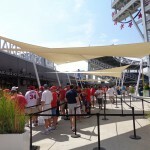 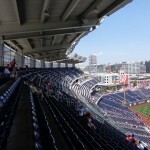 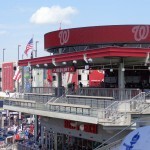 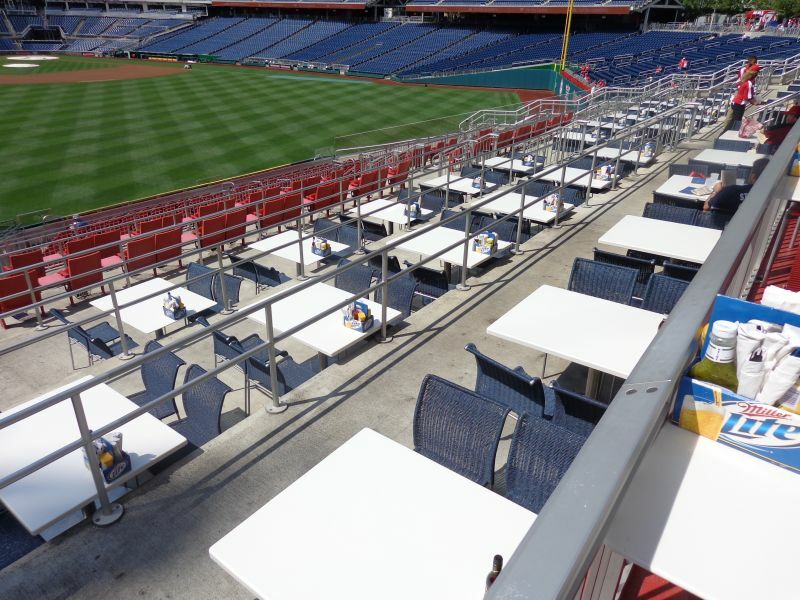 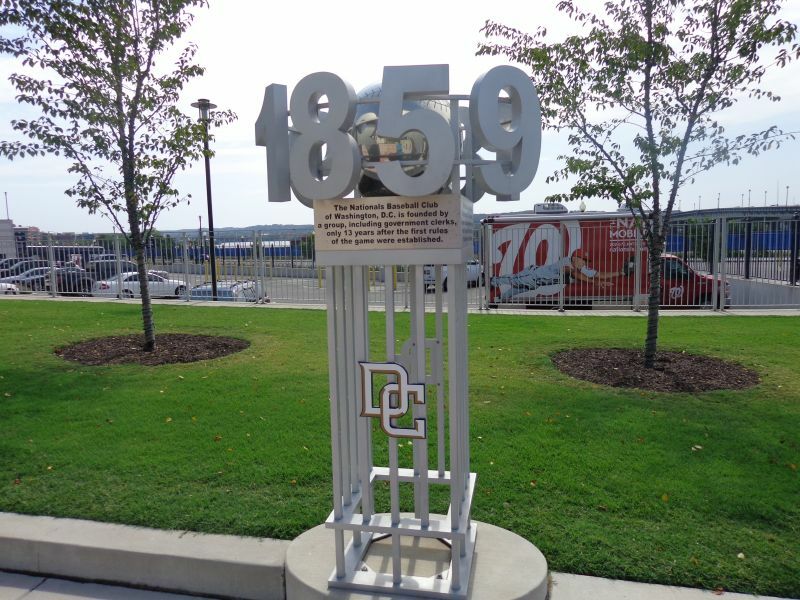 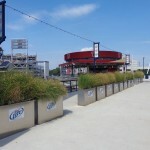 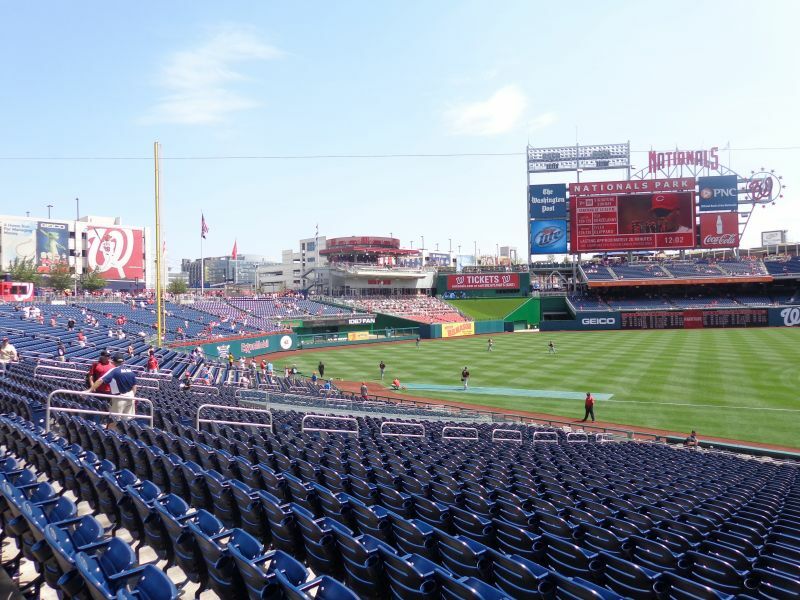 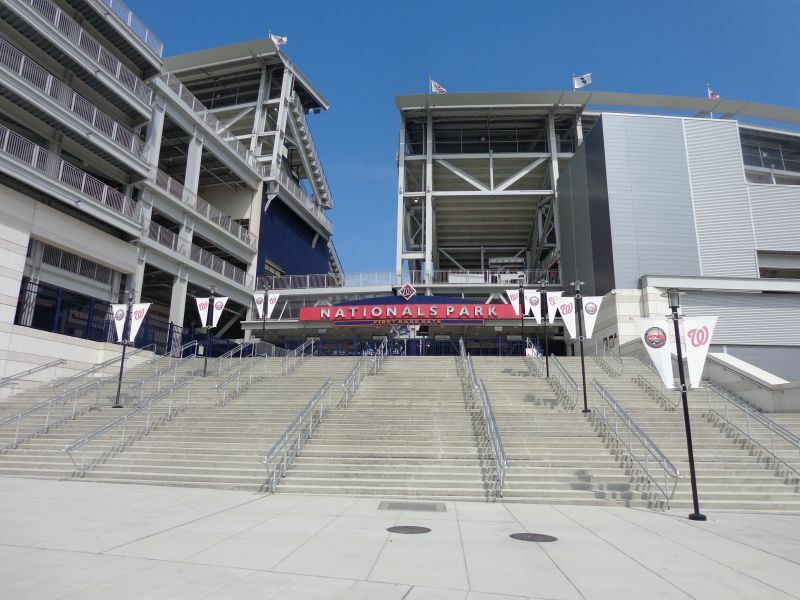 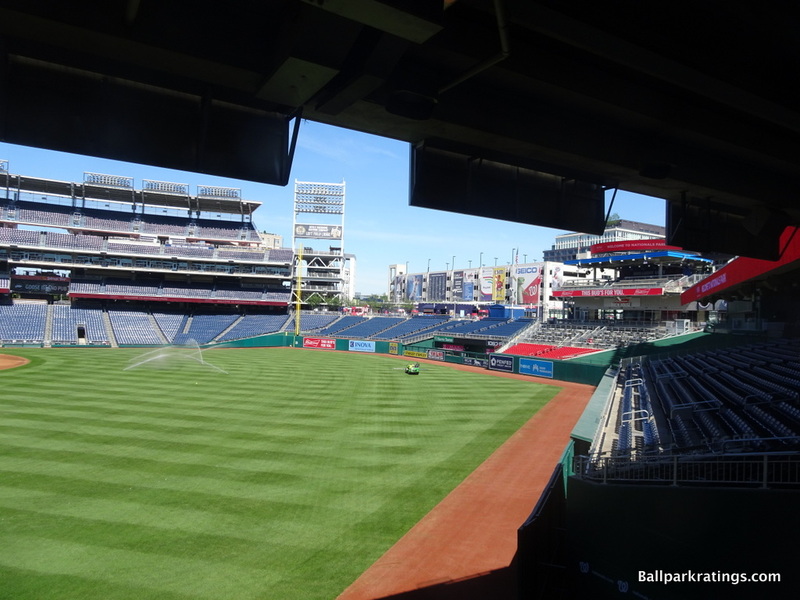 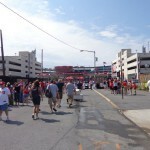 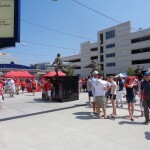 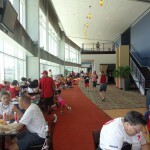 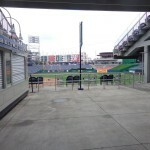 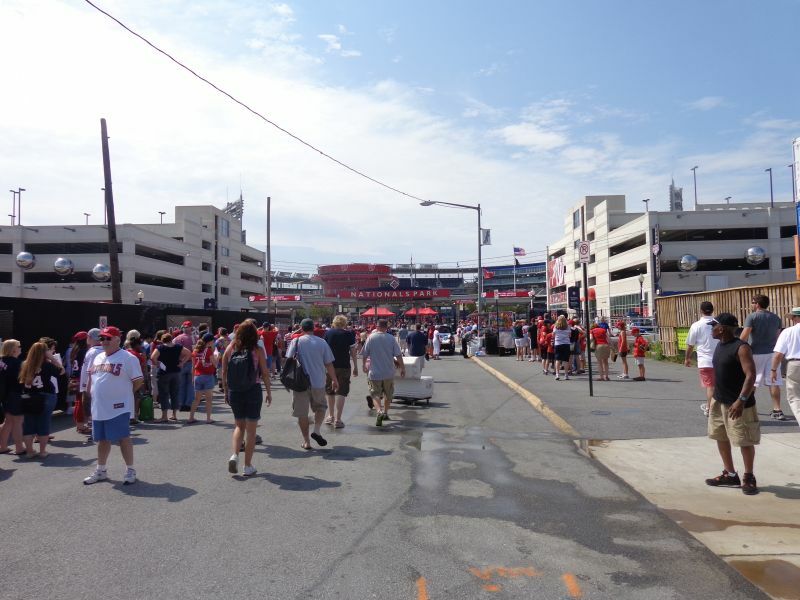 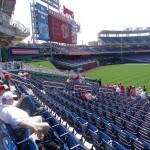 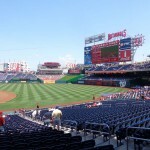 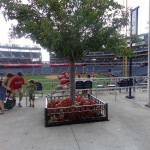 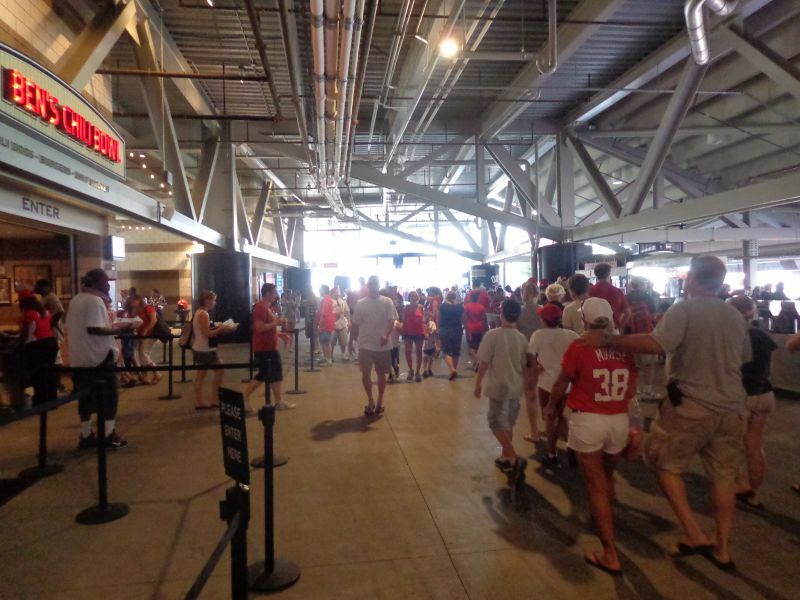 Nationals Park continued the trend started by Citizens Bank Park in Philadelphia by encouraging fans to walk around and enjoy the game from different vantage points. 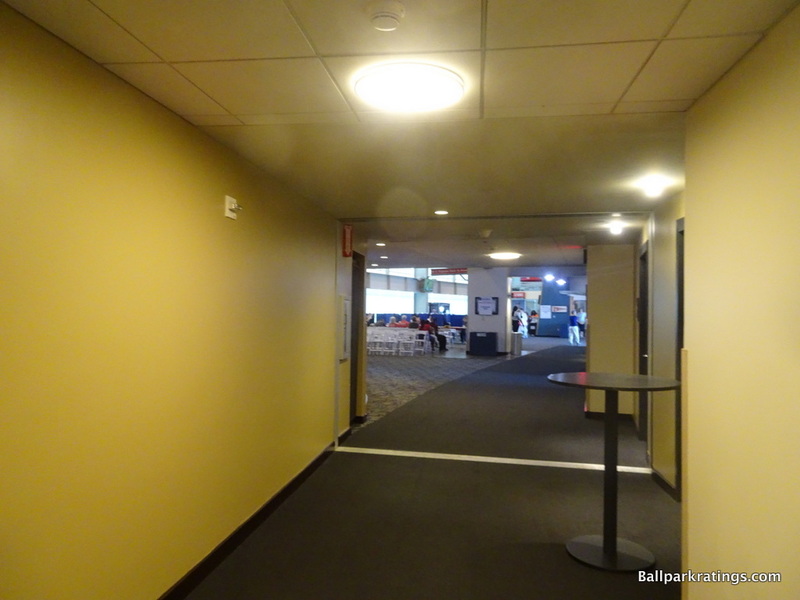 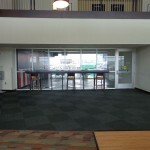 Openness from the concourses is a big theme here. 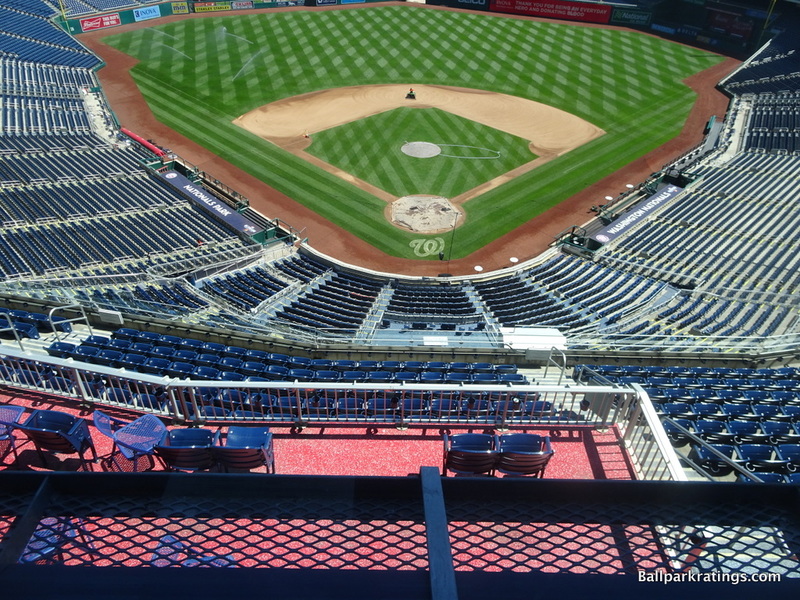 D.C.’s ballpark is particularly functional, and I mean that as a compliment. 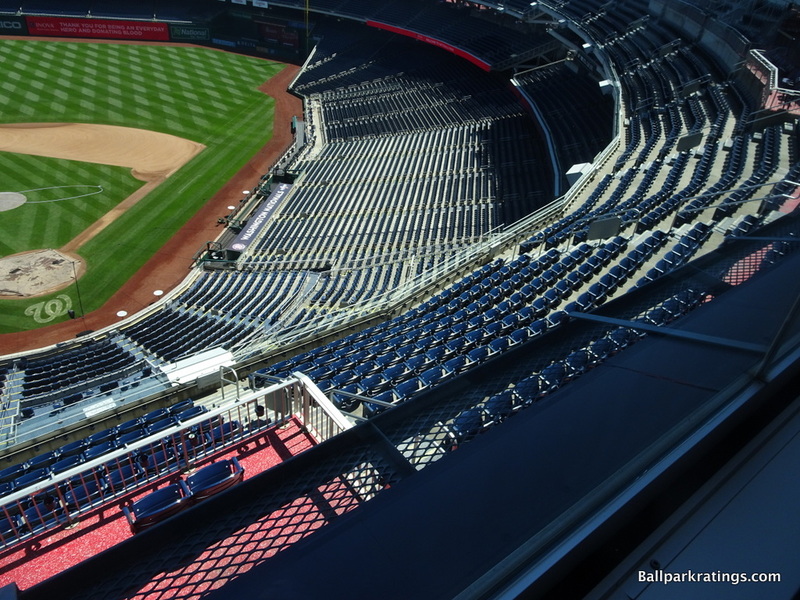 If I had to pick one flaw, it is that the upper decks are too pushed back, even for a new park. 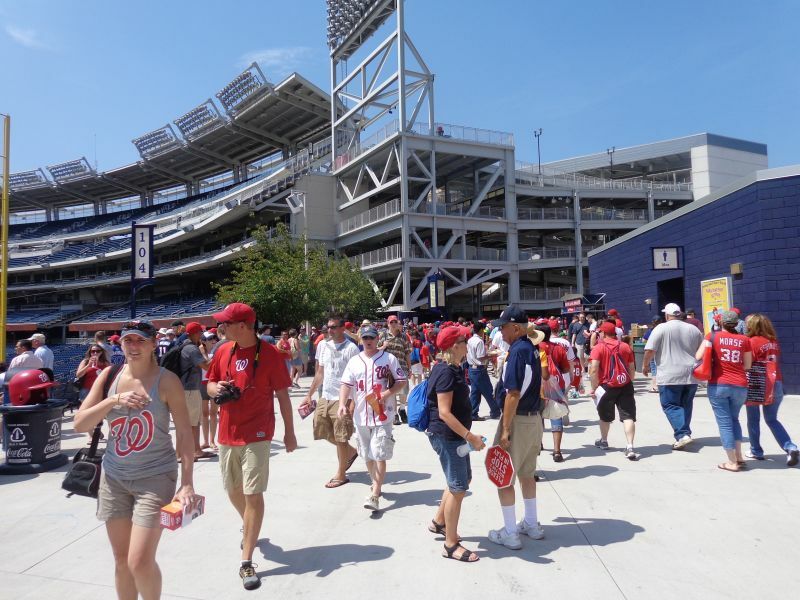 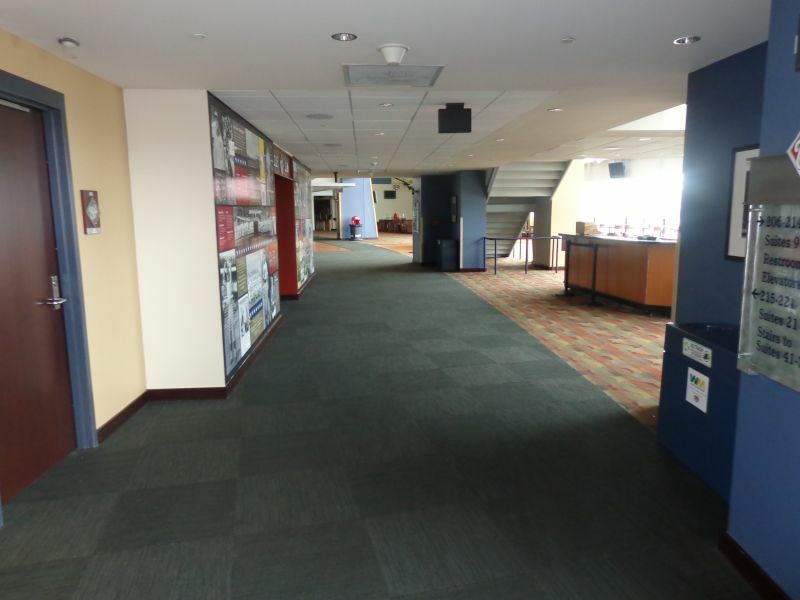 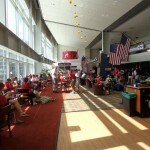 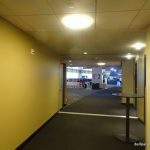 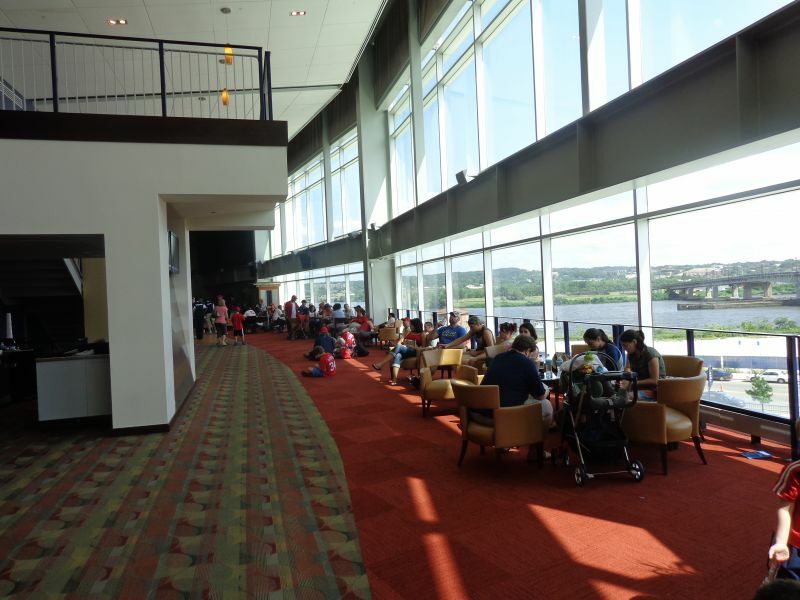 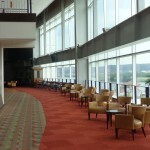 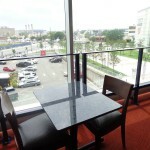 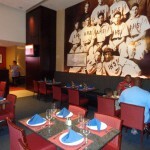 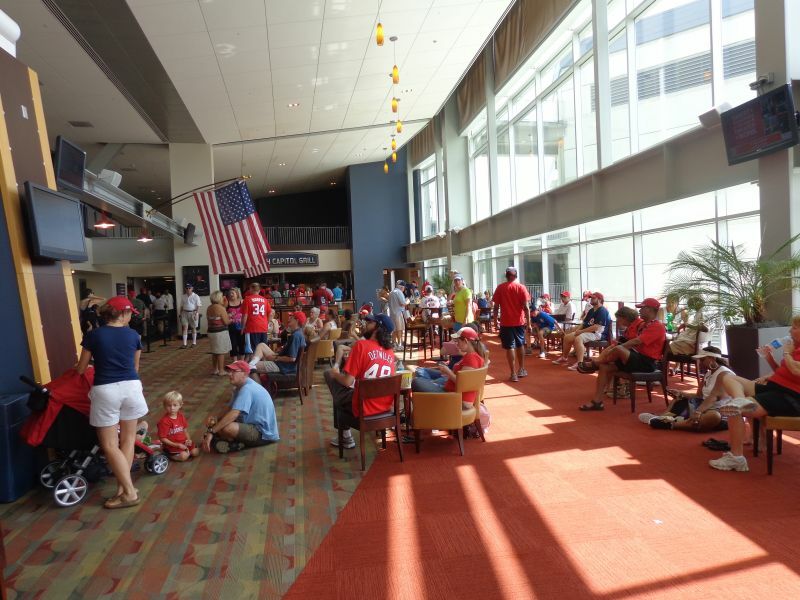 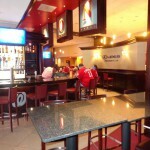 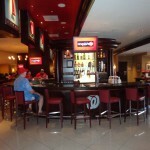 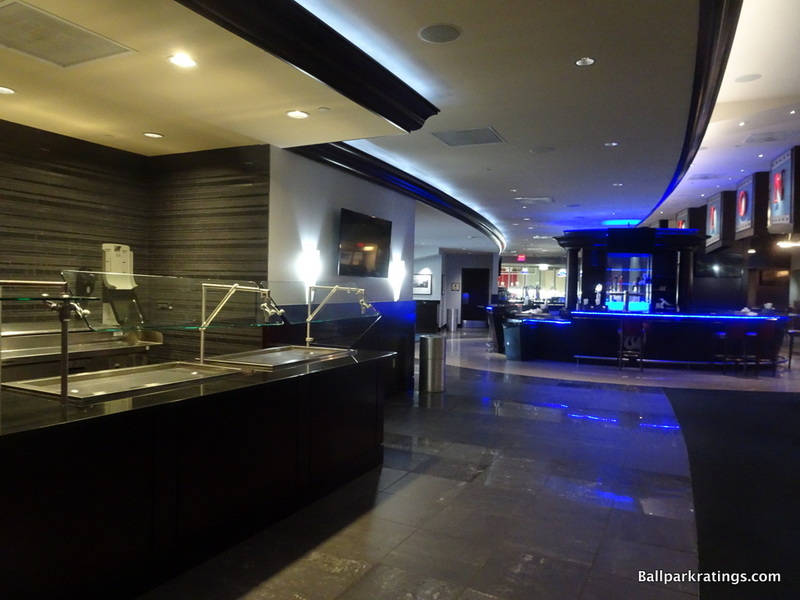 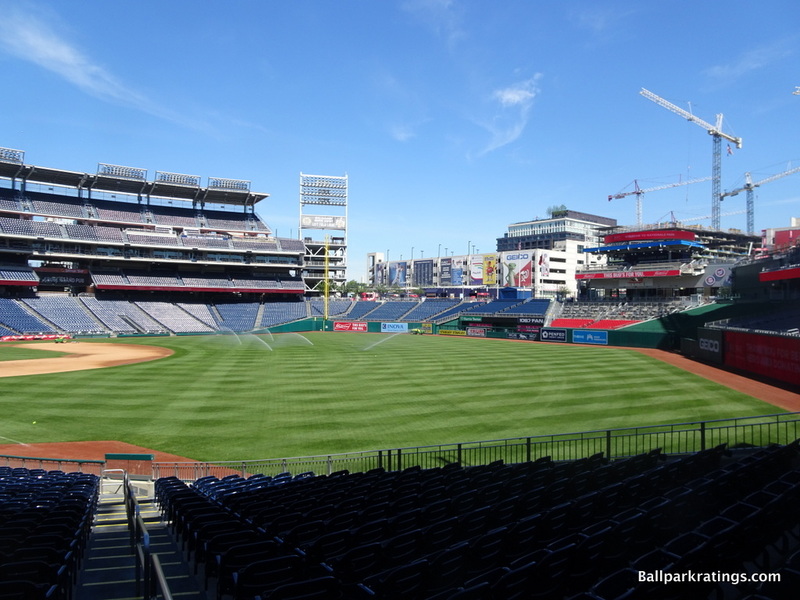 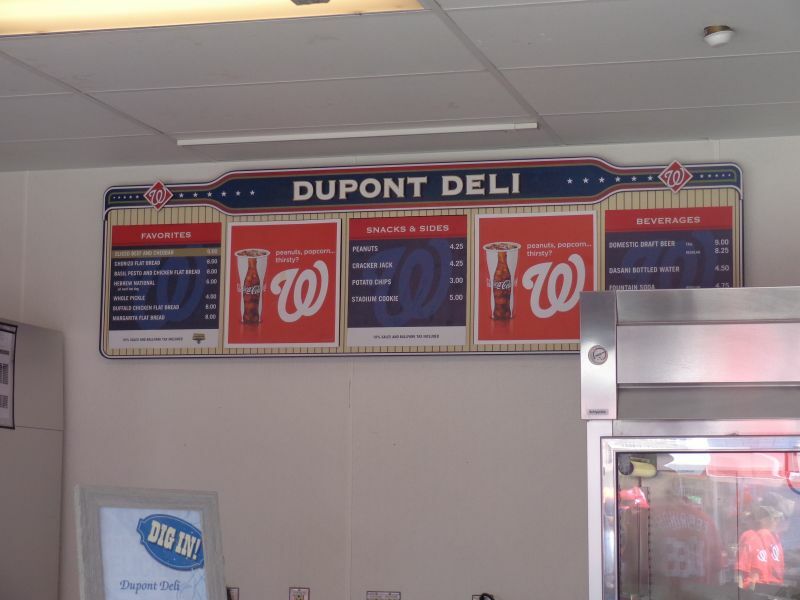 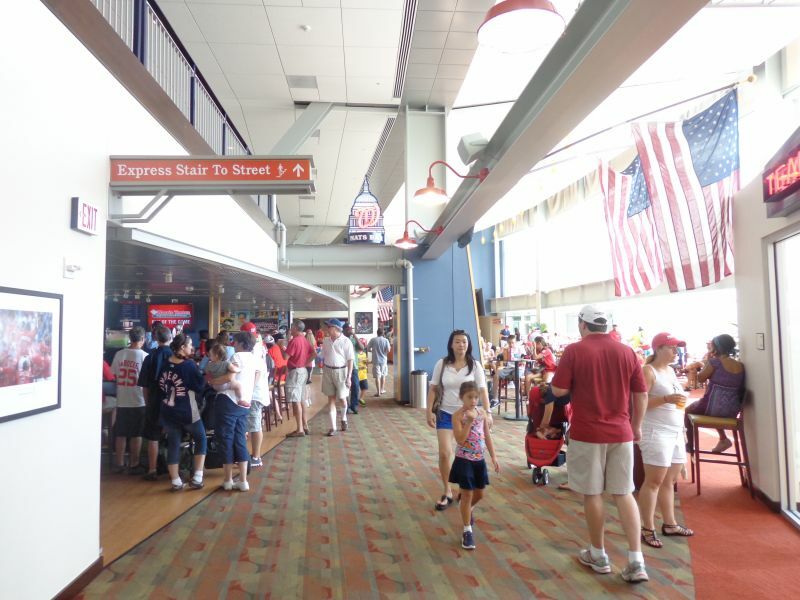 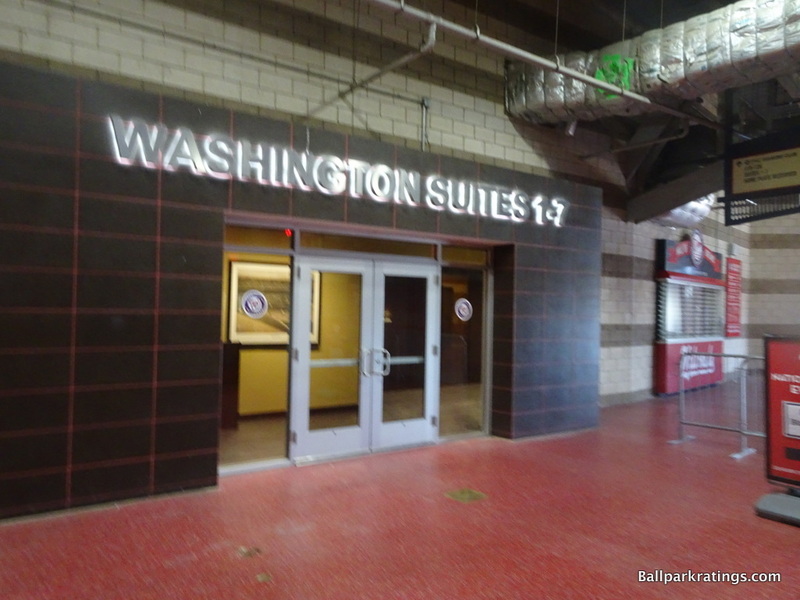 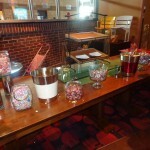 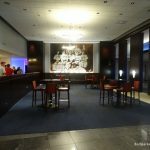 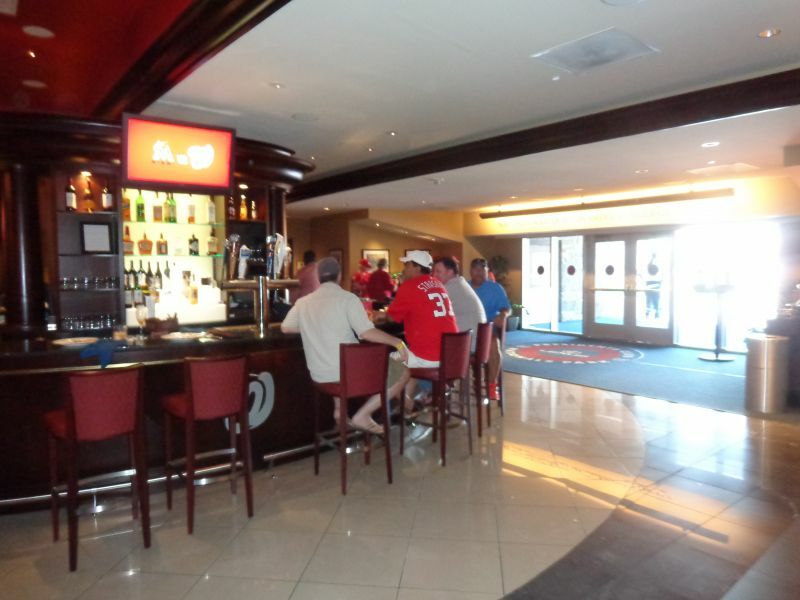 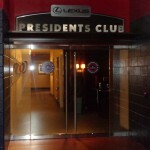 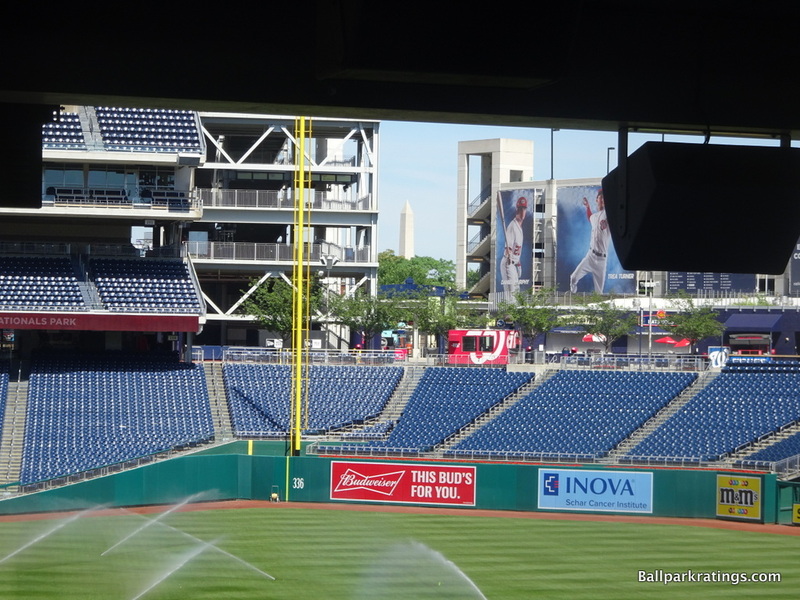 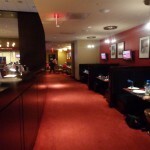 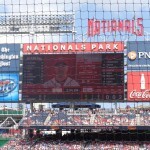 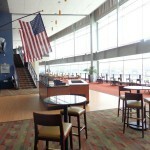 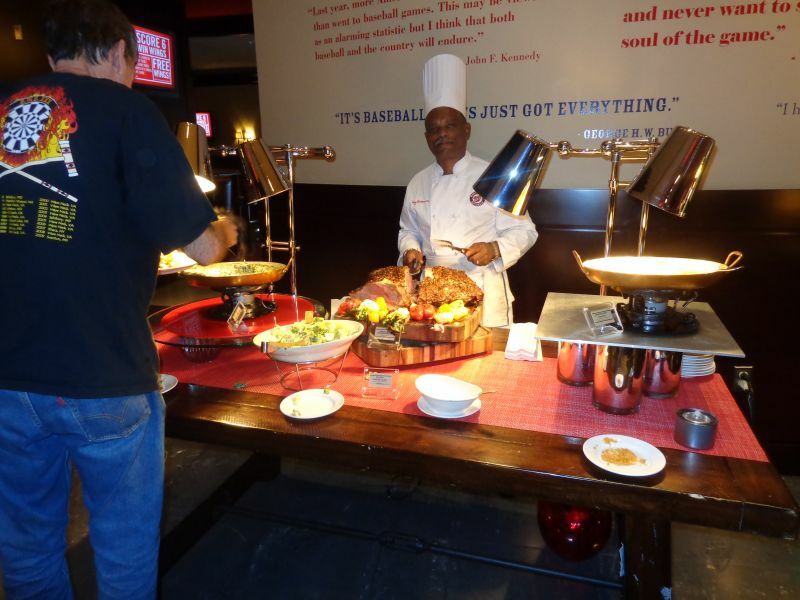 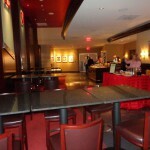 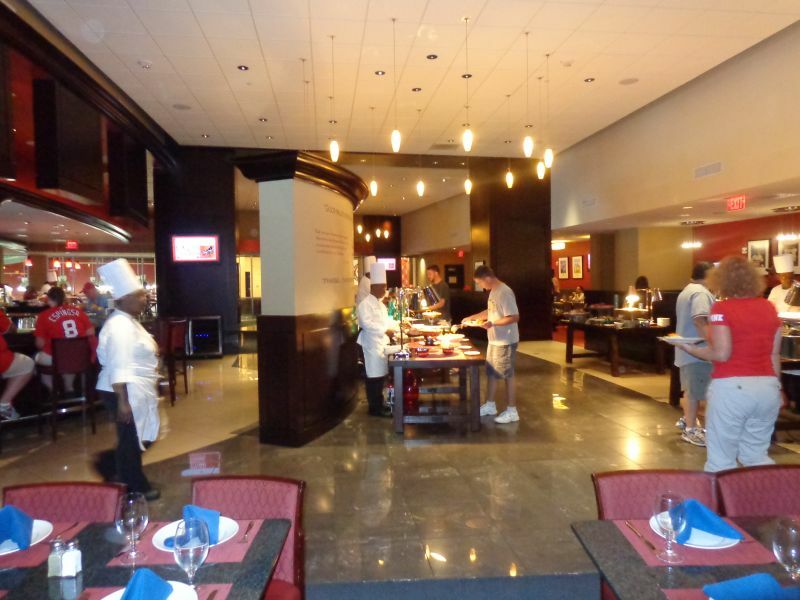 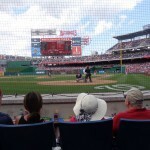 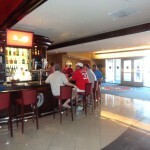 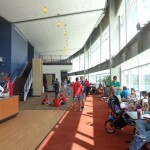 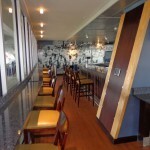 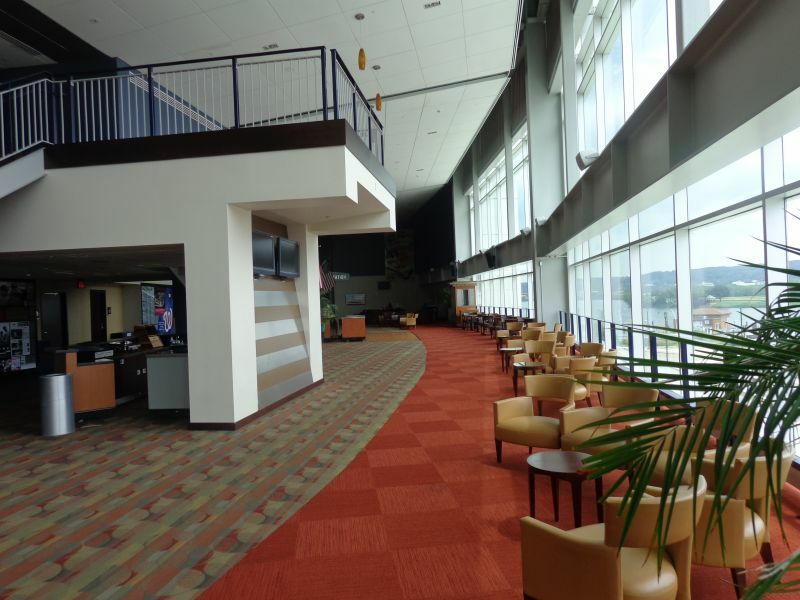 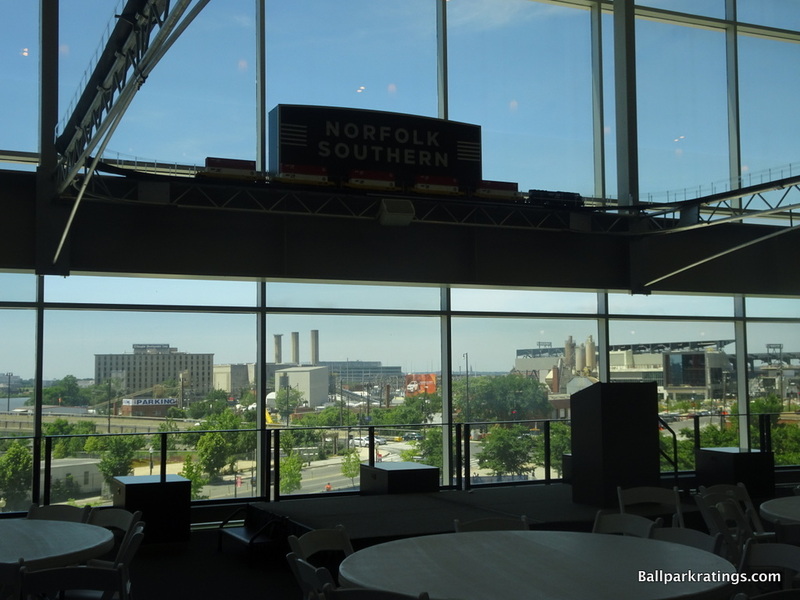 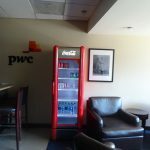 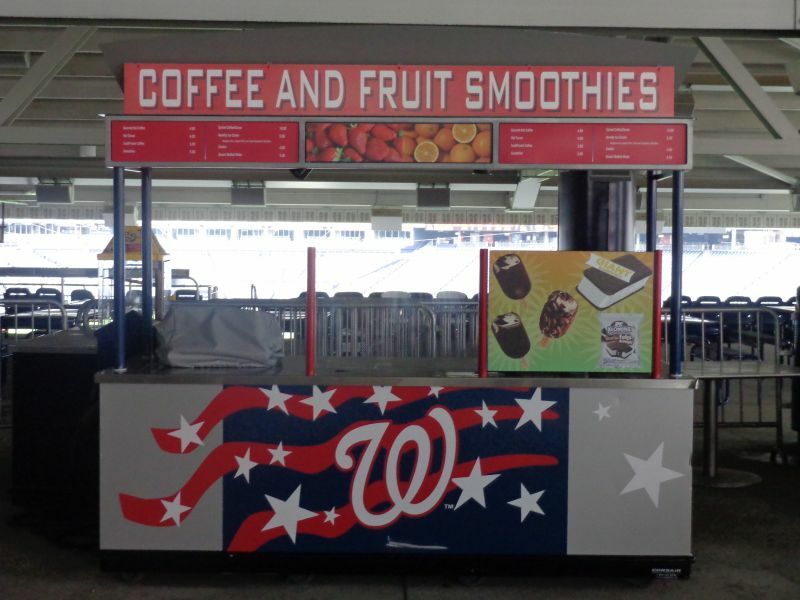 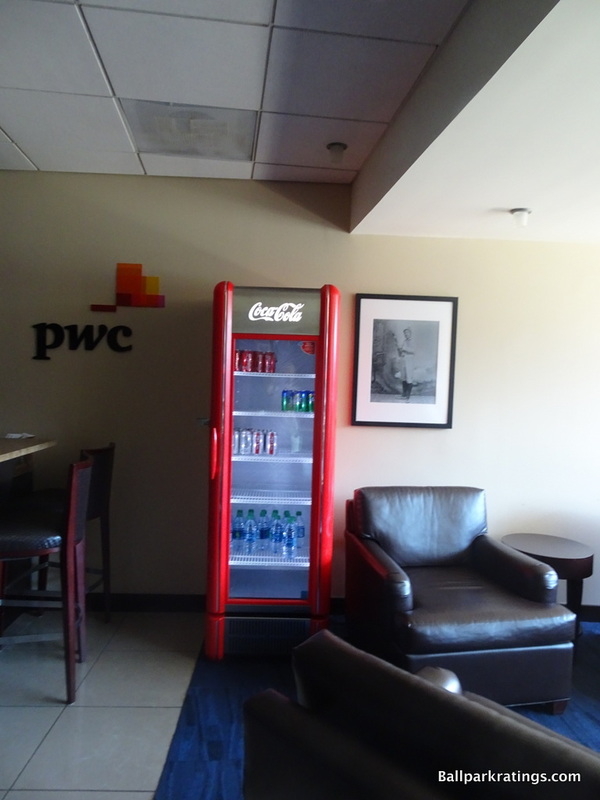 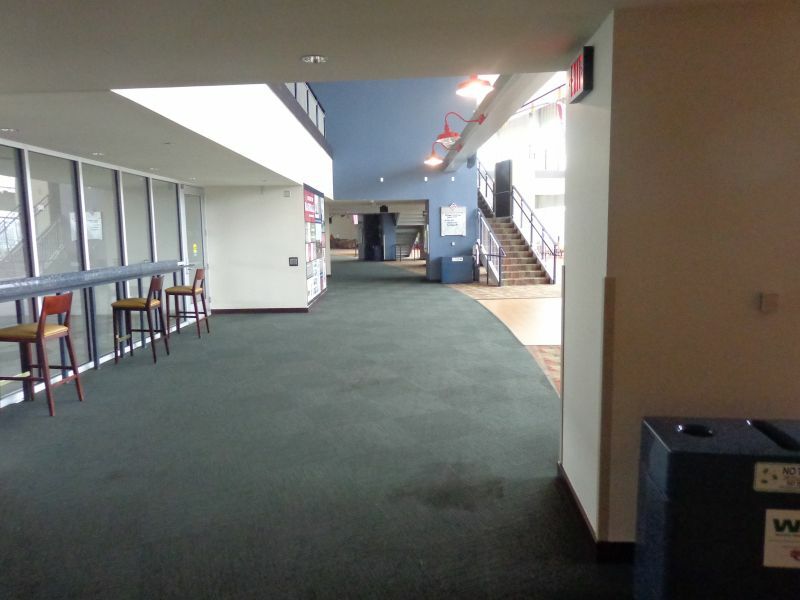 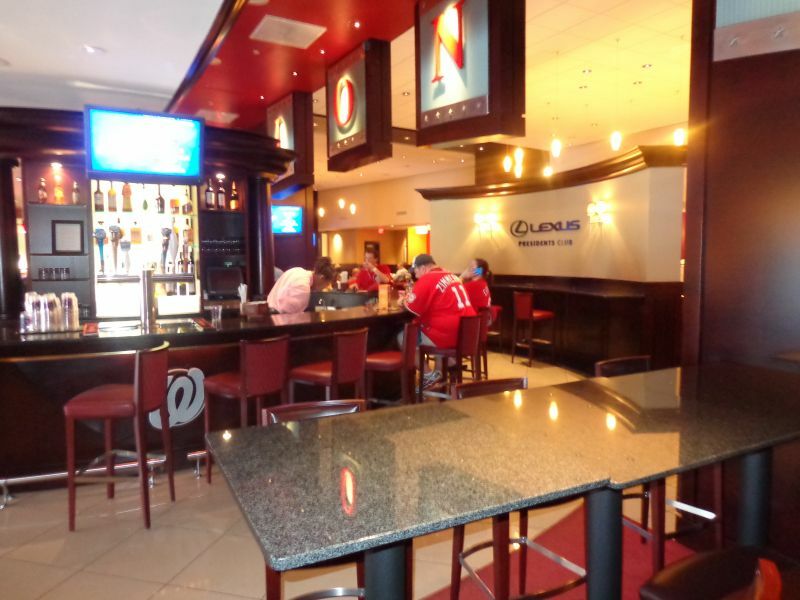 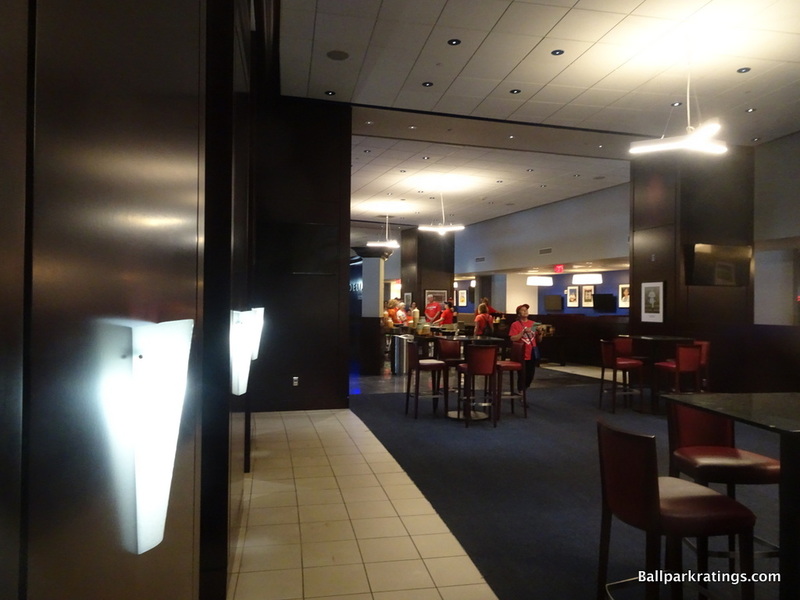 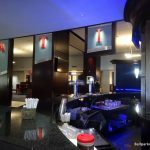 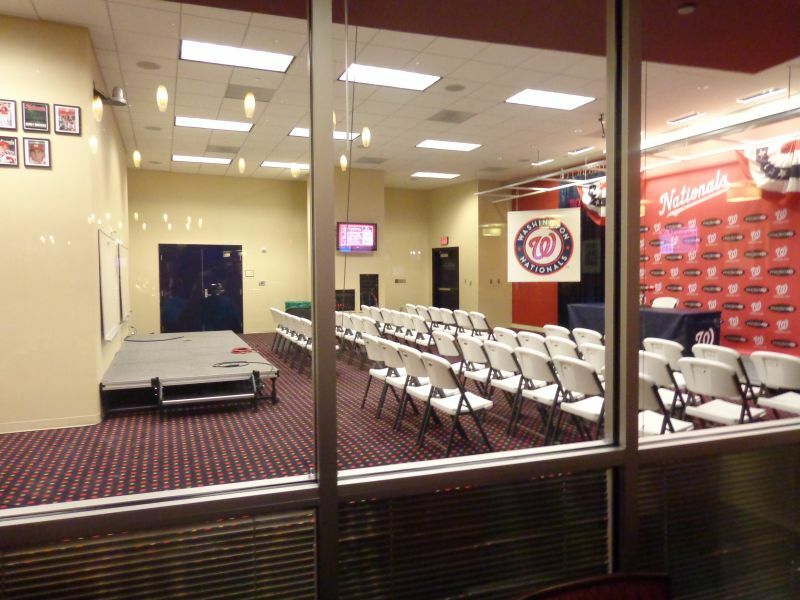 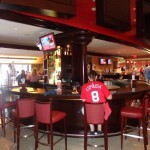 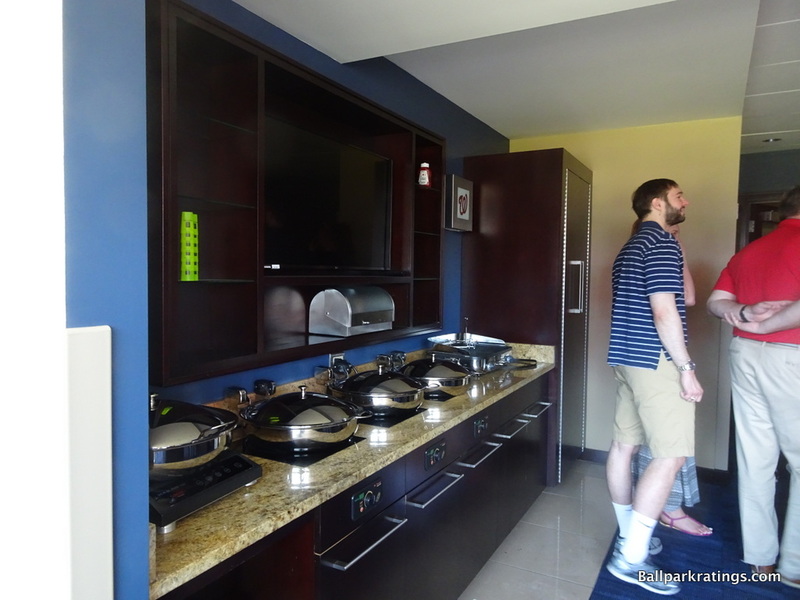 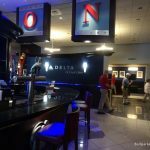 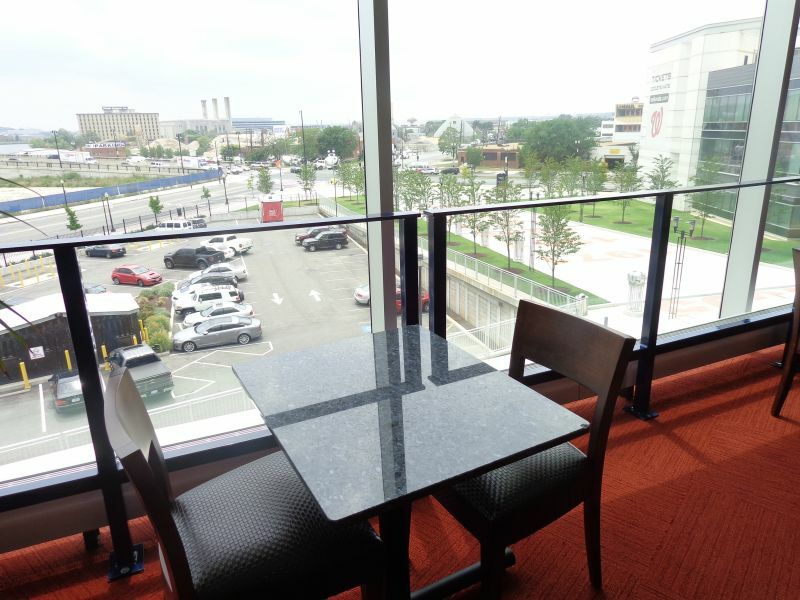 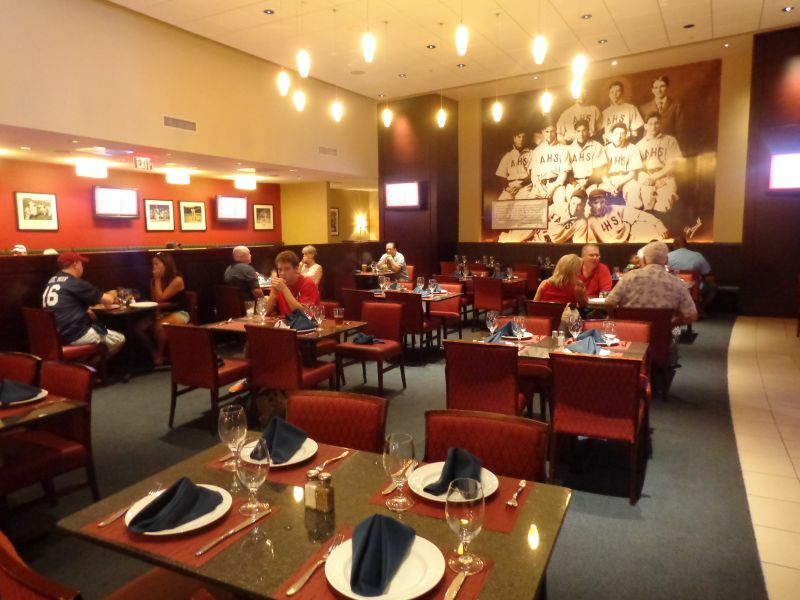 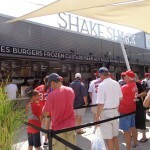 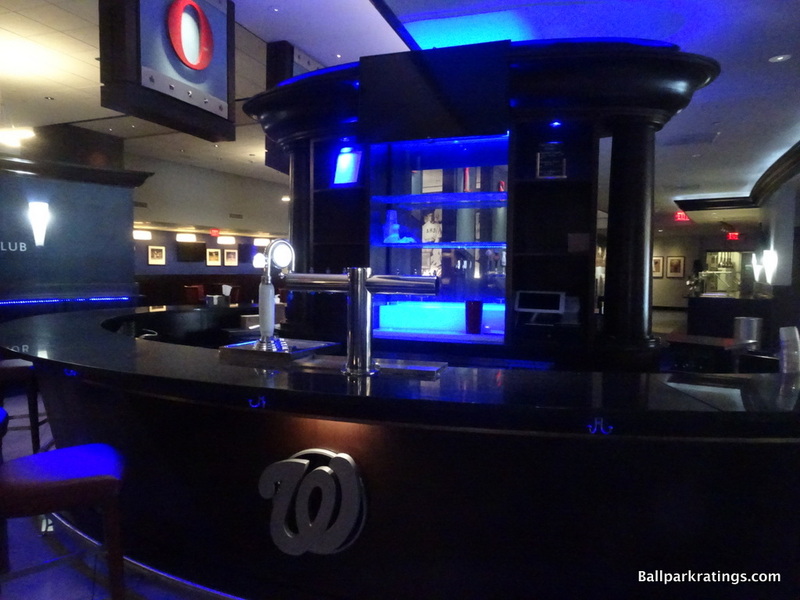 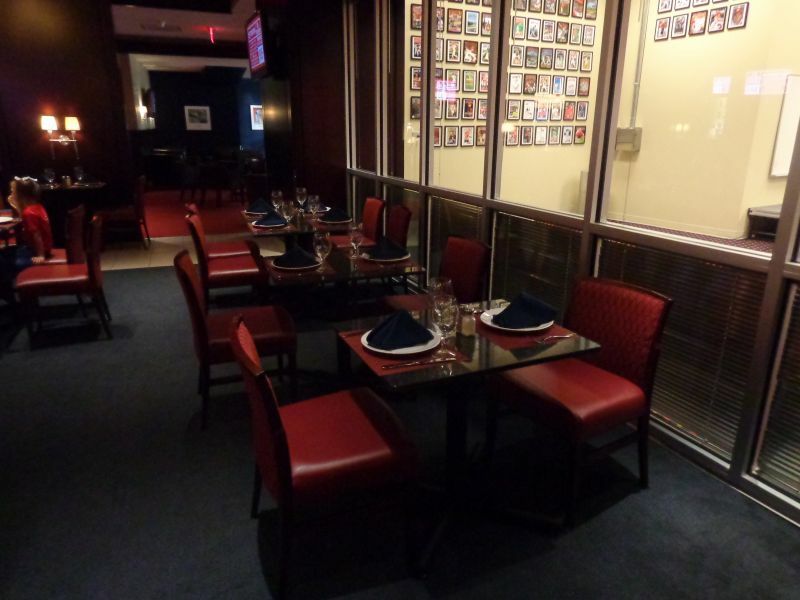 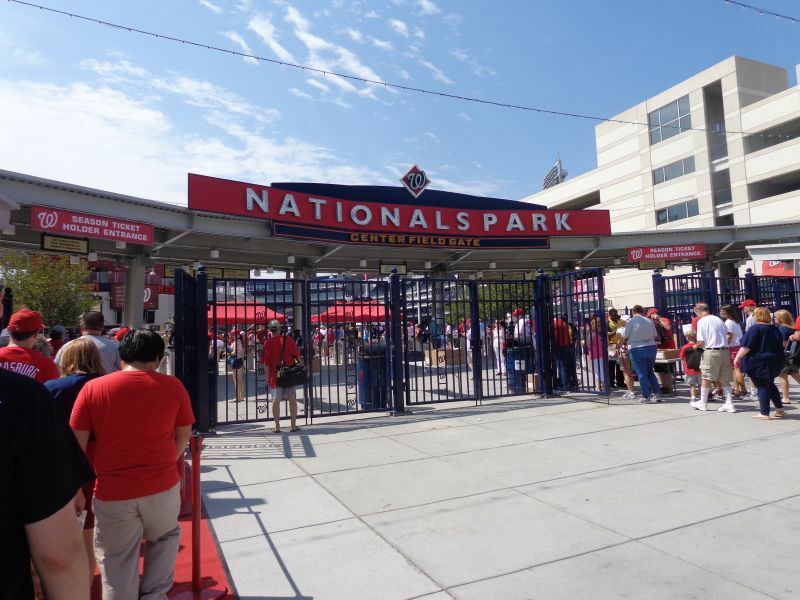 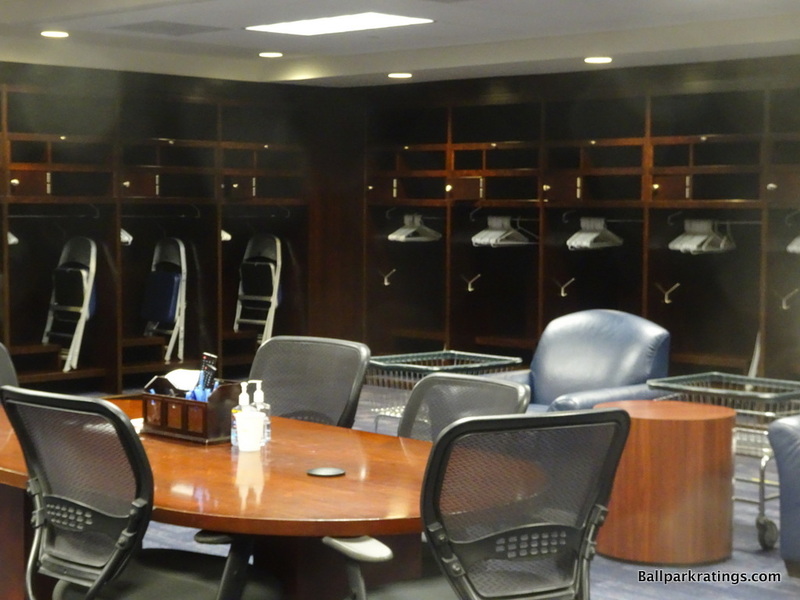 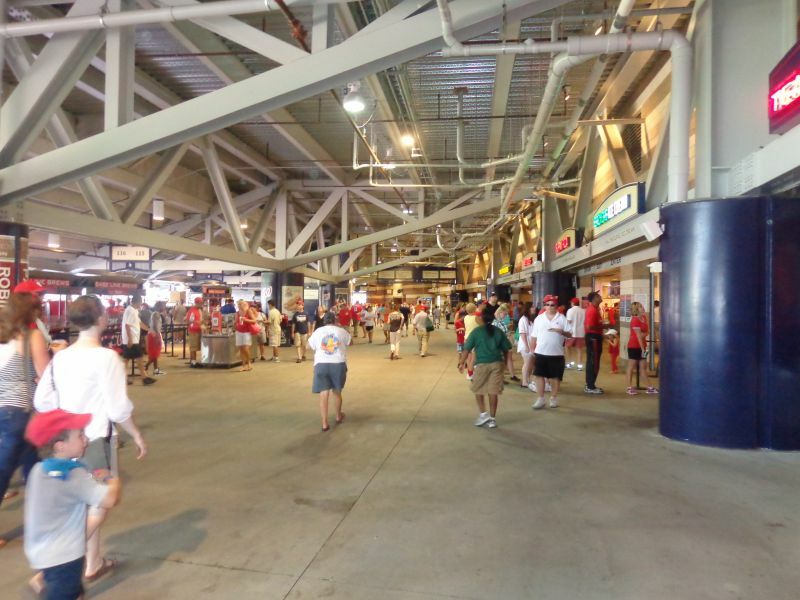 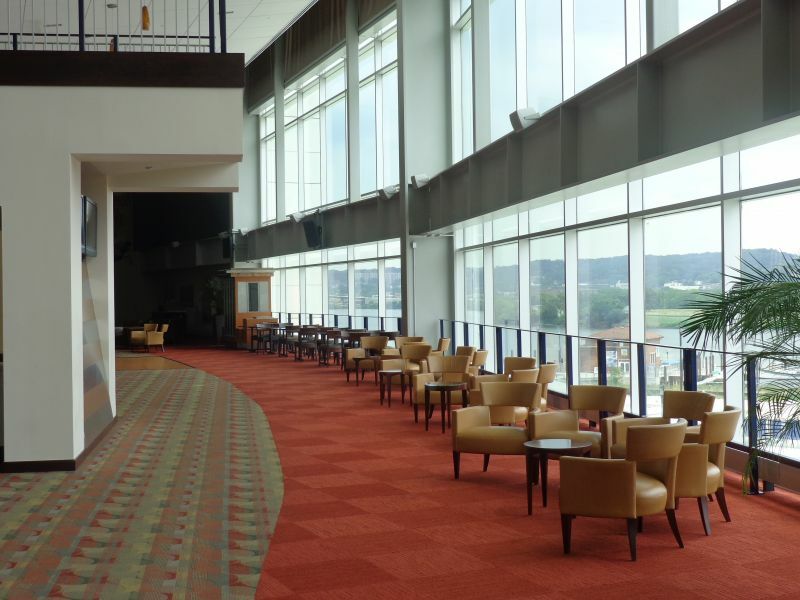 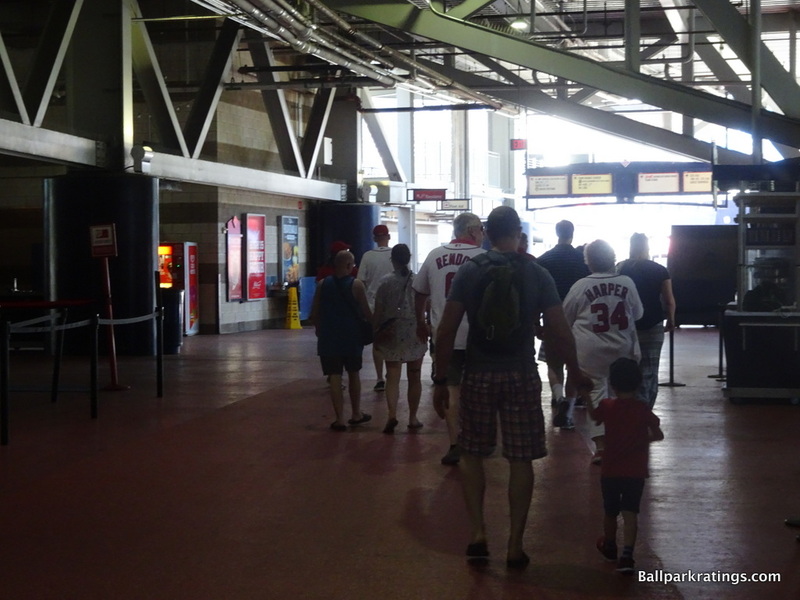 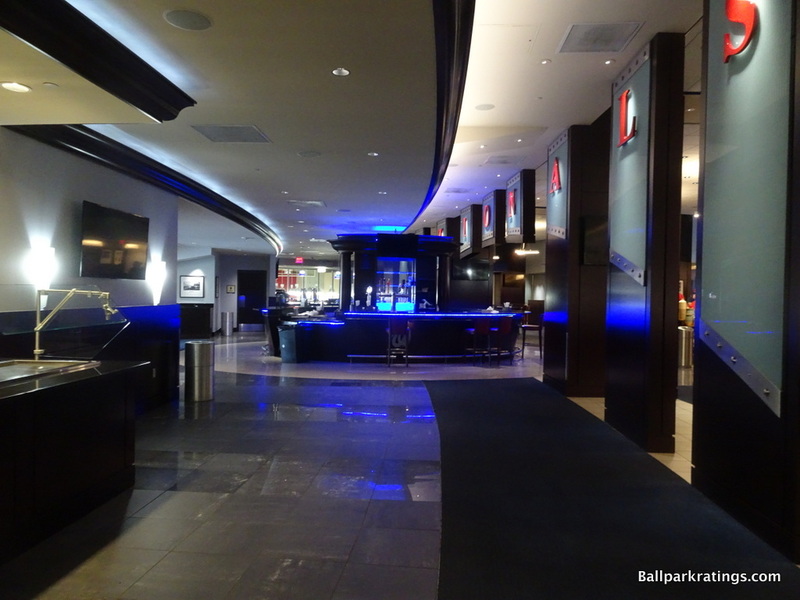 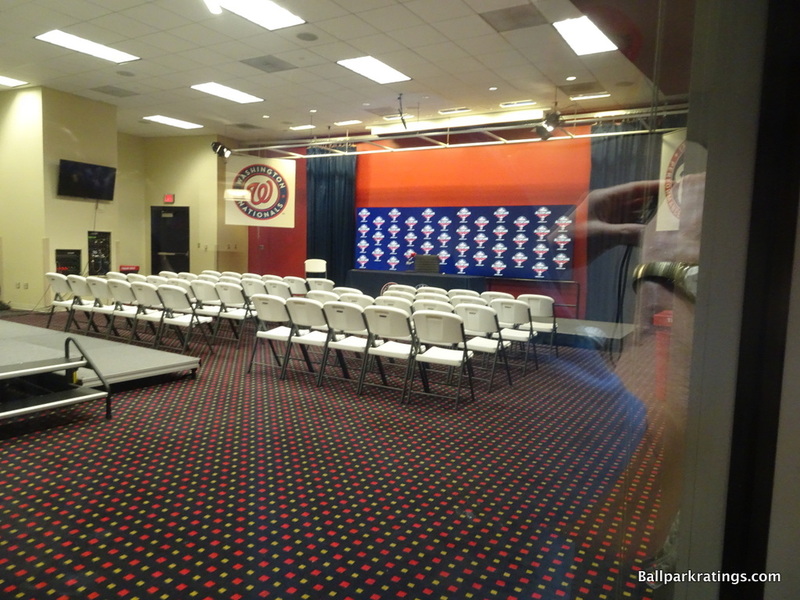 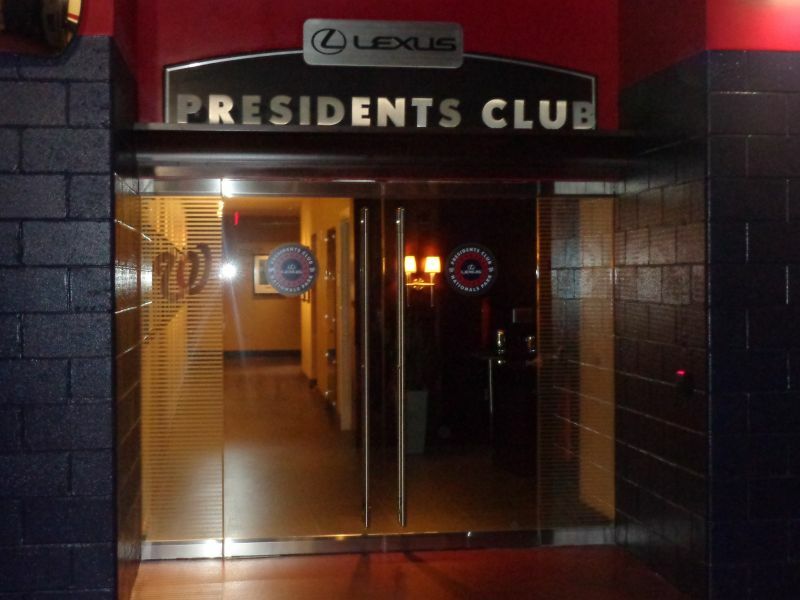 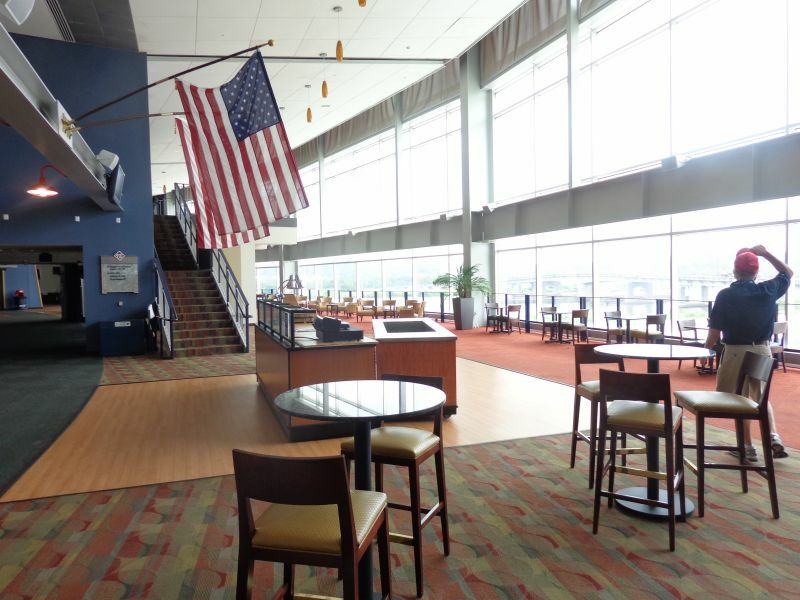 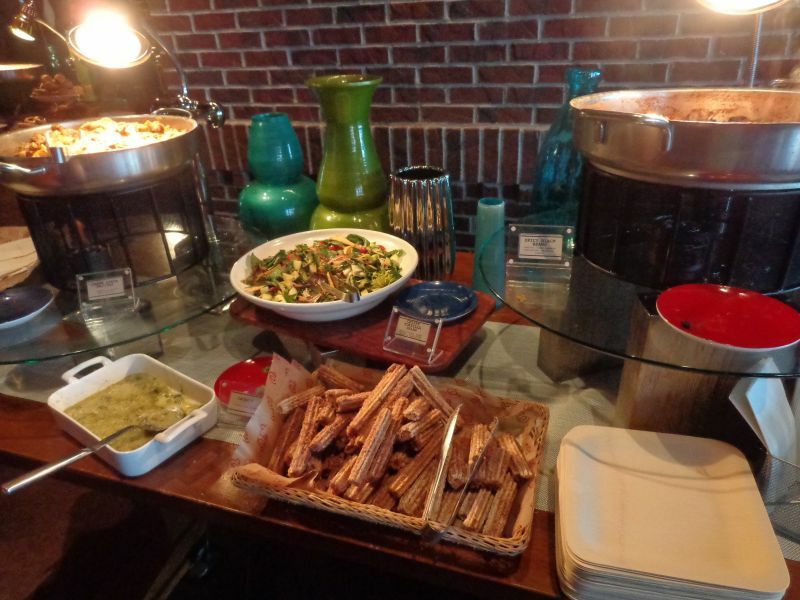 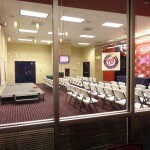 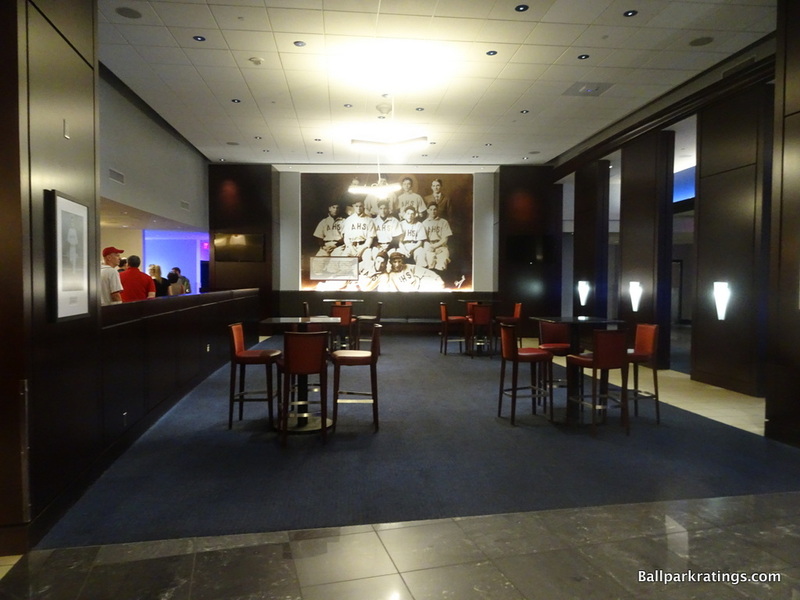 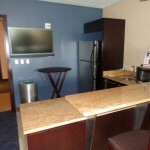 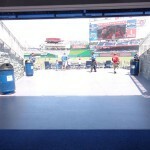 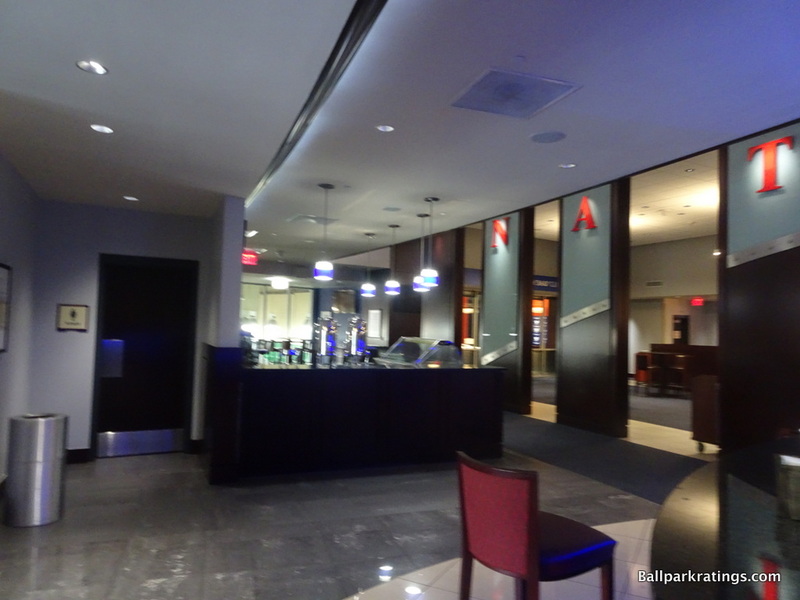 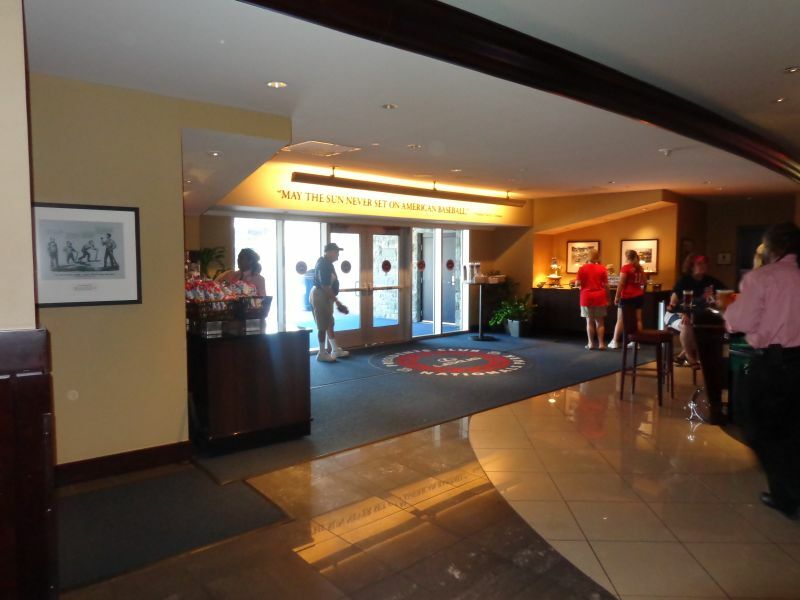 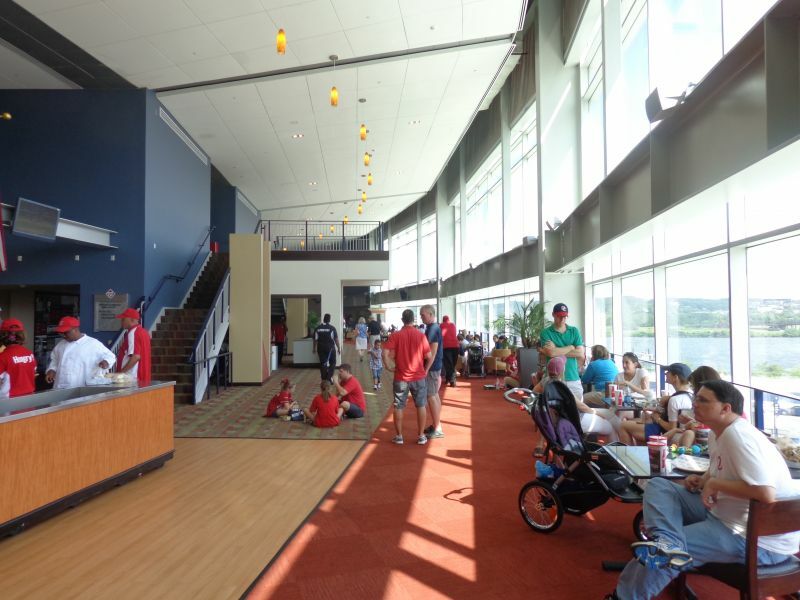 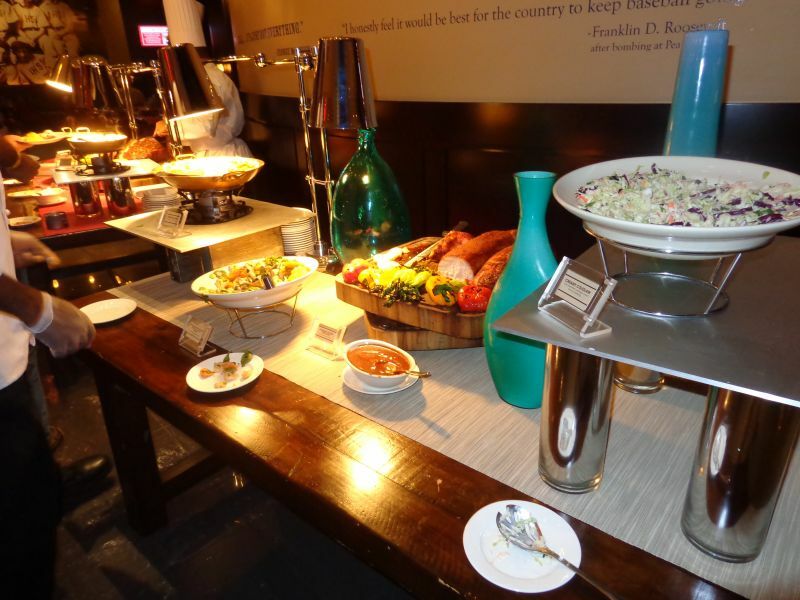 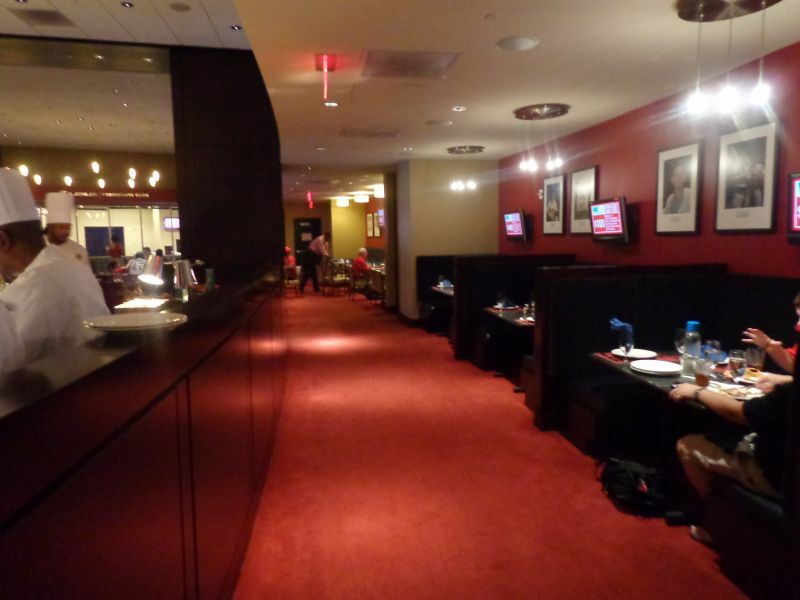 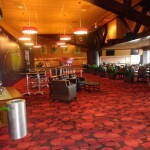 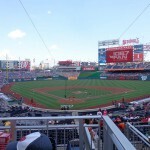 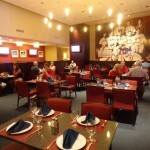 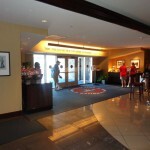 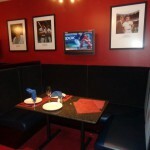 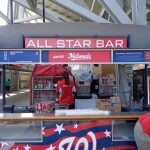 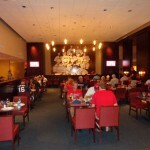 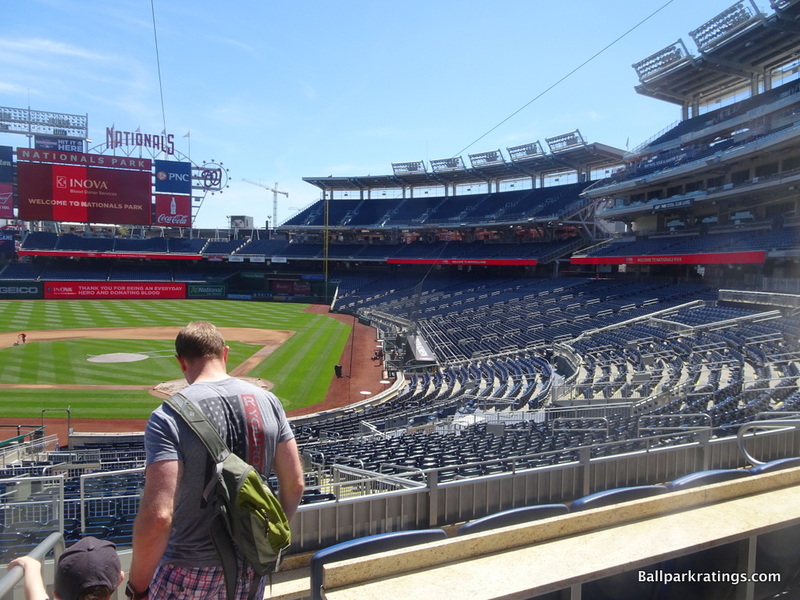 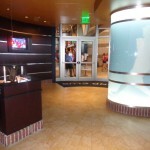 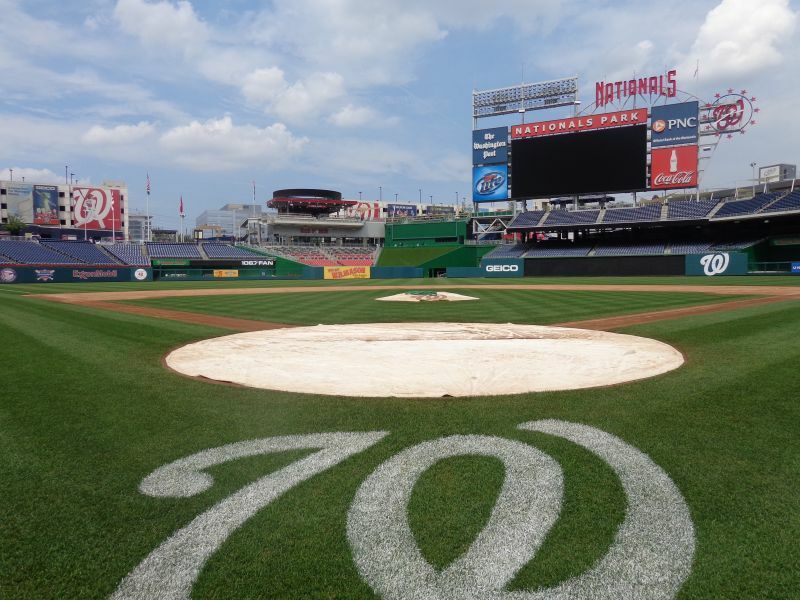 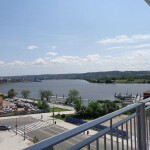 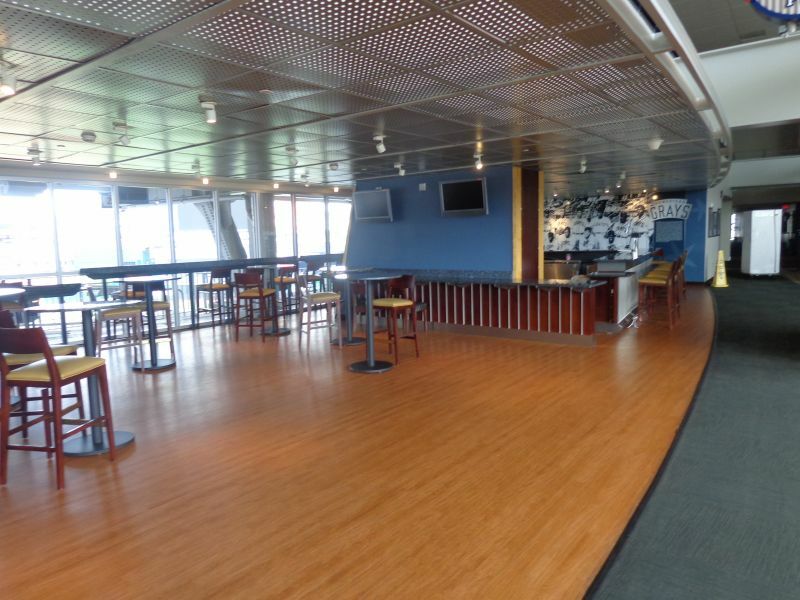 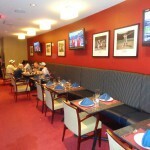 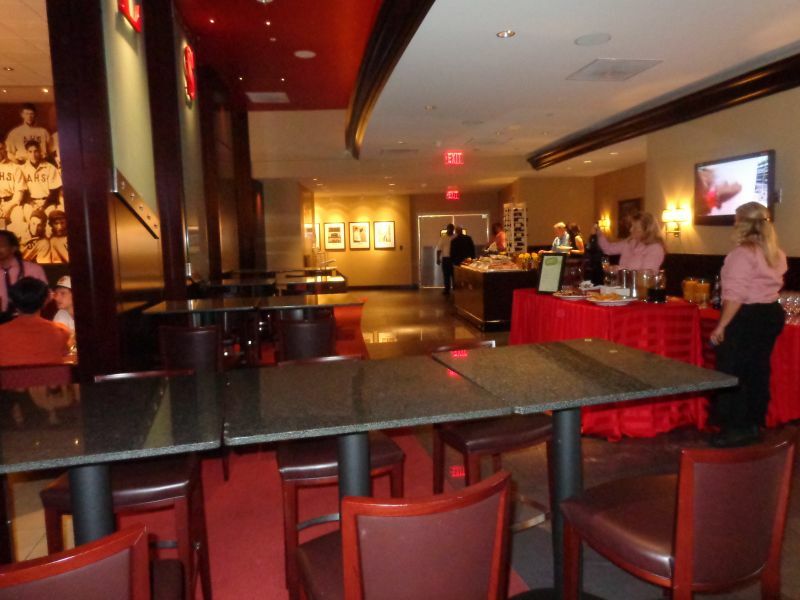 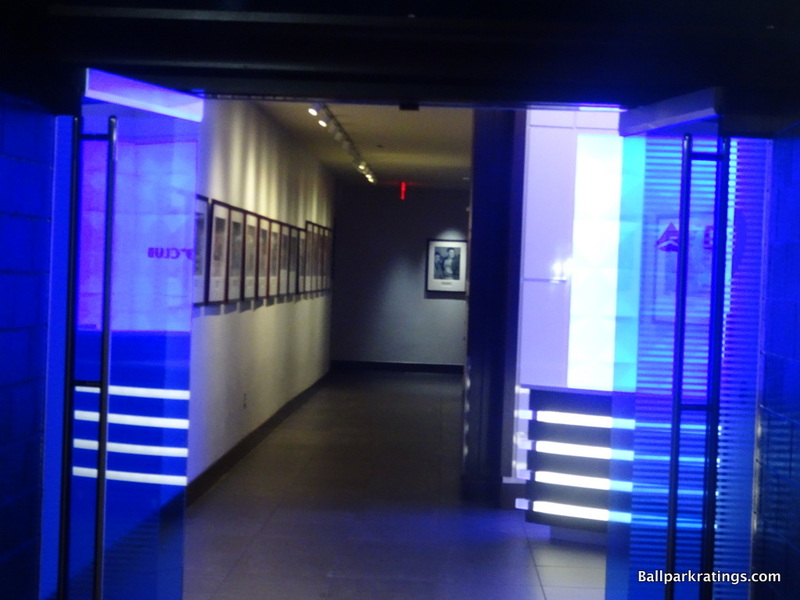 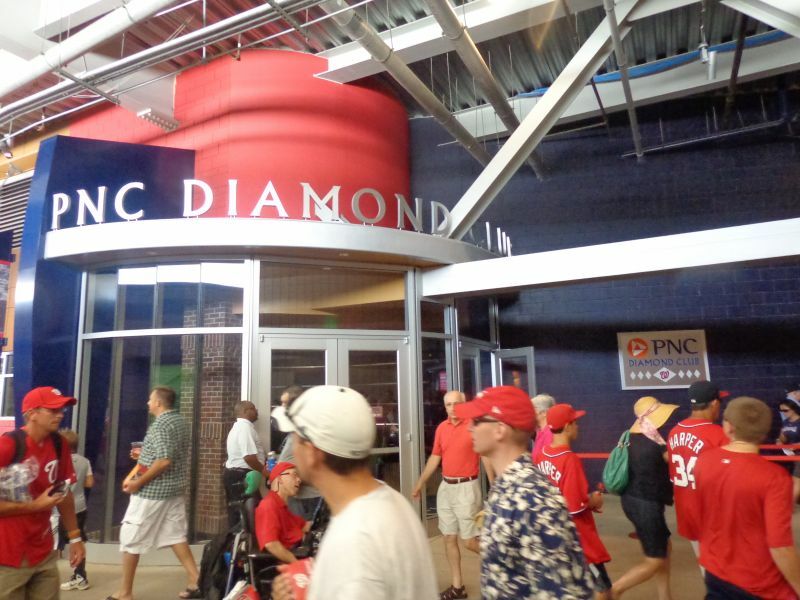 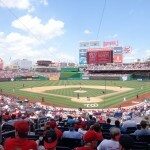 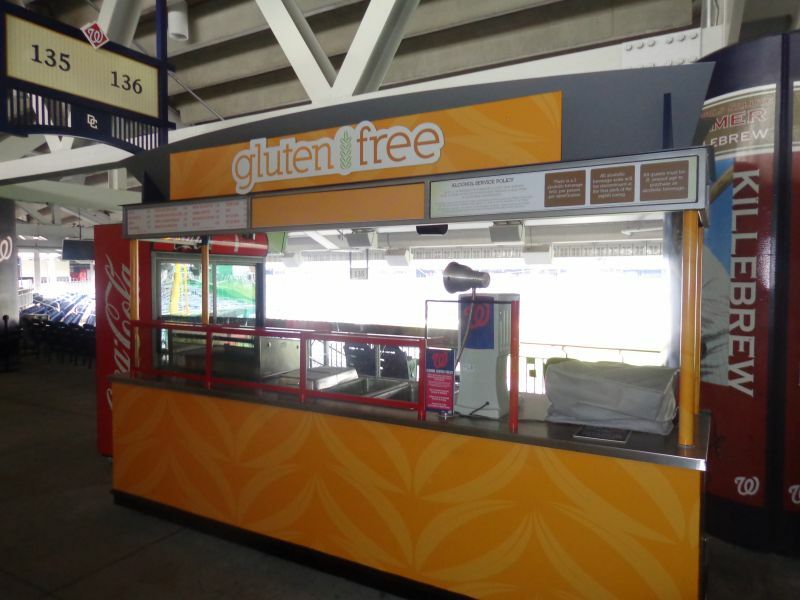 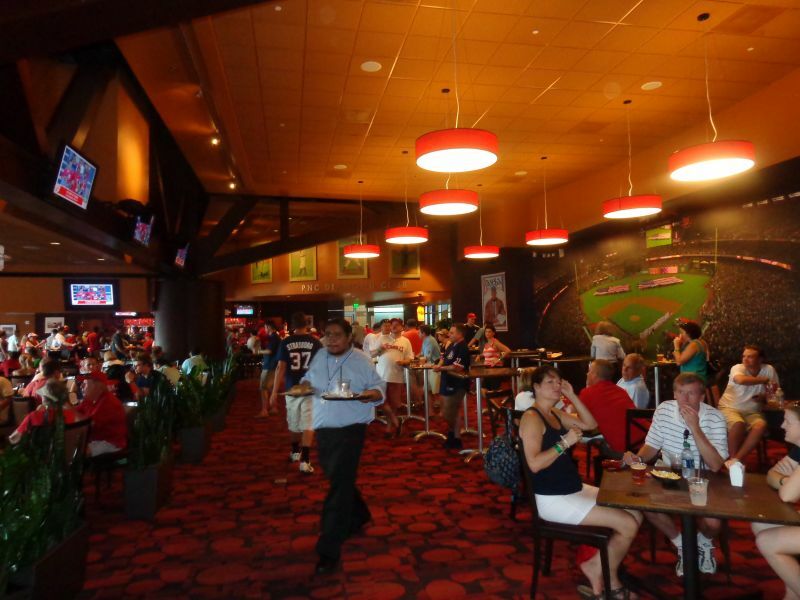 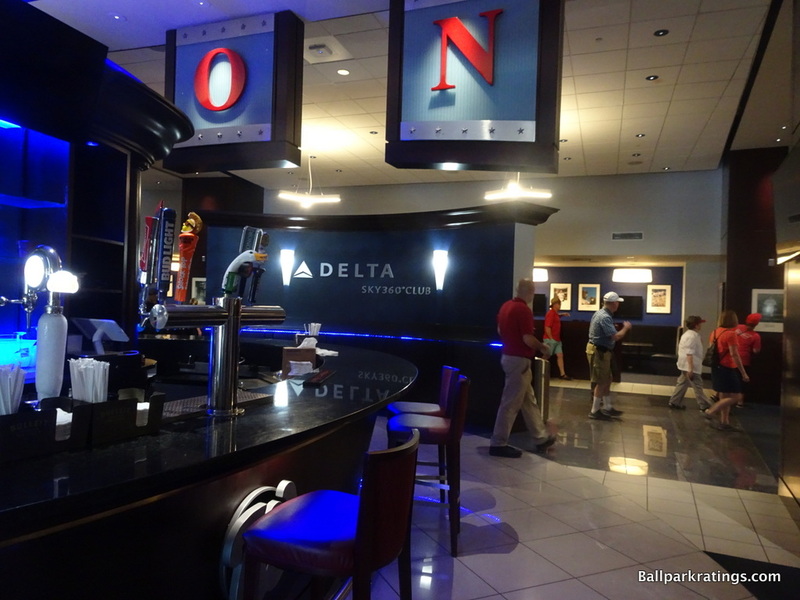 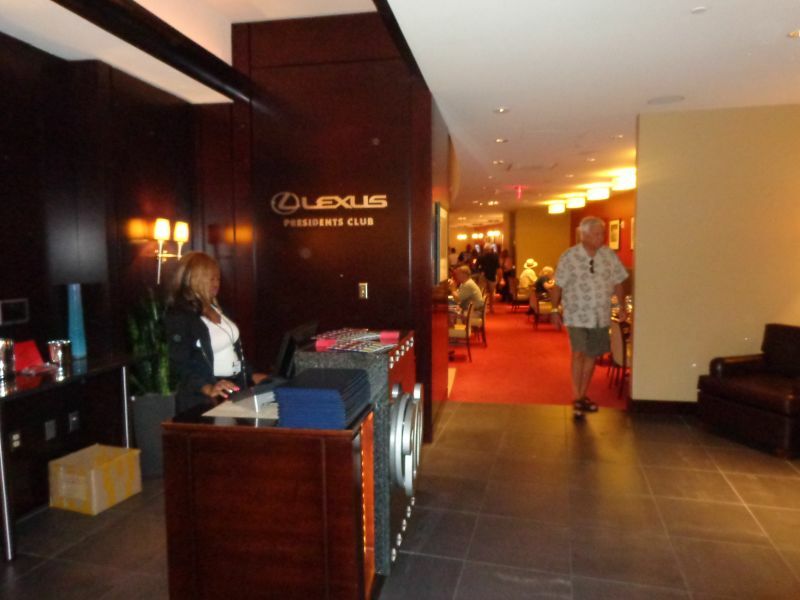 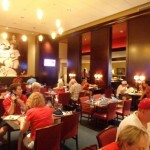 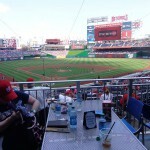 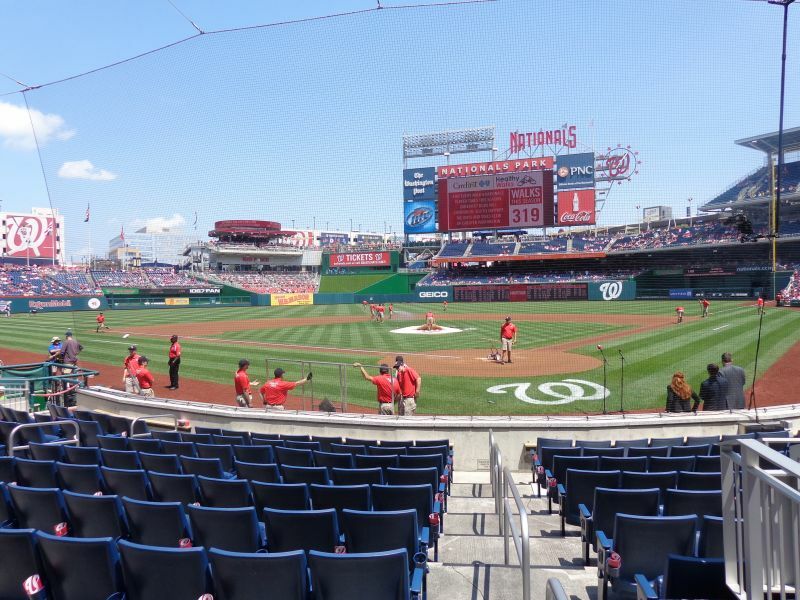 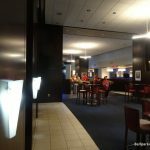 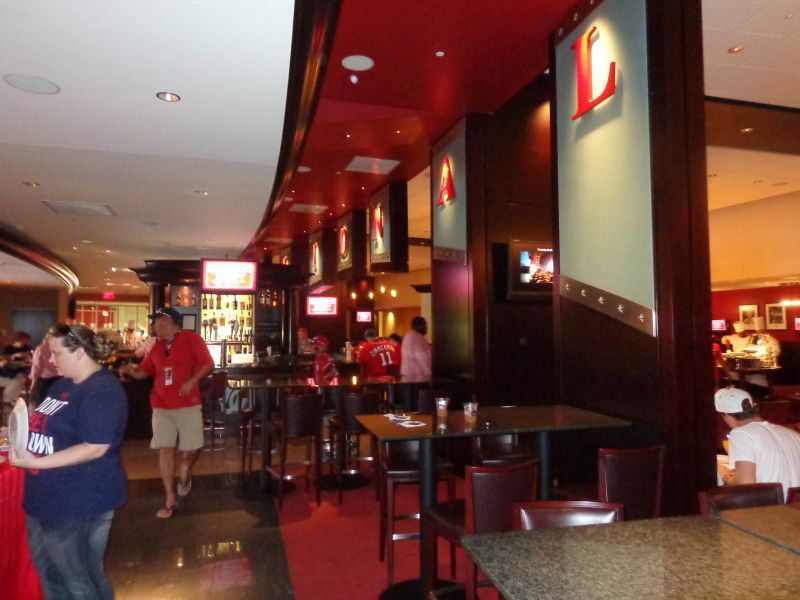 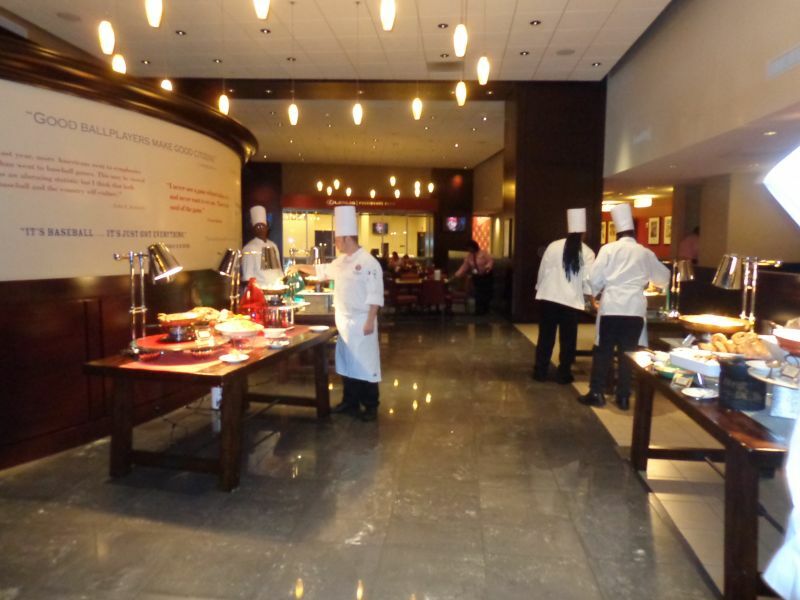 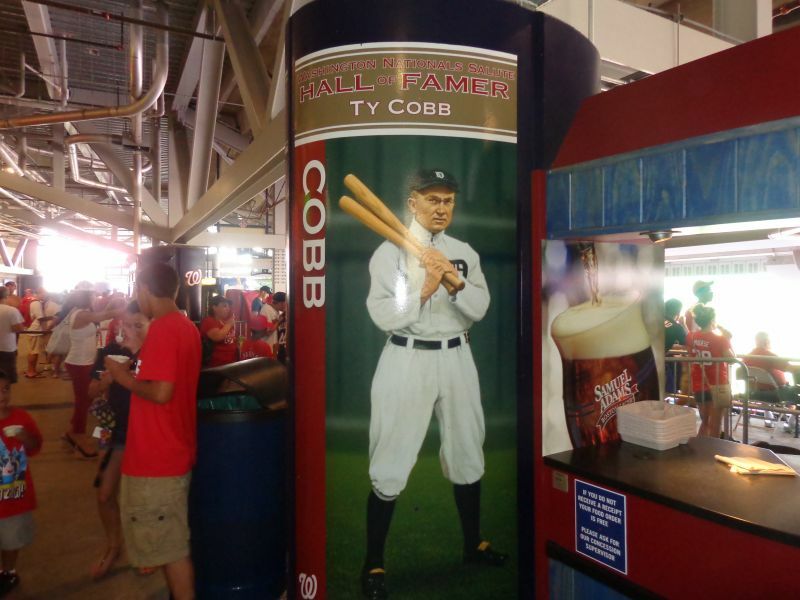 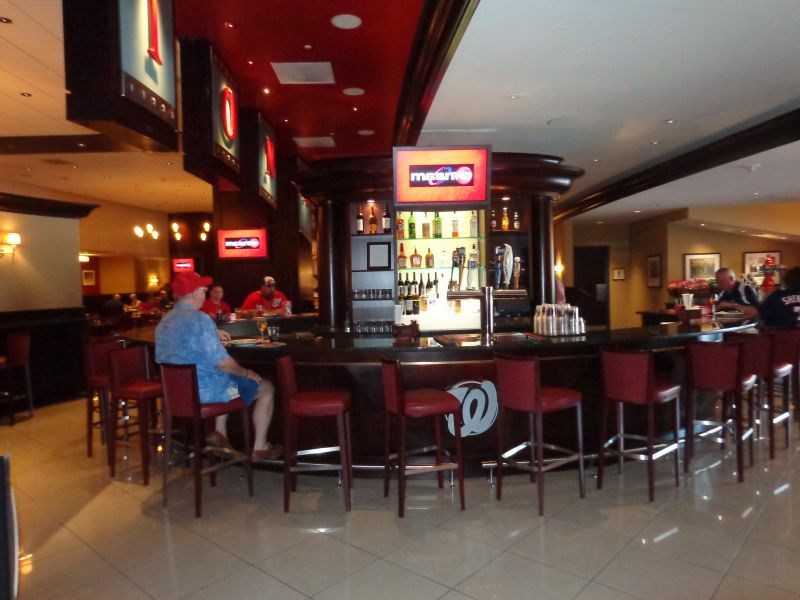 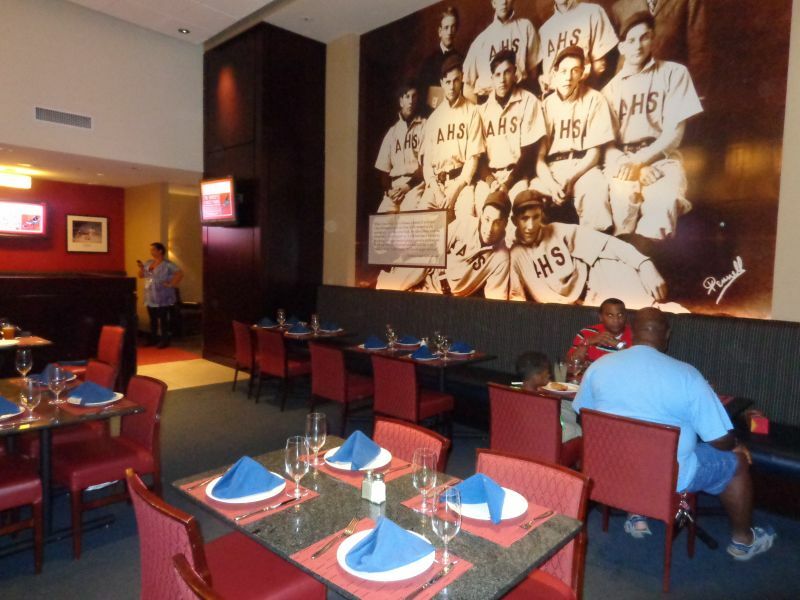 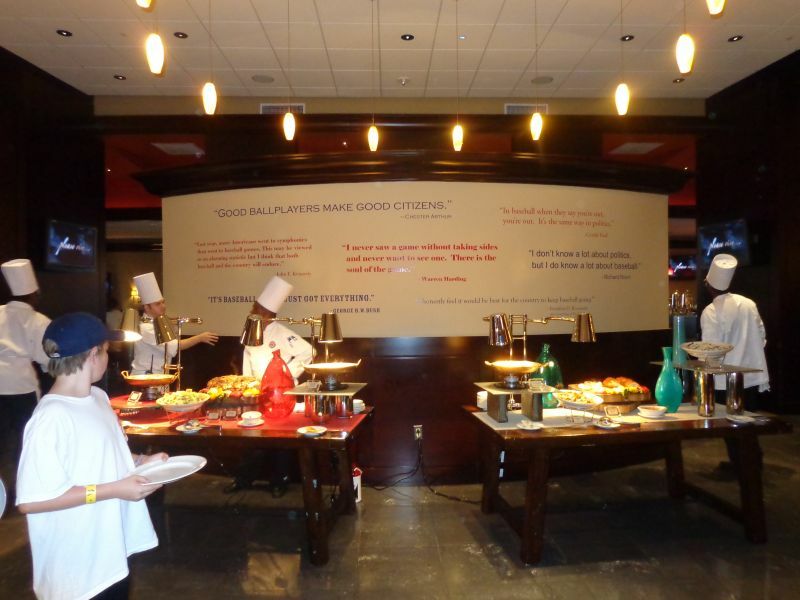 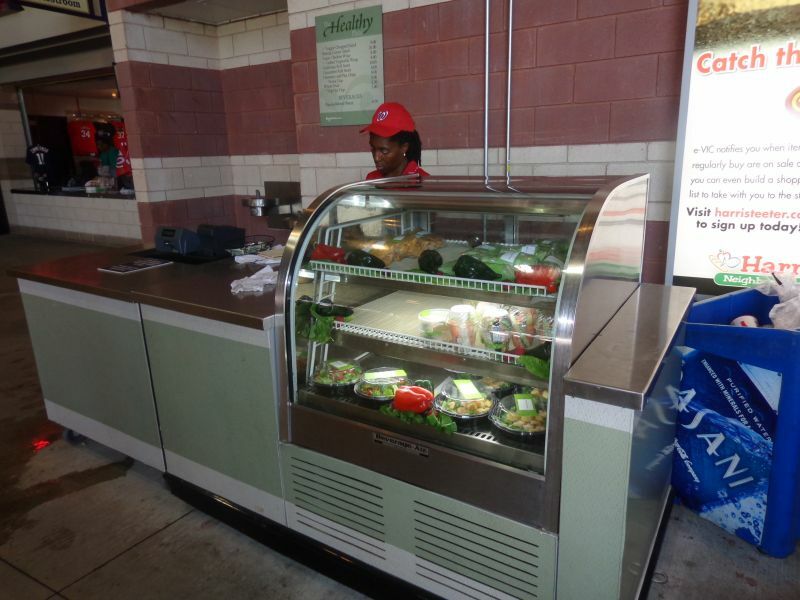 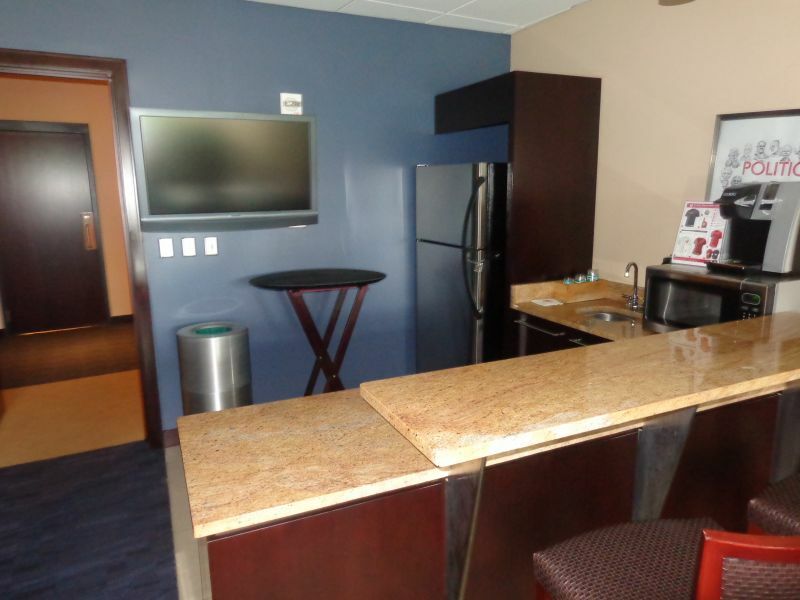 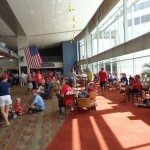 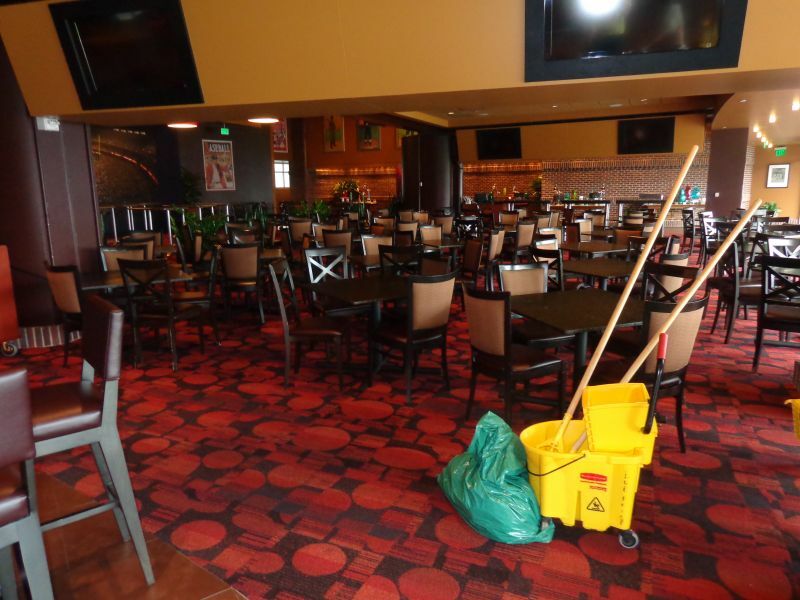 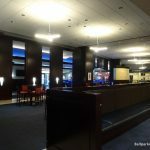 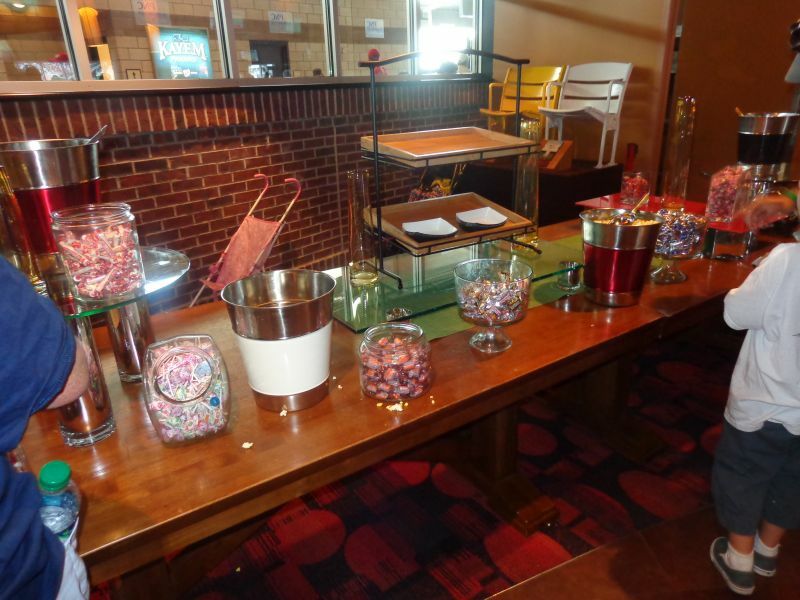 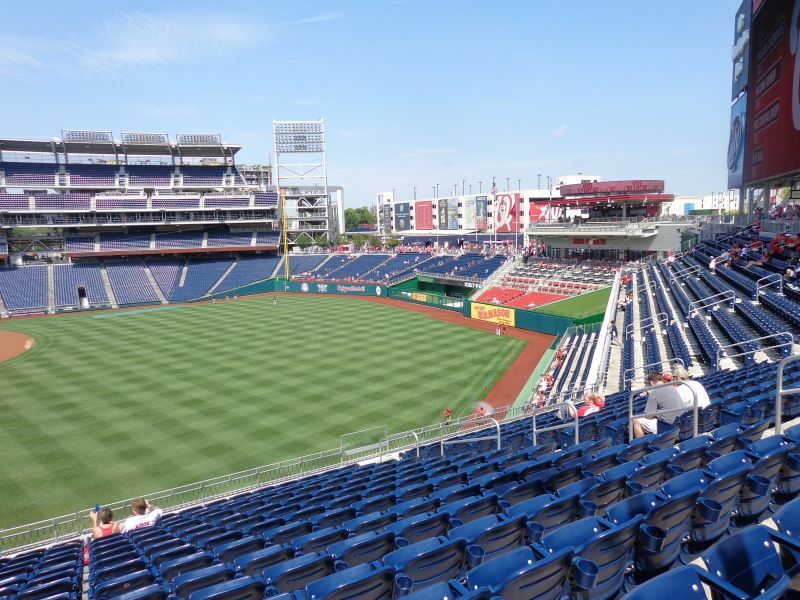 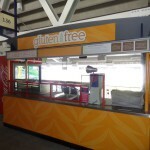 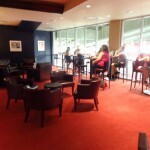 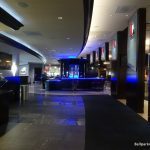 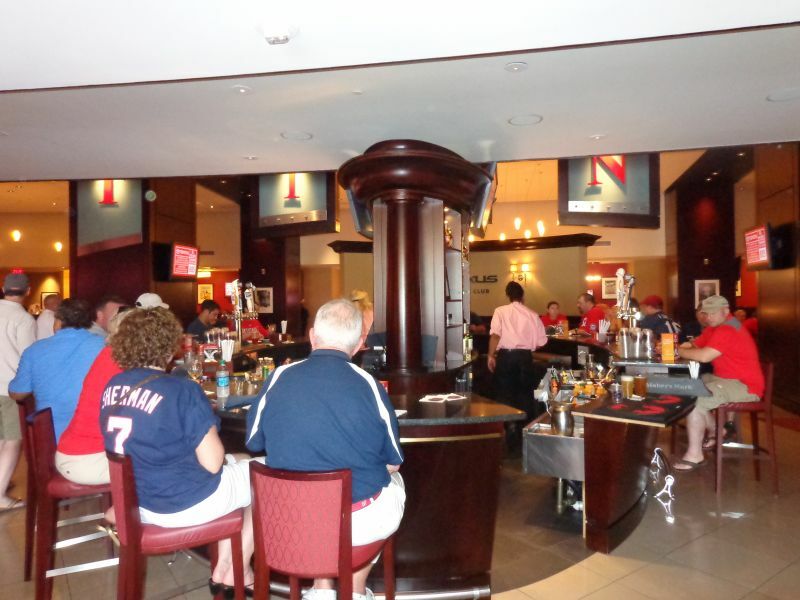 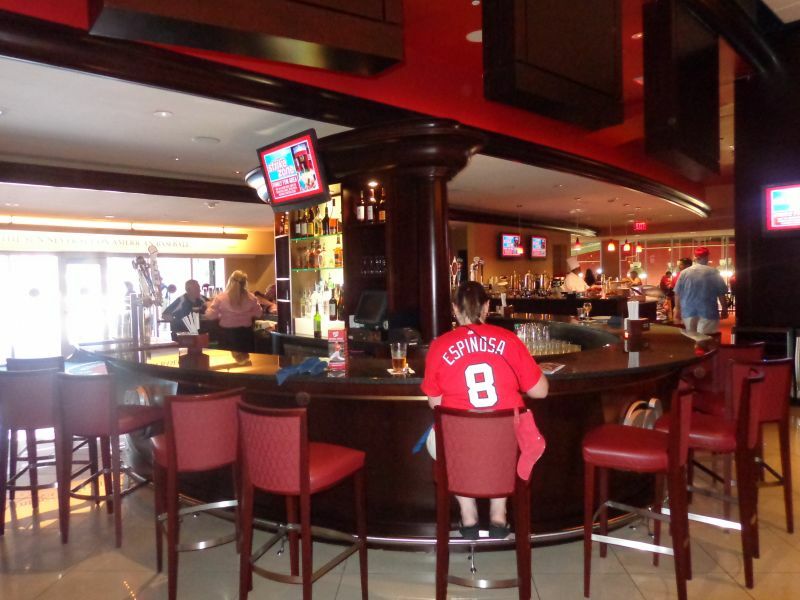 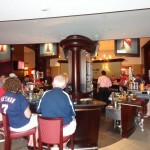 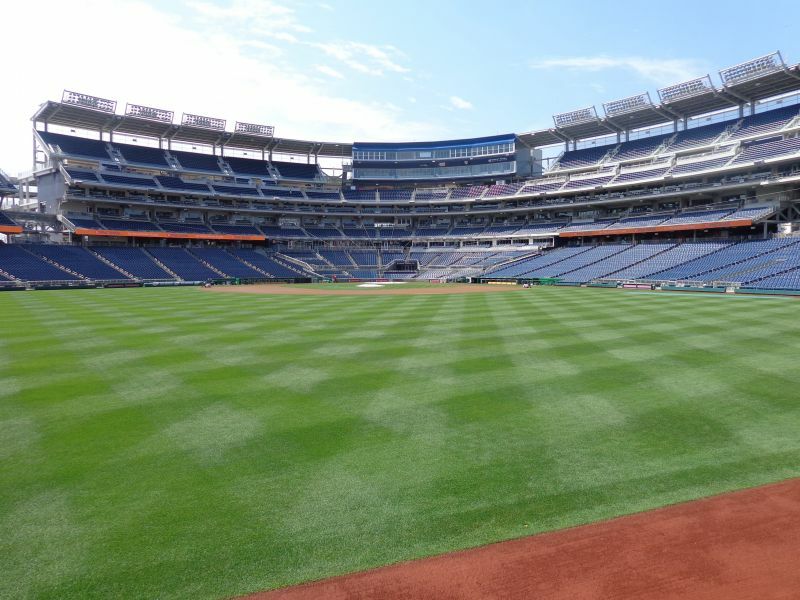 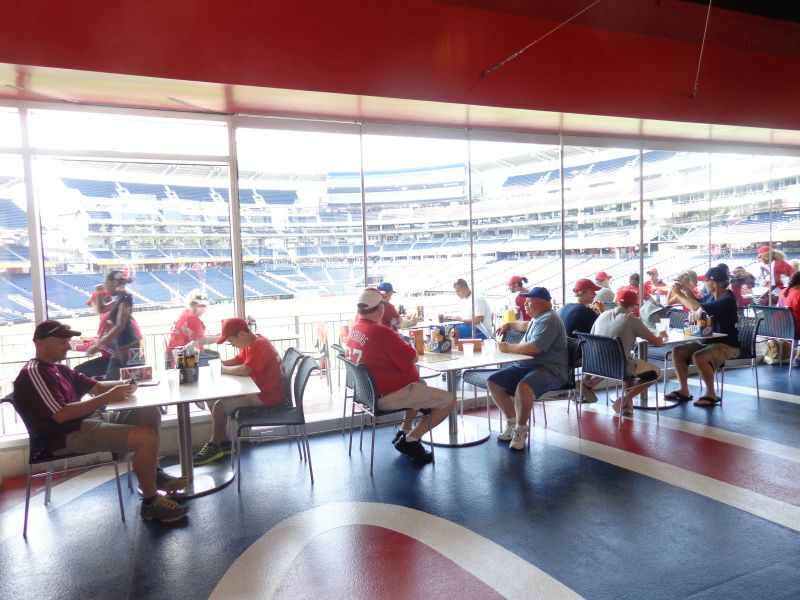 Nationals Park has above-average to great amenities in every respect. 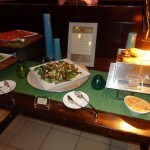 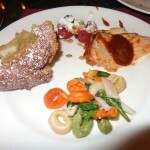 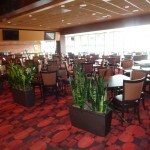 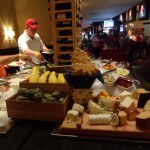 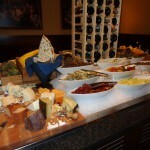 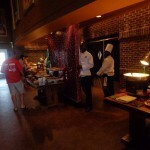 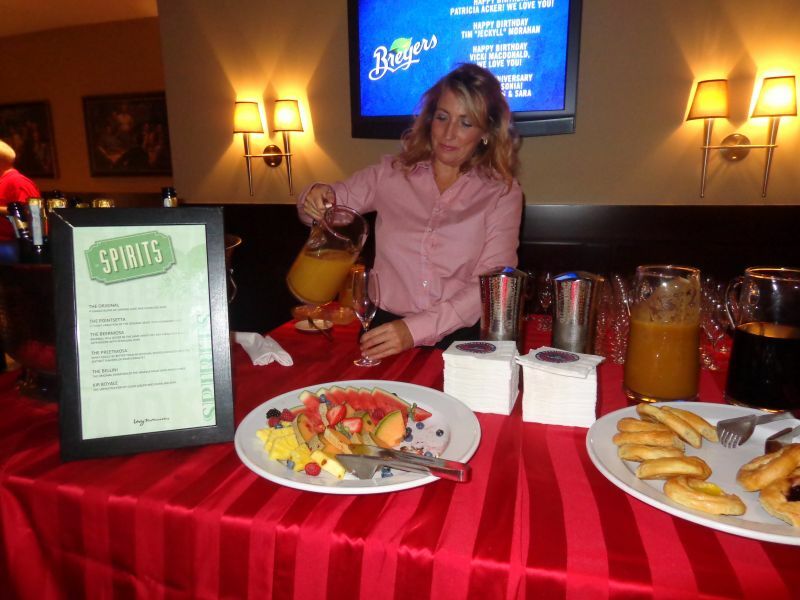 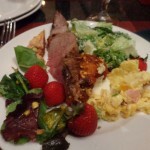 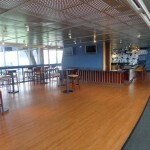 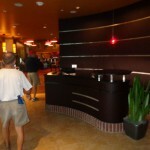 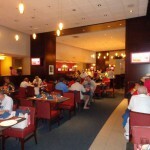 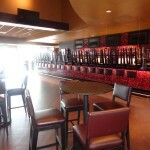 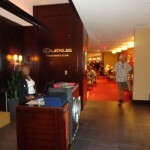 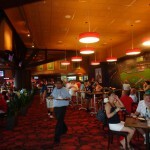 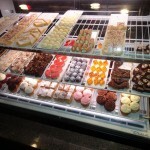 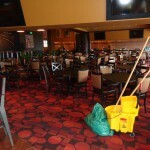 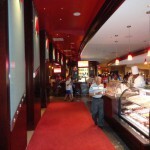 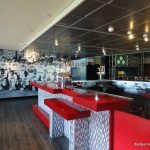 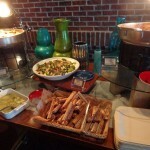 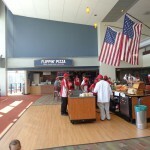 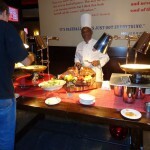 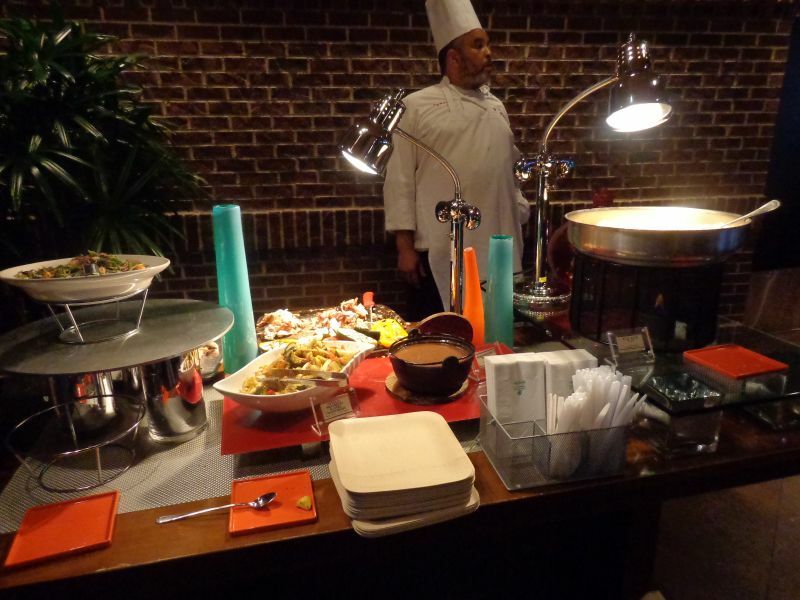 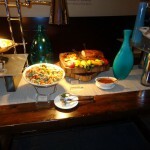 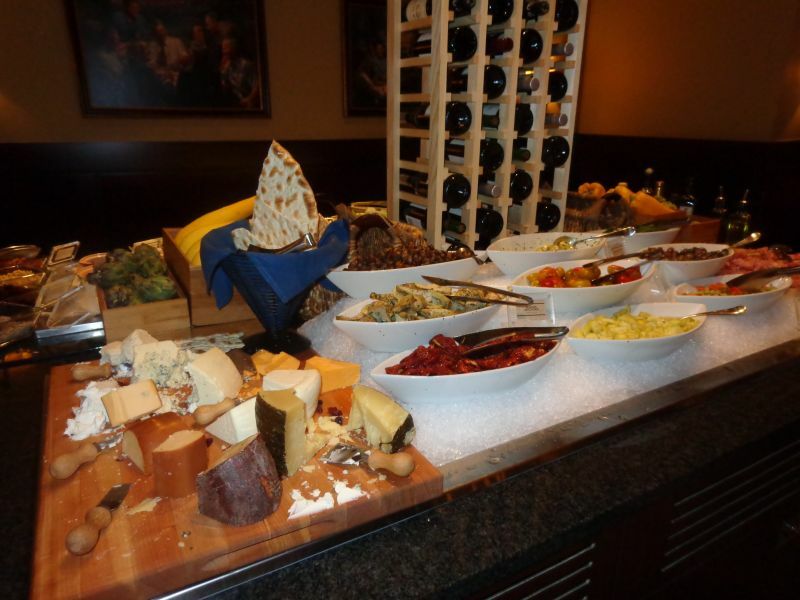 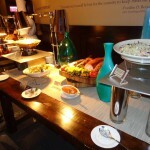 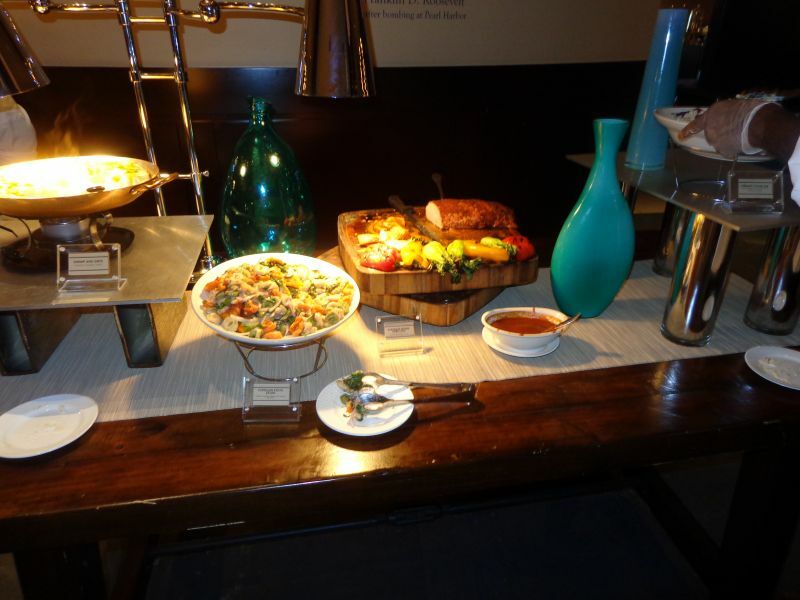 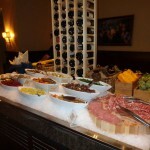 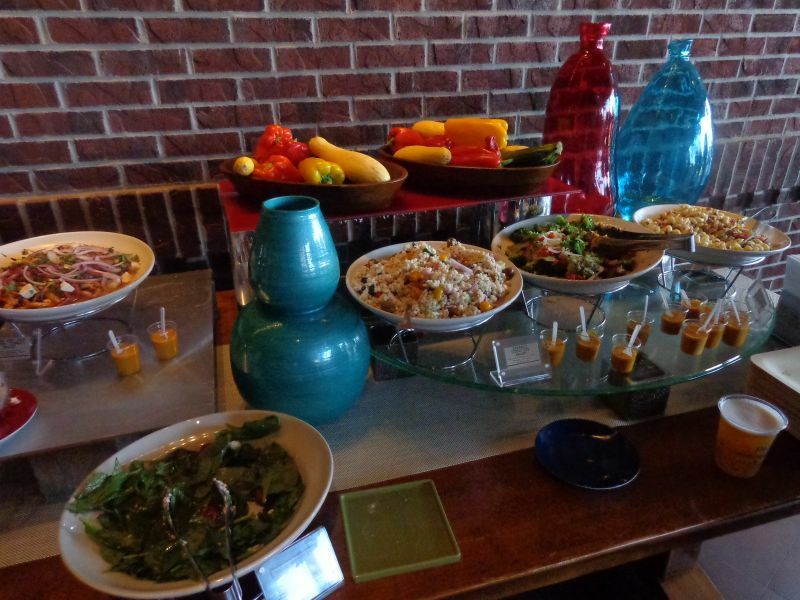 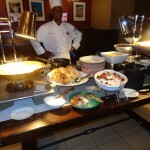 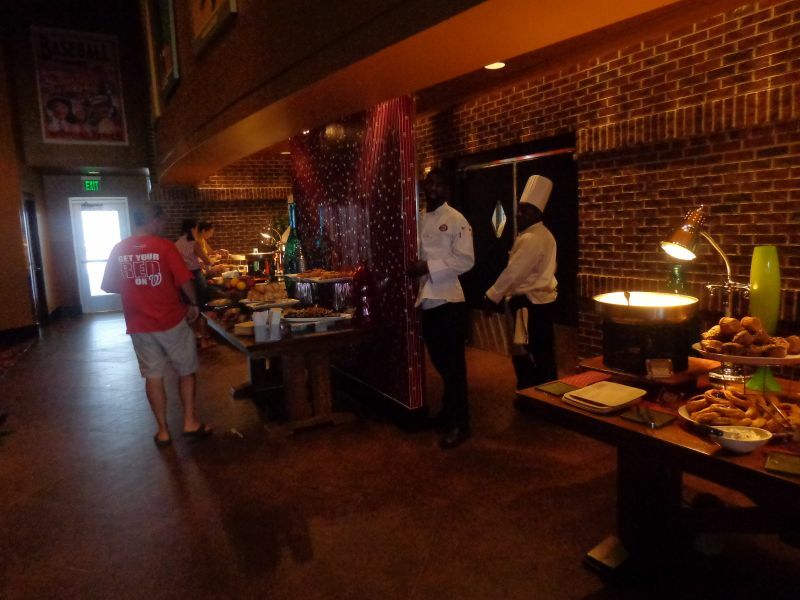 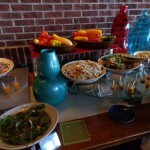 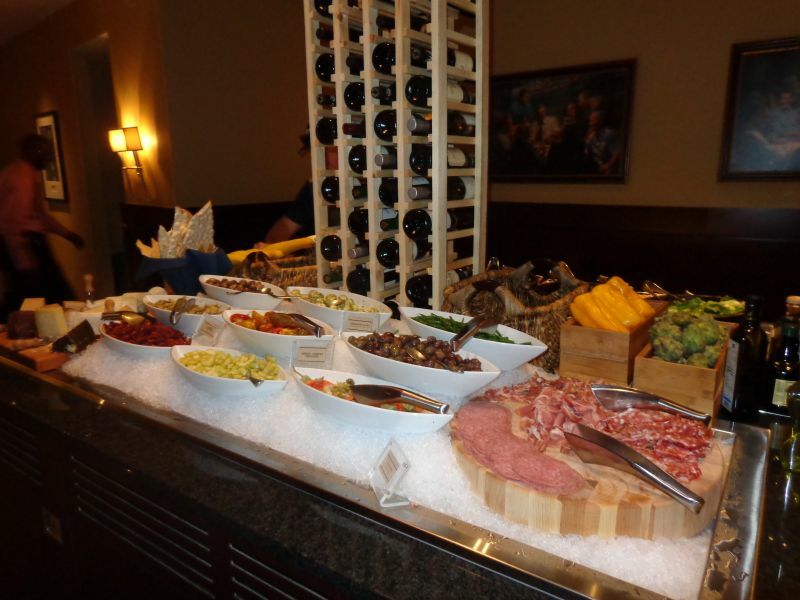 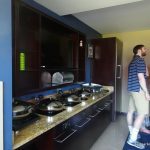 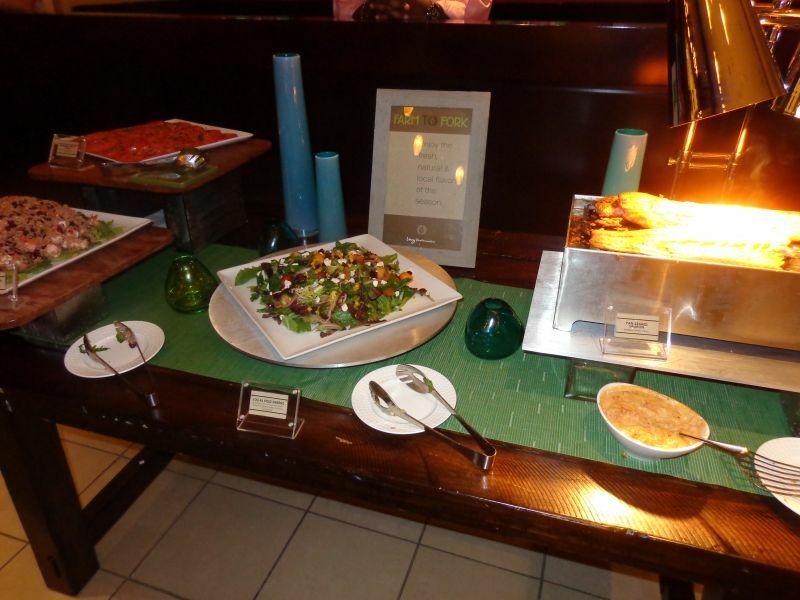 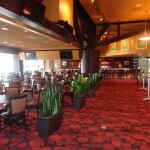 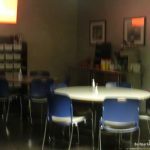 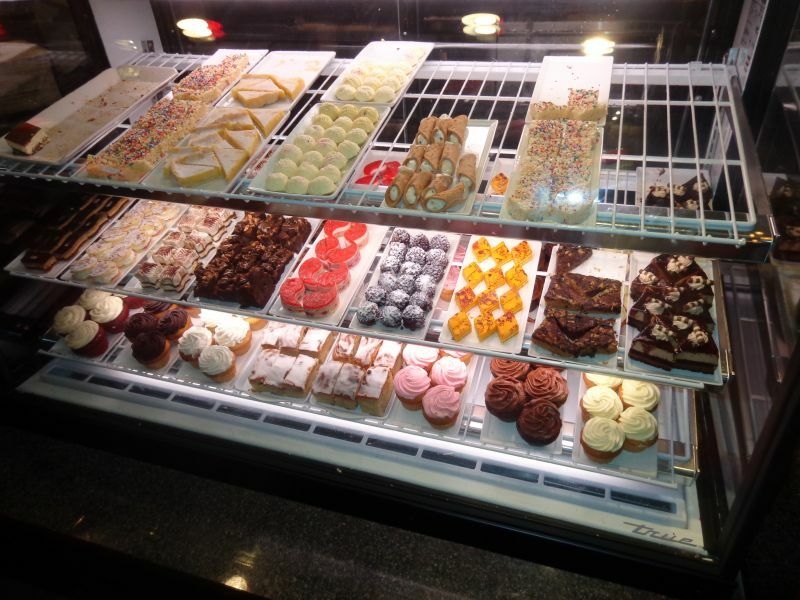 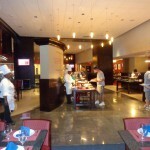 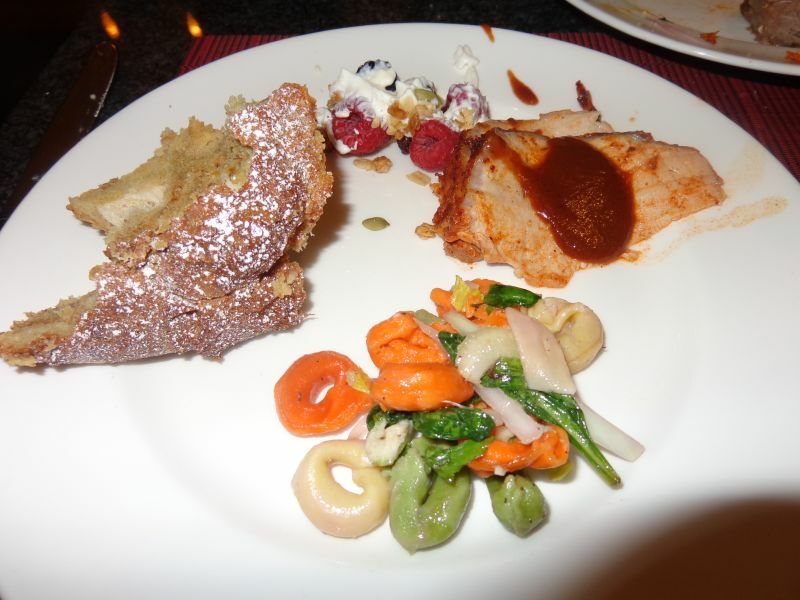 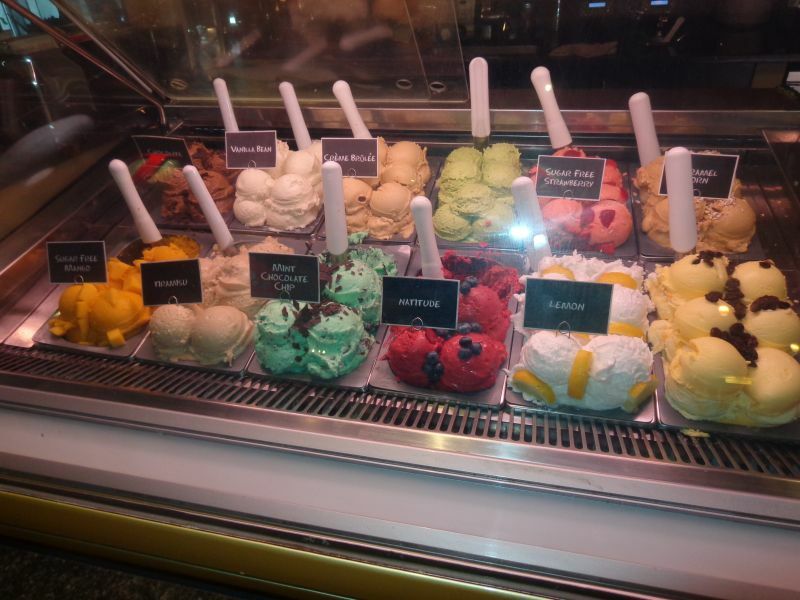 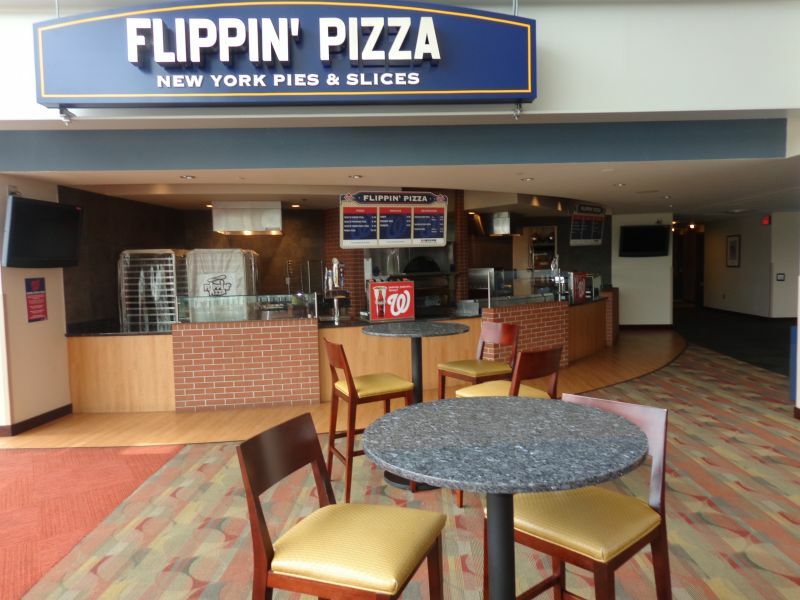 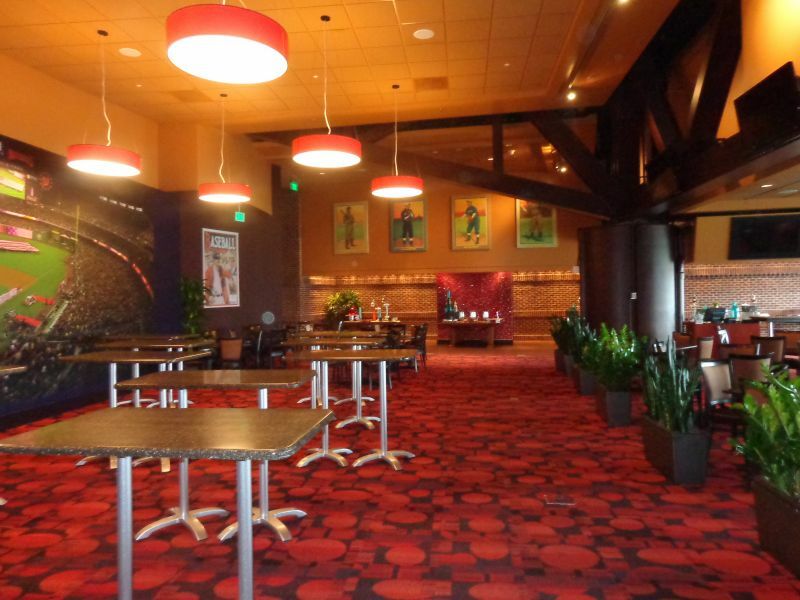 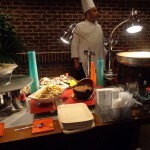 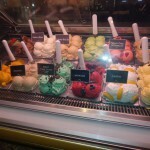 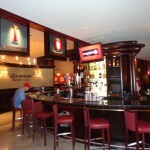 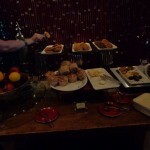 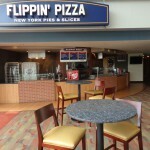 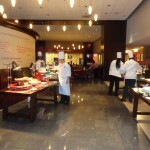 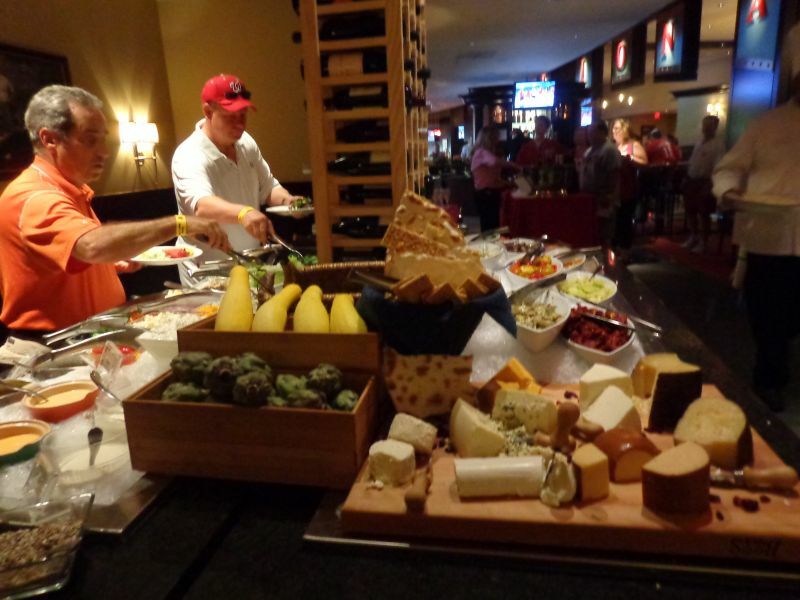 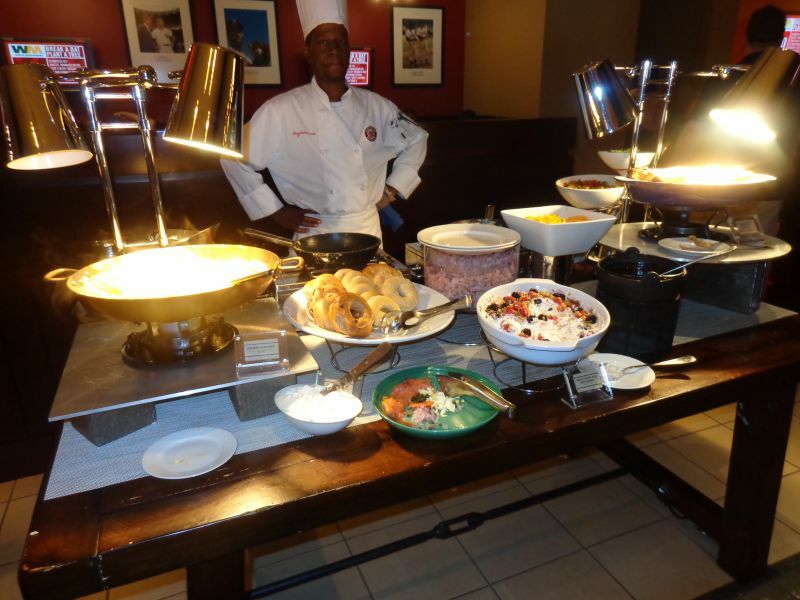 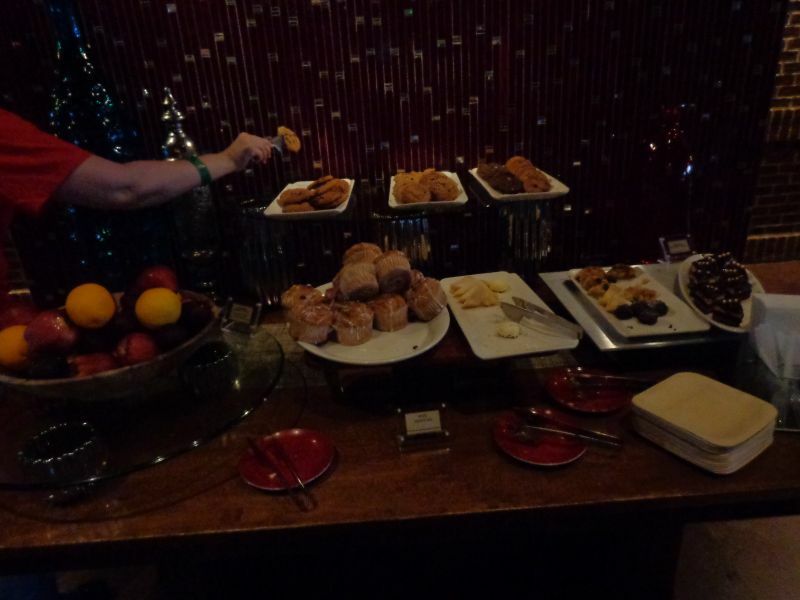 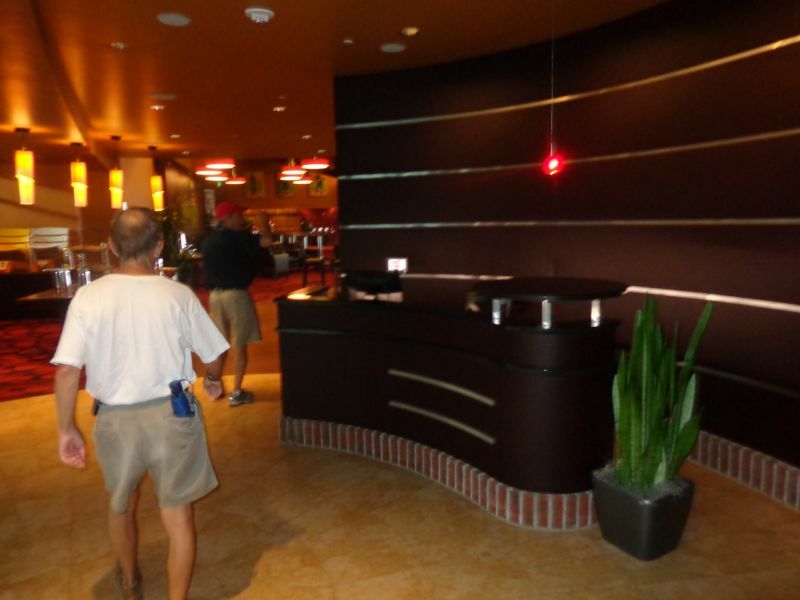 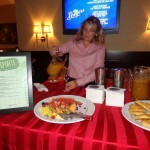 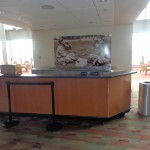 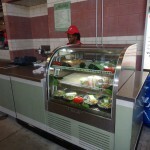 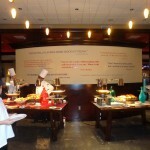 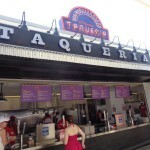 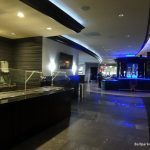 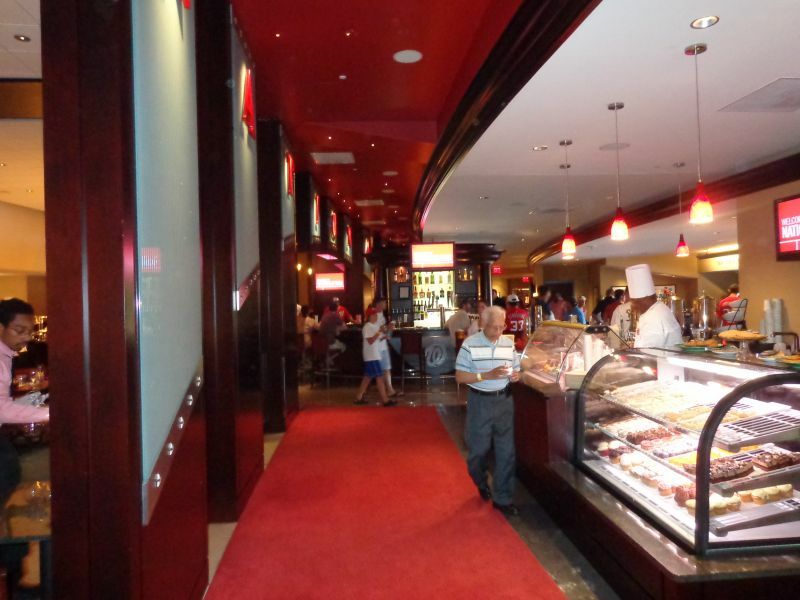 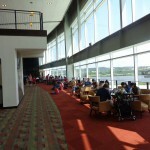 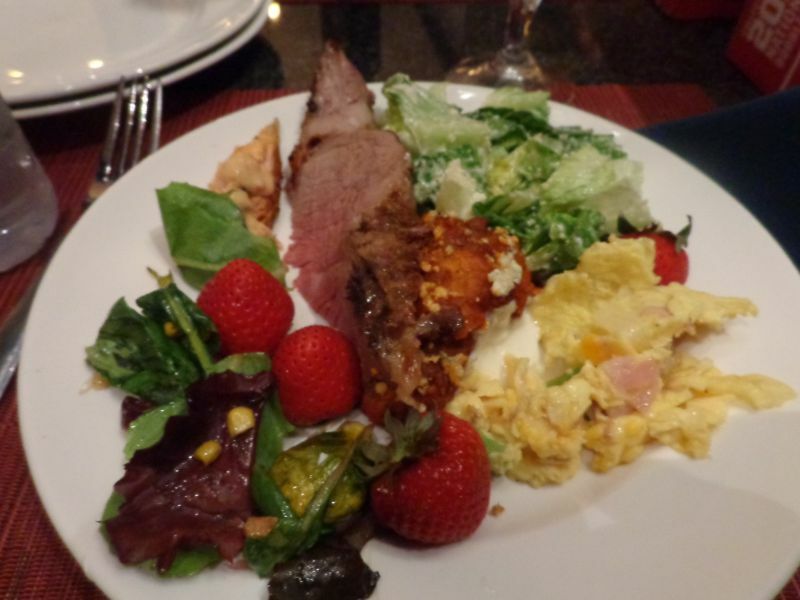 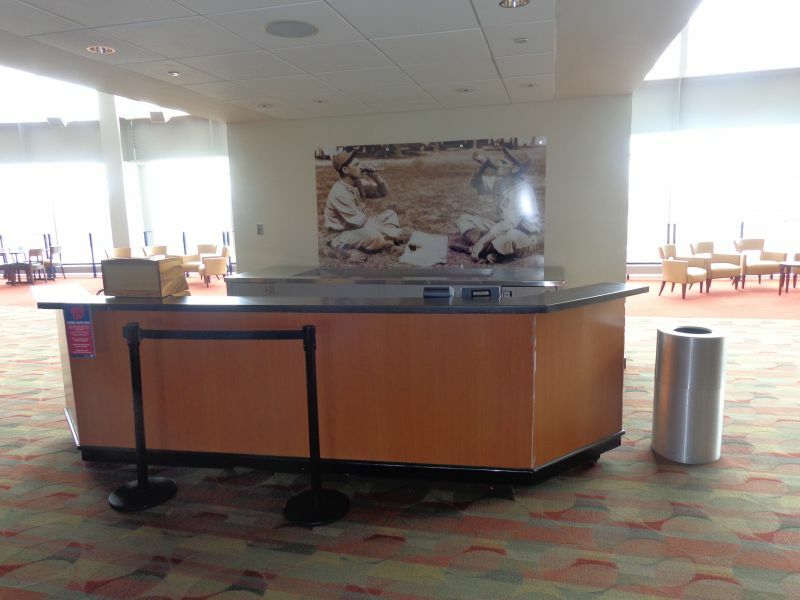 Regular food and beverage options are close to outstanding, with plenty of variety and great quality. 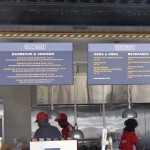 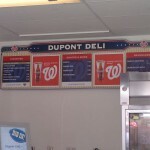 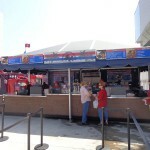 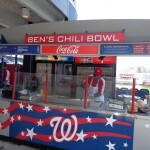 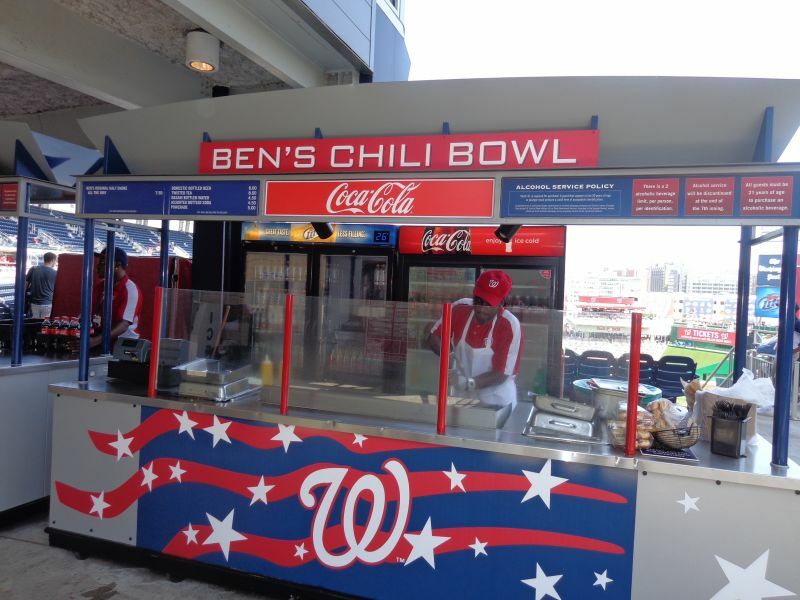 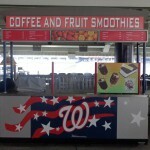 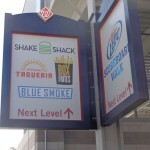 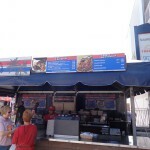 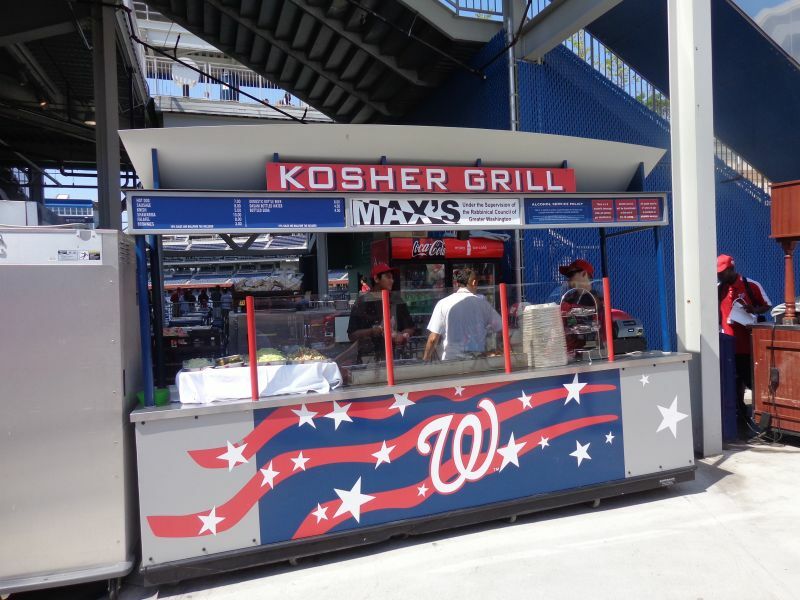 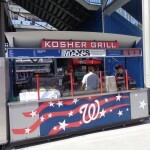 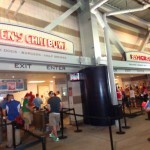 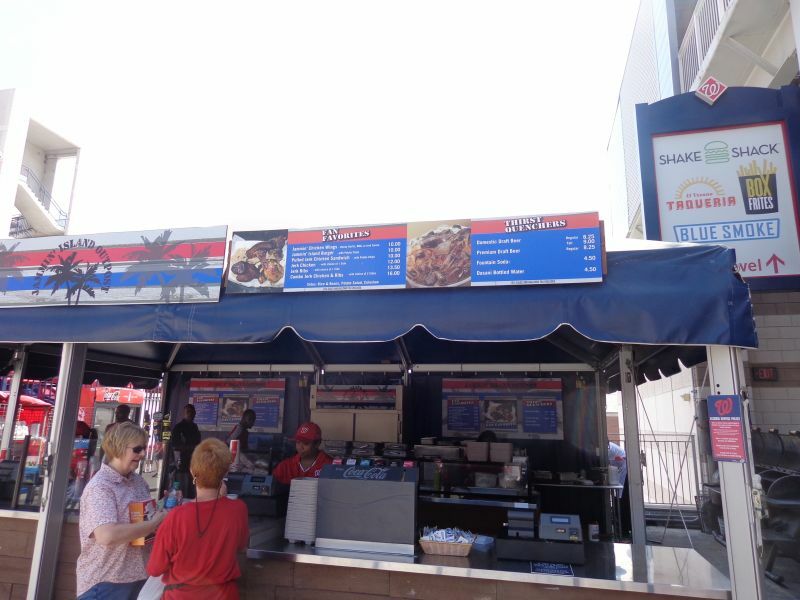 The Nationals brought in a couple of regionally inspired local food options as well, highlighted by Ben’s Chili Bowl. 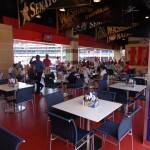 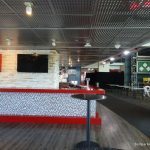 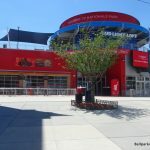 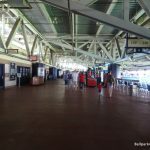 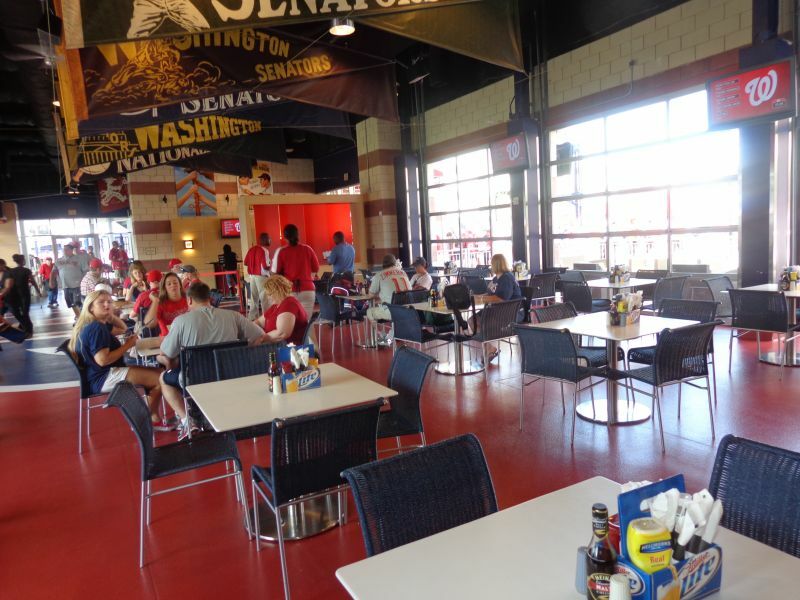 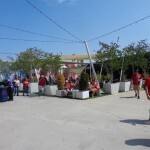 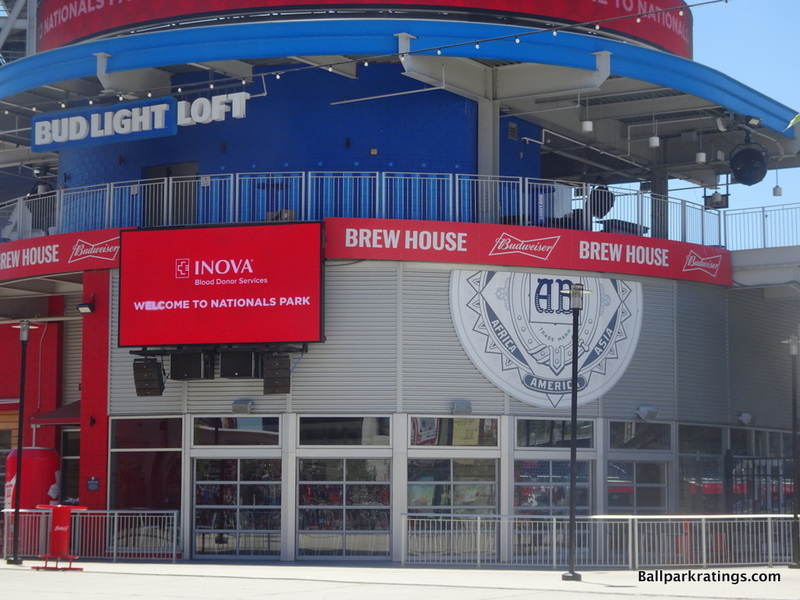 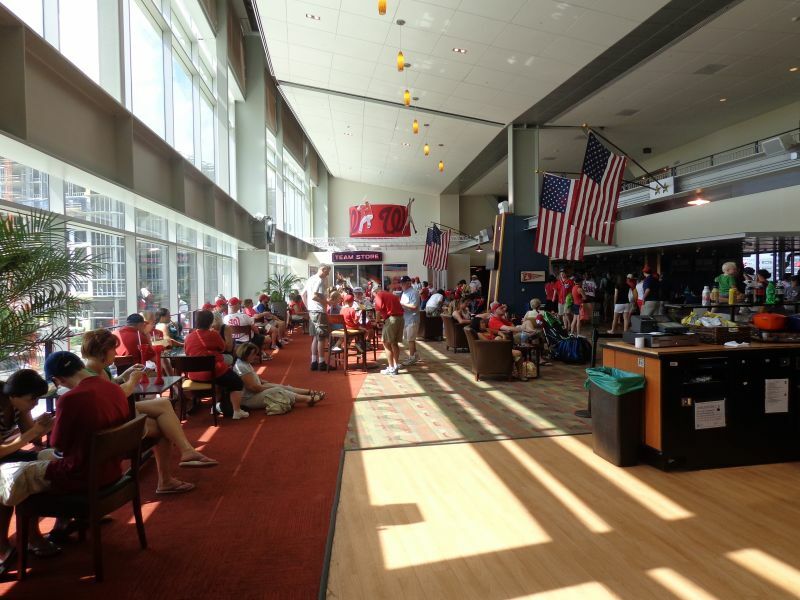 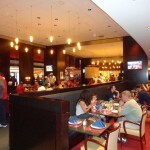 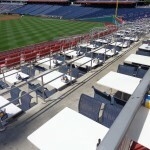 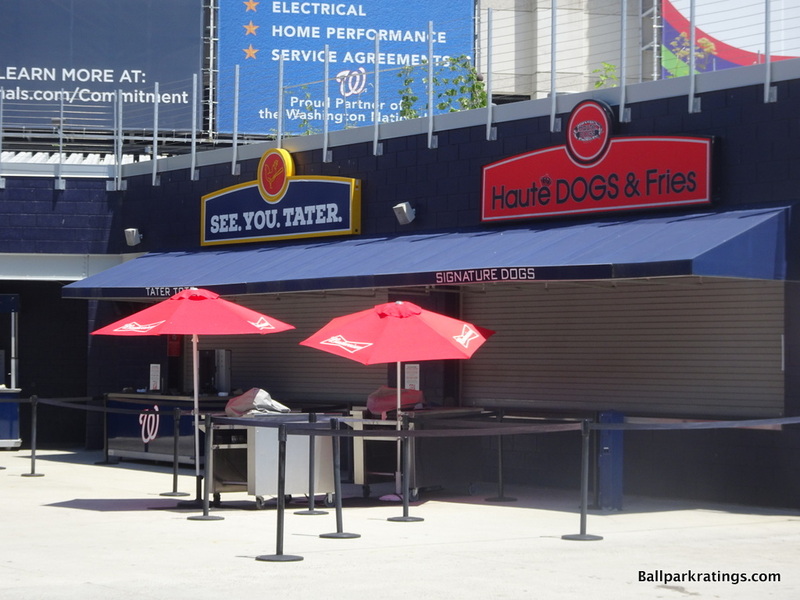 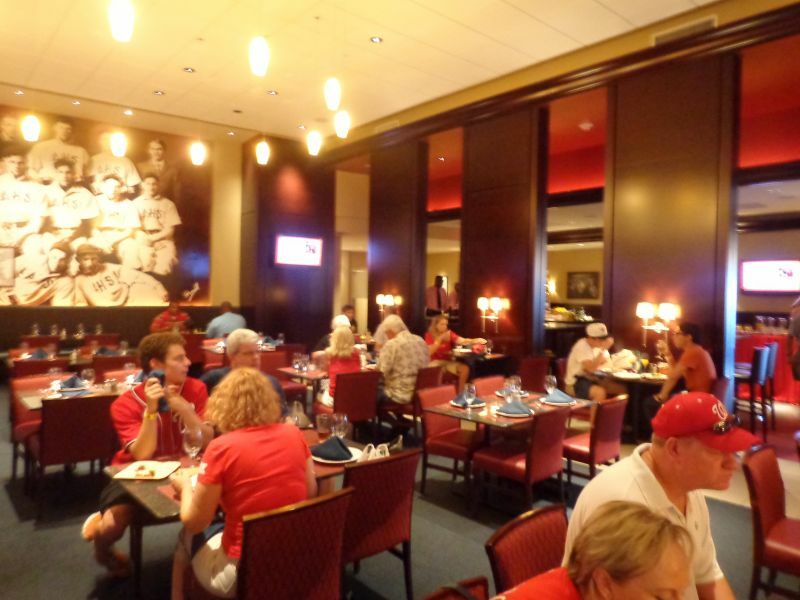 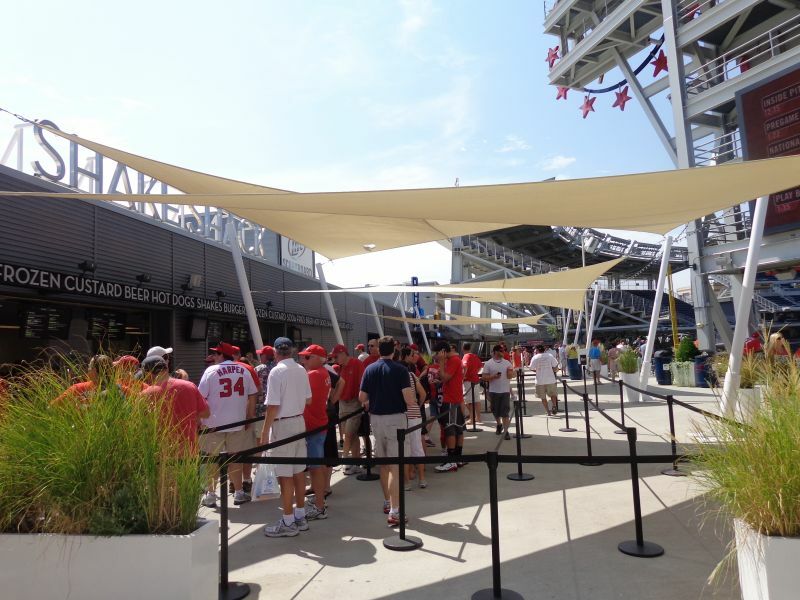 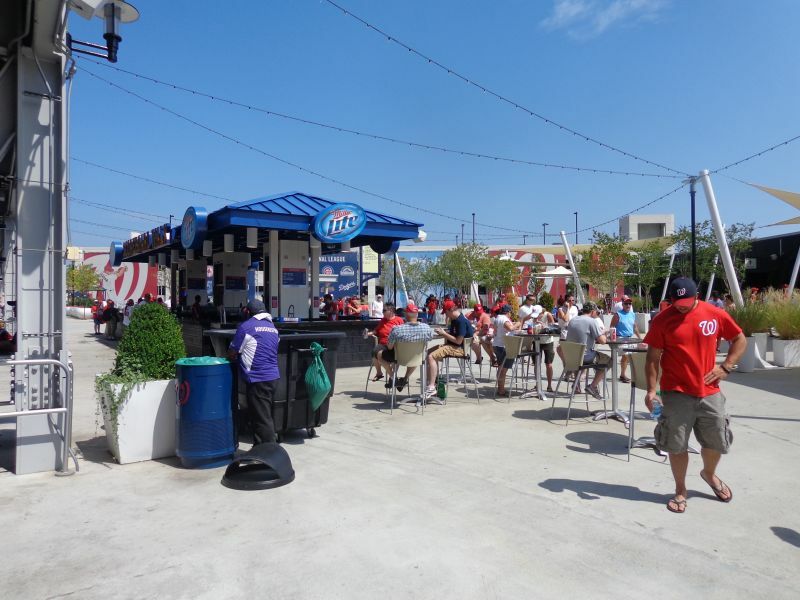 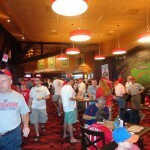 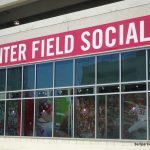 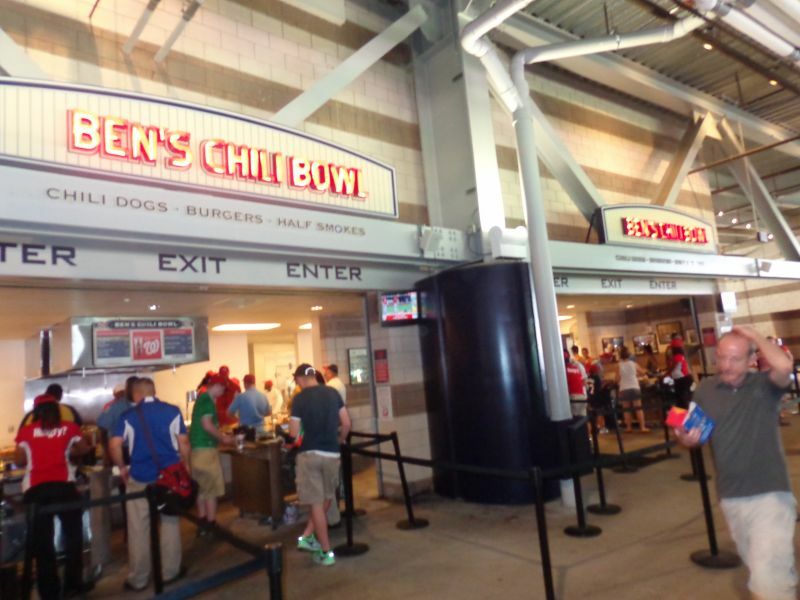 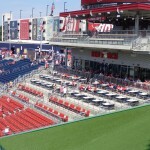 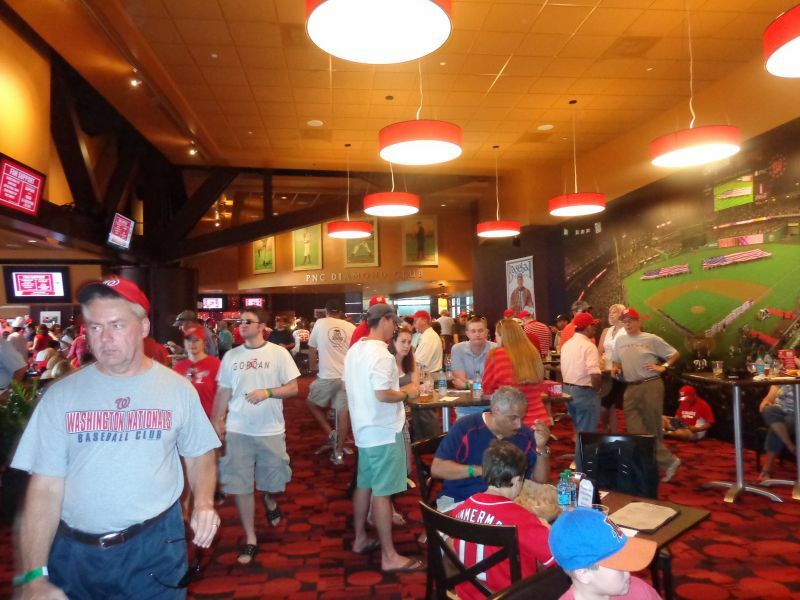 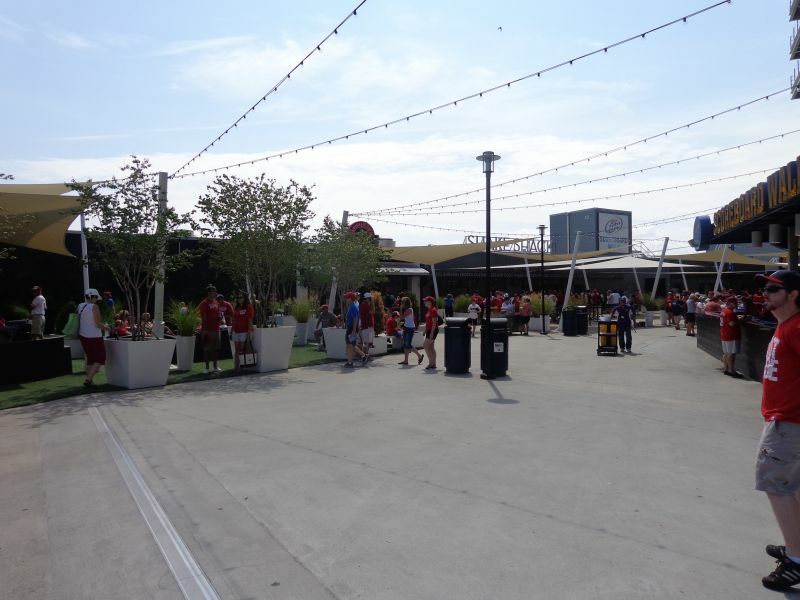 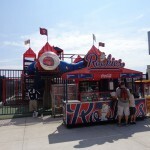 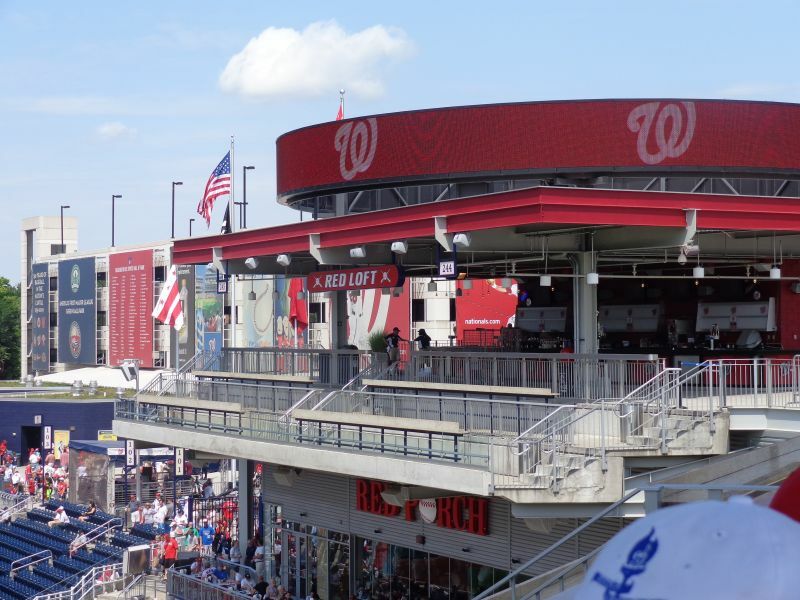 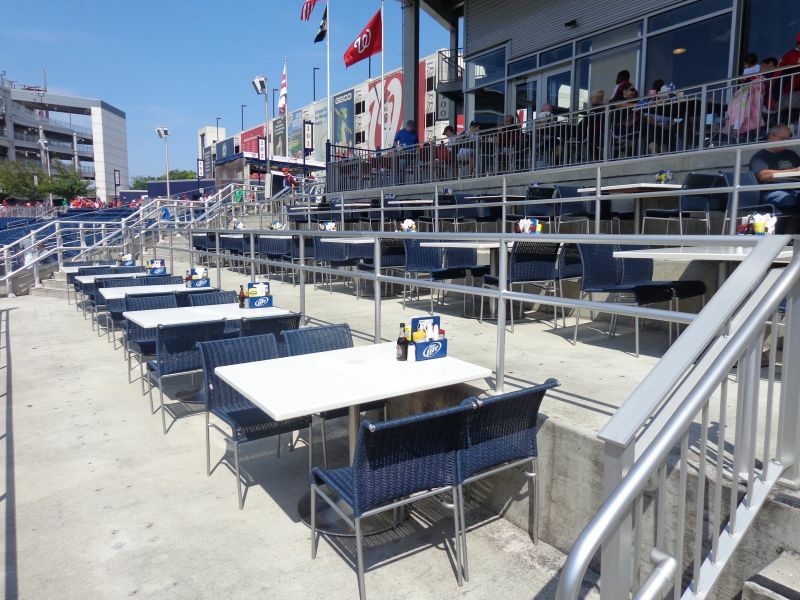 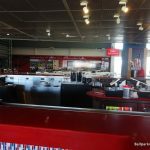 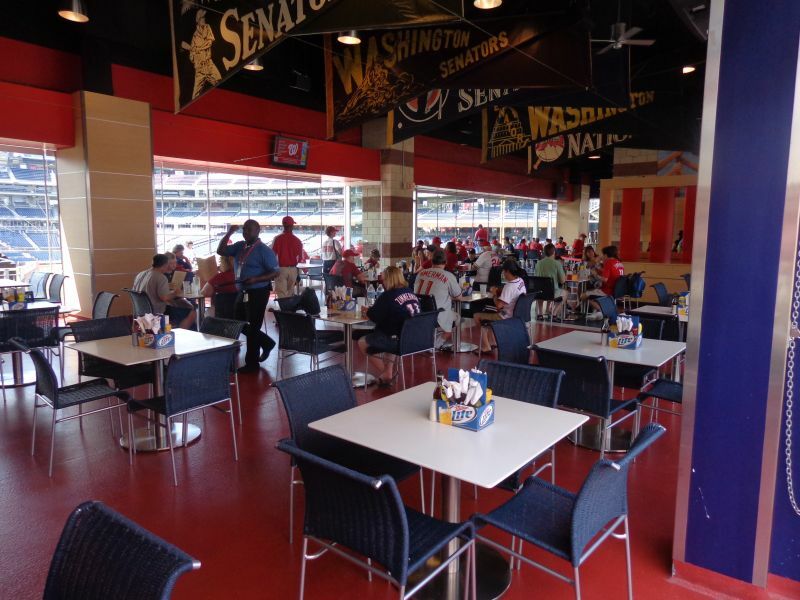 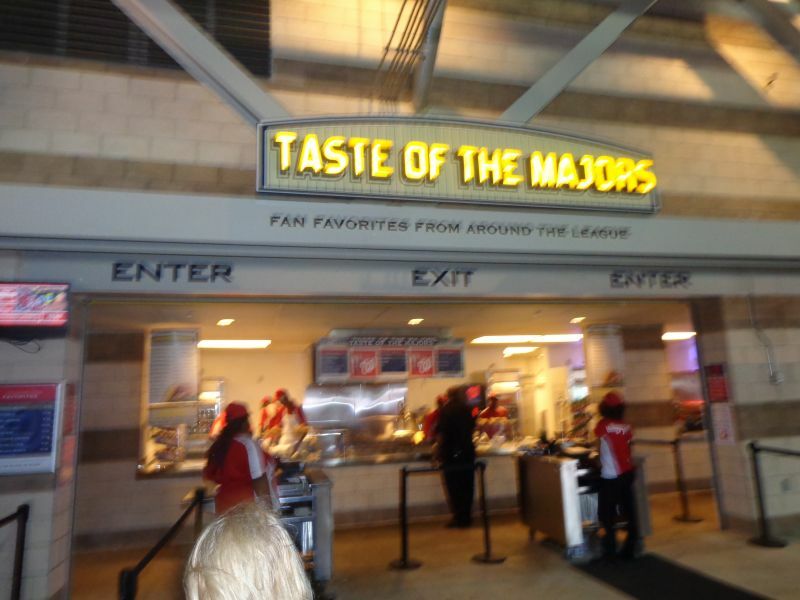 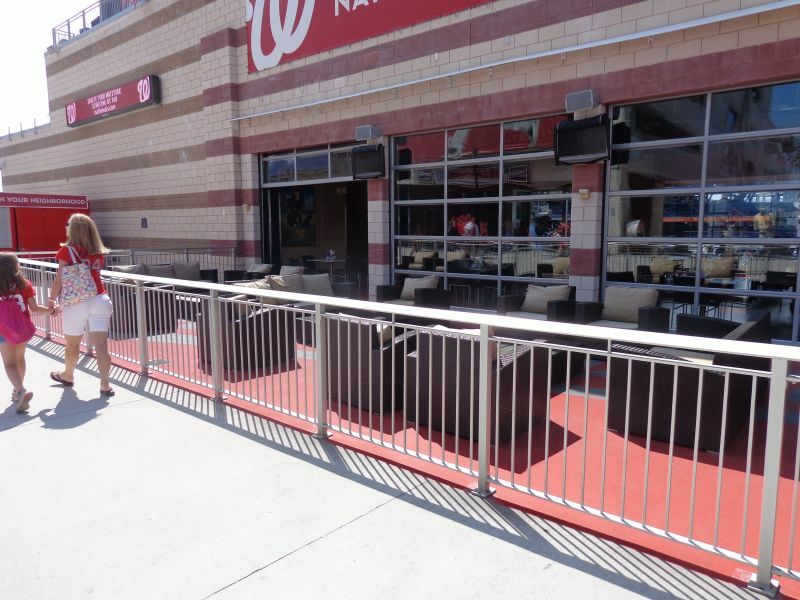 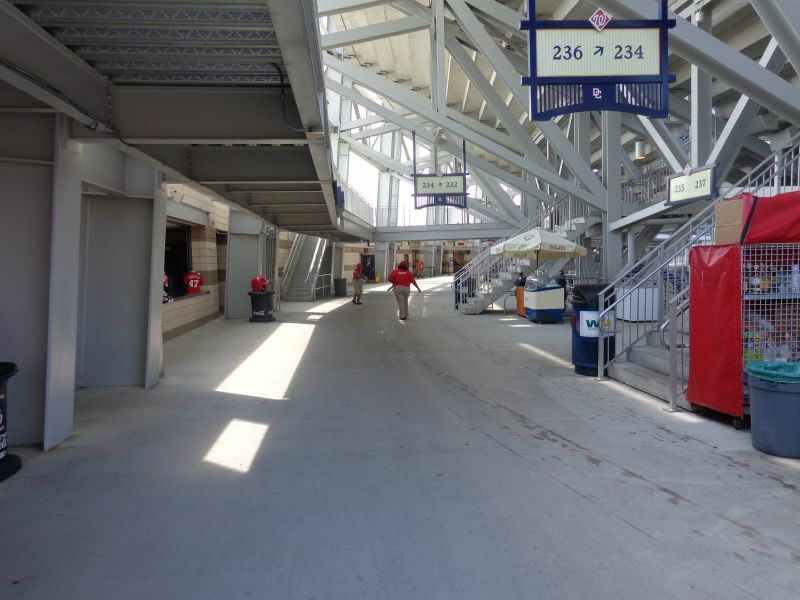 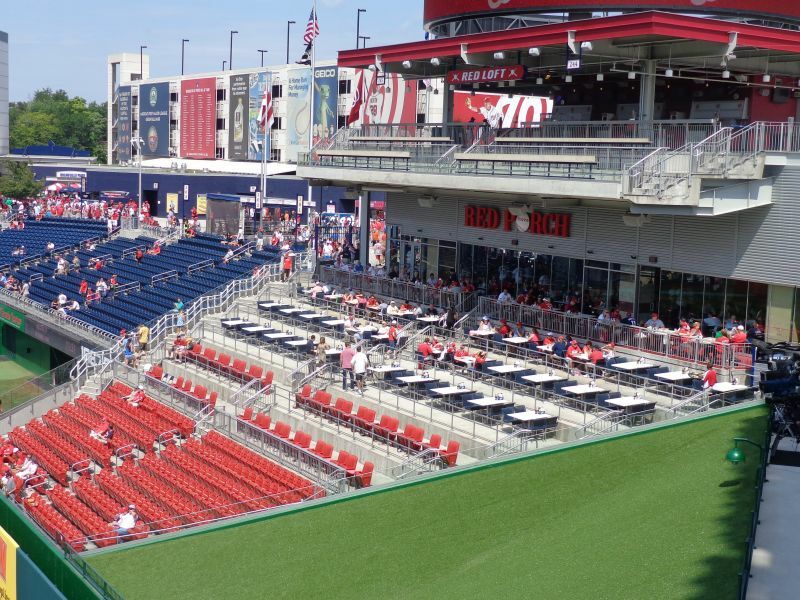 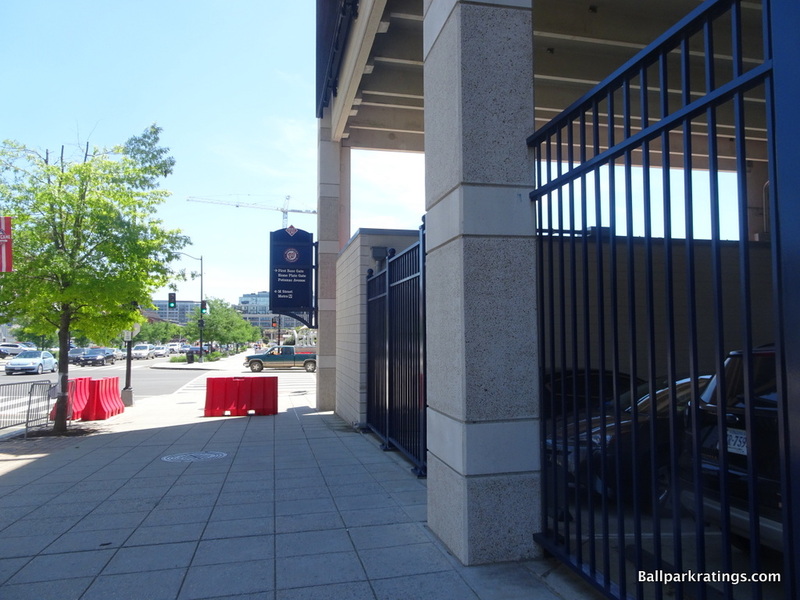 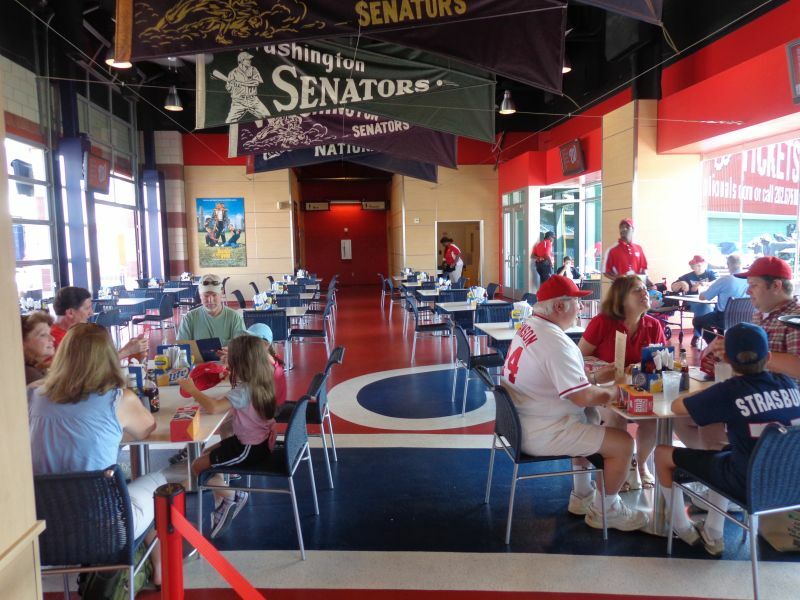 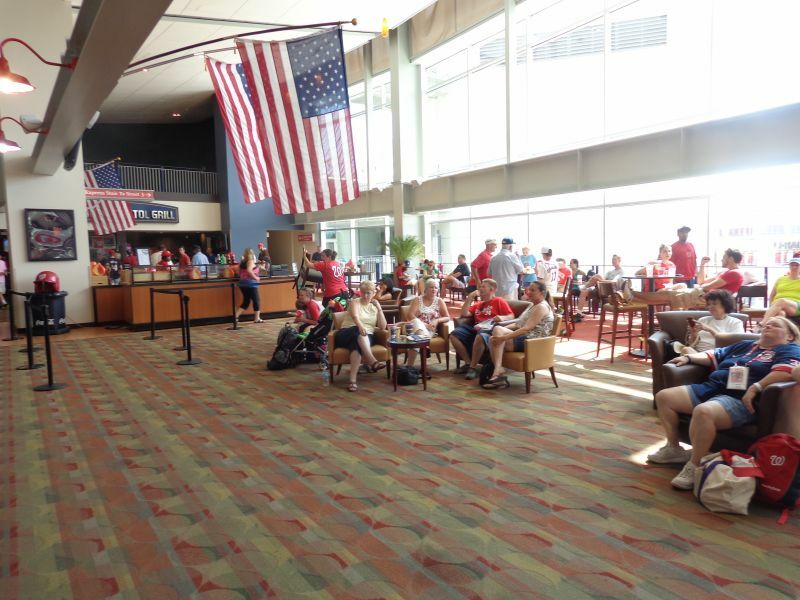 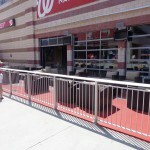 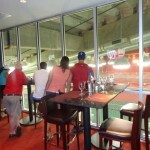 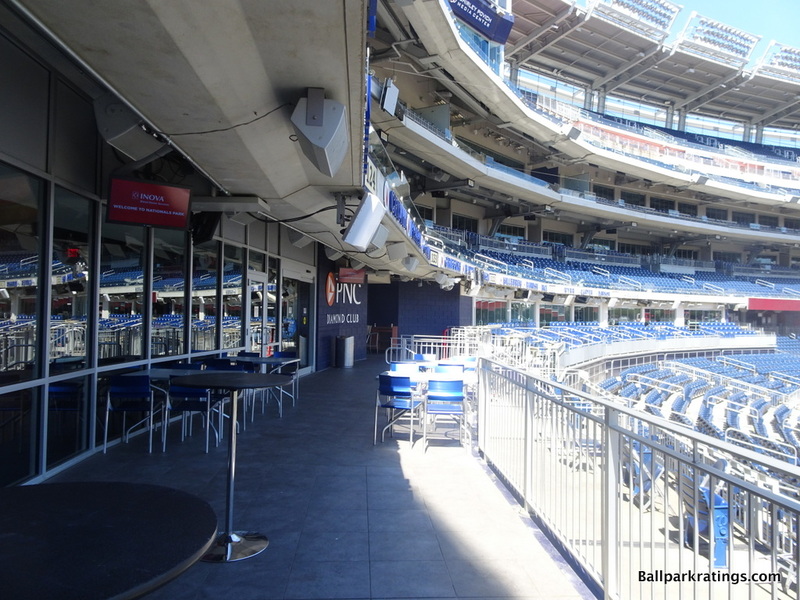 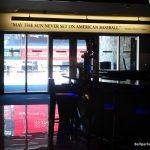 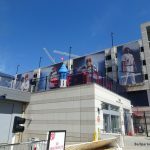 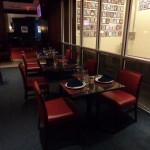 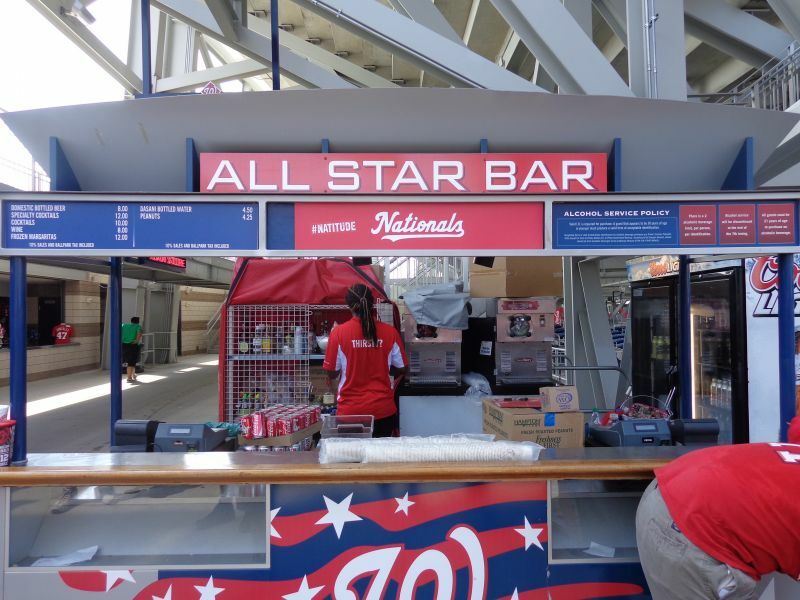 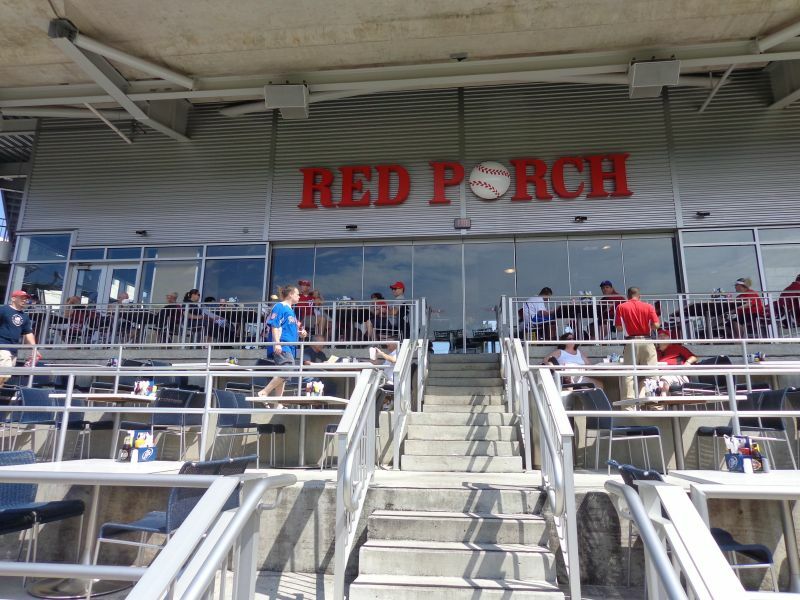 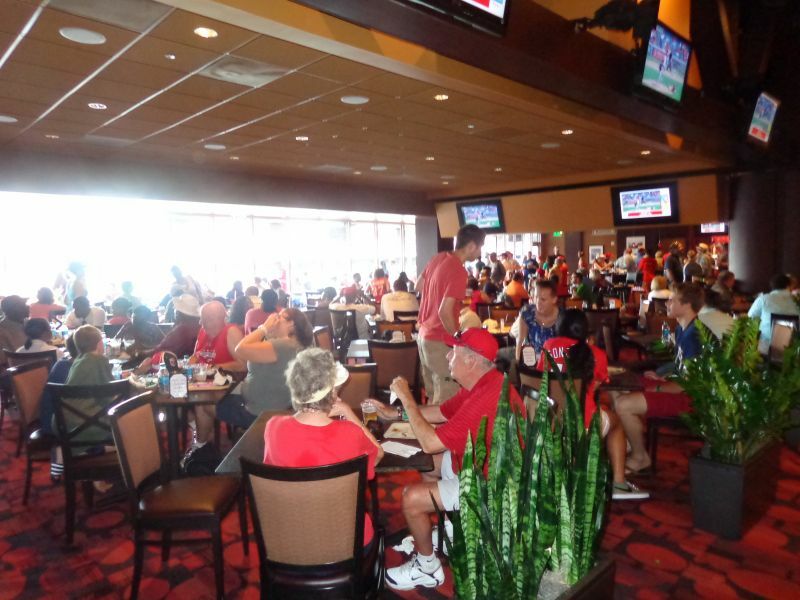 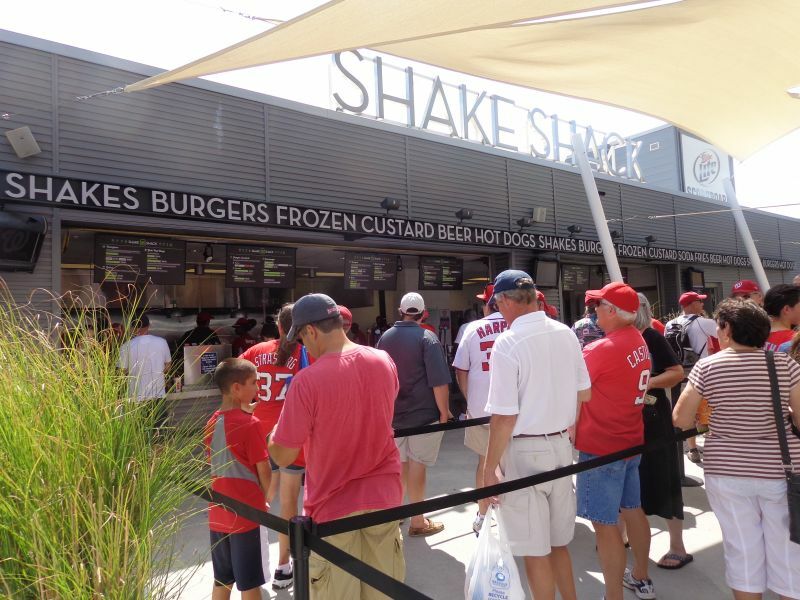 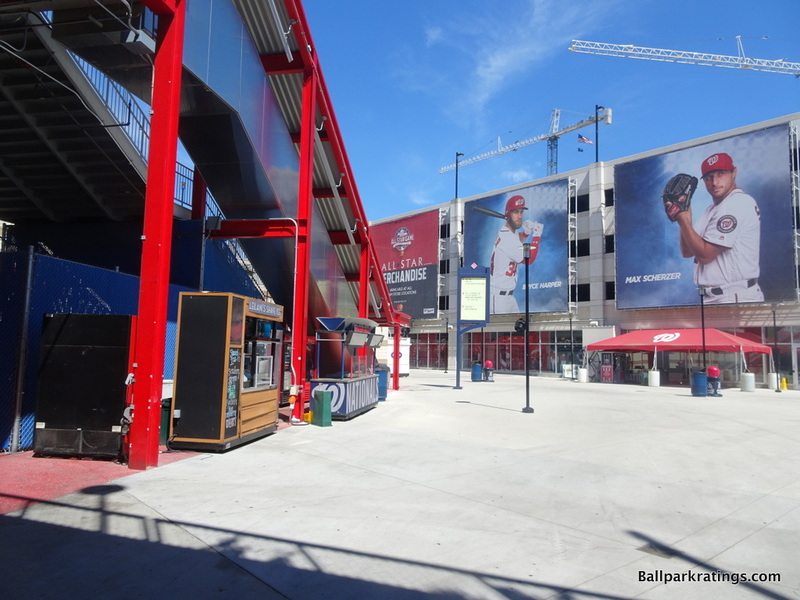 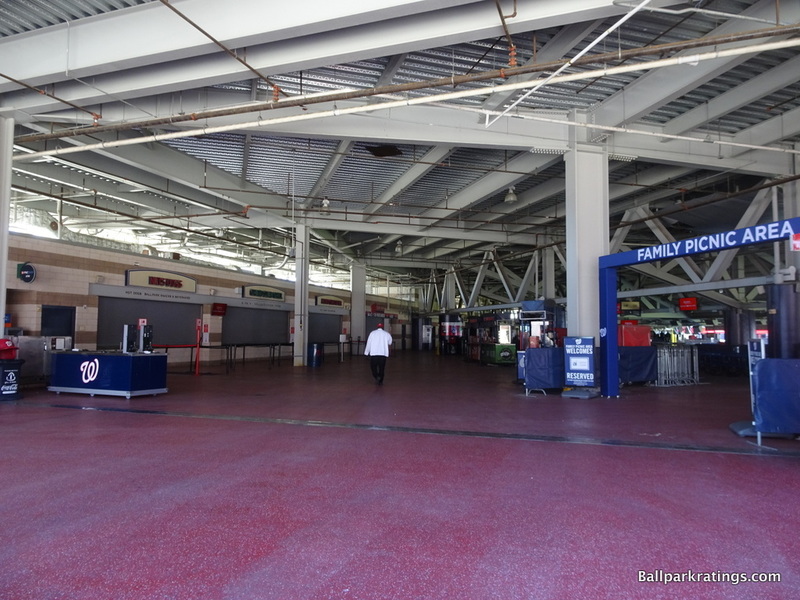 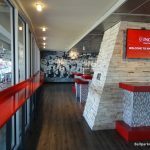 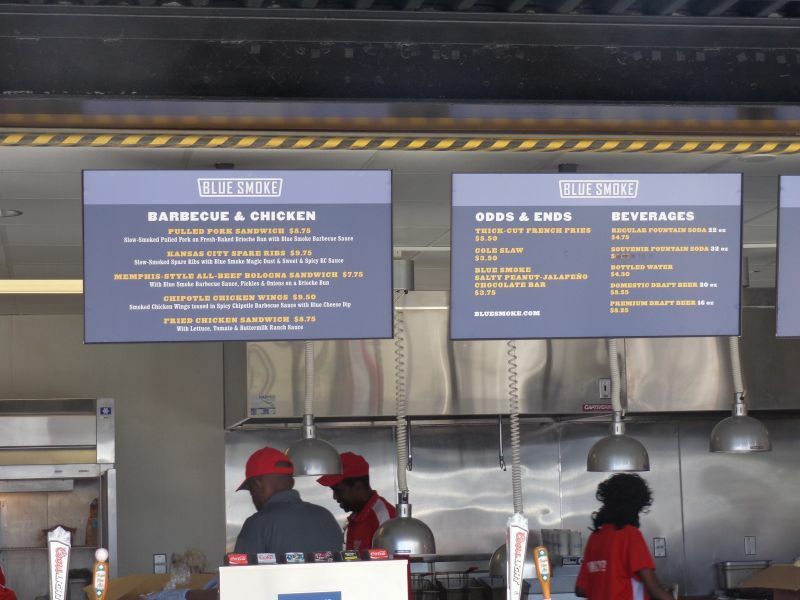 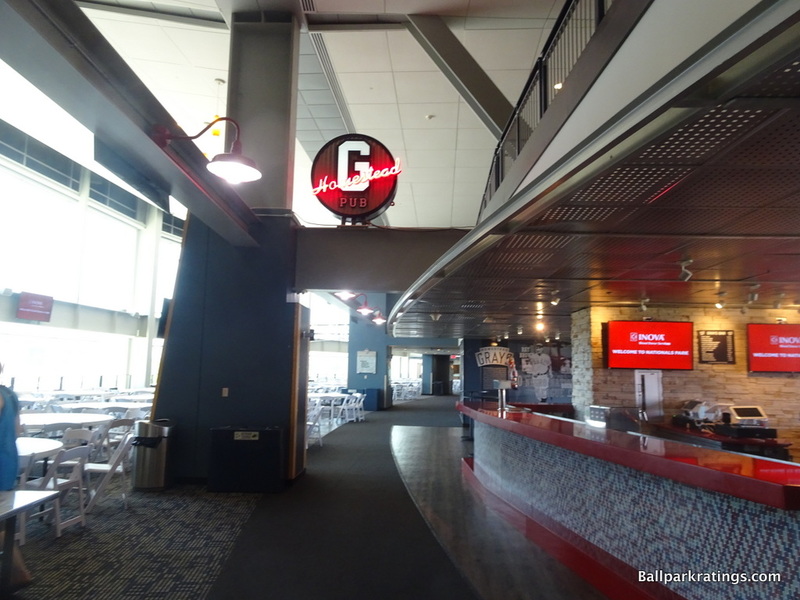 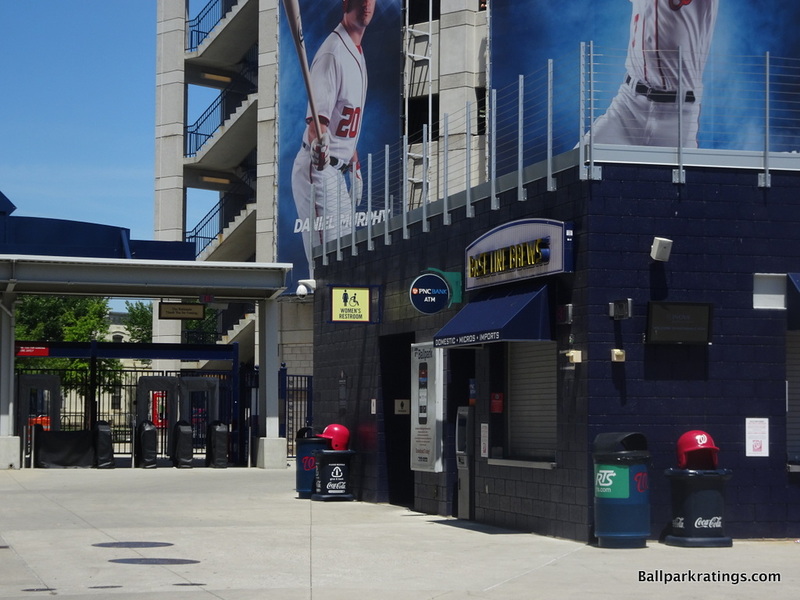 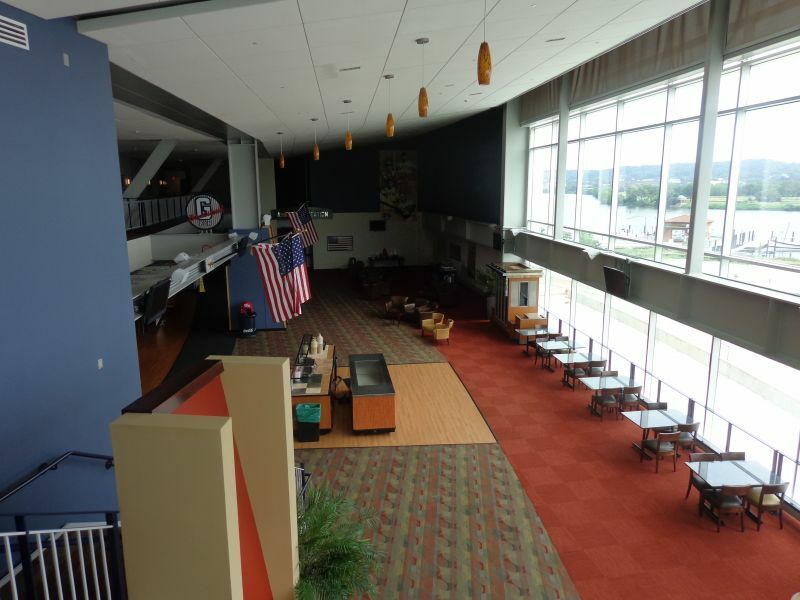 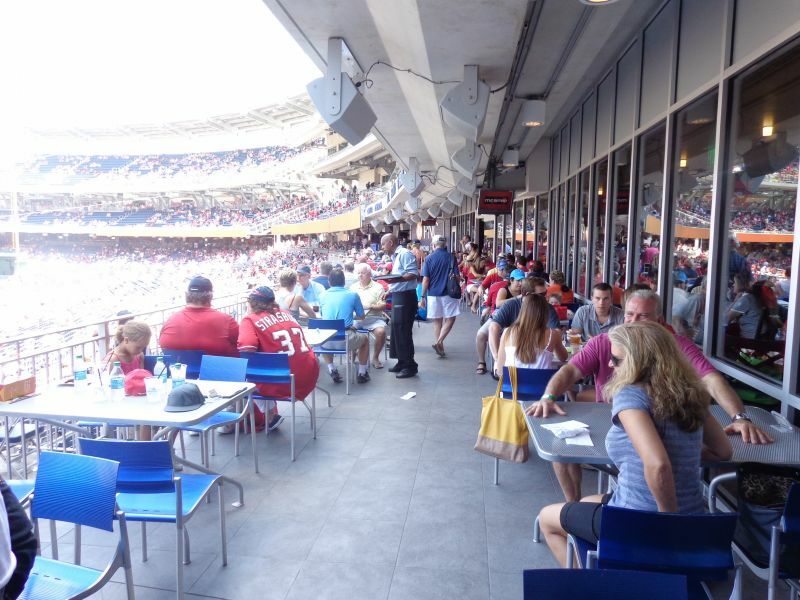 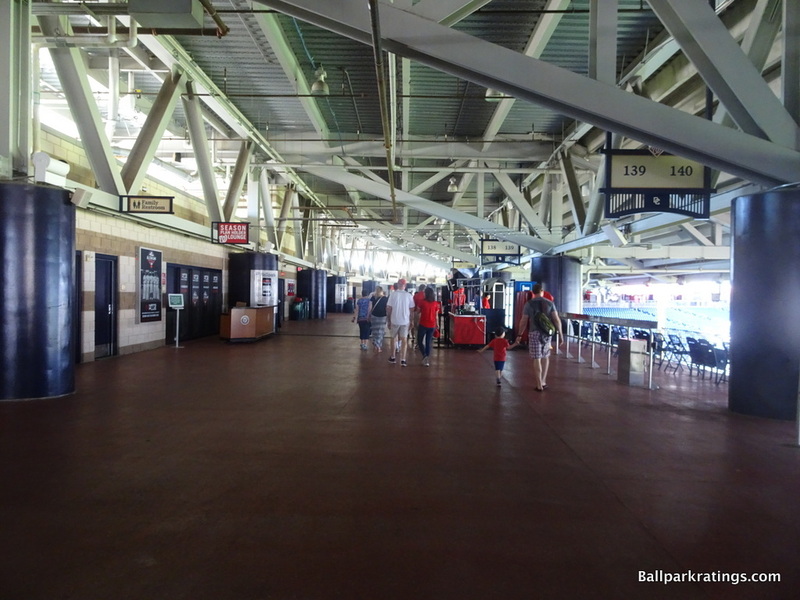 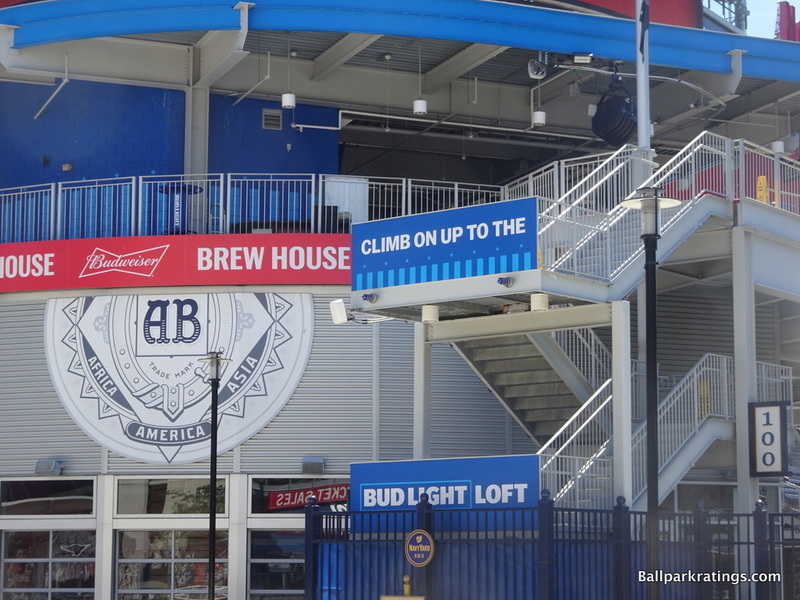 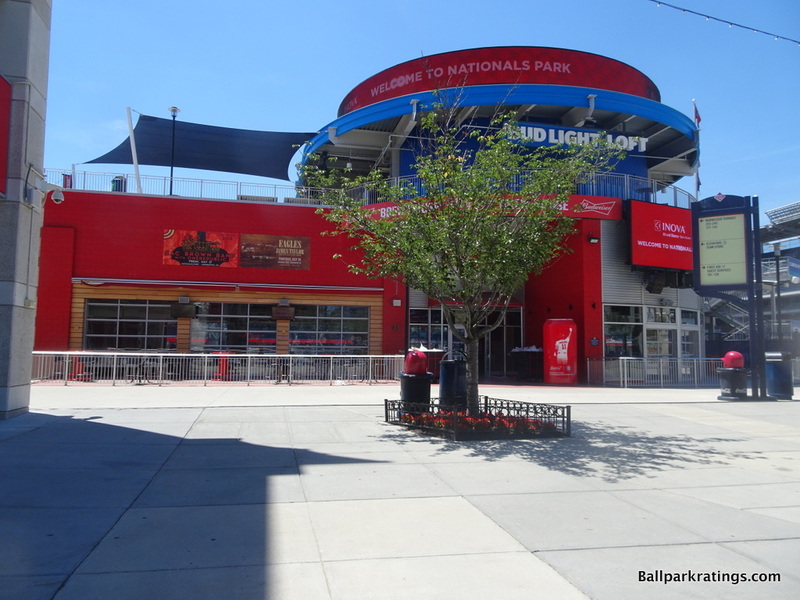 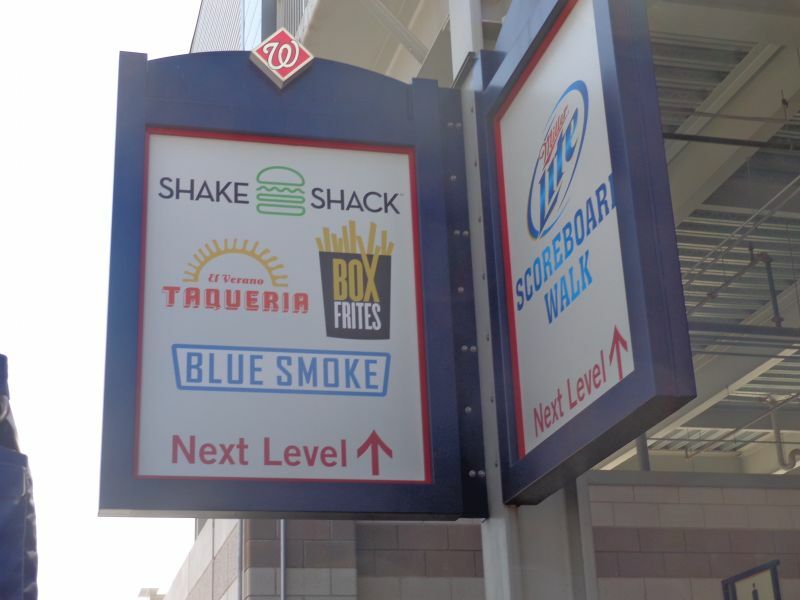 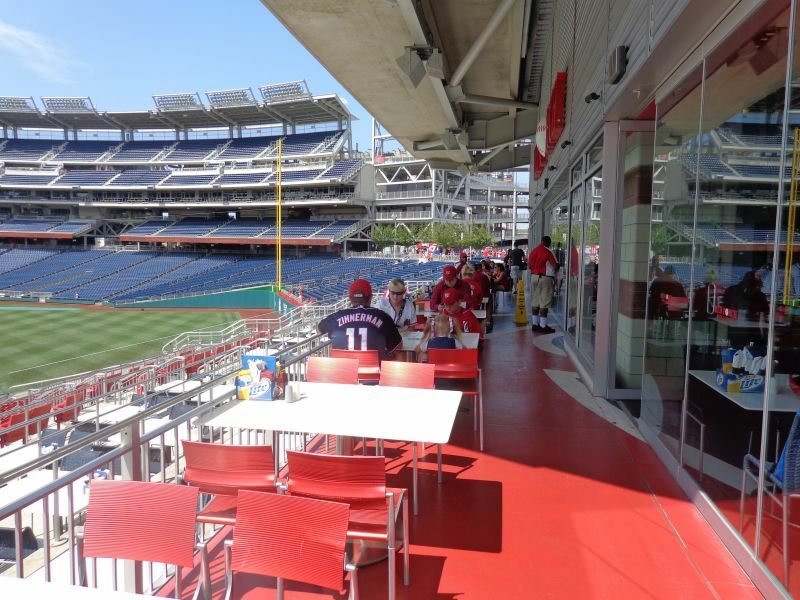 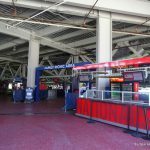 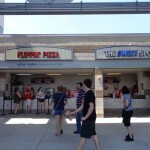 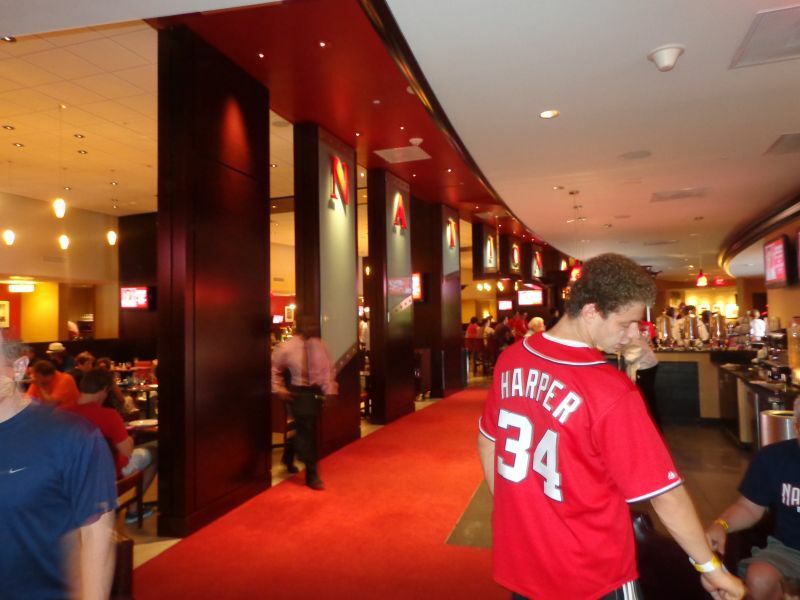 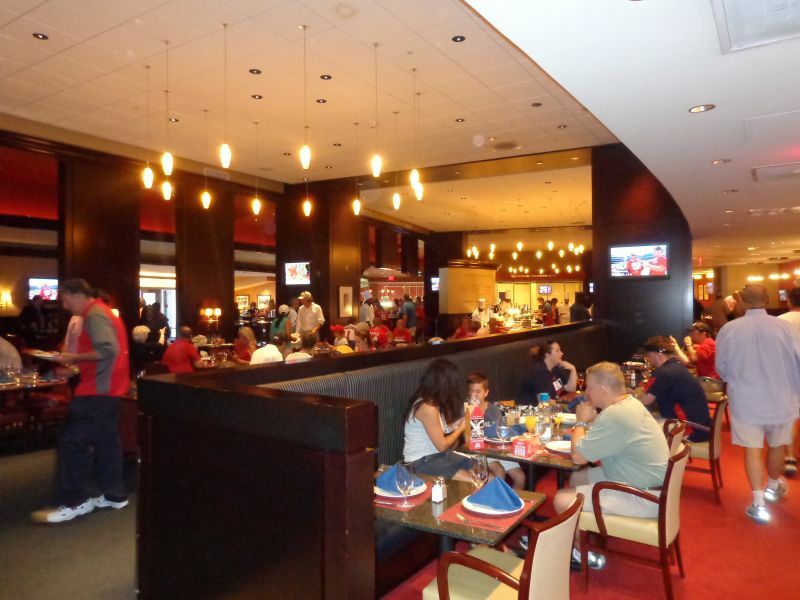 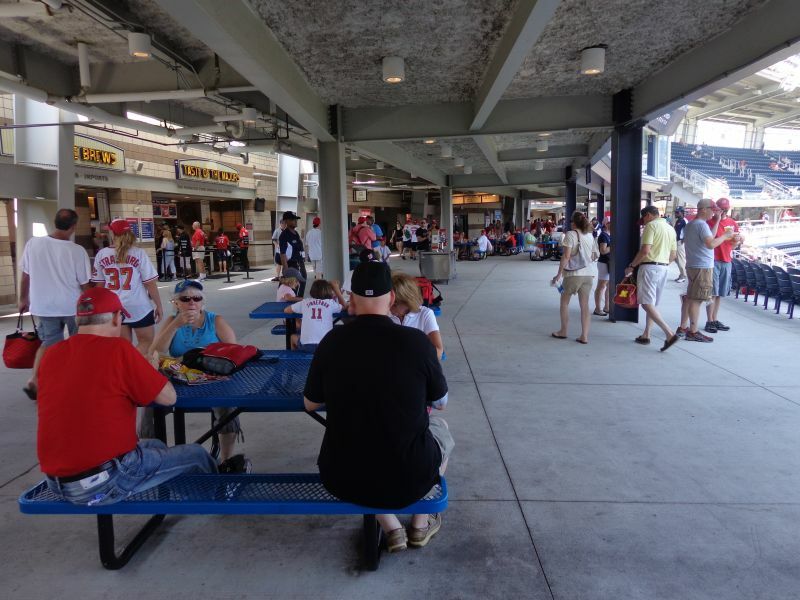 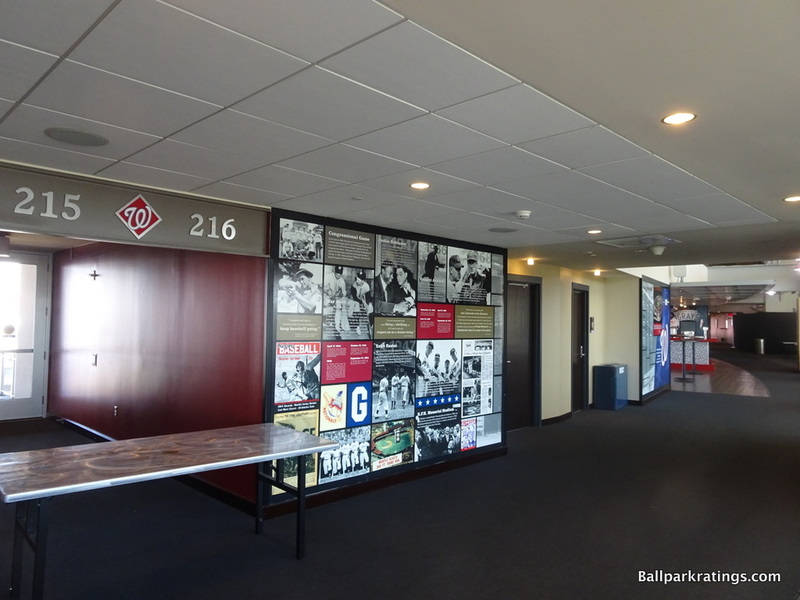 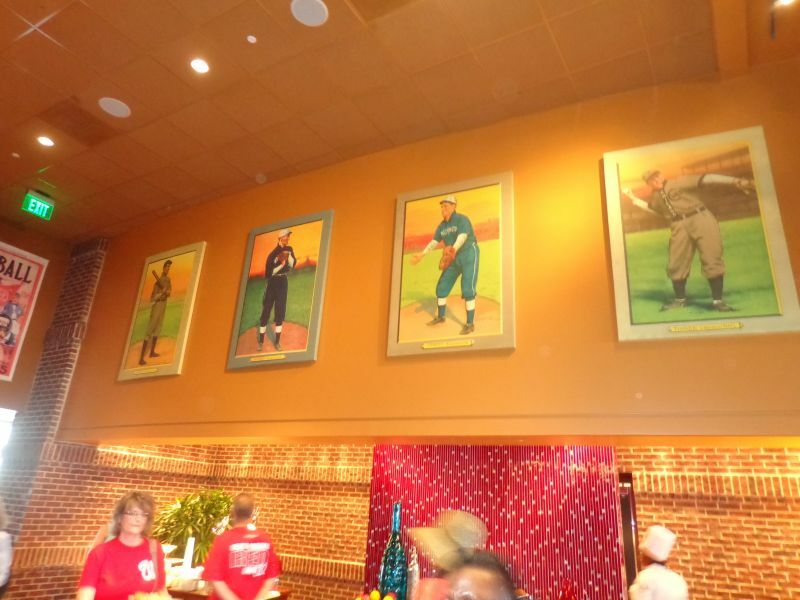 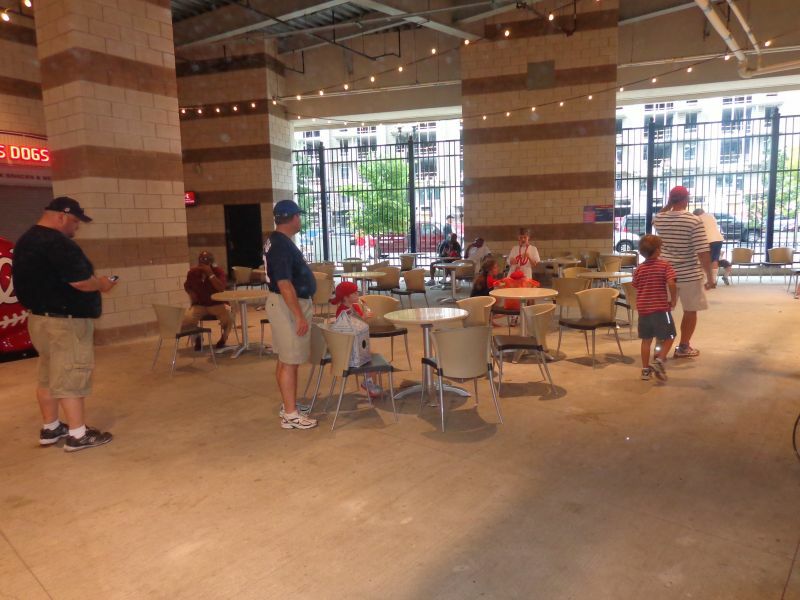 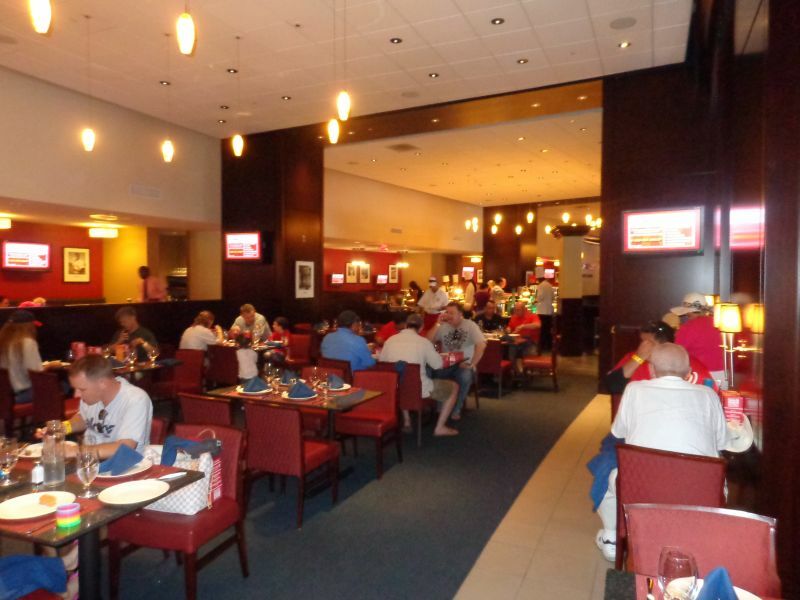 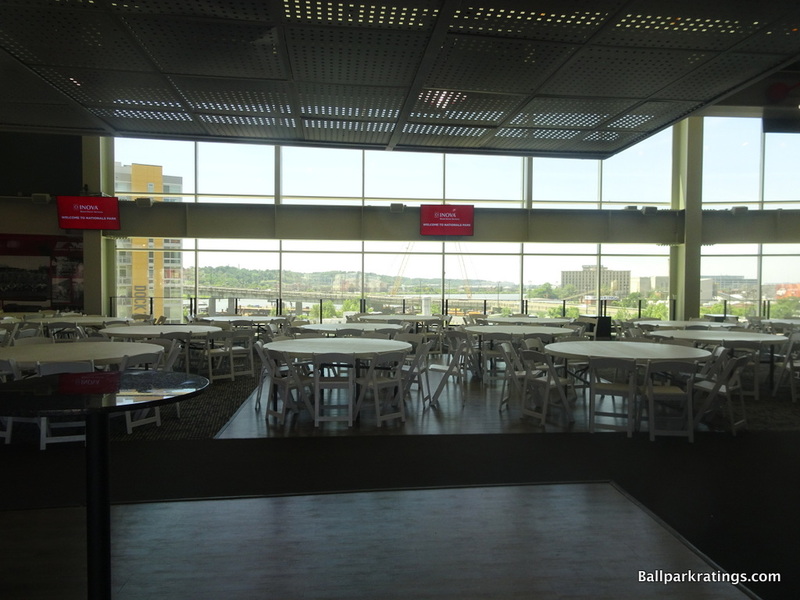 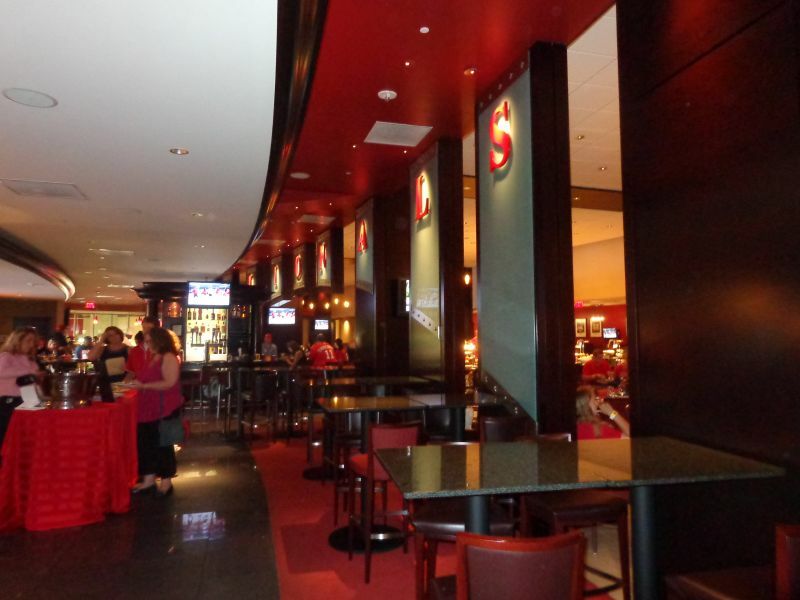 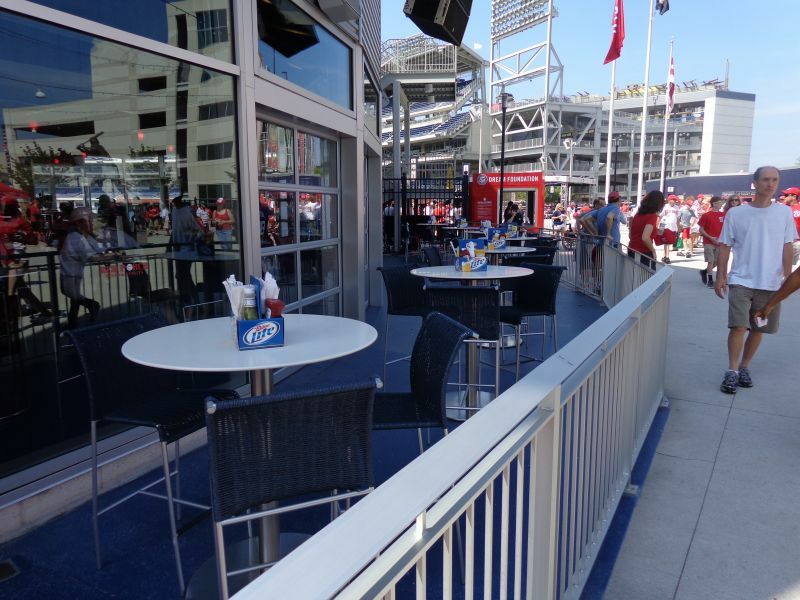 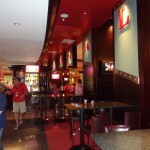 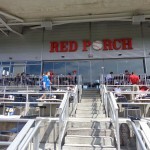 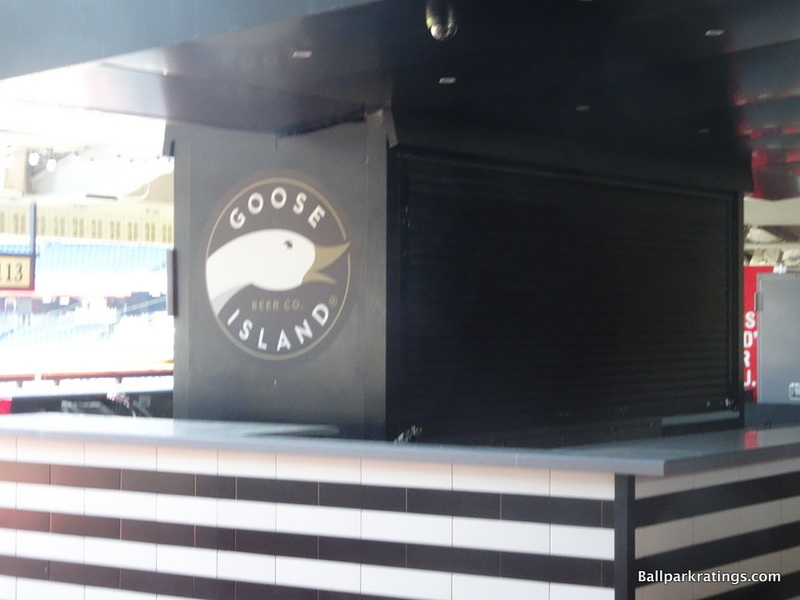 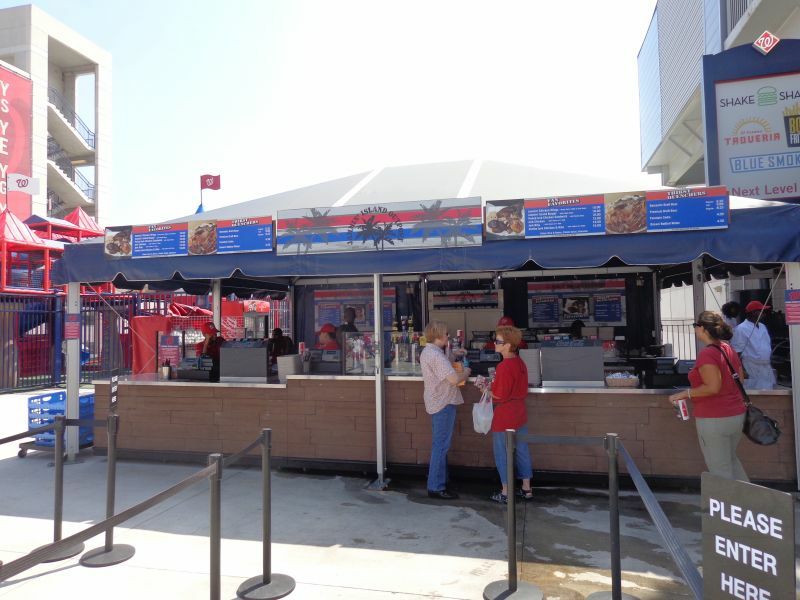 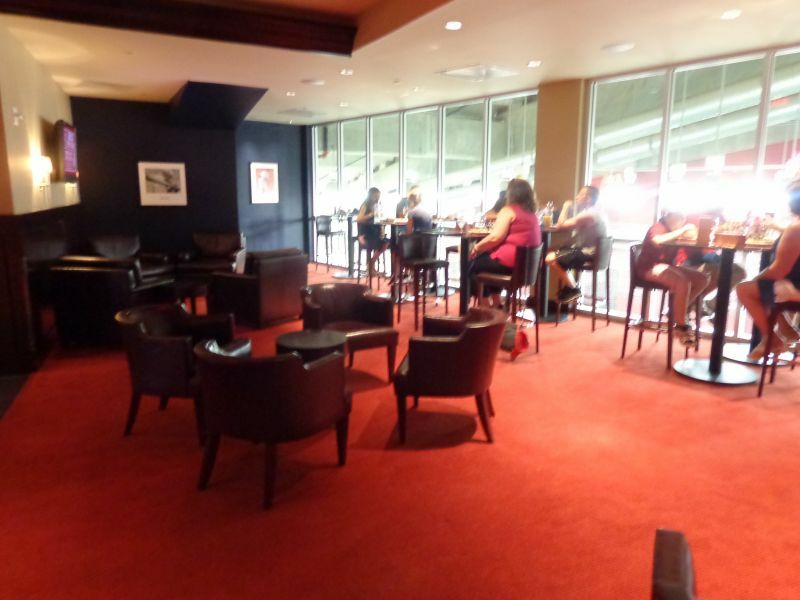 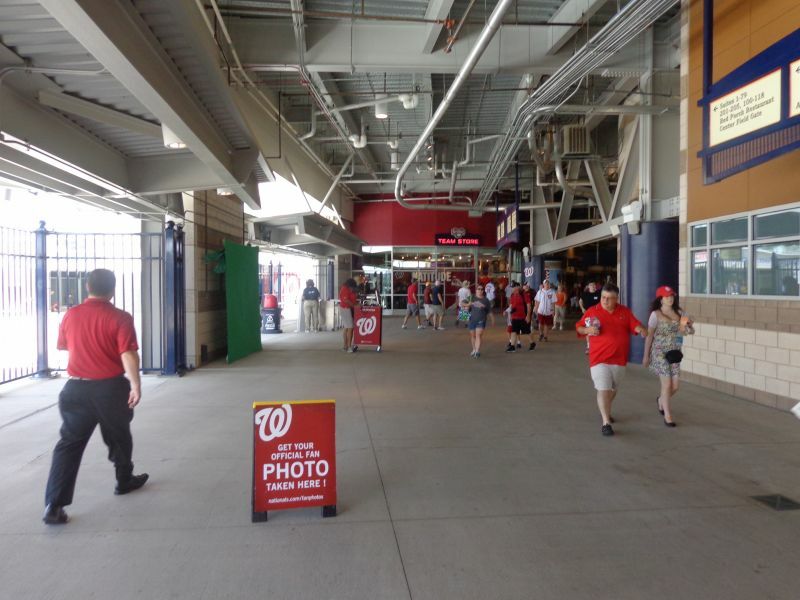 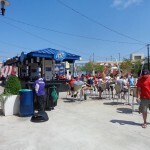 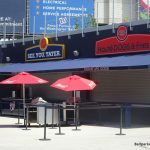 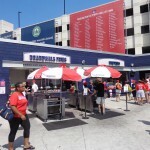 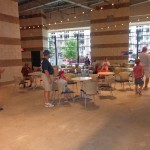 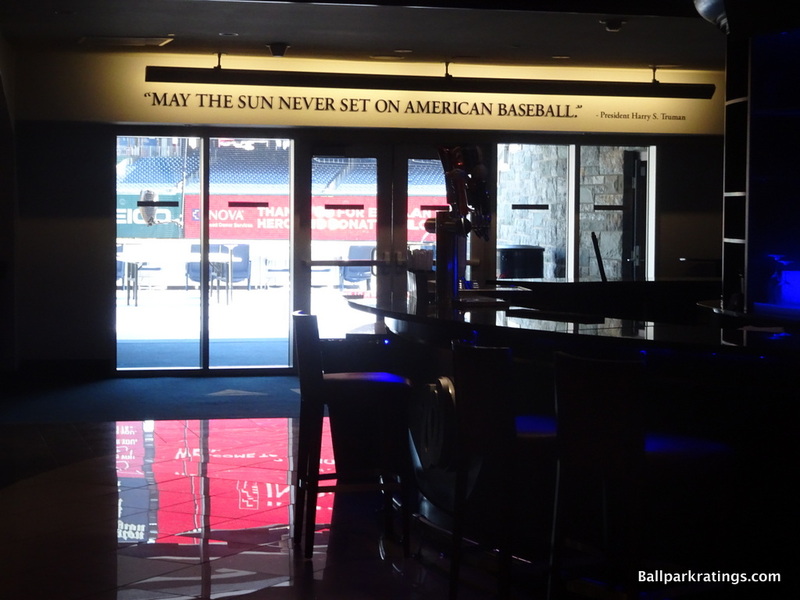 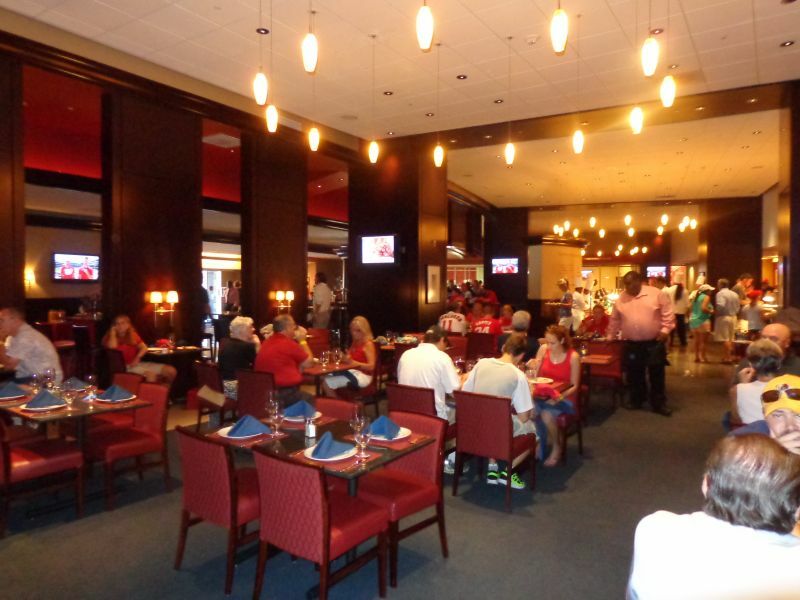 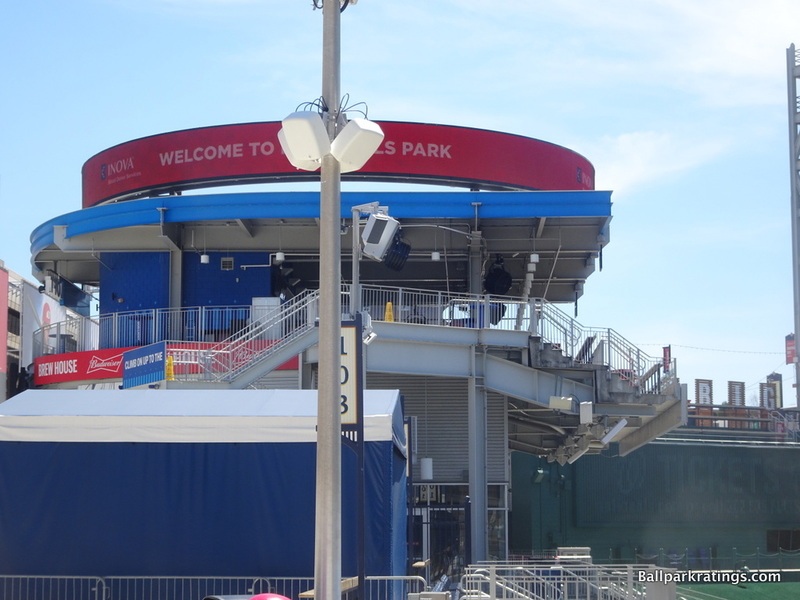 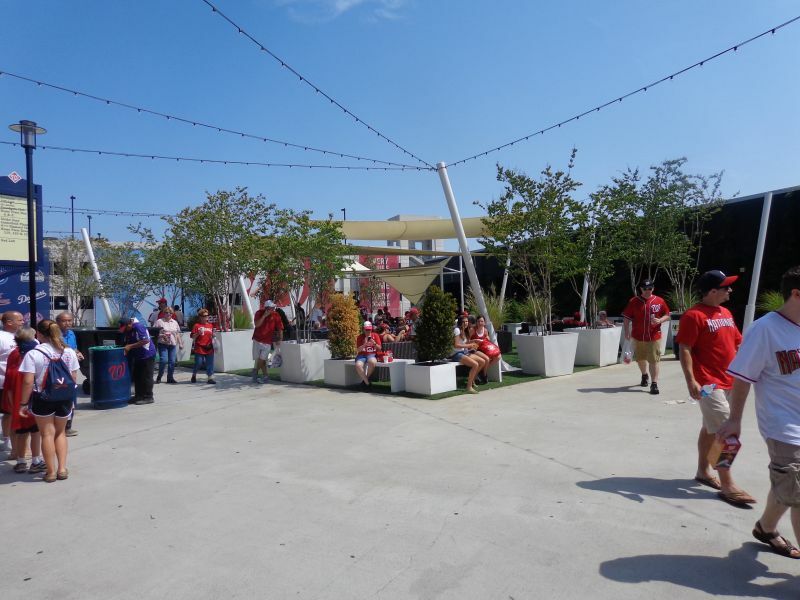 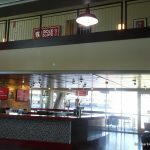 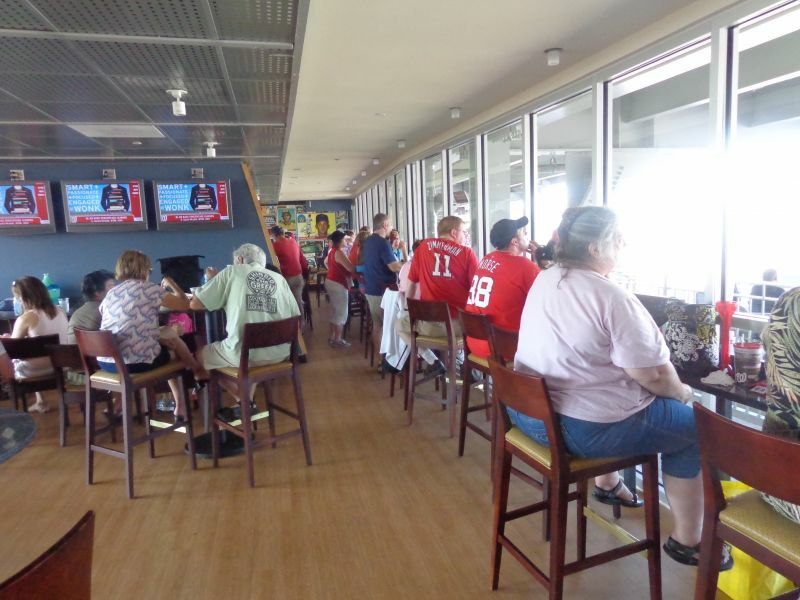 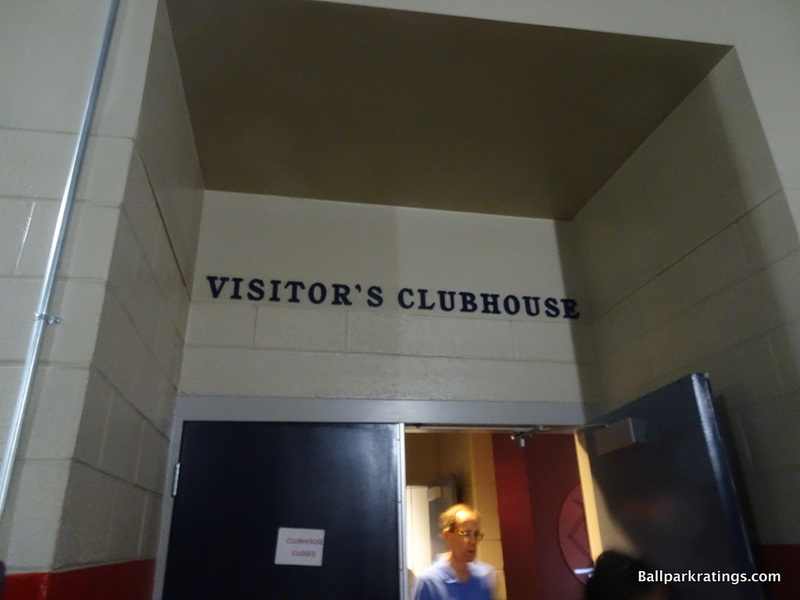 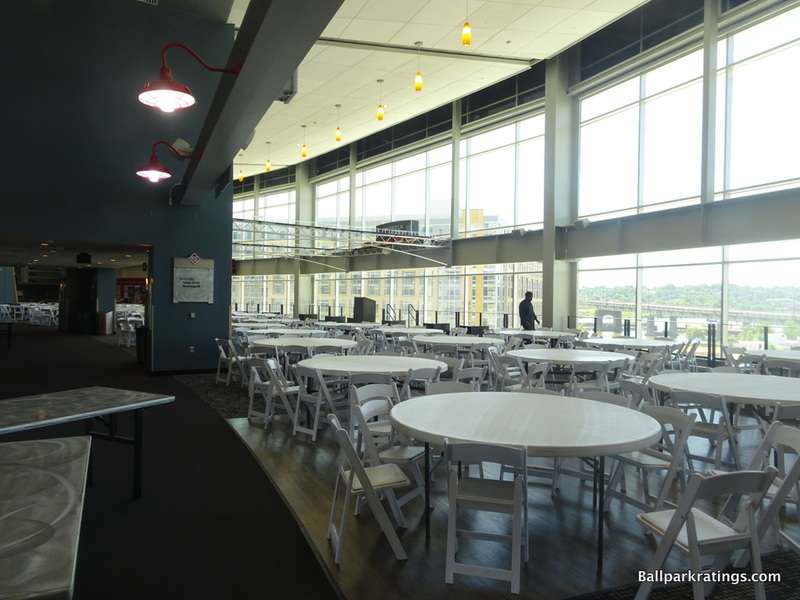 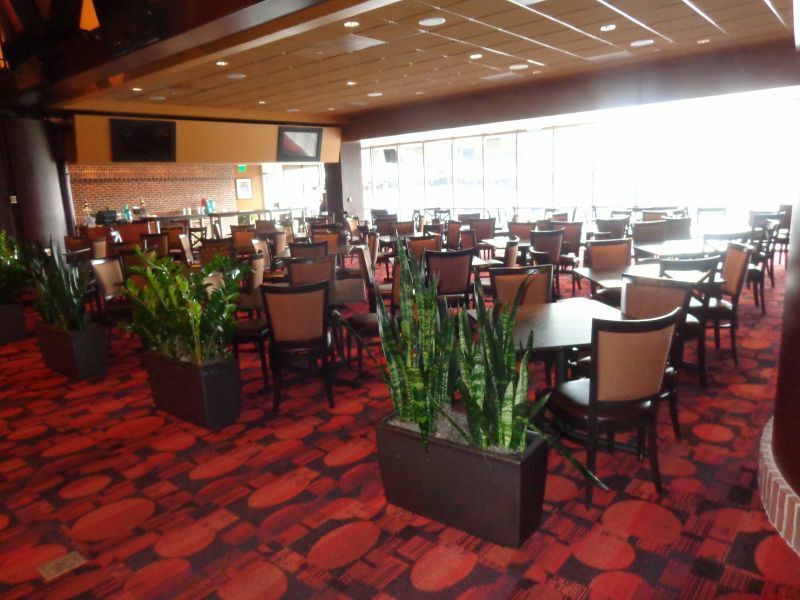 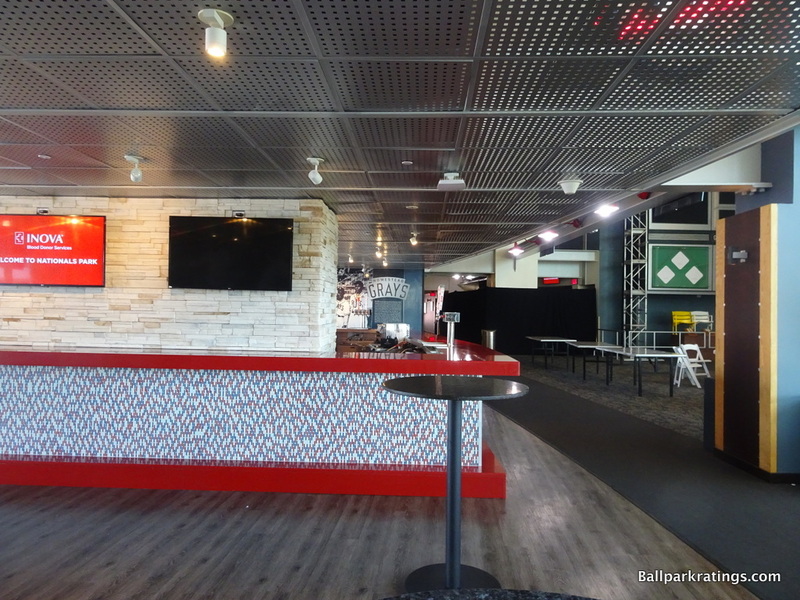 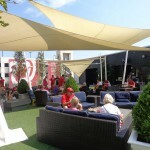 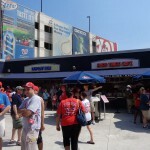 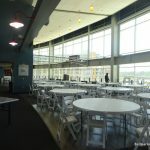 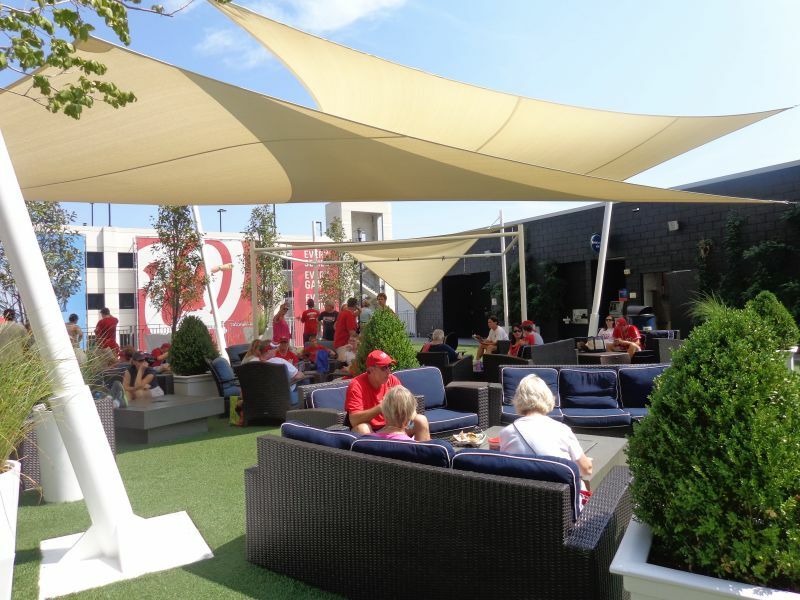 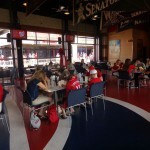 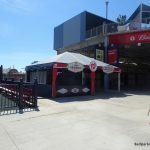 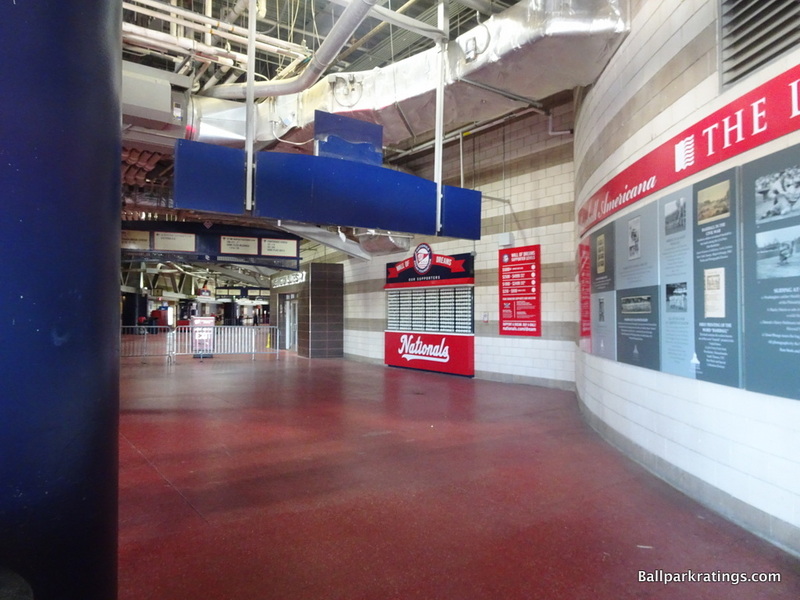 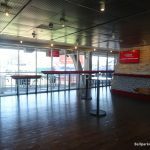 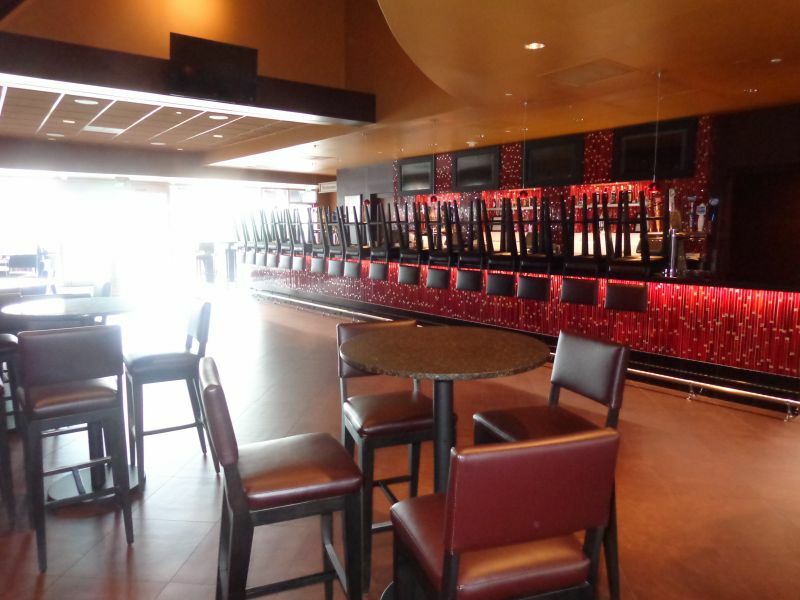 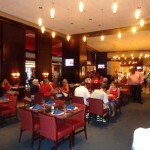 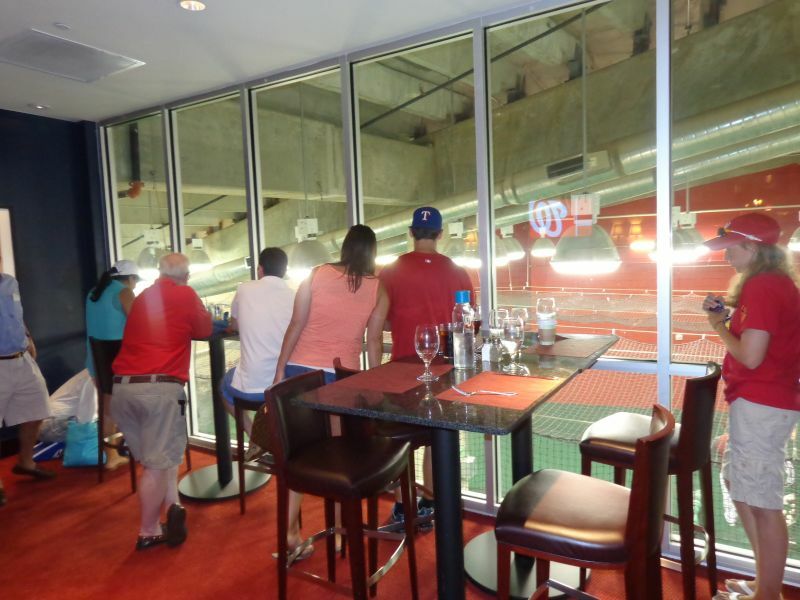 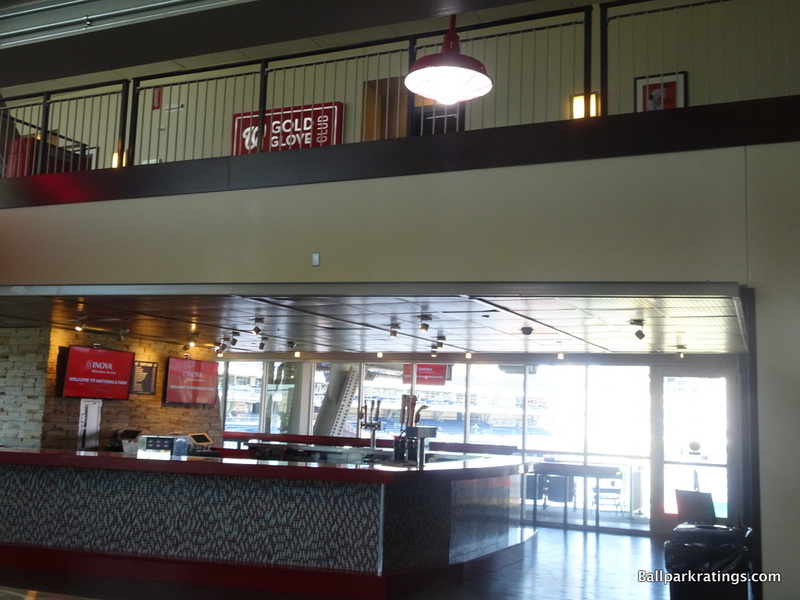 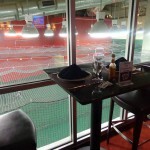 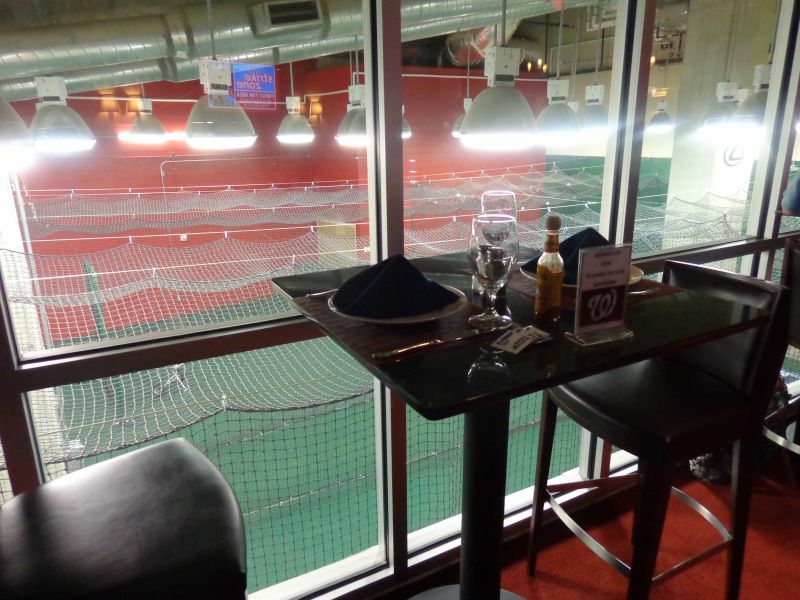 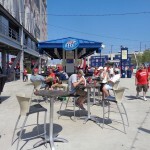 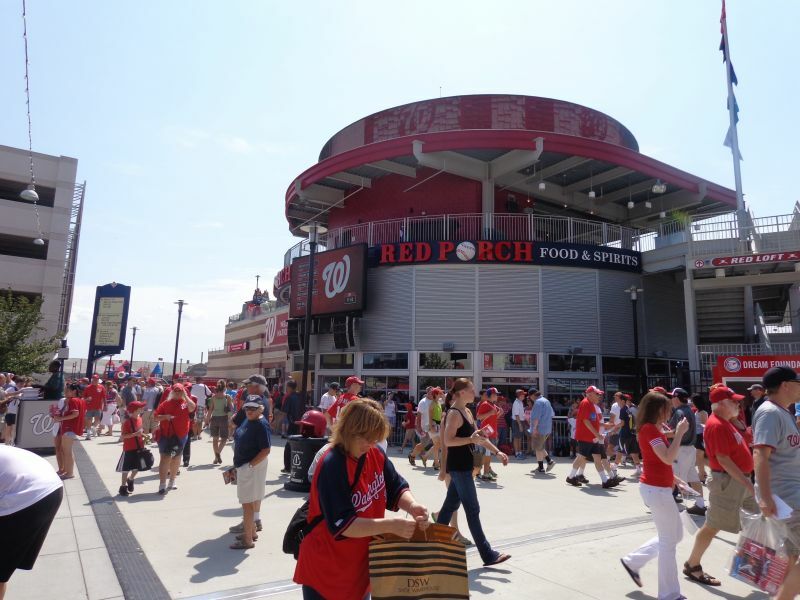 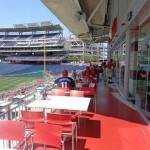 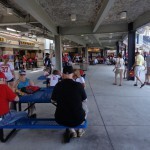 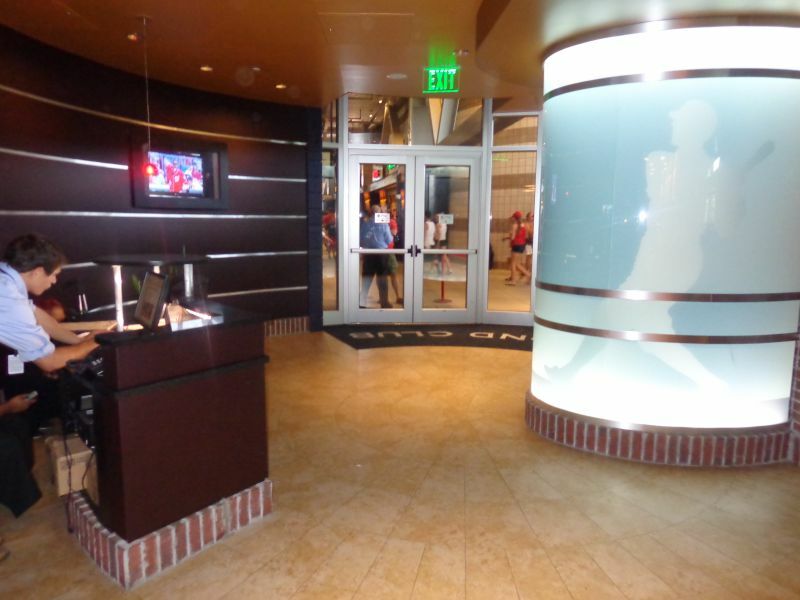 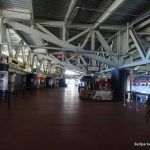 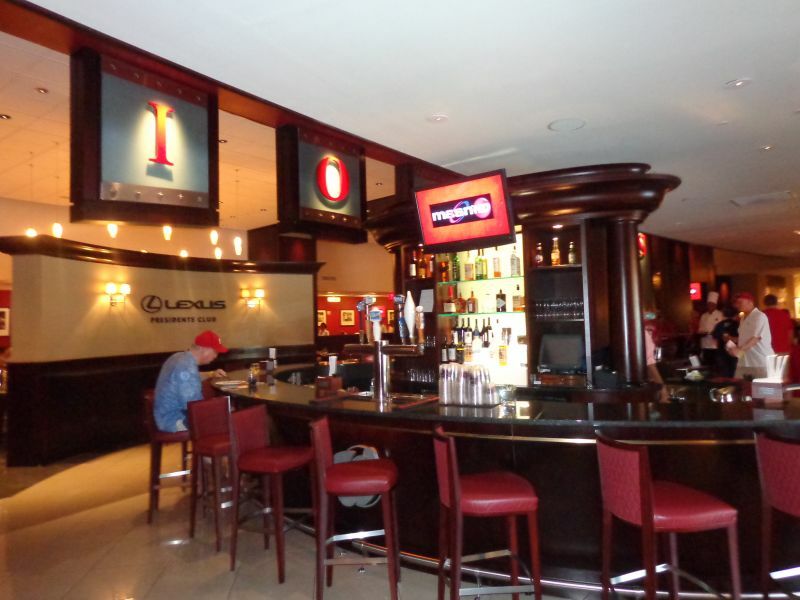 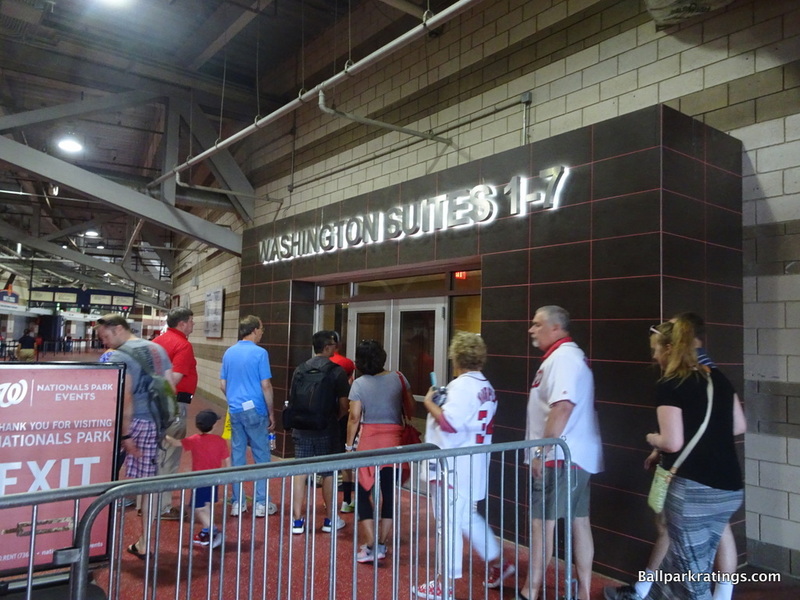 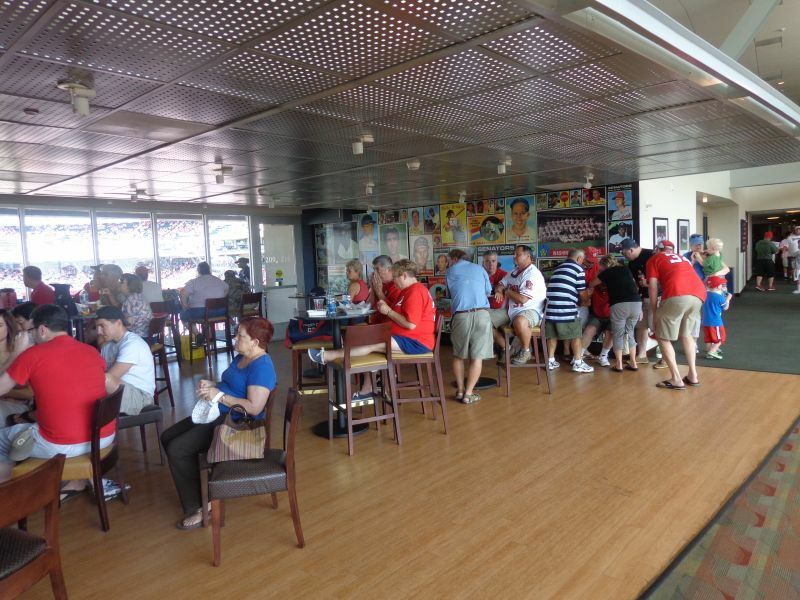 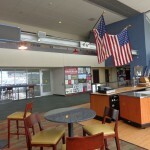 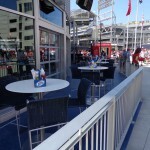 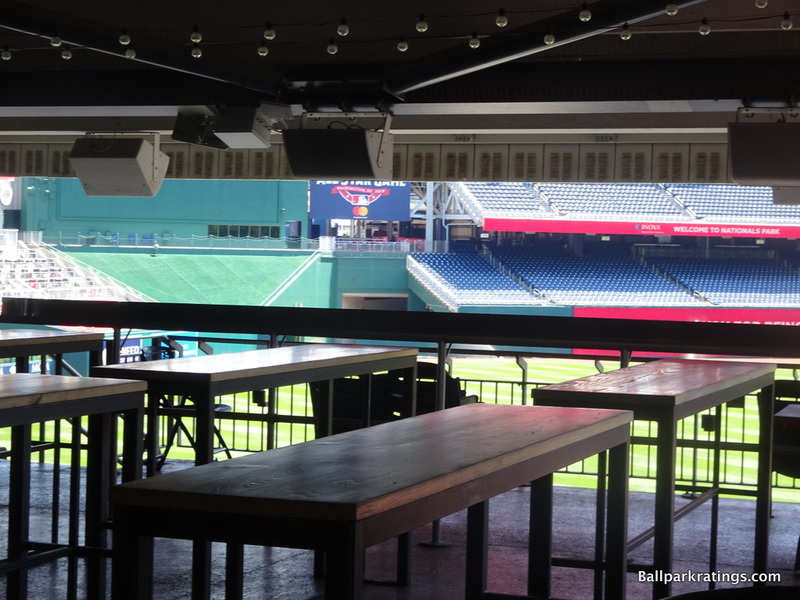 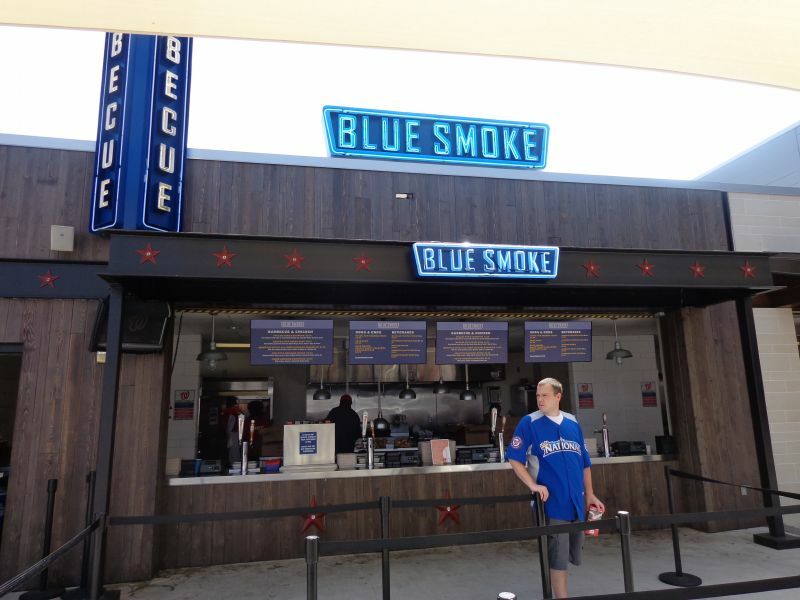 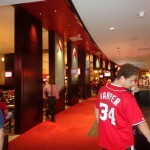 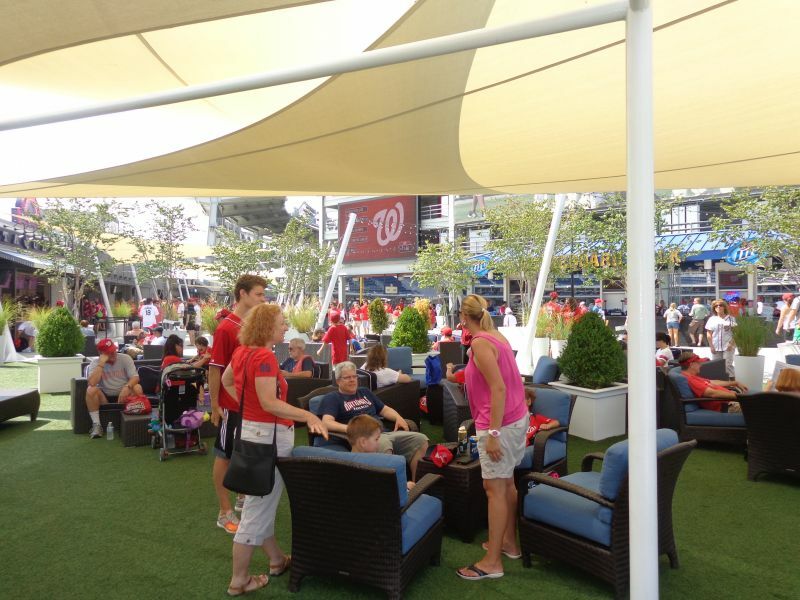 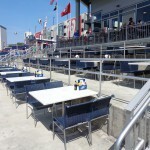 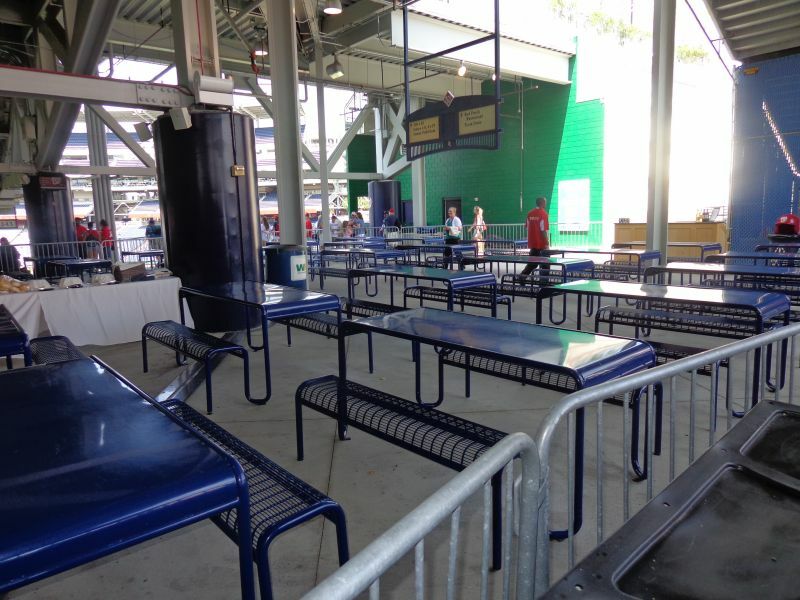 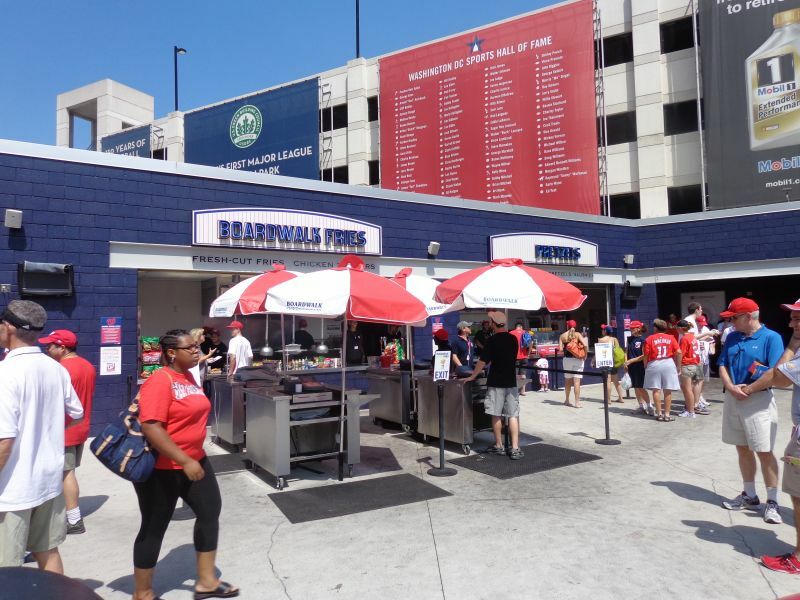 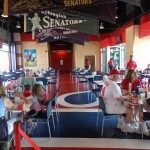 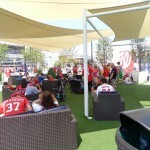 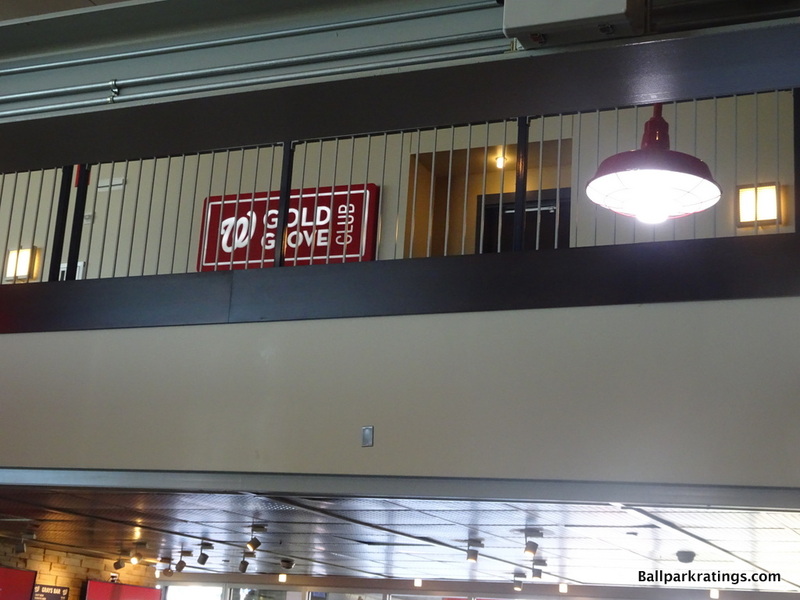 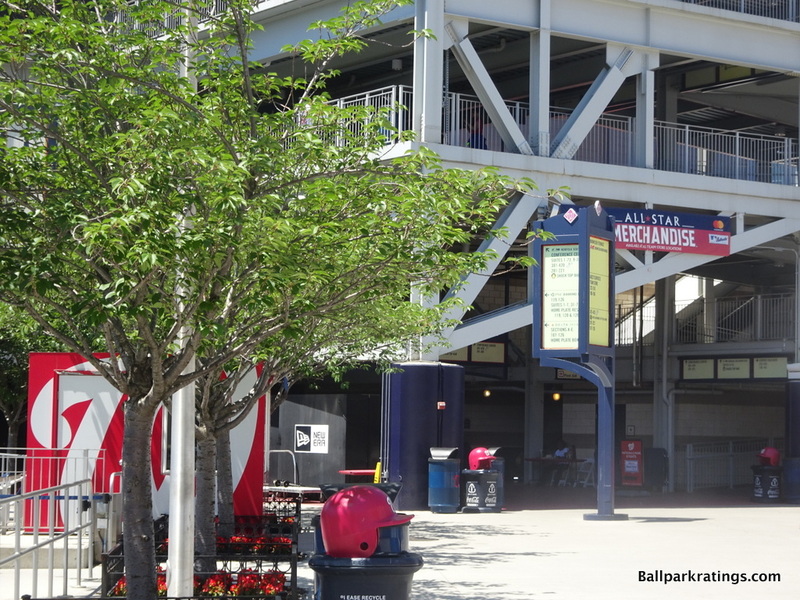 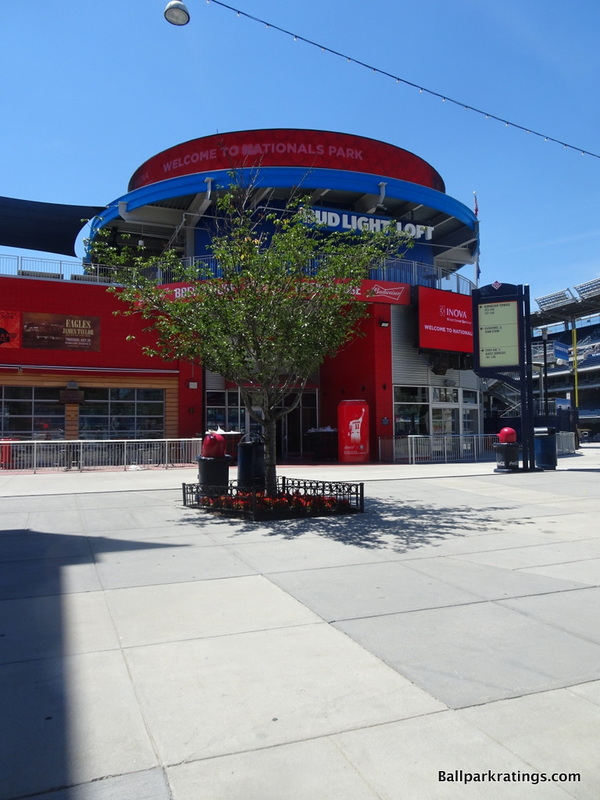 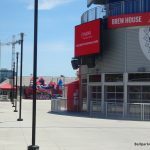 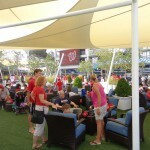 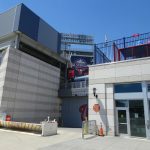 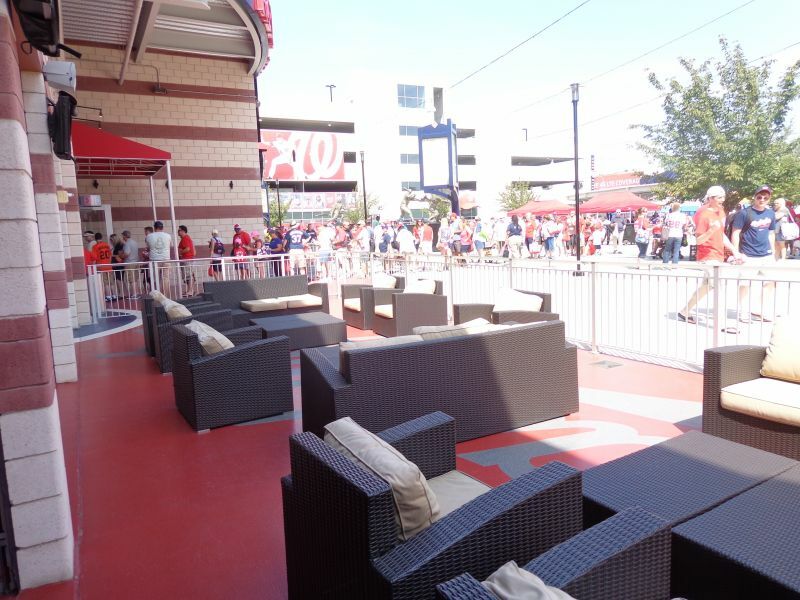 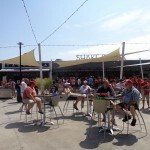 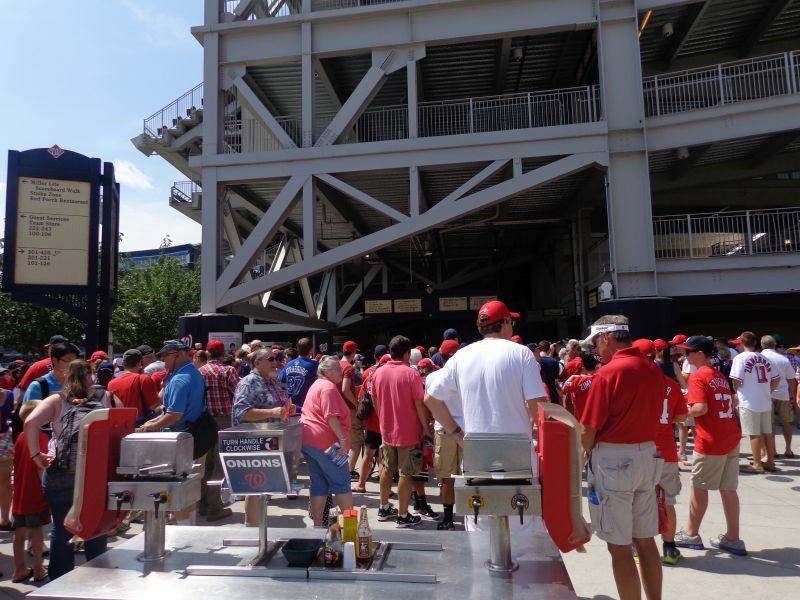 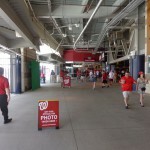 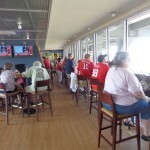 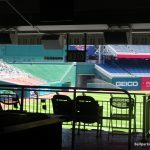 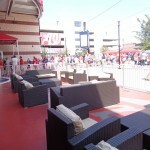 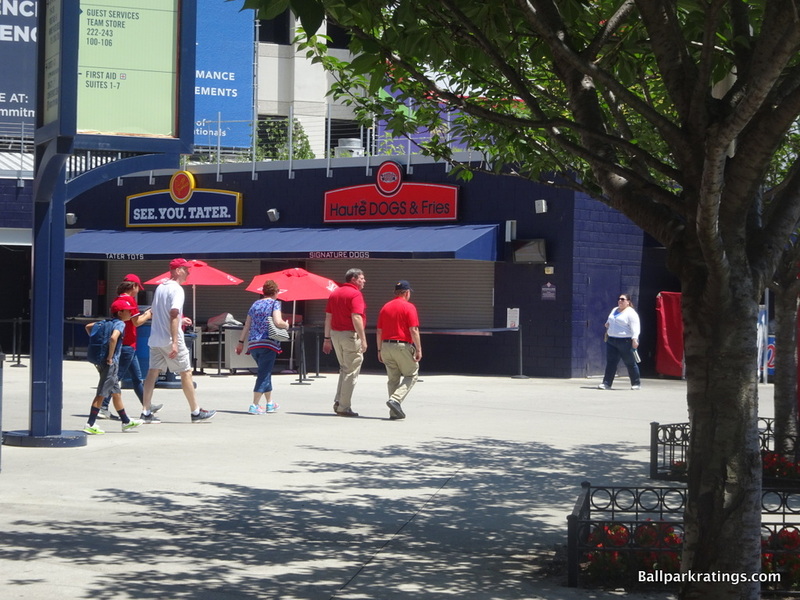 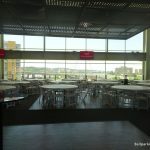 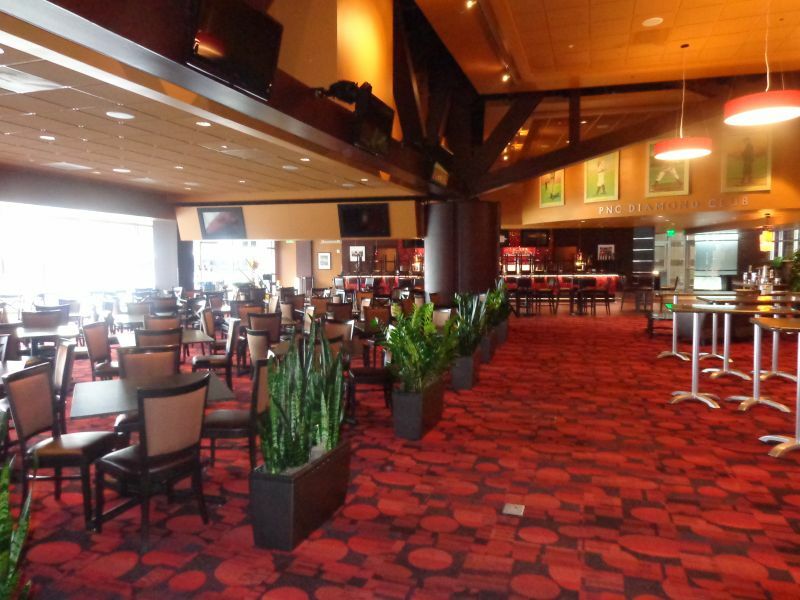 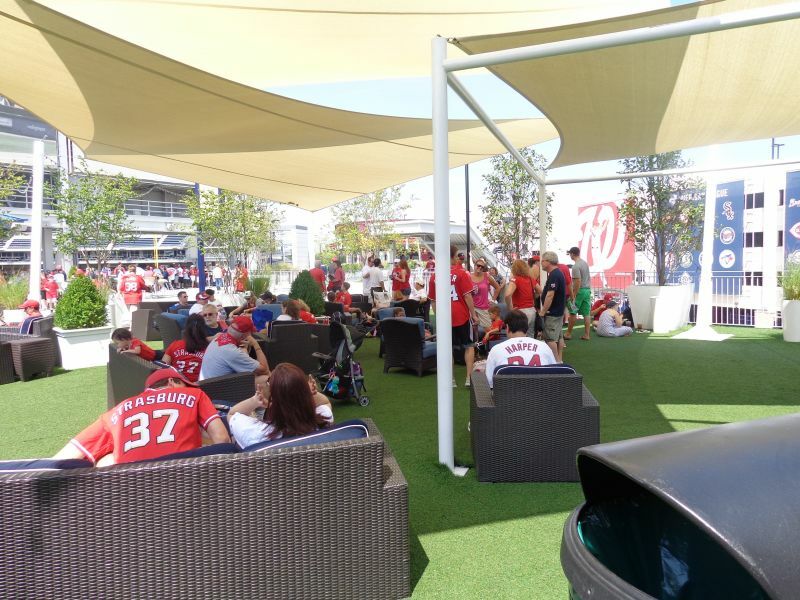 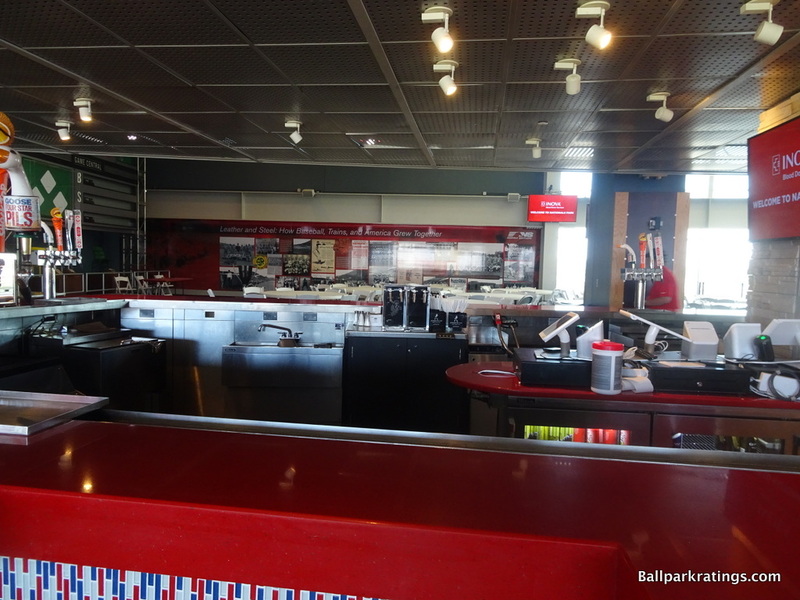 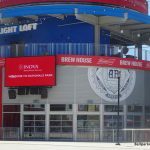 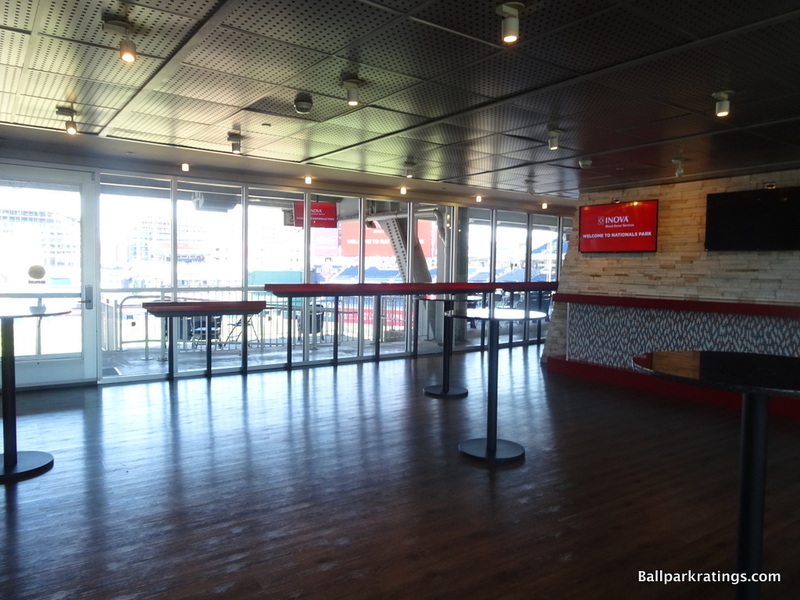 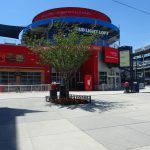 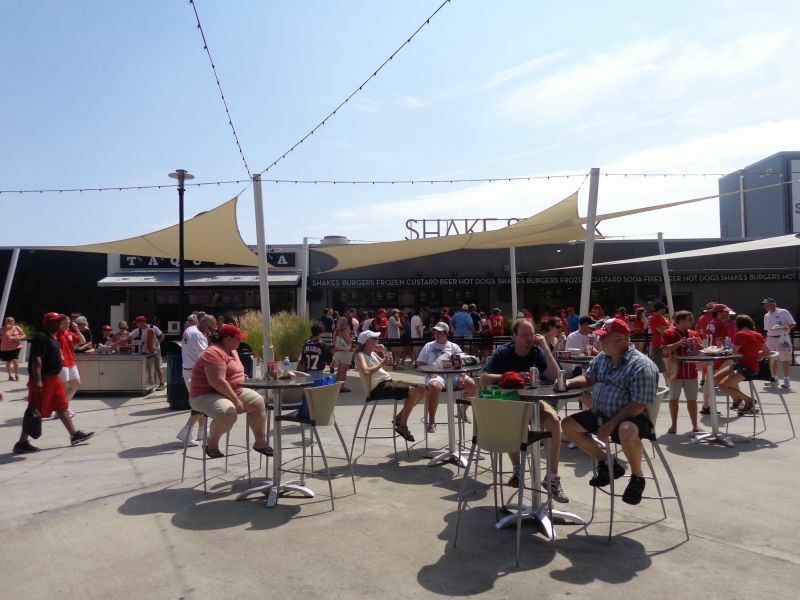 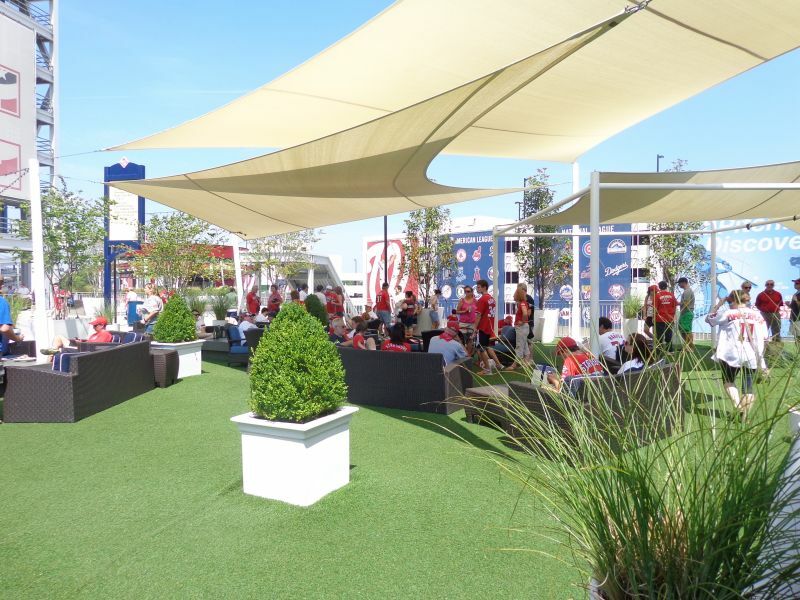 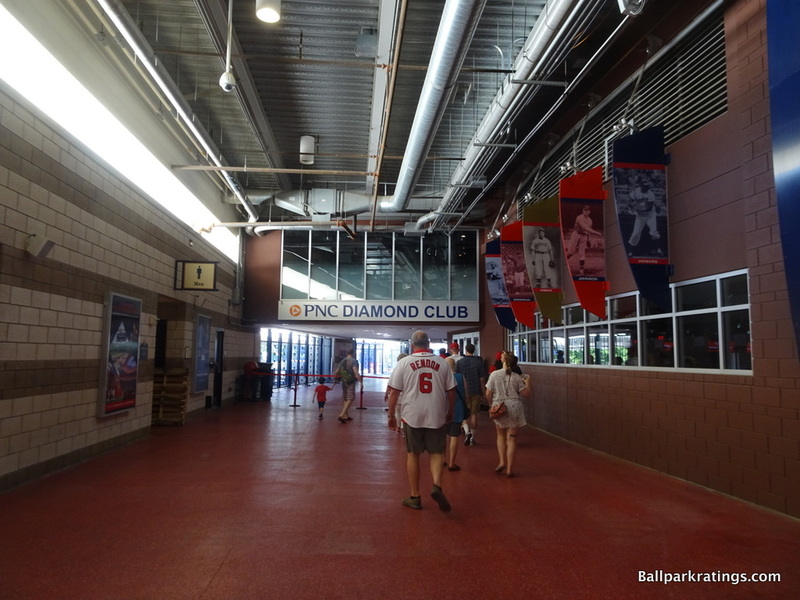 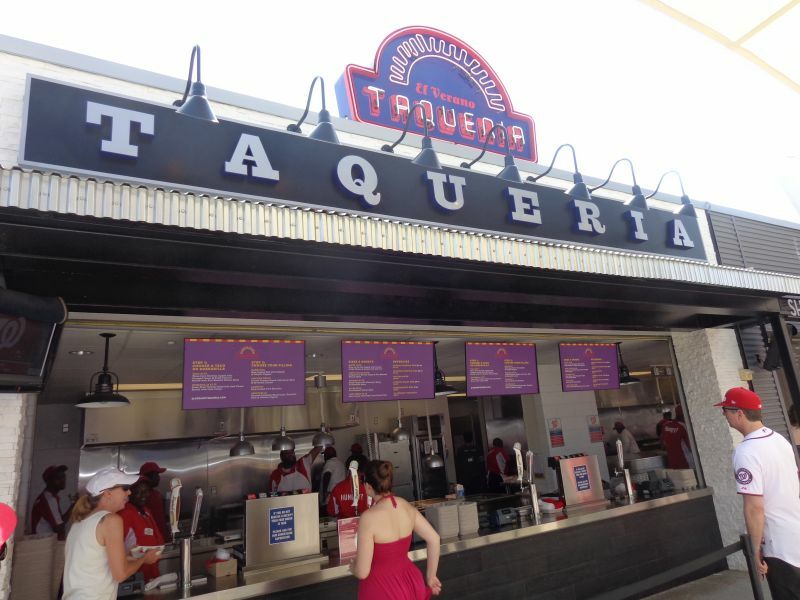 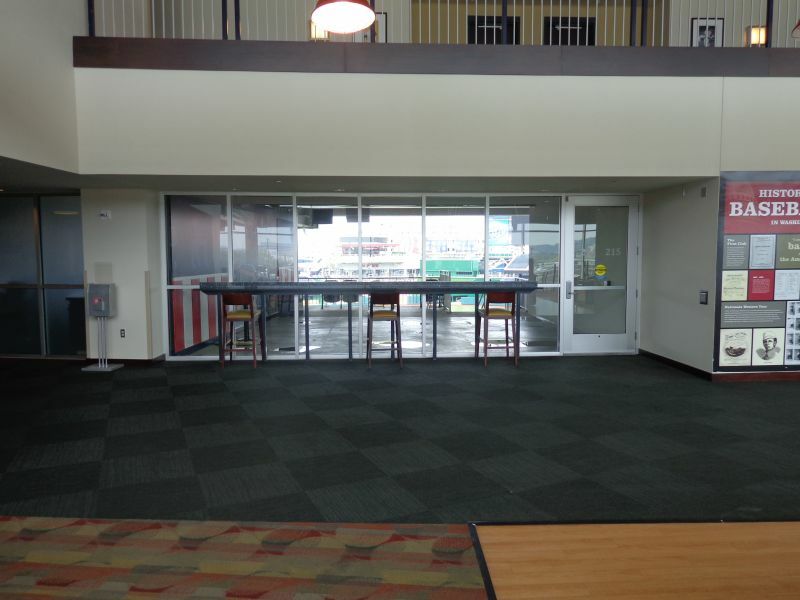 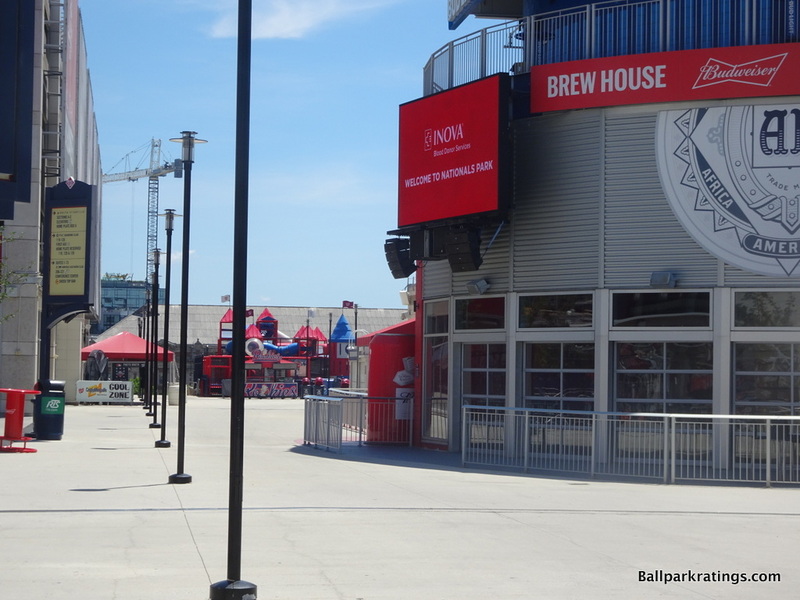 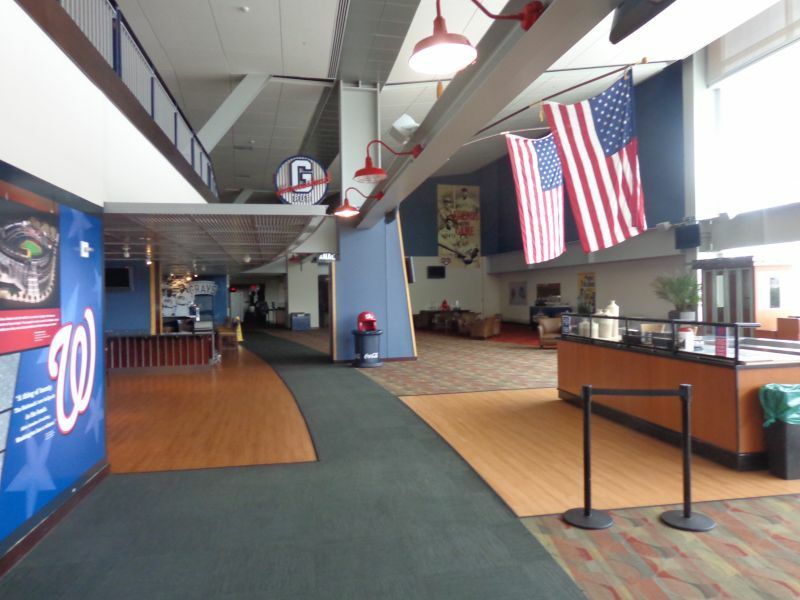 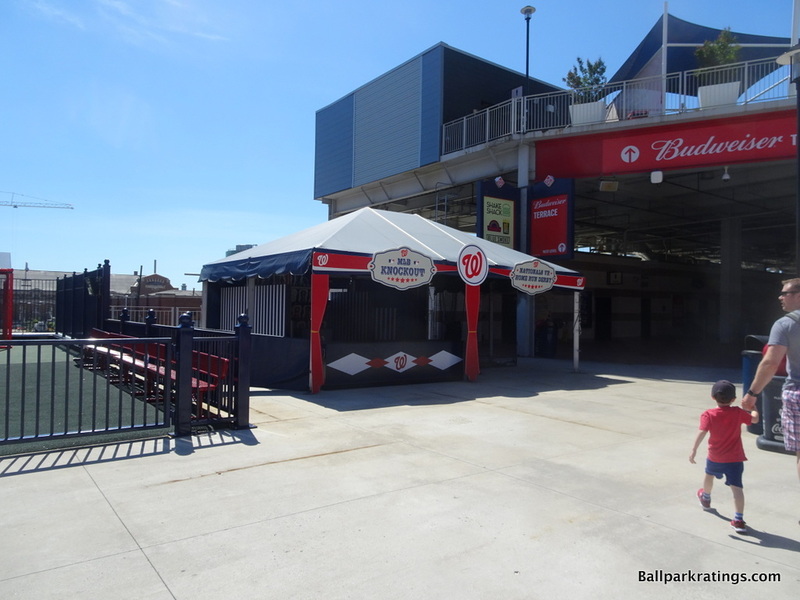 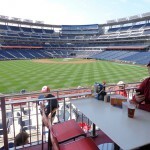 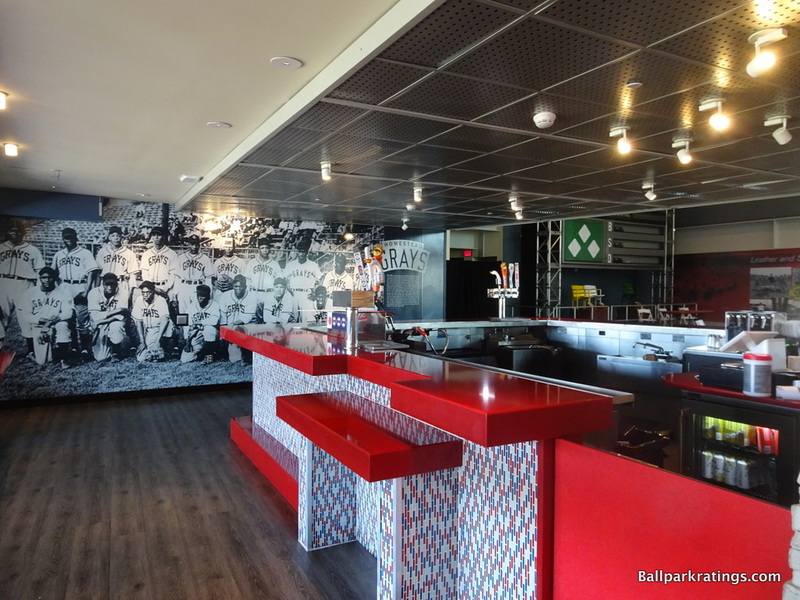 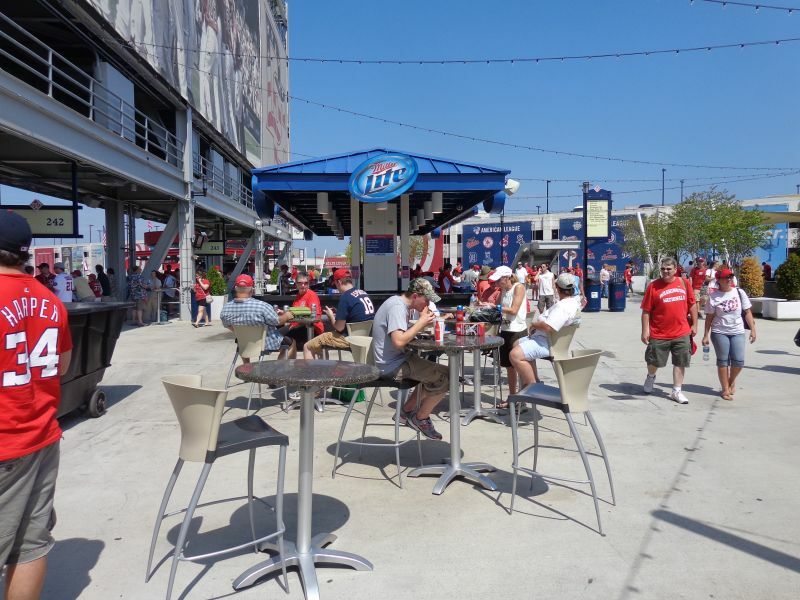 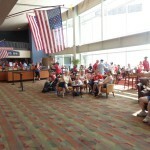 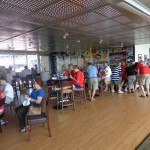 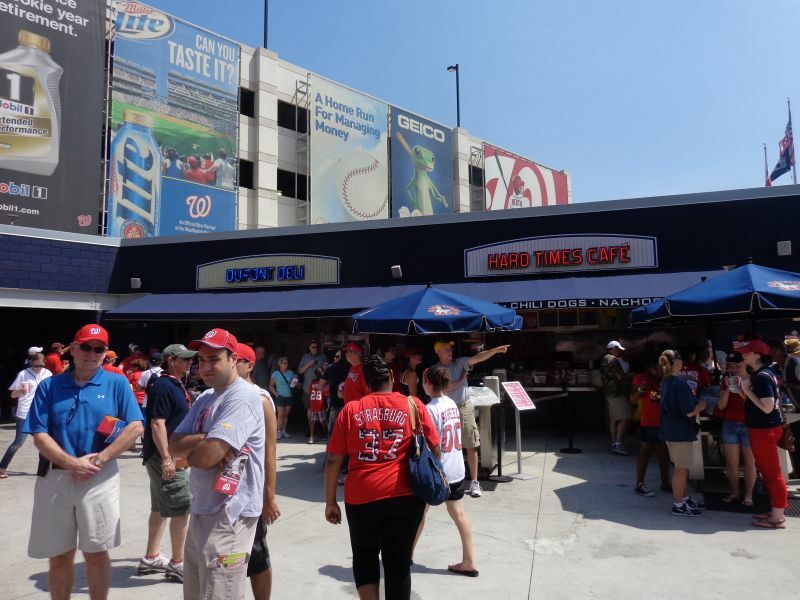 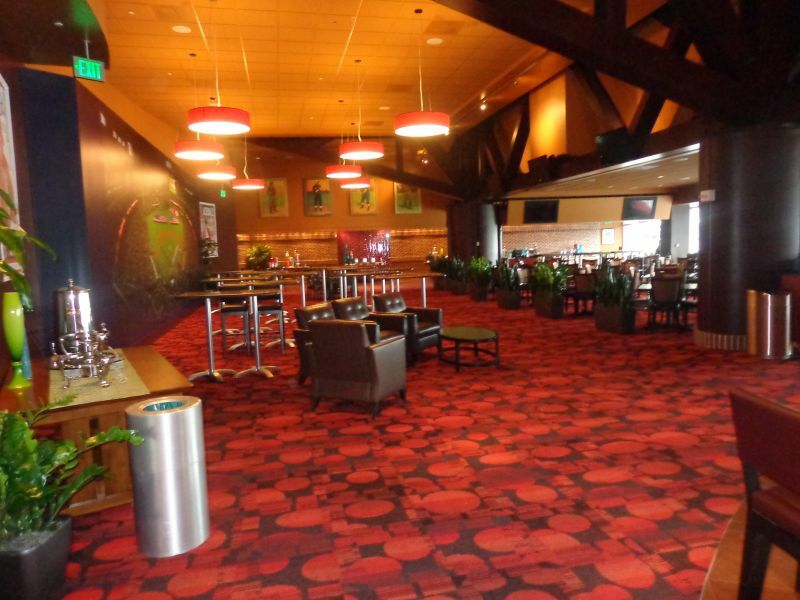 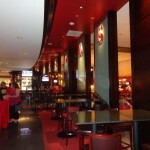 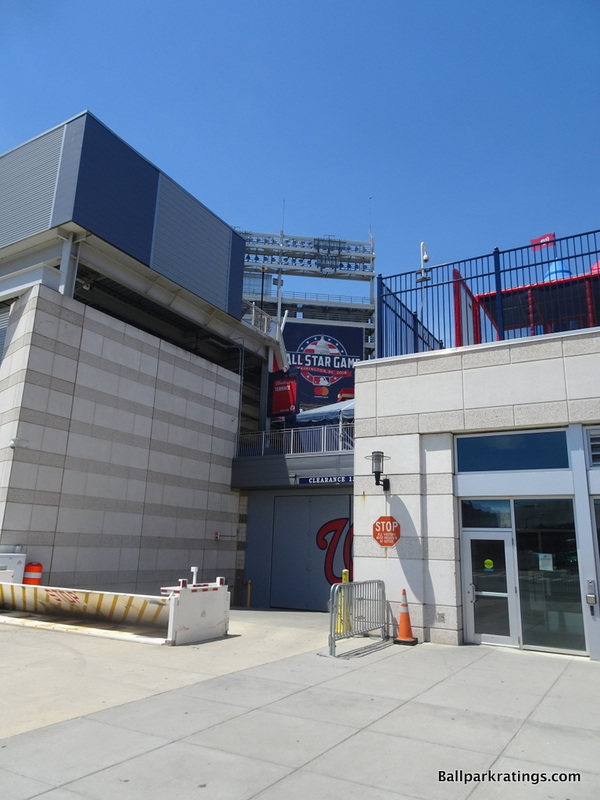 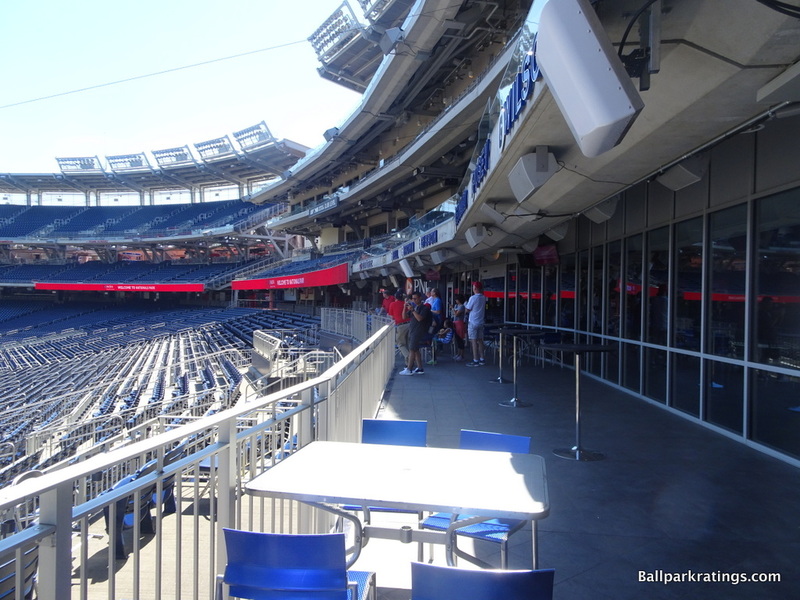 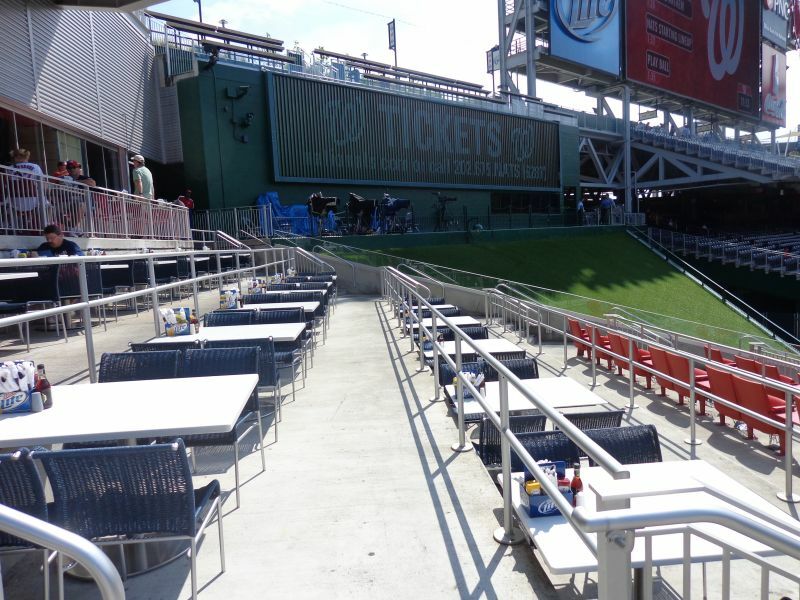 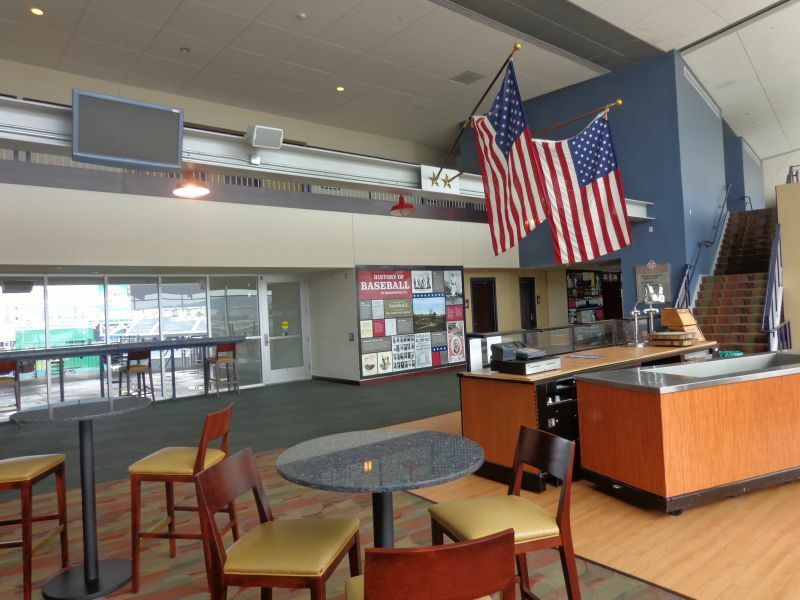 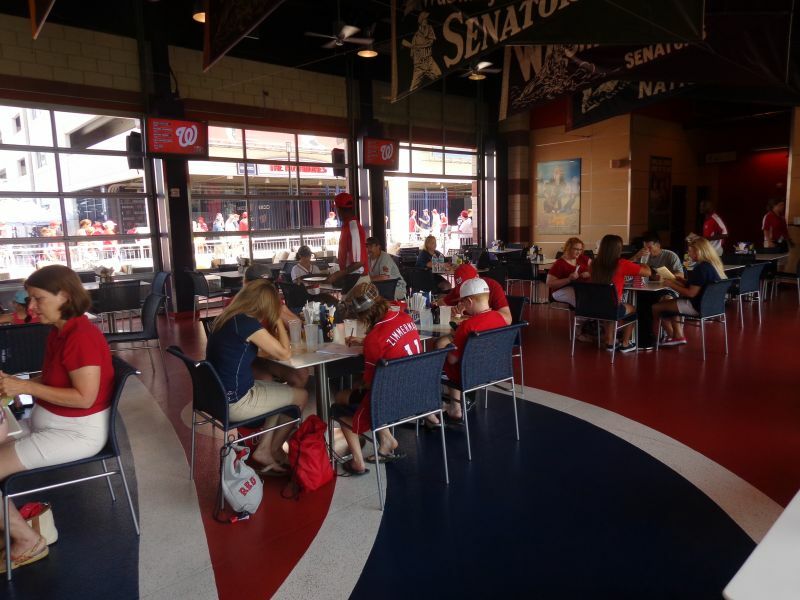 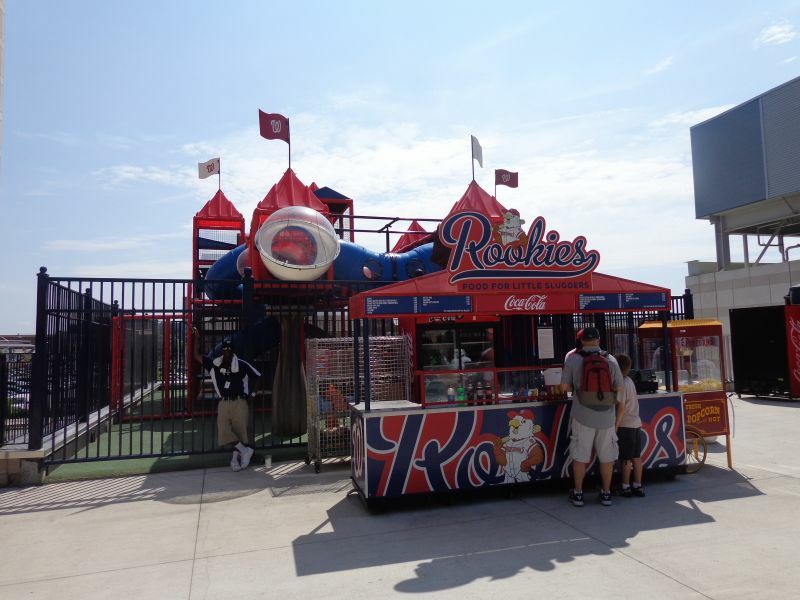 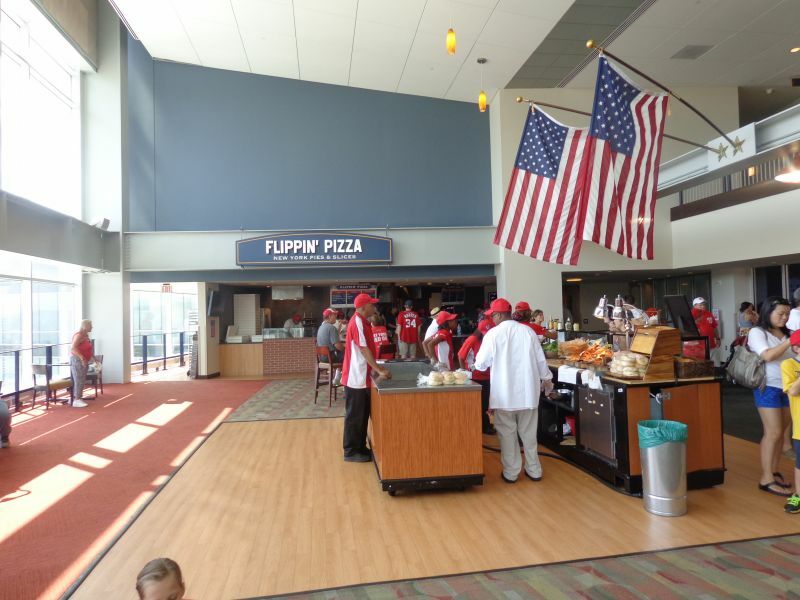 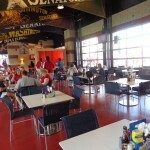 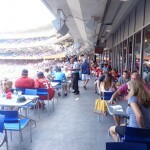 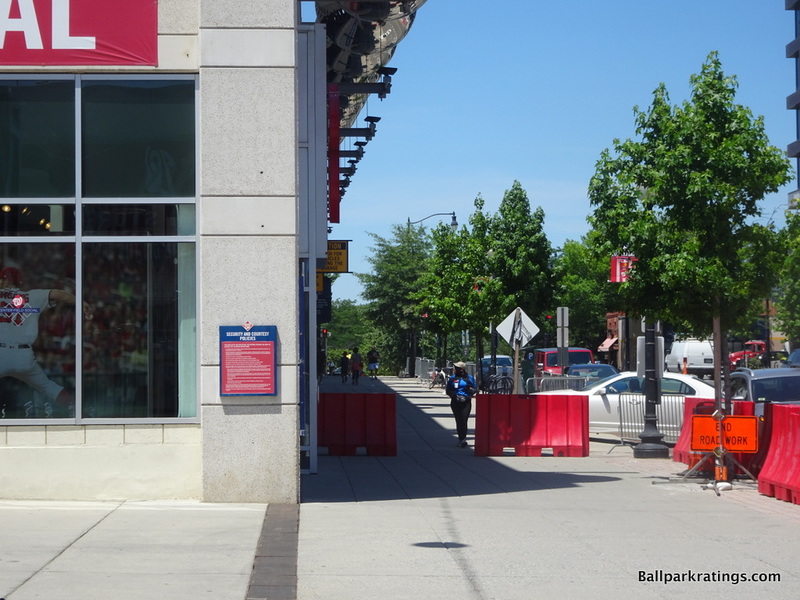 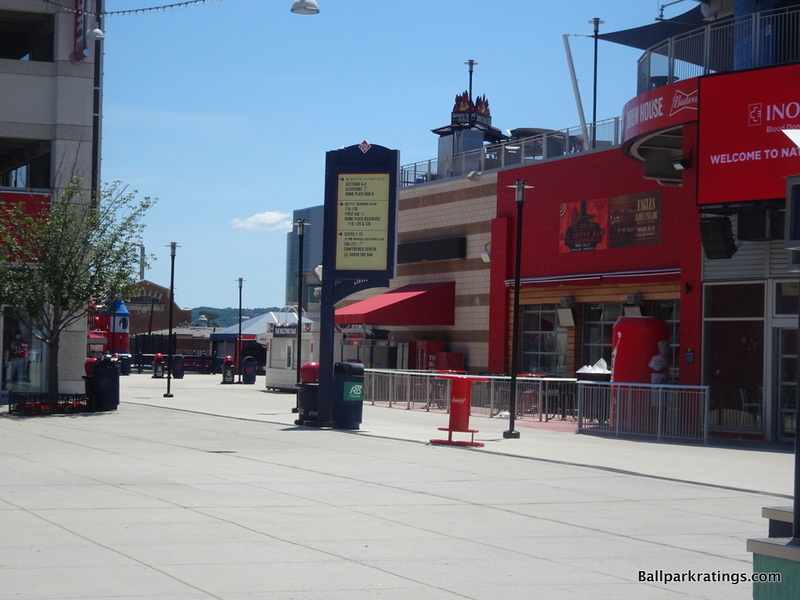 Leading the trend of more informal fan-friendly social spaces, as opposed to the “stadium club” restaurants of the prior decade, the Nats have the Red Porch restaurant (Budweiser Brewhouse) and the Scoreboard Walk (now confusingly called the Budweiser Terrace). 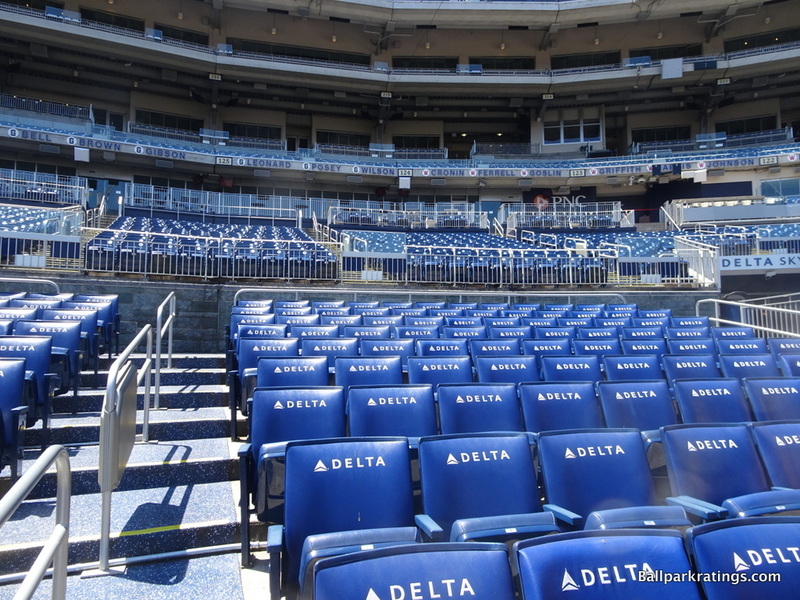 On the other hand, Washington has some of very best premium seating in baseball in both quantity and quality, but without the snobbery or super high prices you might see at Yankee Stadium. 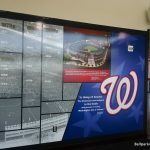 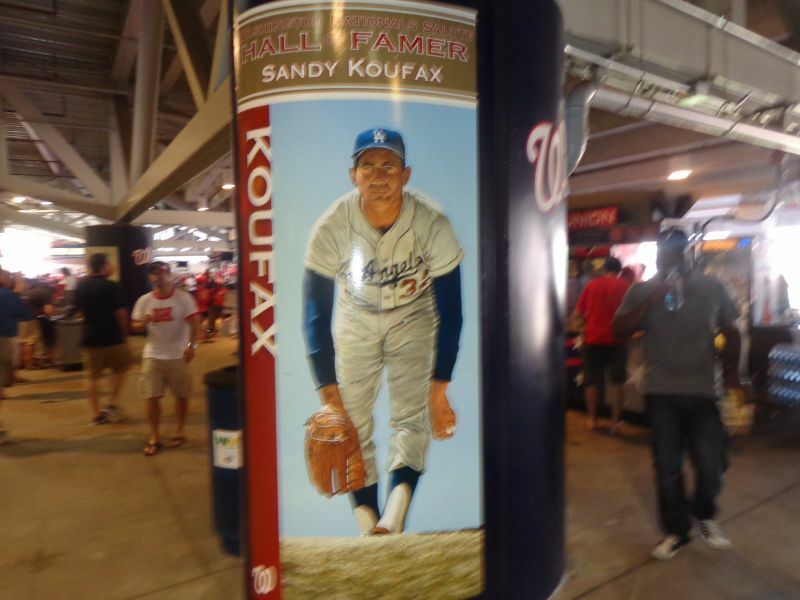 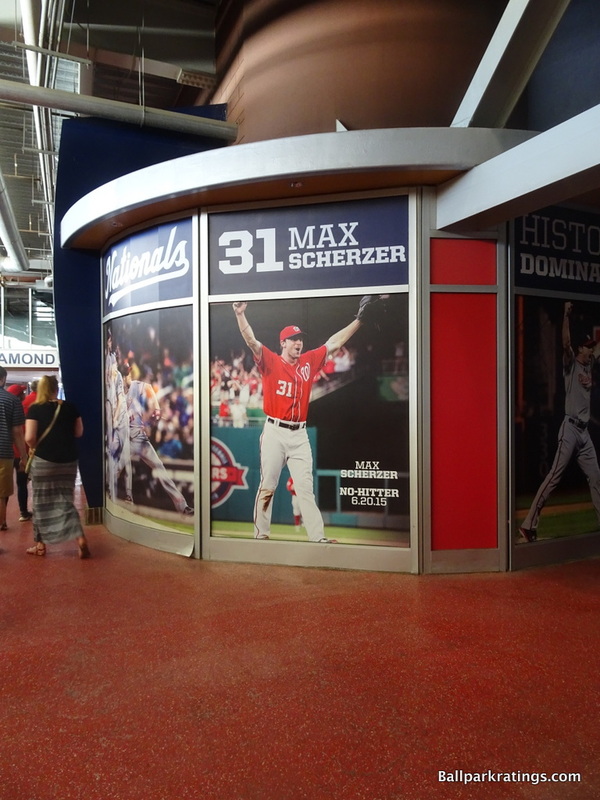 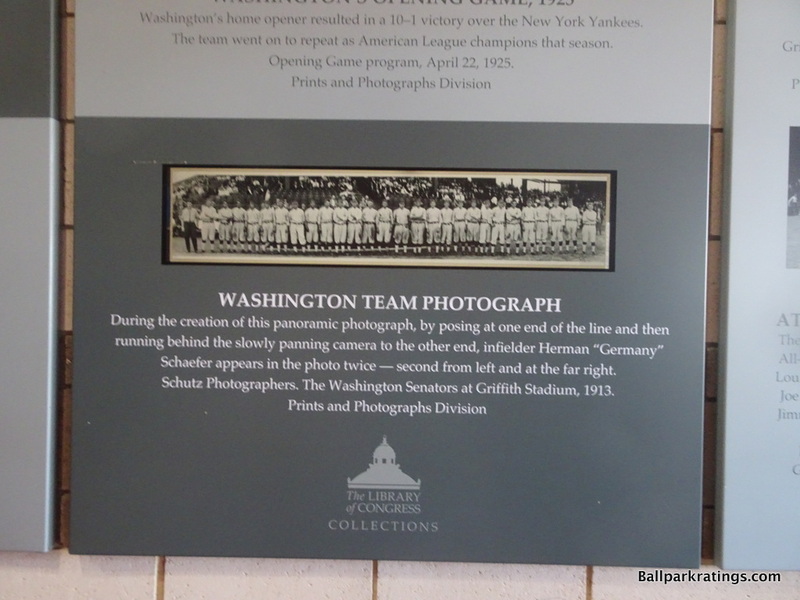 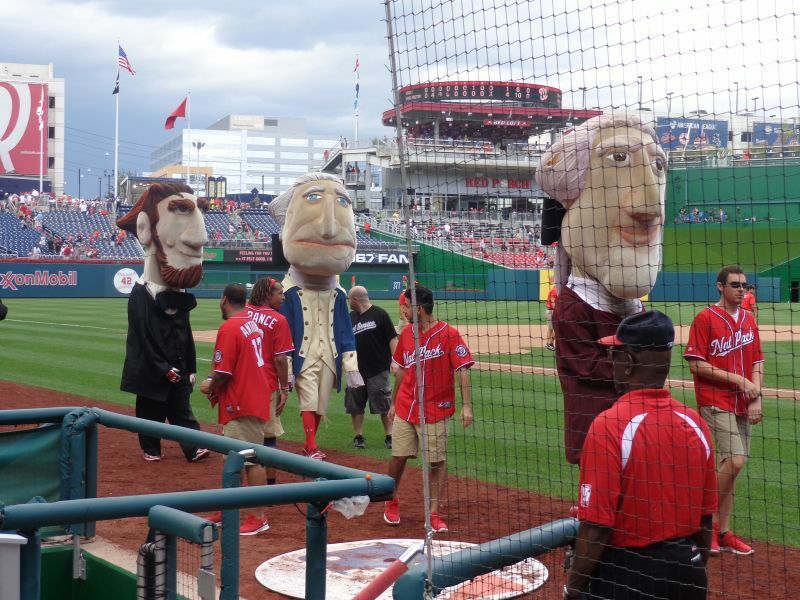 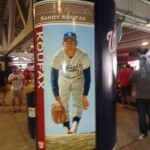 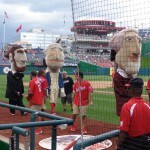 Finally, the Nationals did a decent job of honoring Washington baseball history, considering the franchise itself has so little of it. 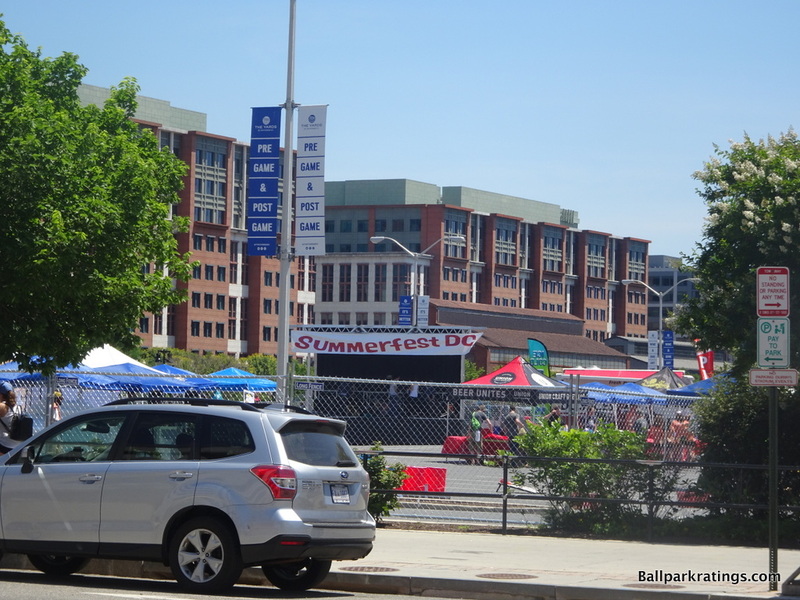 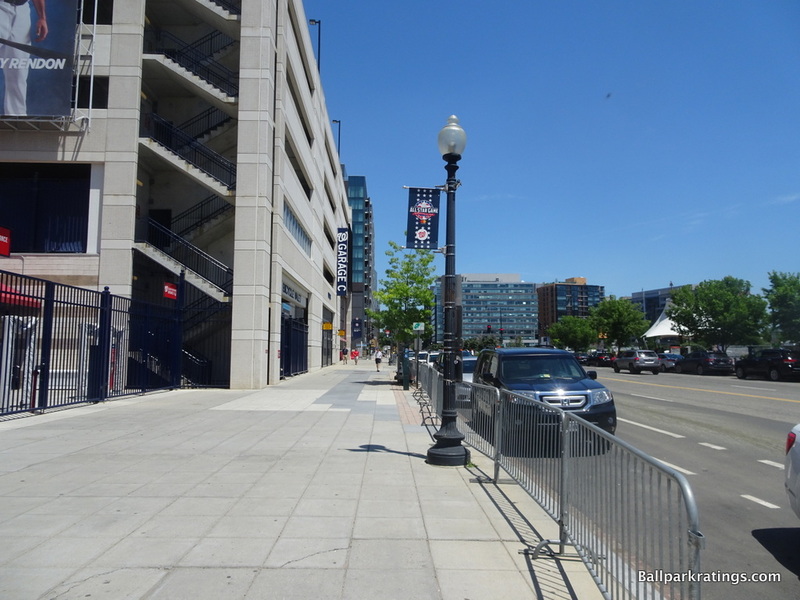 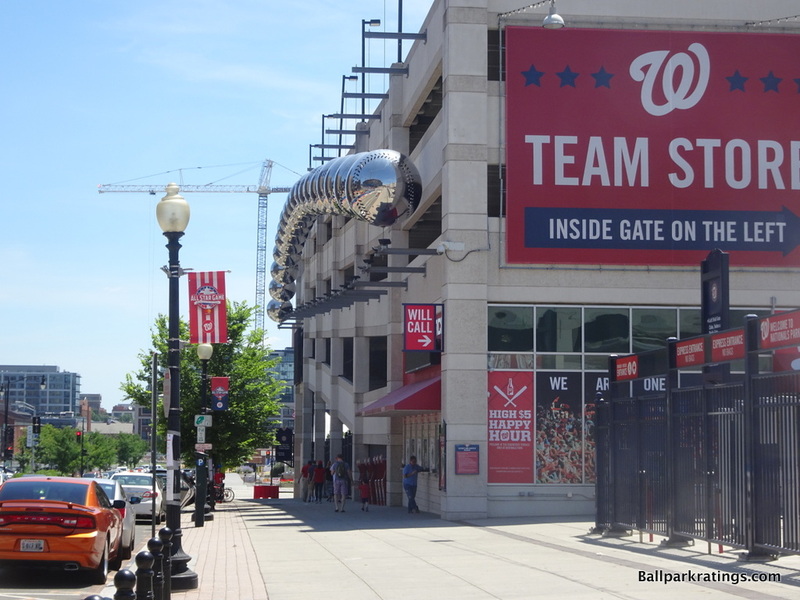 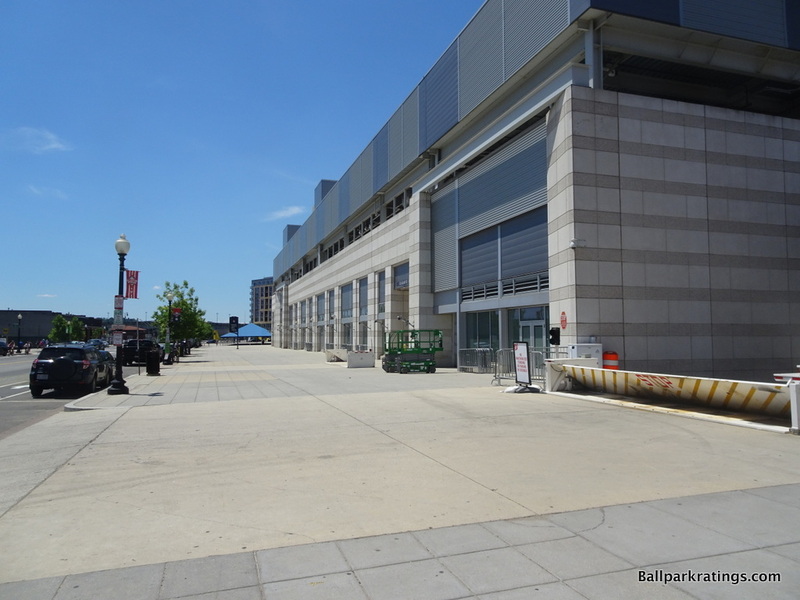 All of this translates into a very good ballpark in my top-half, but the continually developing Navy Yard local scene may push Nationals Park into the upper-echelon. 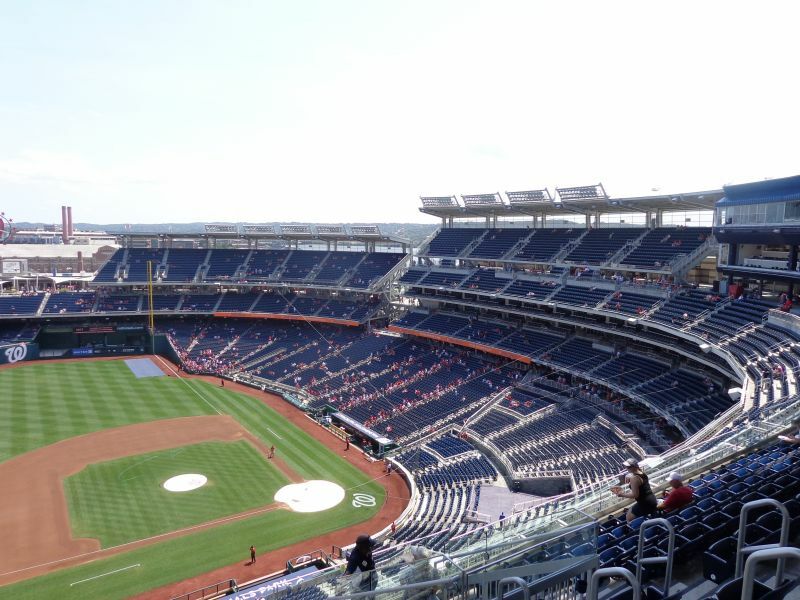 Note that first line from the excerpt of the scathing 2008 Washington Post review quoted earlier. 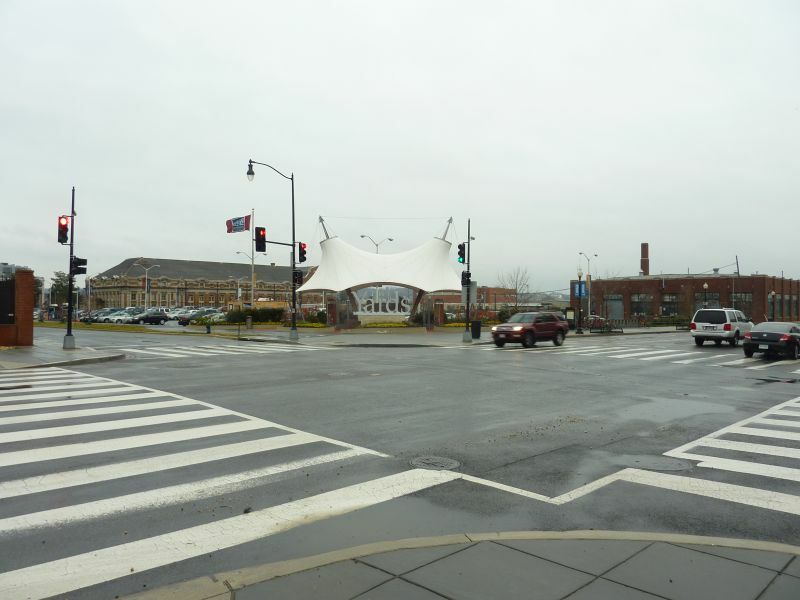 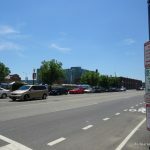 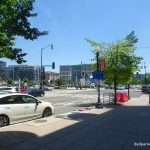 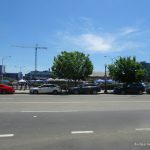 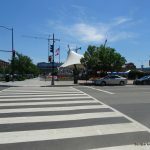 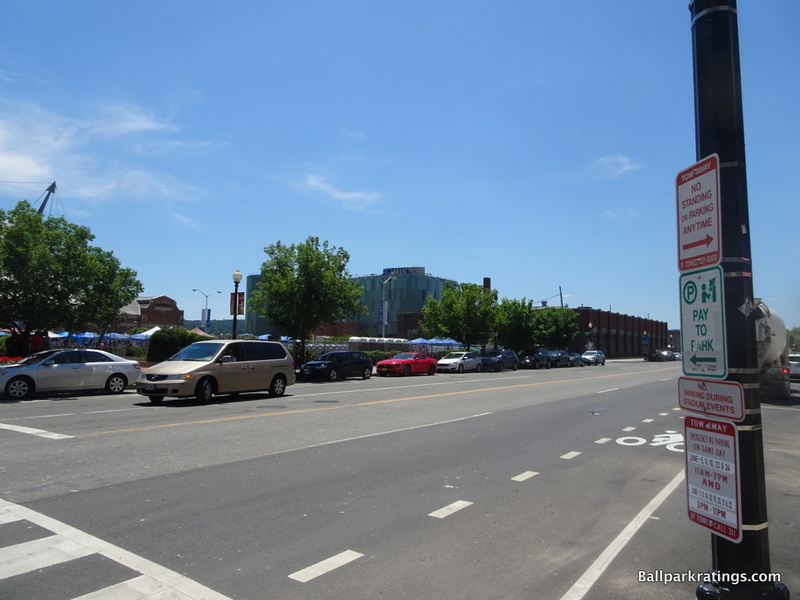 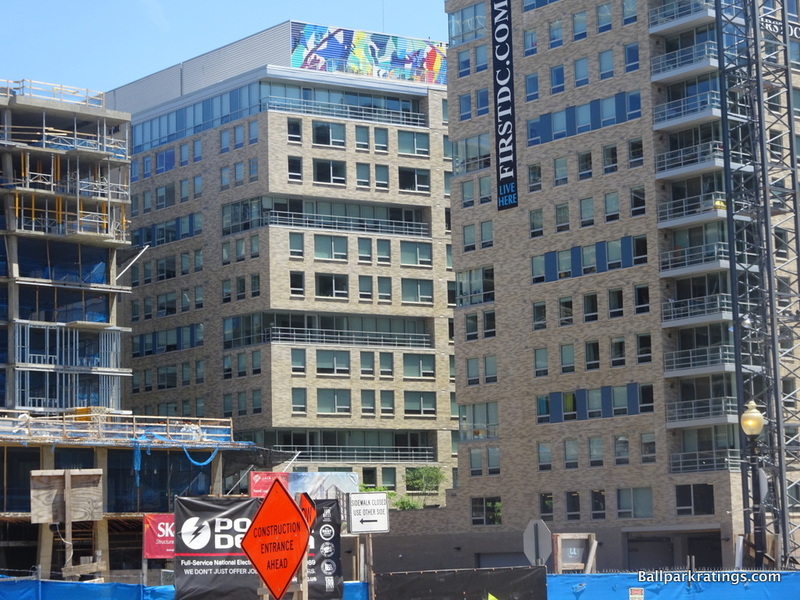 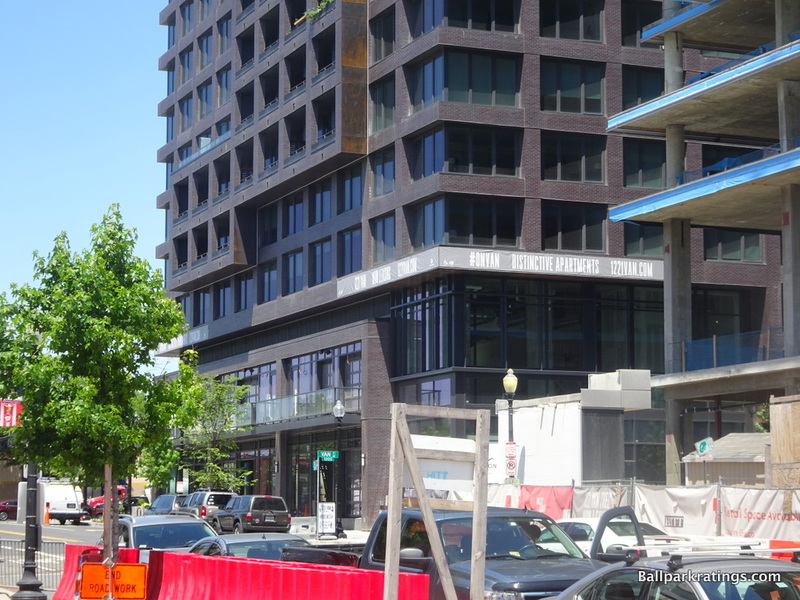 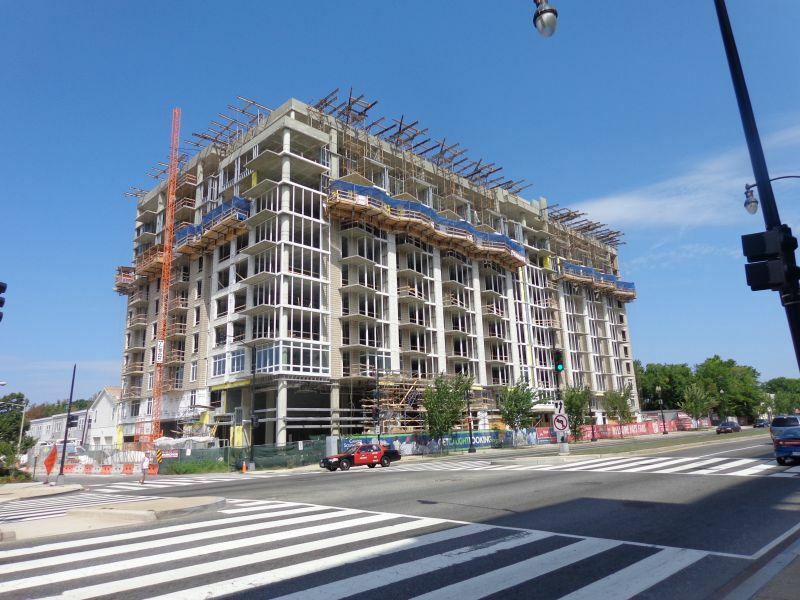 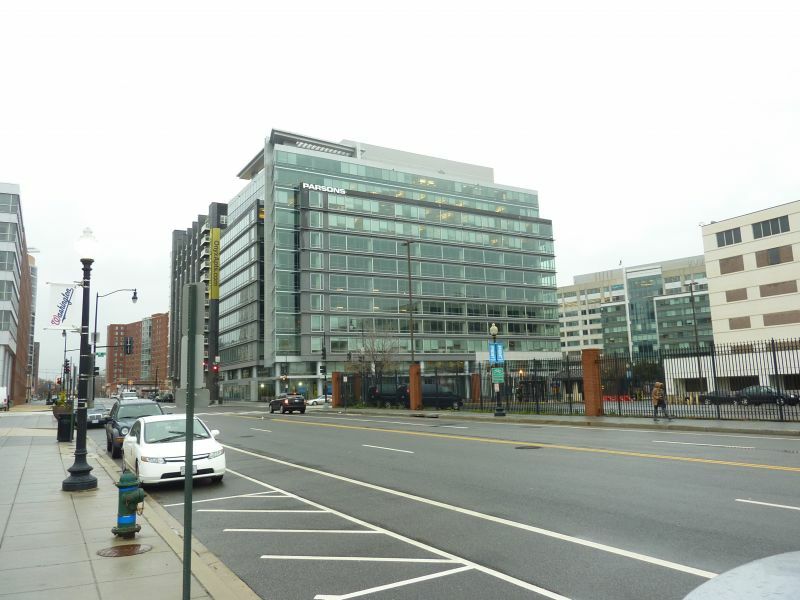 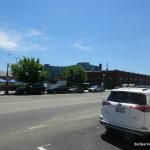 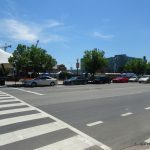 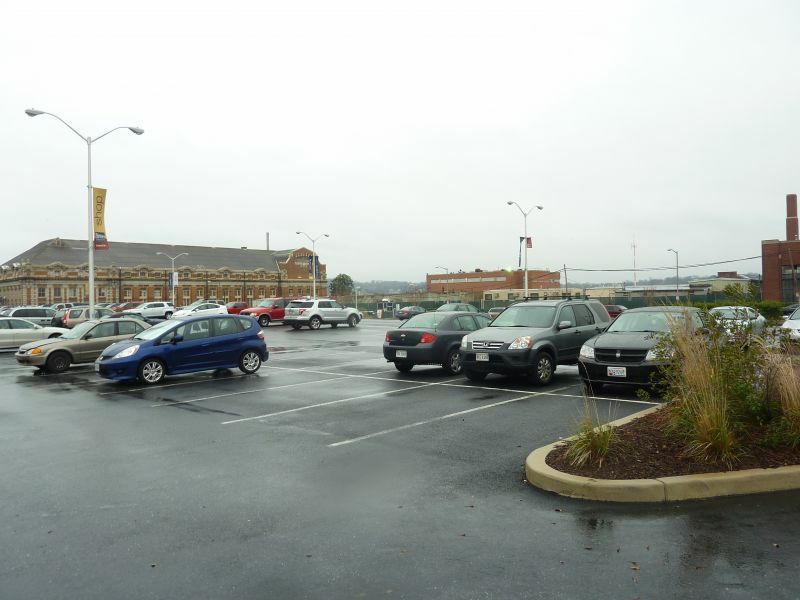 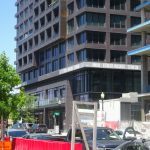 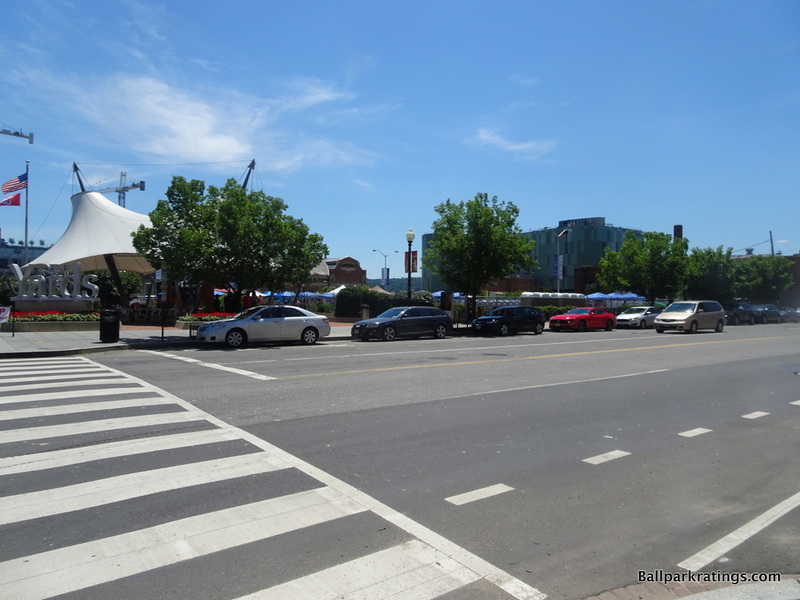 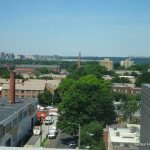 The government’s idea that this blighted section of southeast D.C would undergo a Gaslamp District-style transformation was generally perceived as a huge stretch. 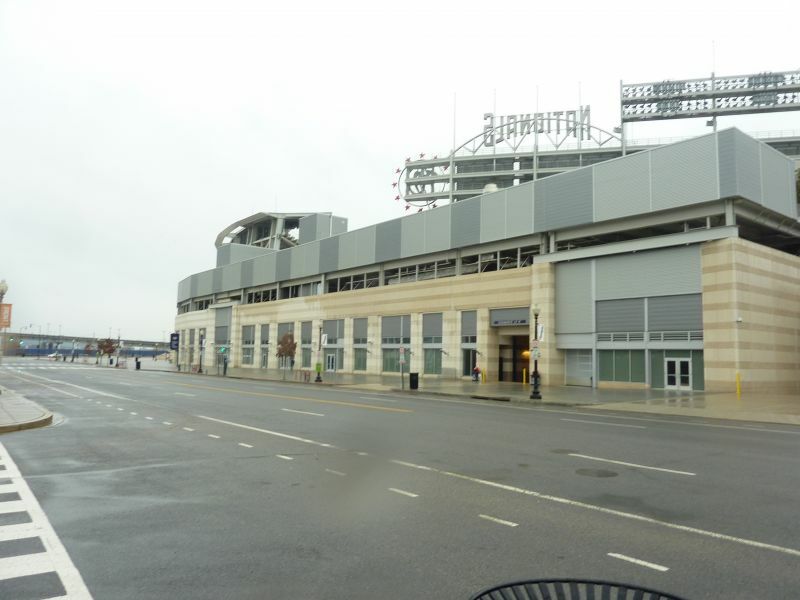 The conditions weren’t as favorable for such a revival, unlike the Inner Harbor around Camden Yards. 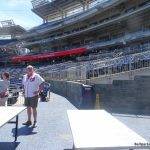 But as I’ll get to in the next section, everything seems to have worked out, surprising even the most bright-eyed optimists. 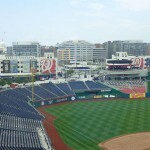 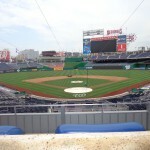 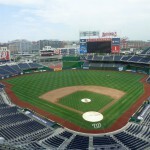 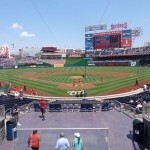 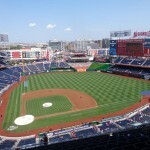 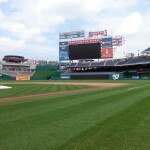 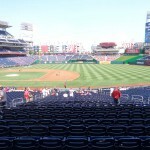 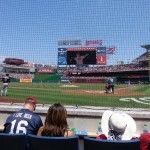 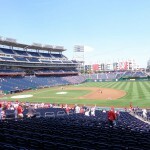 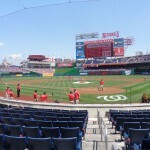 Unthinkable a decade ago, Nationals Park could have a location and local scene on par with the country’s best by 2020. 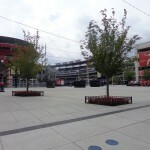 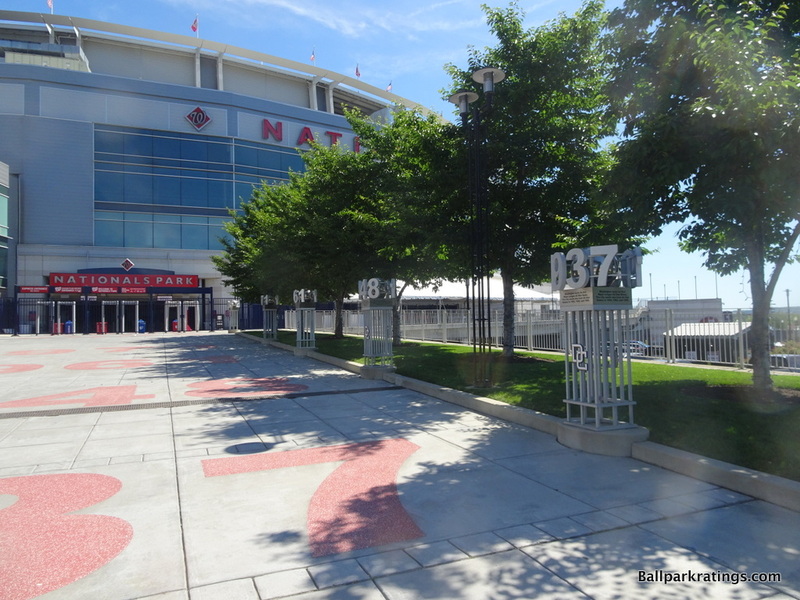 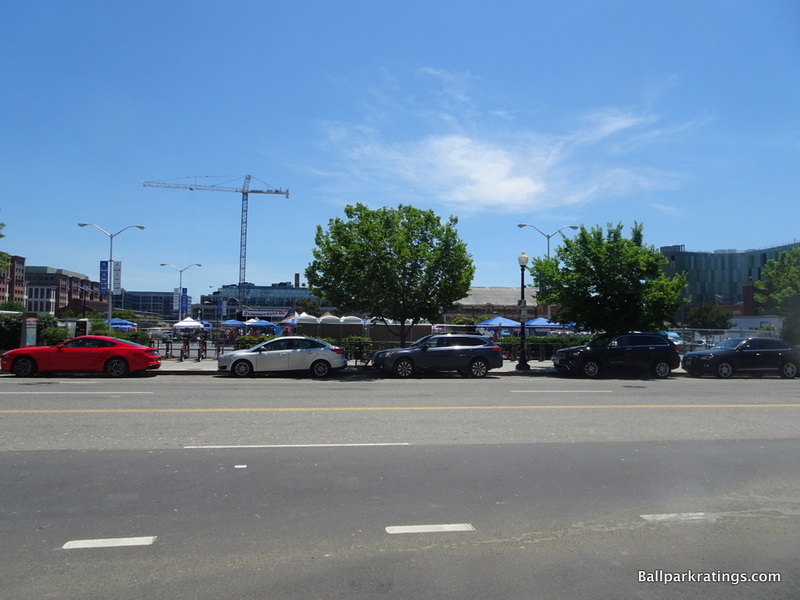 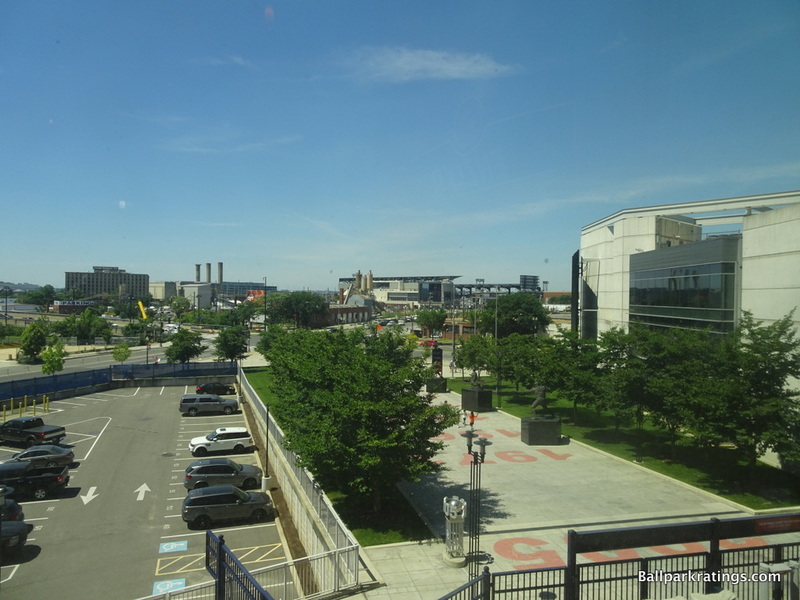 Nationals Park as it looked this June, 2018. 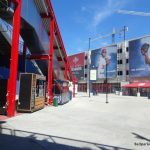 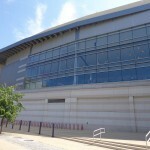 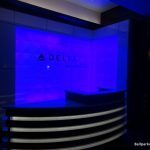 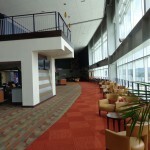 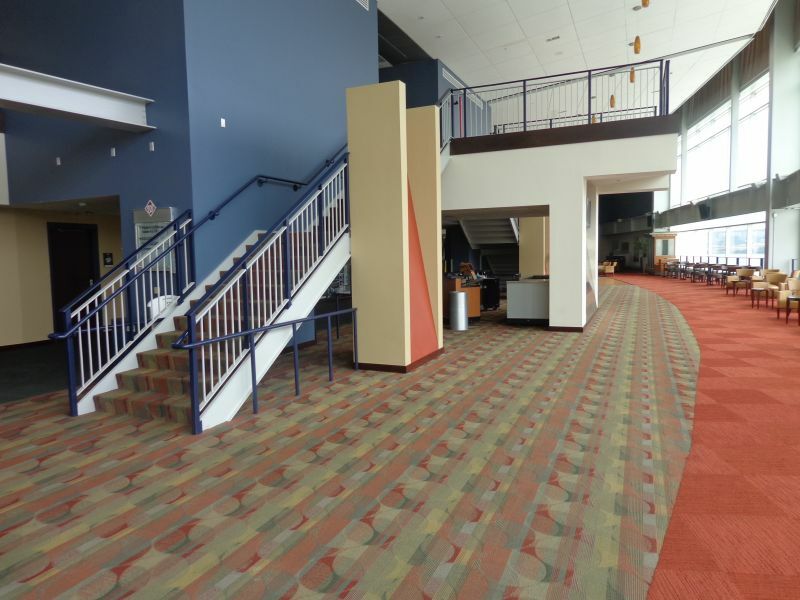 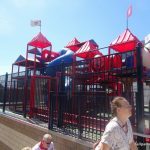 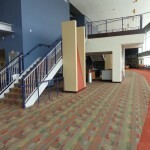 I can’t wait to see the new look after the construction is complete. 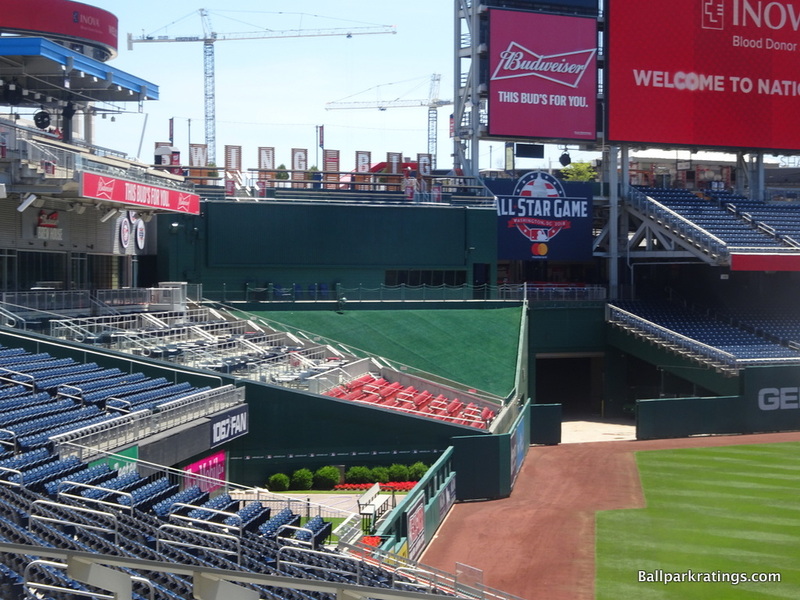 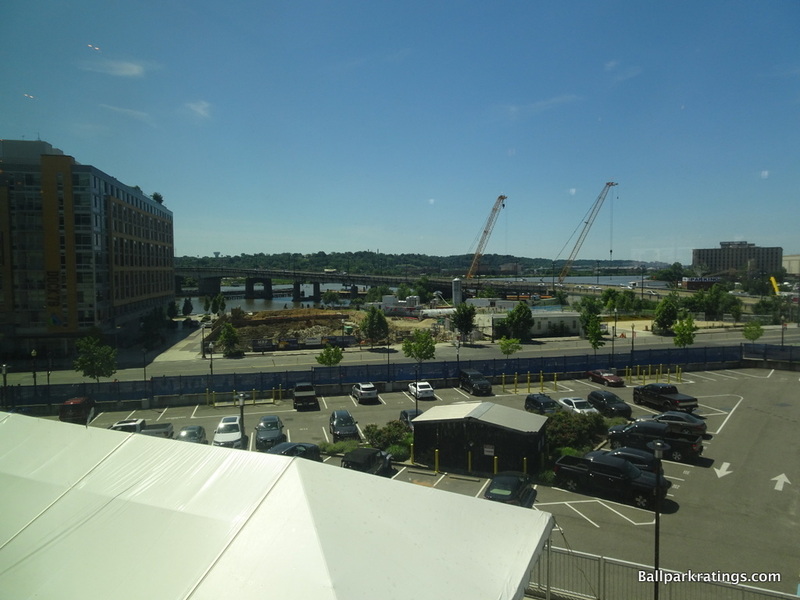 For the 2018 All-Star Game, you’ll see that the view beyond left field looks like a construction project, because the area keeps growing. 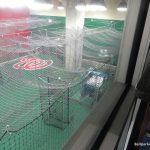 Look for plenty of media coverage about the developing area. 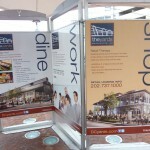 Note that our score for the interior aesthetics and location/local scene could change after this is complete. 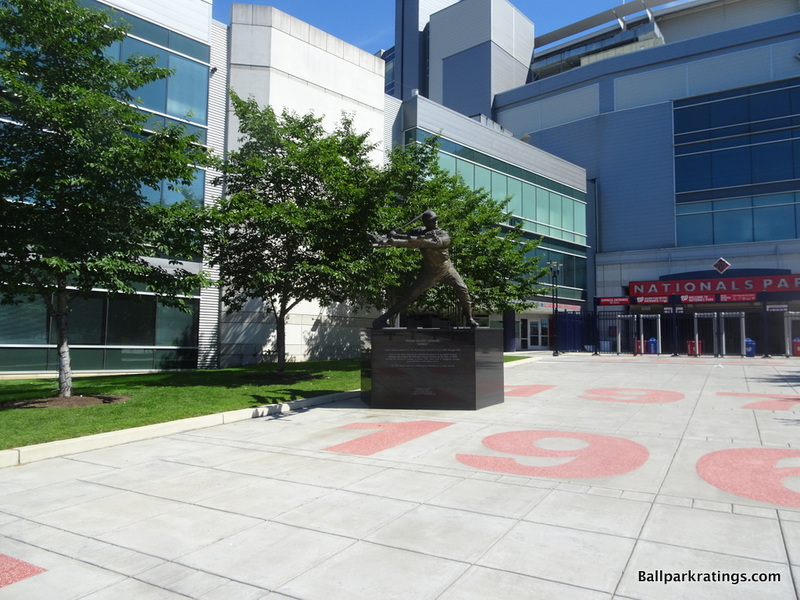 Often noted for its lack of distinguishing features, Nationals Park is still an enjoyable place to see a game, and I actually still find it more memorable than some of the more derivative retro parks. 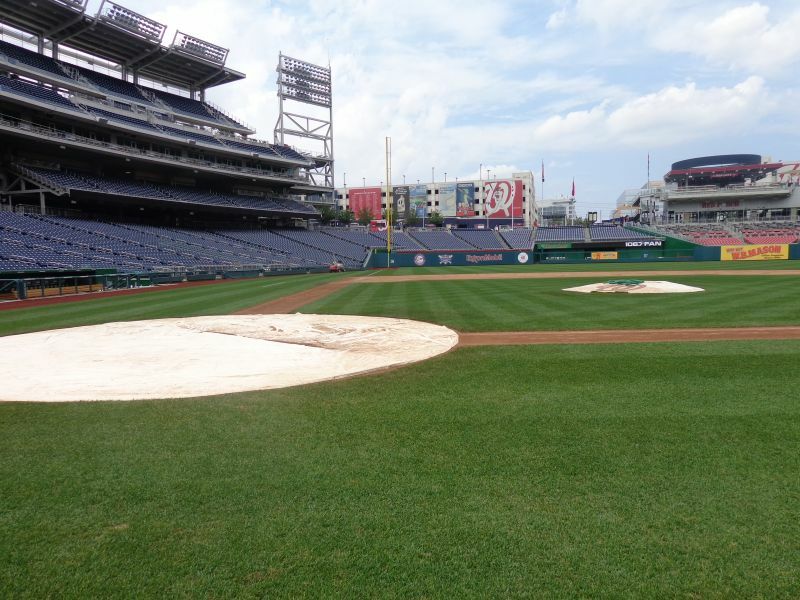 There wasn’t much new ground broken here, but that’s true for the majority of MLB venues. 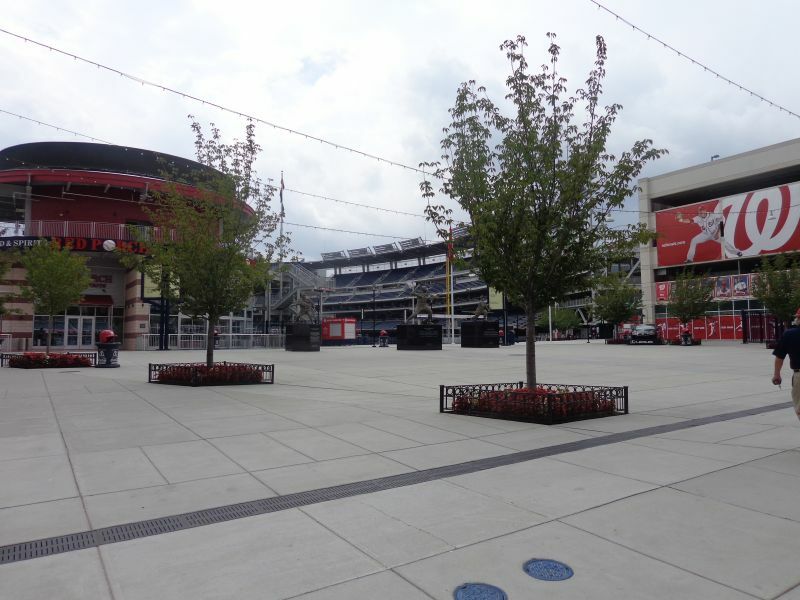 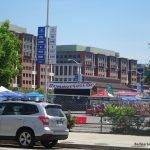 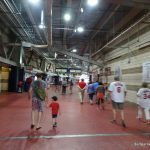 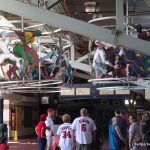 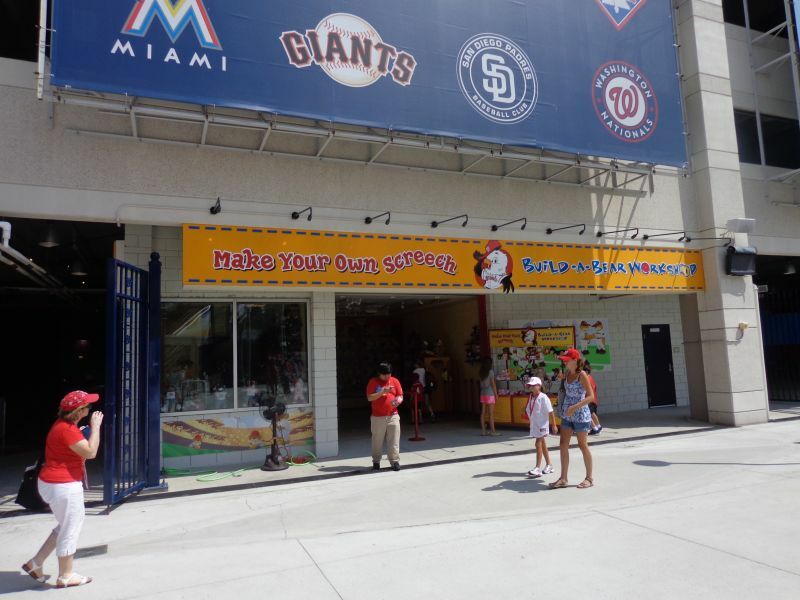 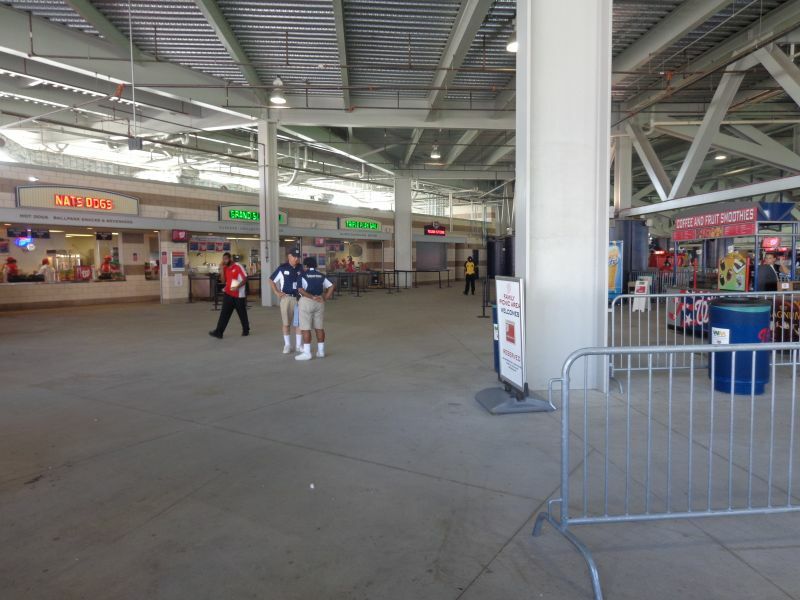 In the end, Nationals Park was defined by a market and a time-period that demanded all-time greatness, and a fan base that earnestly had similar expectations. 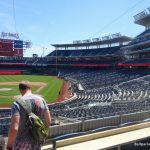 While Nationals Park falls well short of that, it is an all-around very good ballpark, unusual in its complete lack of glaring flaws. 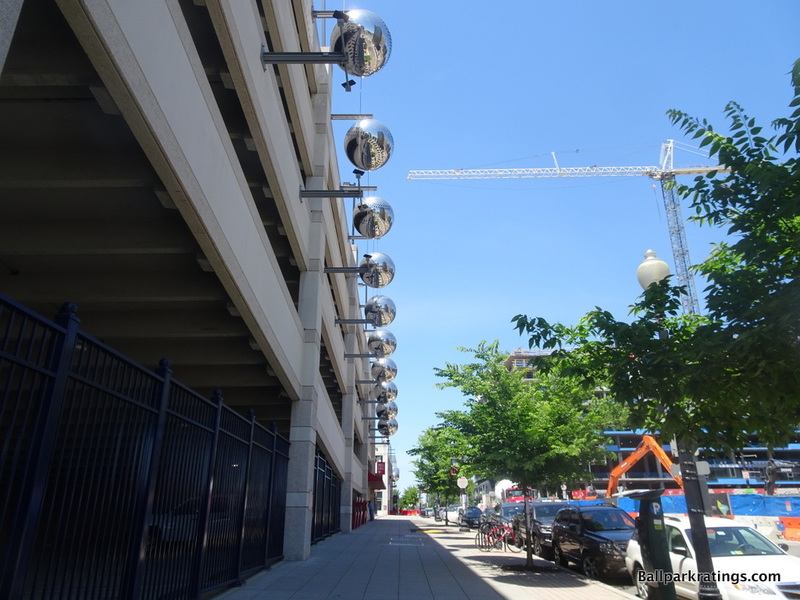 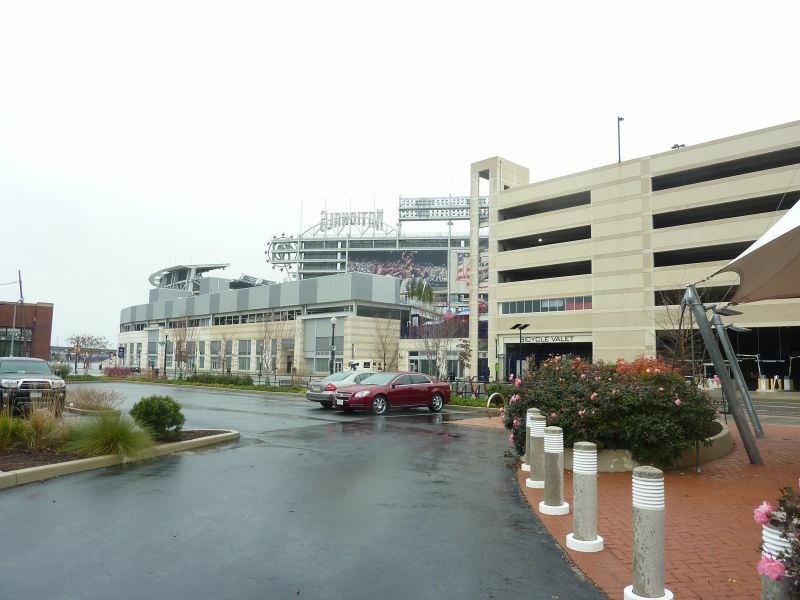 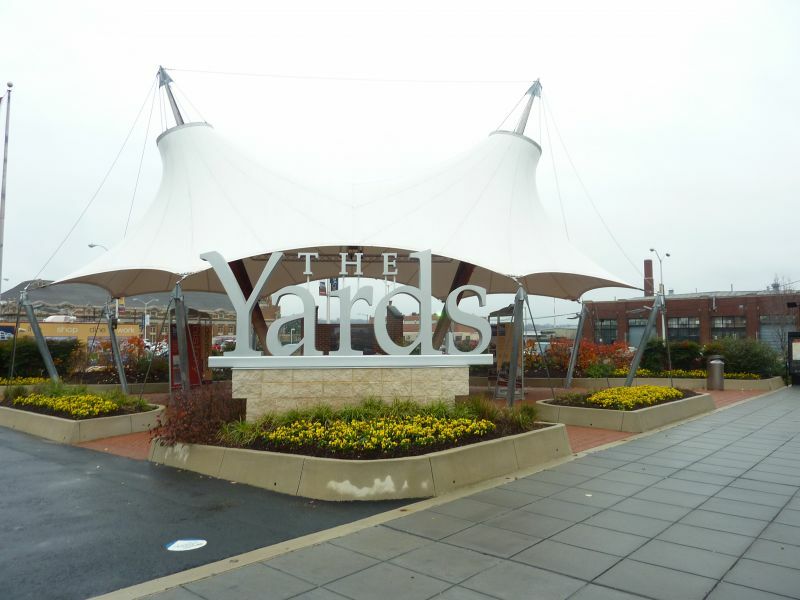 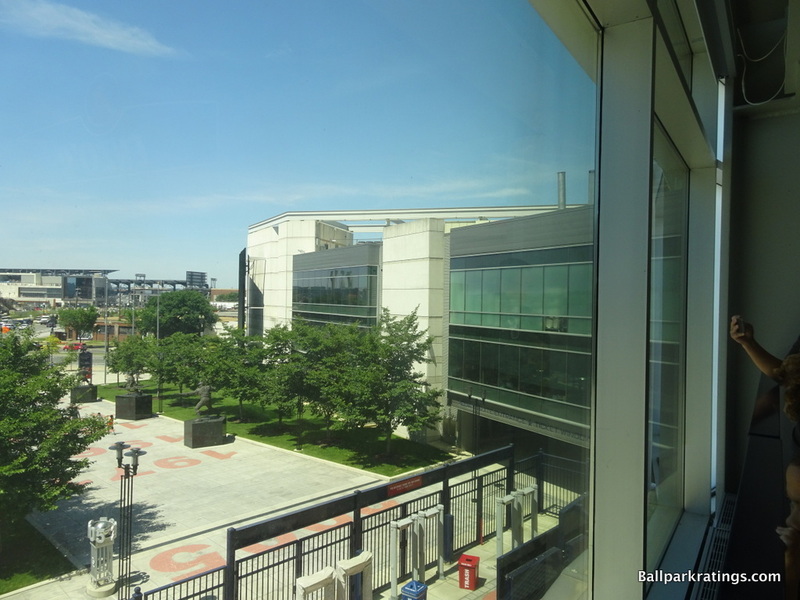 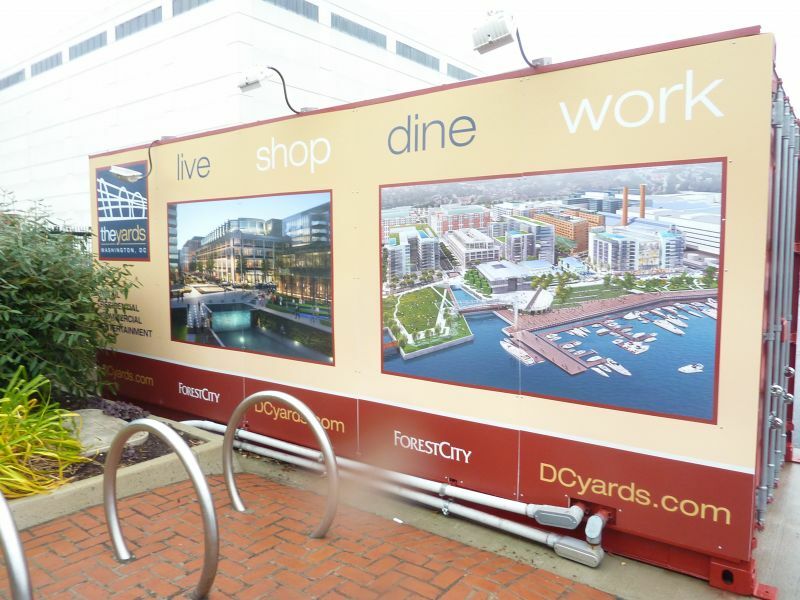 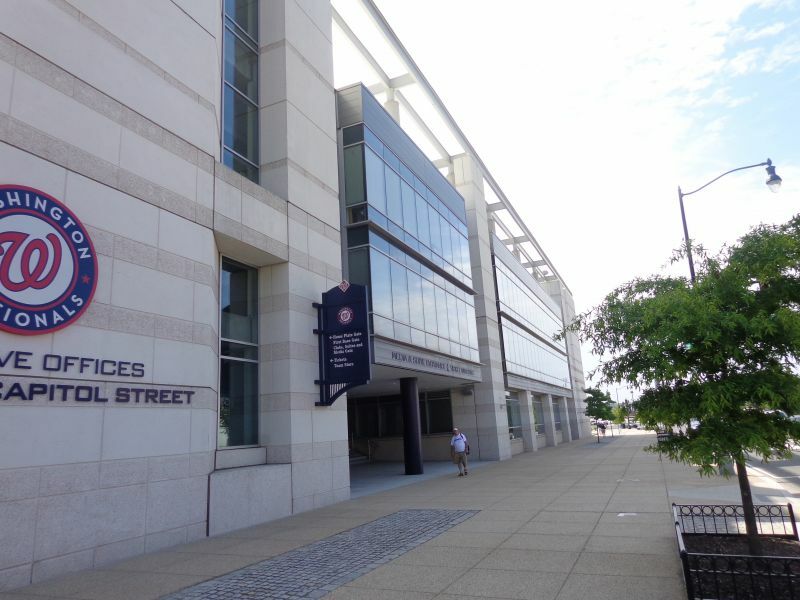 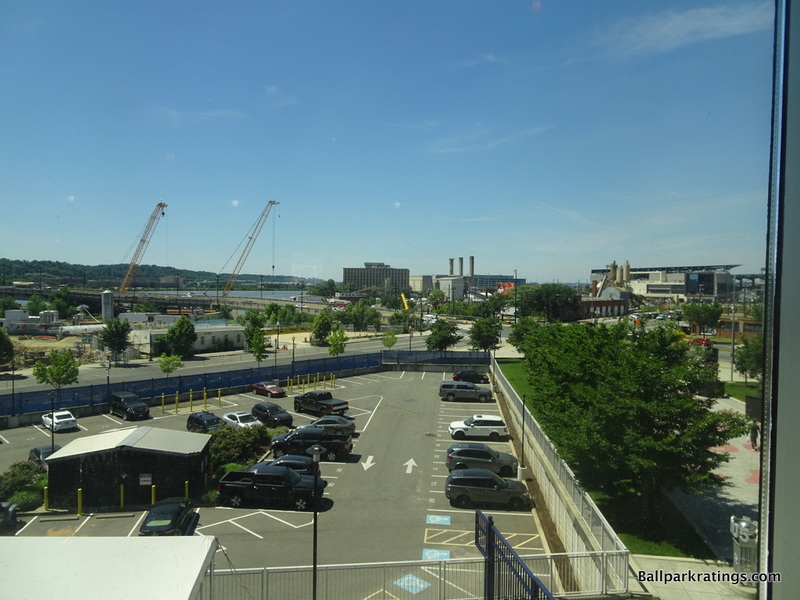 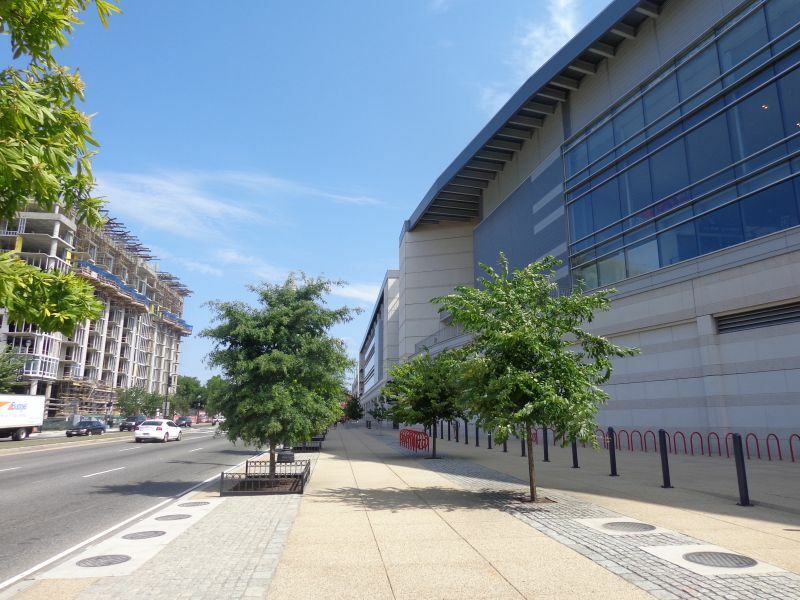 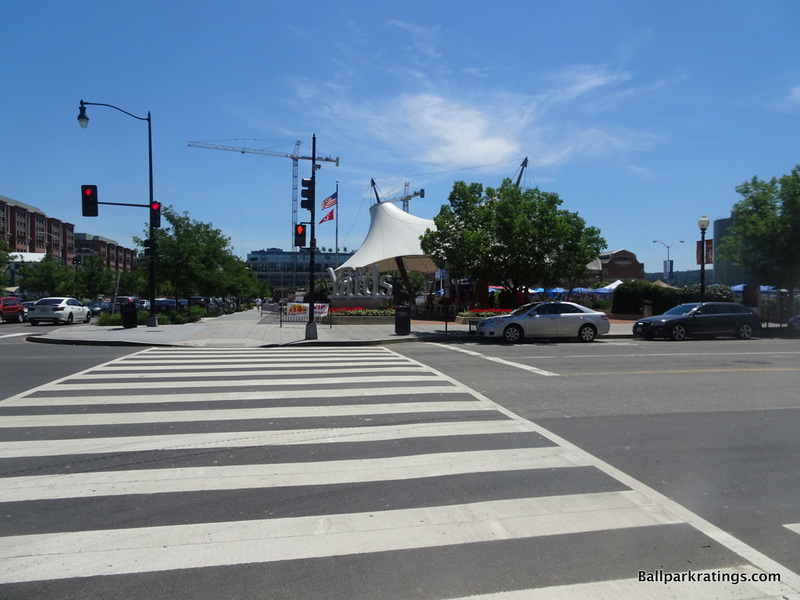 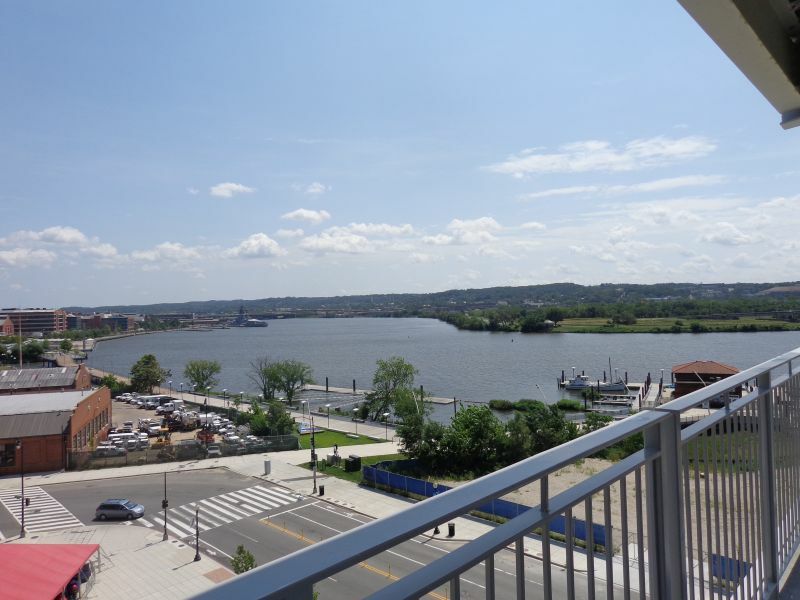 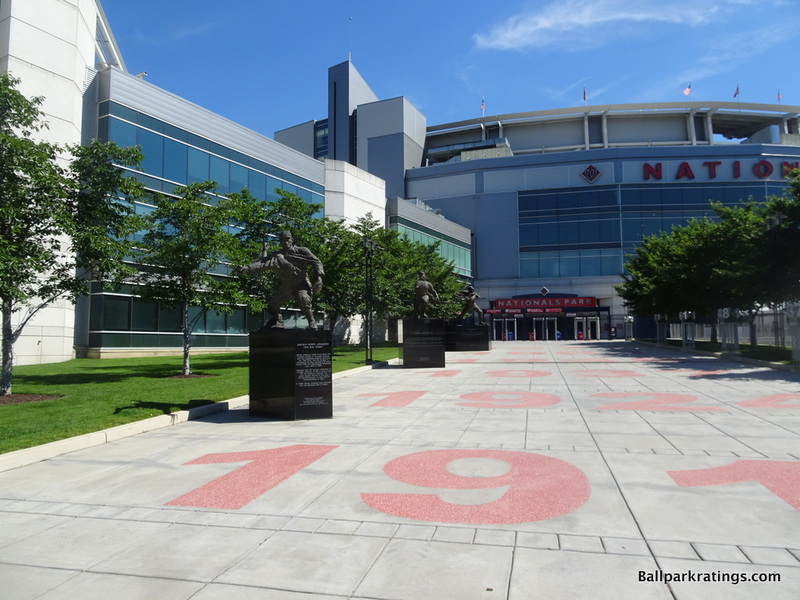 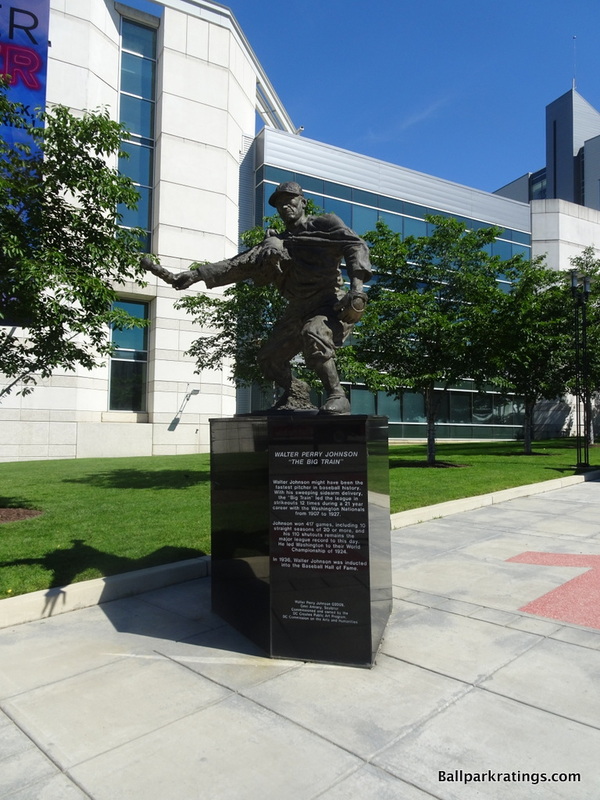 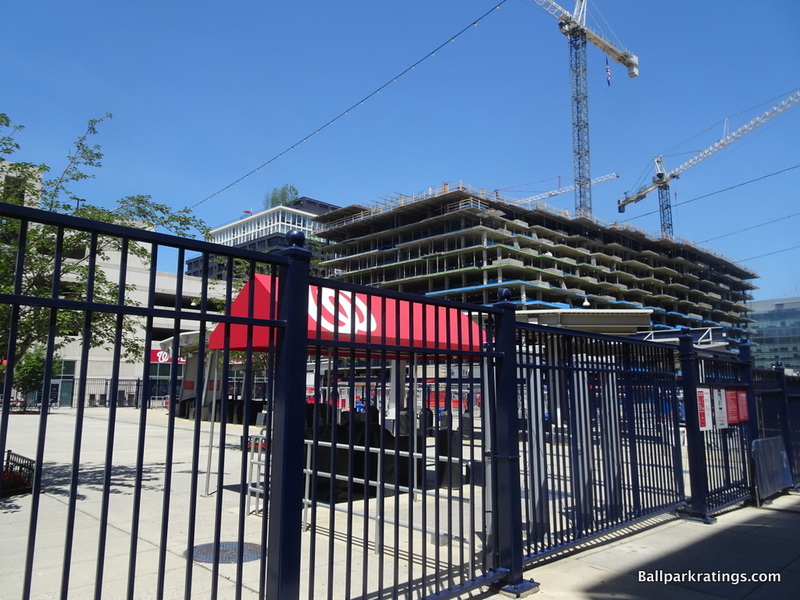 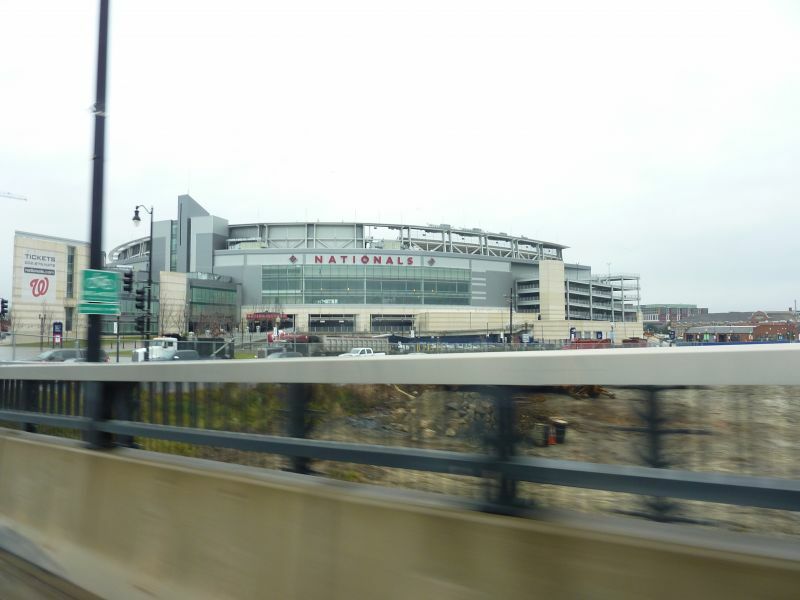 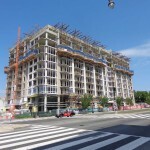 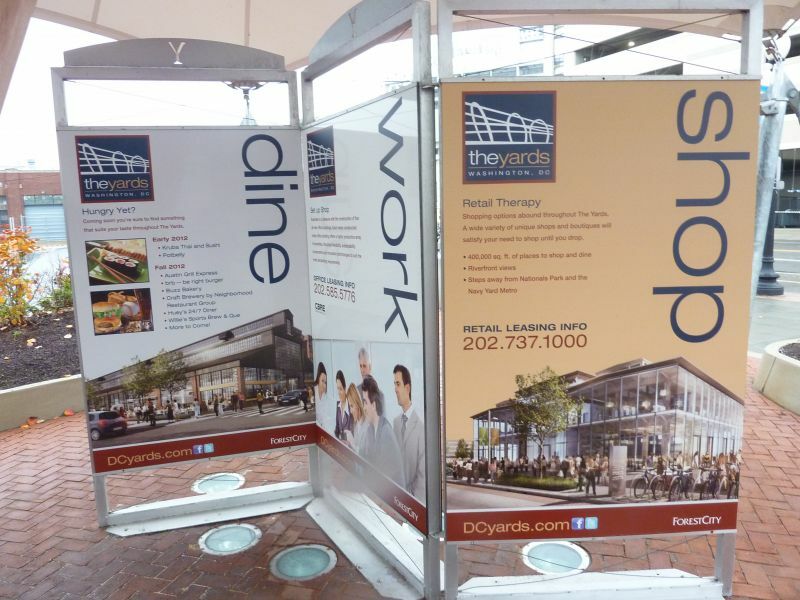 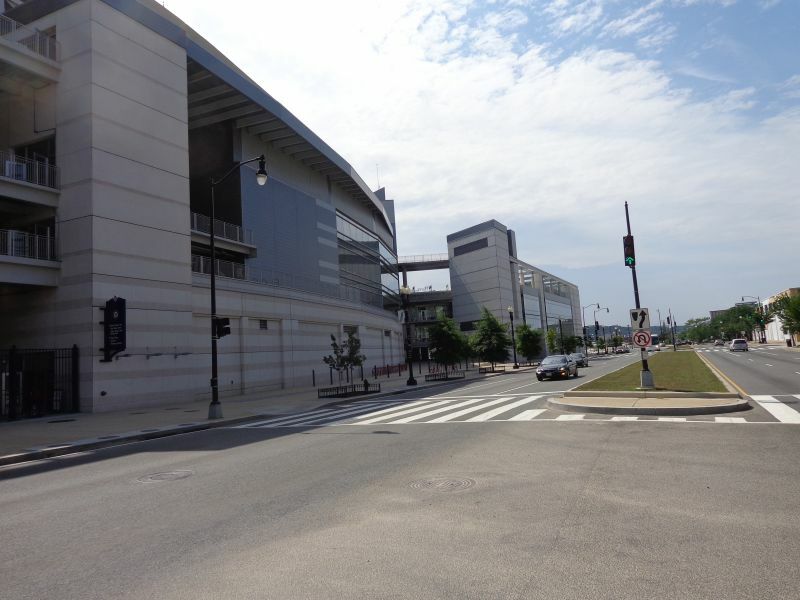 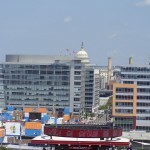 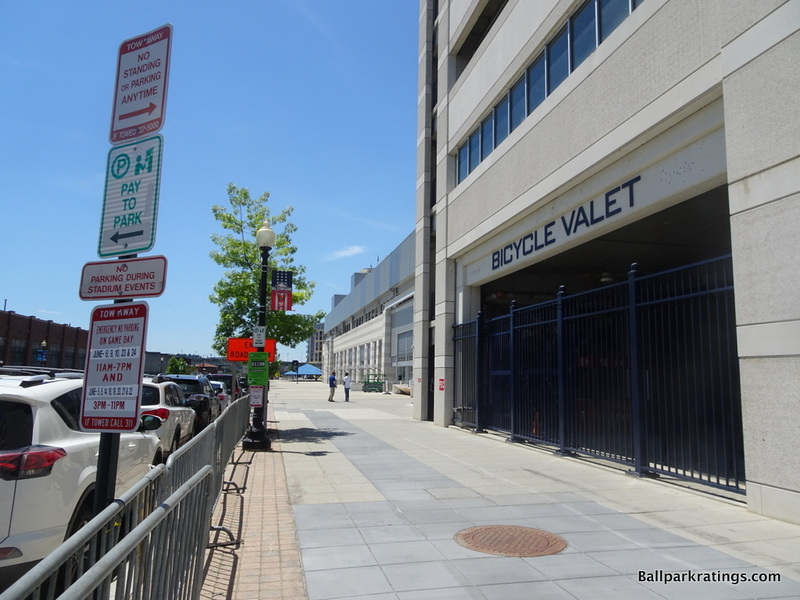 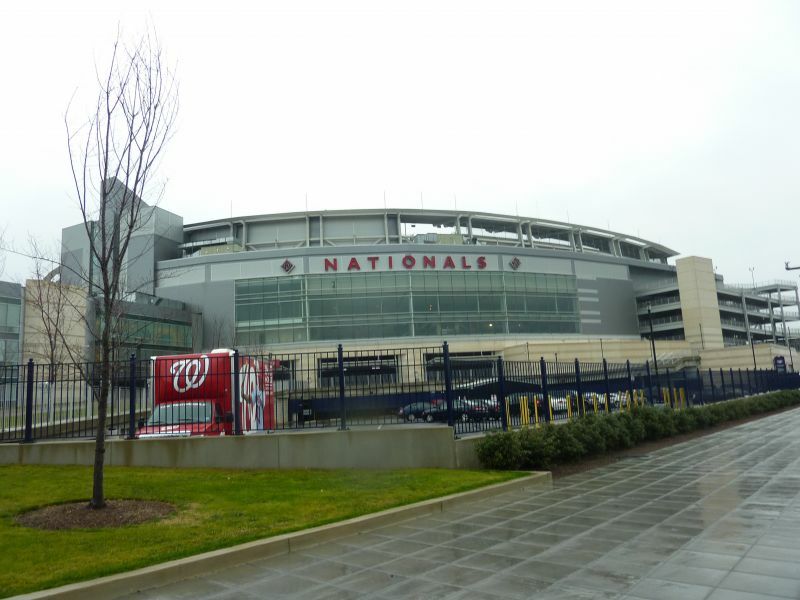 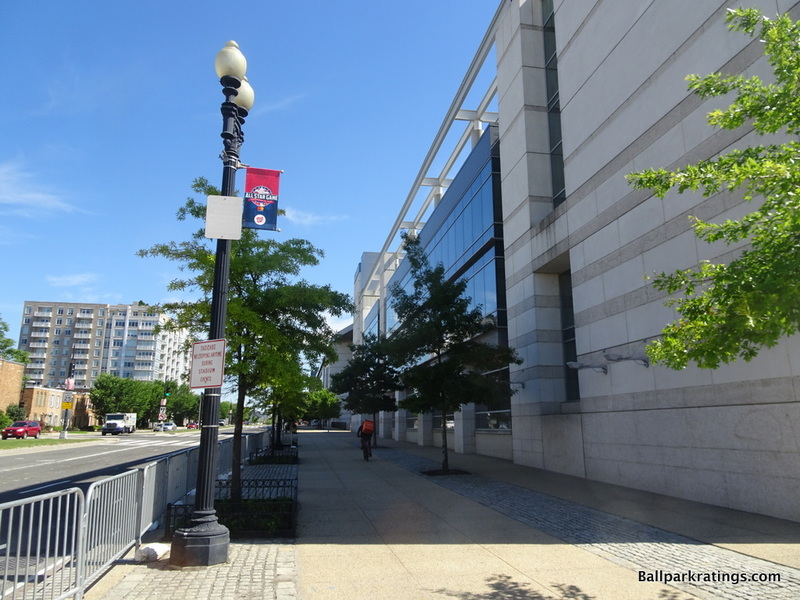 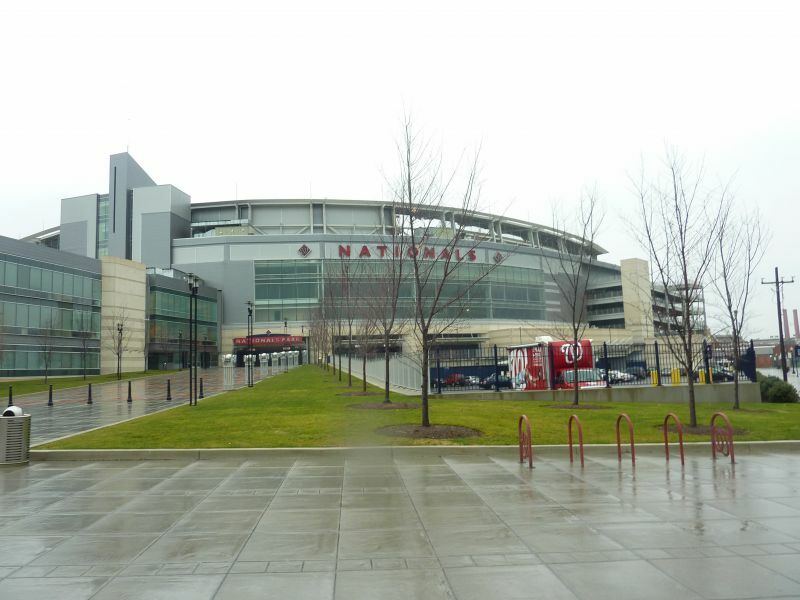 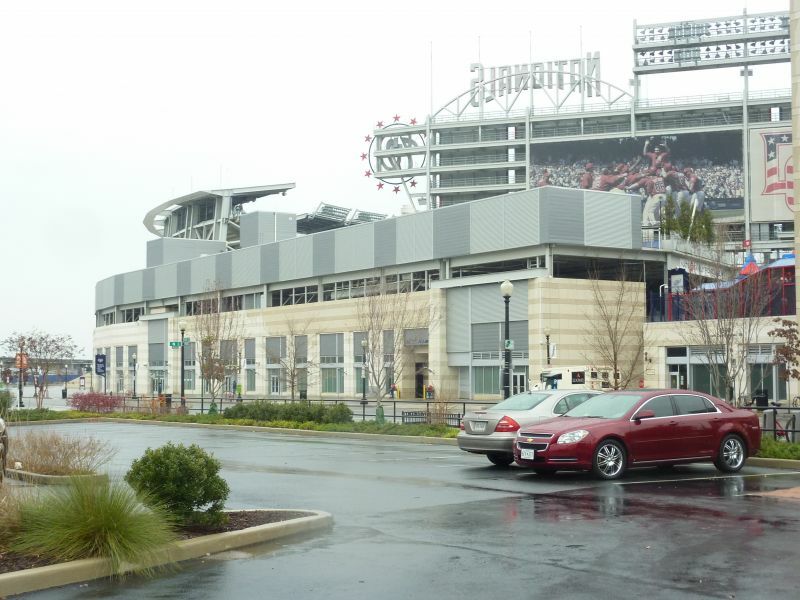 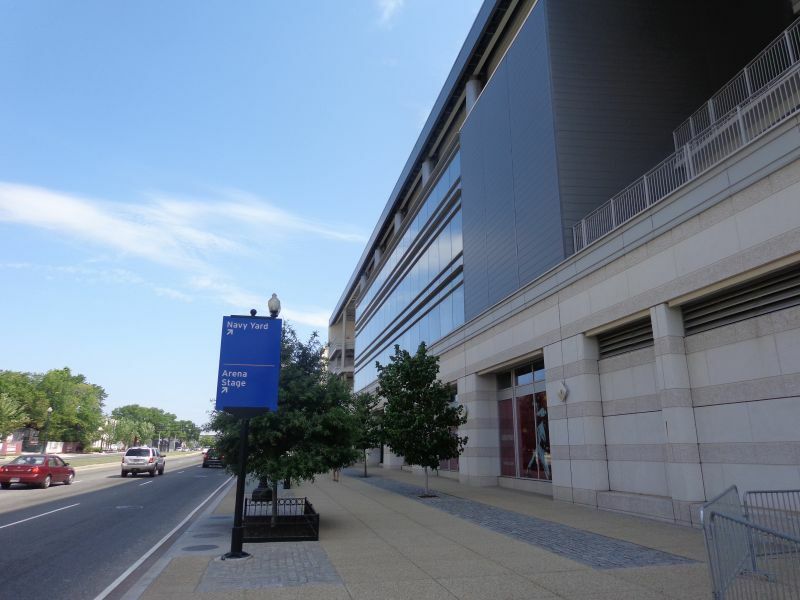 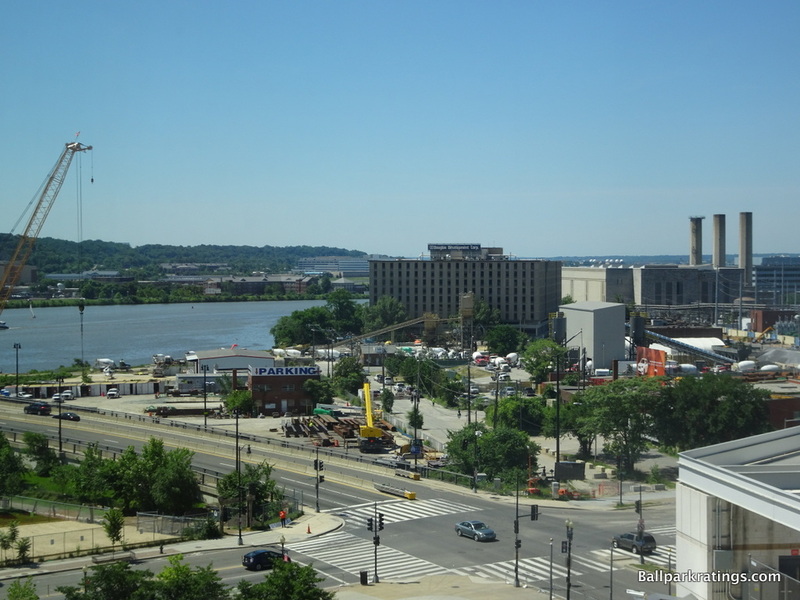 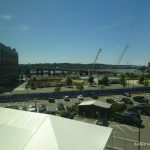 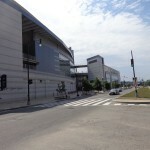 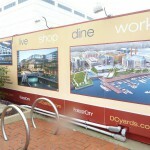 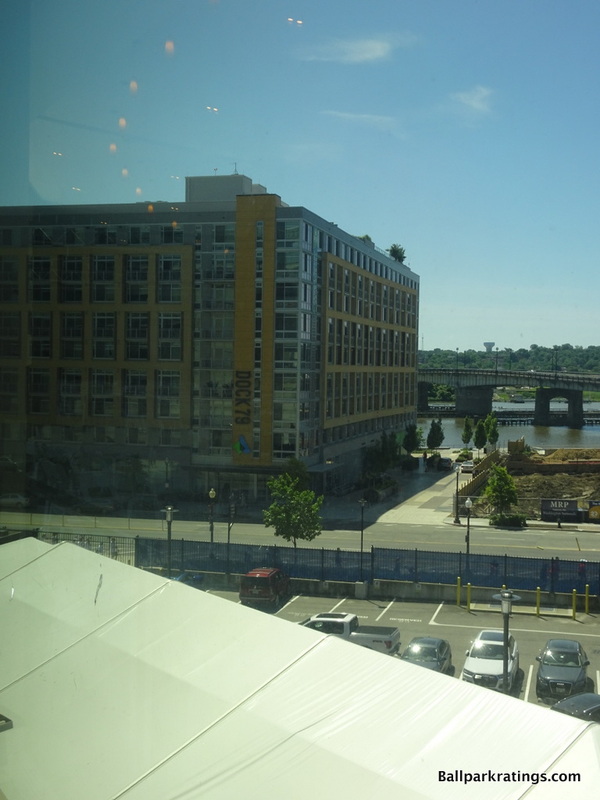 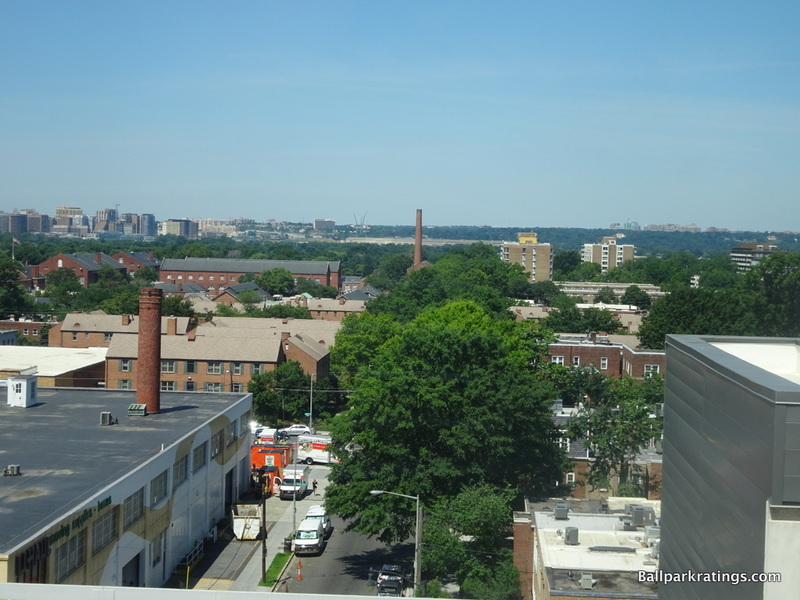 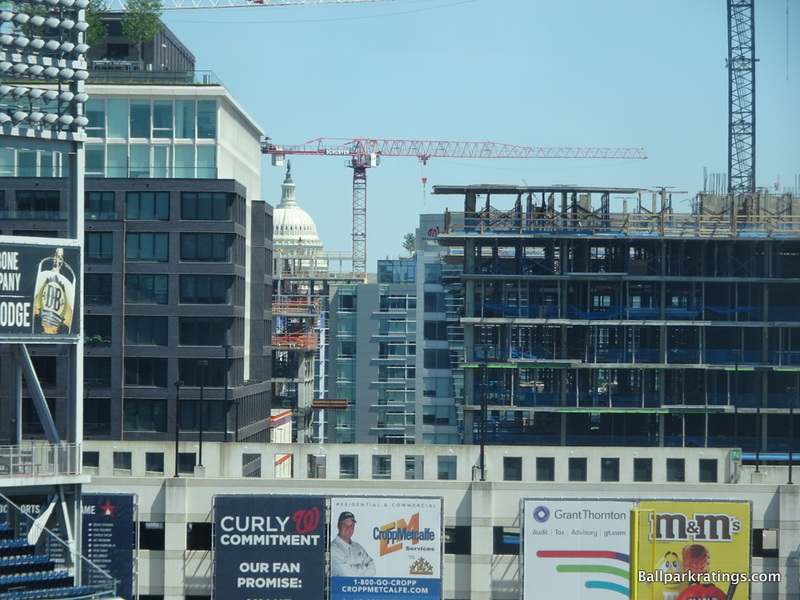 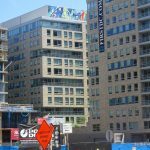 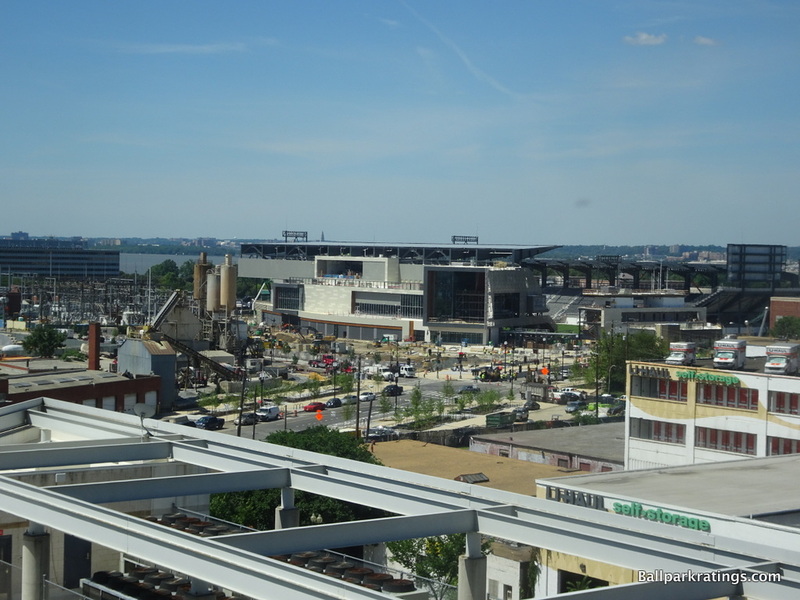 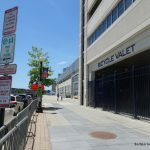 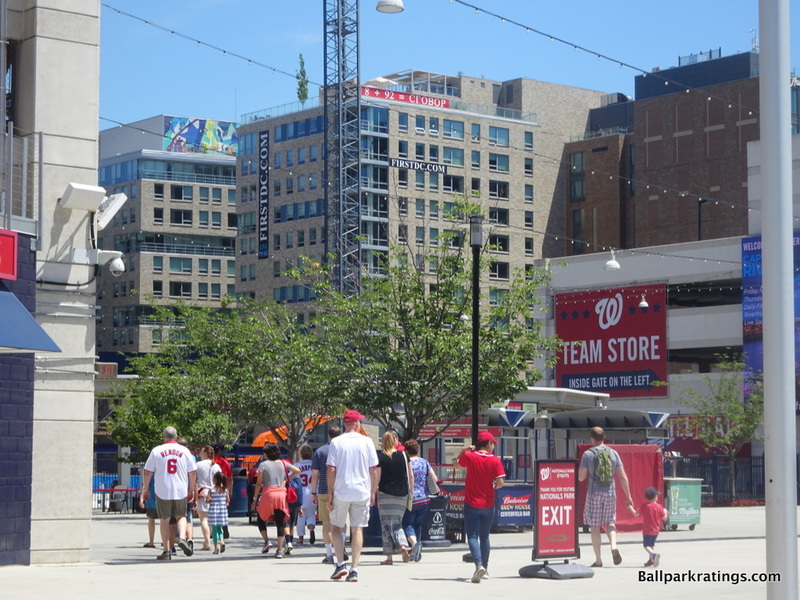 Nationals Park may even become a great park as the Navy Yard continues to develop.